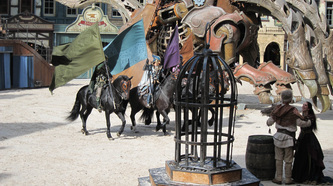 The city where Ravens will be Riders. 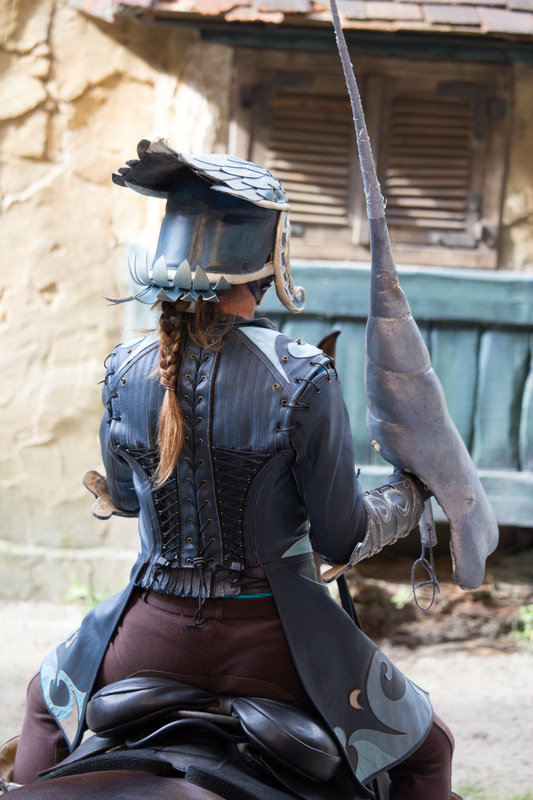 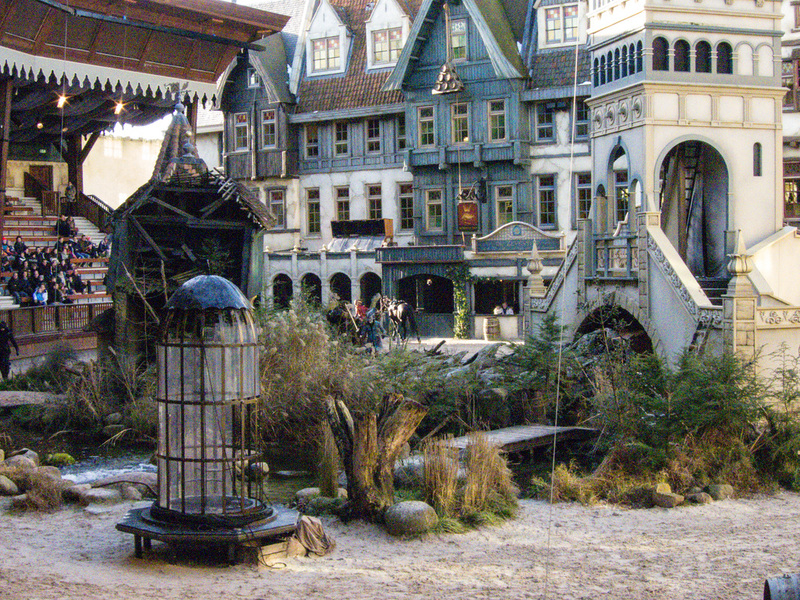 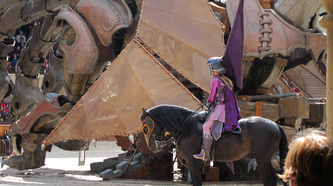 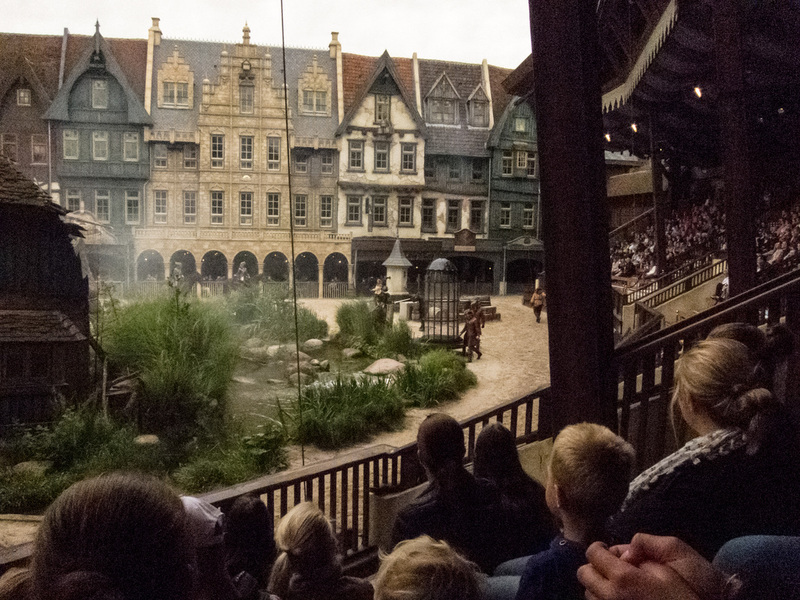 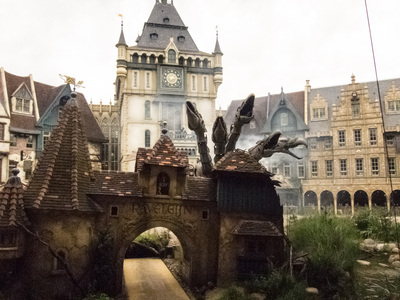 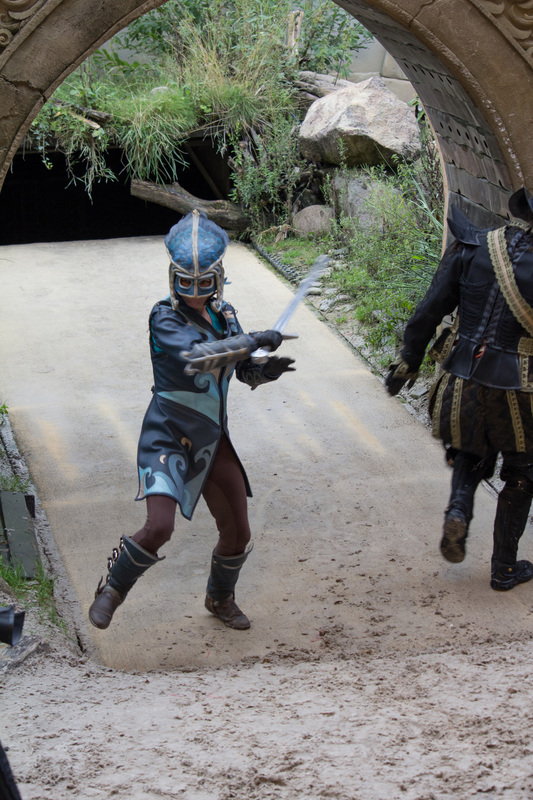 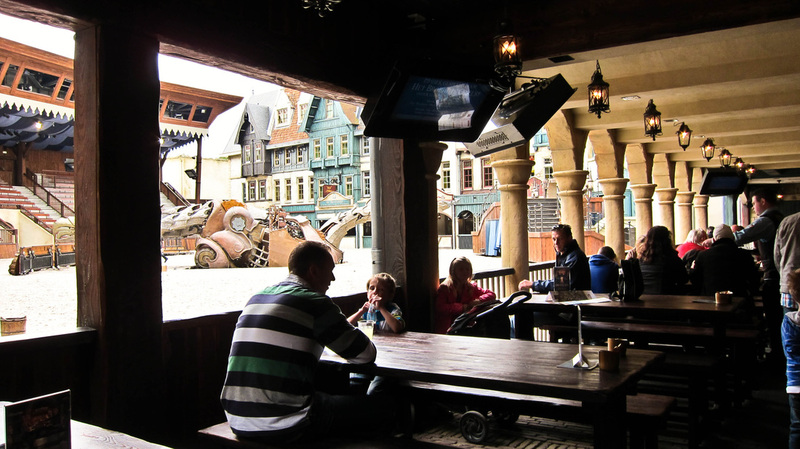 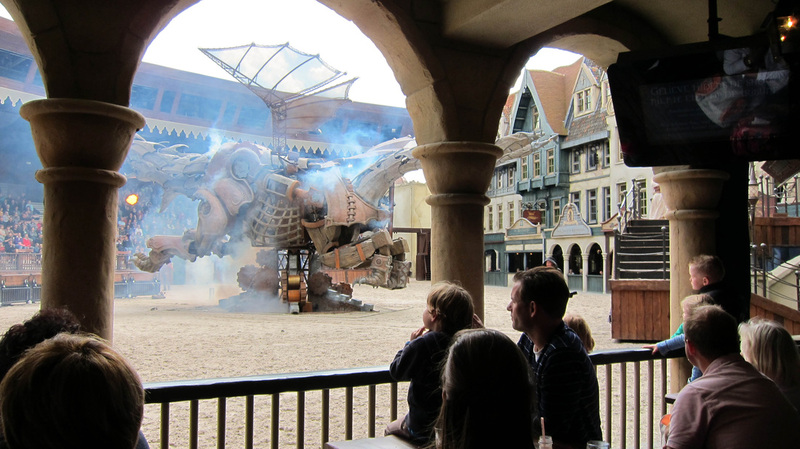 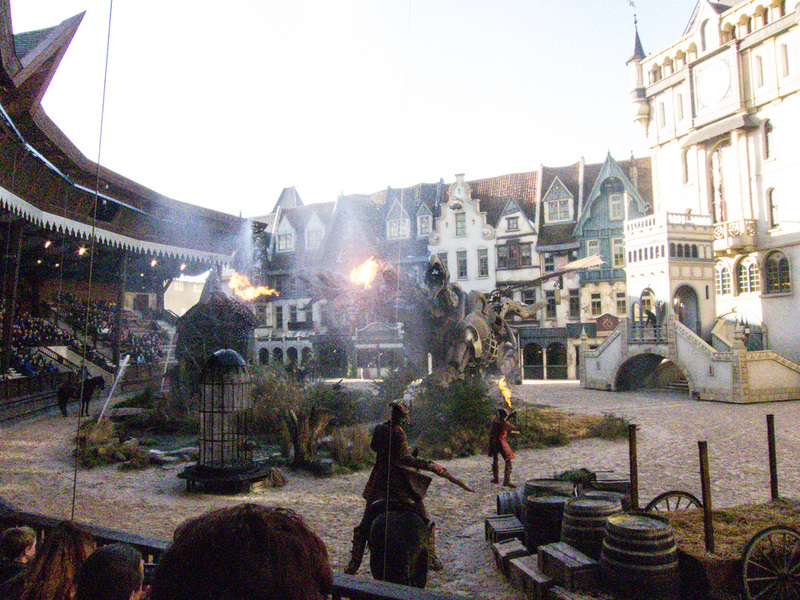 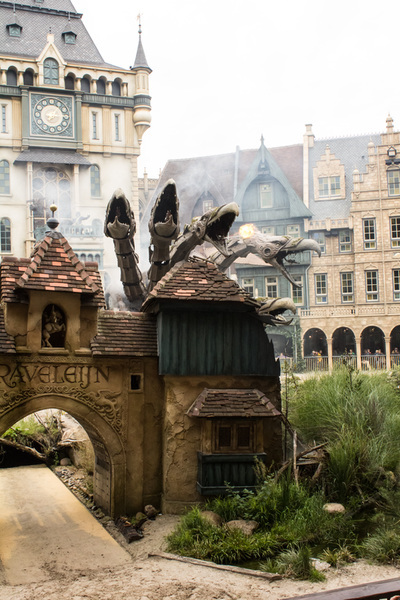 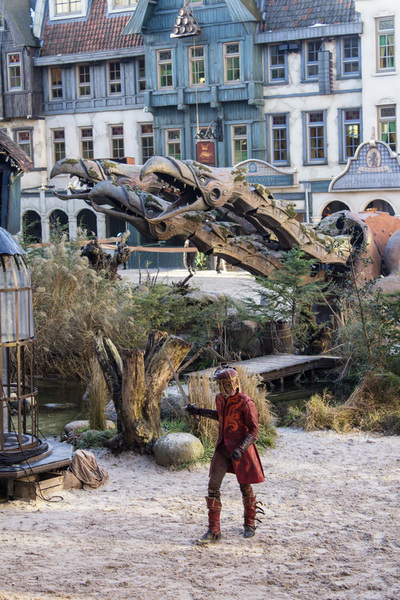 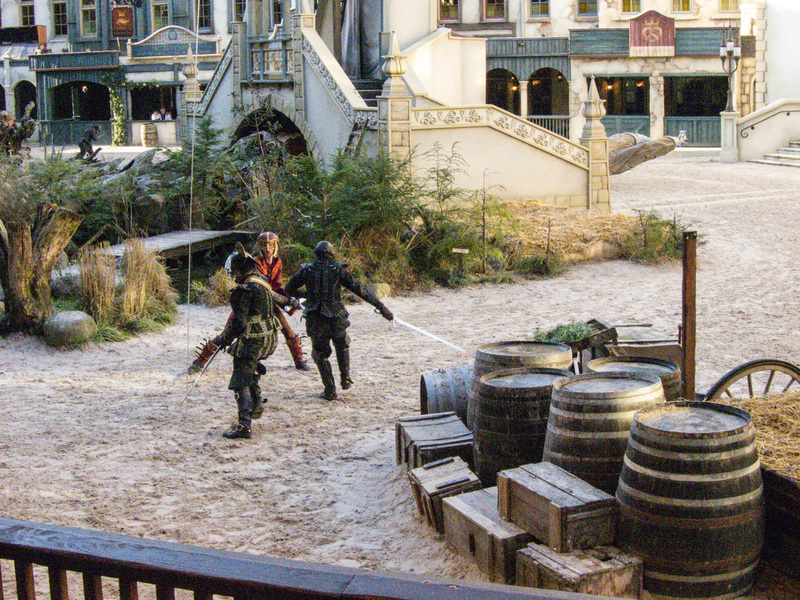 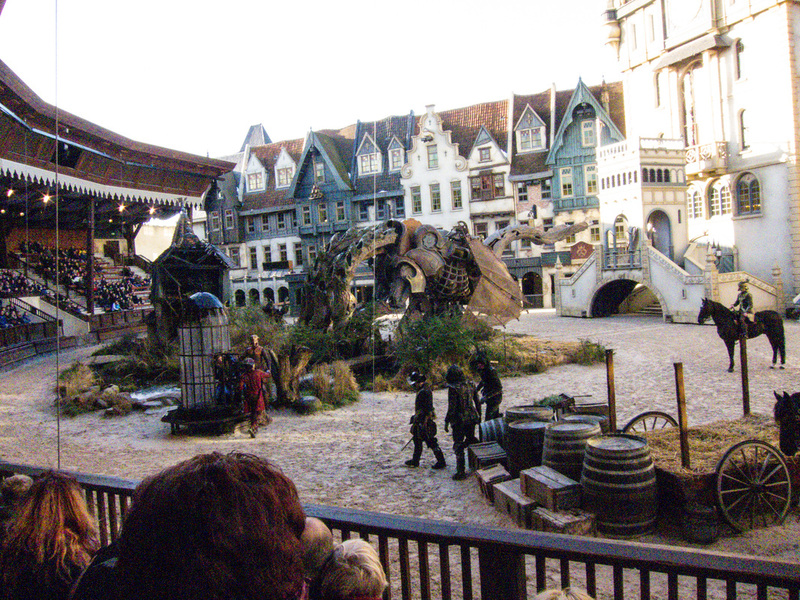 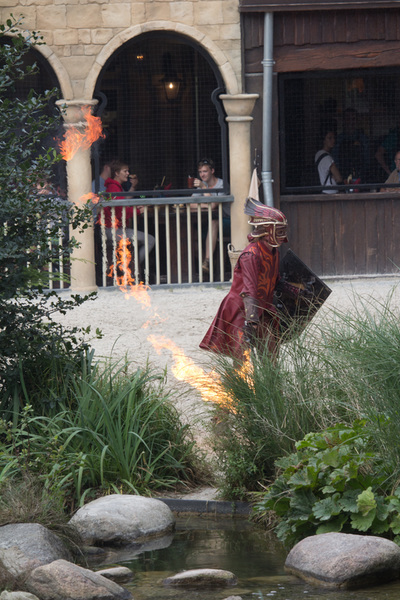 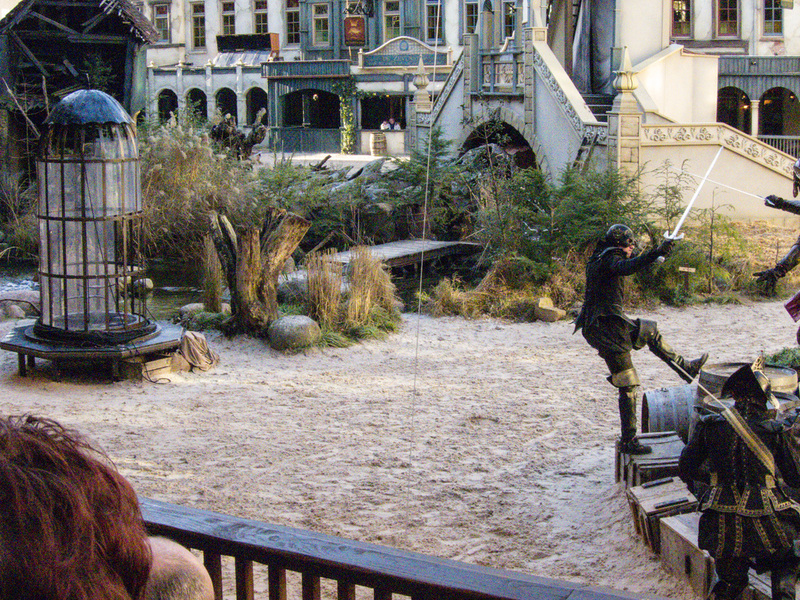 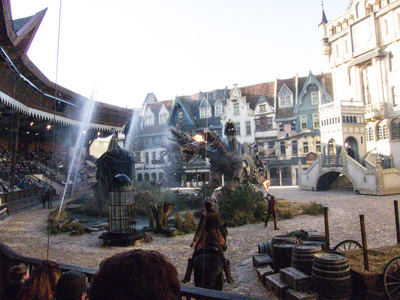 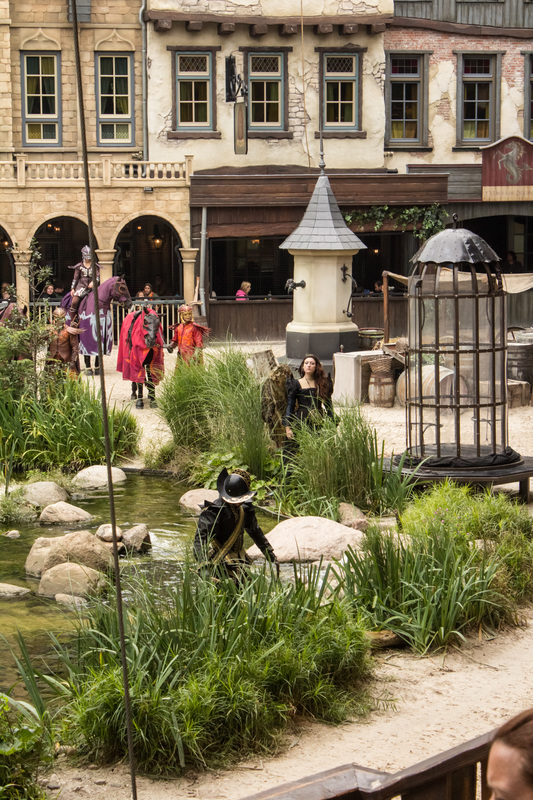 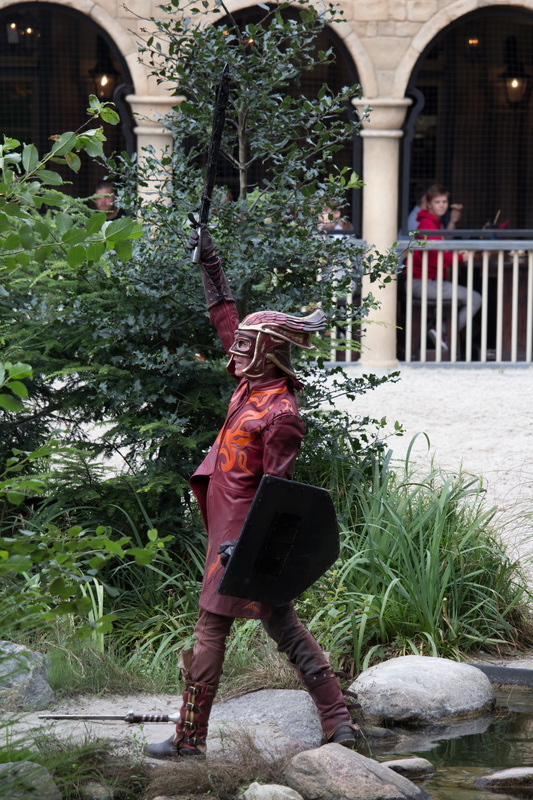 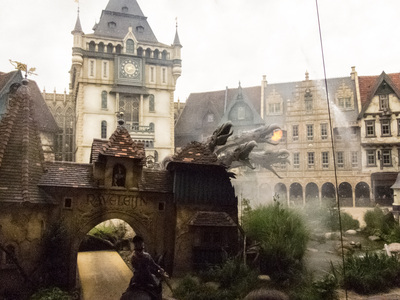 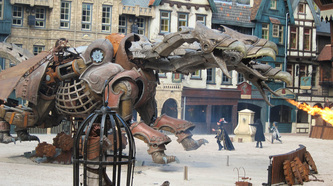 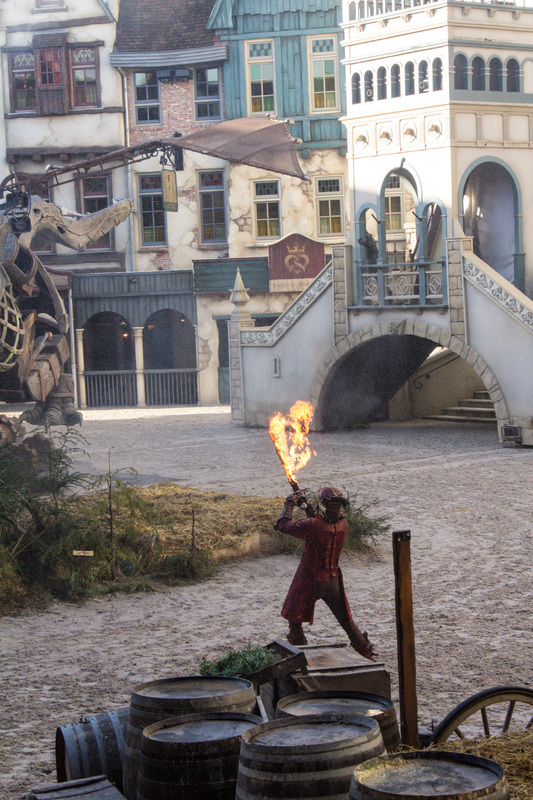 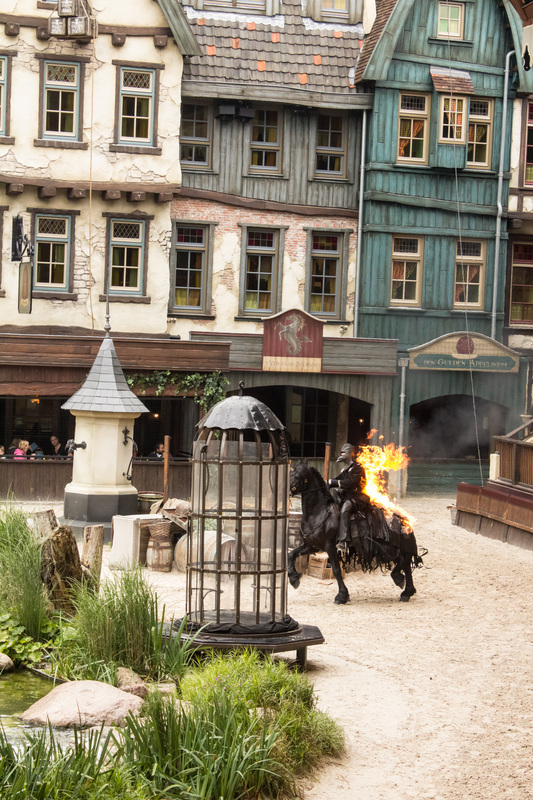 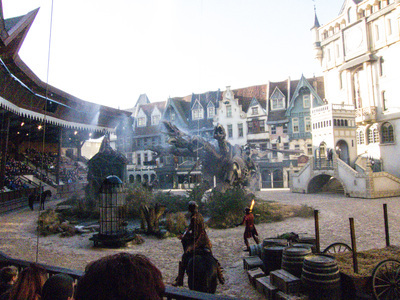 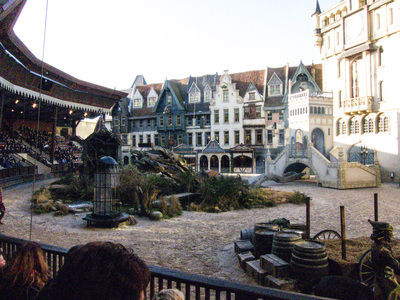 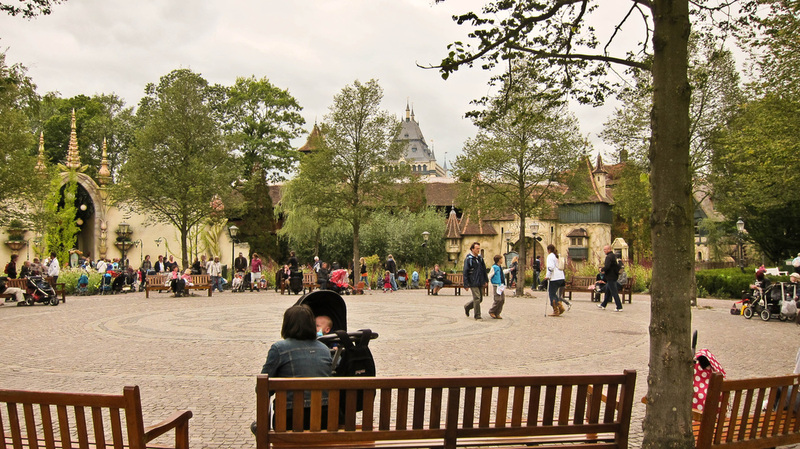 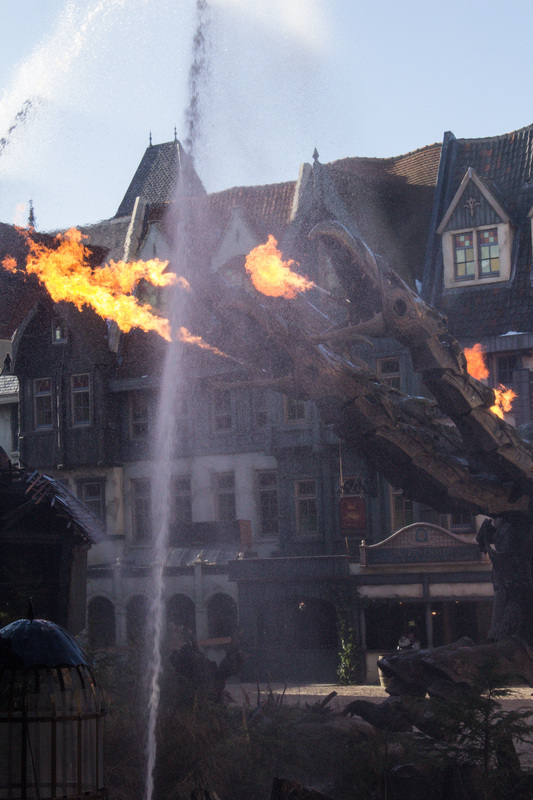 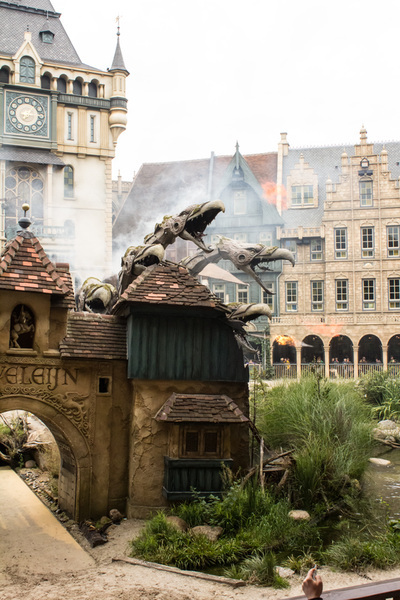 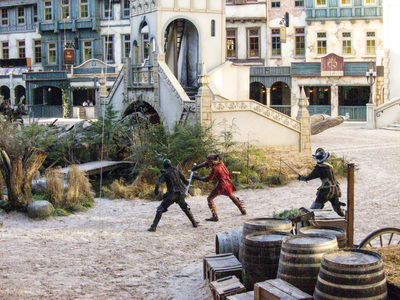 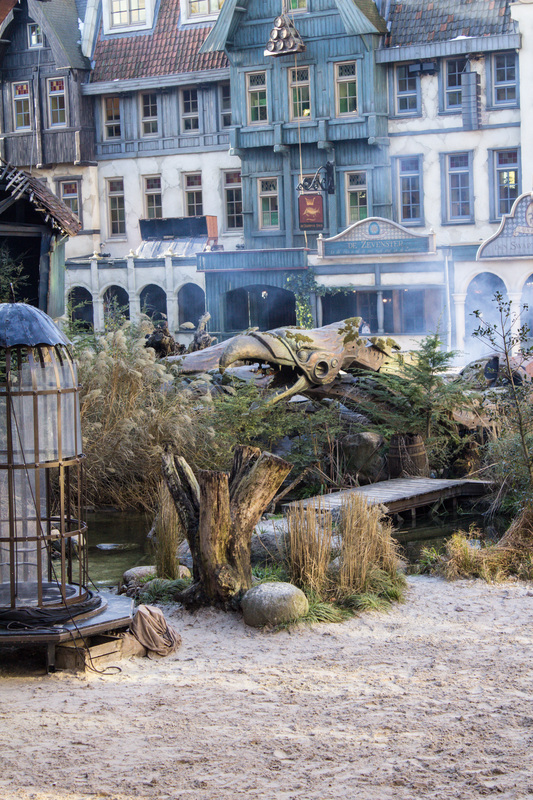 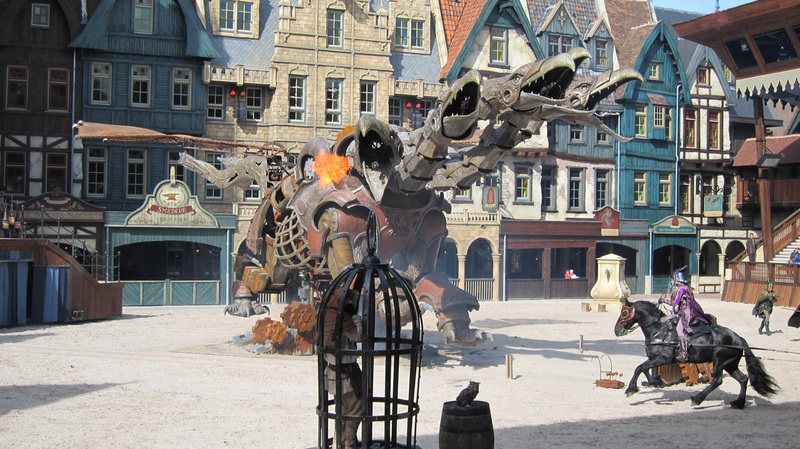 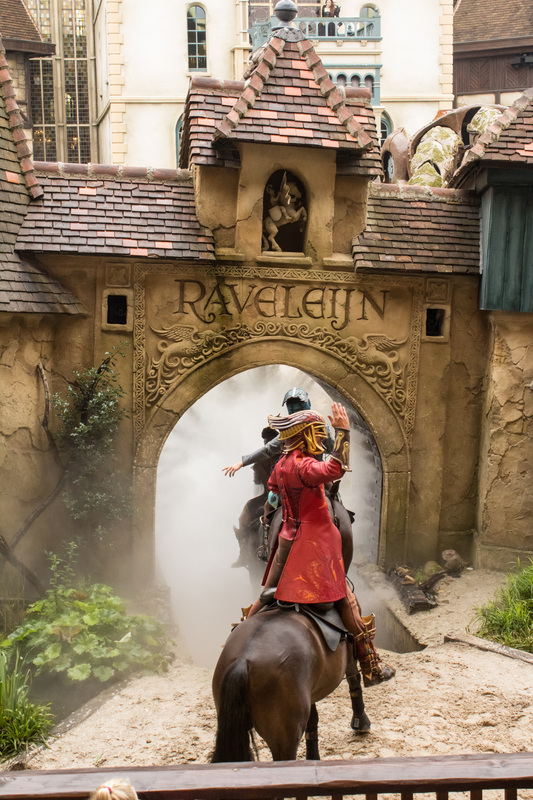 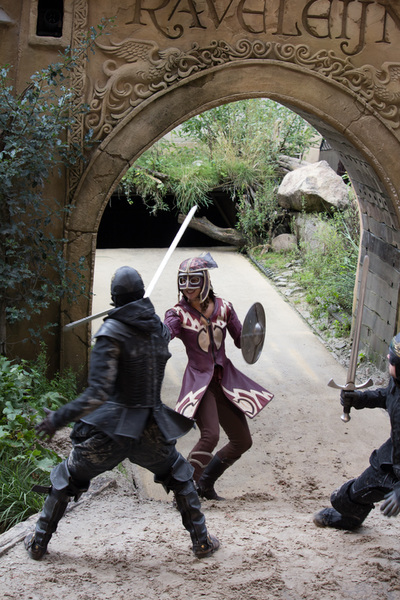 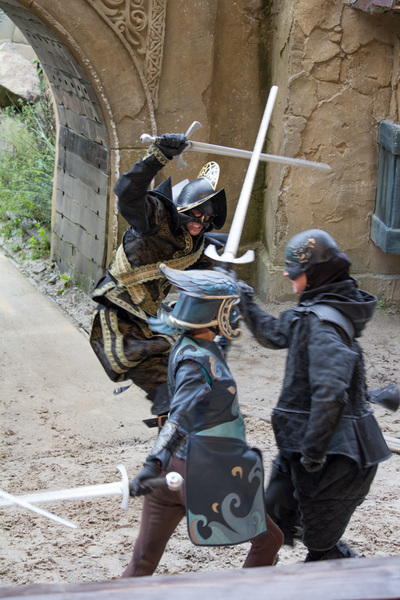 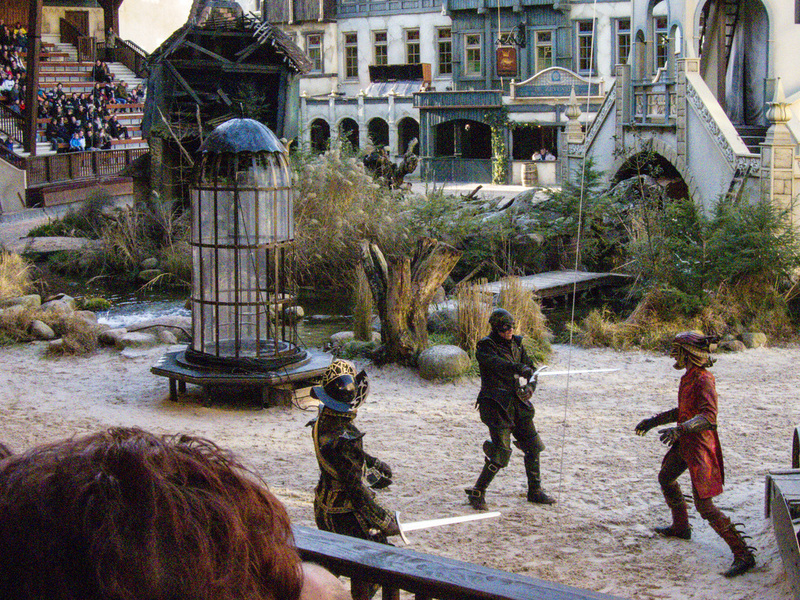 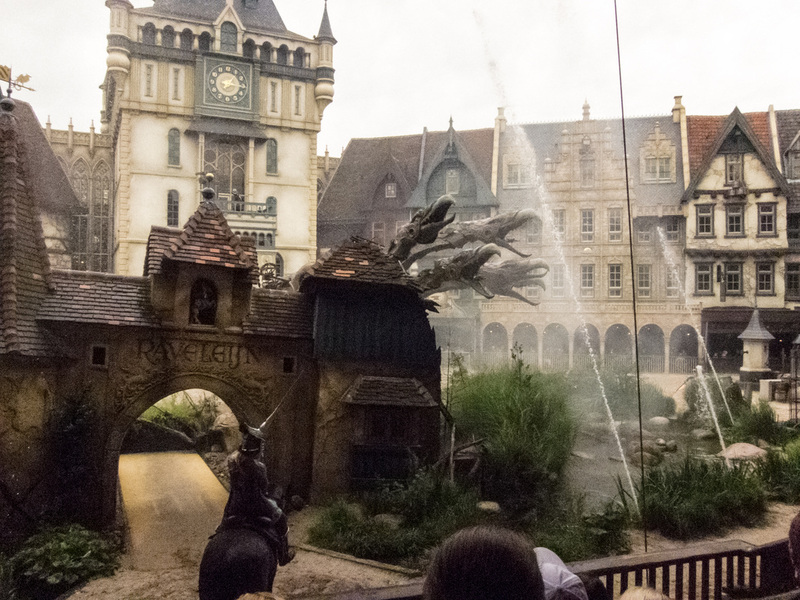 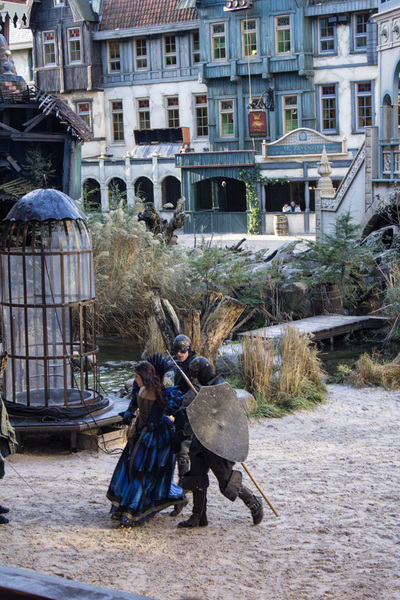 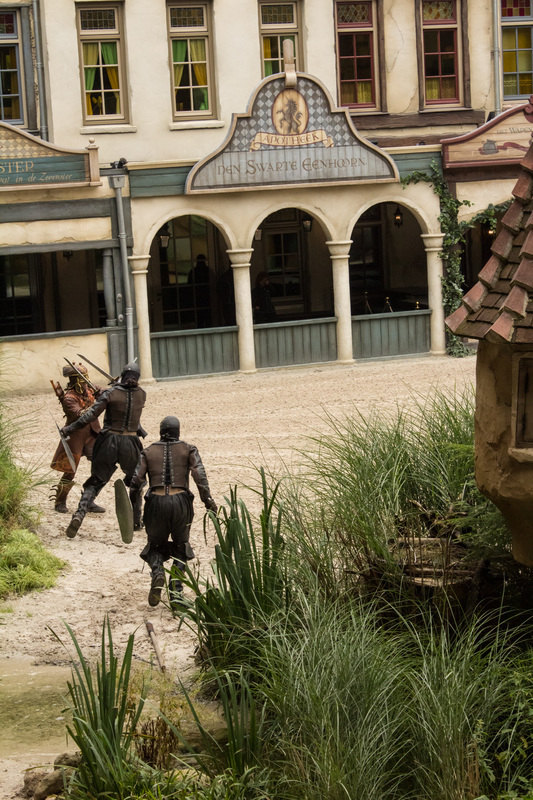 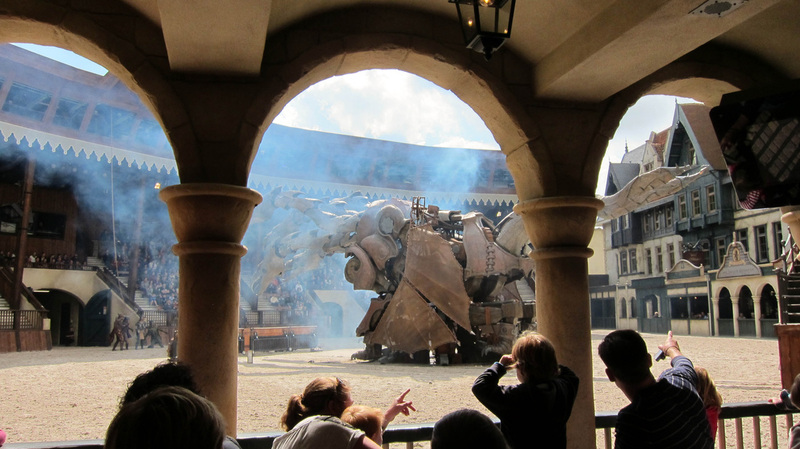 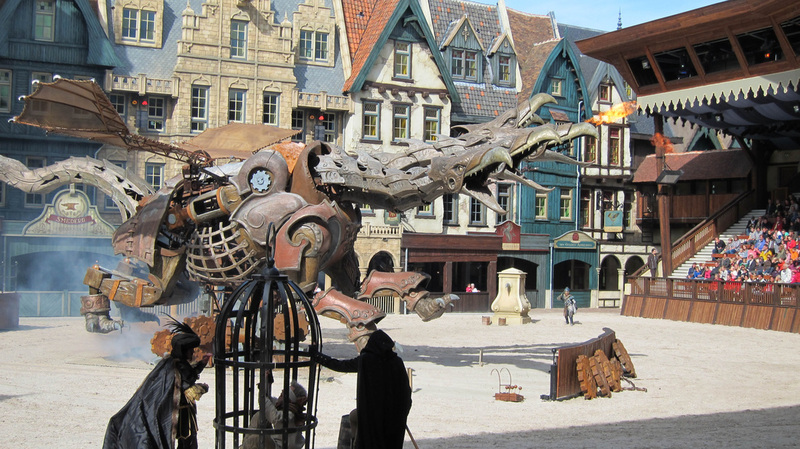 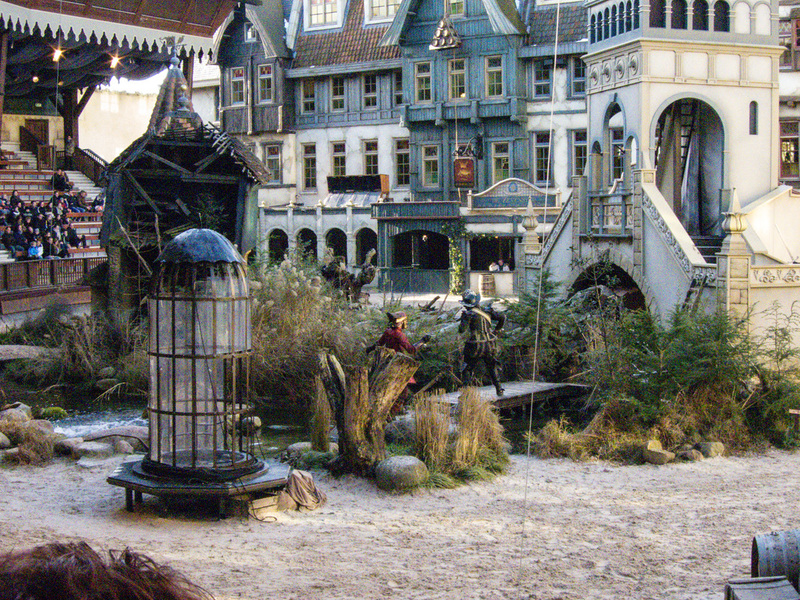 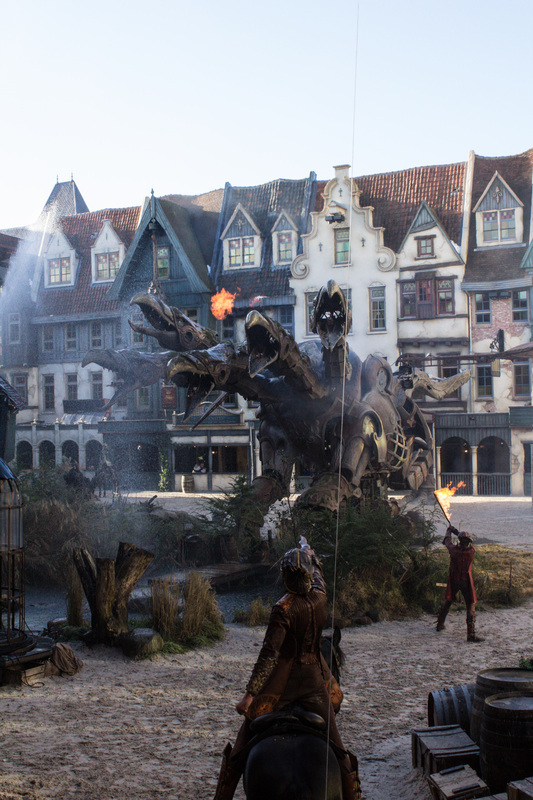 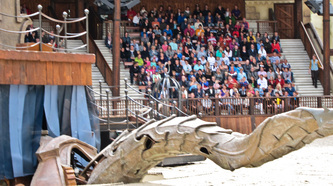 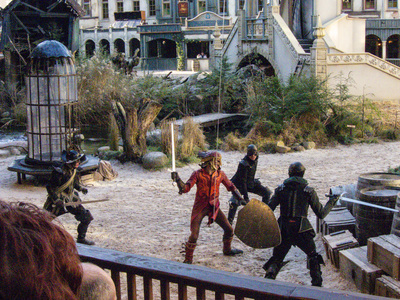 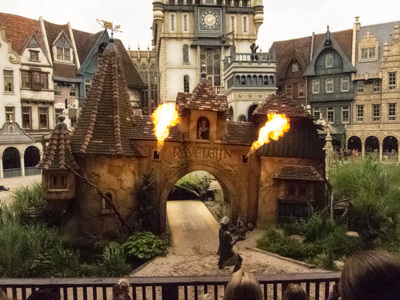 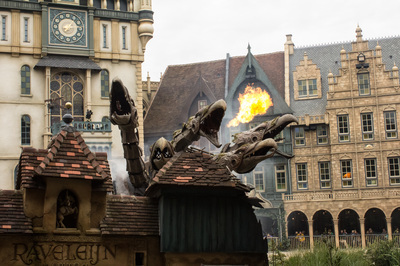 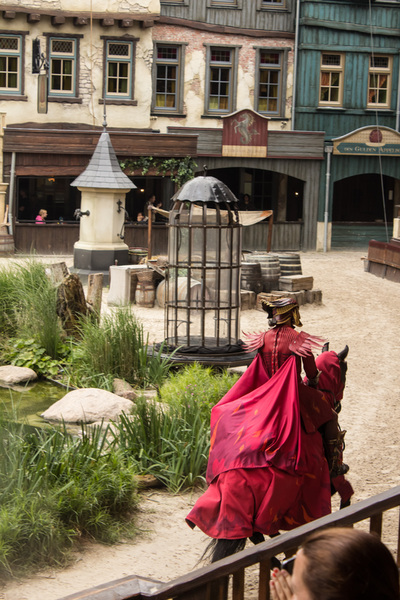 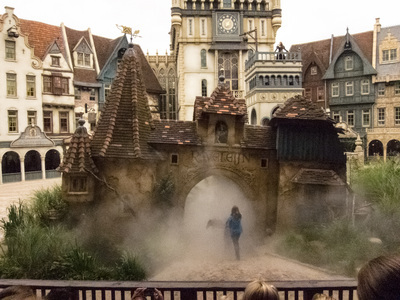 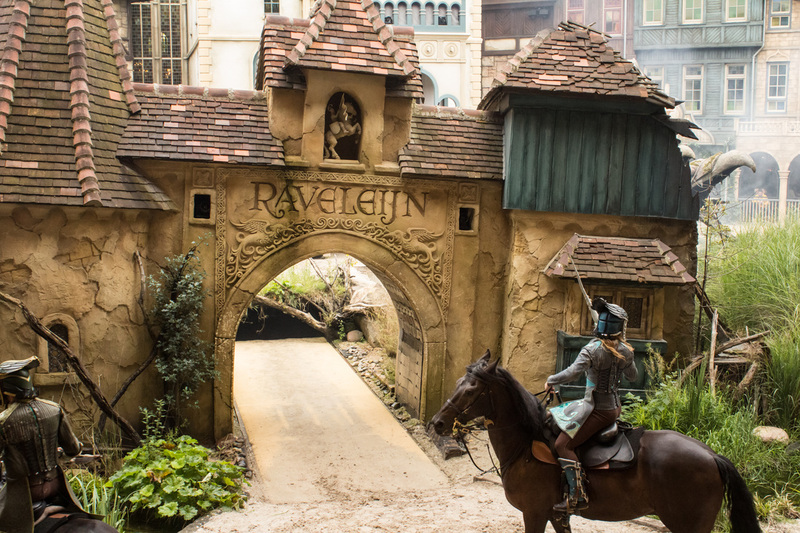 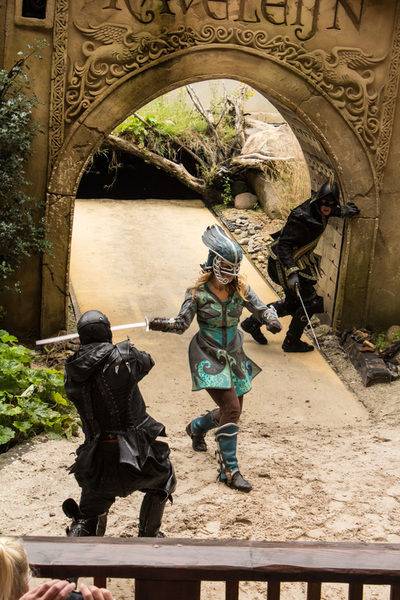 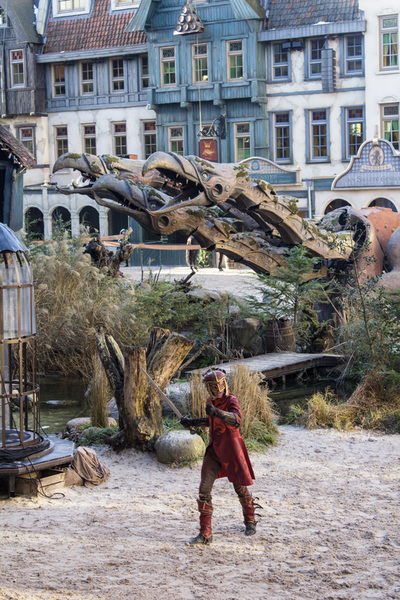 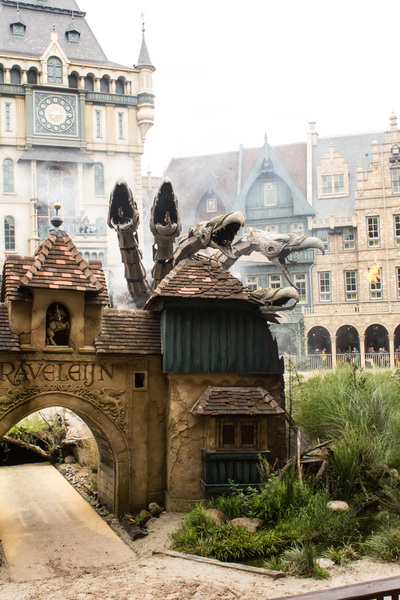 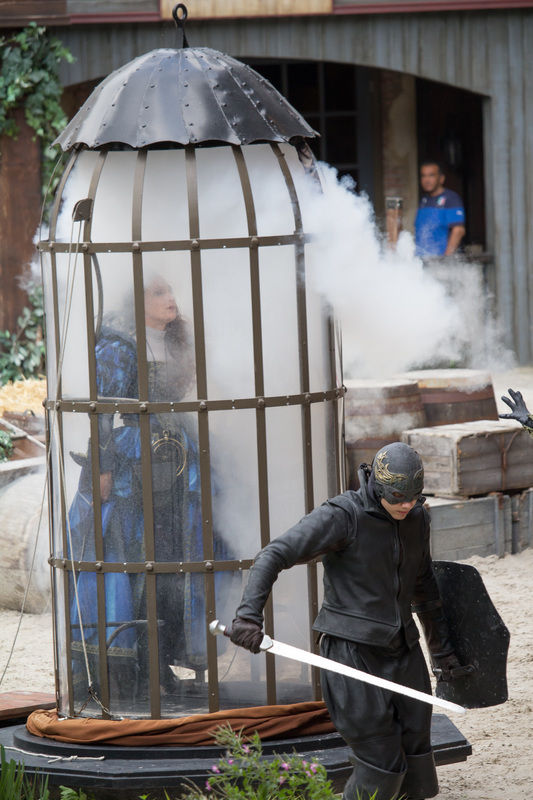 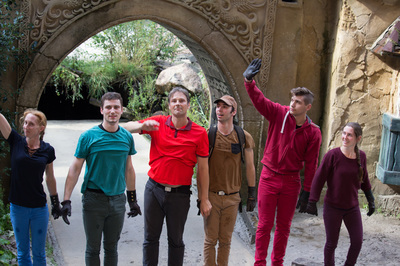 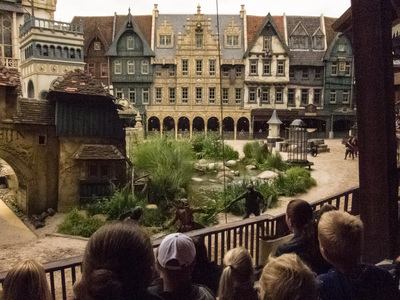 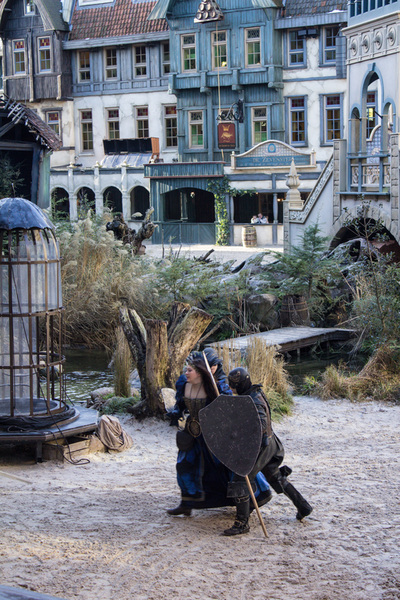 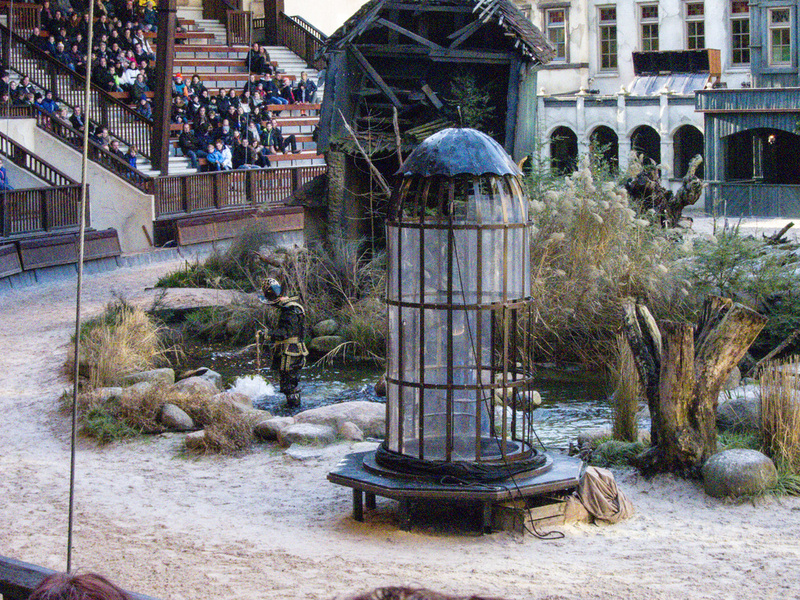 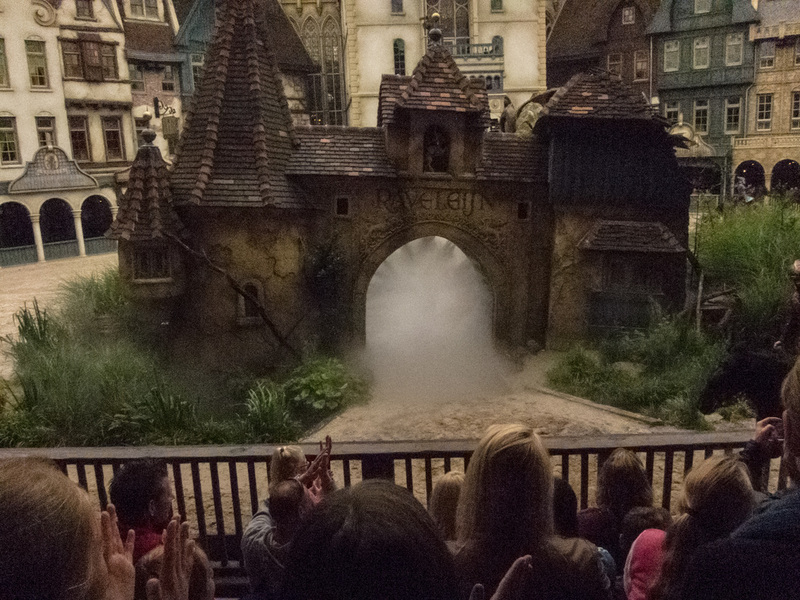 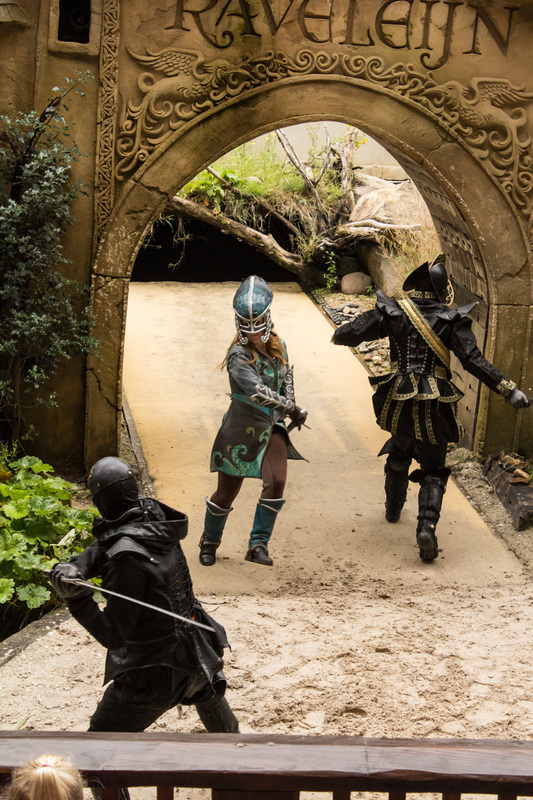 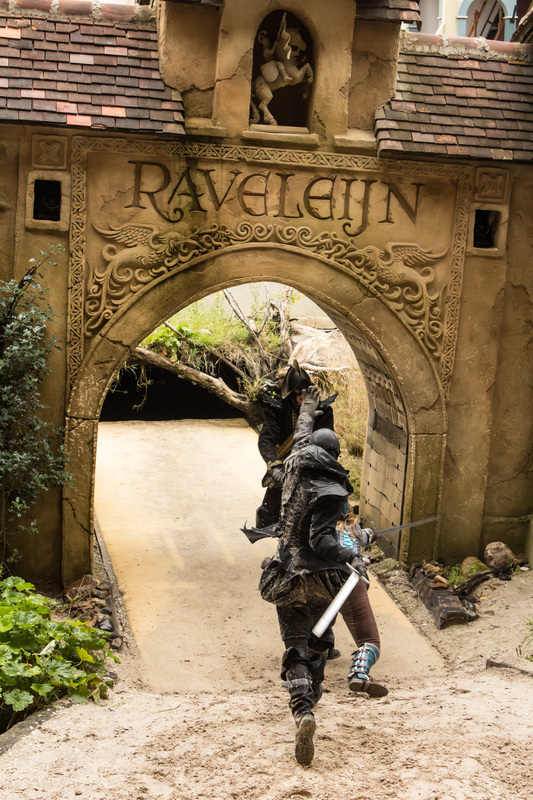 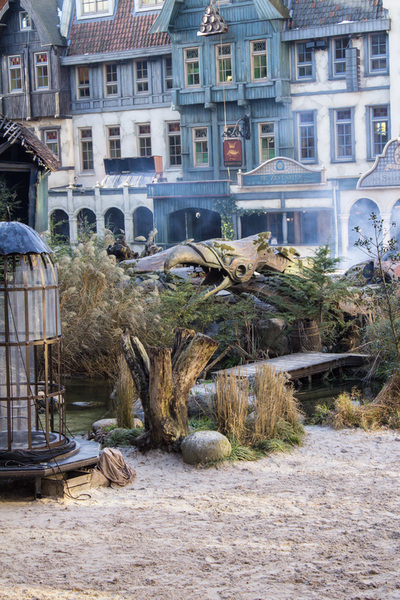 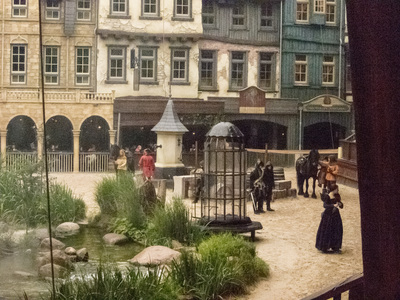 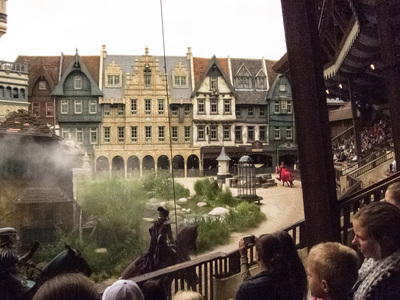 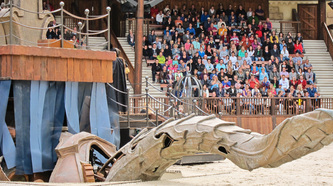 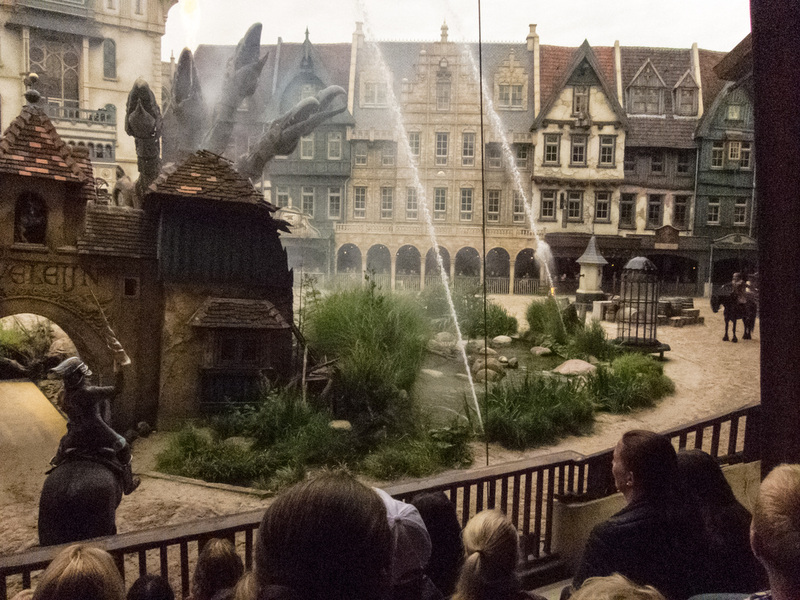 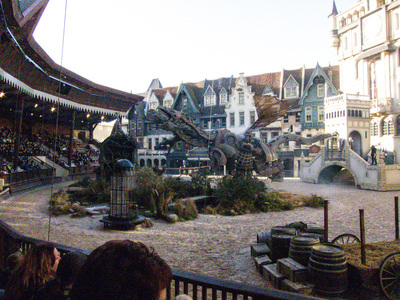 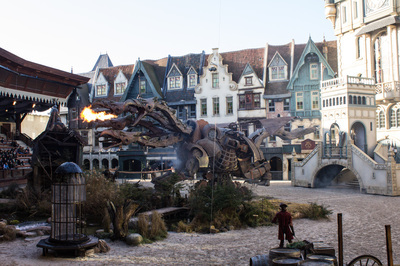 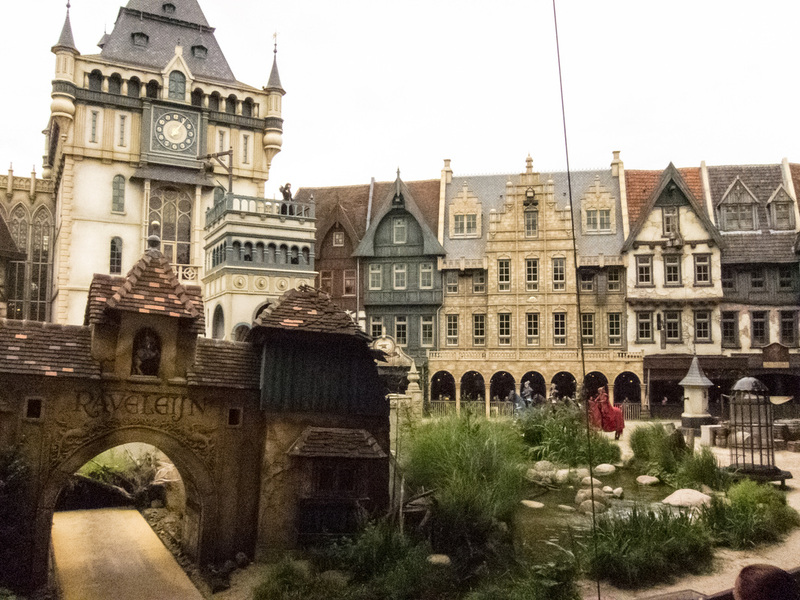 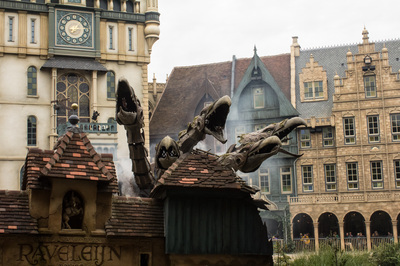 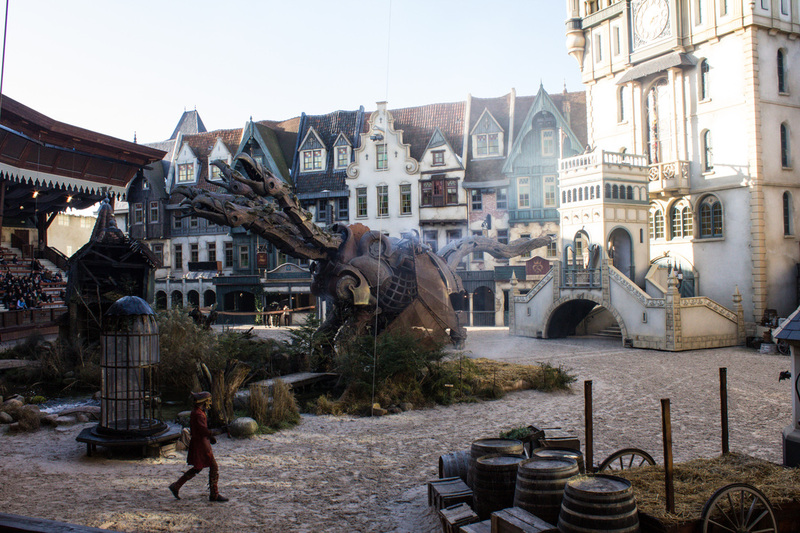 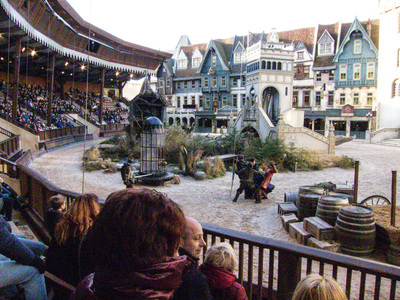 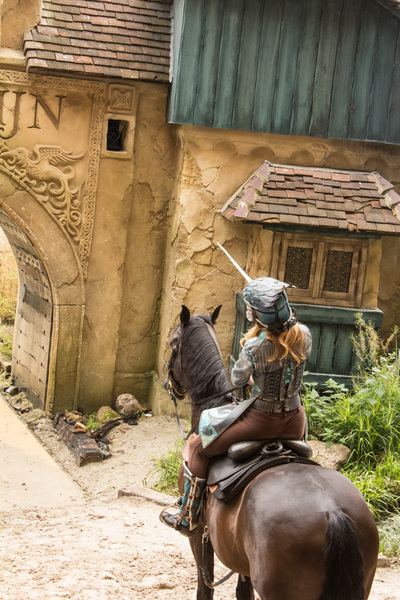 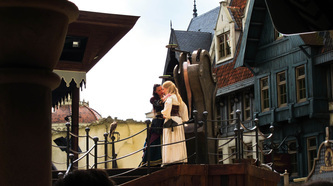 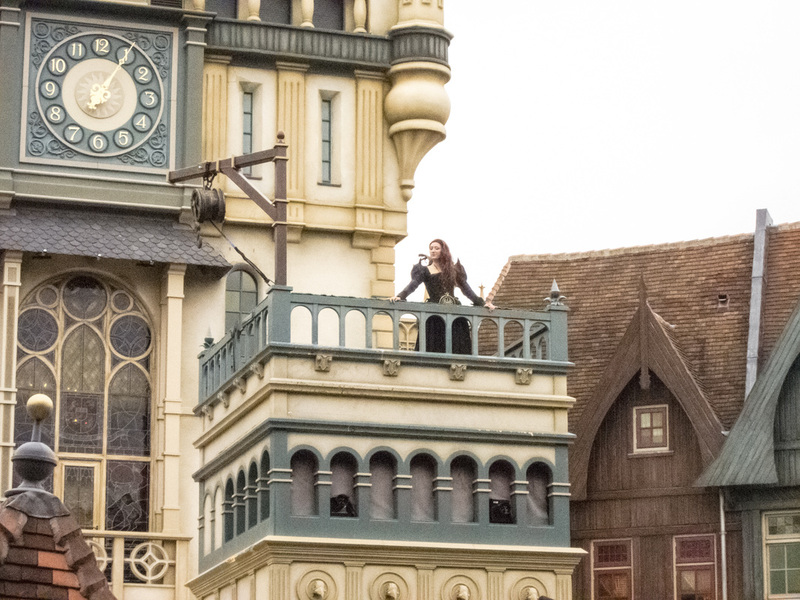 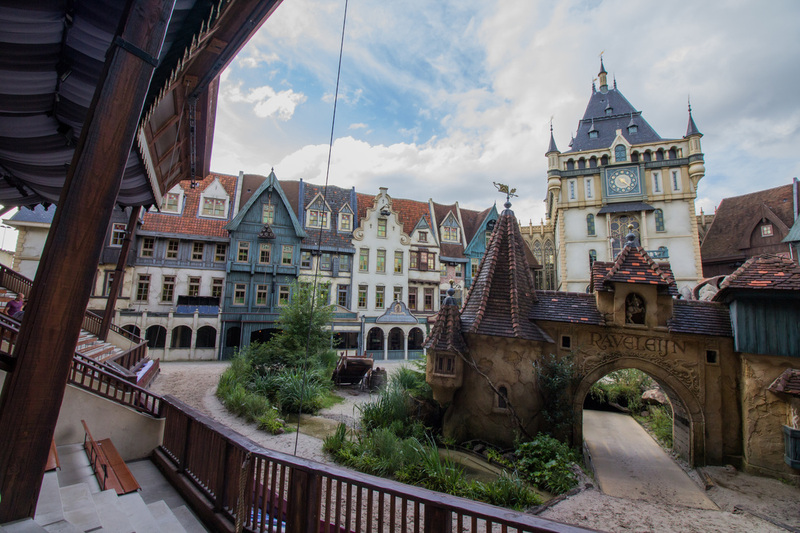 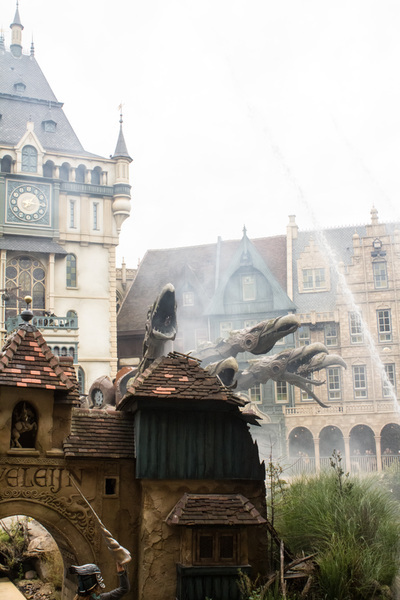 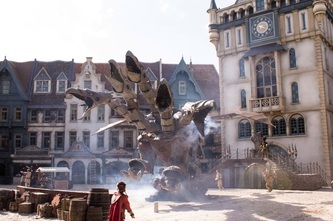 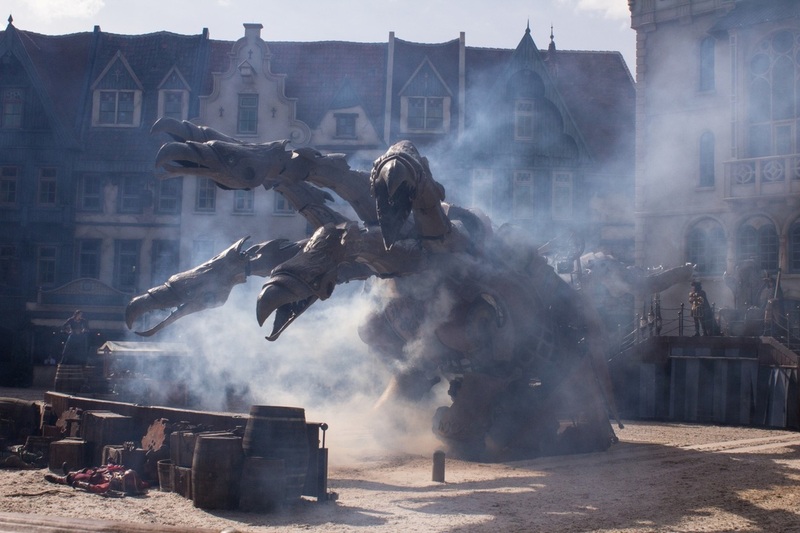 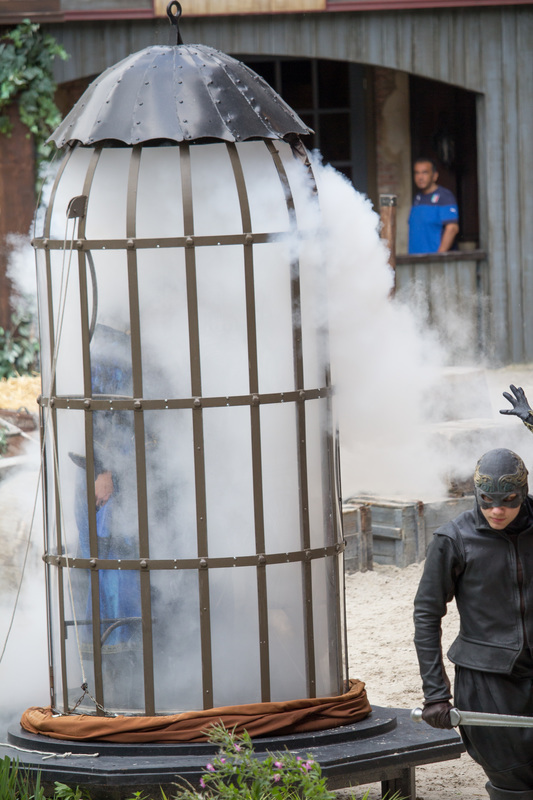 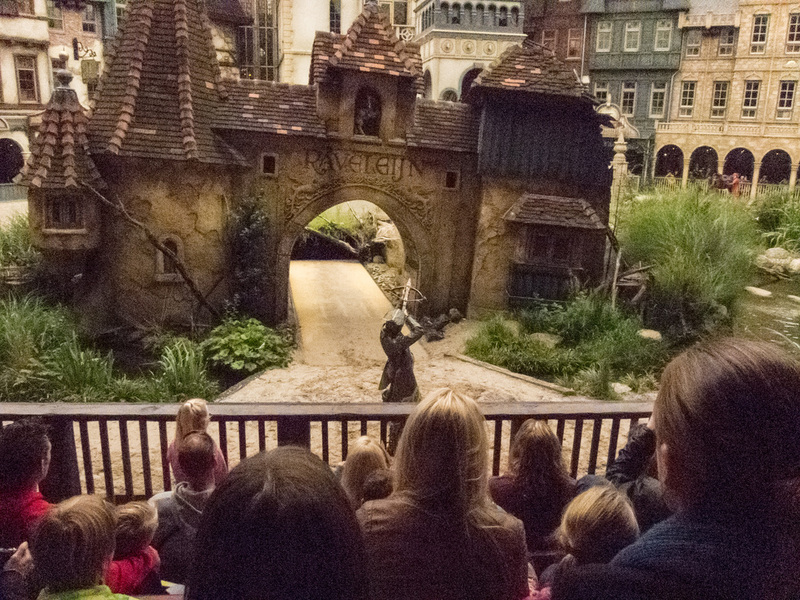 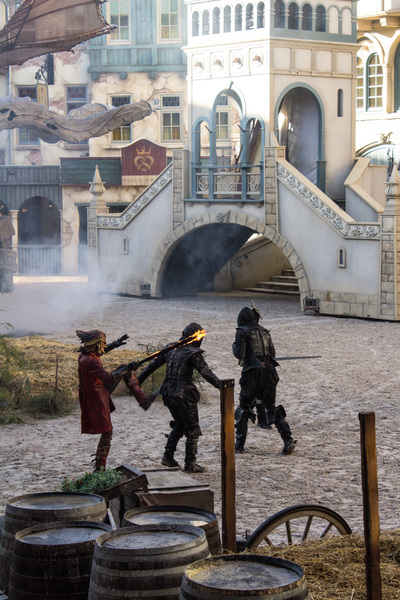 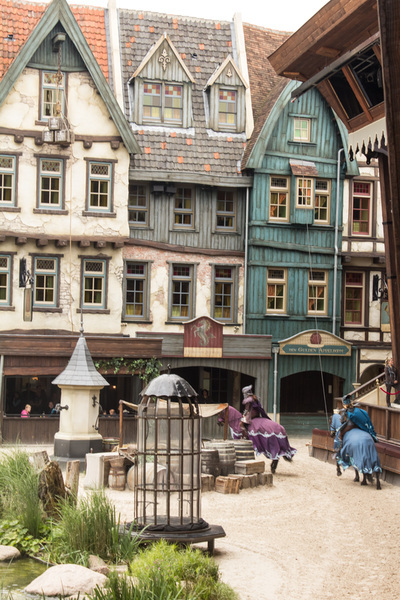 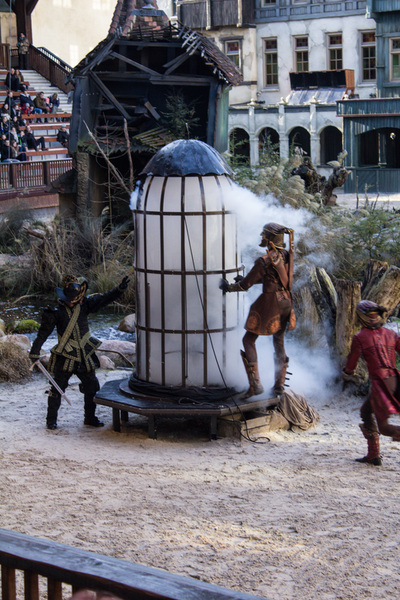 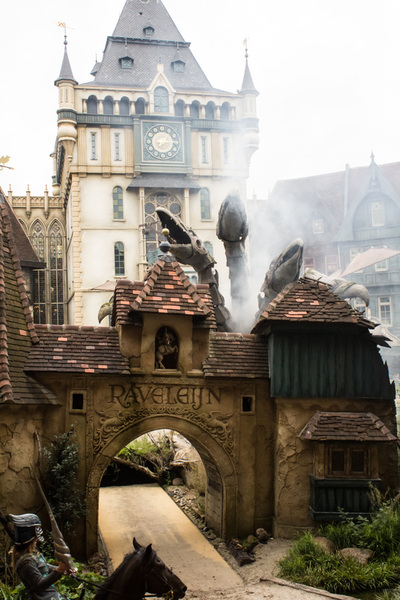 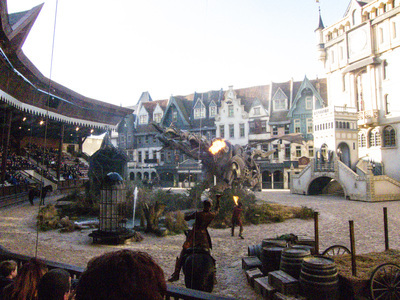 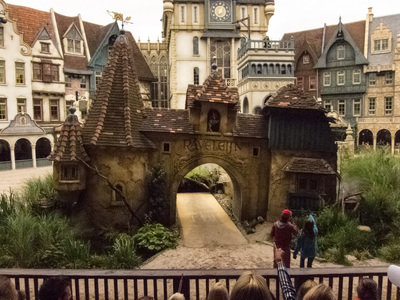 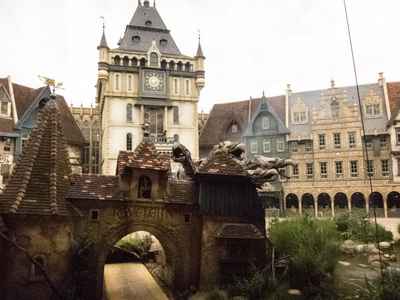 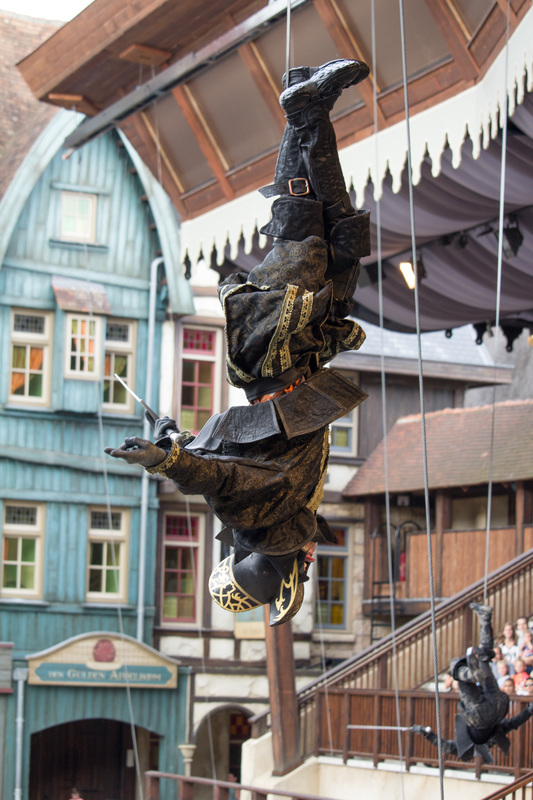 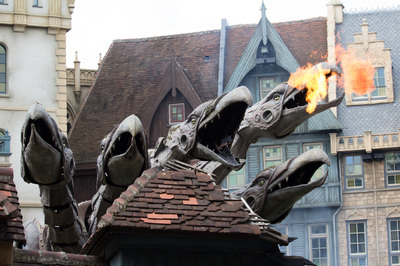 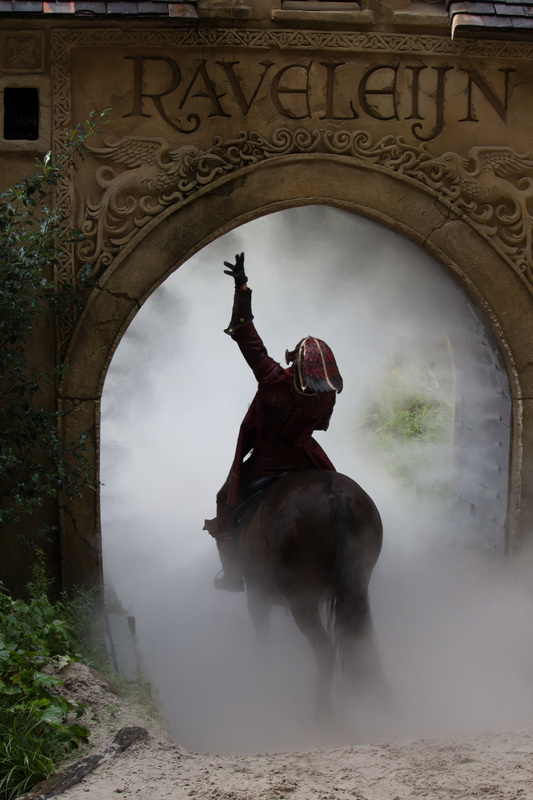 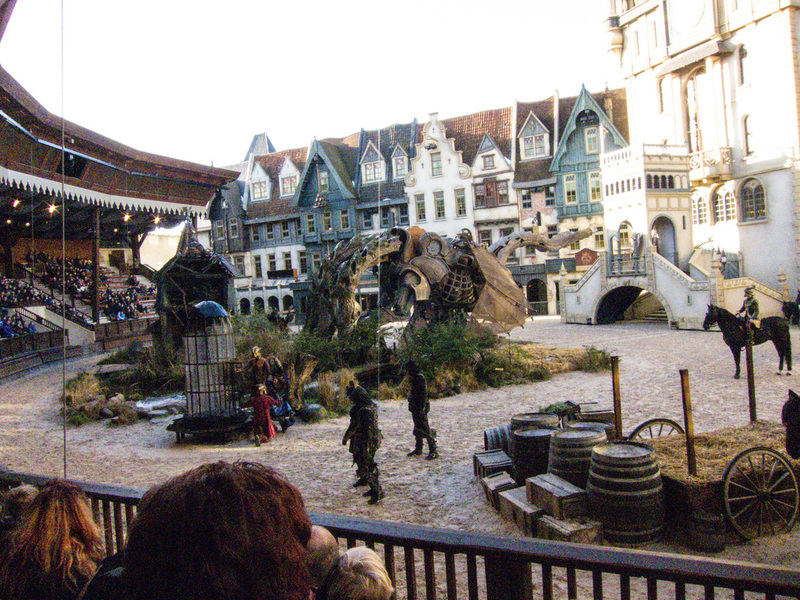 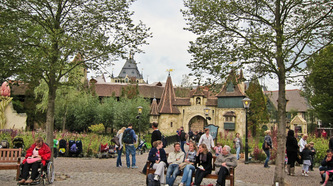 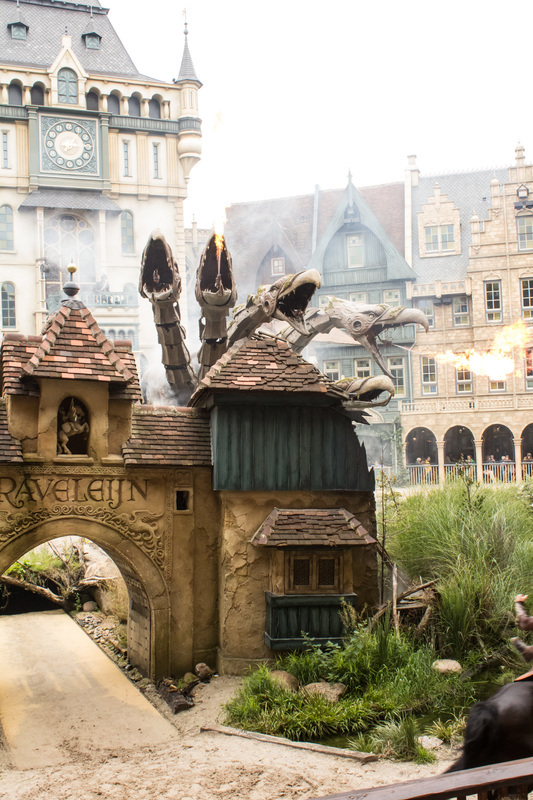 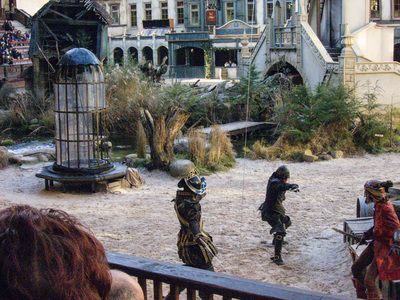 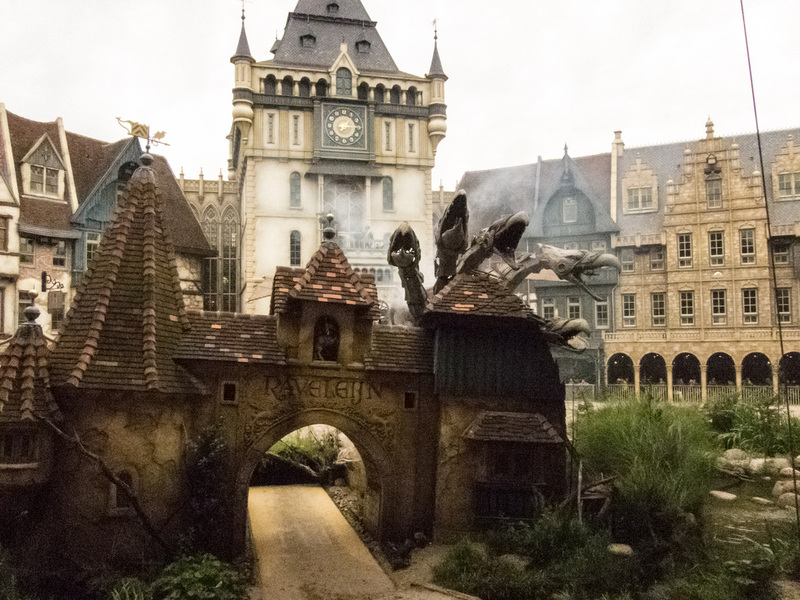 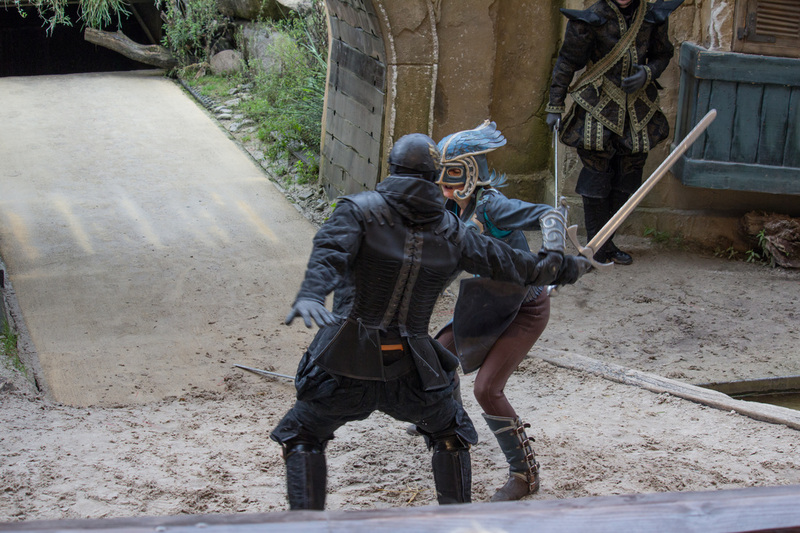 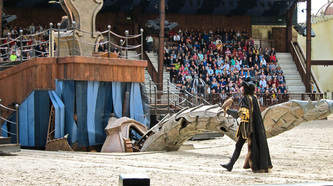 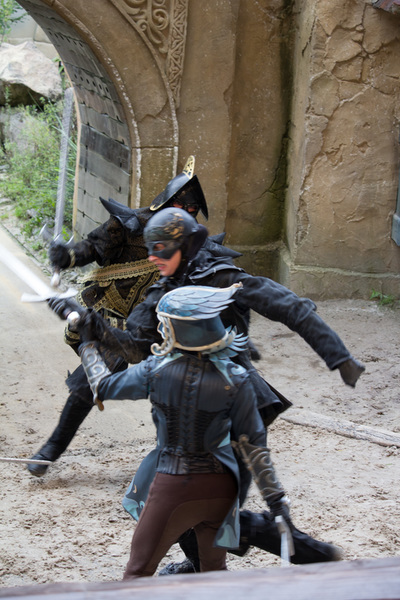 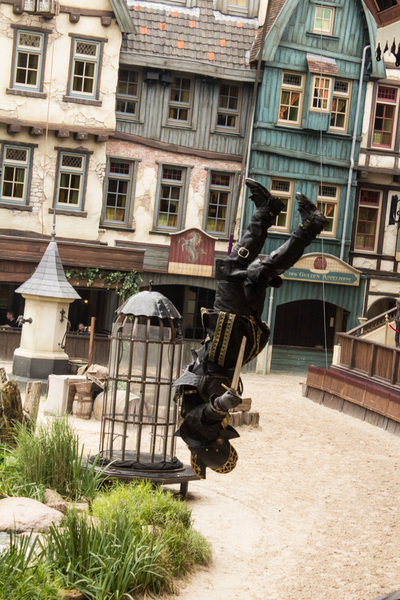 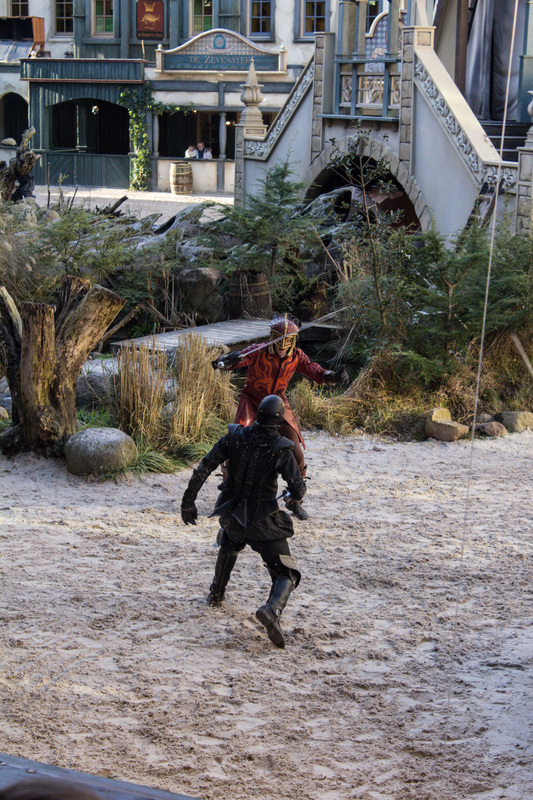 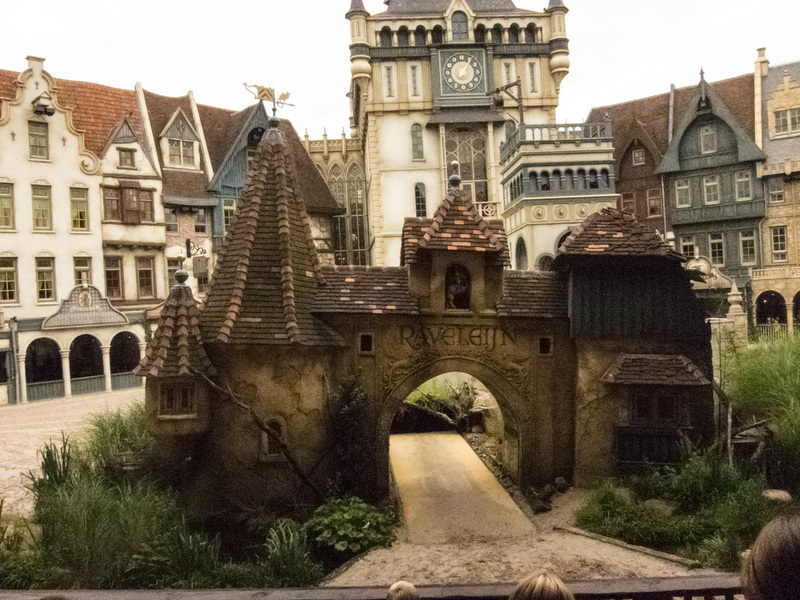 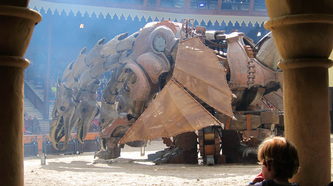 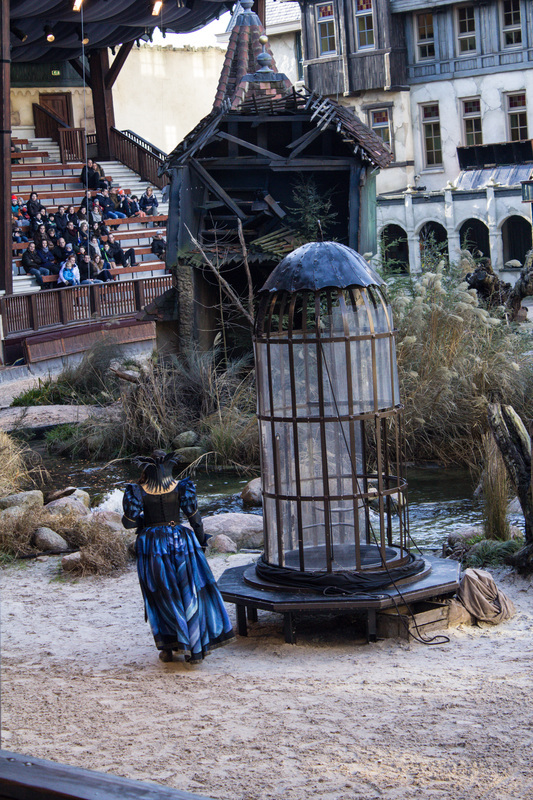 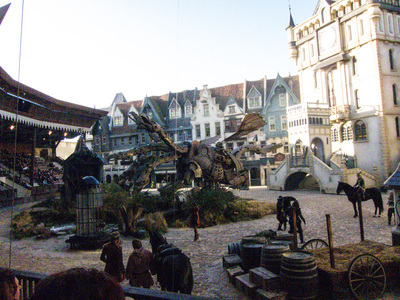 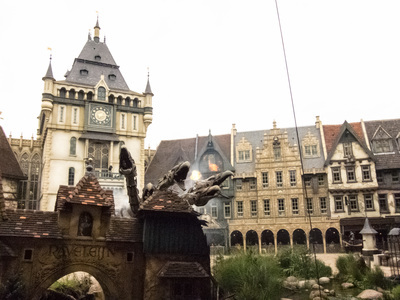 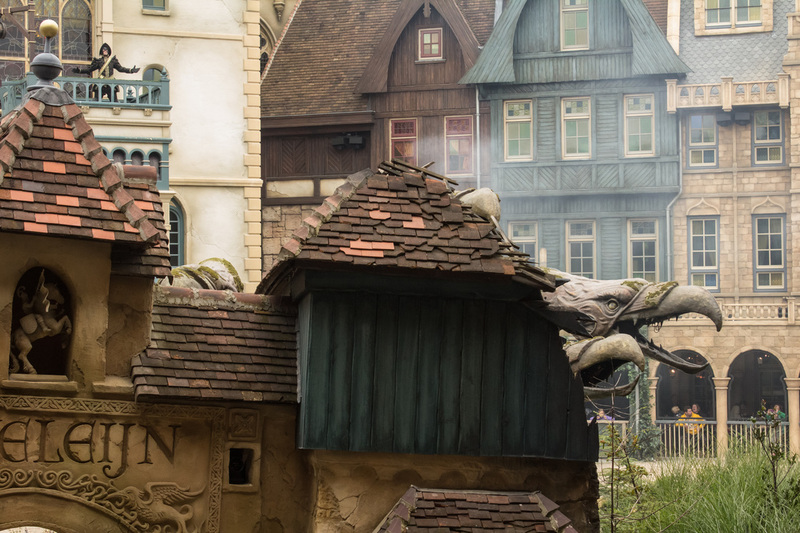 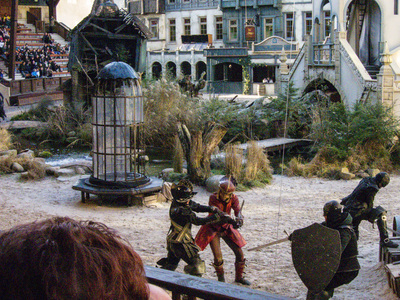 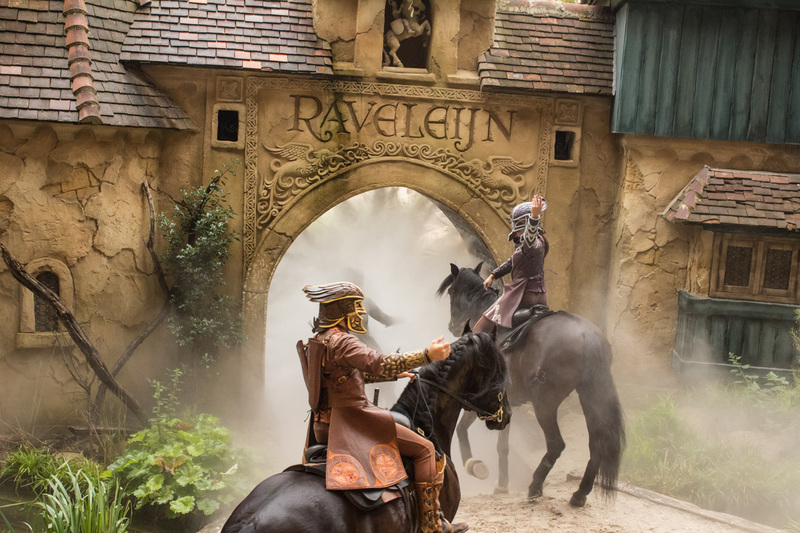 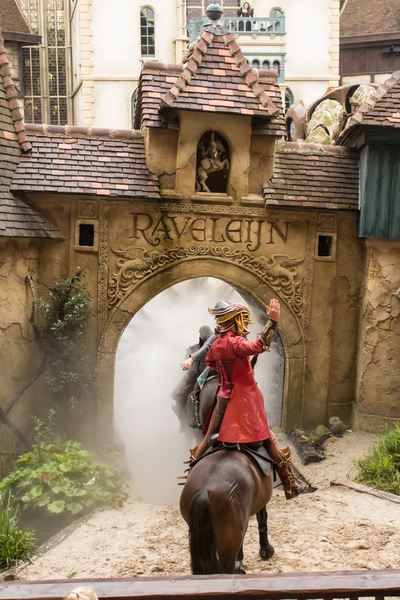 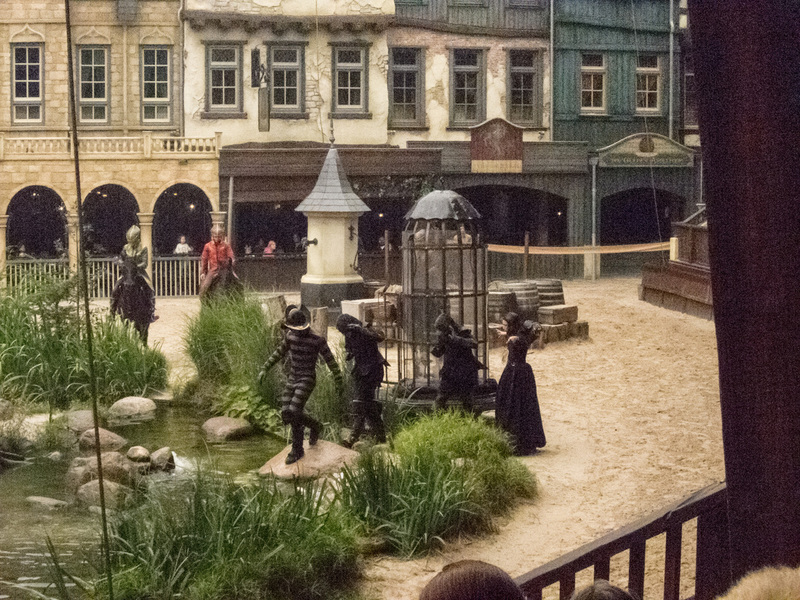 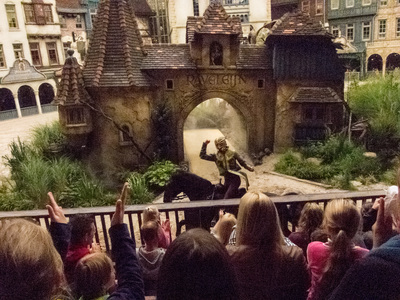 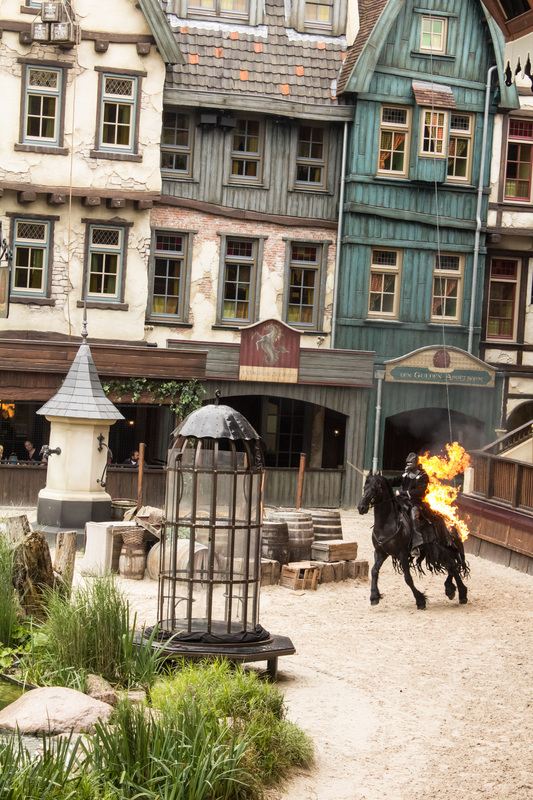 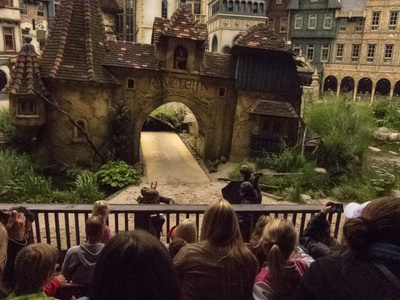 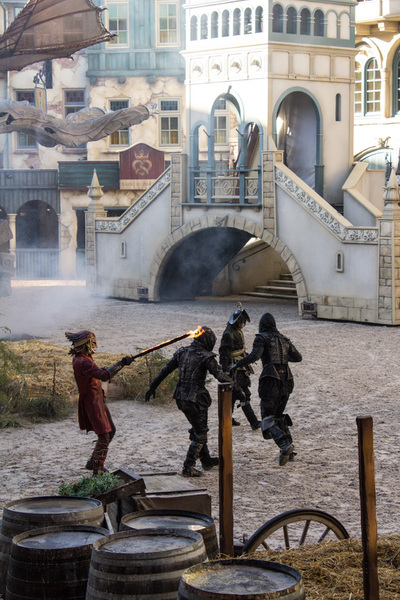 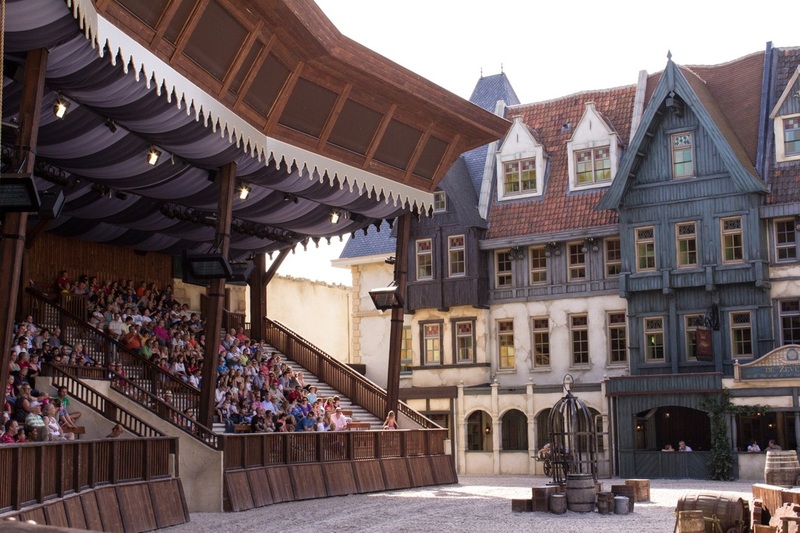 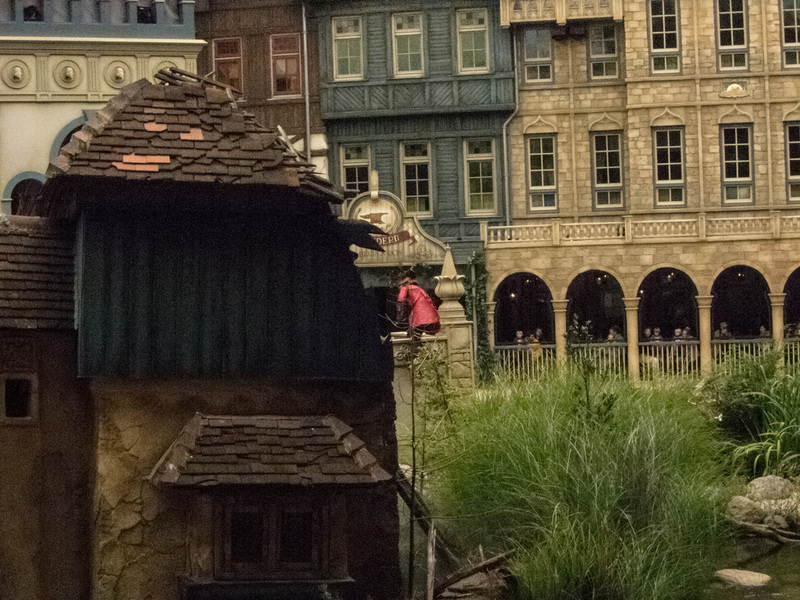 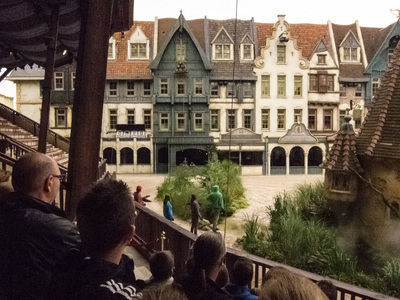 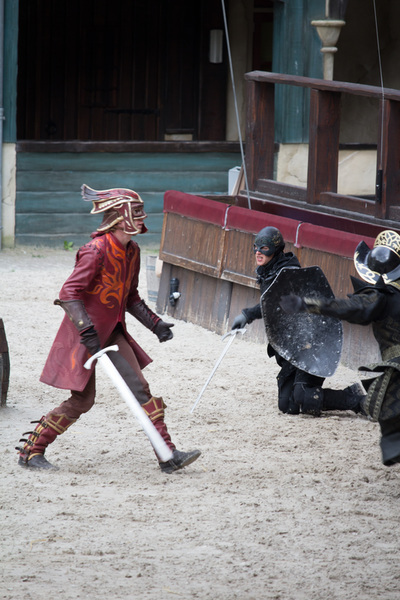 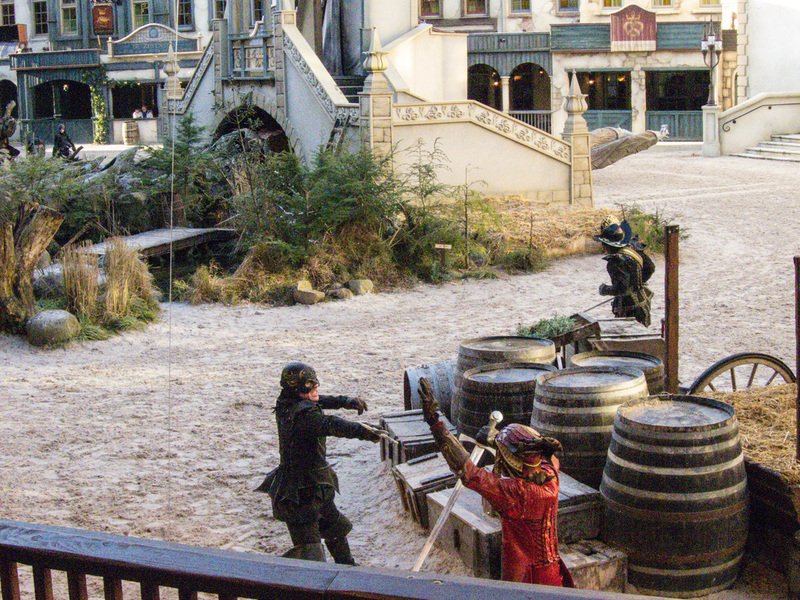 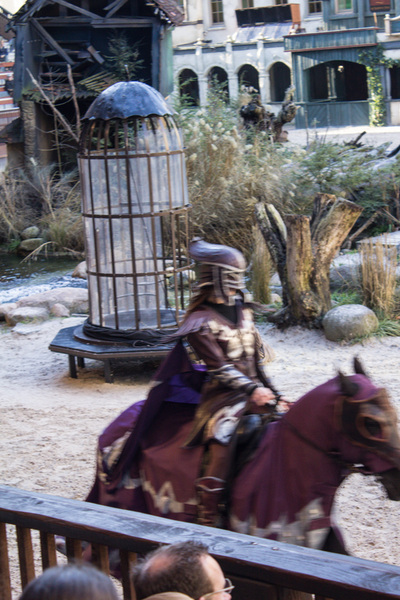 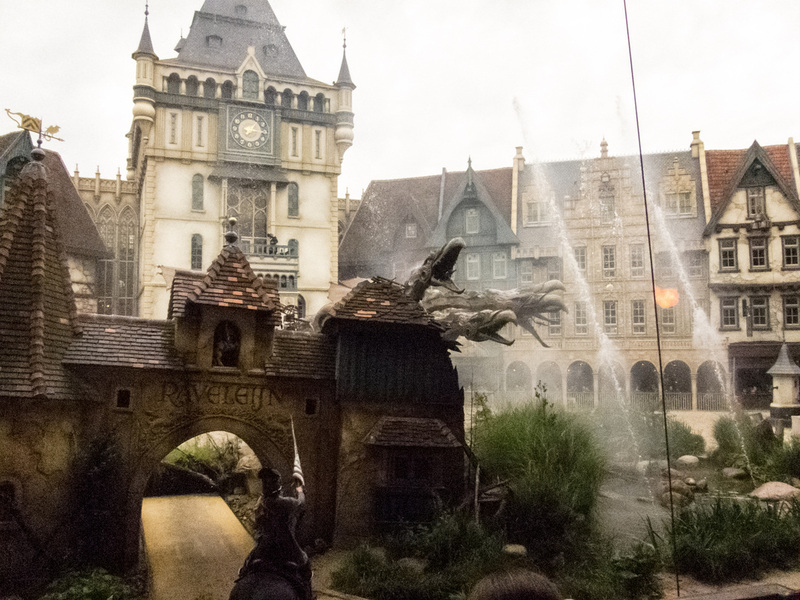 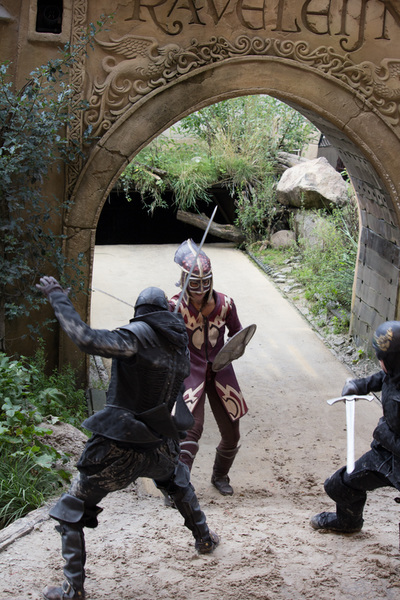 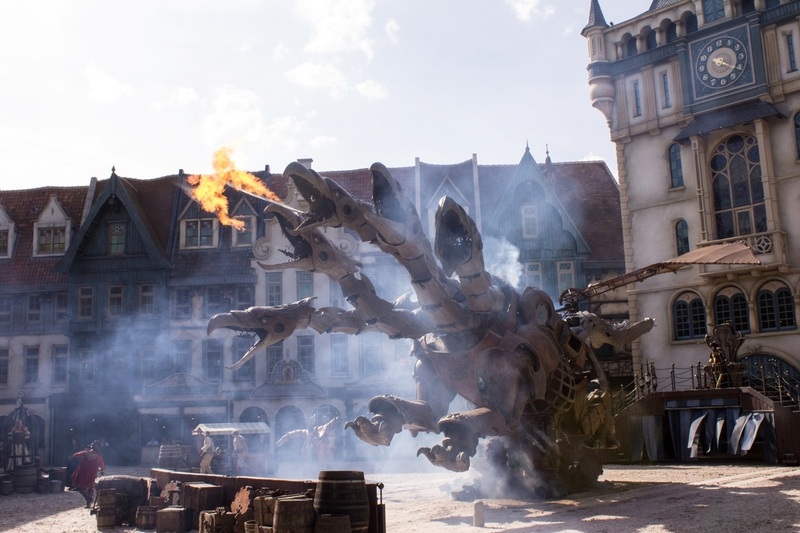 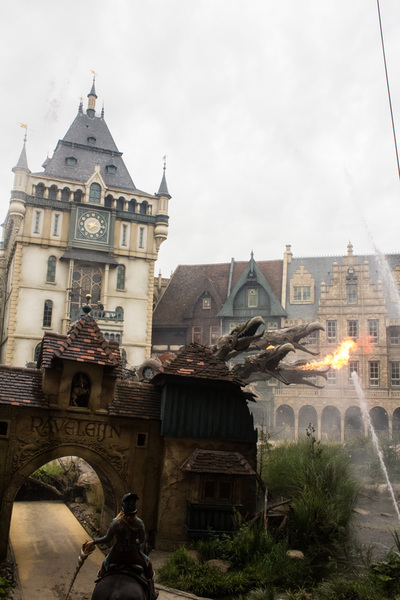 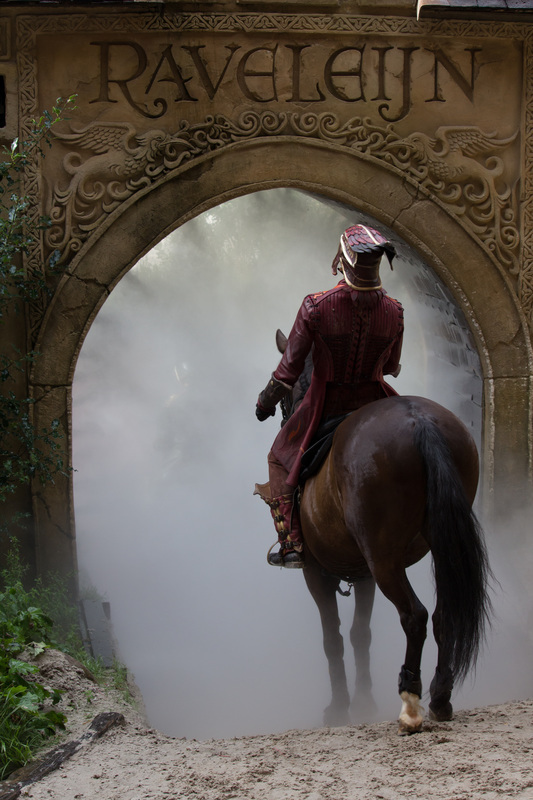 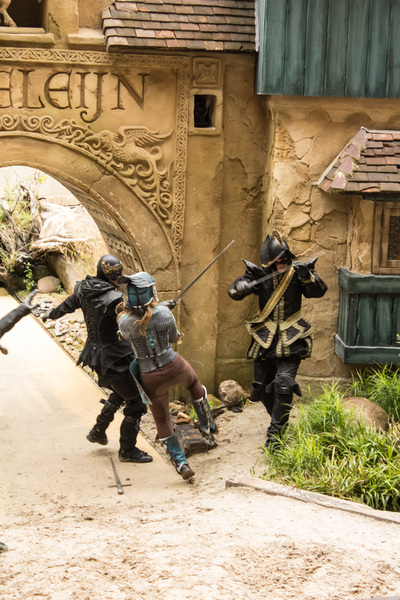 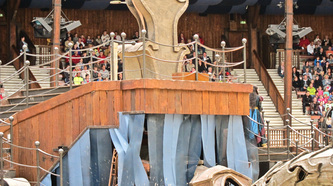 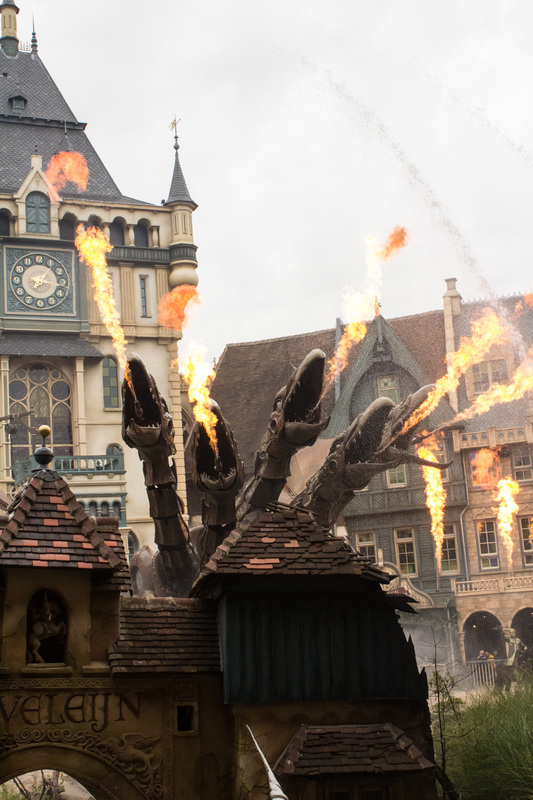 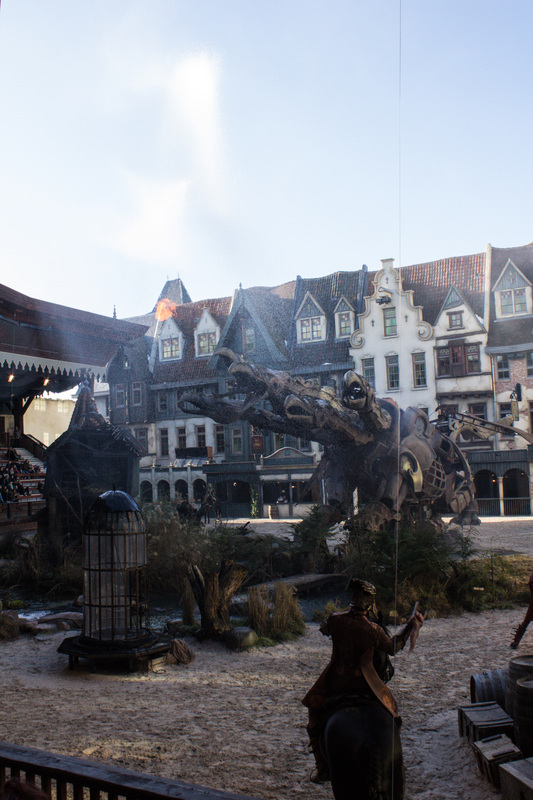 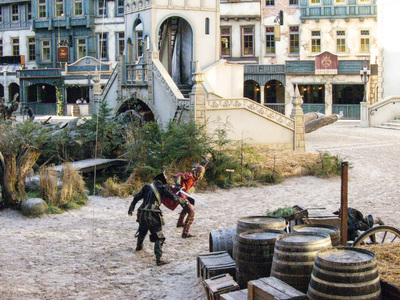 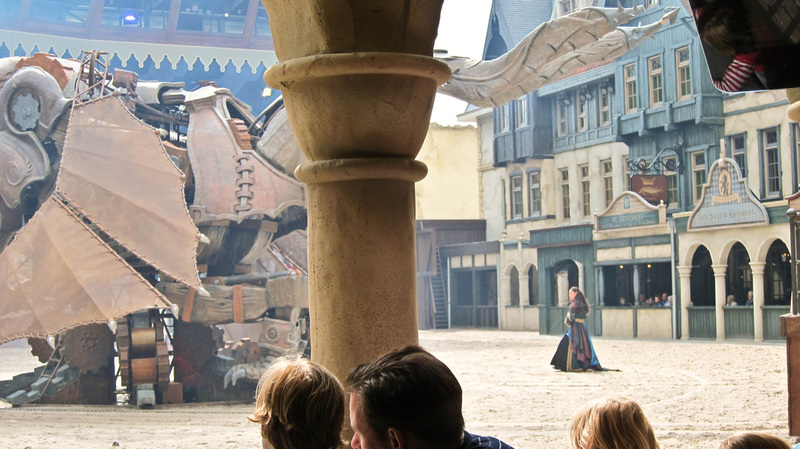 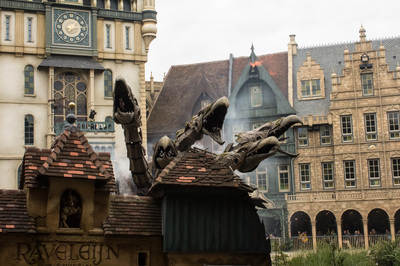 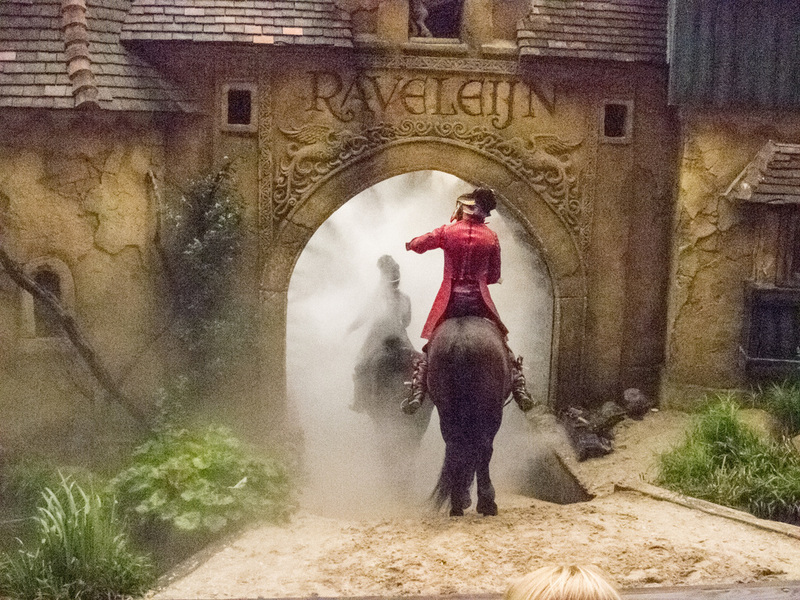 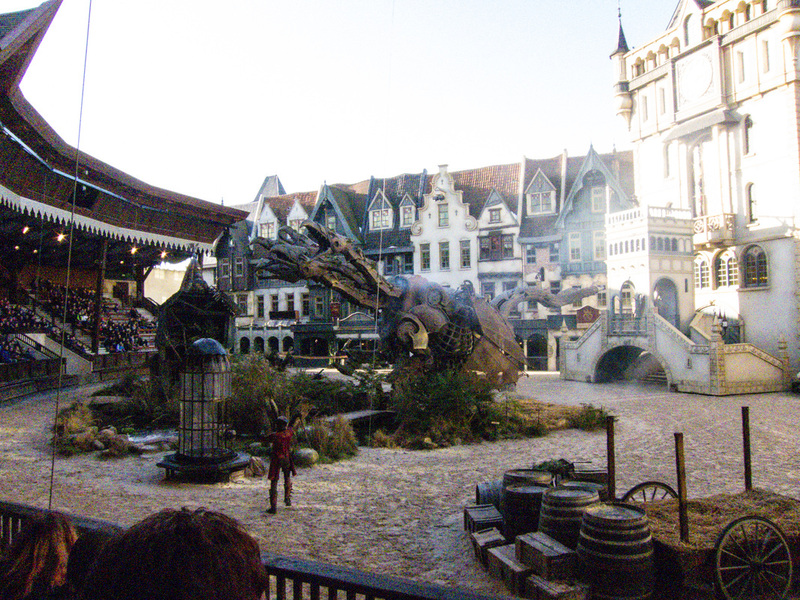 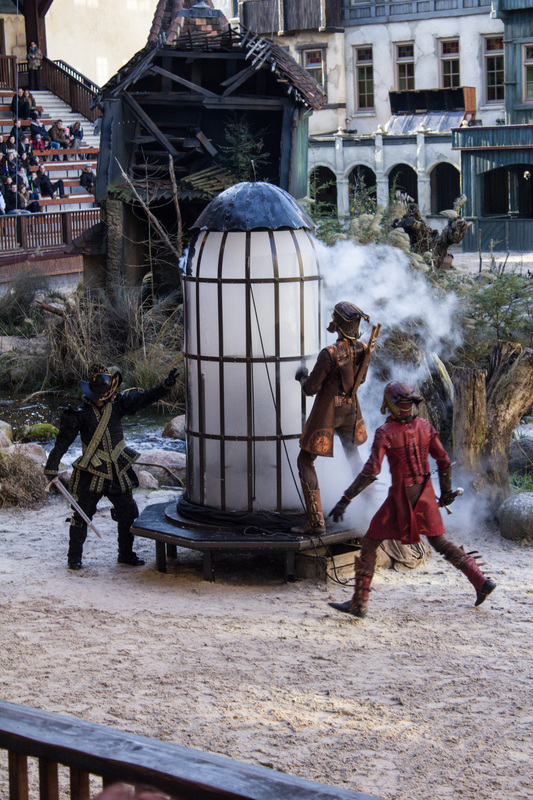 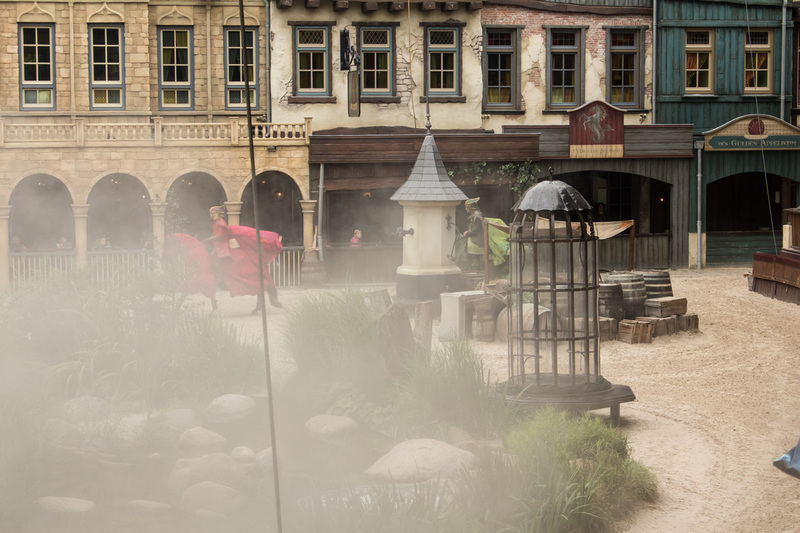 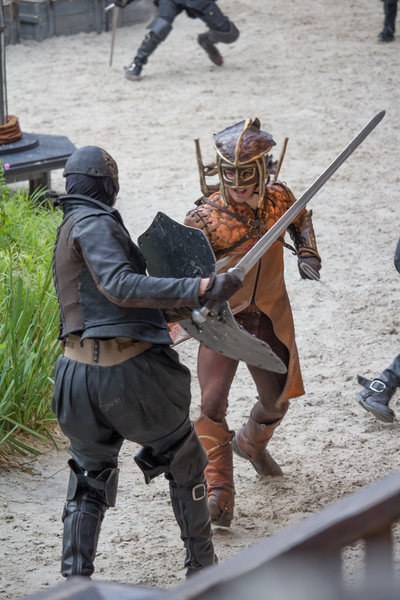 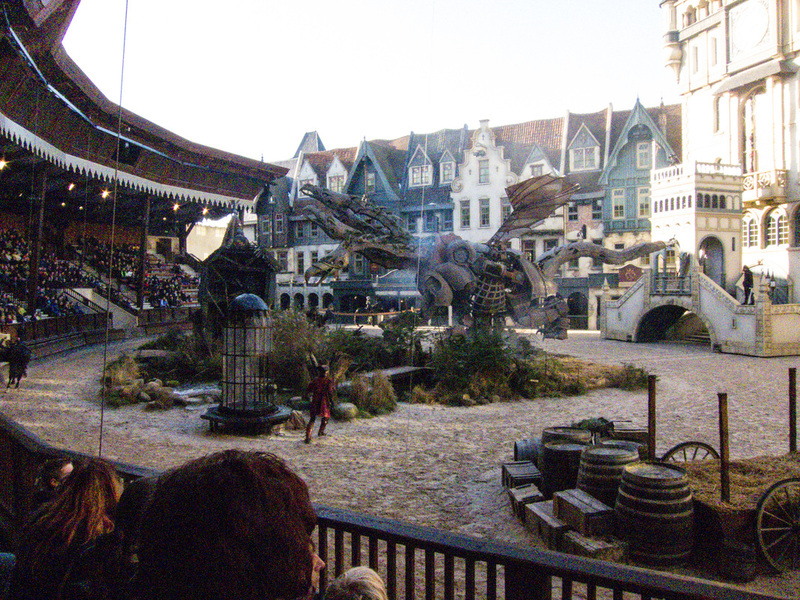 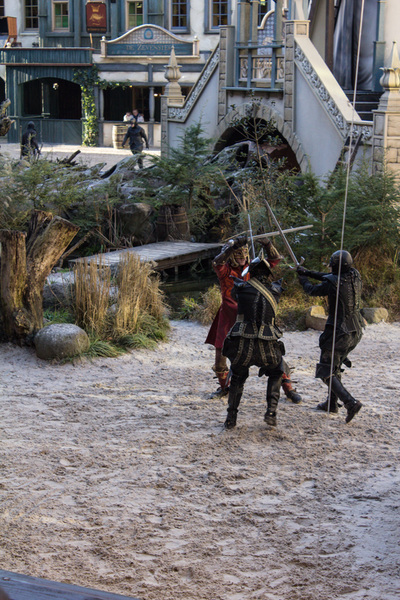 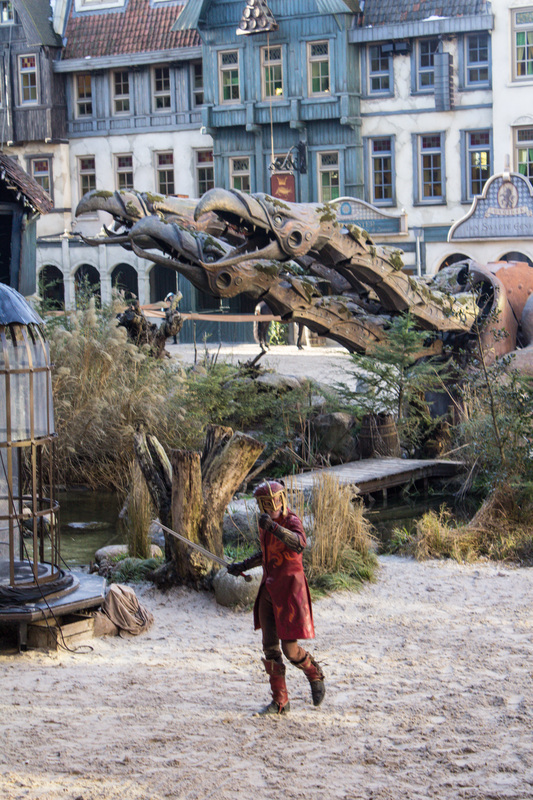 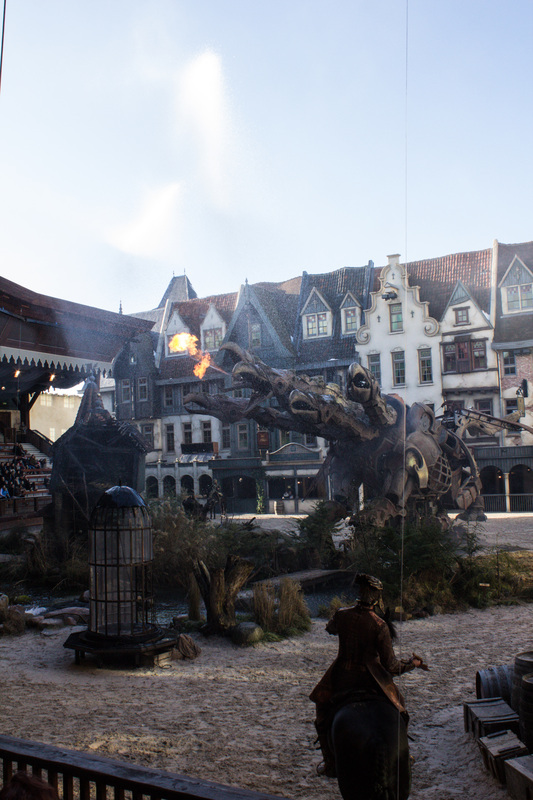 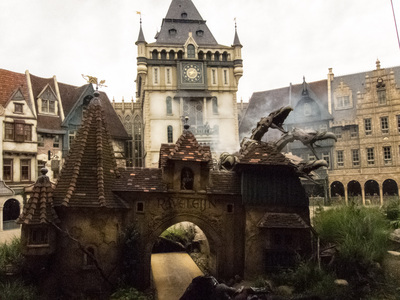 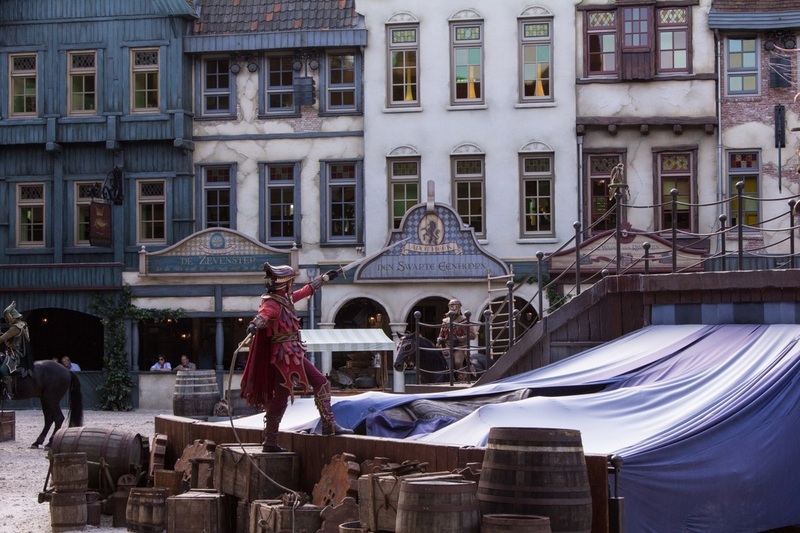 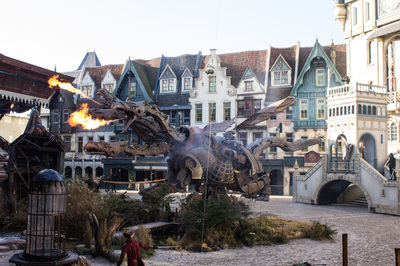 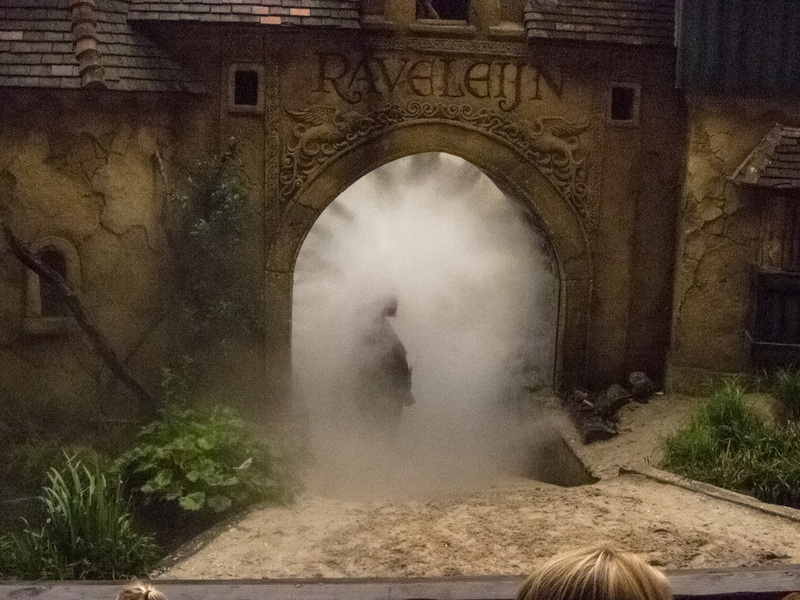 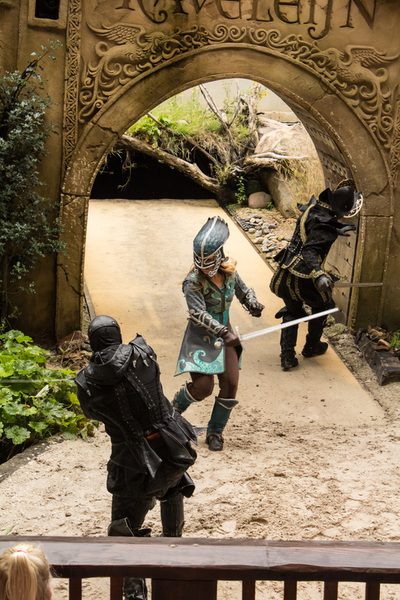 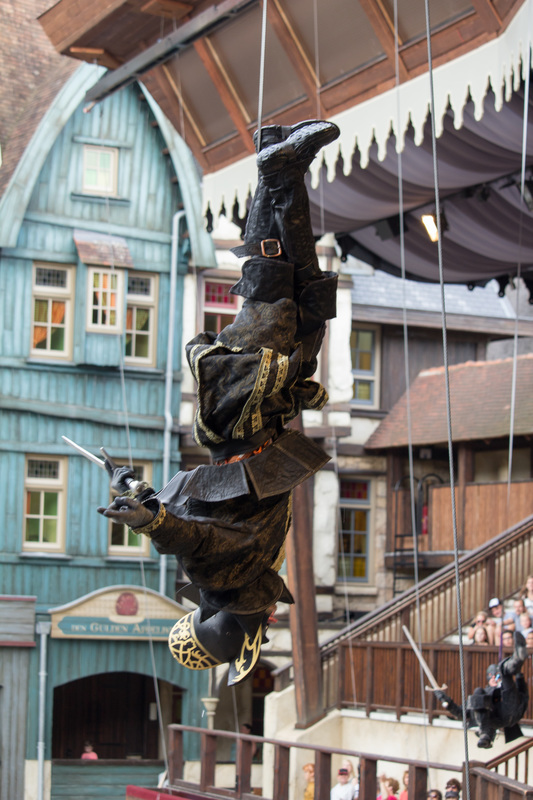 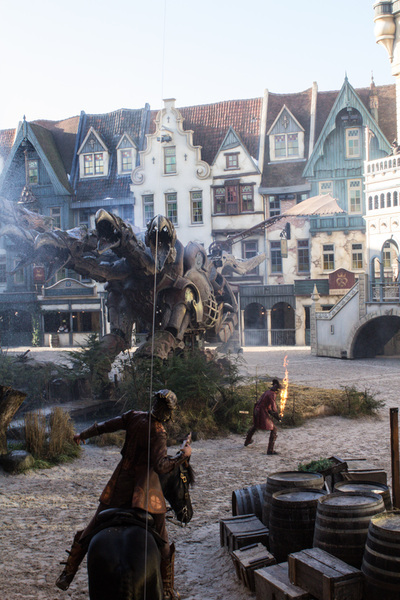 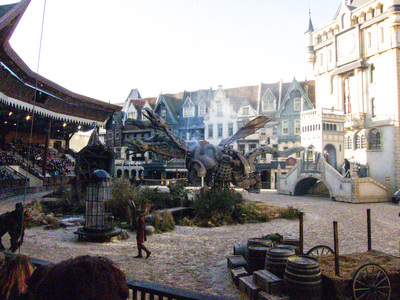 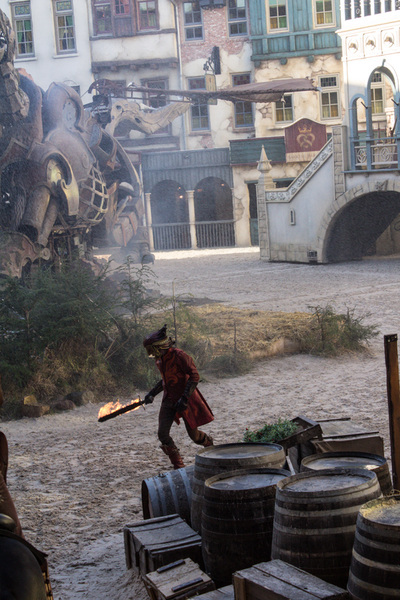 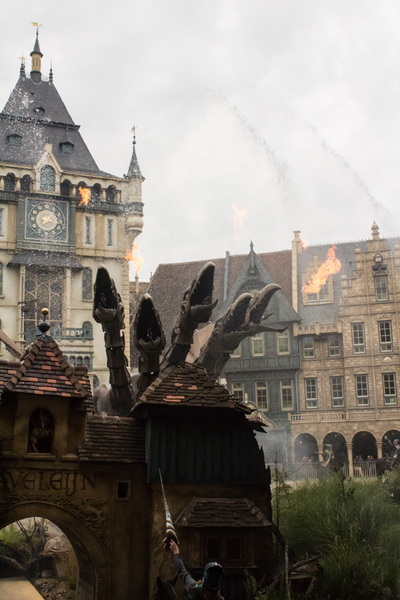 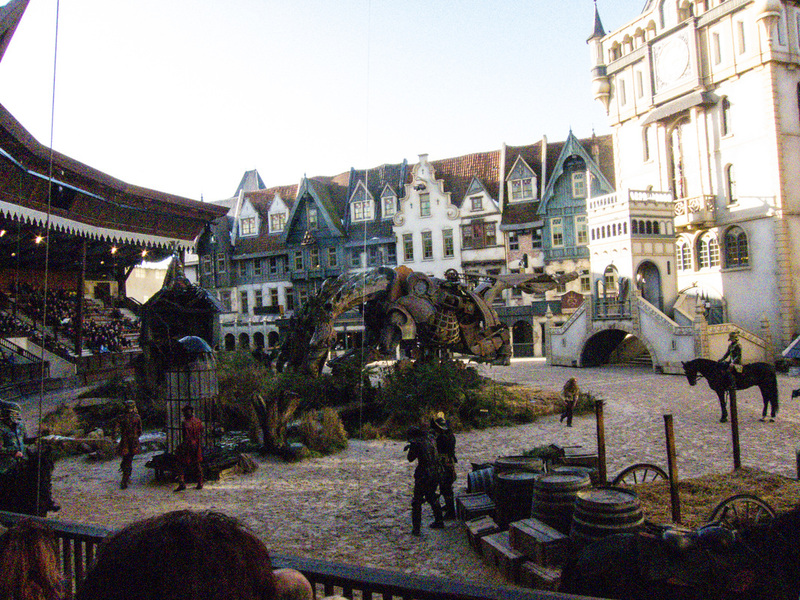 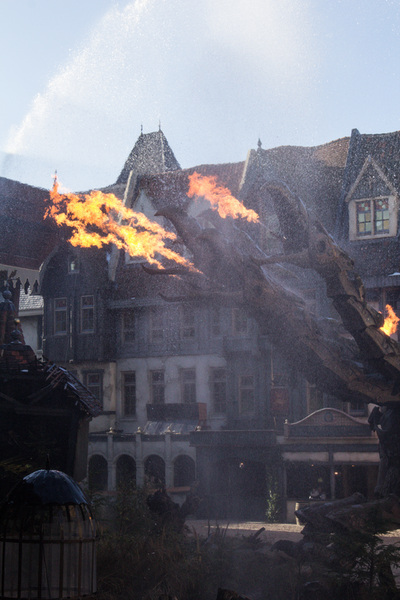 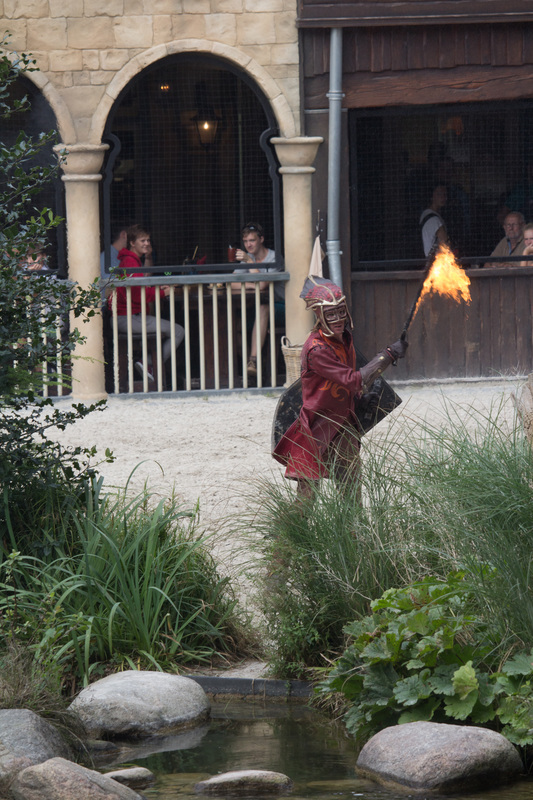 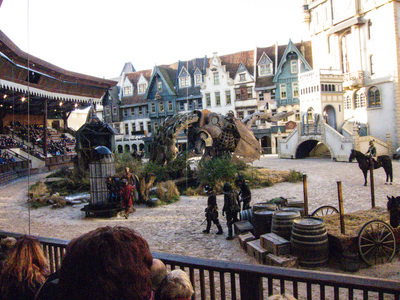 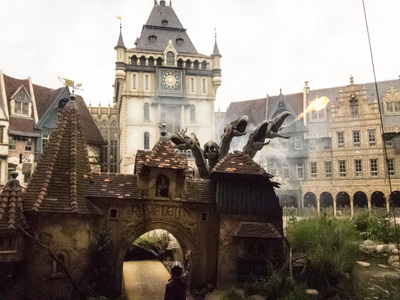 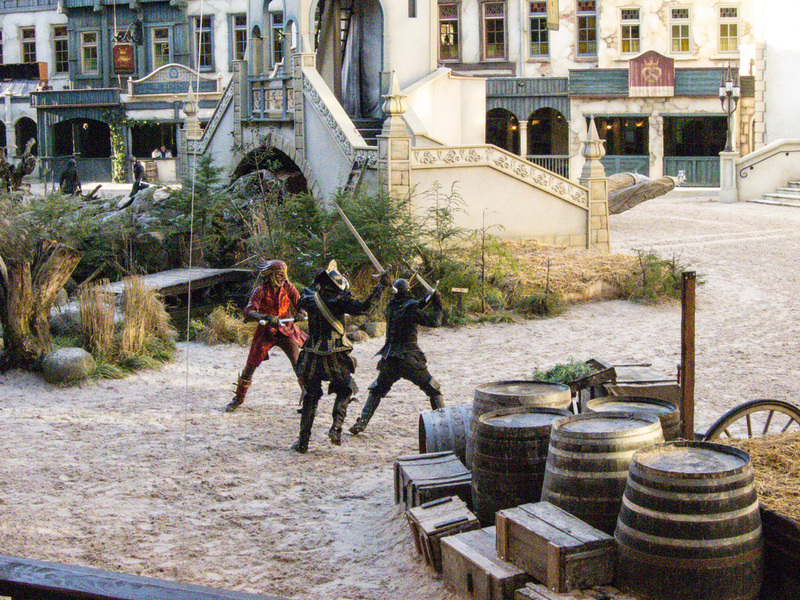 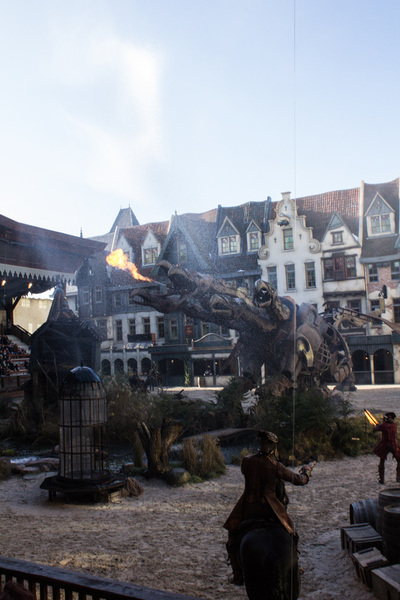 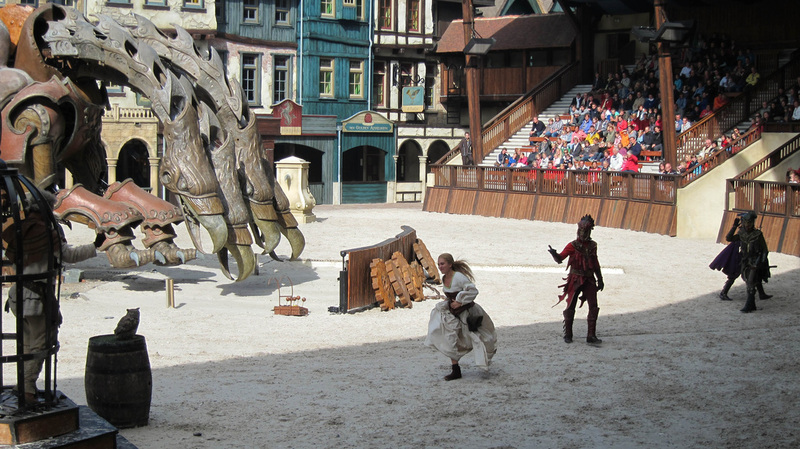 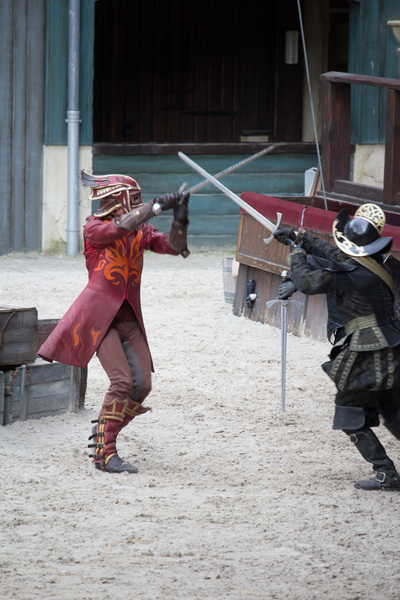 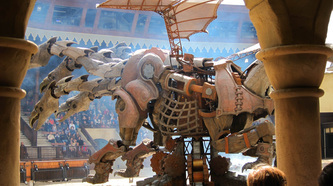 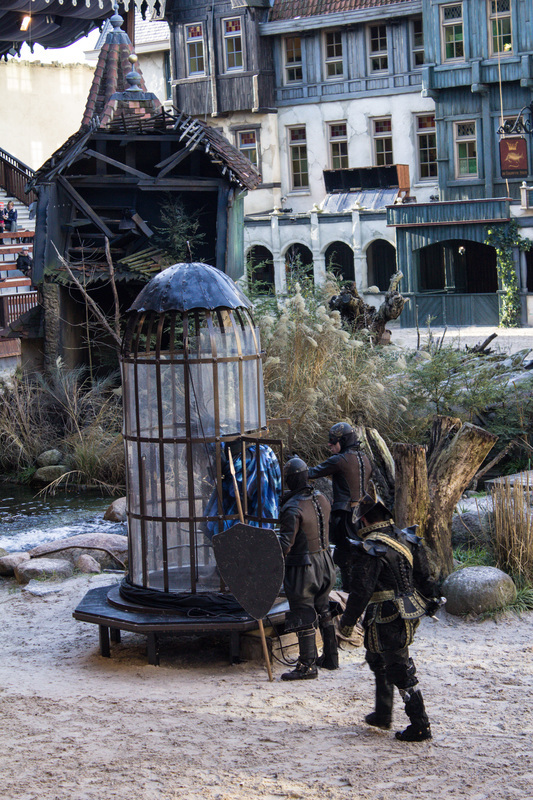 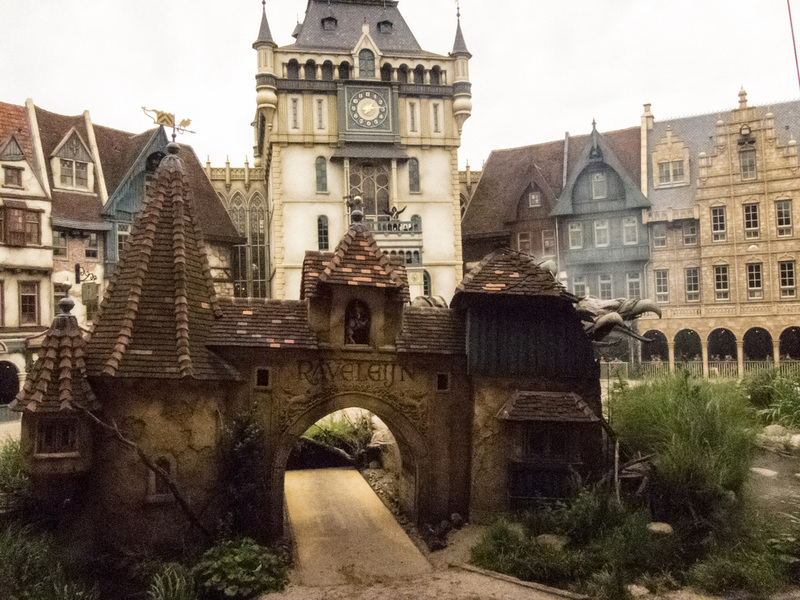 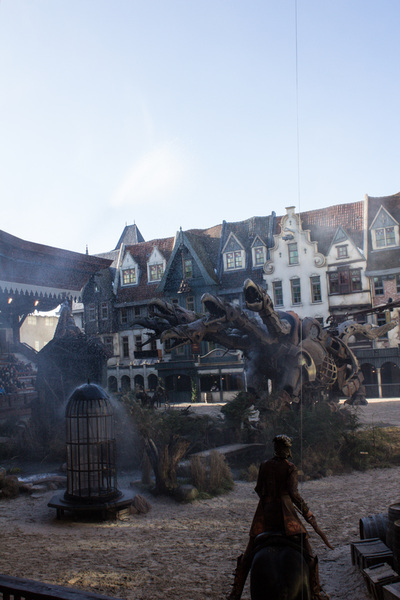 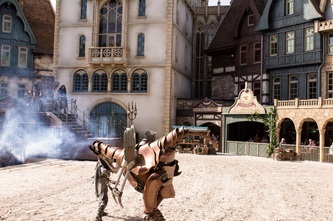 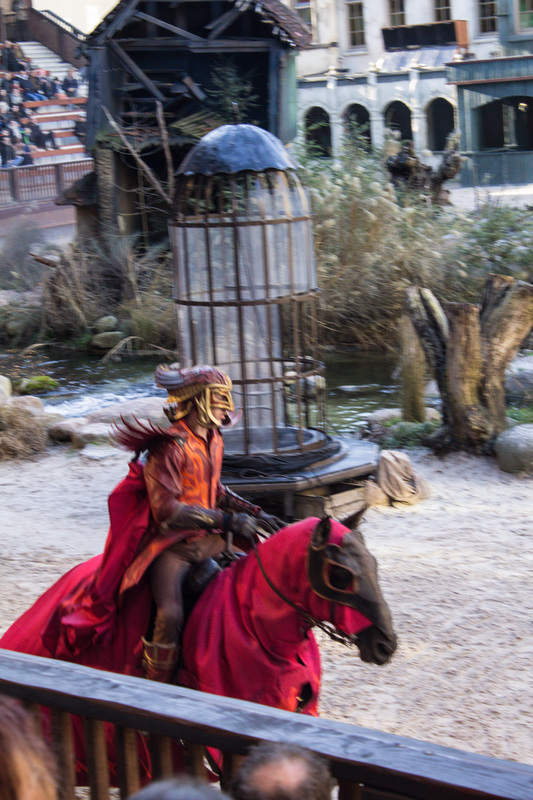 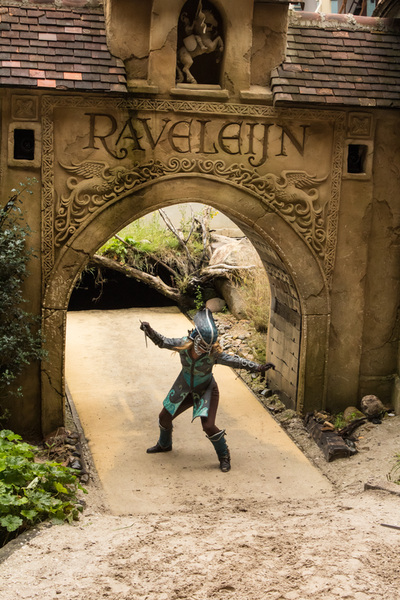 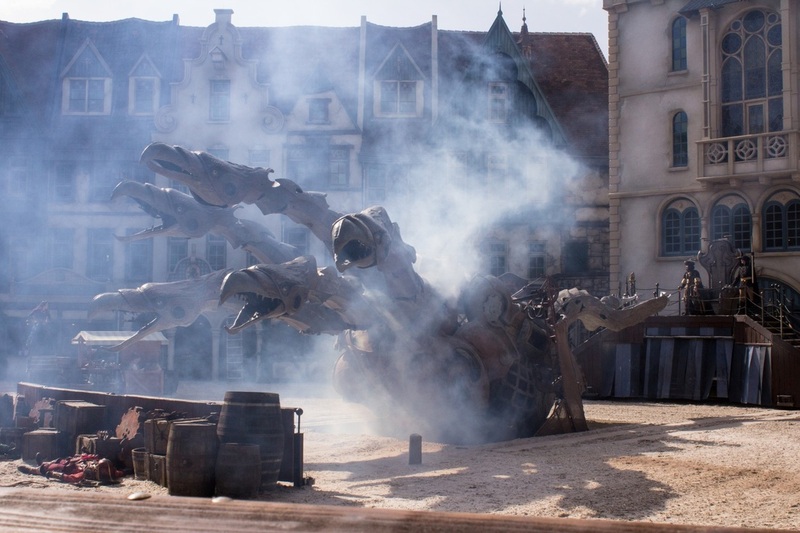 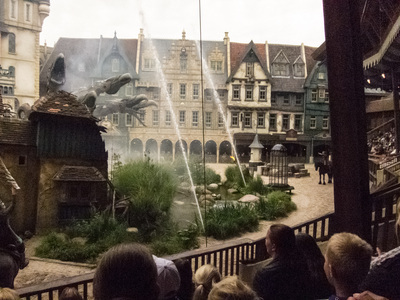 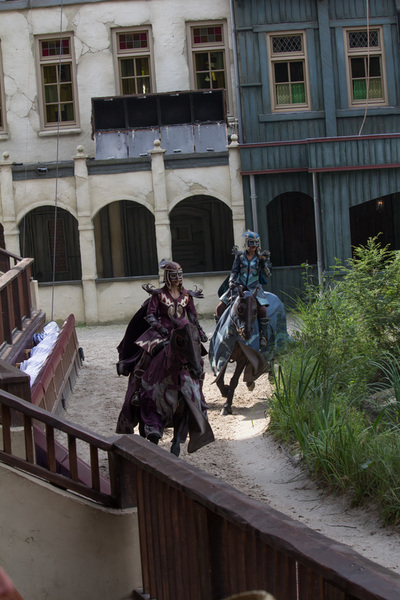 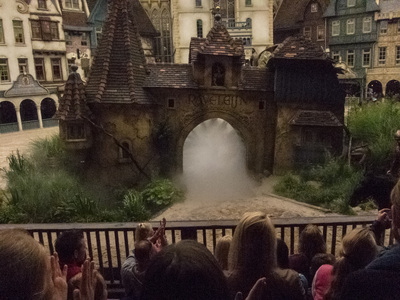 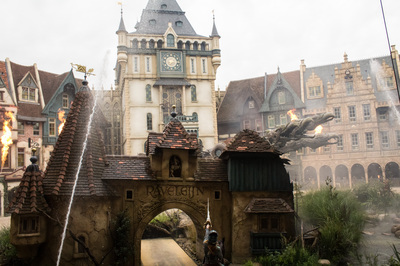 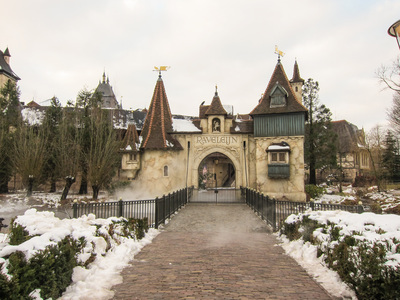 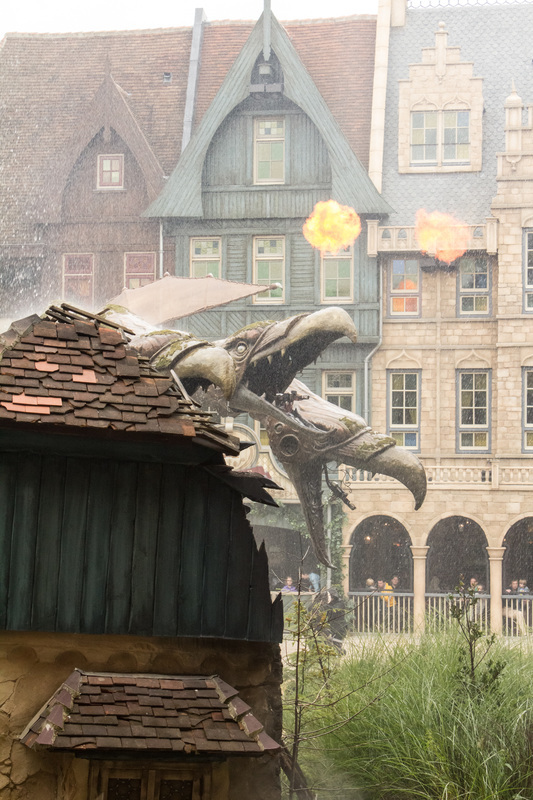 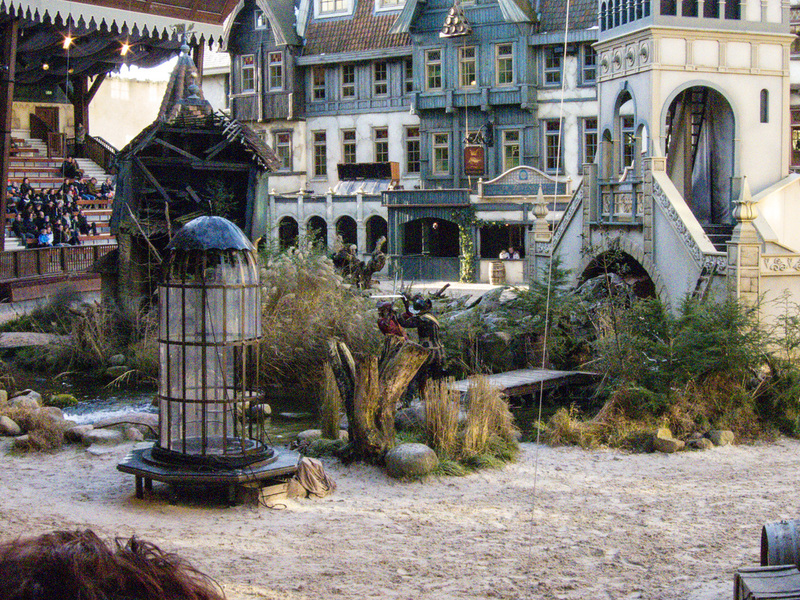 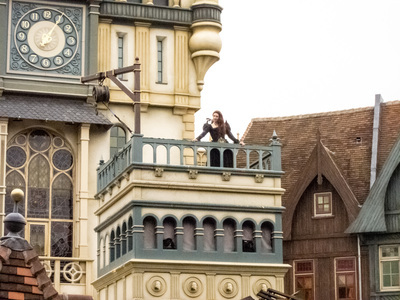 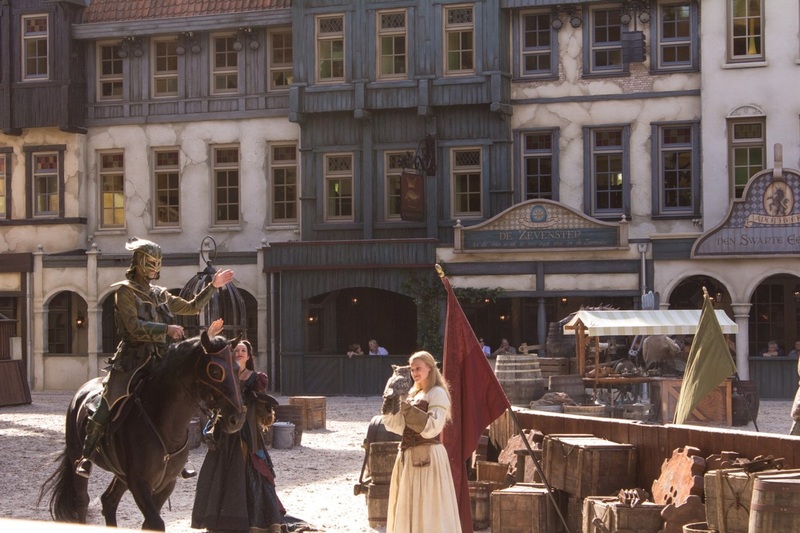 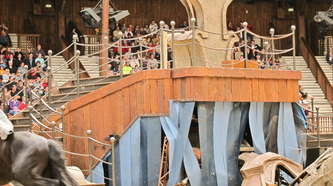 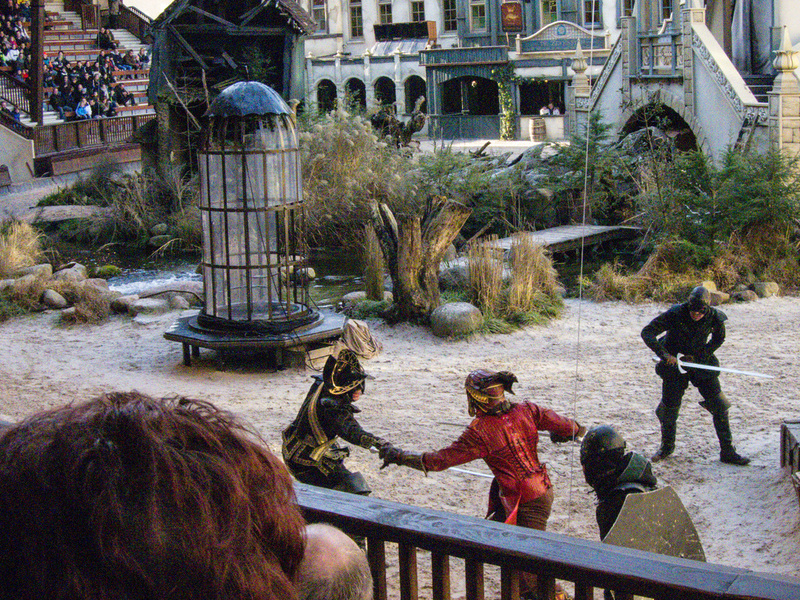 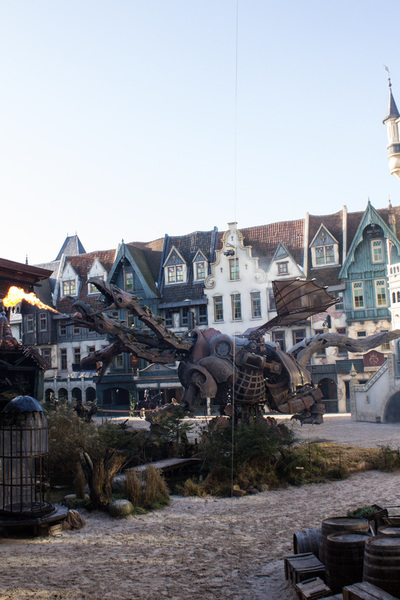 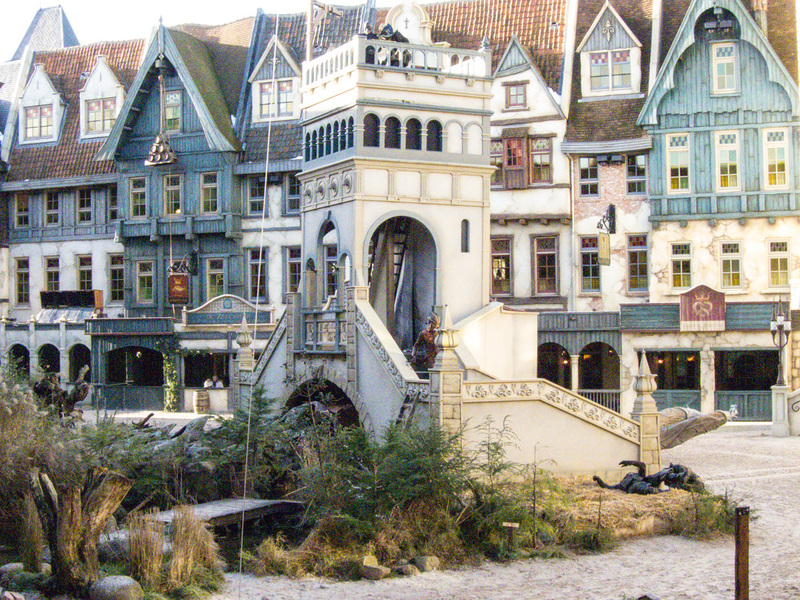 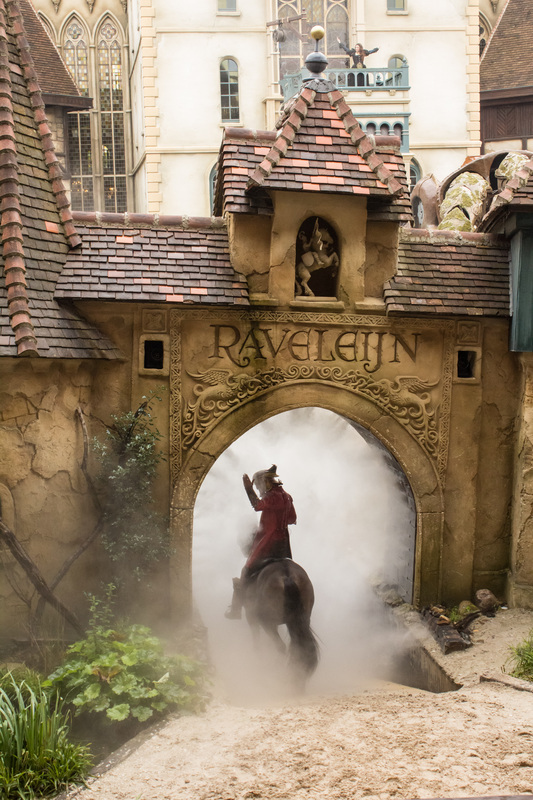 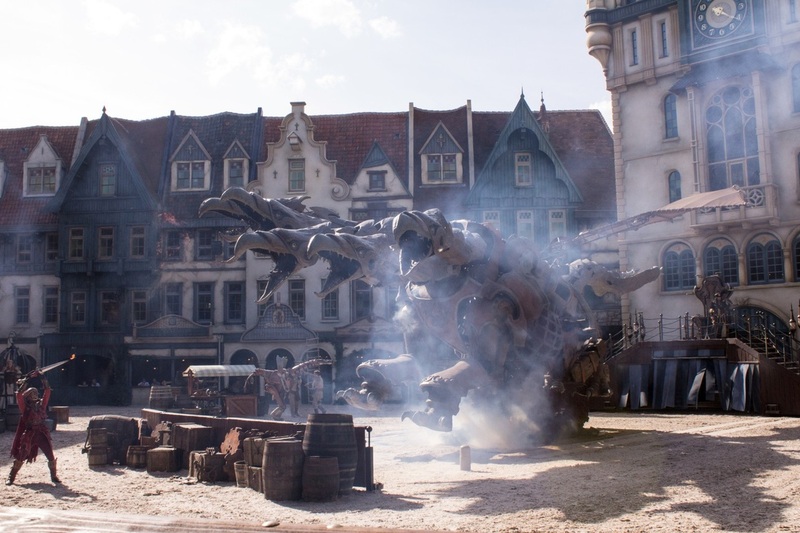 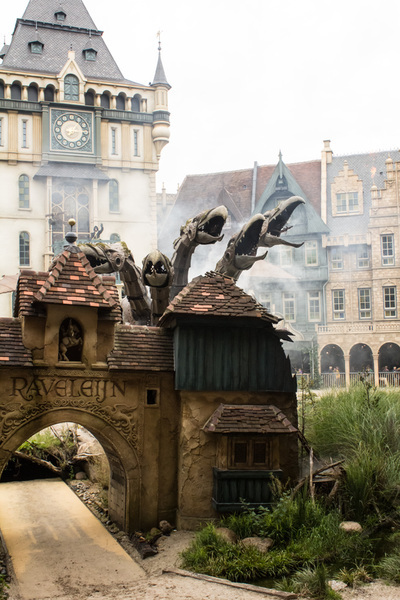 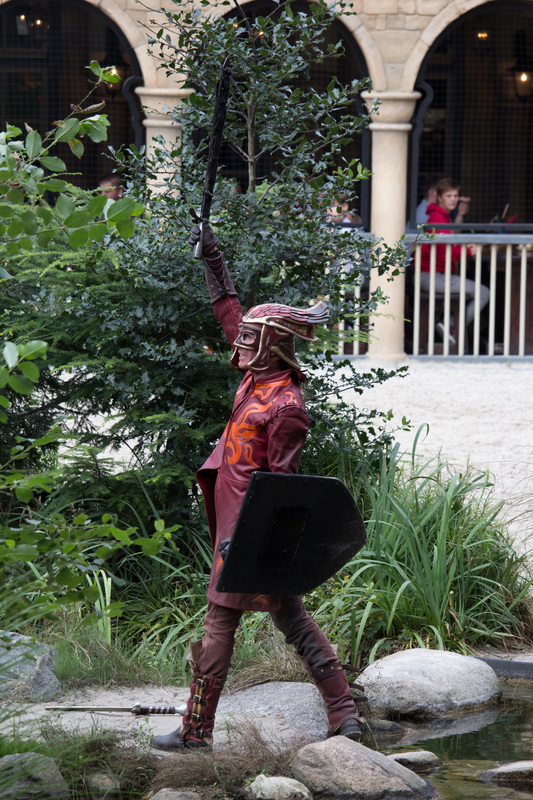 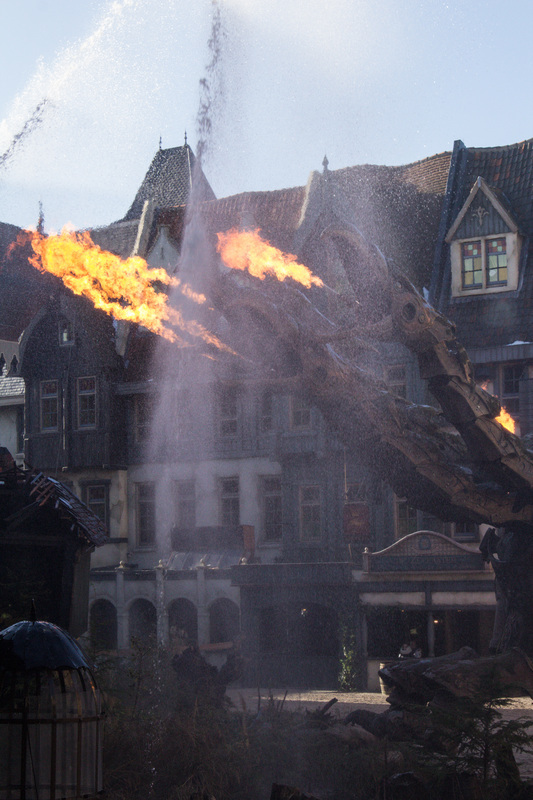 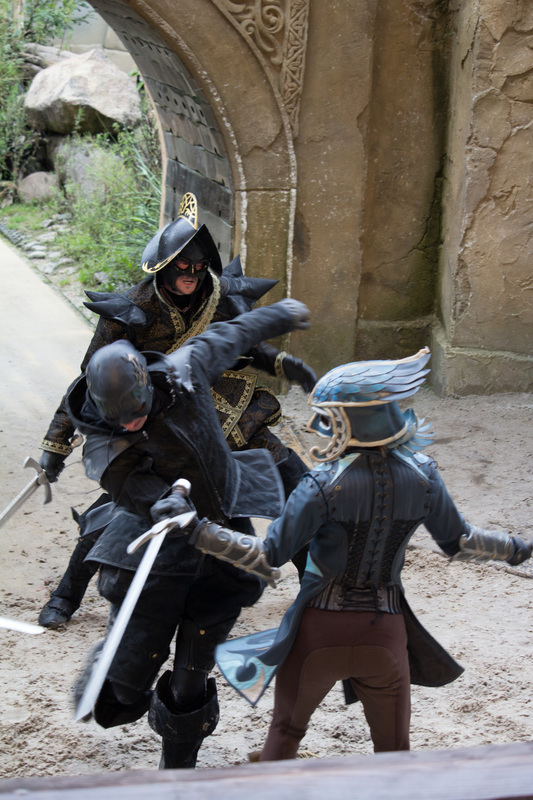 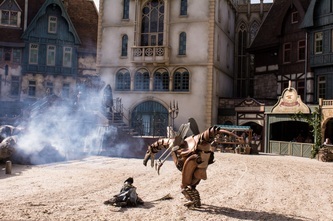 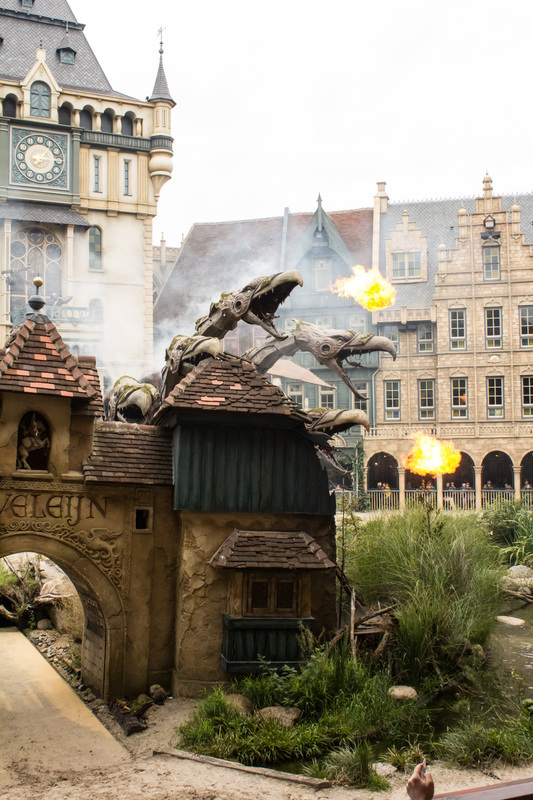 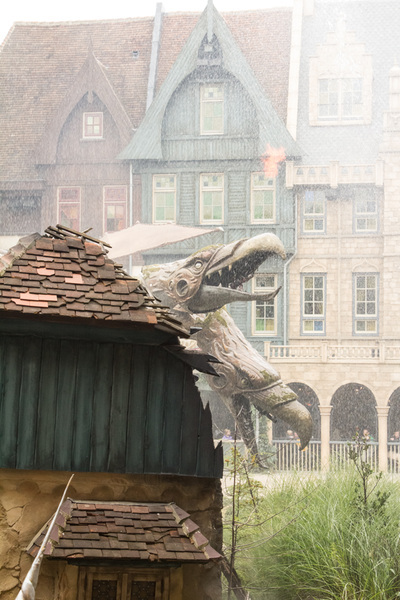 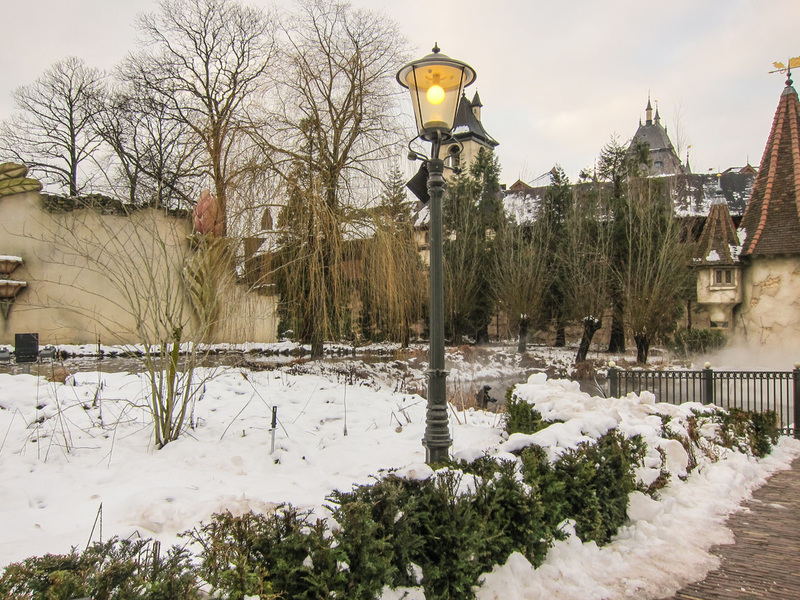 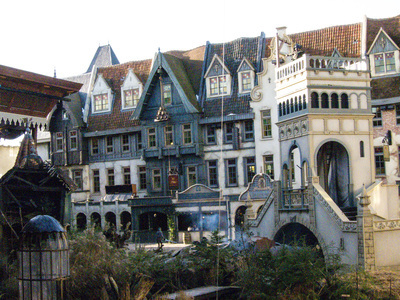 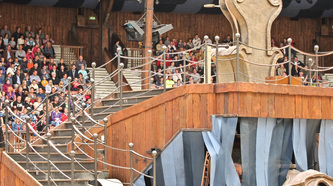 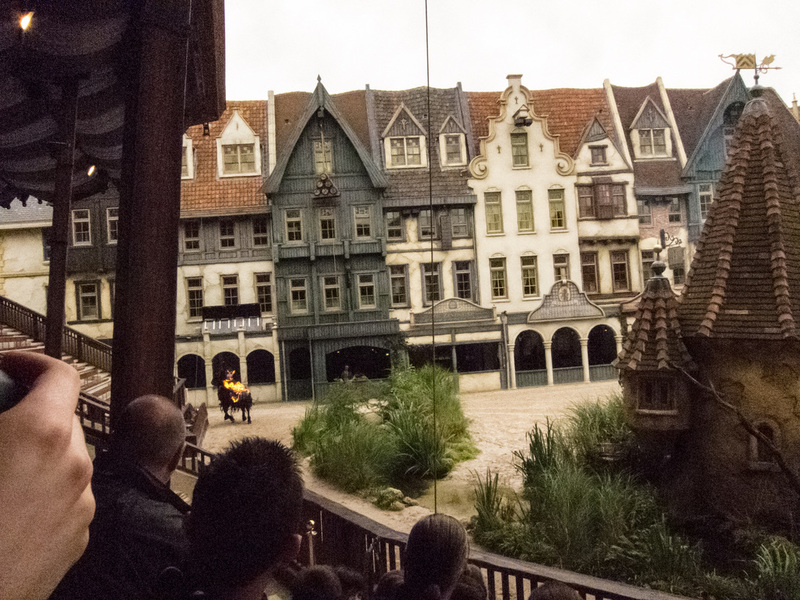 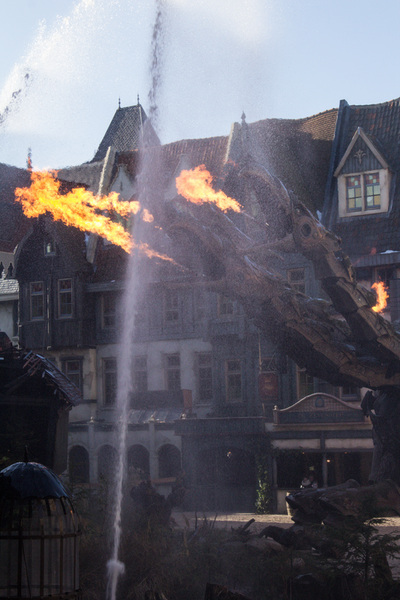 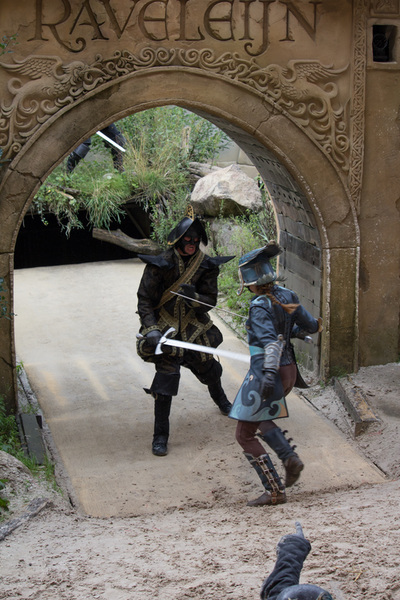 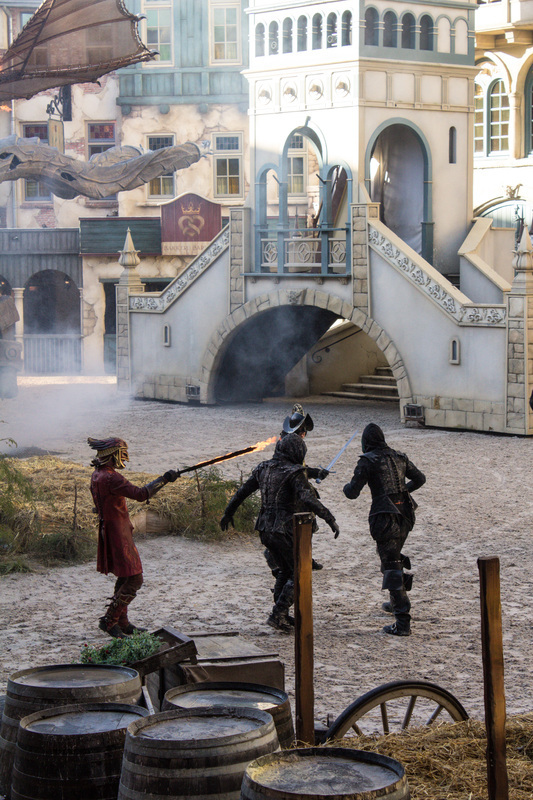 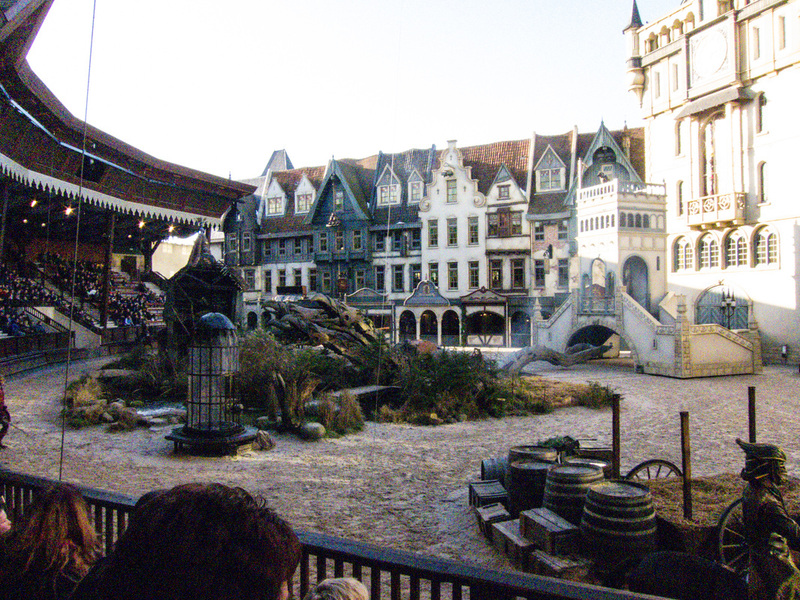 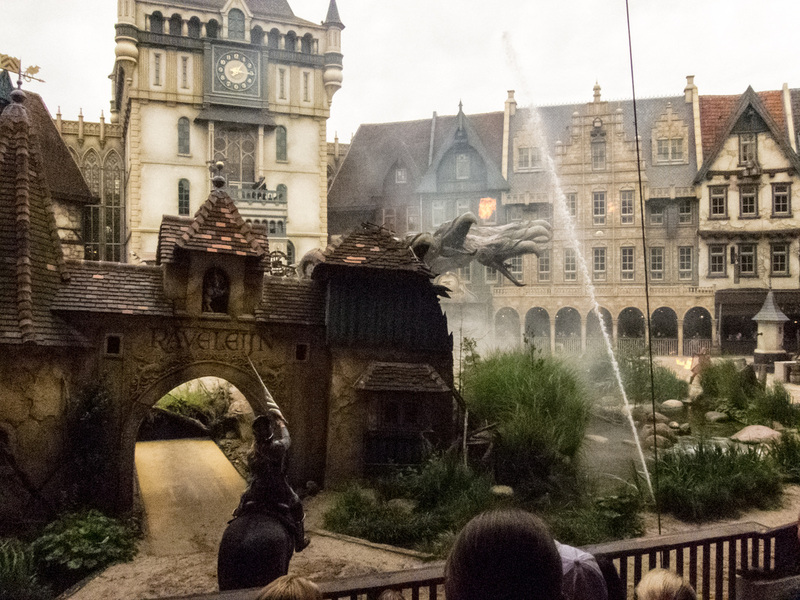 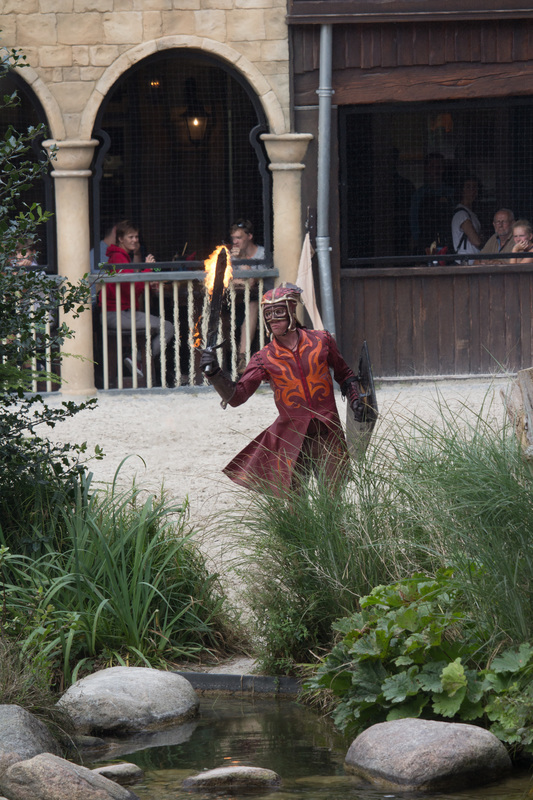 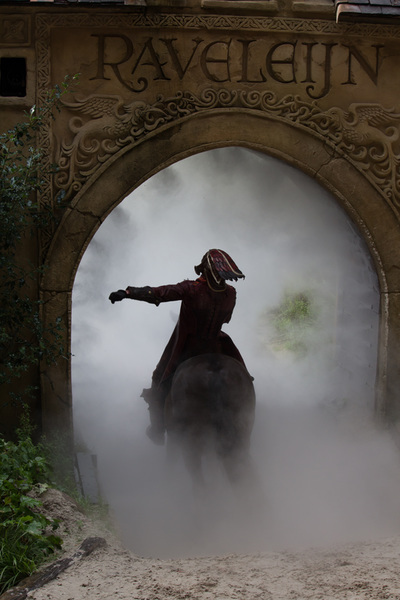 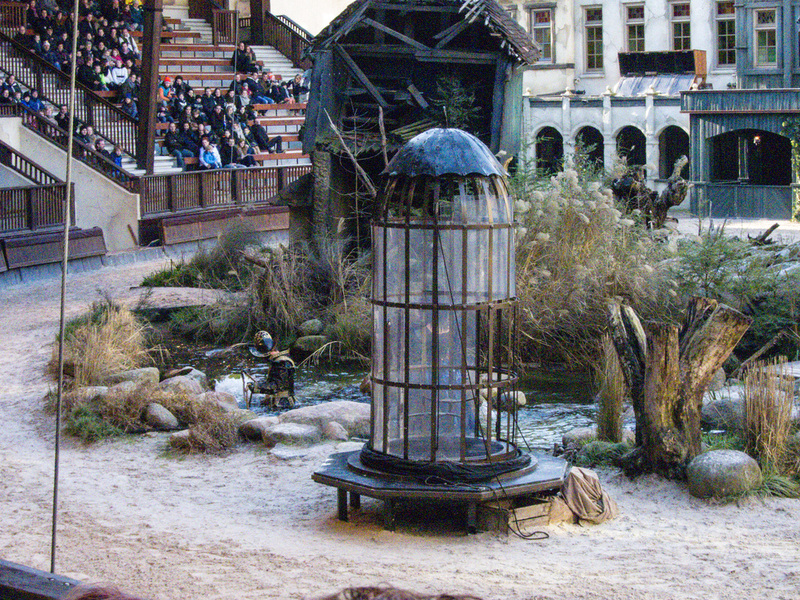 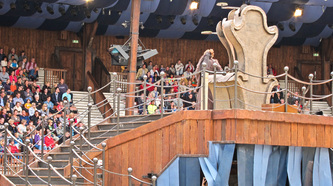 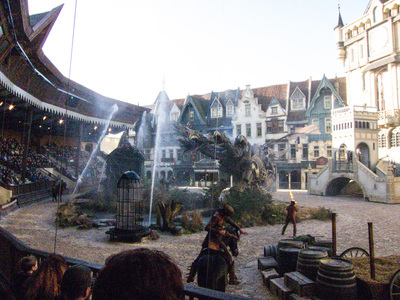 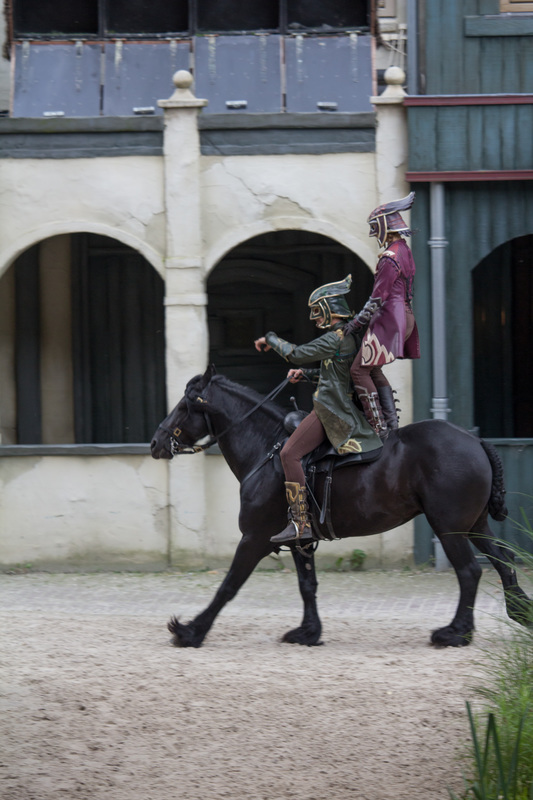 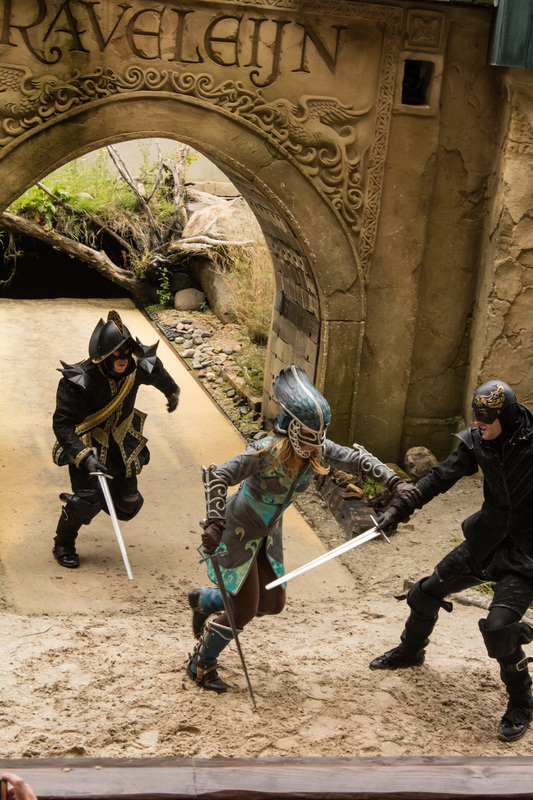 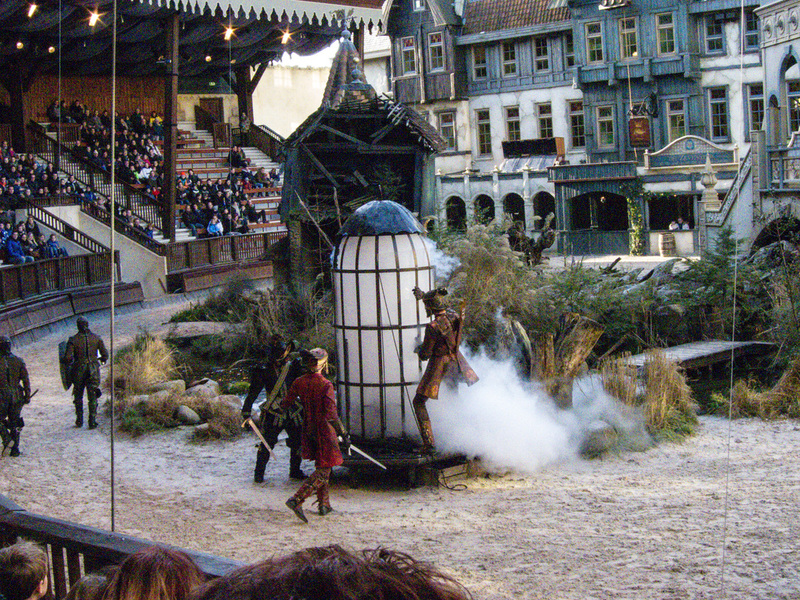 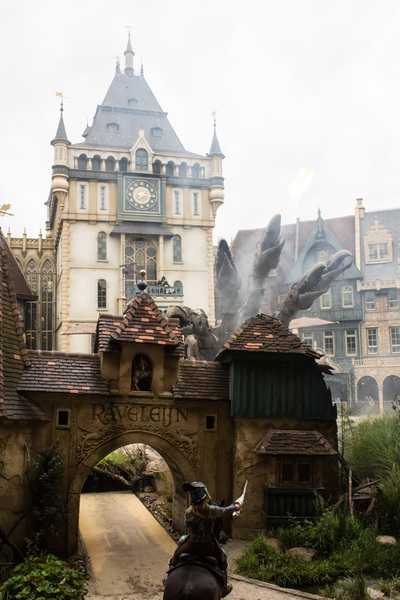 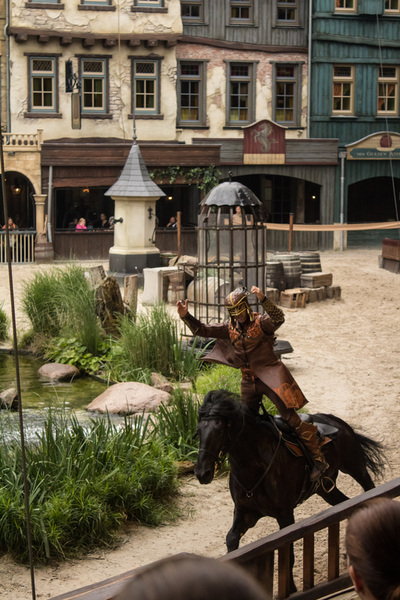 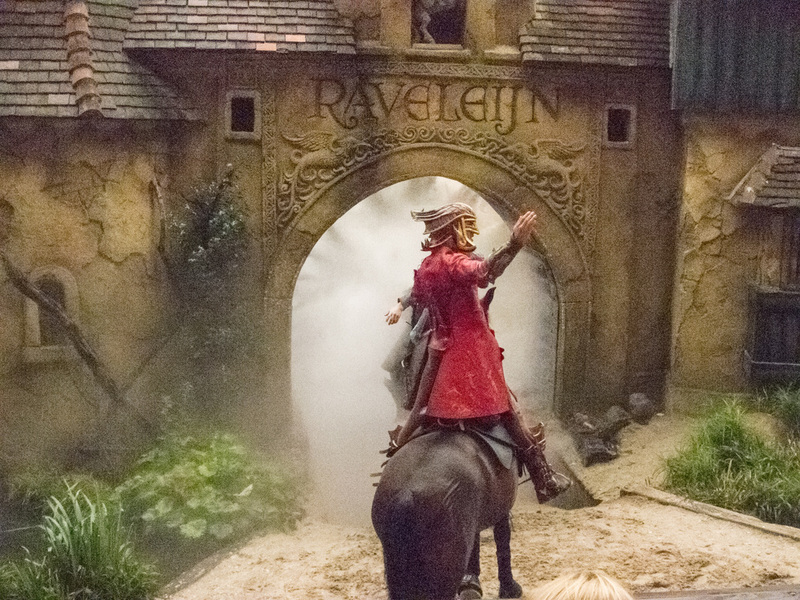 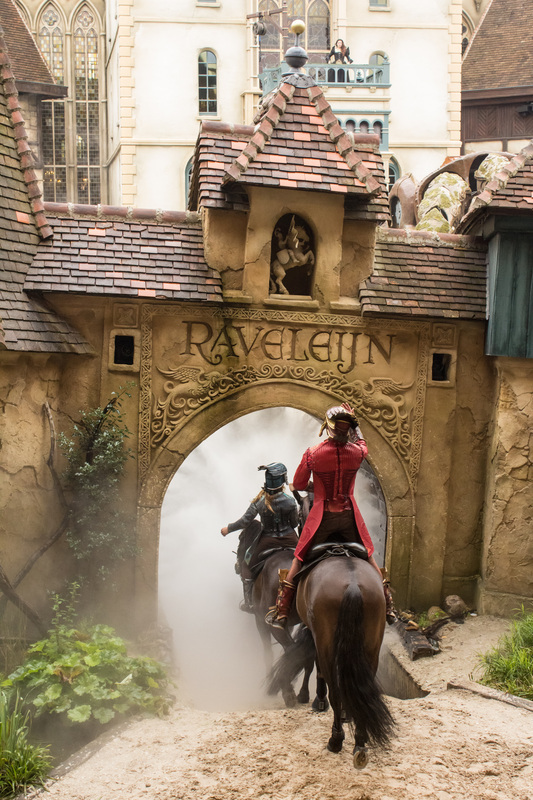 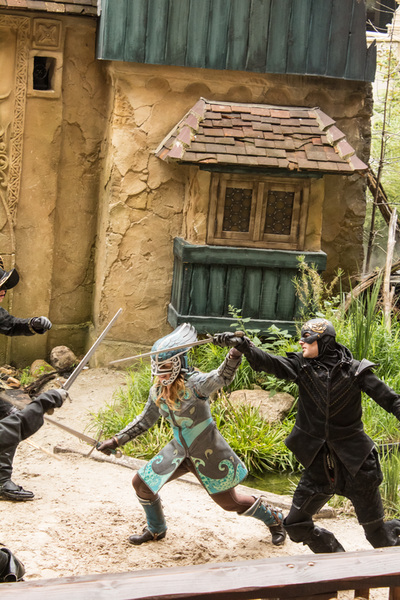 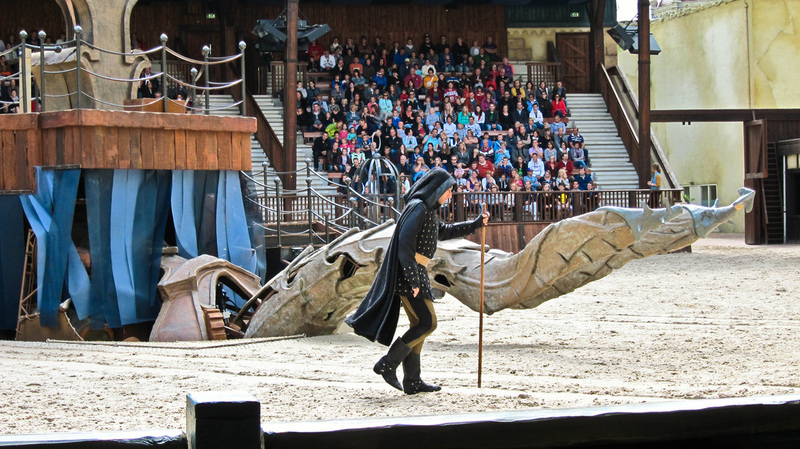 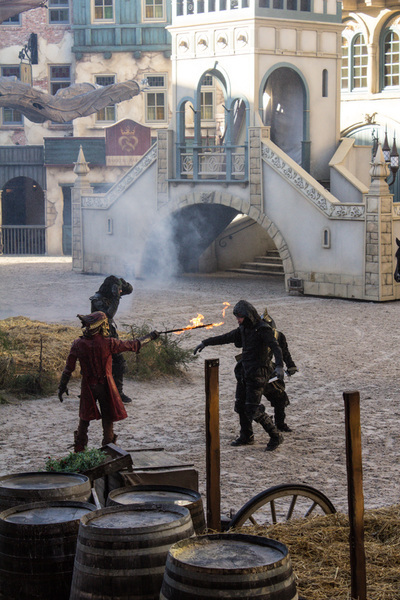 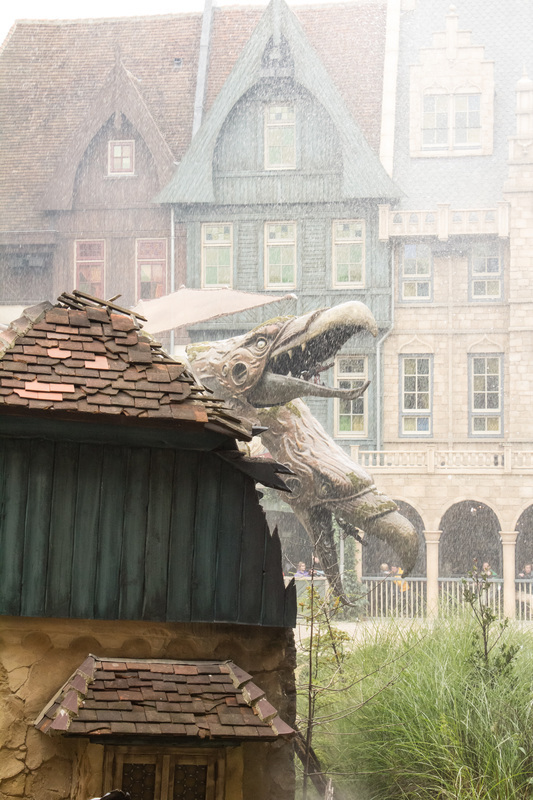 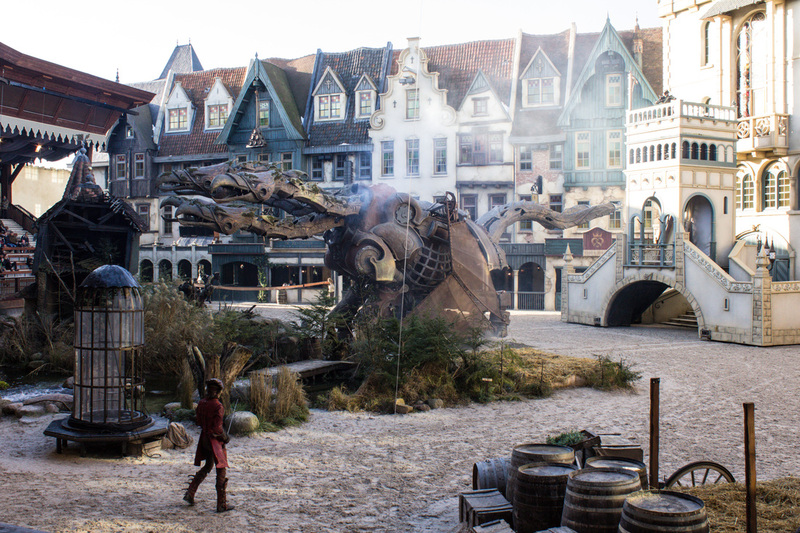 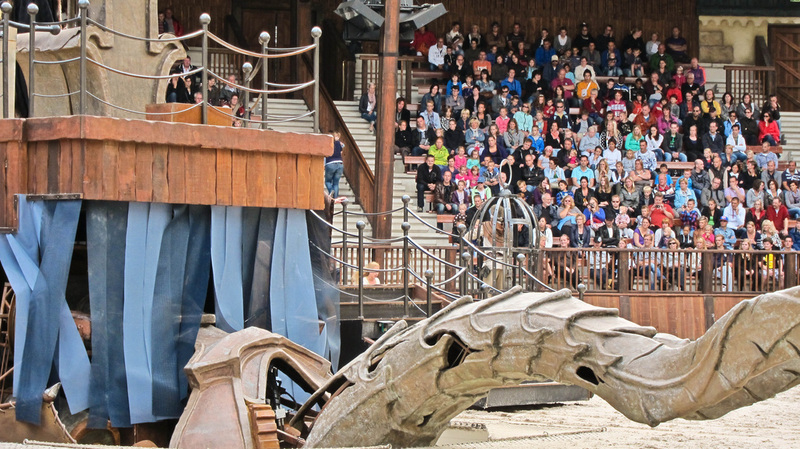 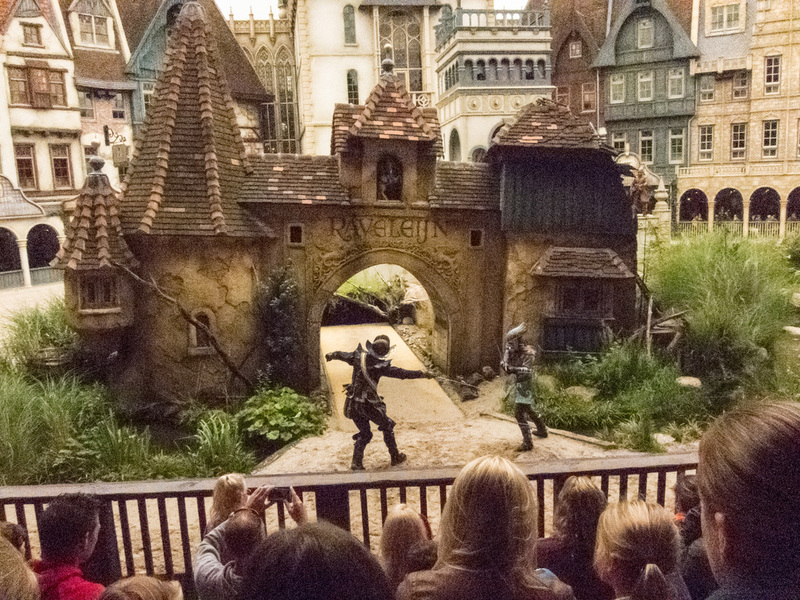 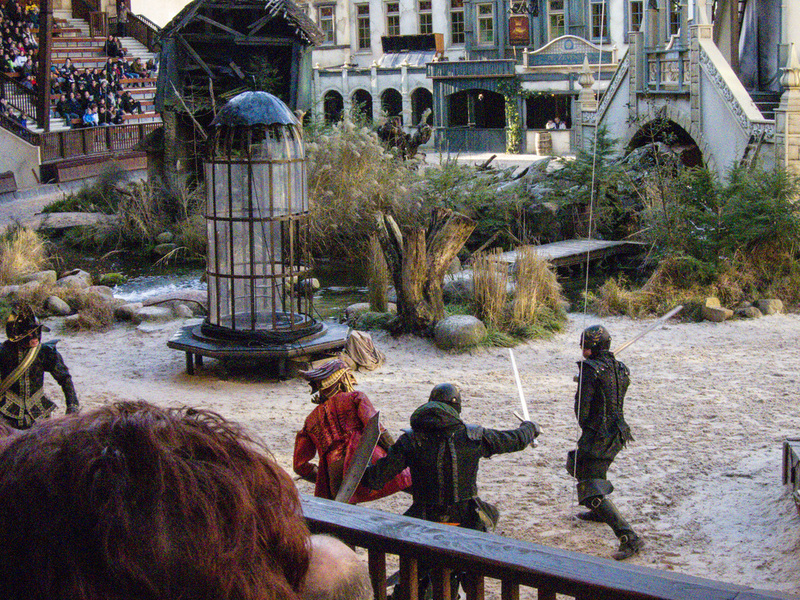 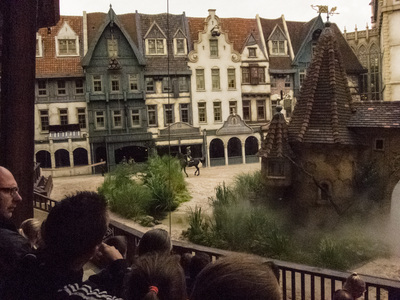 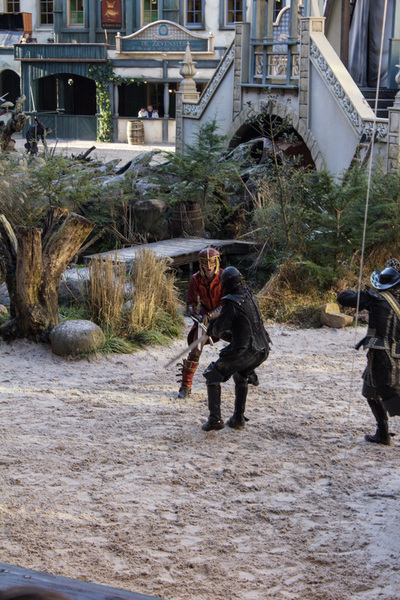 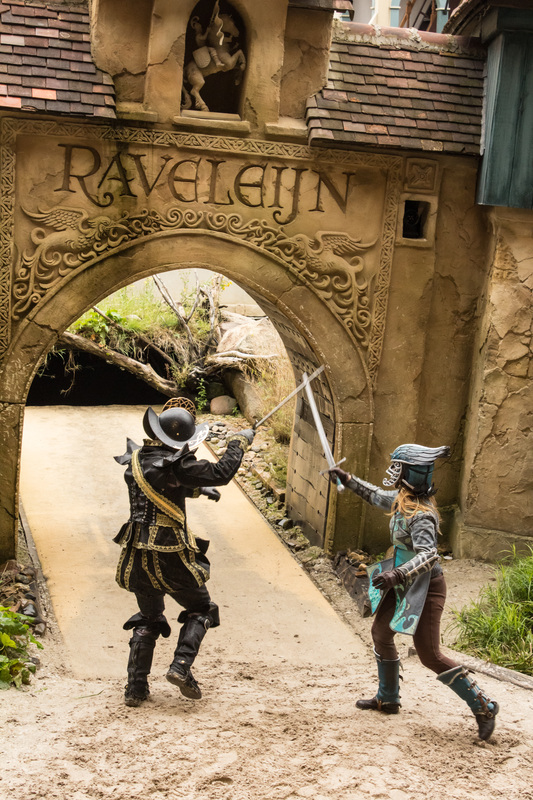 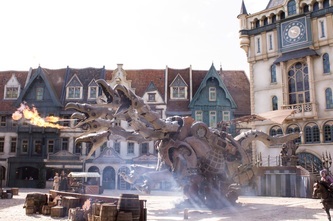 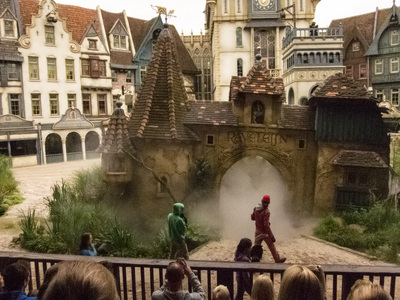 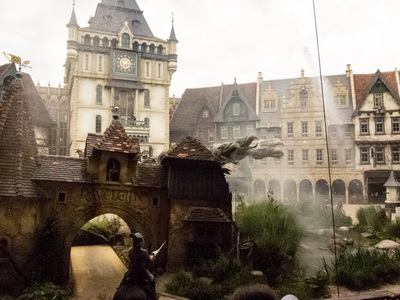 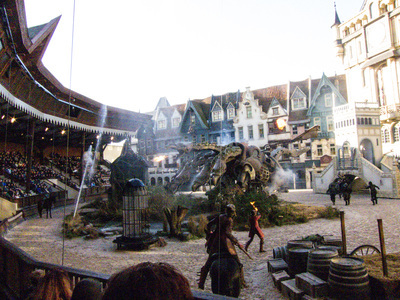 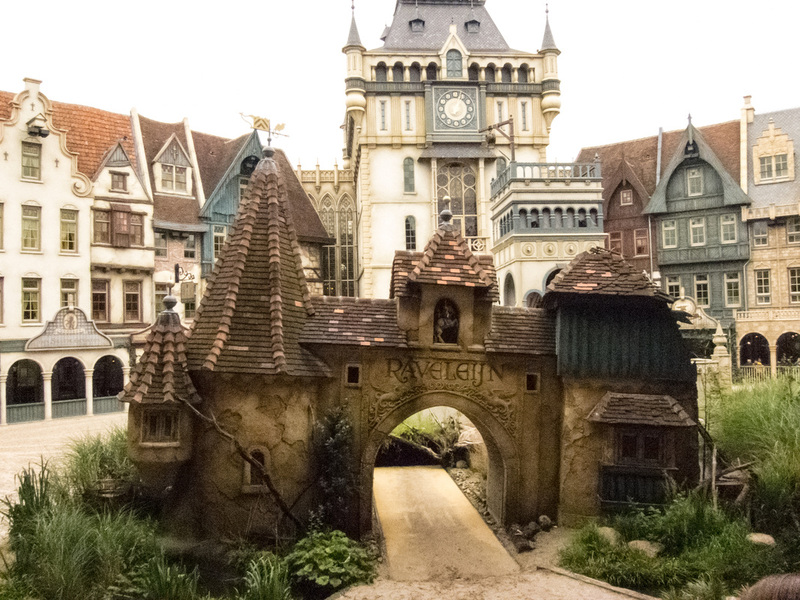 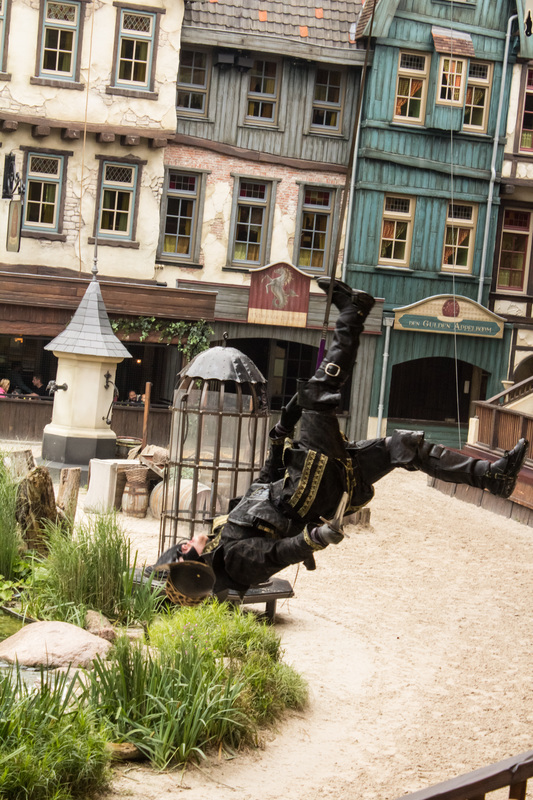 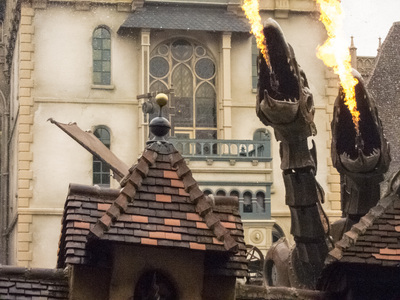 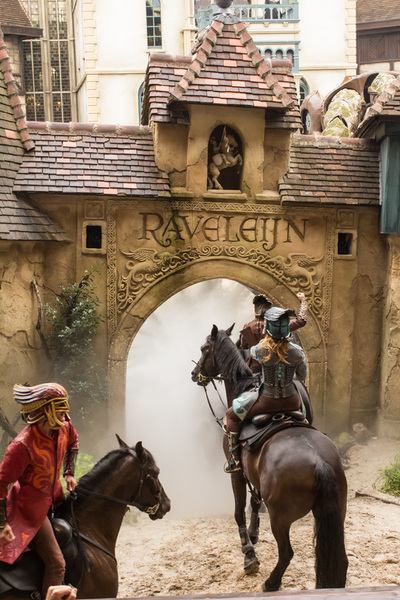 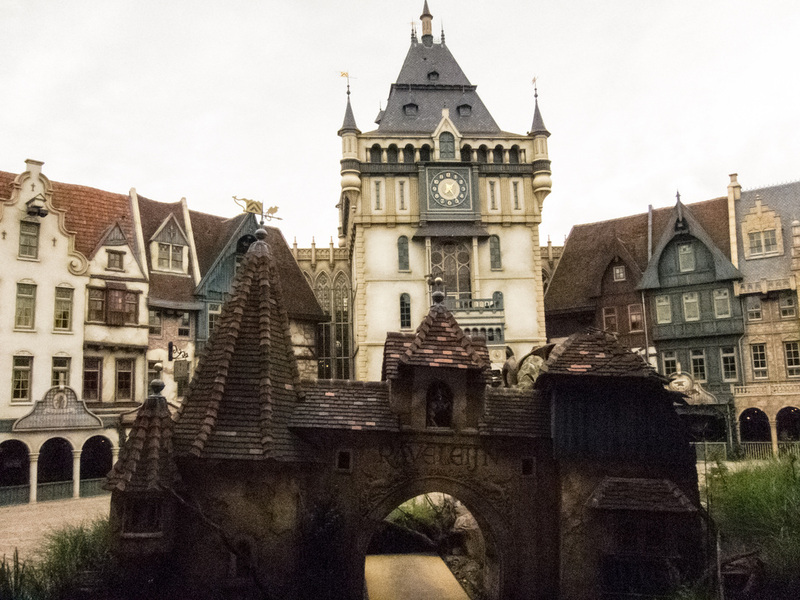 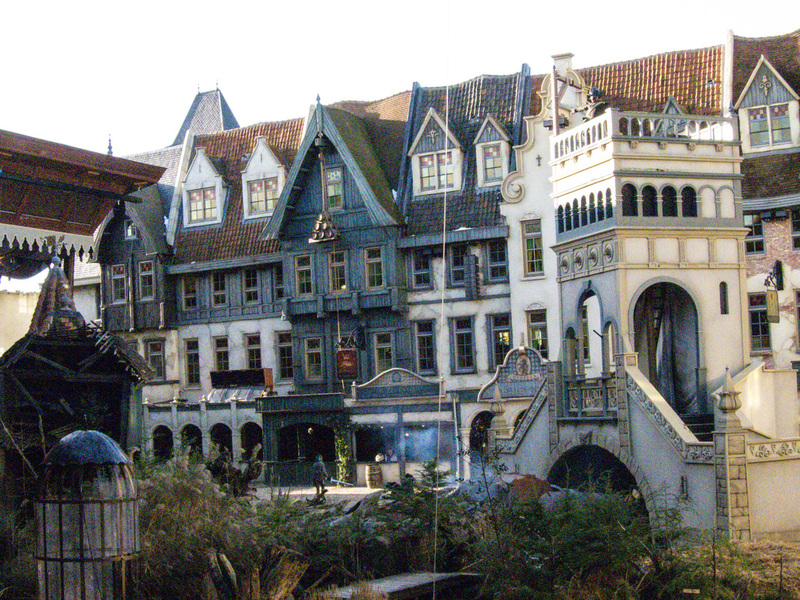 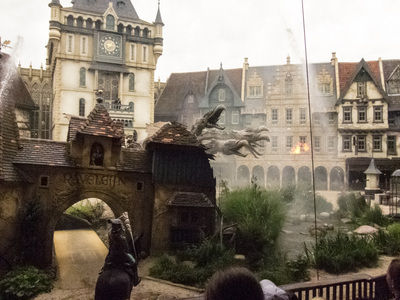 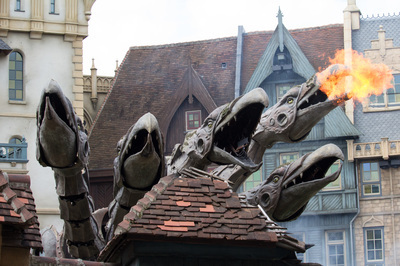 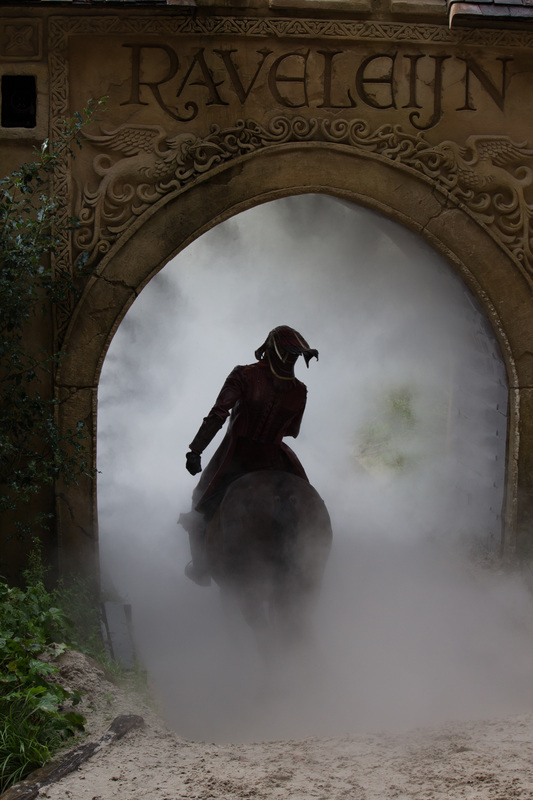 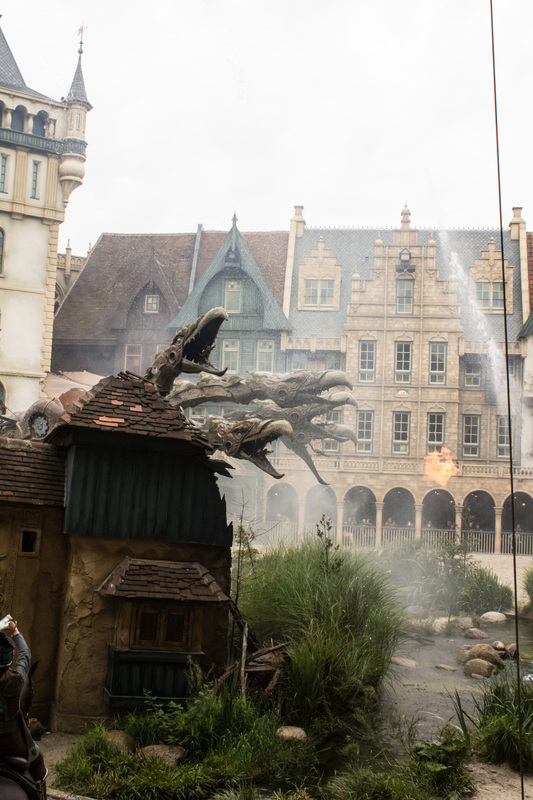 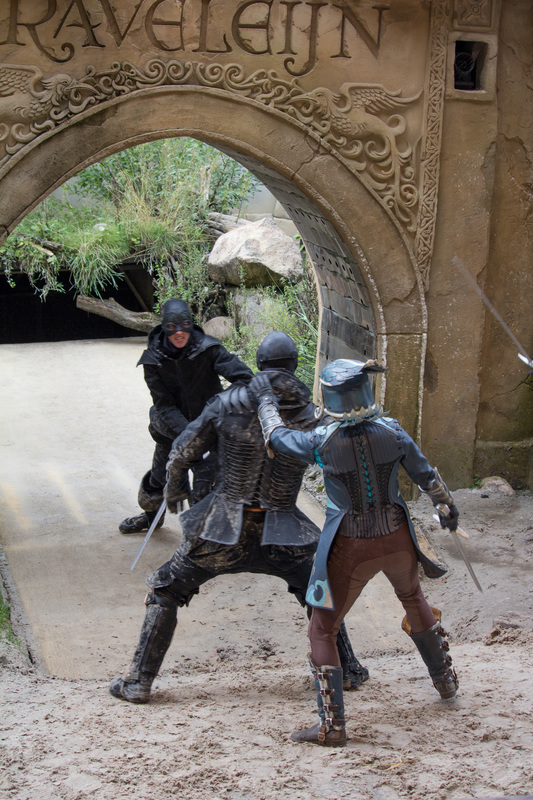 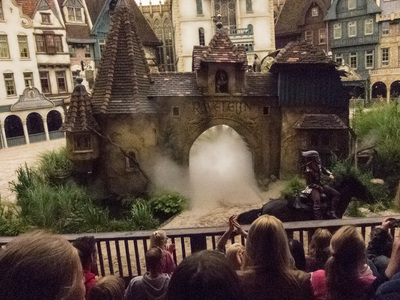 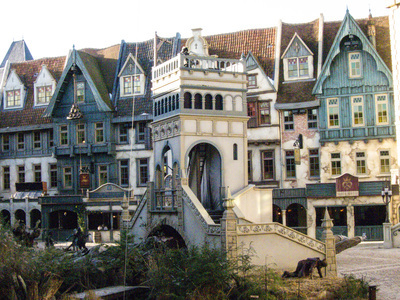 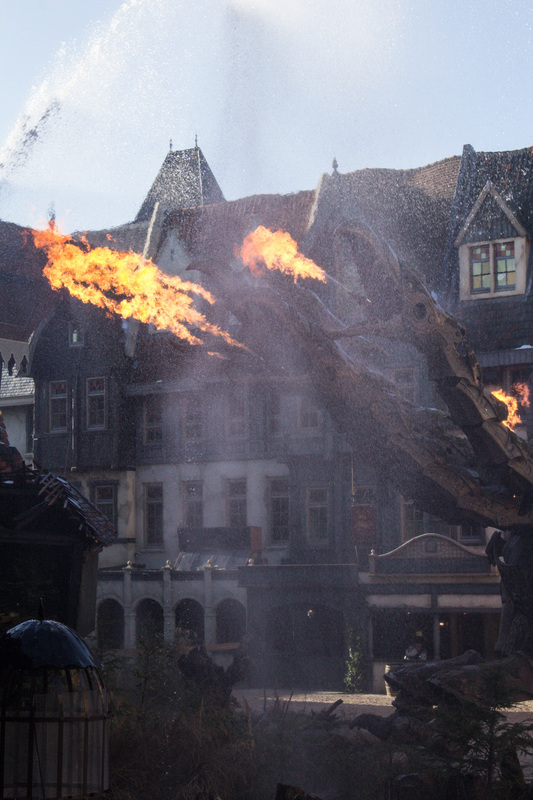 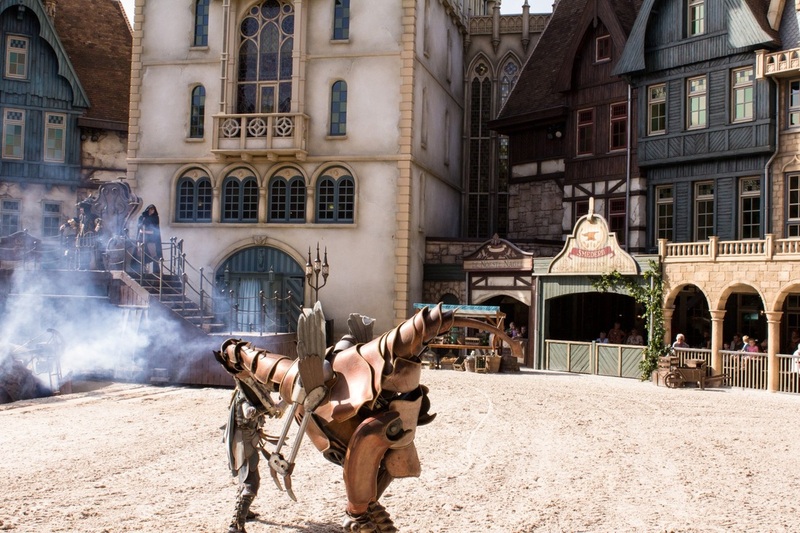 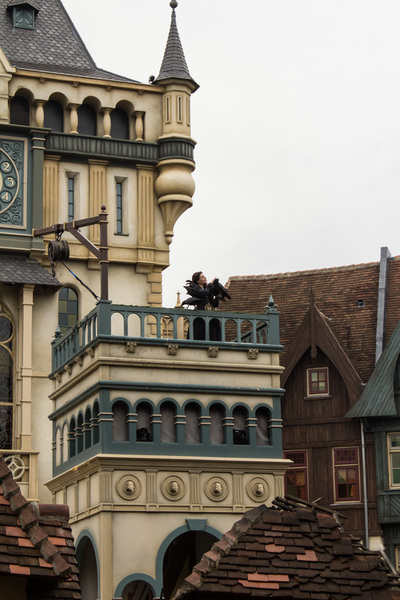 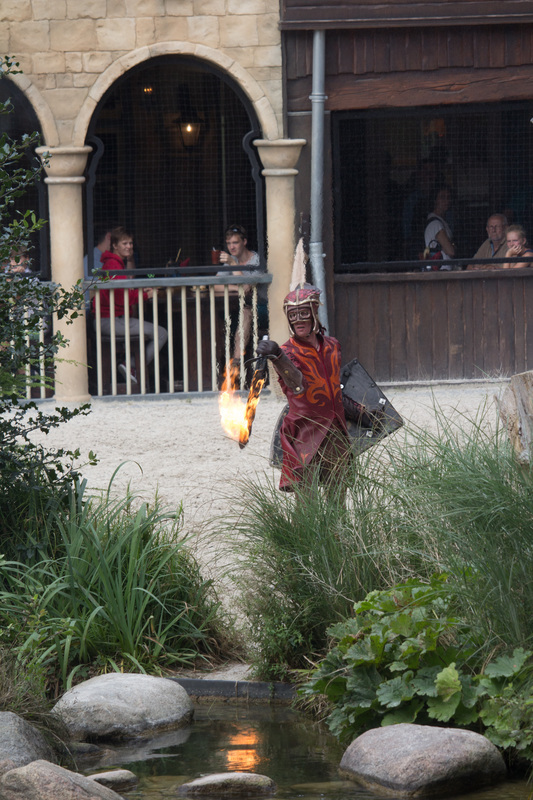 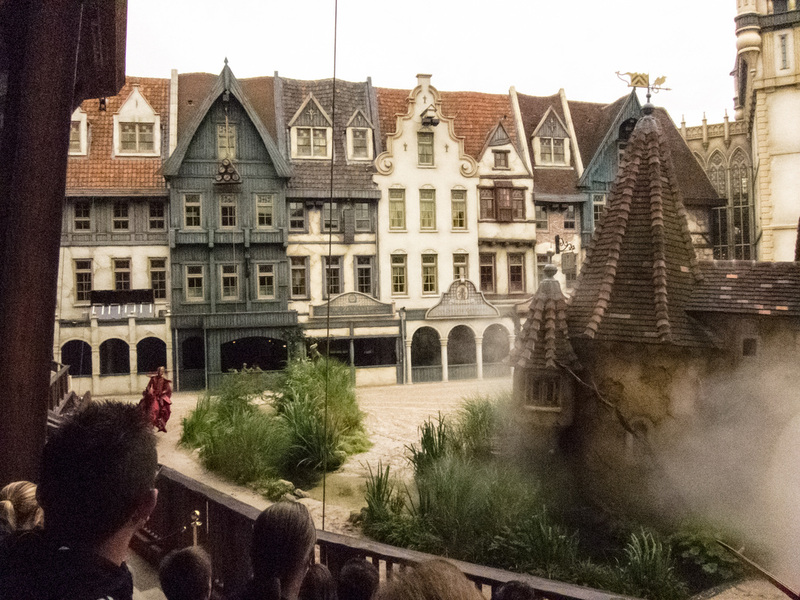 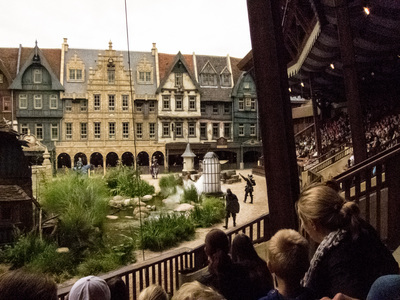 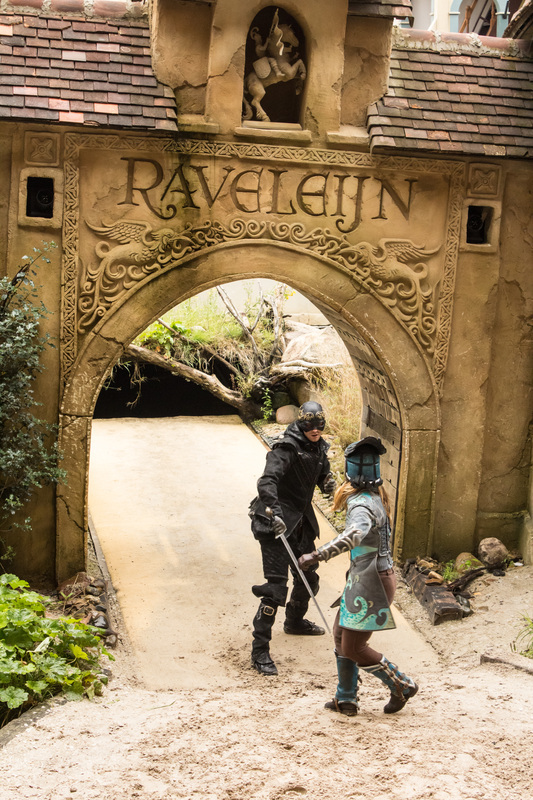 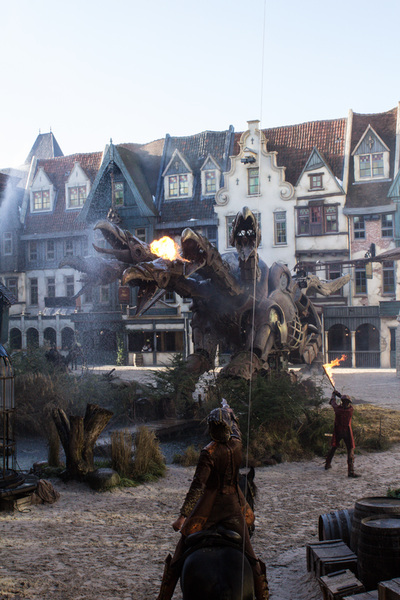 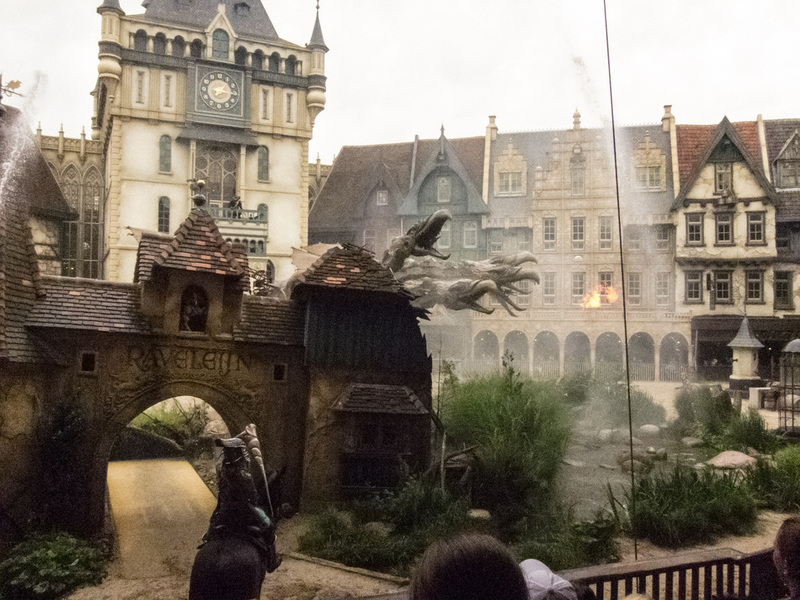 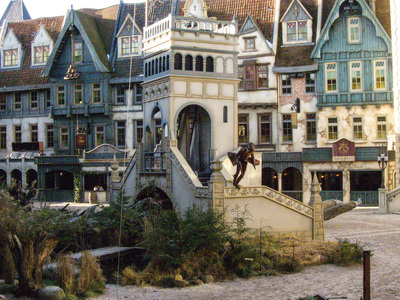 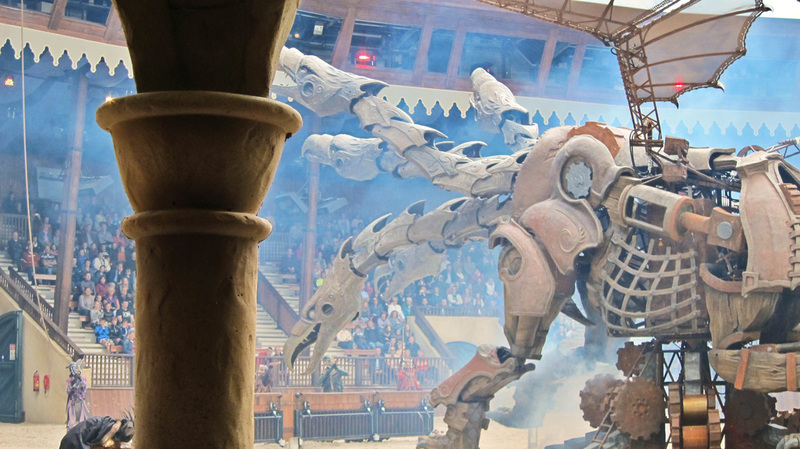 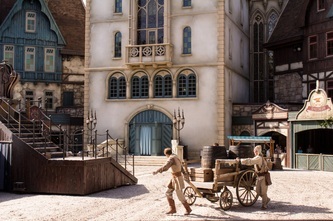 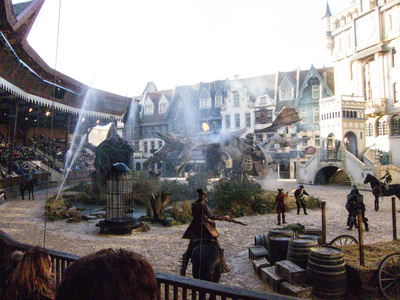 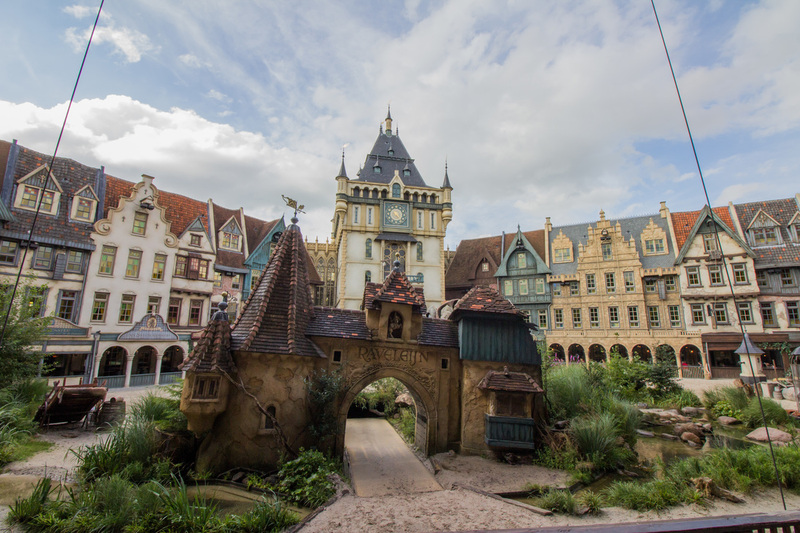 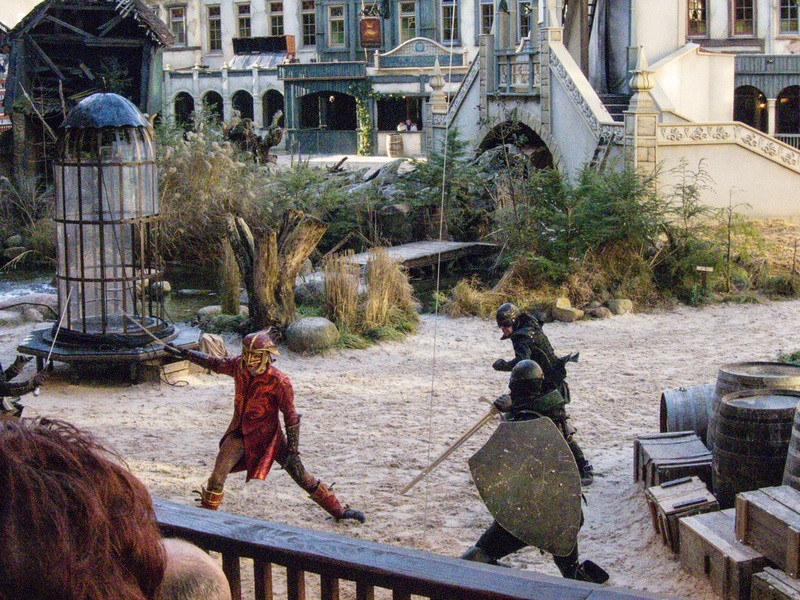 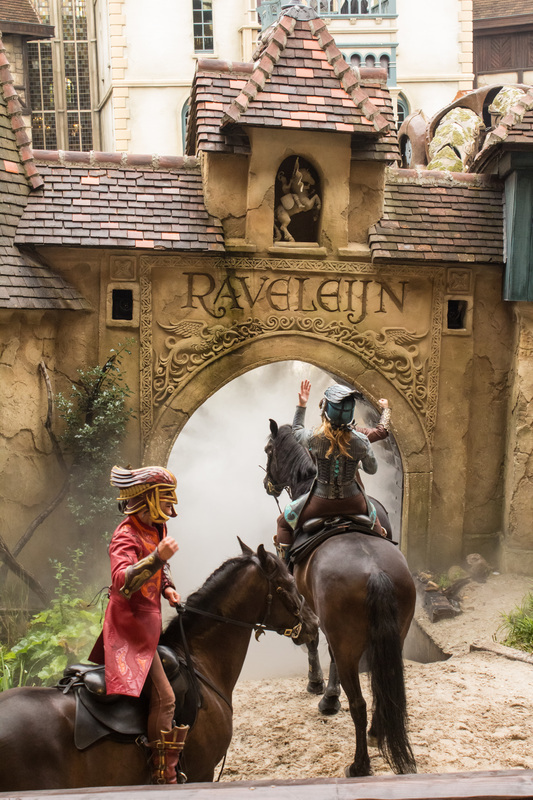 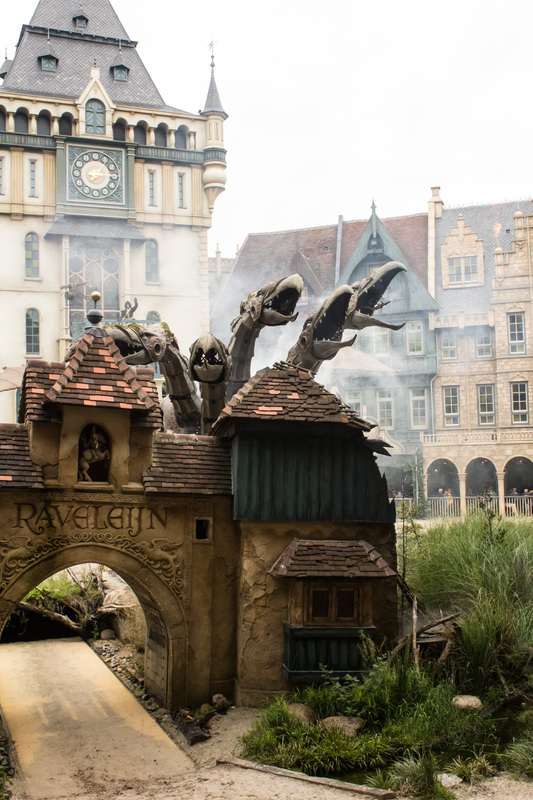 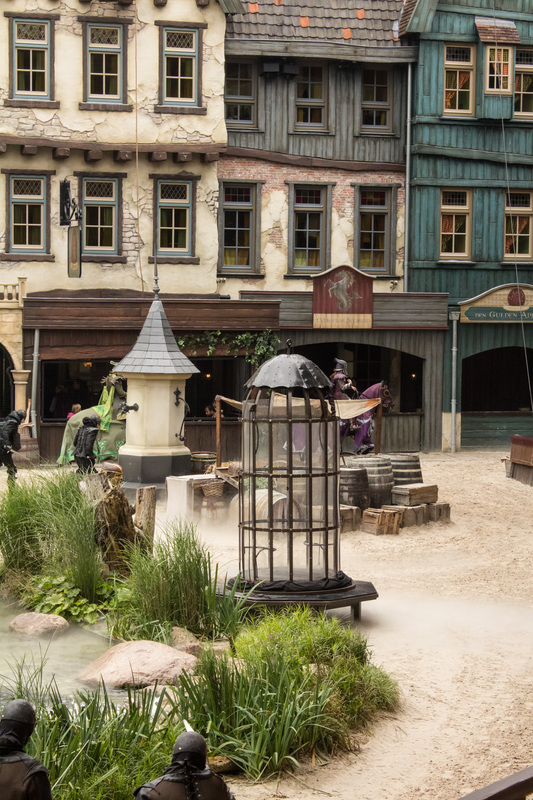 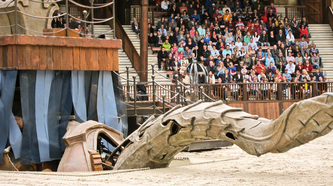 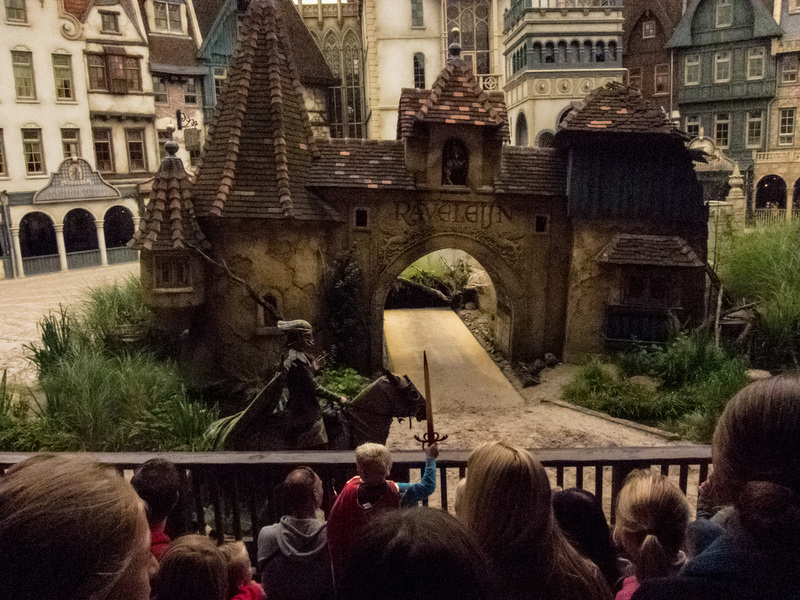 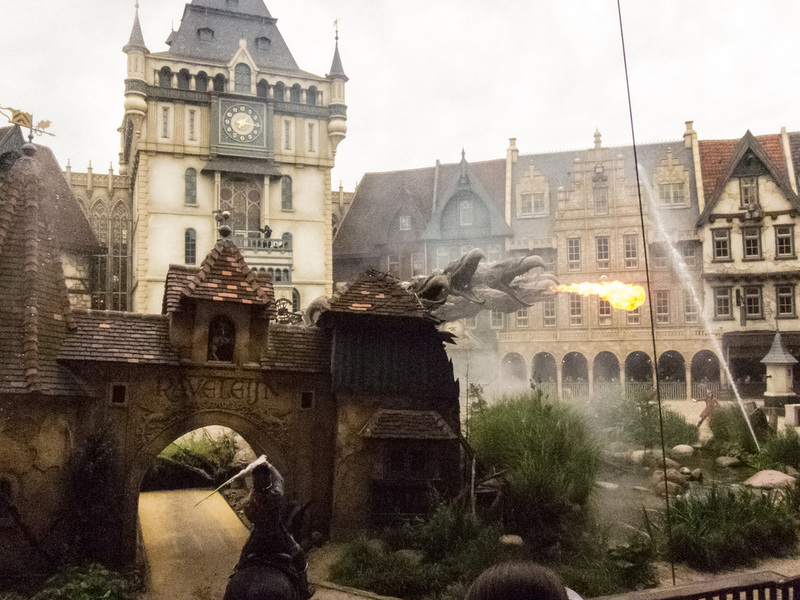 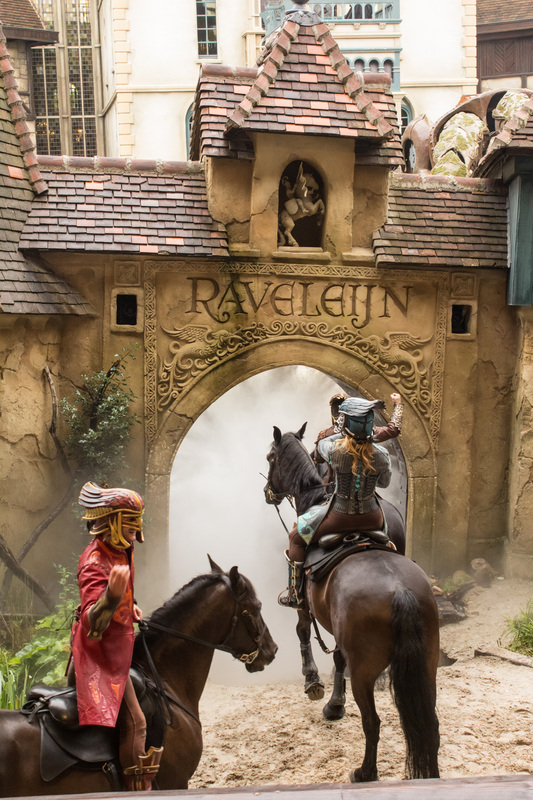 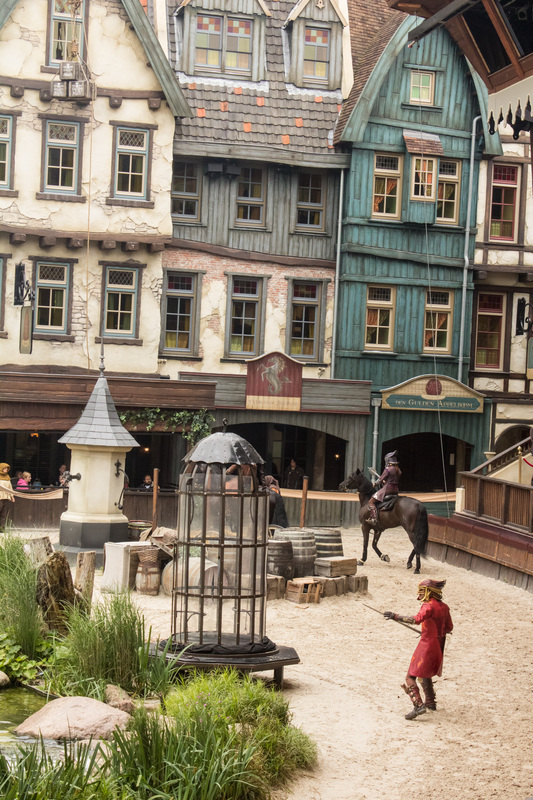 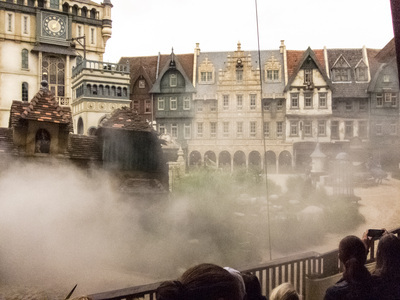 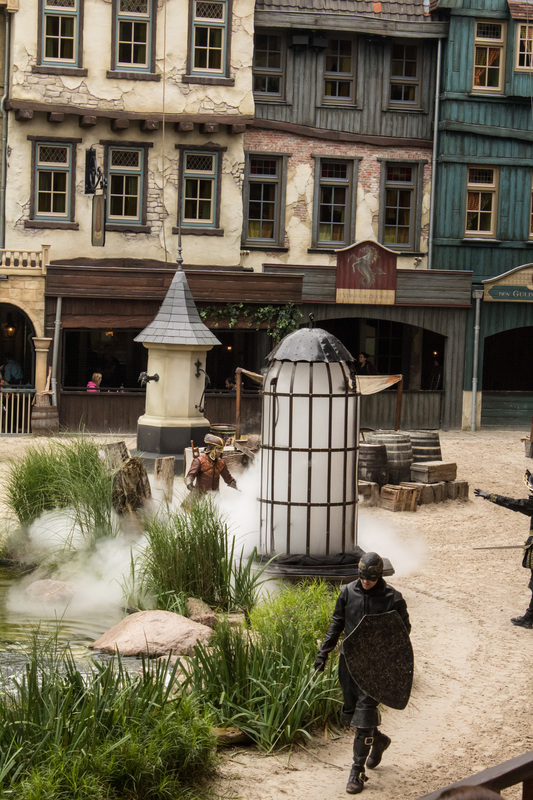 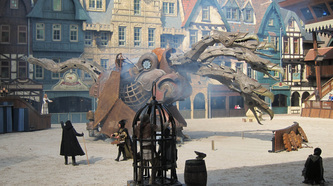 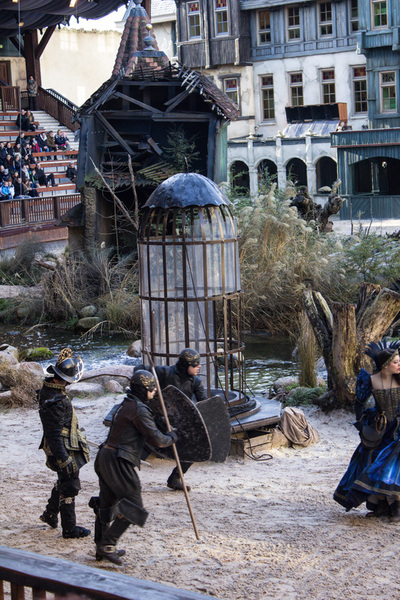 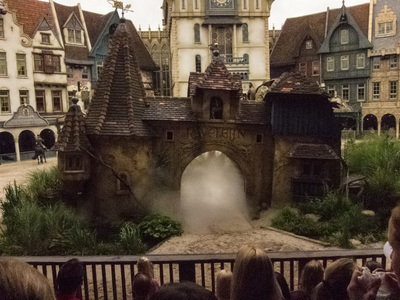 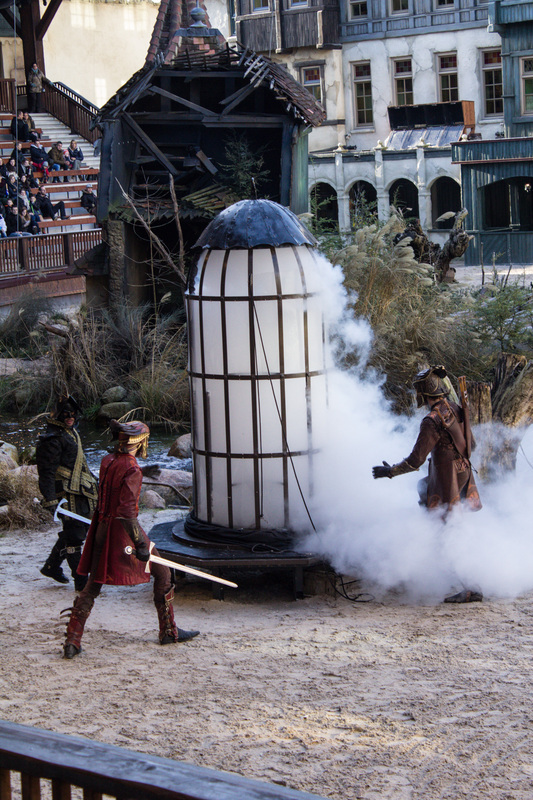 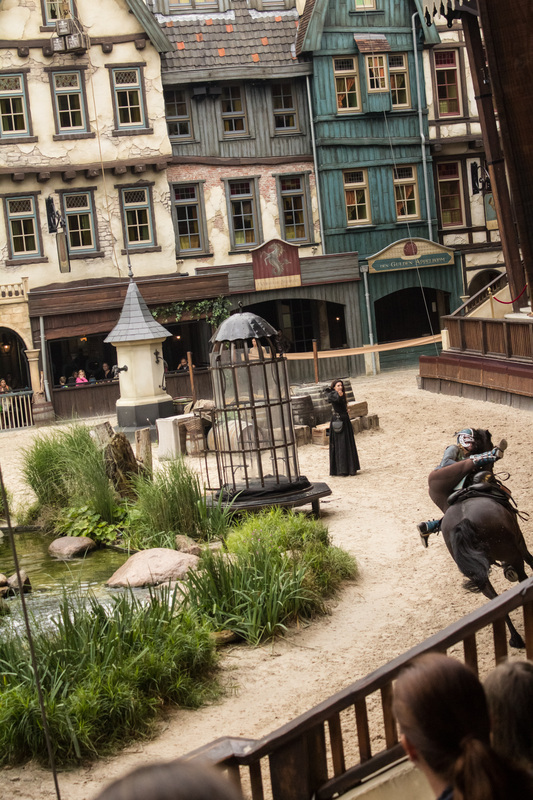 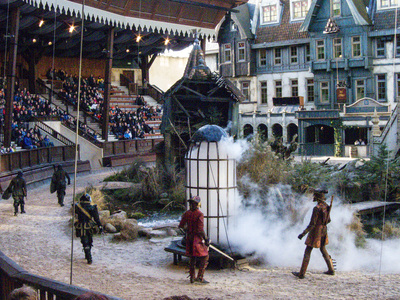 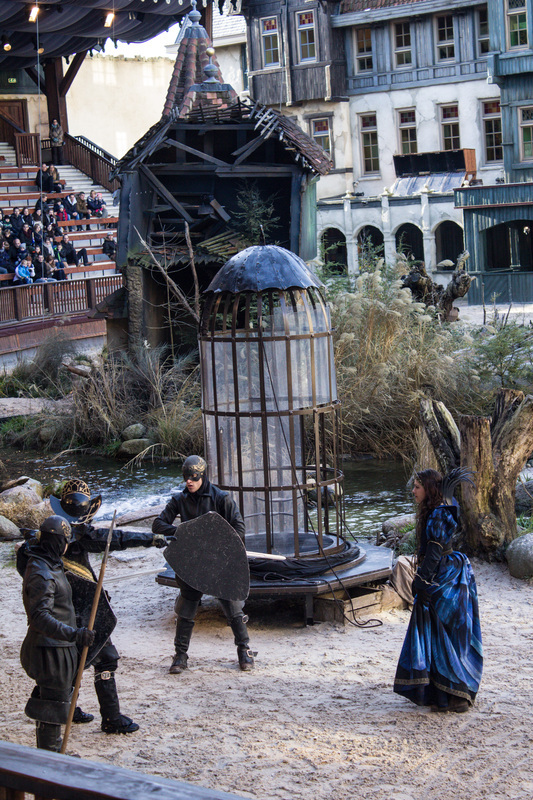 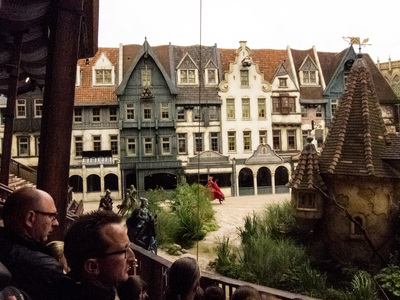 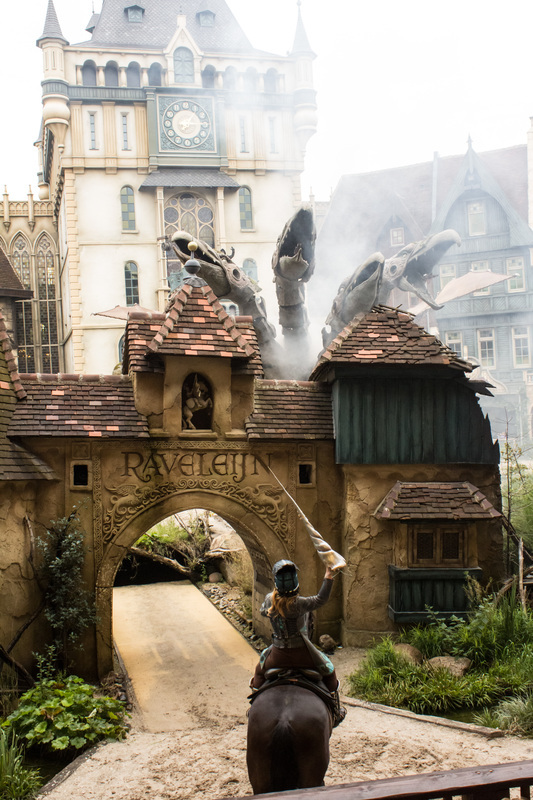 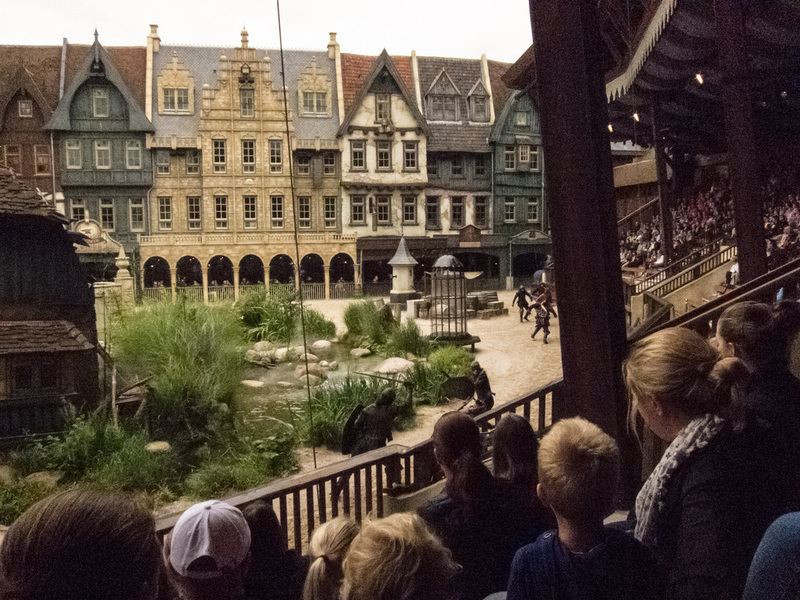 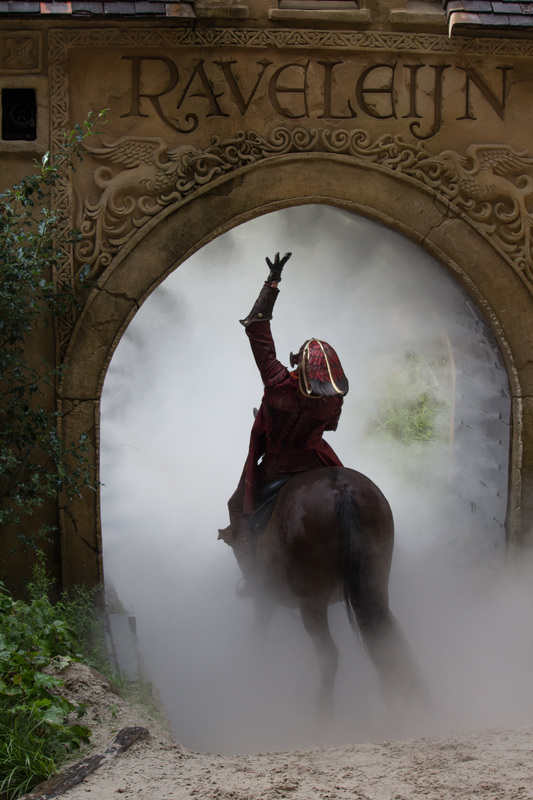 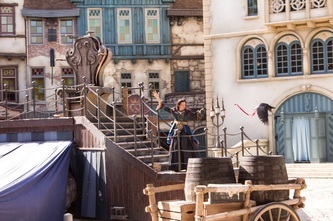 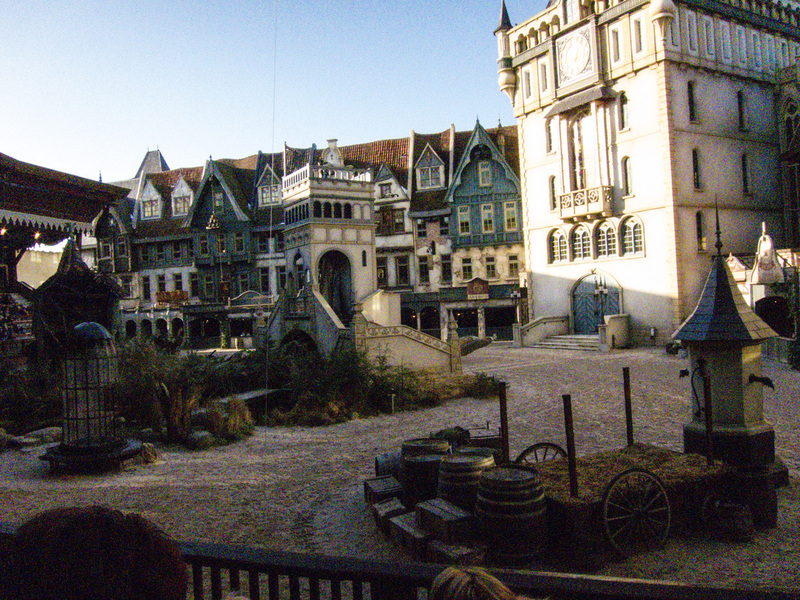 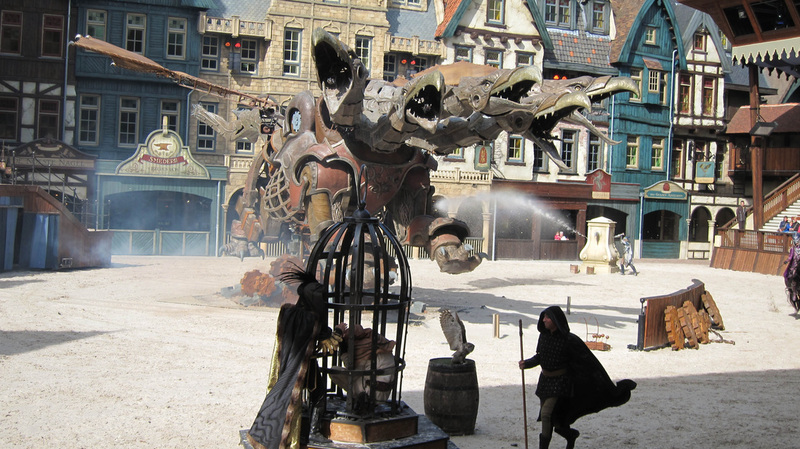 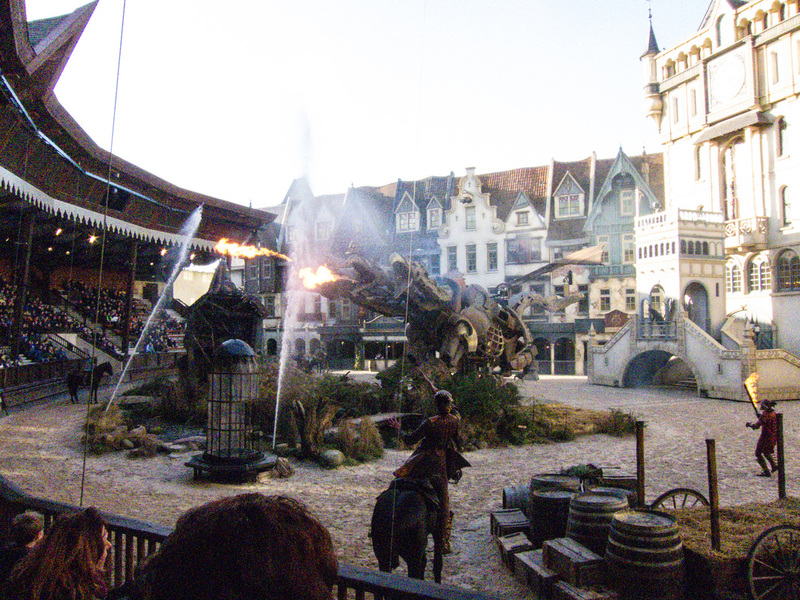 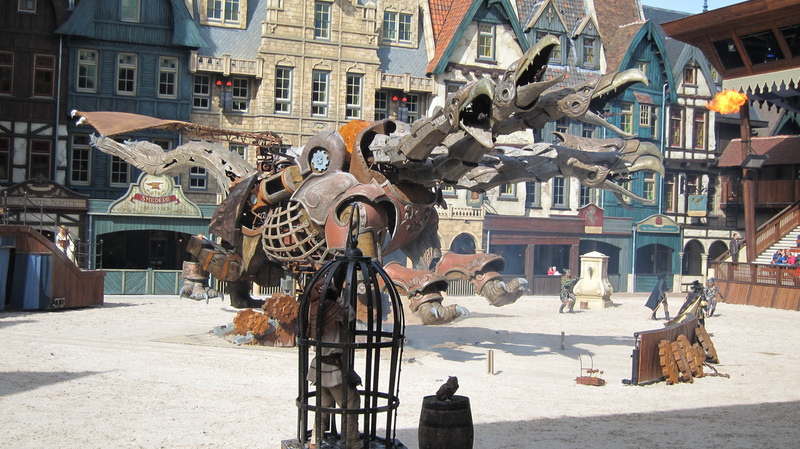 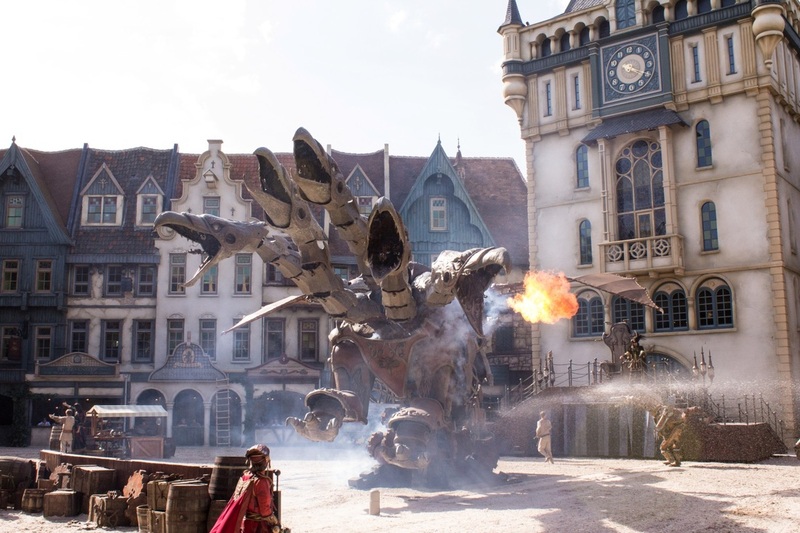 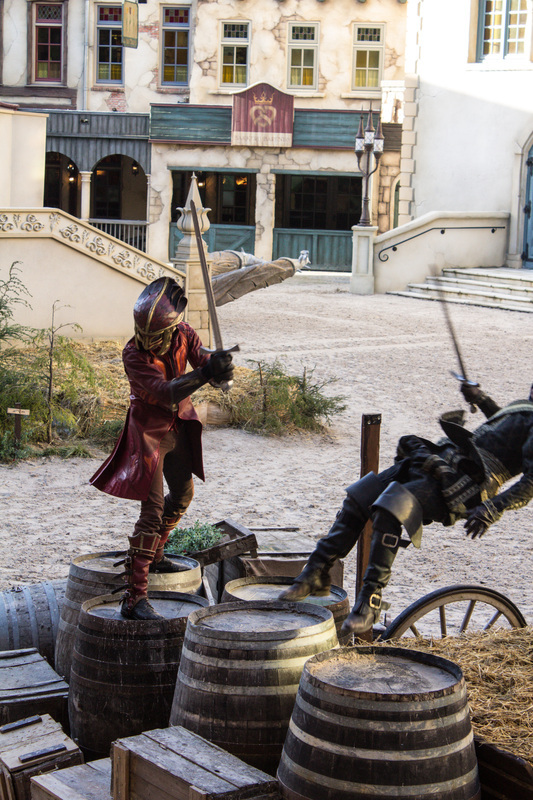 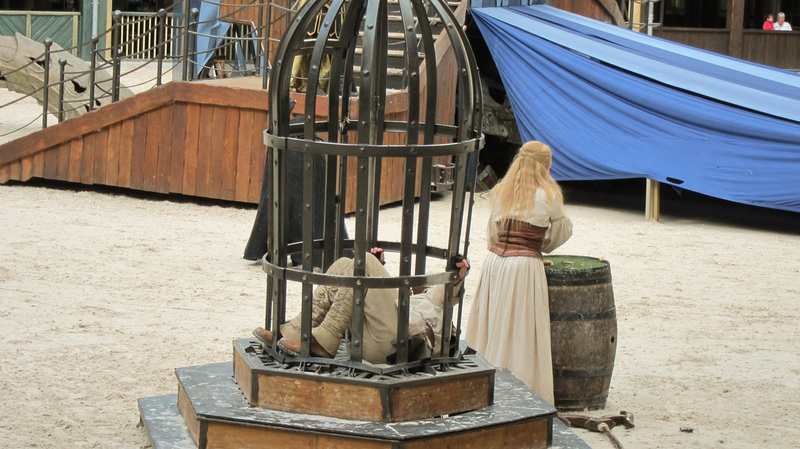 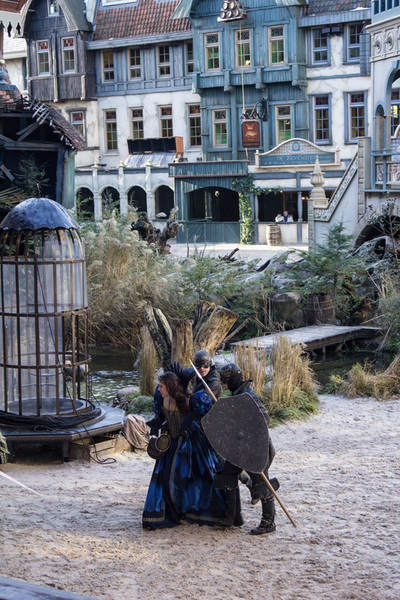 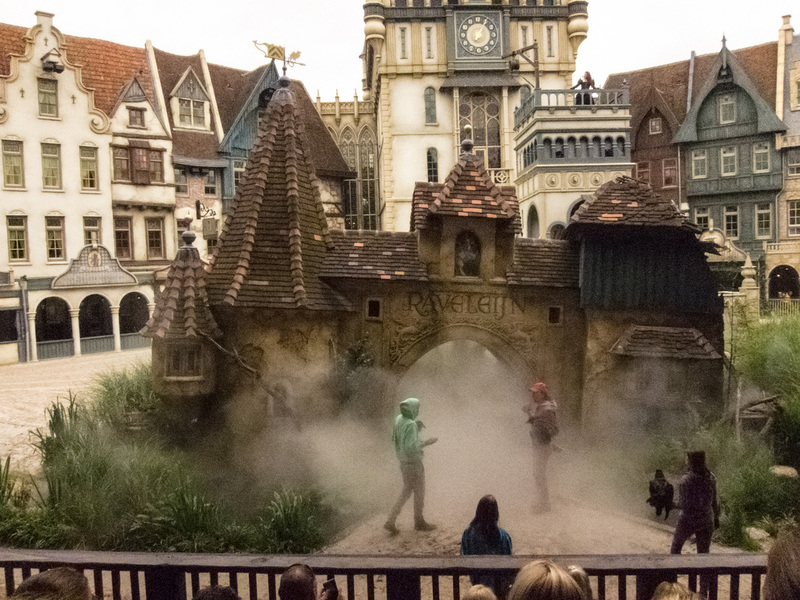 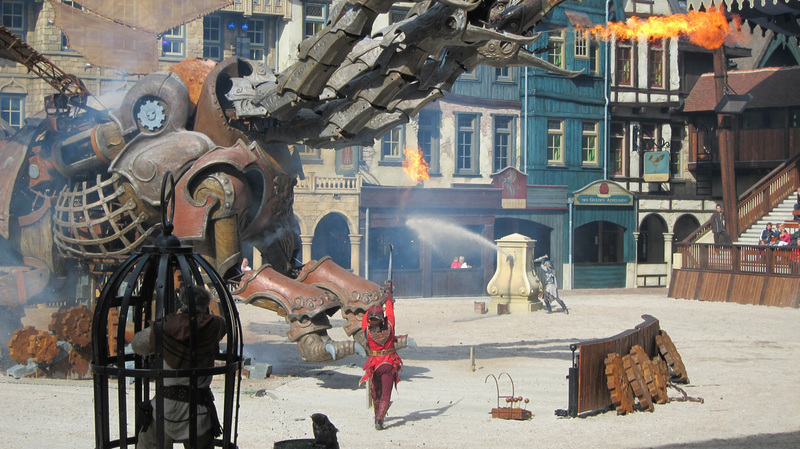 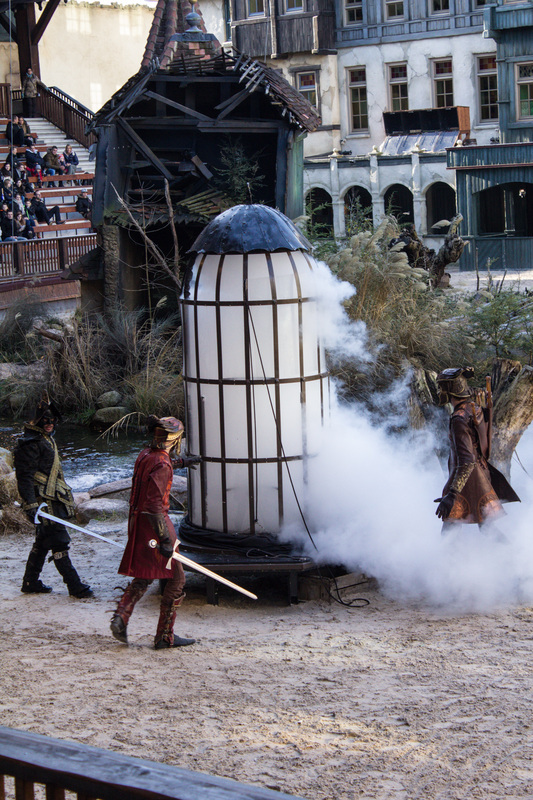 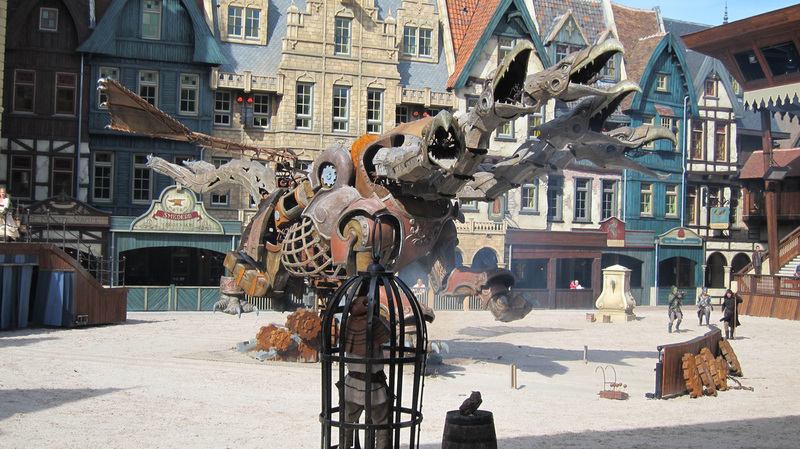 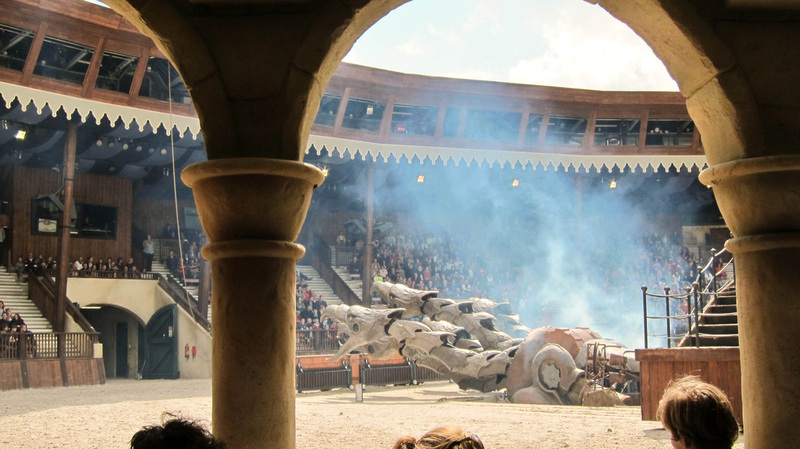 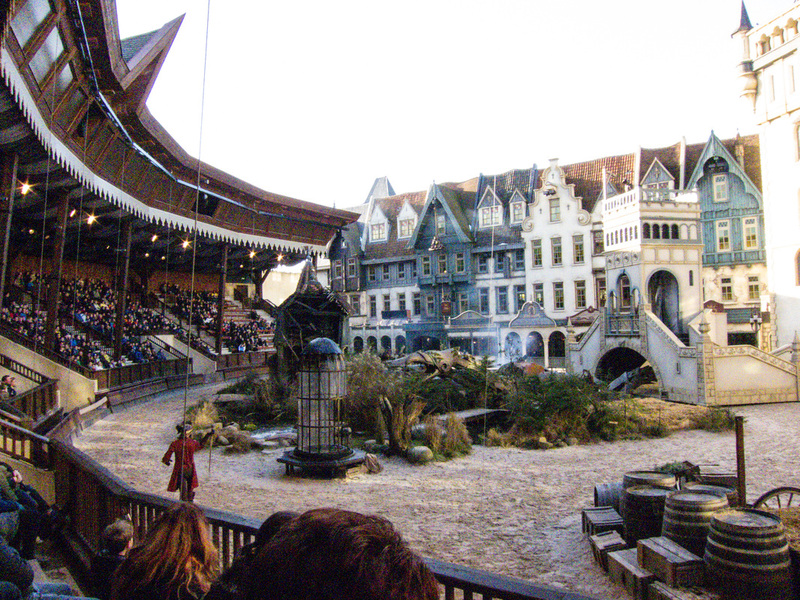 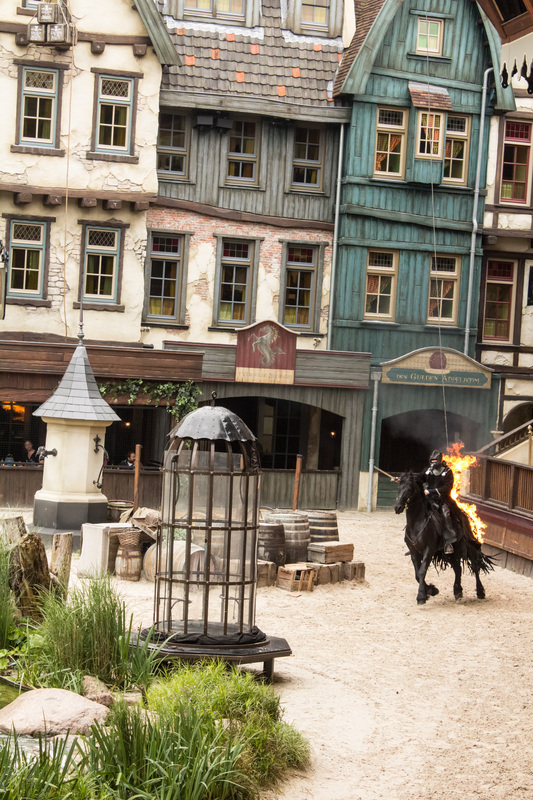 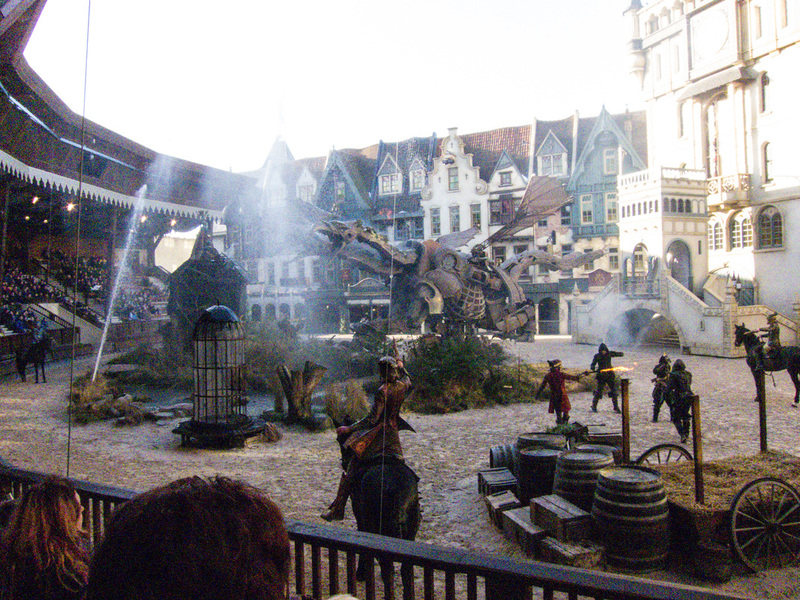 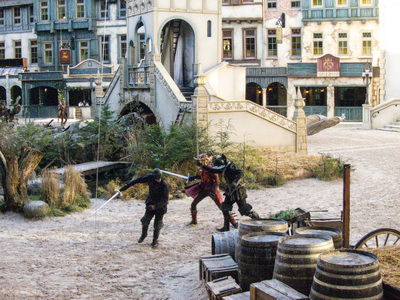 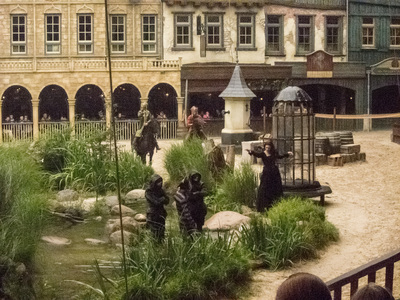 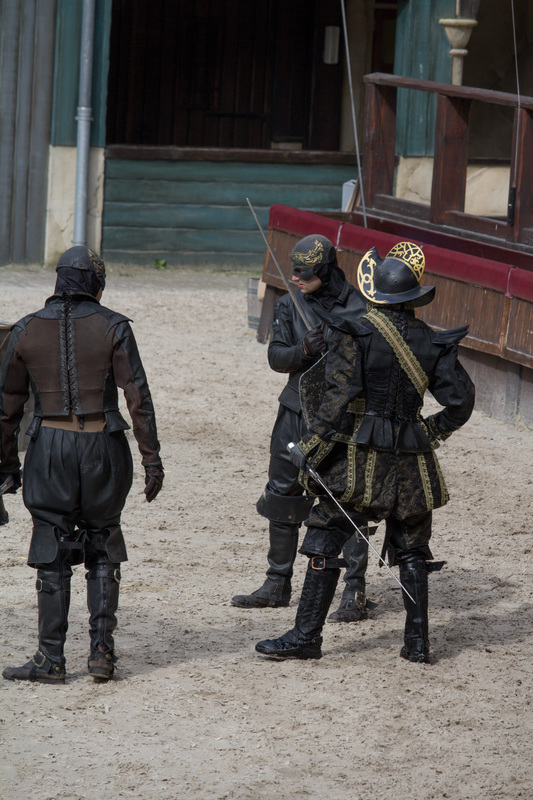 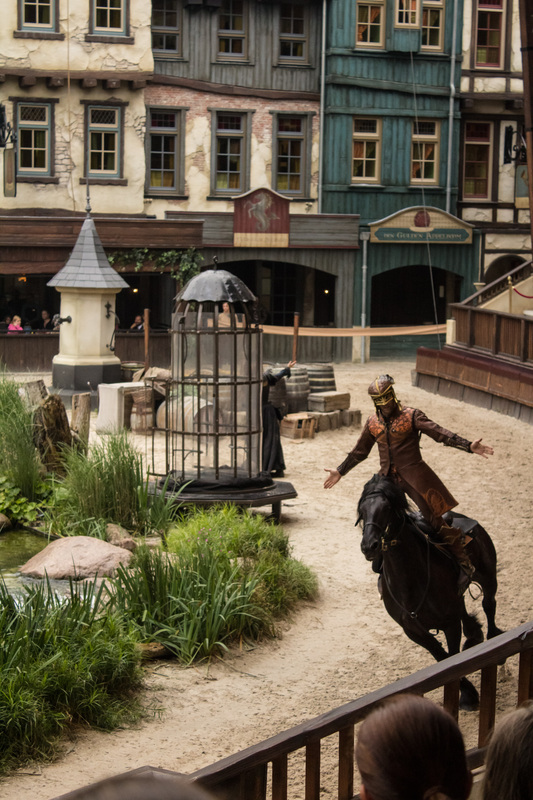 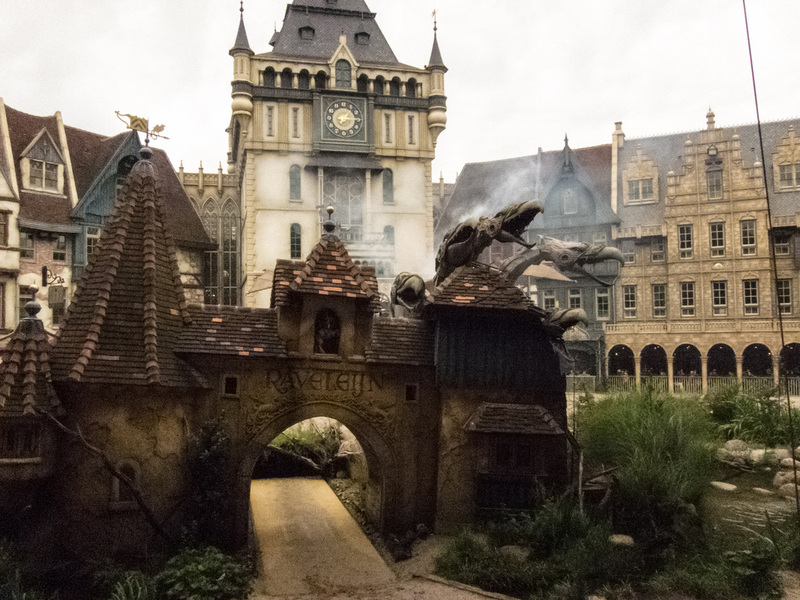 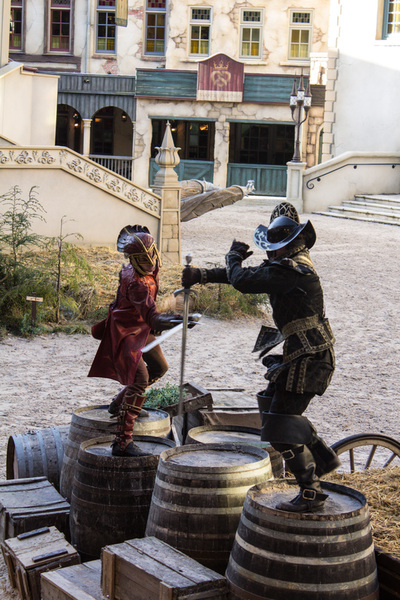 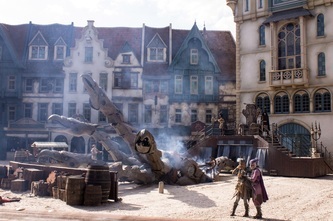 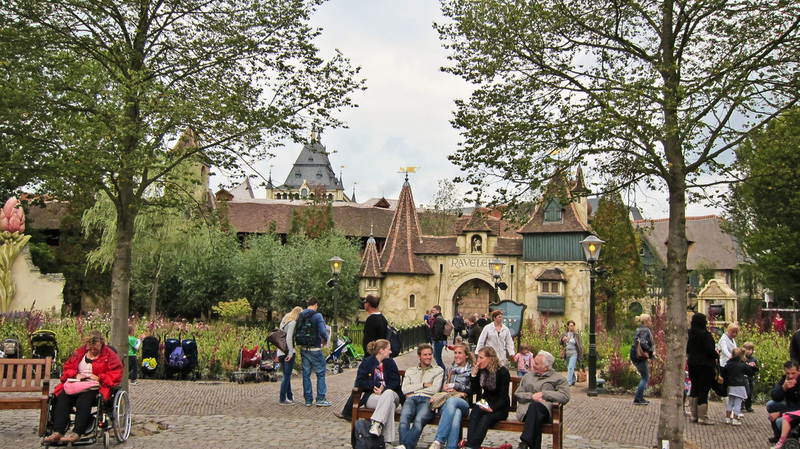 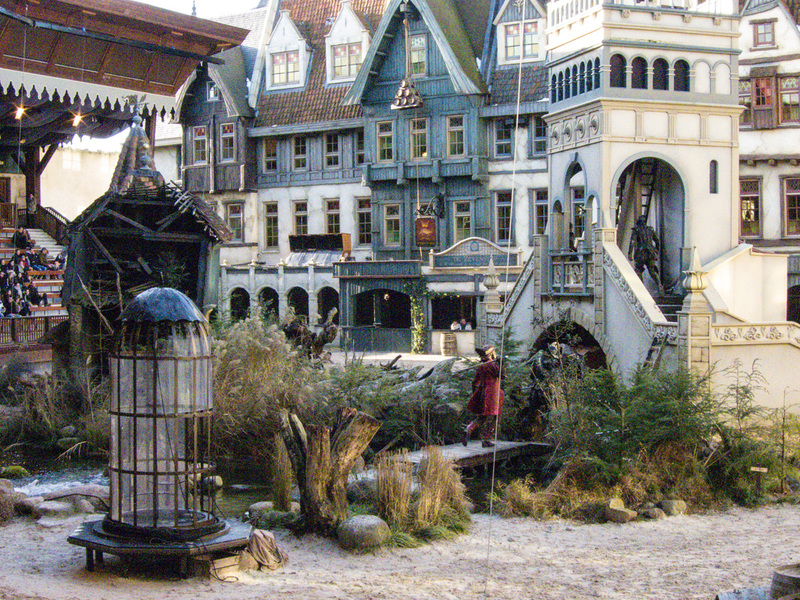 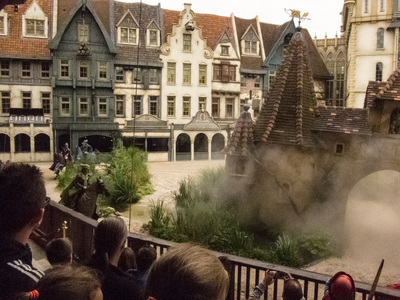 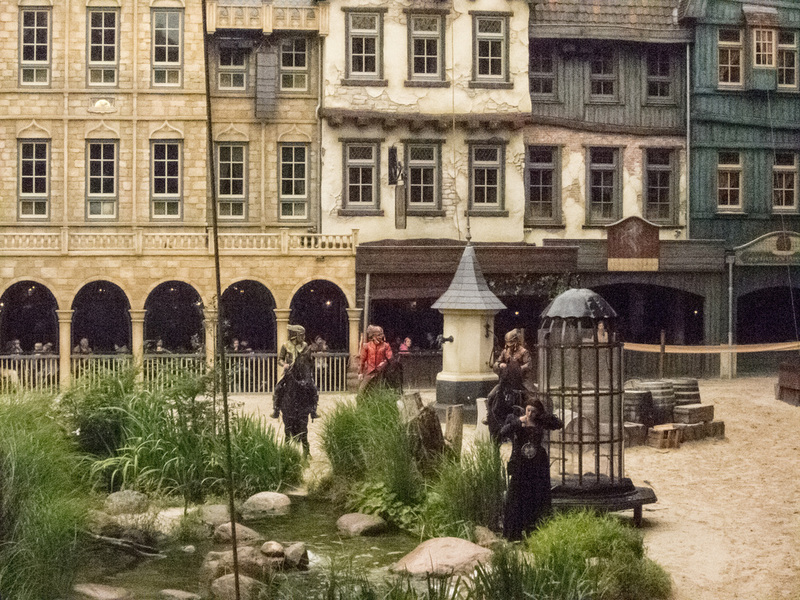 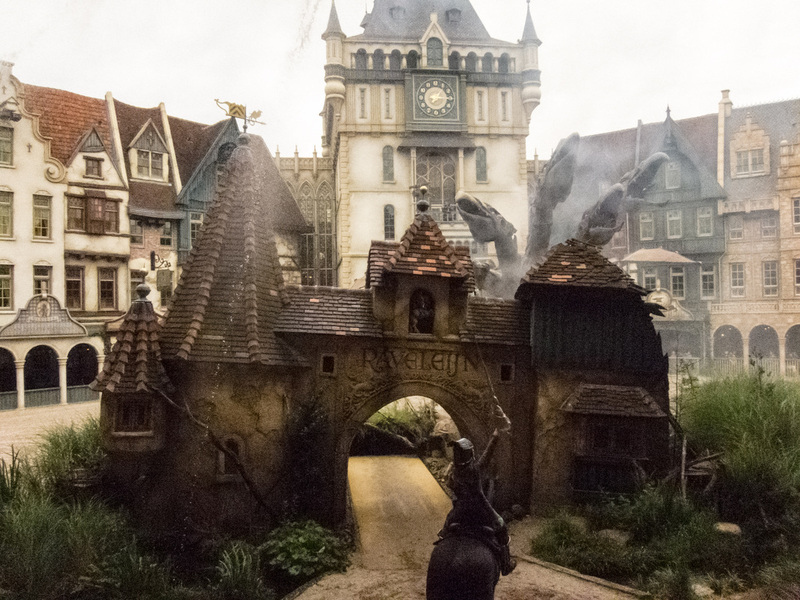 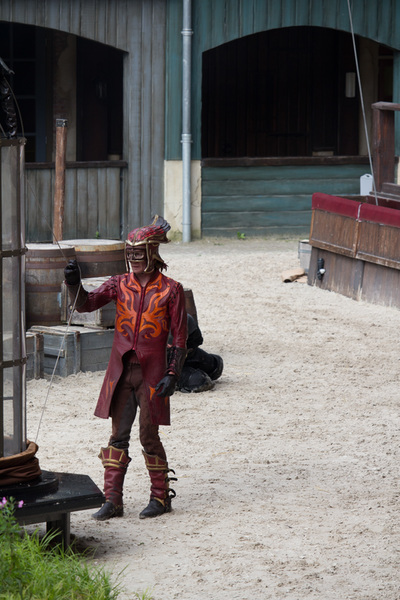 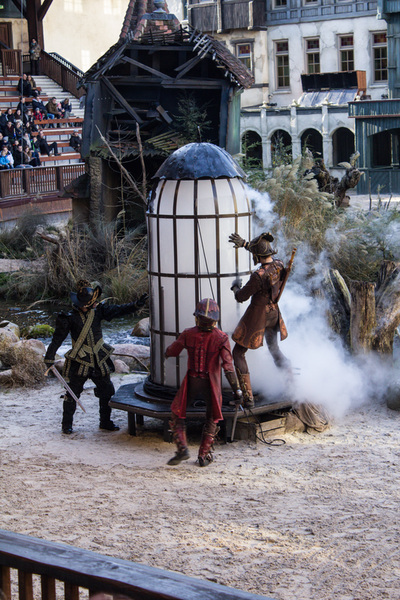 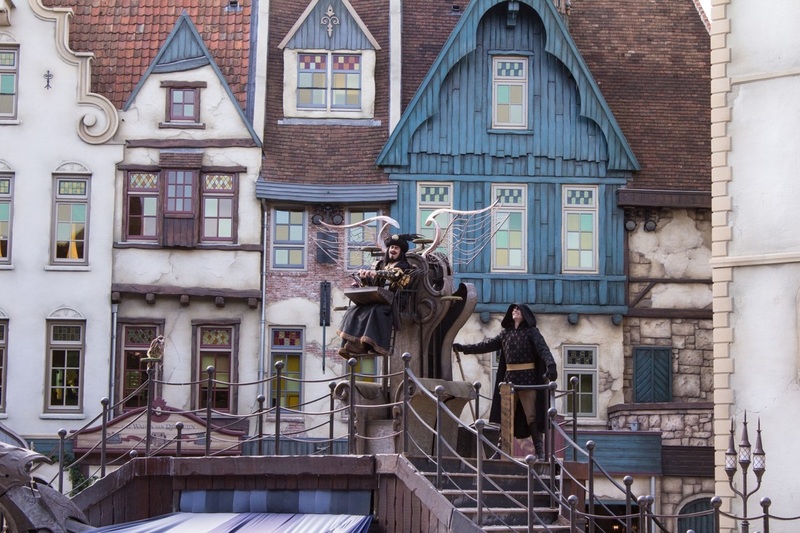 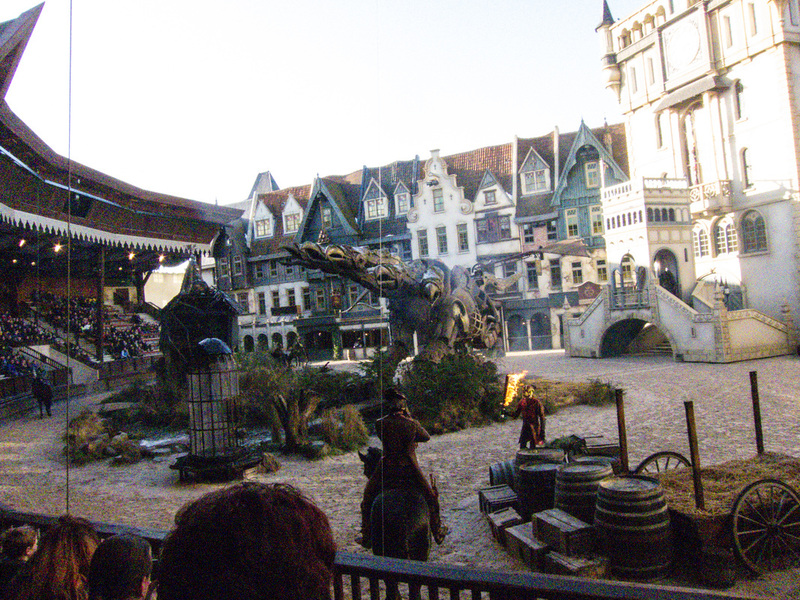 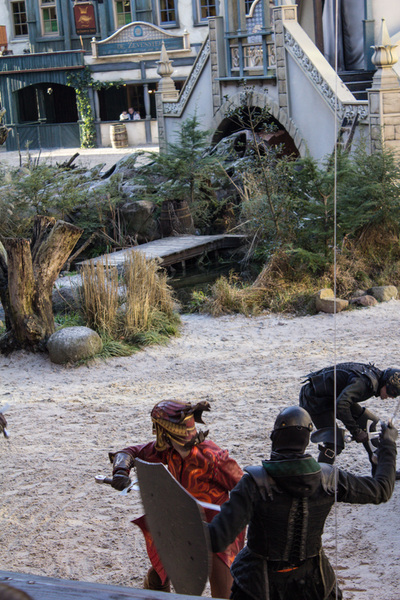 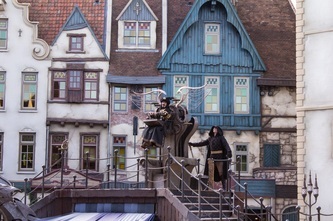 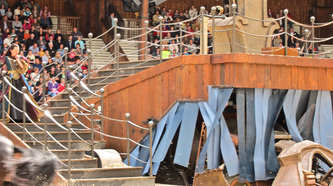 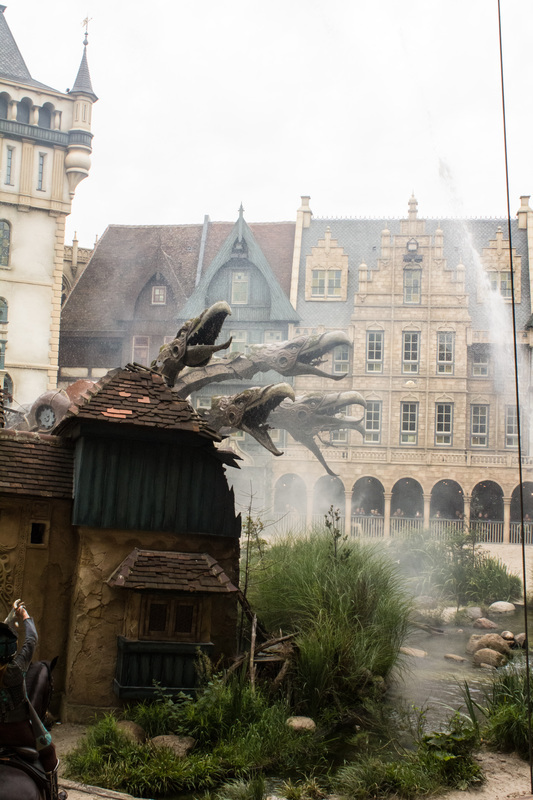 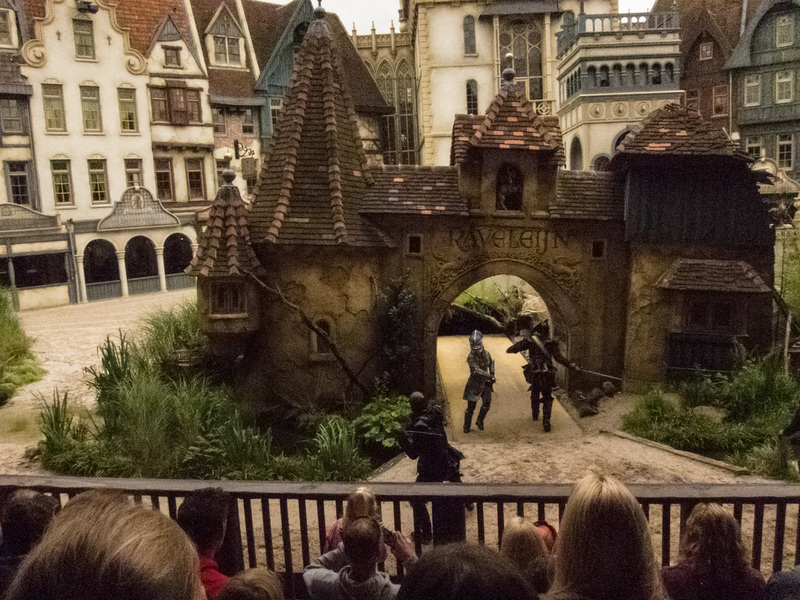 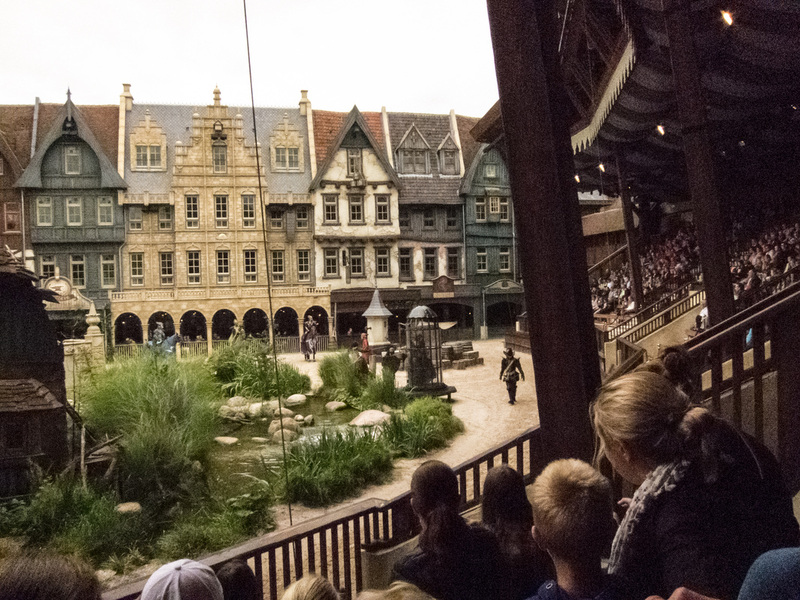 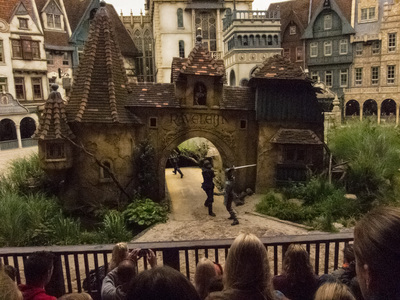 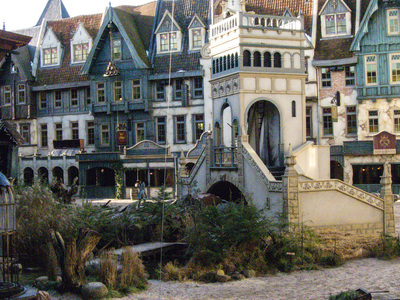 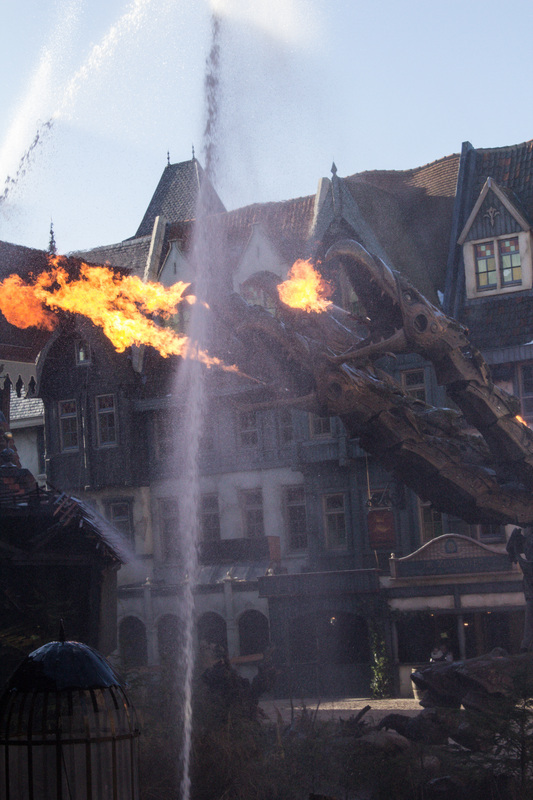 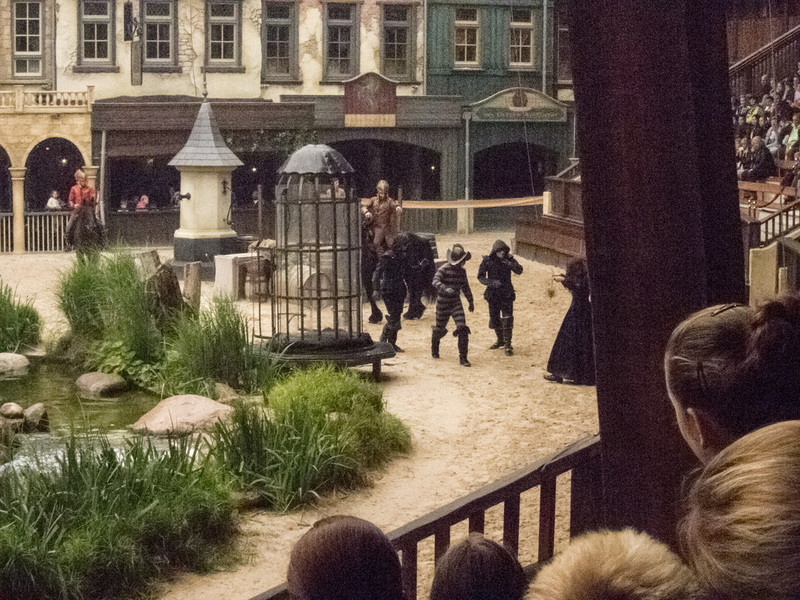 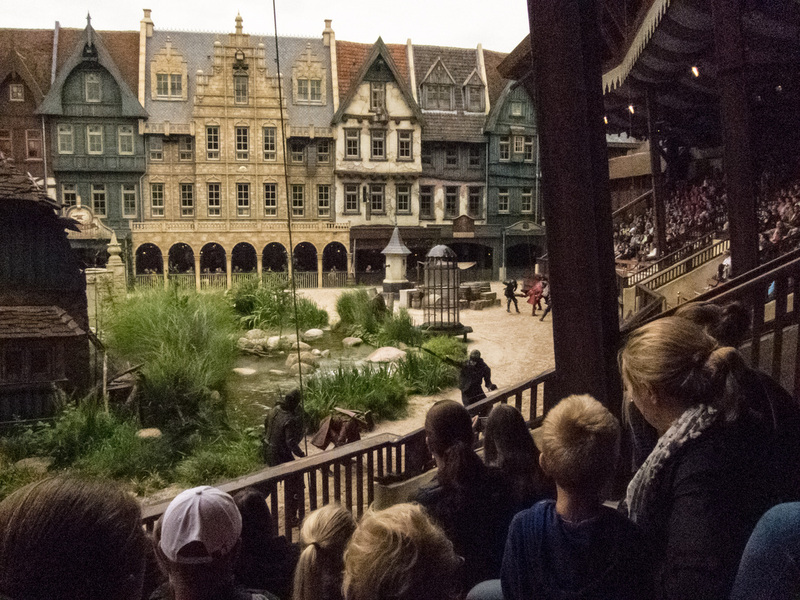 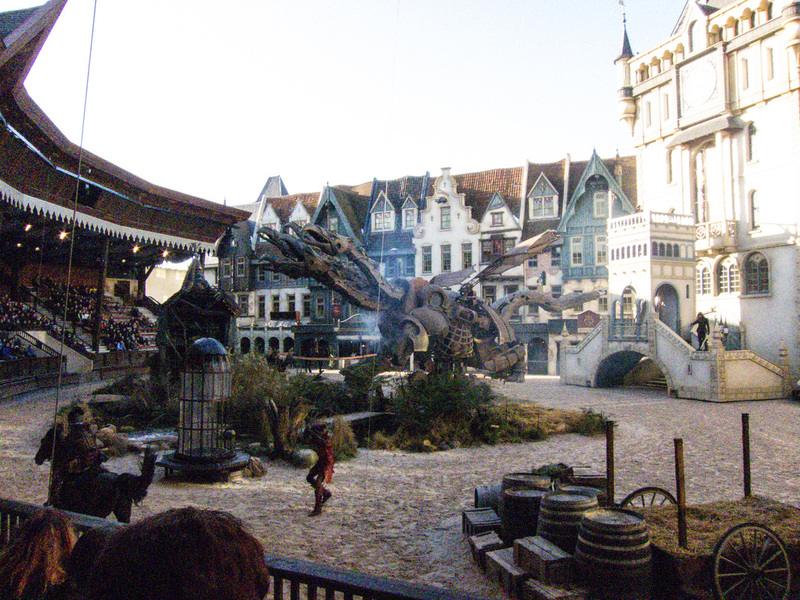 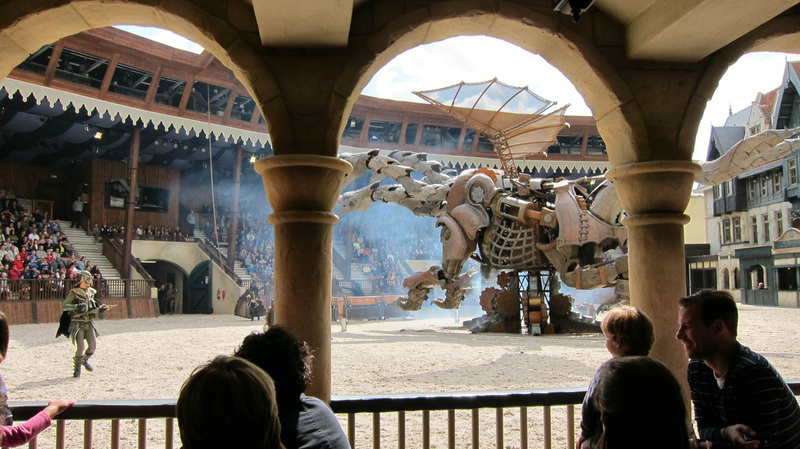 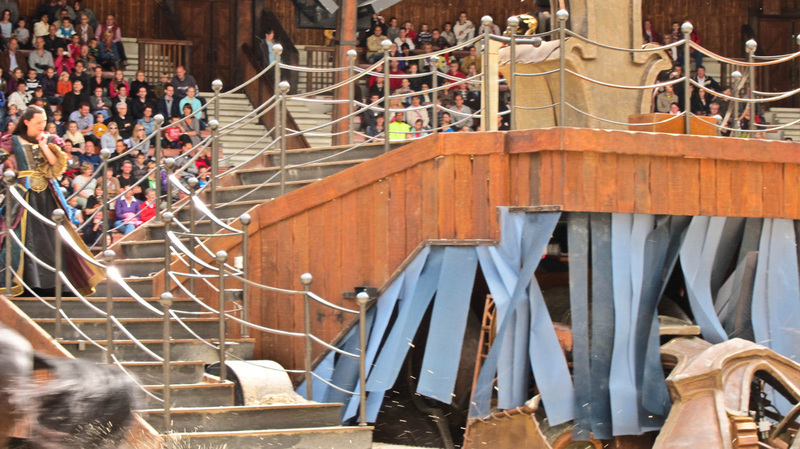 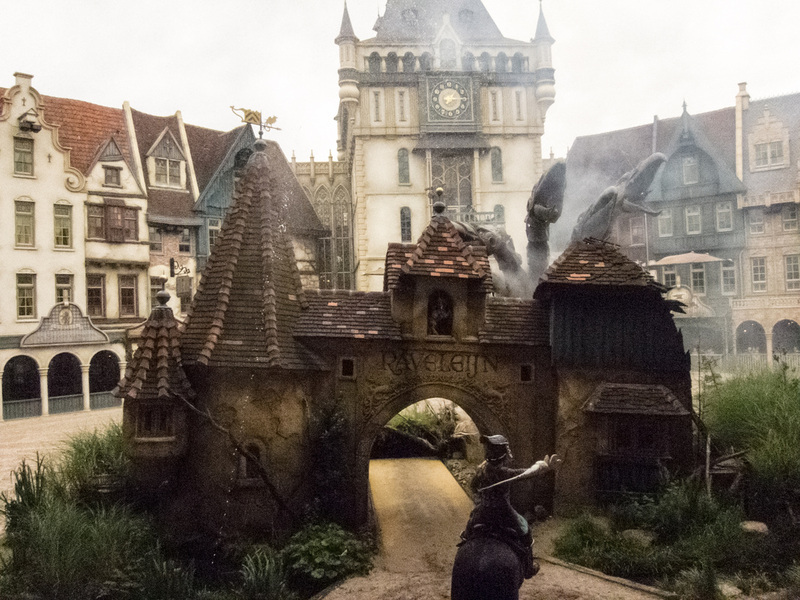 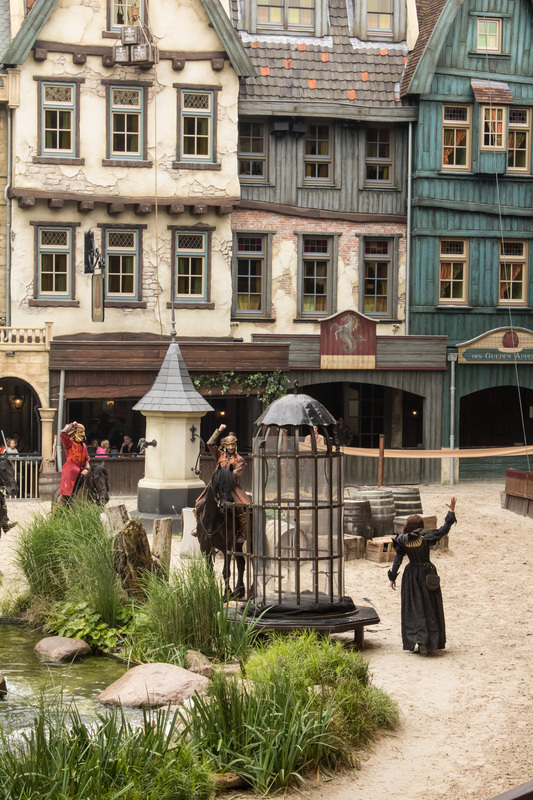 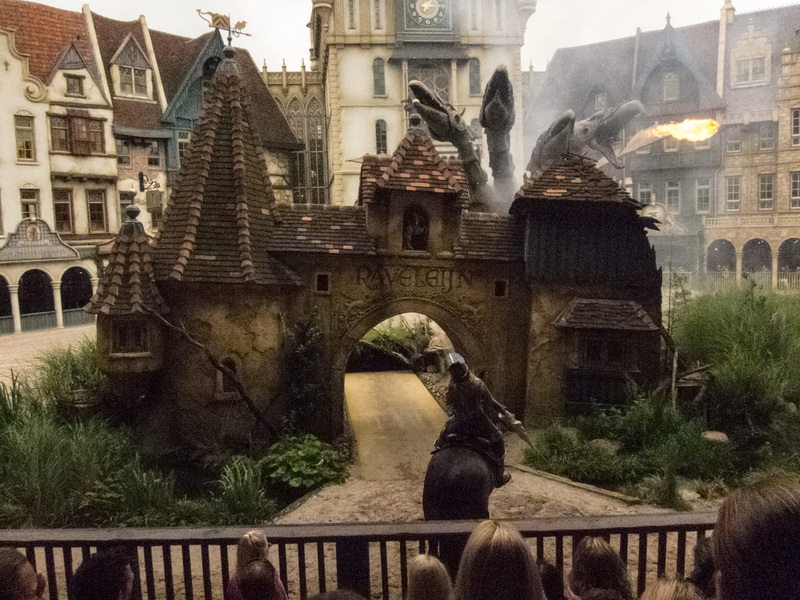 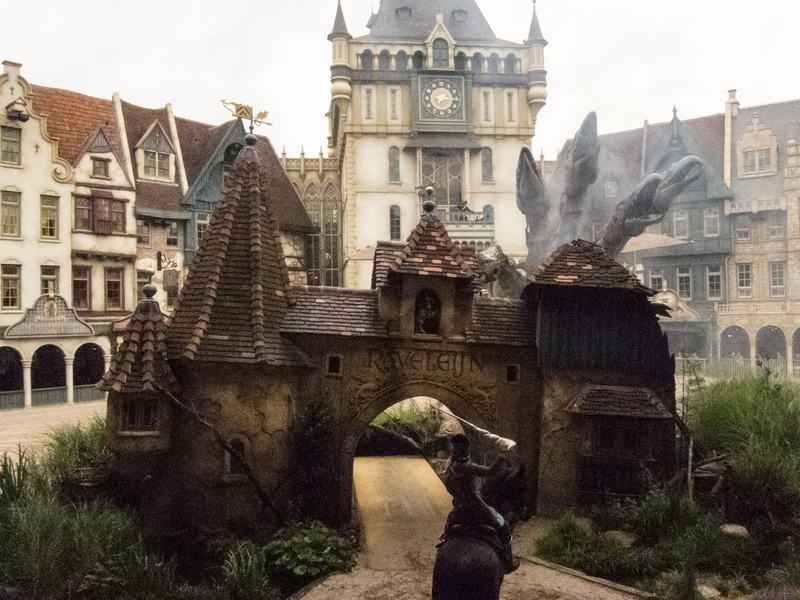 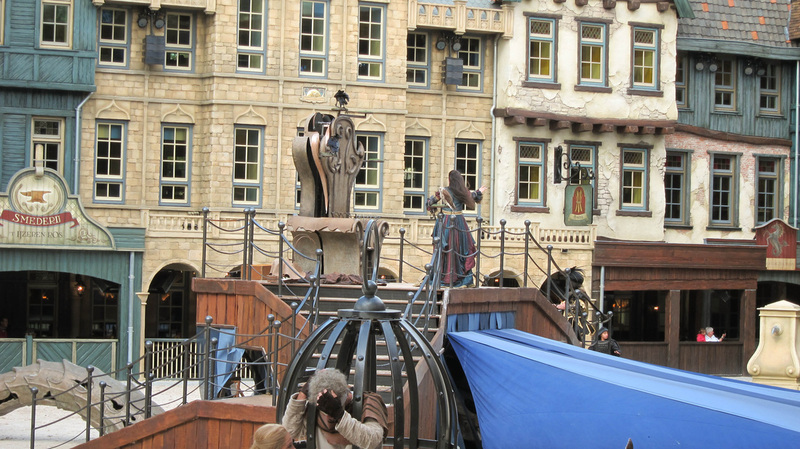 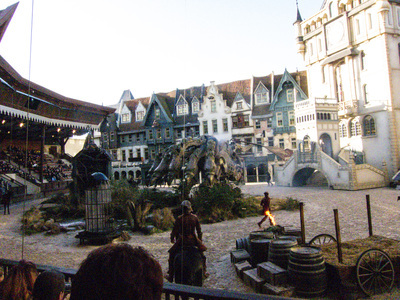 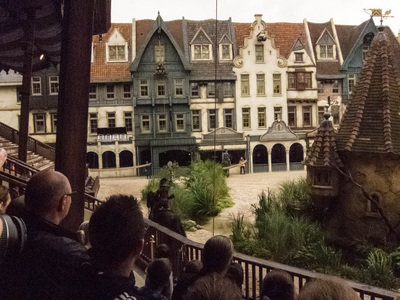 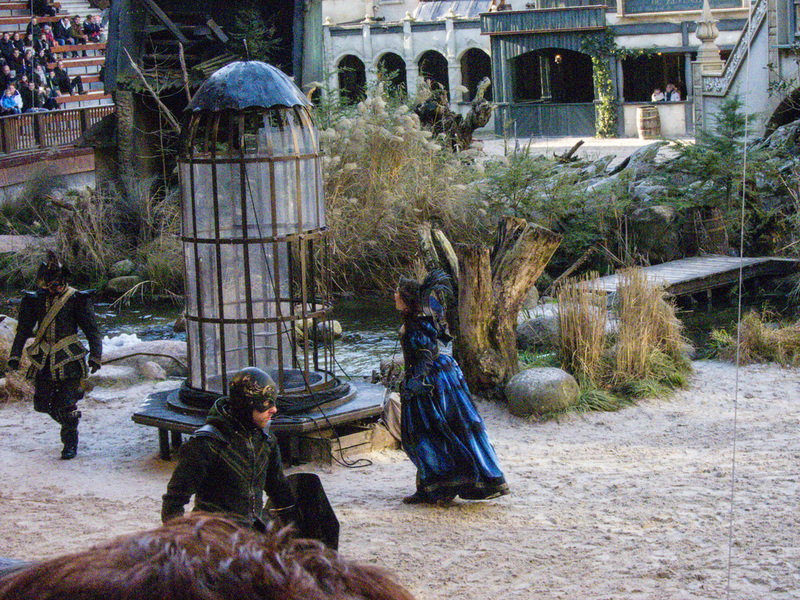 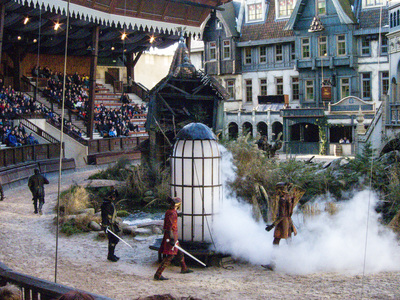 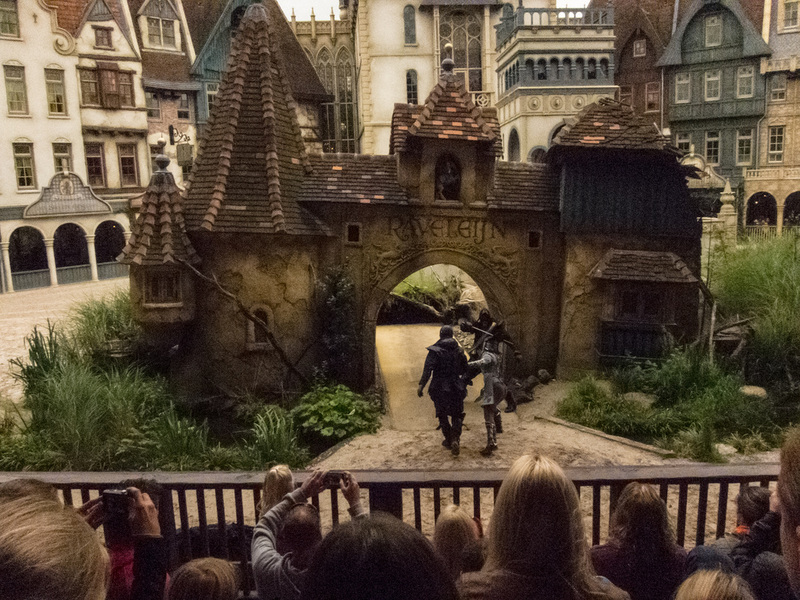 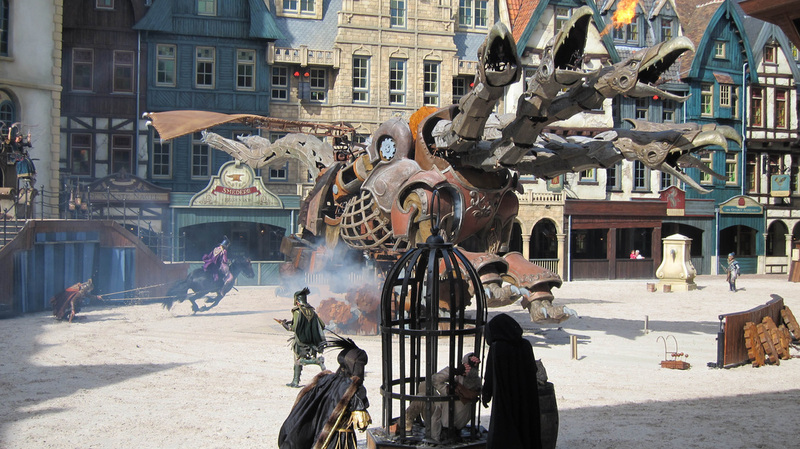 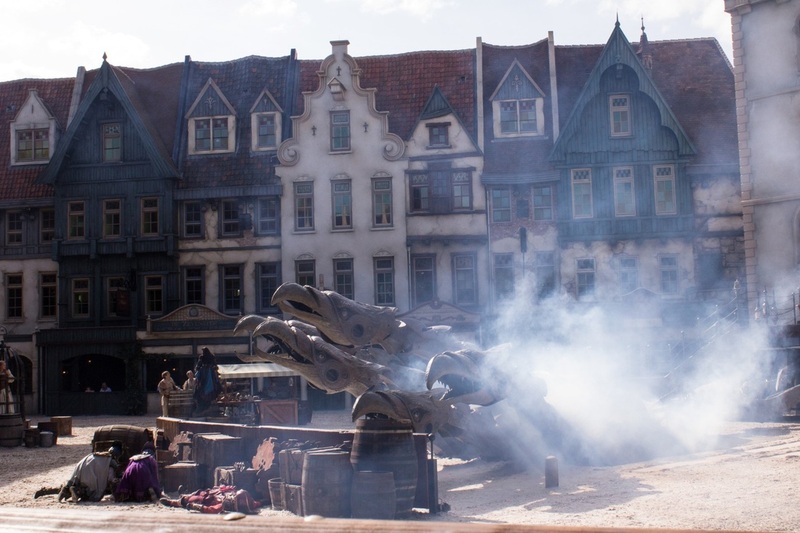 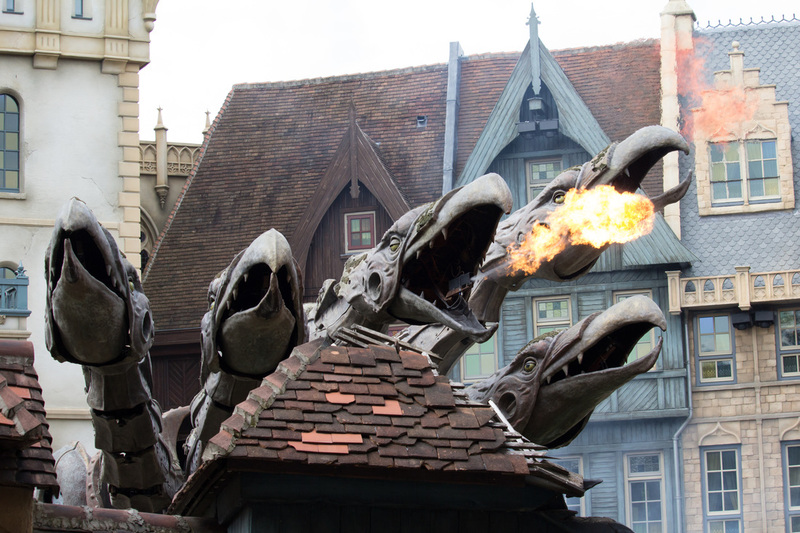 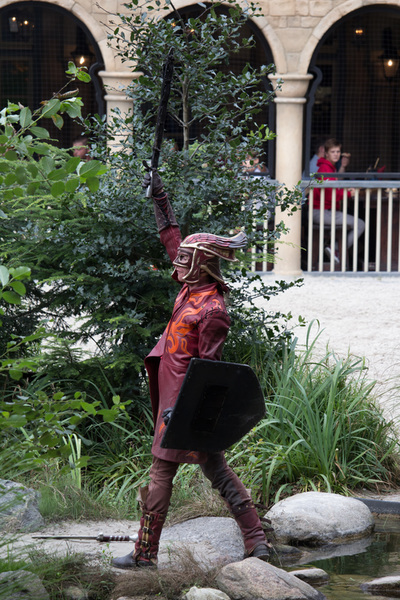 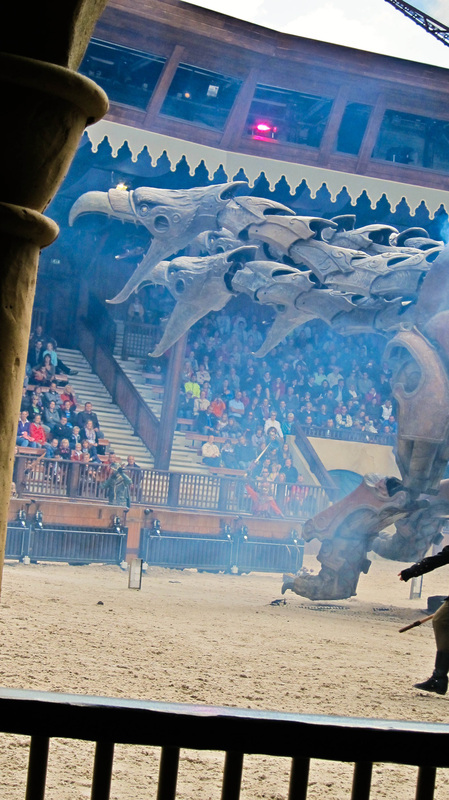 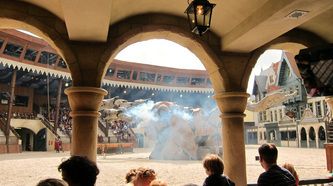 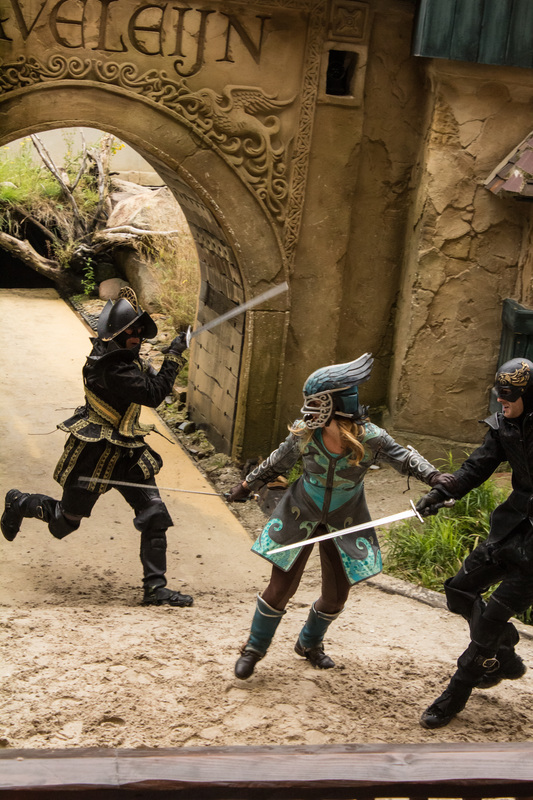 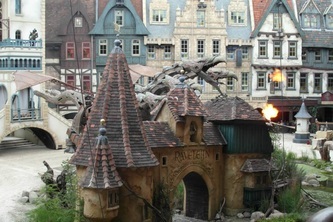 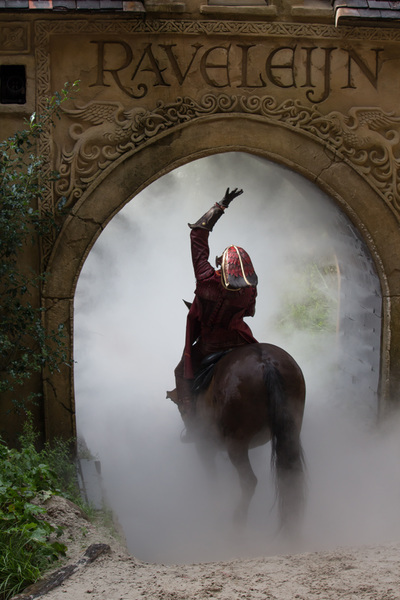 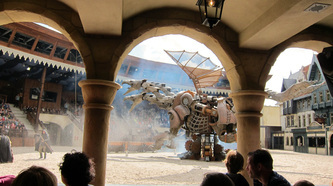 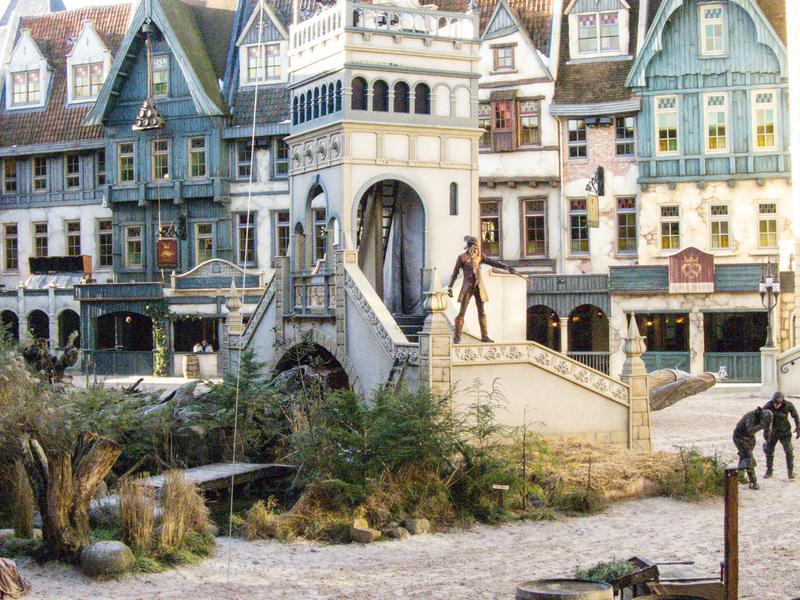 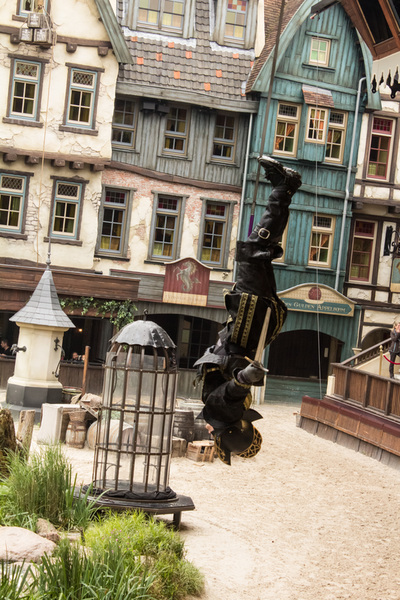 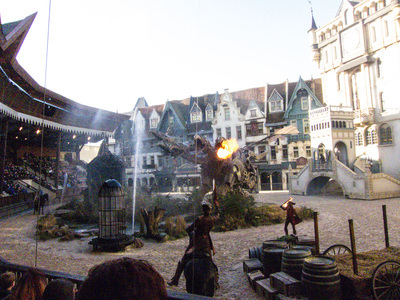 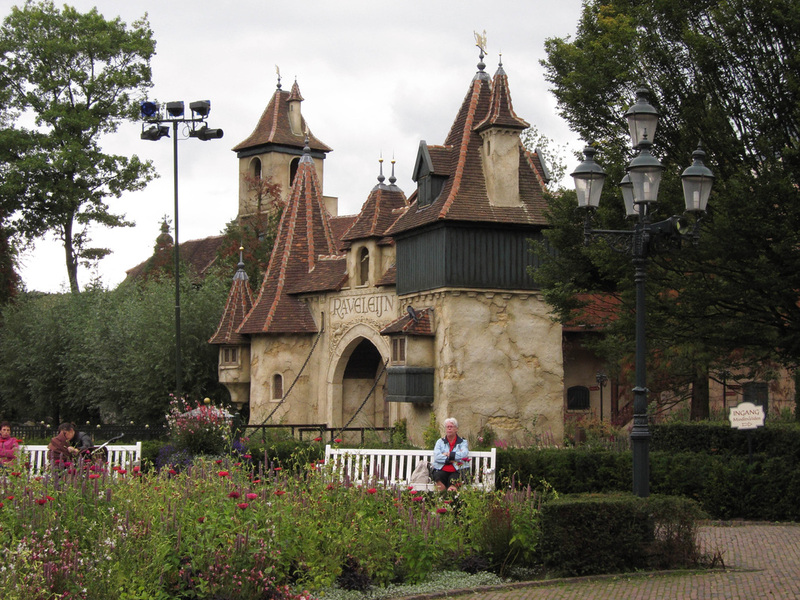 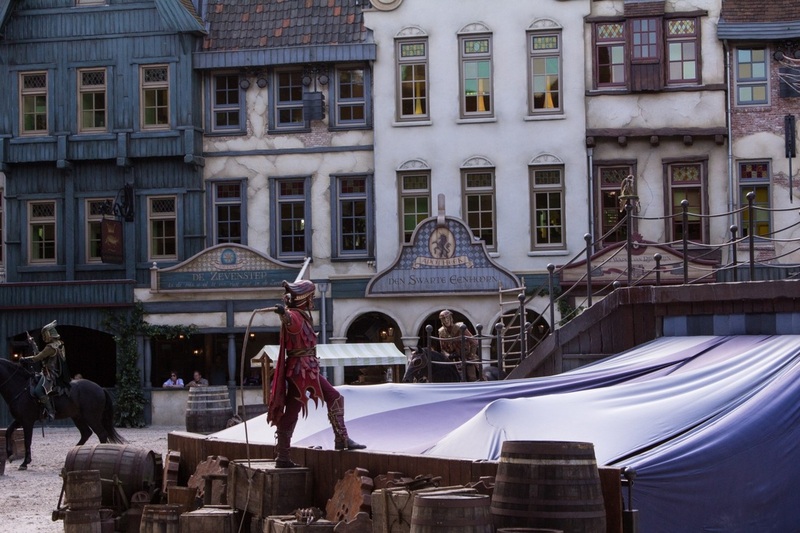 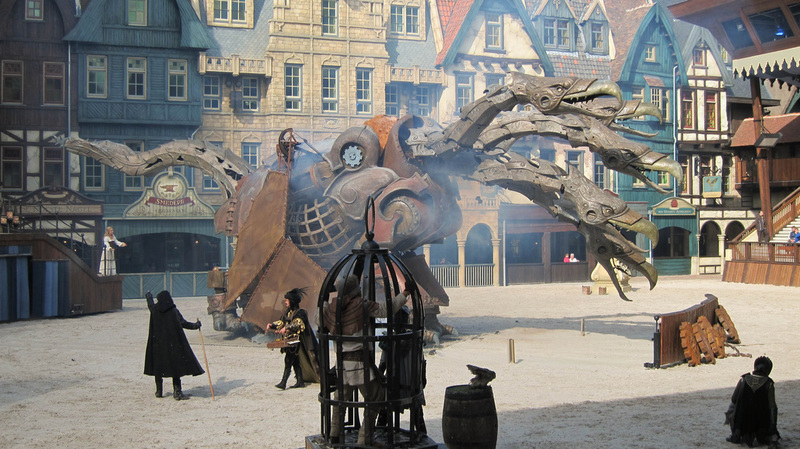 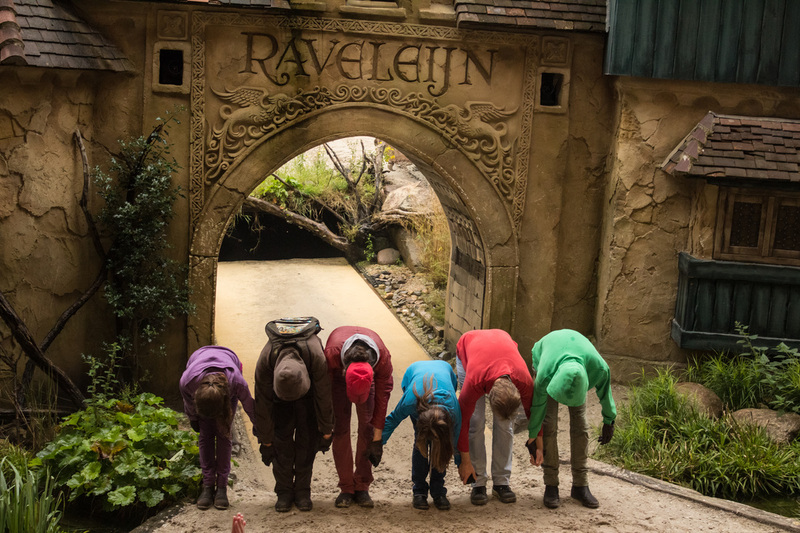 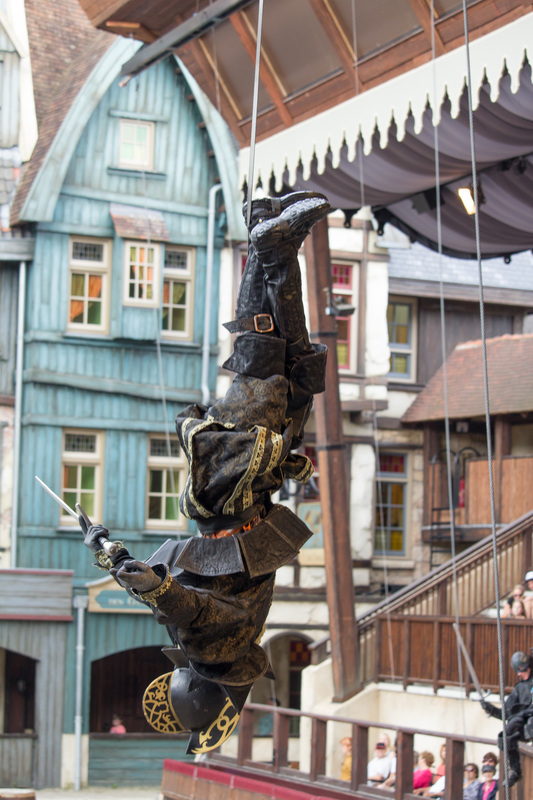 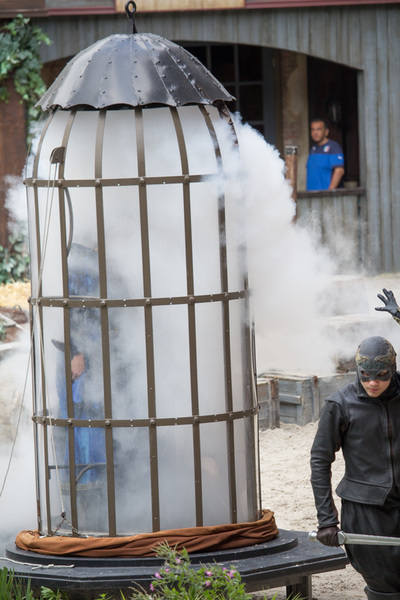 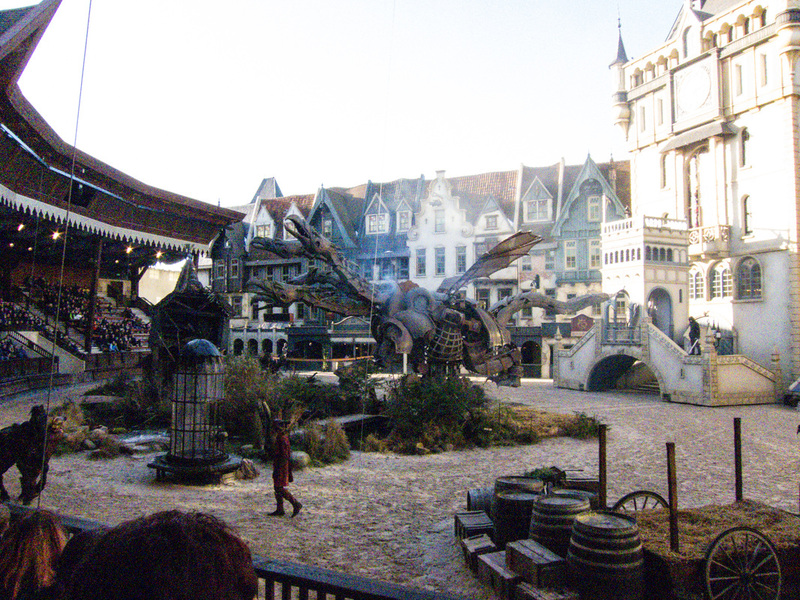 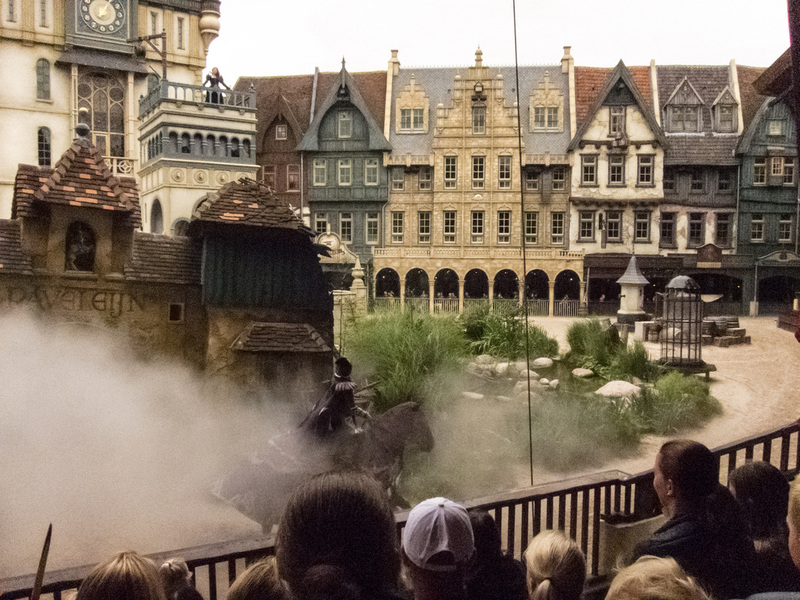 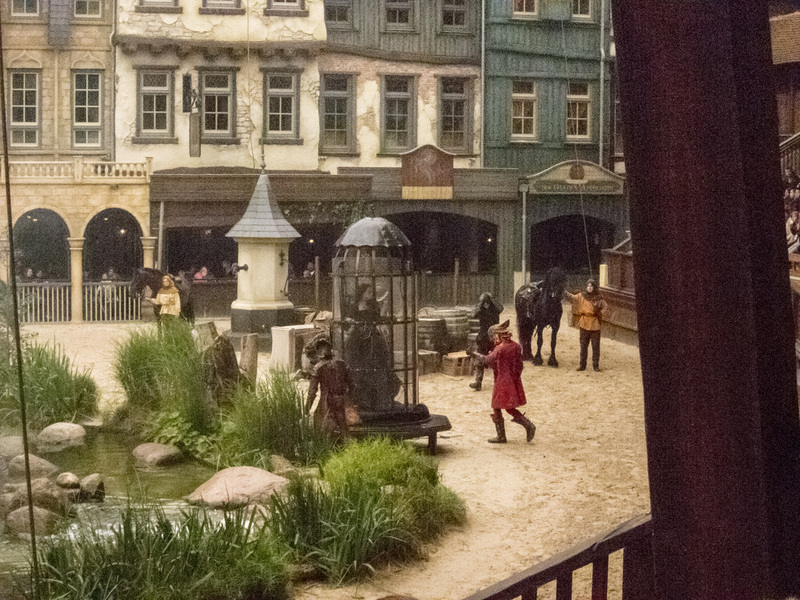 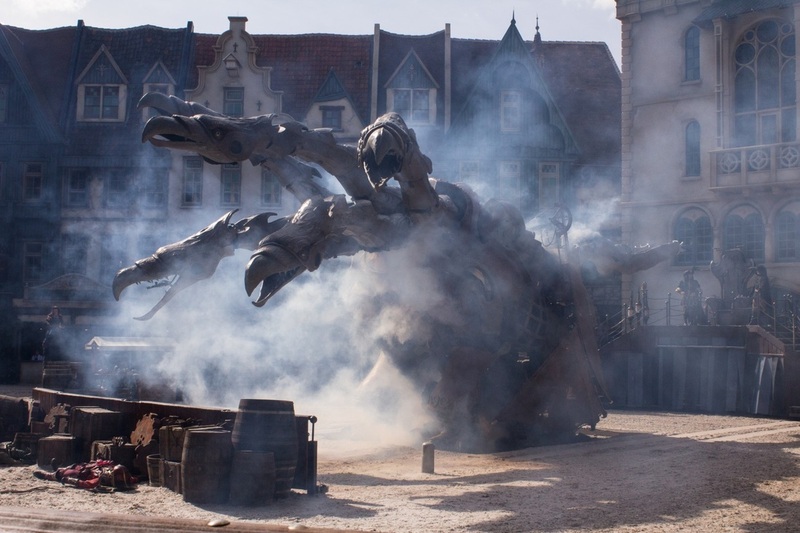 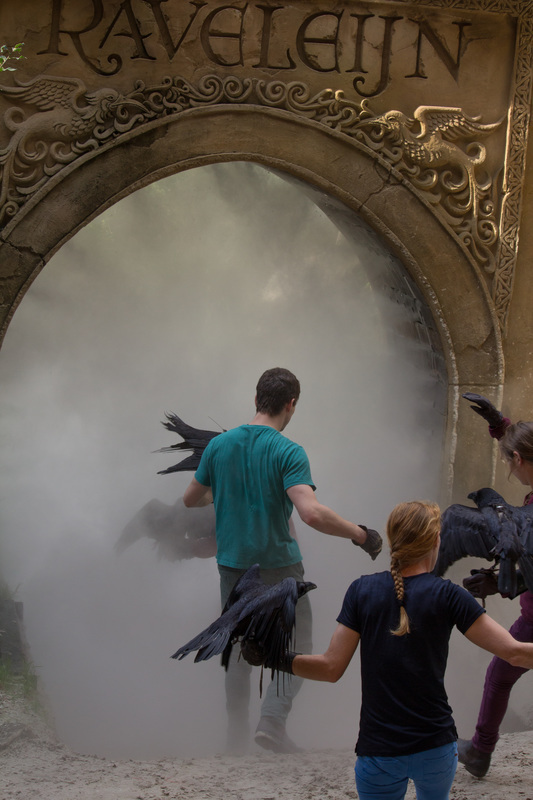 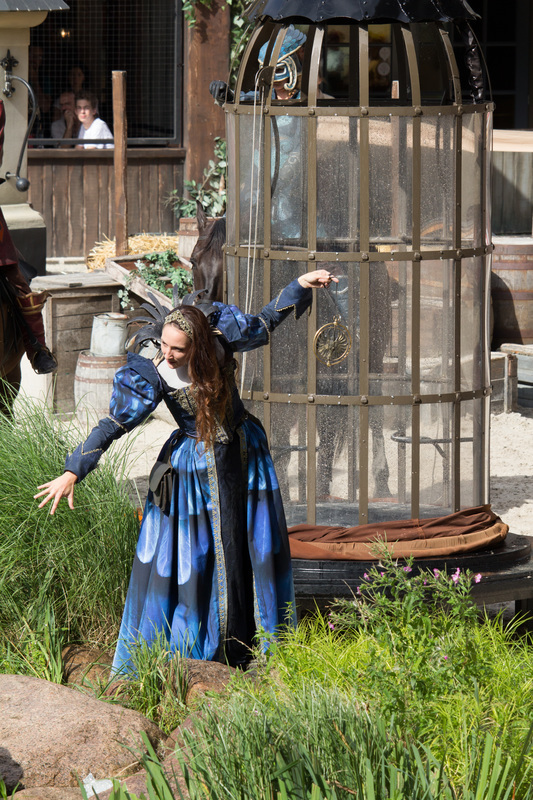 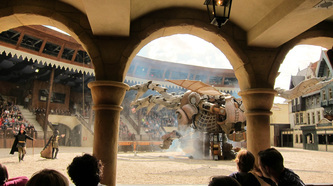 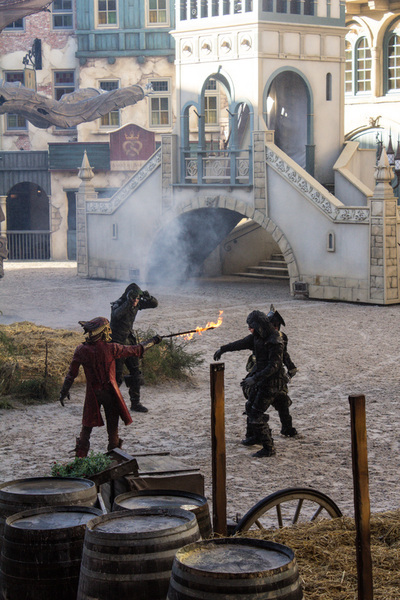 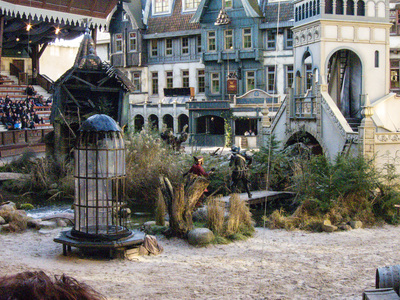 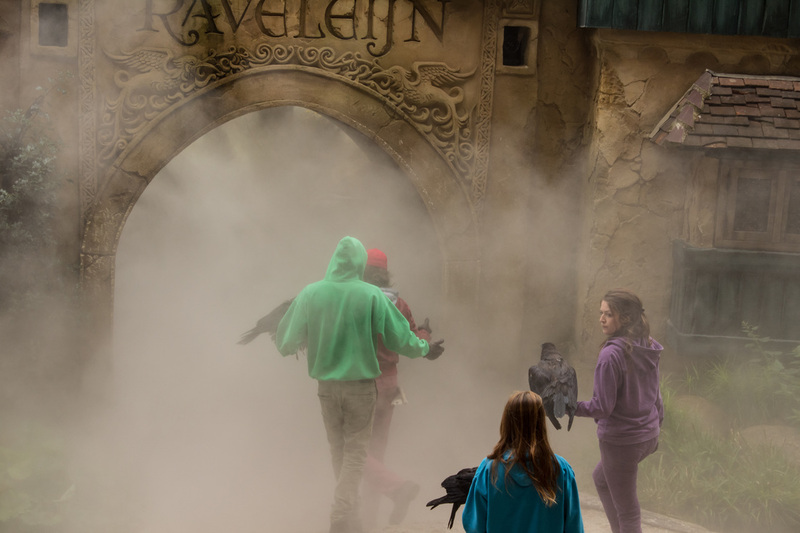 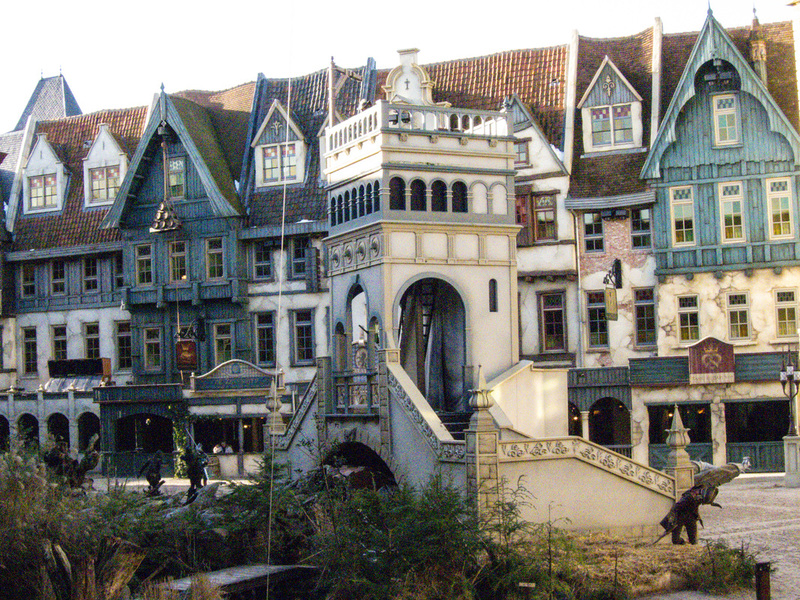 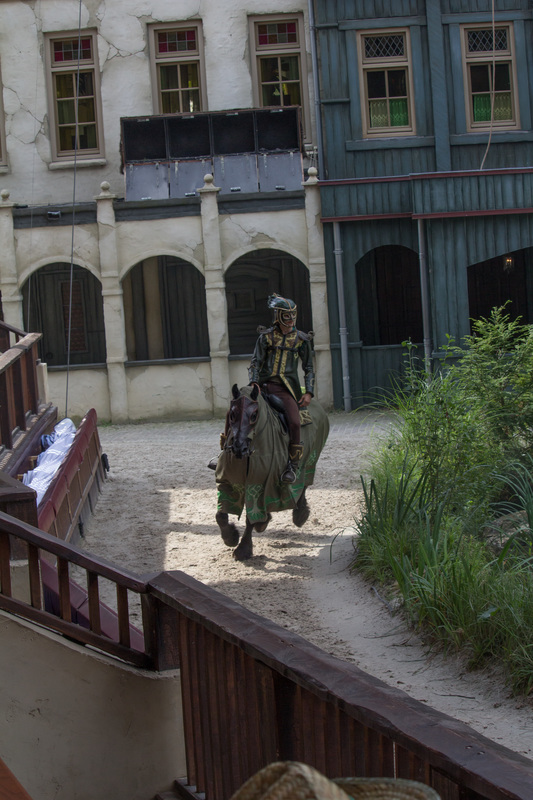 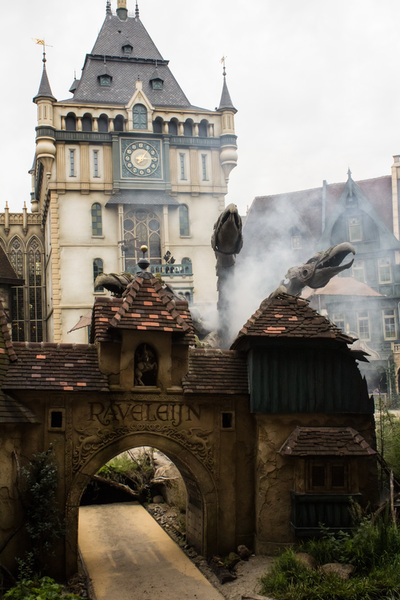 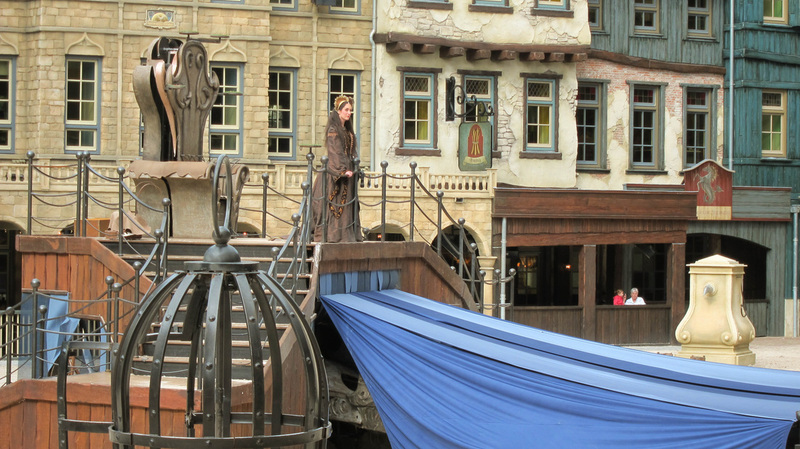 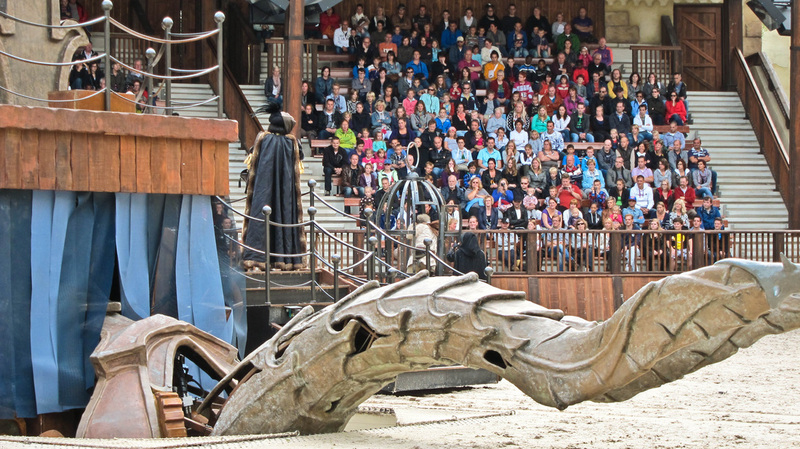 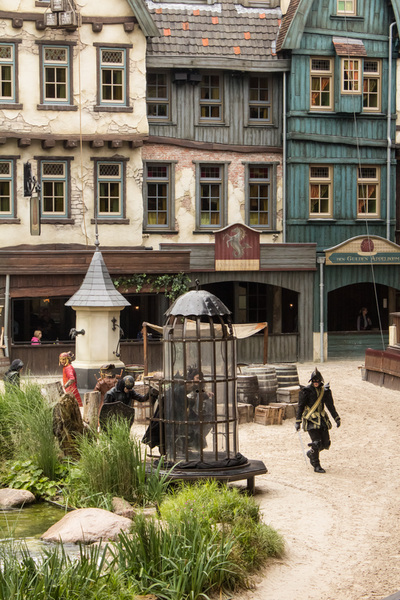 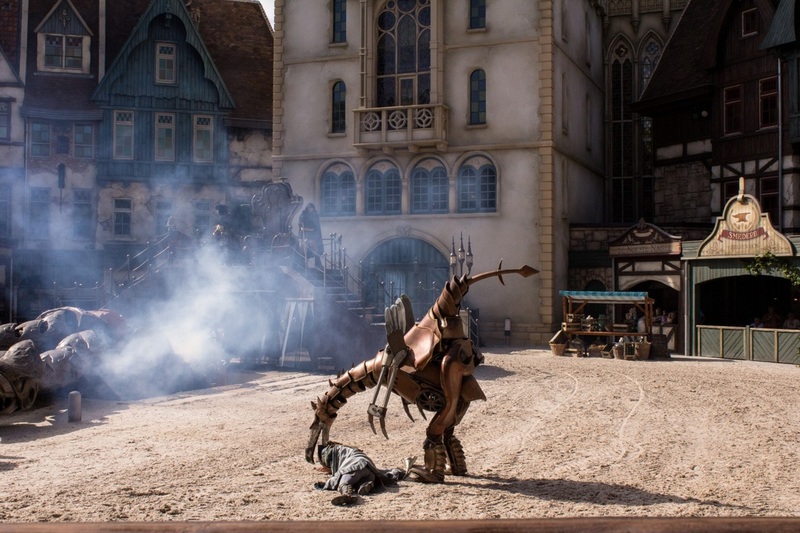 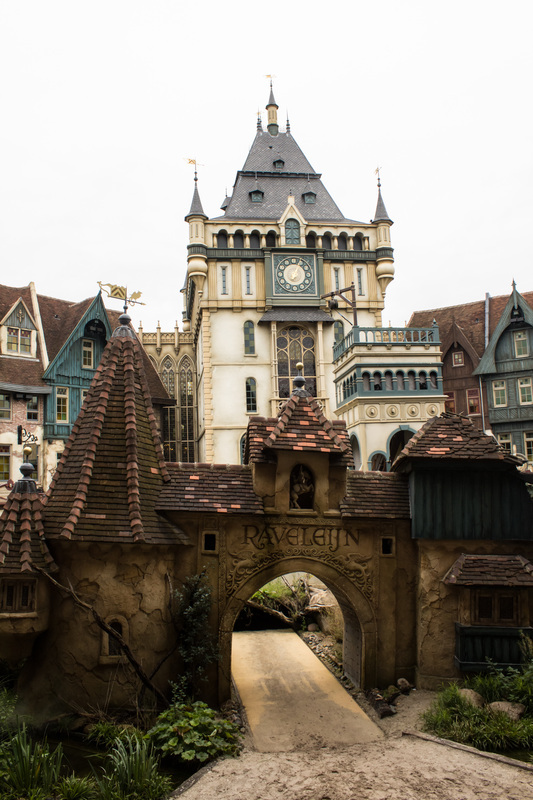 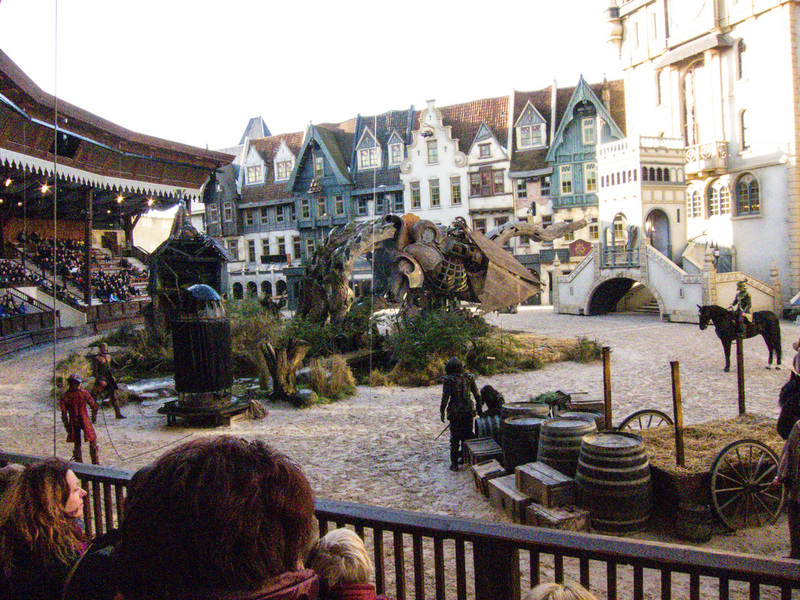 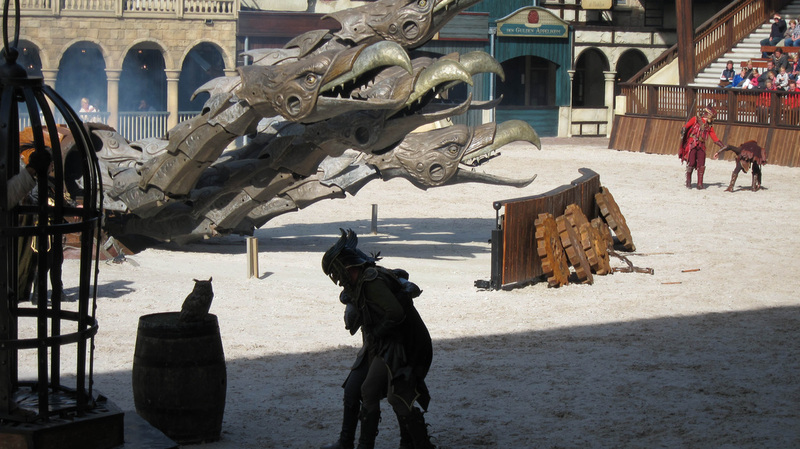 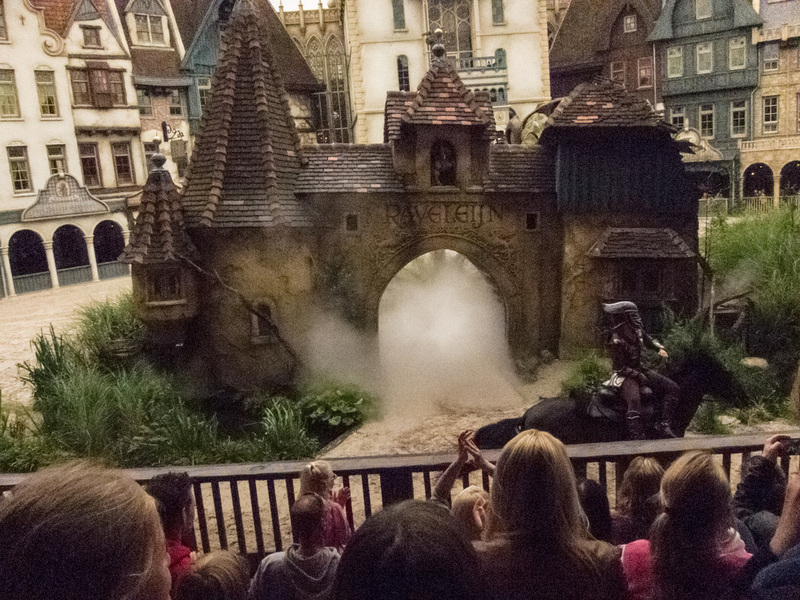 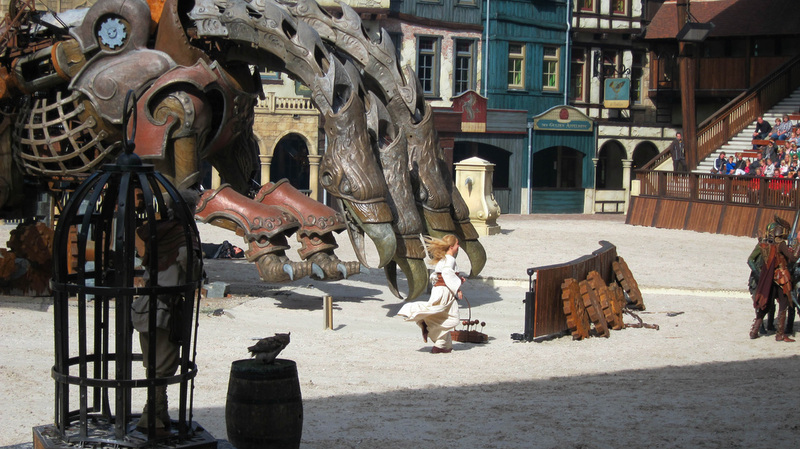 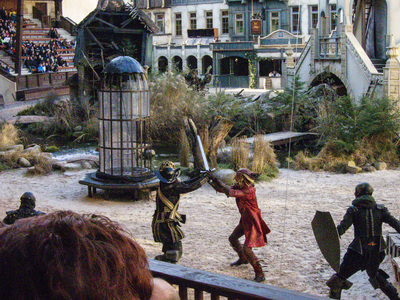 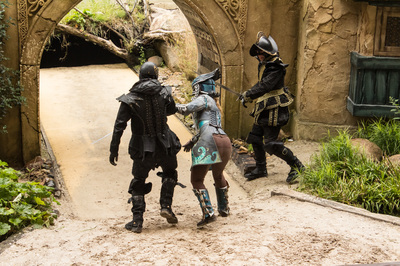 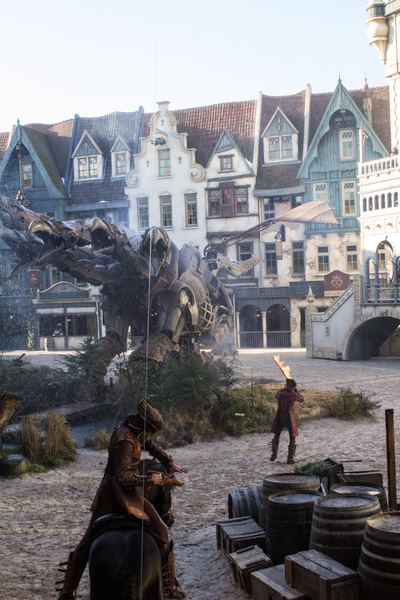 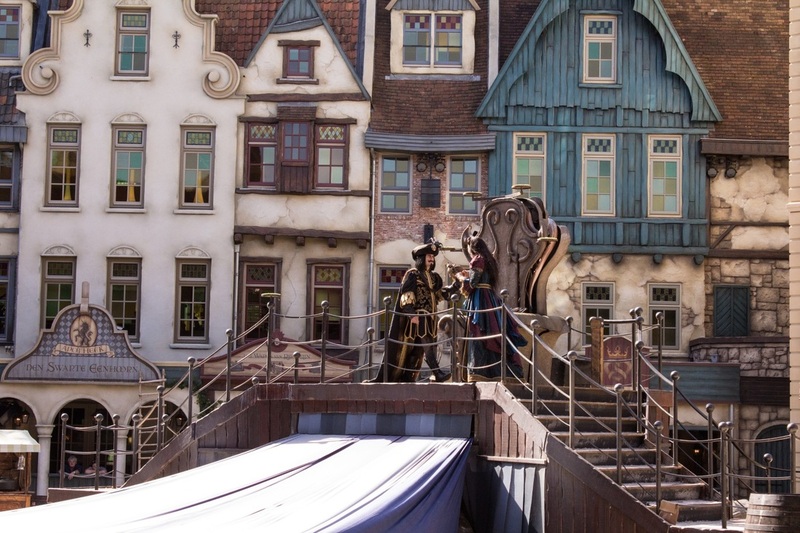 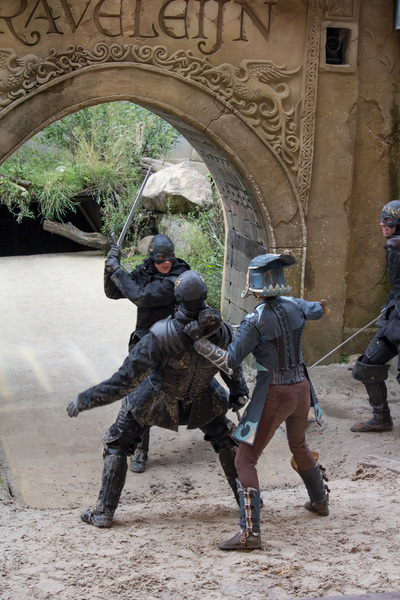 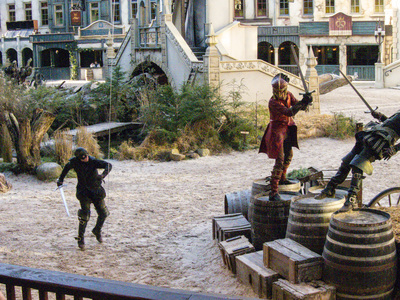 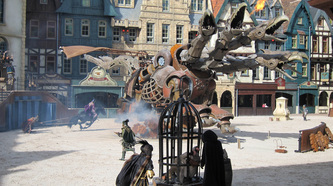 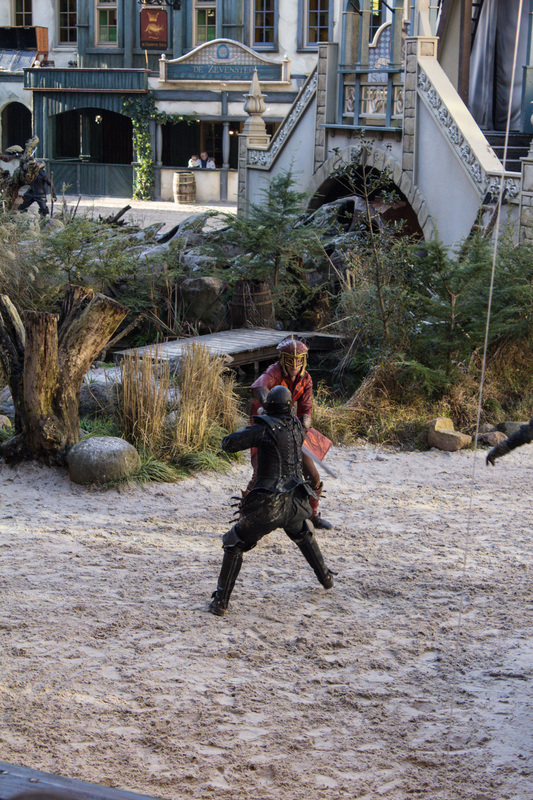 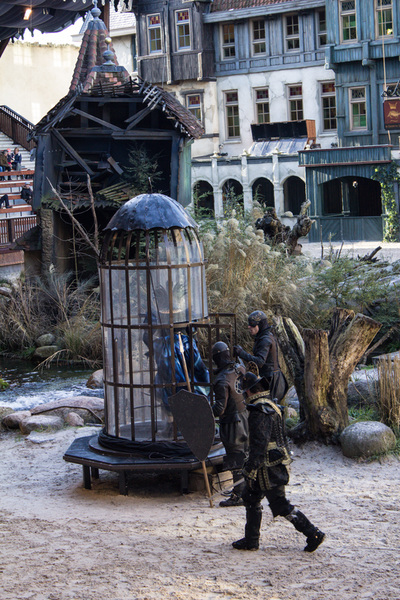 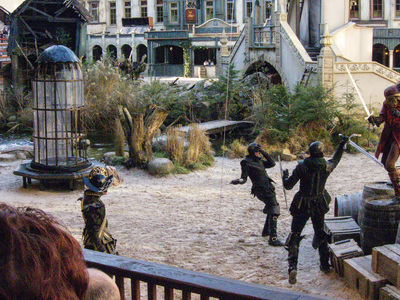 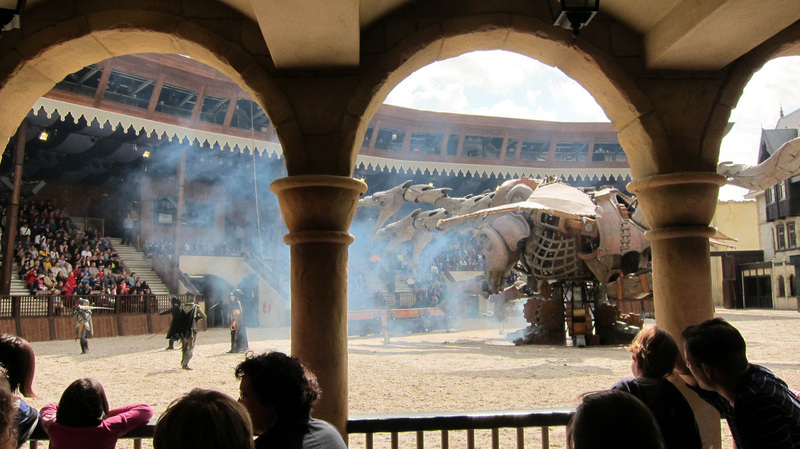 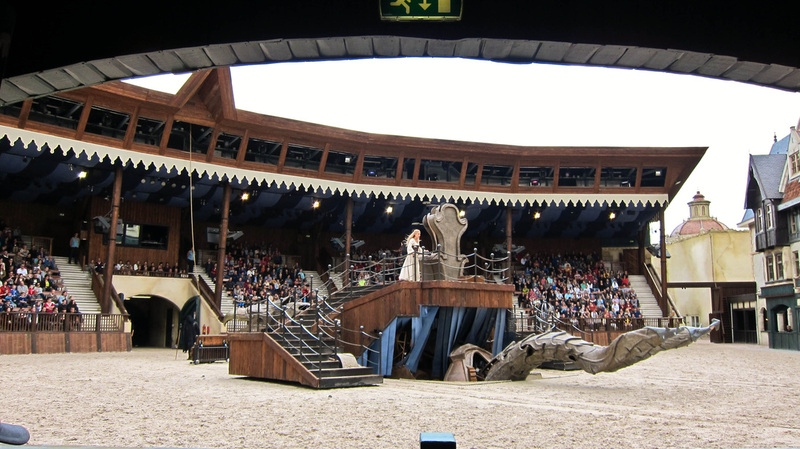 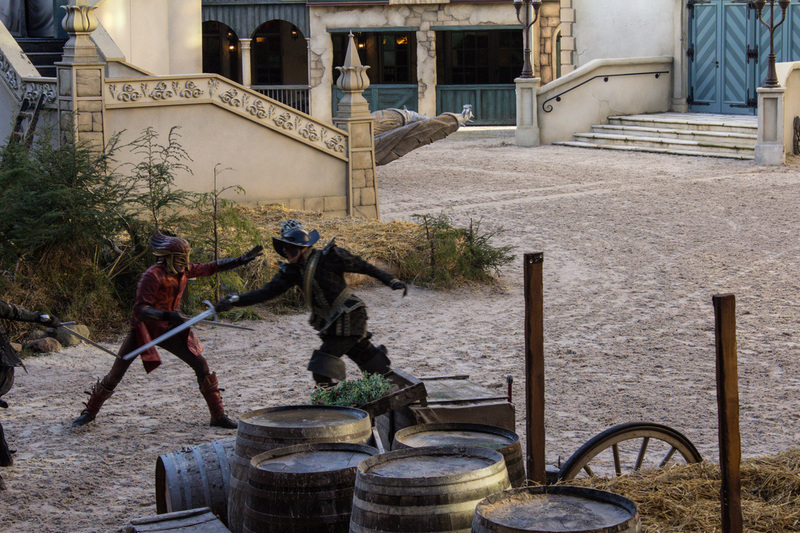 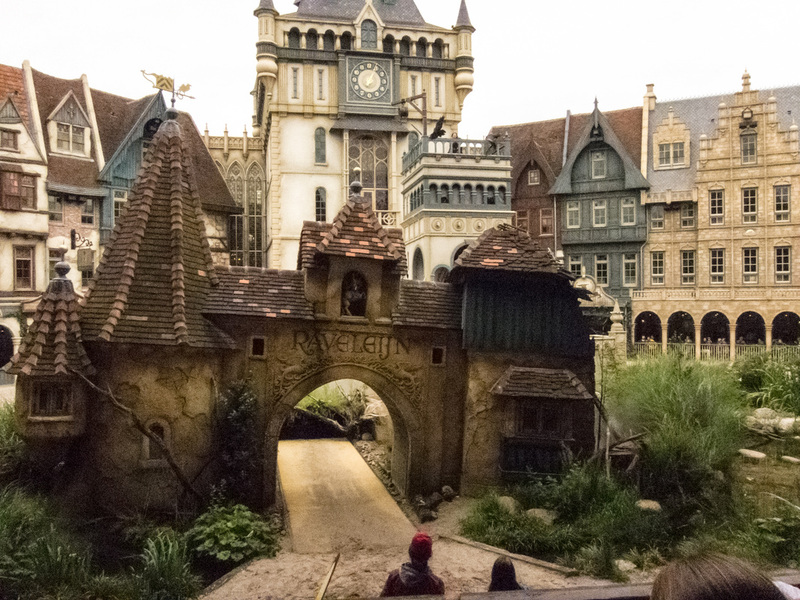 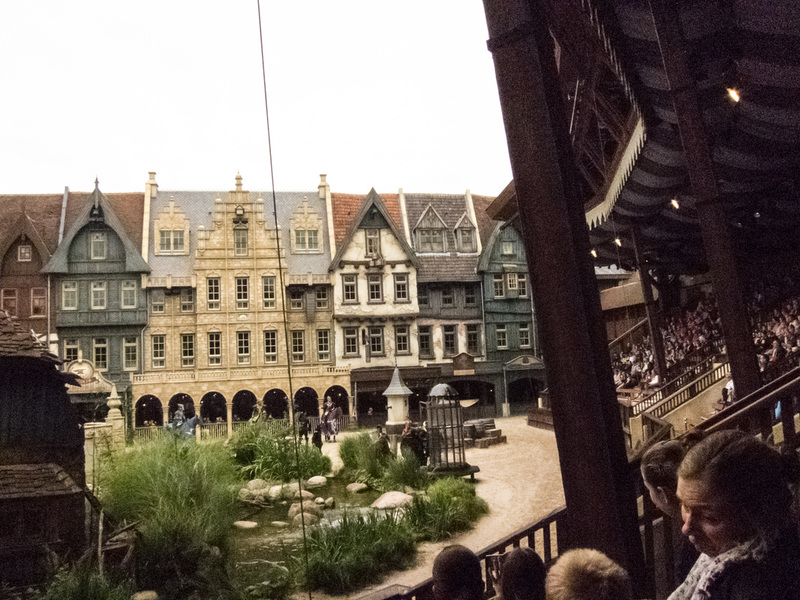 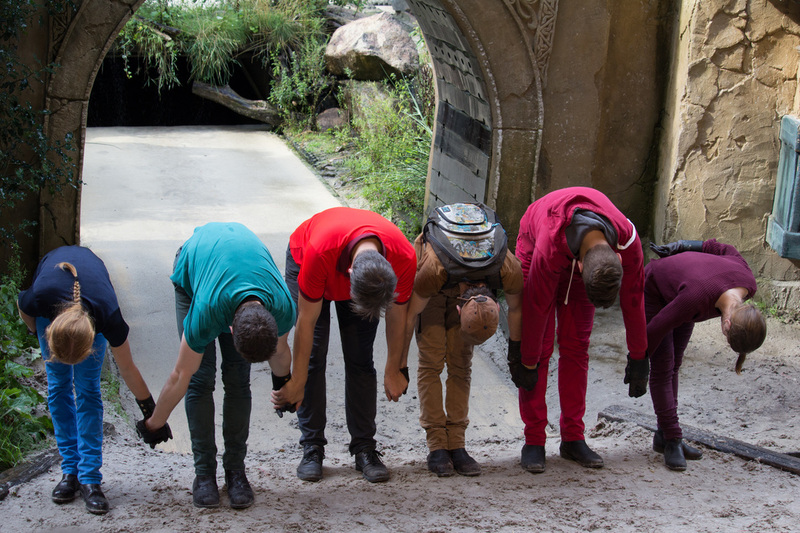 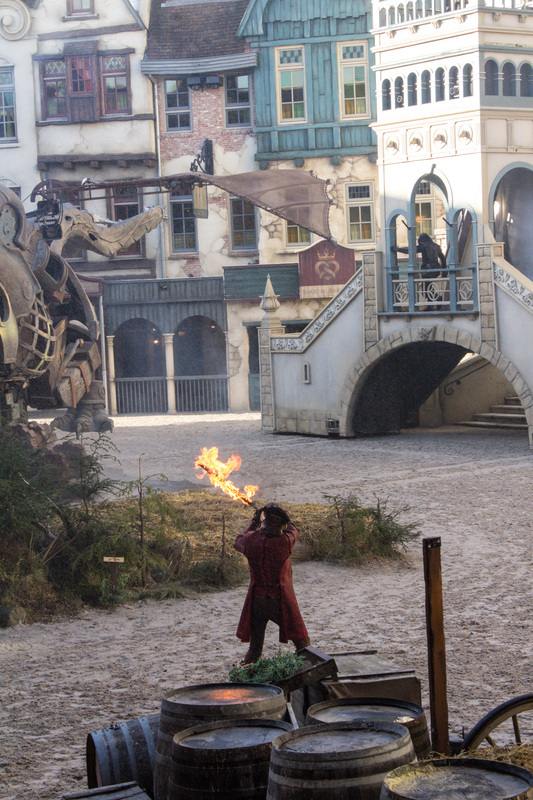 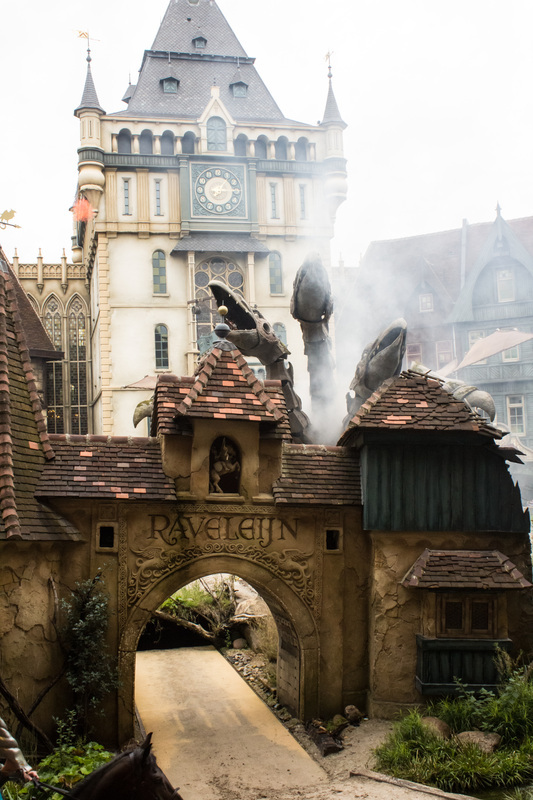 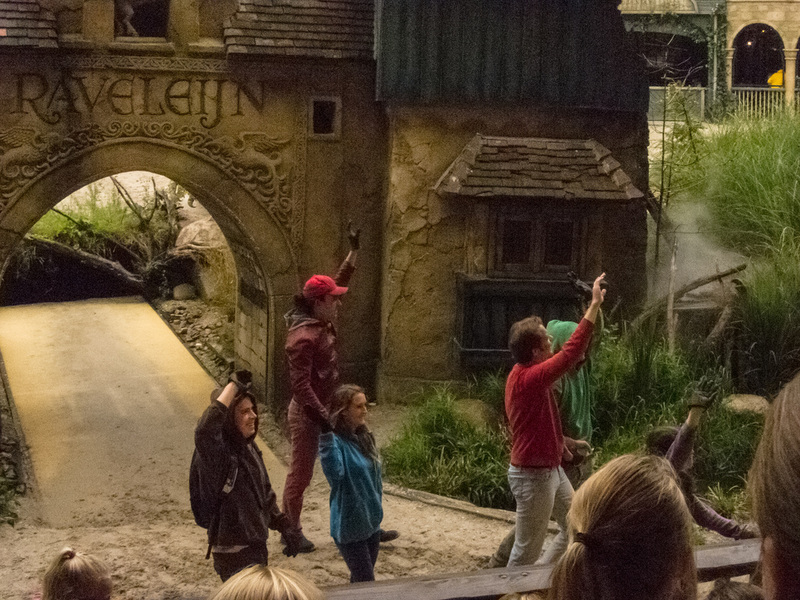 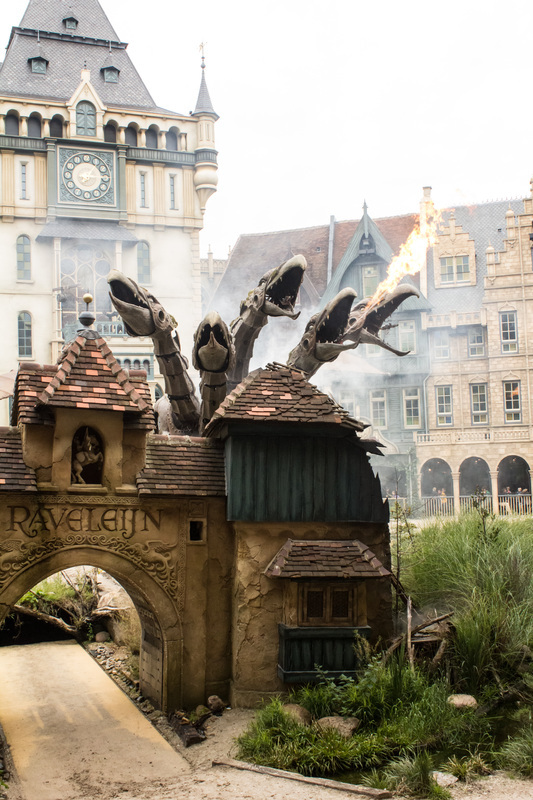 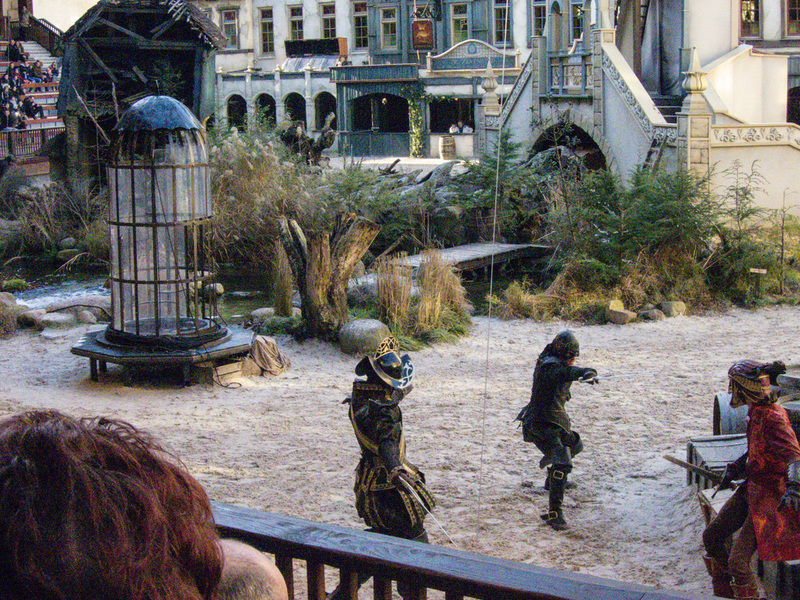 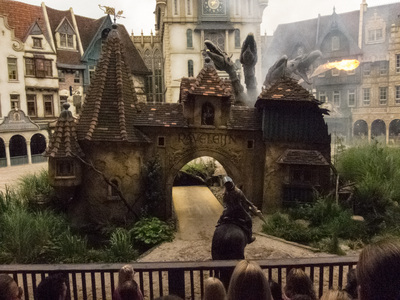 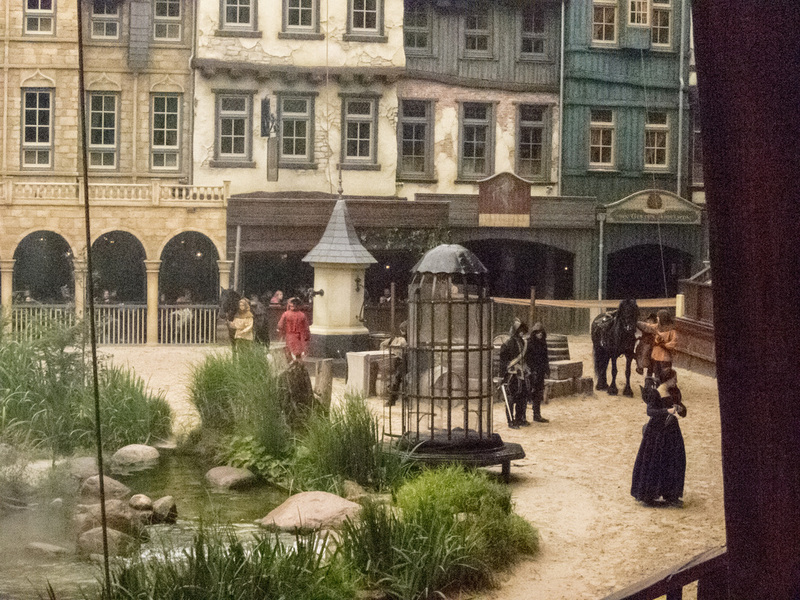 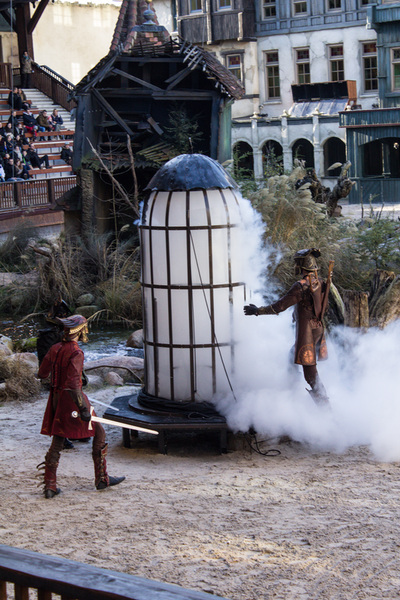 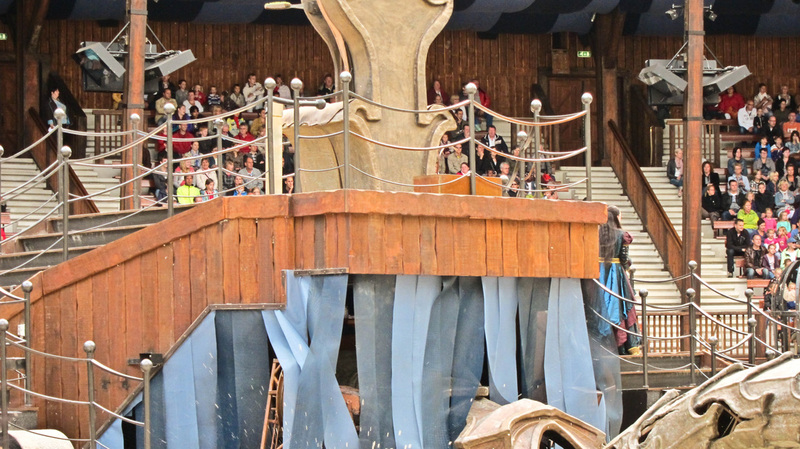 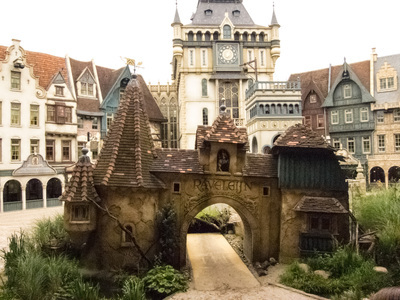 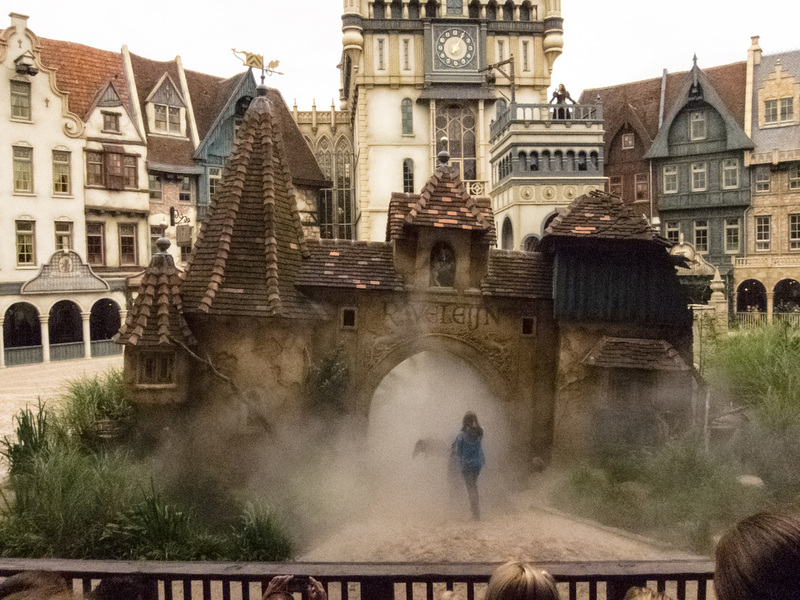 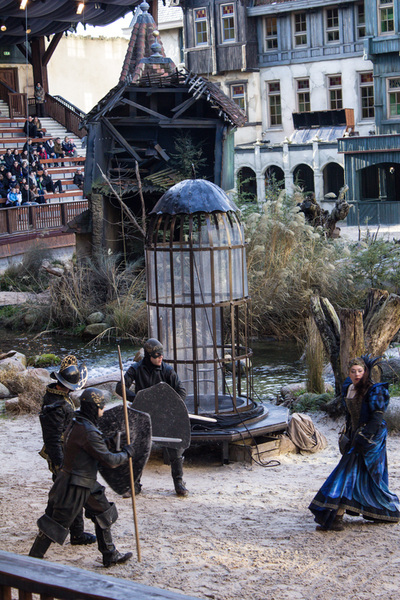 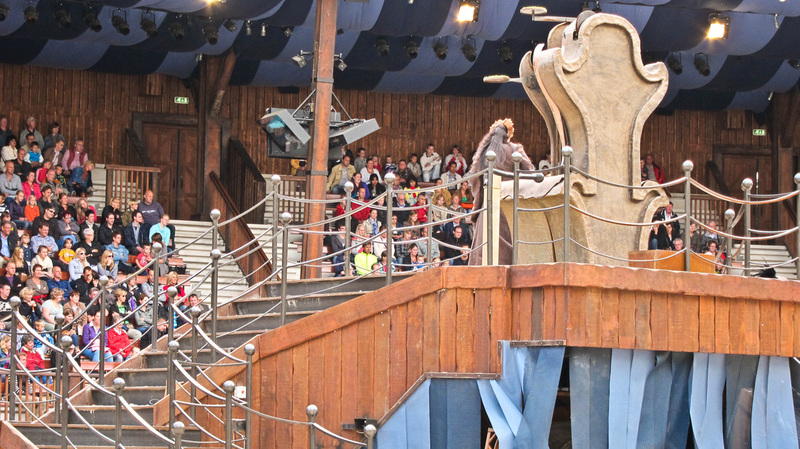 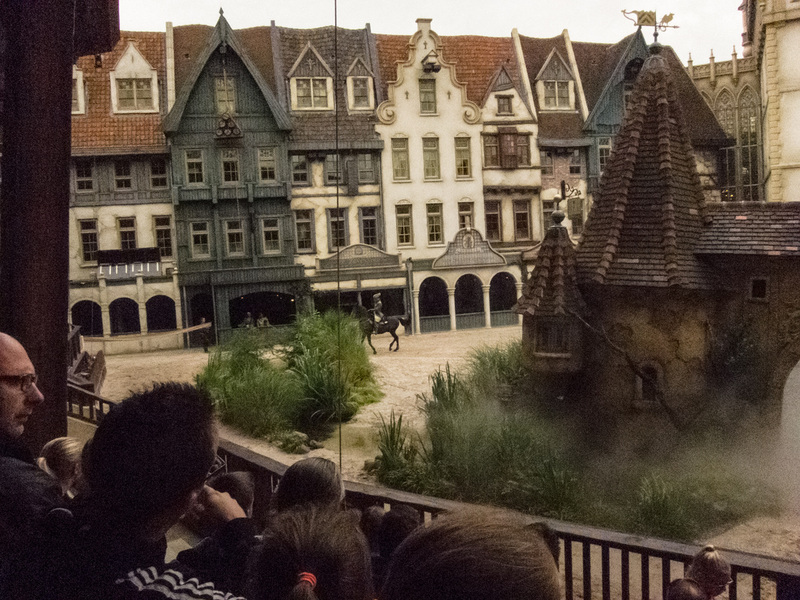 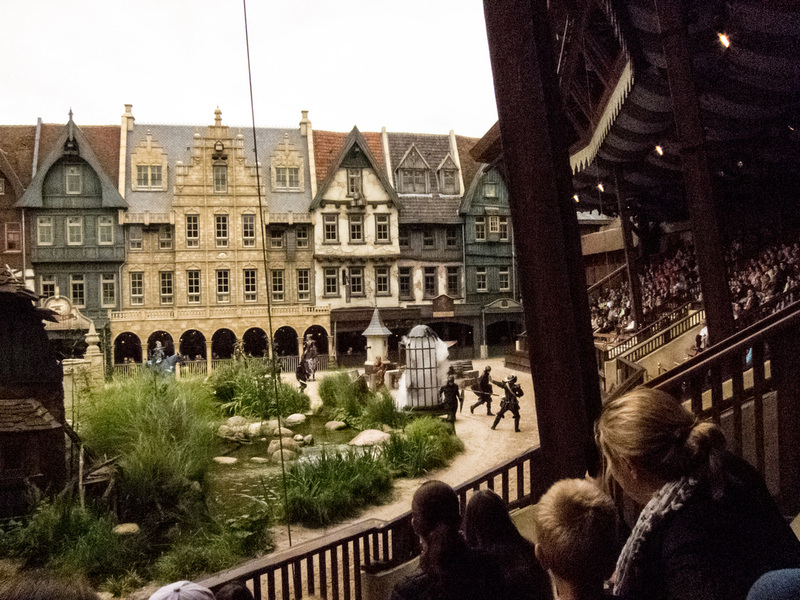 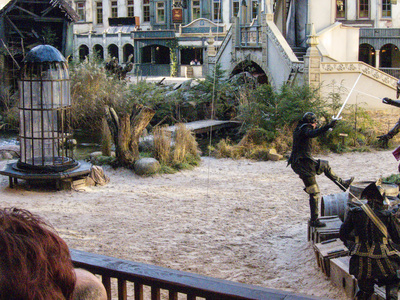 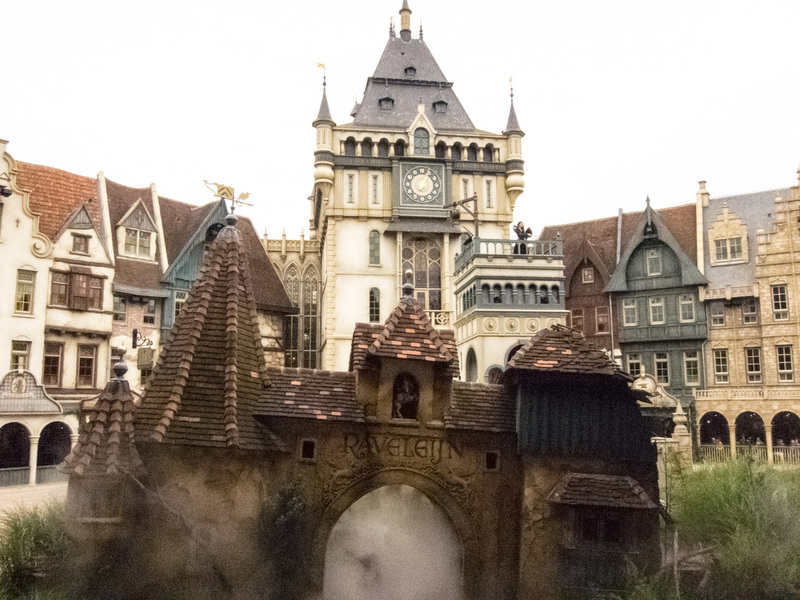 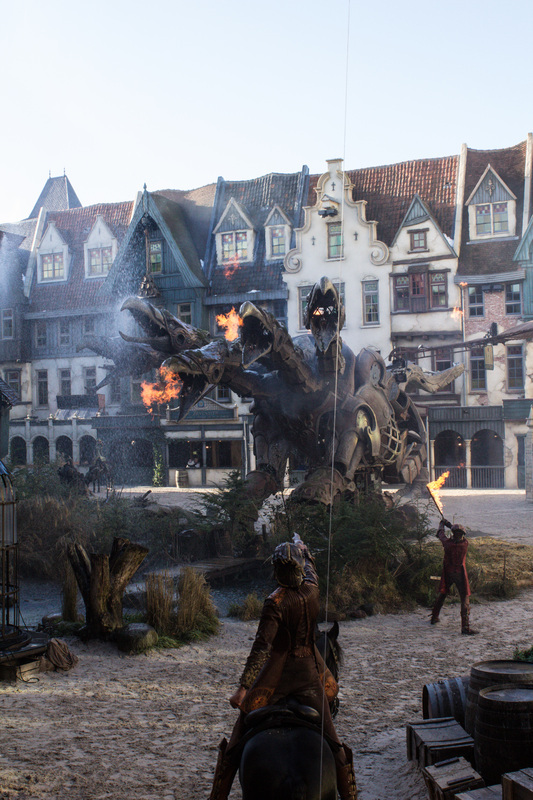 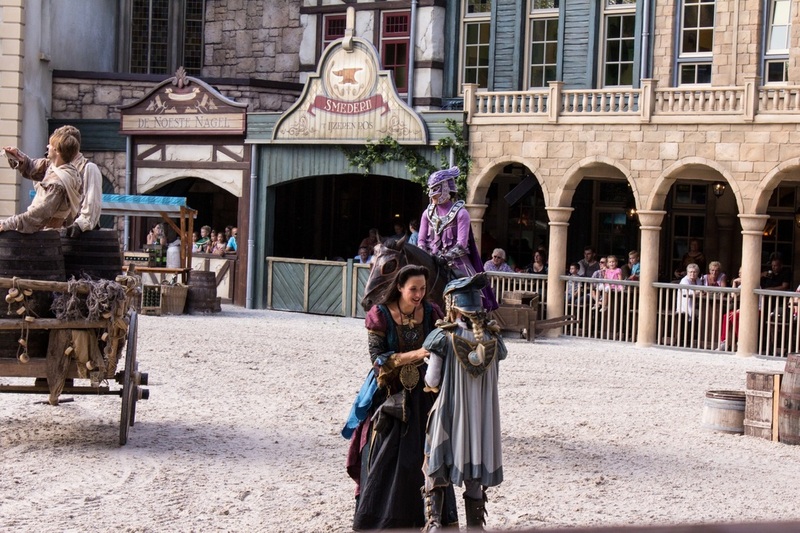 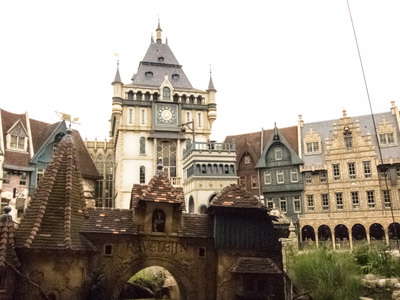 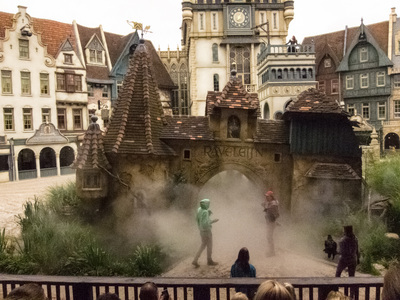 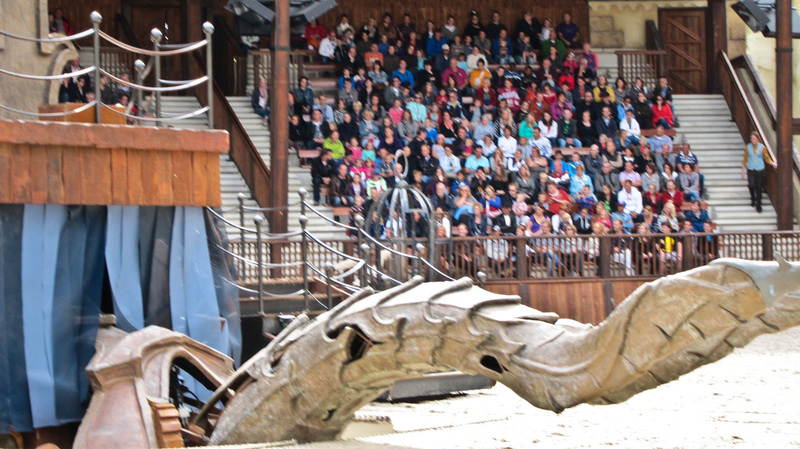 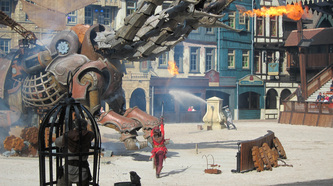 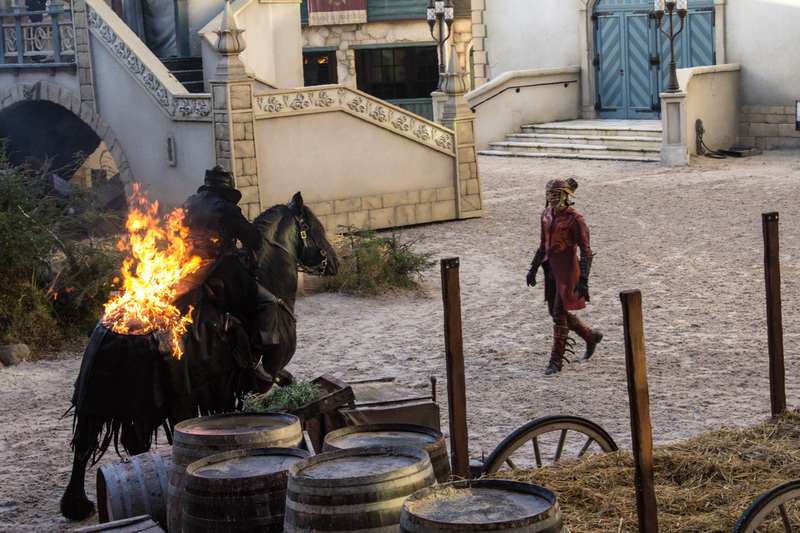 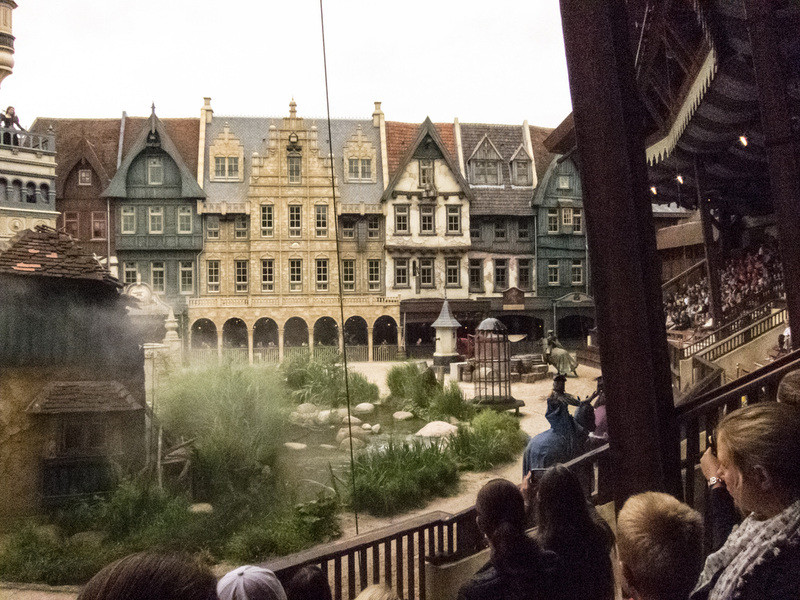 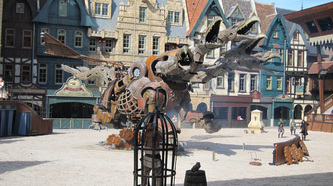 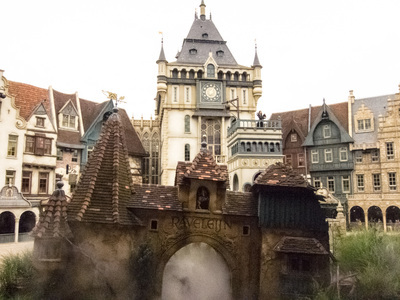 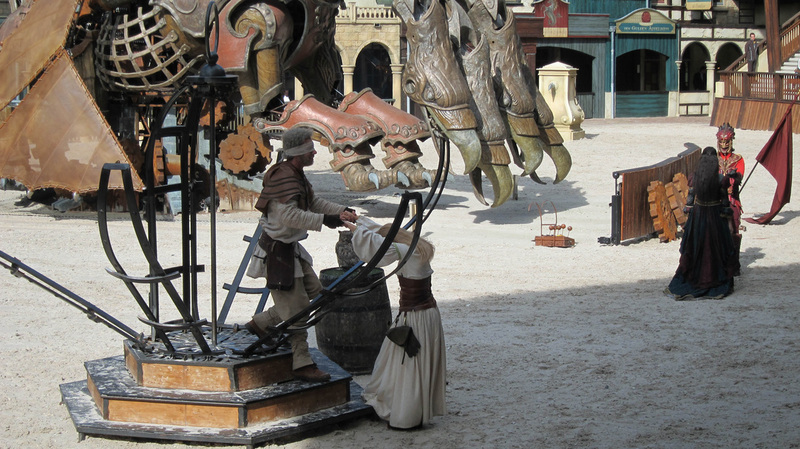 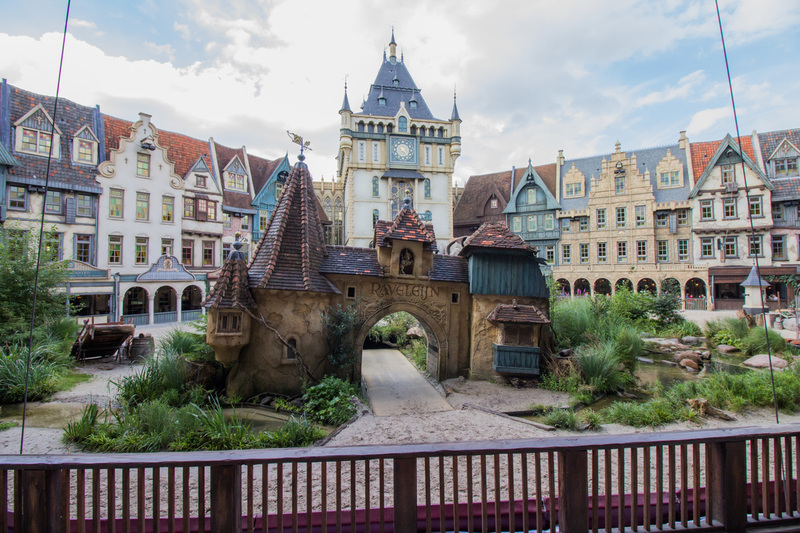 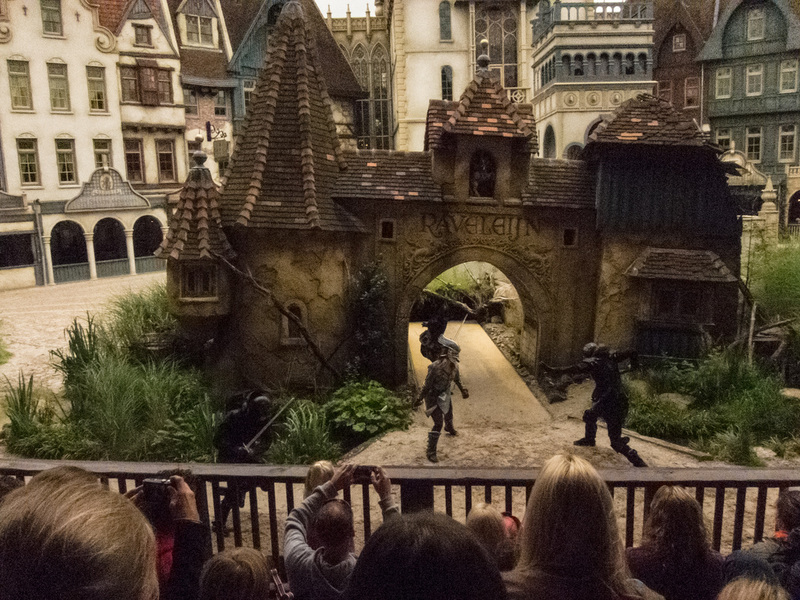 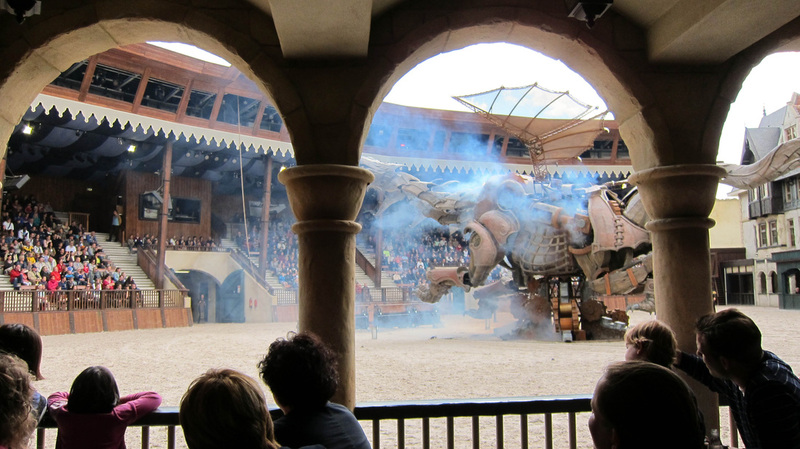 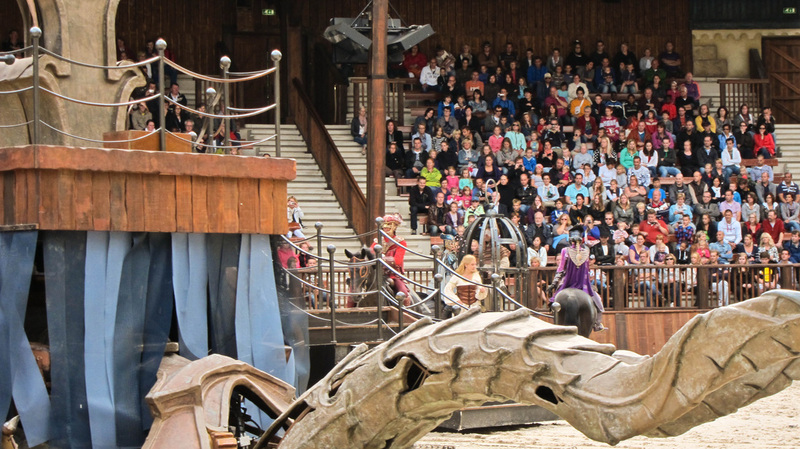 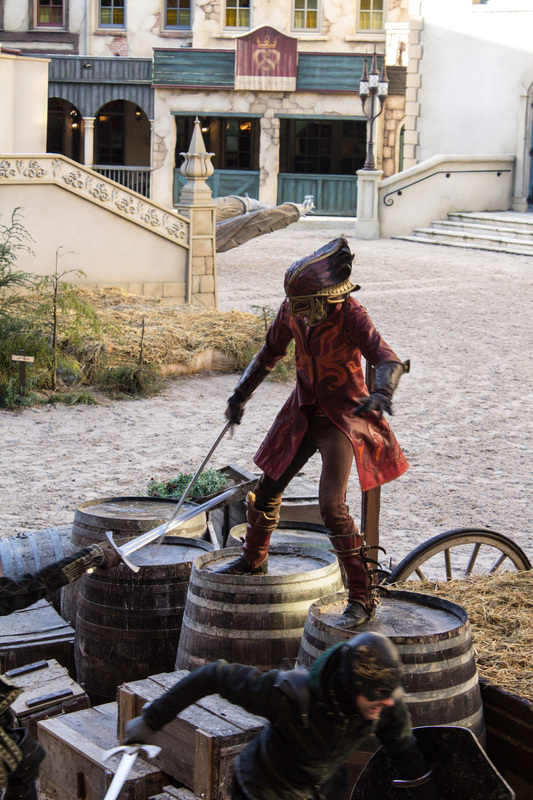 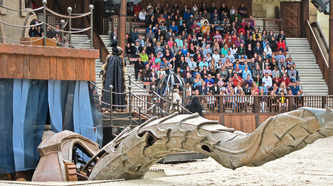 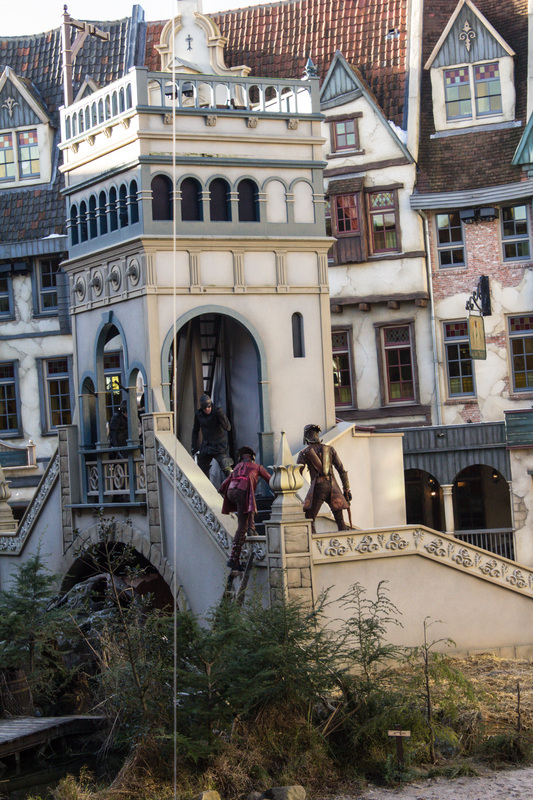 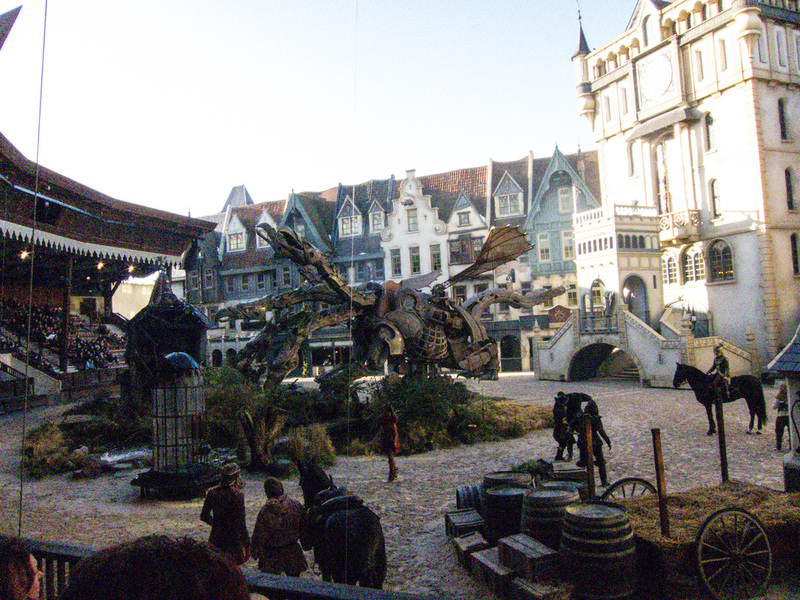 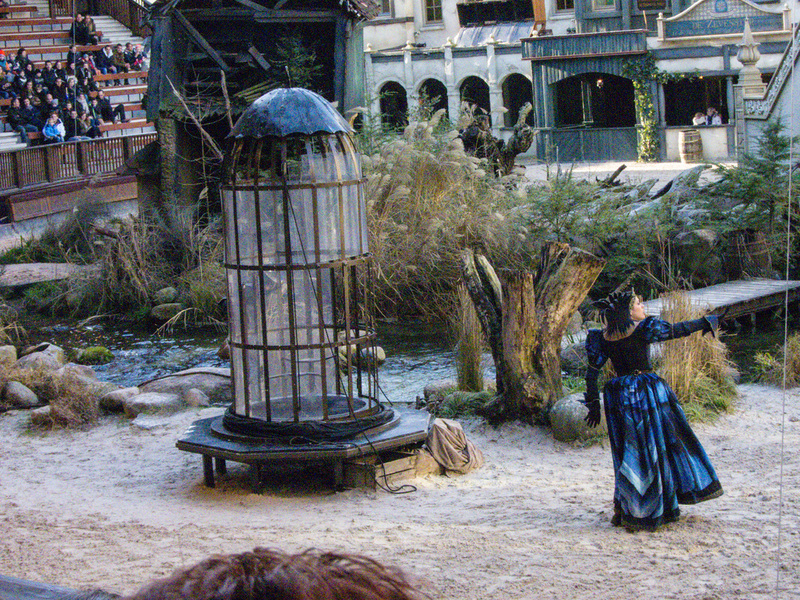 Explore the ruined gate giving access to the magical city Raveleijn and enjoy the spectacular park show. 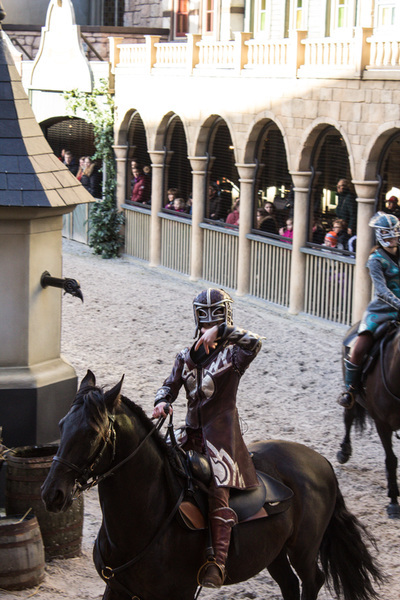 Five children grow to horsemen who compete with their ruler and an even greater horror. Do not miss it and become spectators of this grand spectacle! 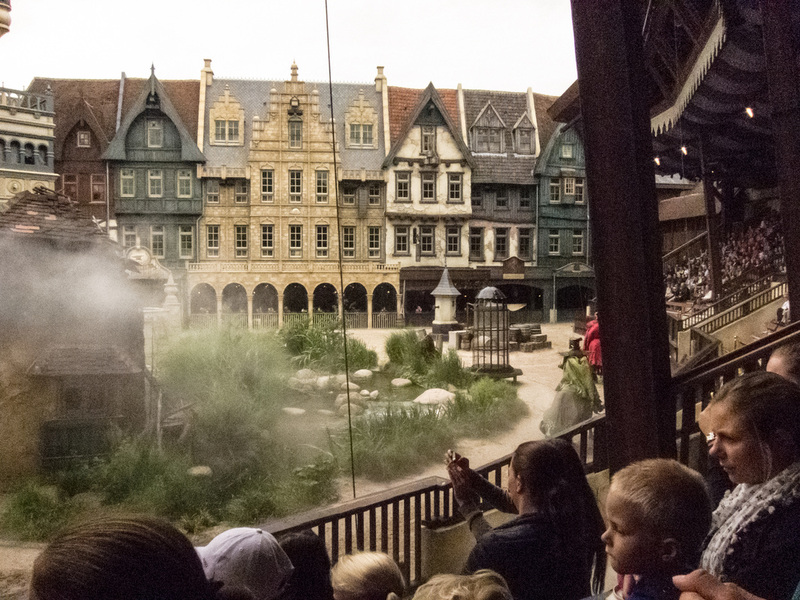 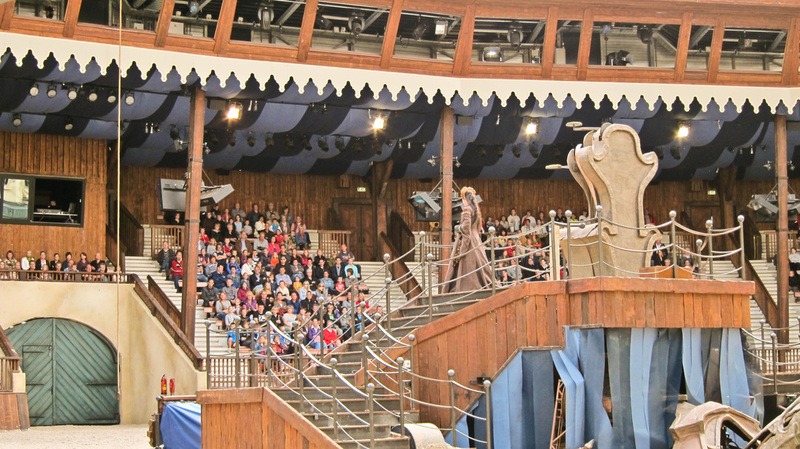 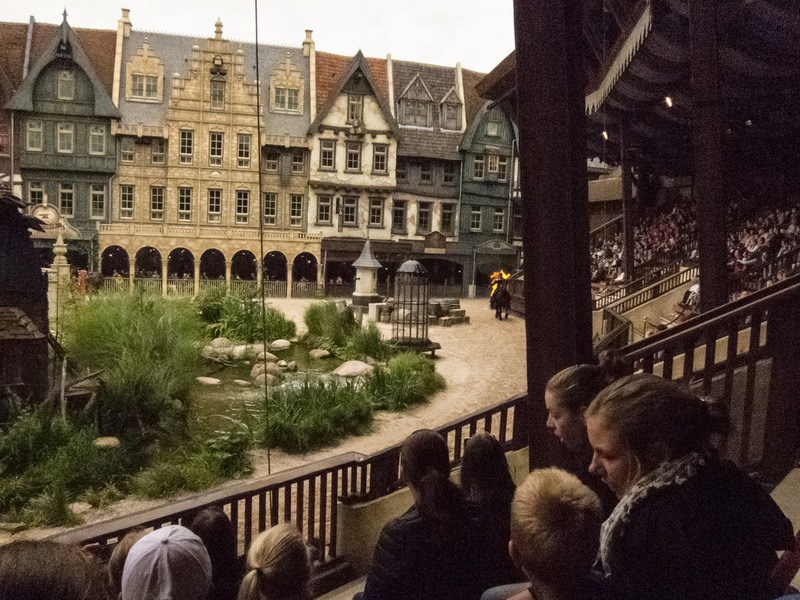 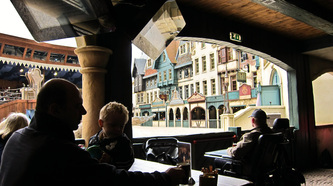 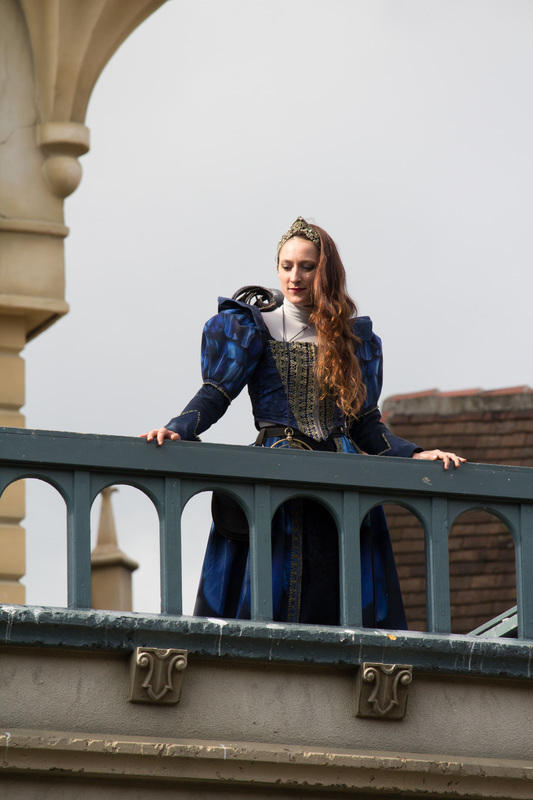 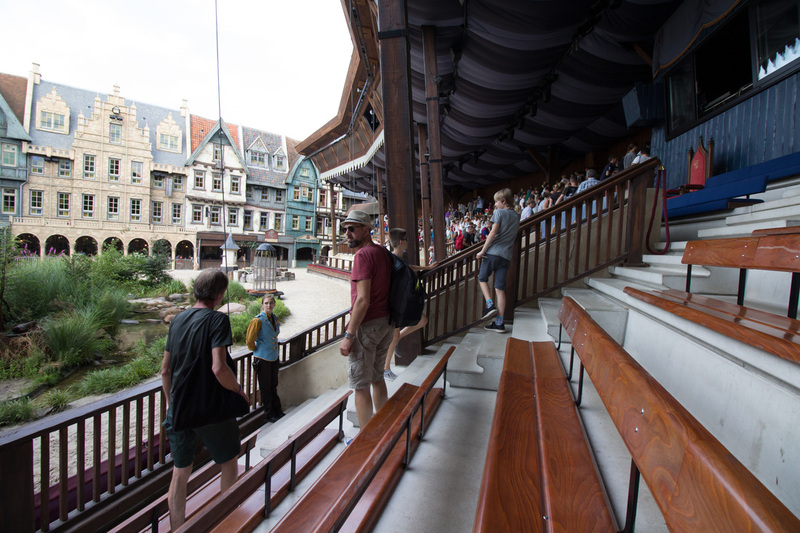 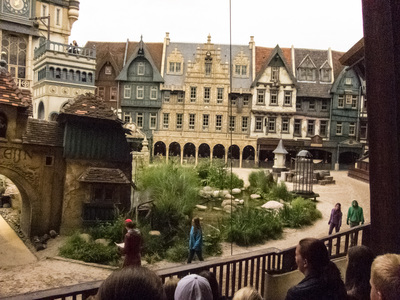 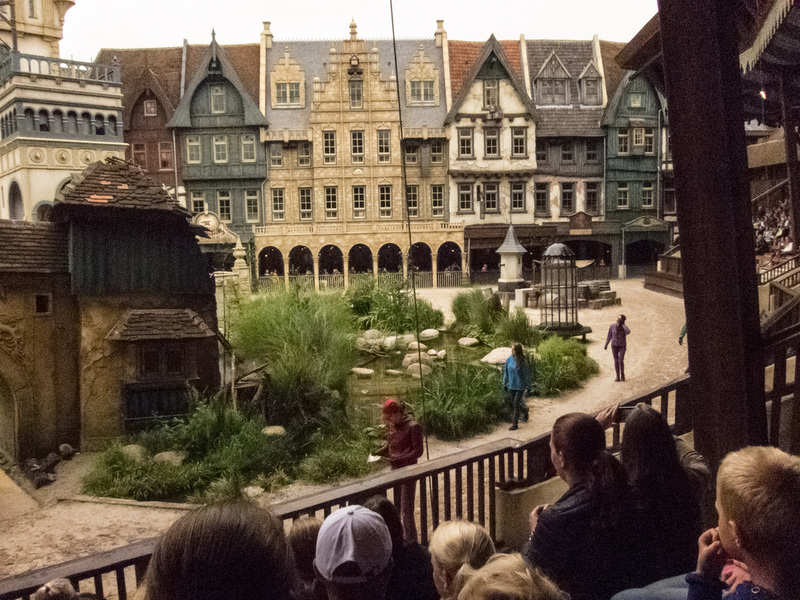 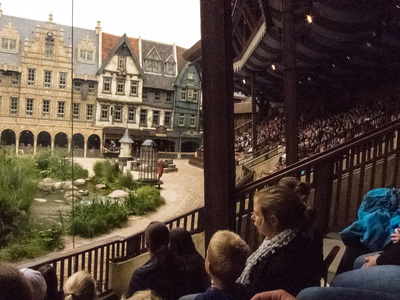 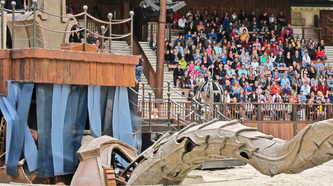 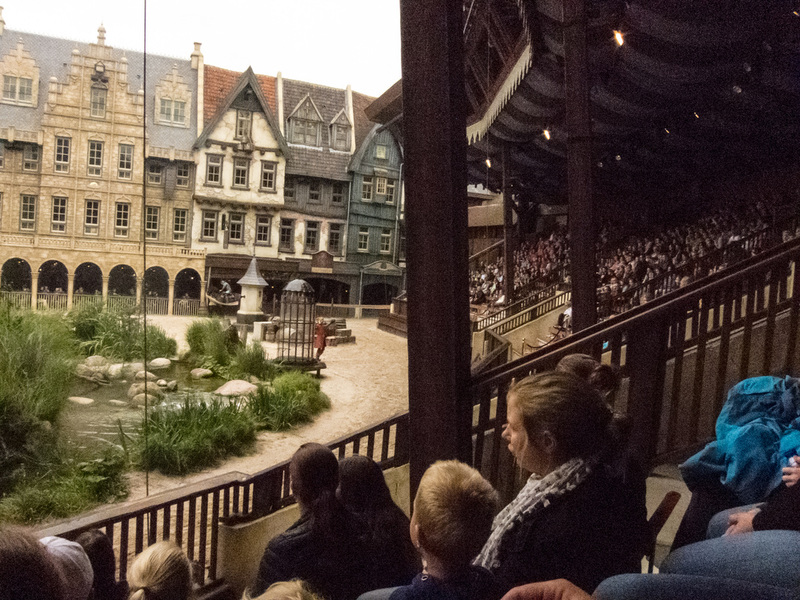 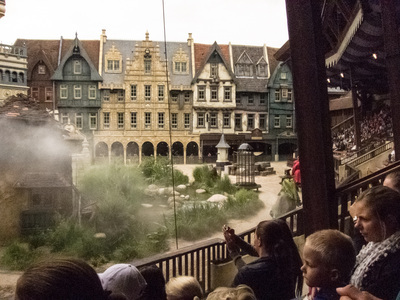 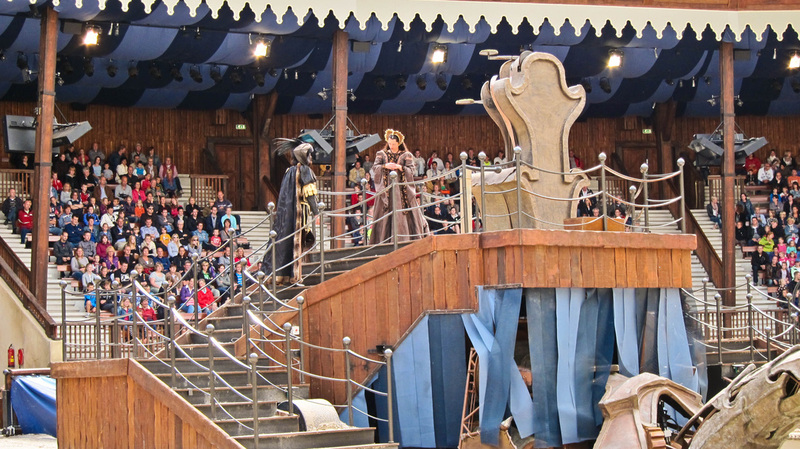 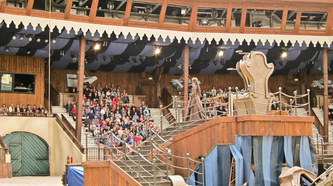 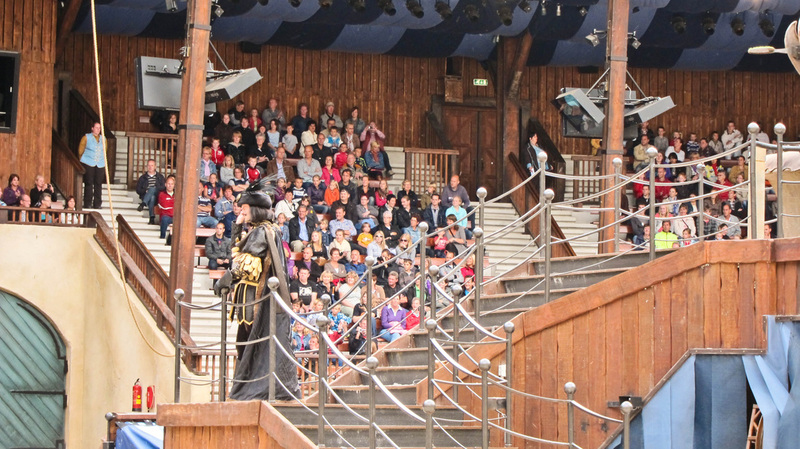 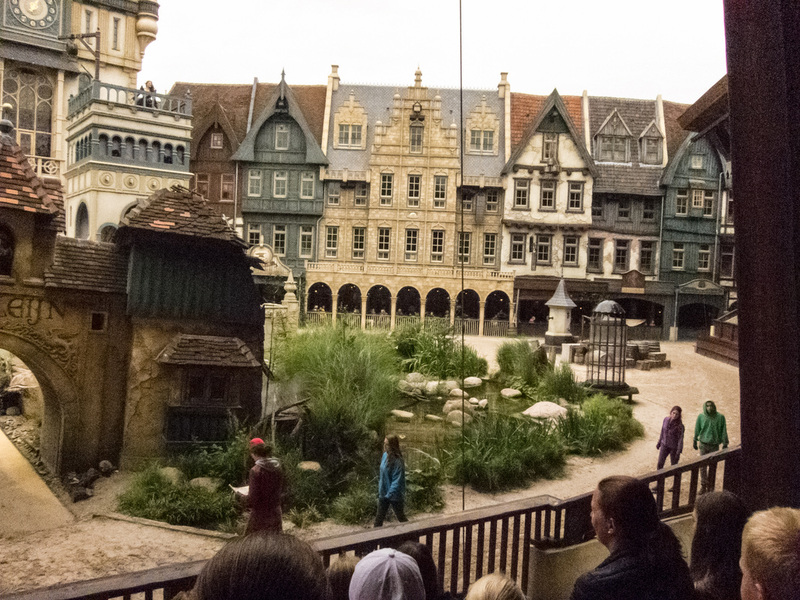 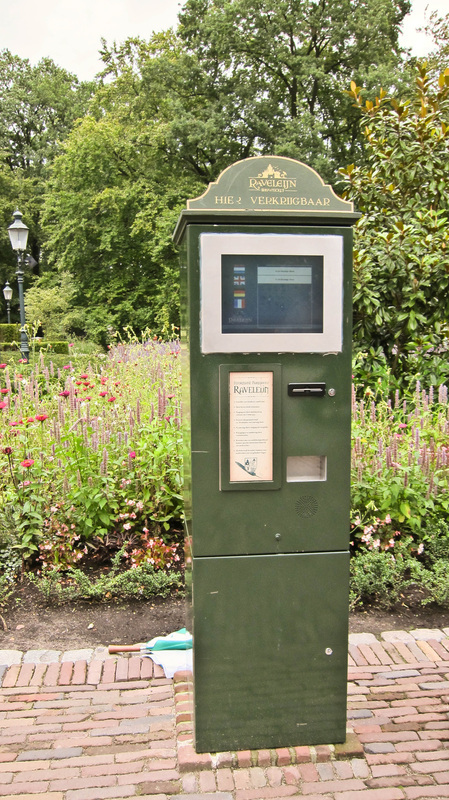 The show is in the dutch language however there may be audioboxes available with an English translation for you to use if you provide a € 5 deposit which will be returned upon return of the audiobox. 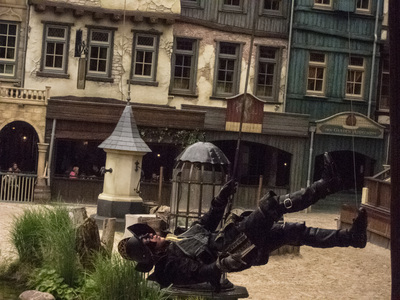 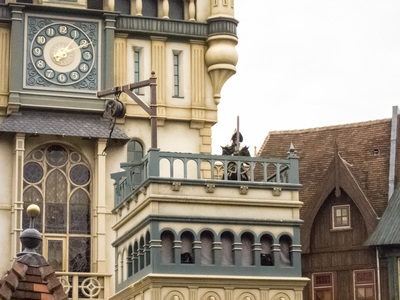 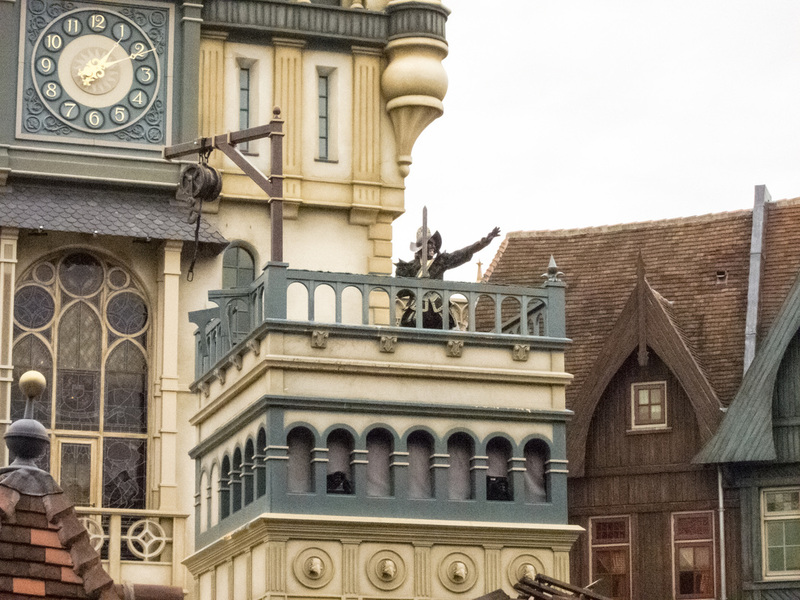 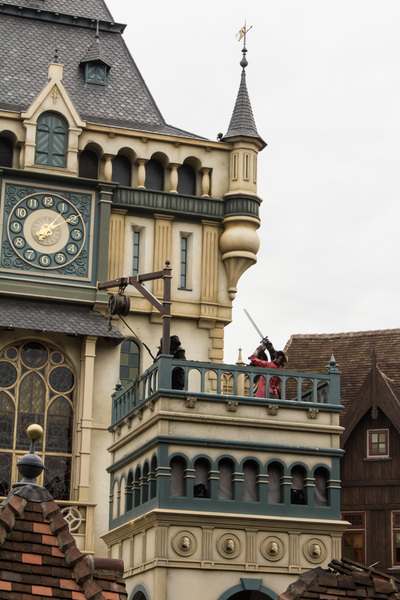 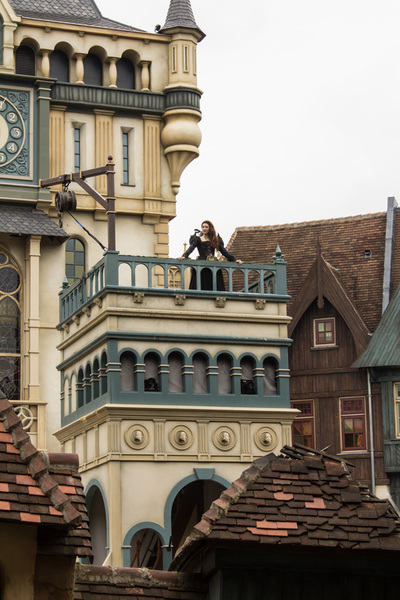 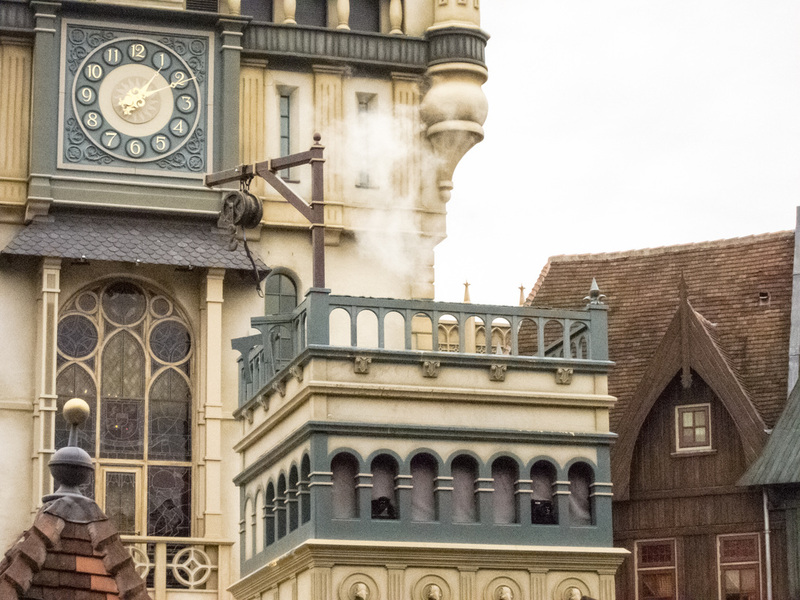 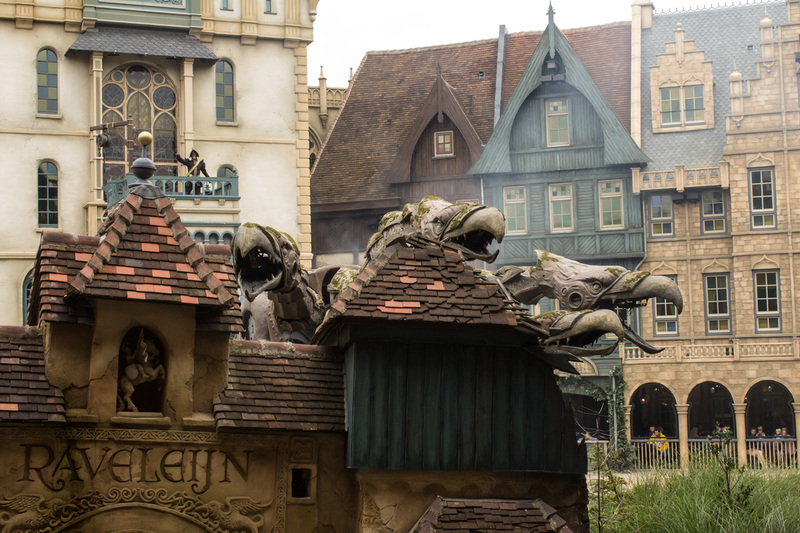 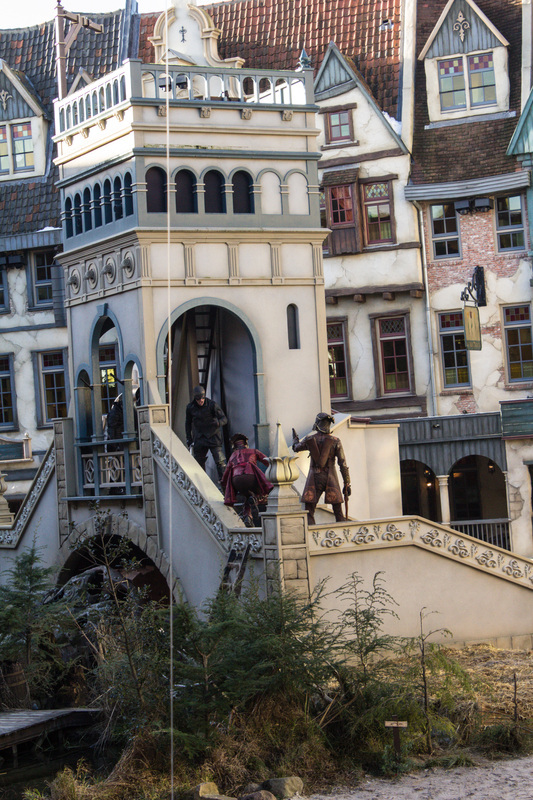 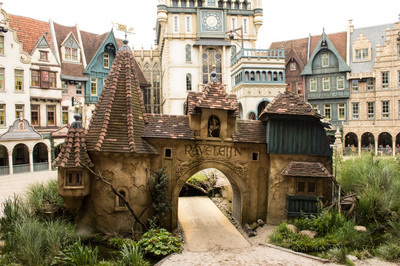 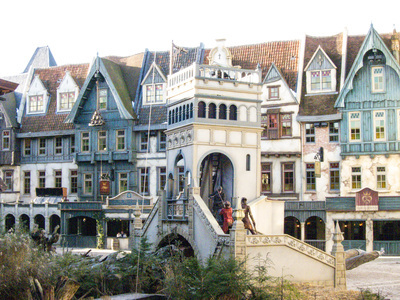 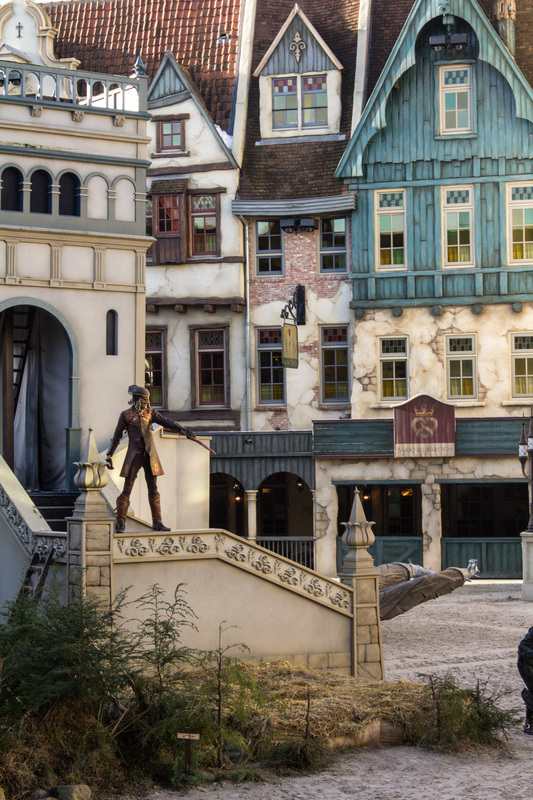 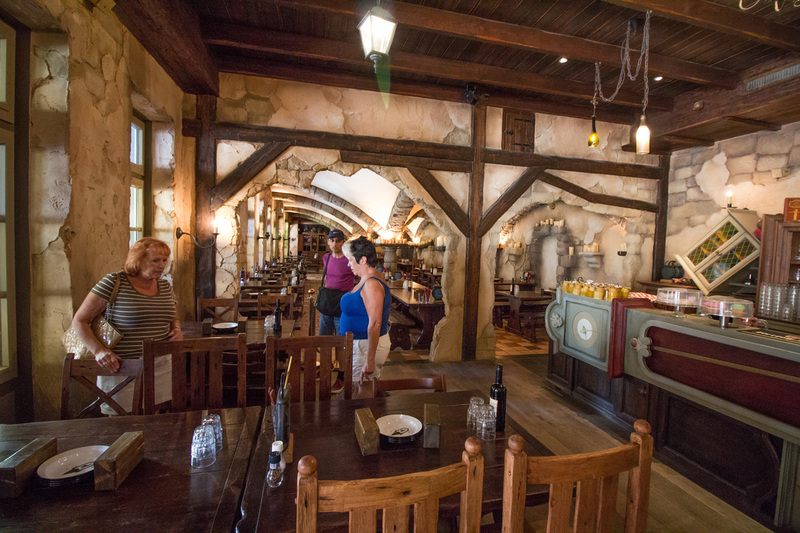 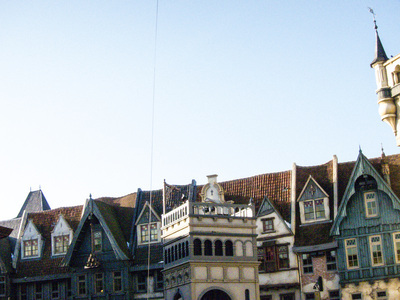 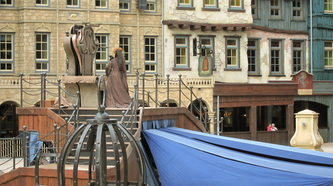 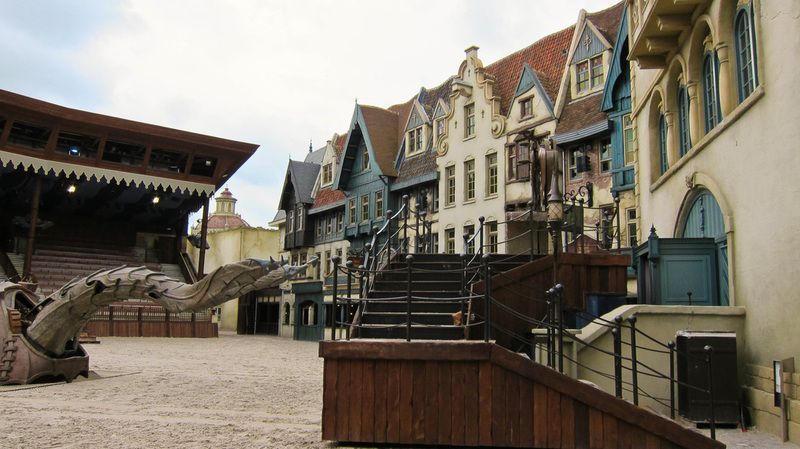 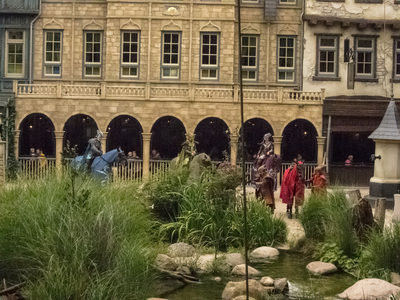 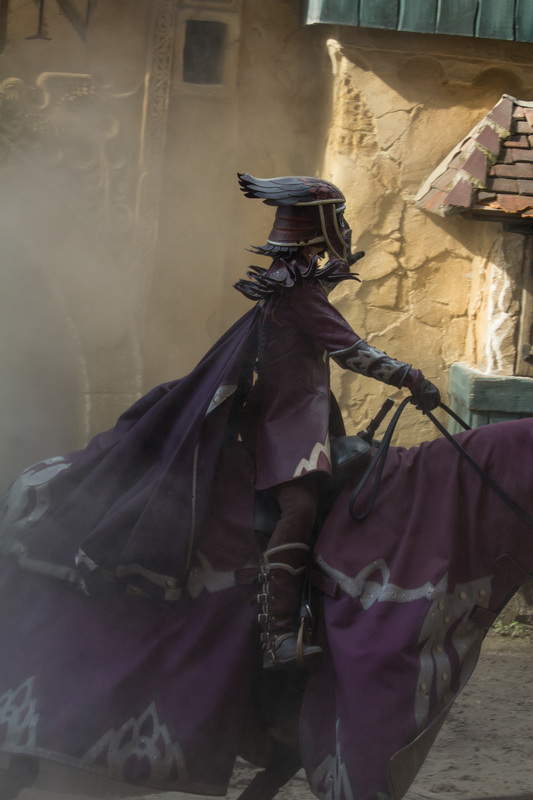 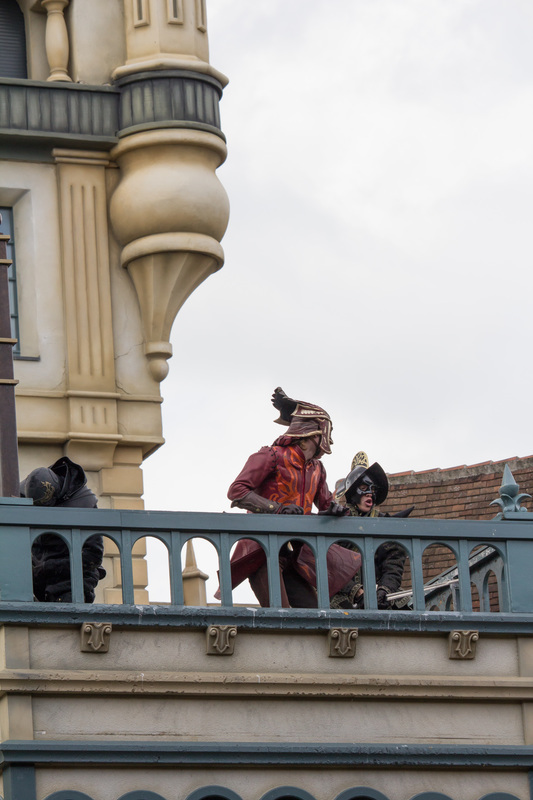 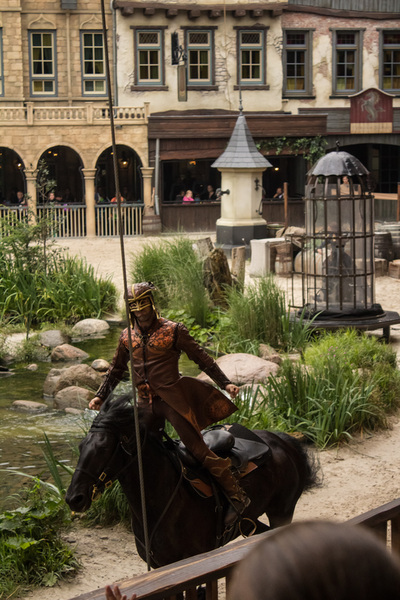 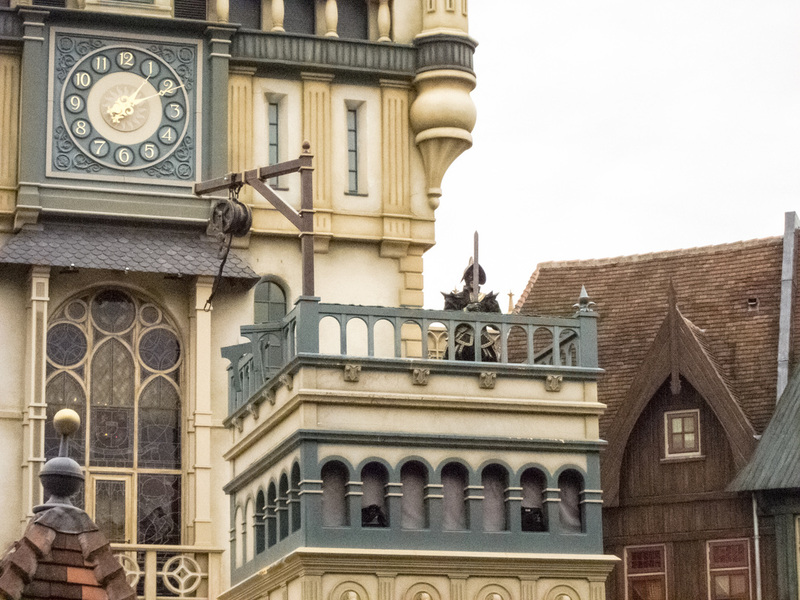 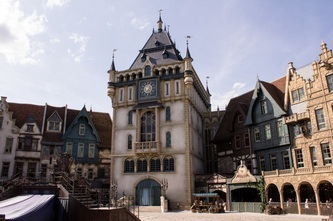 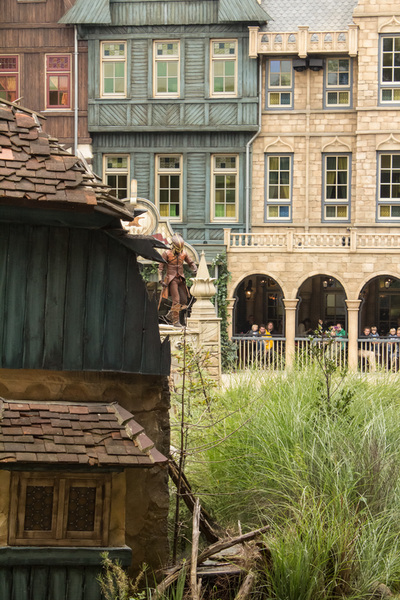 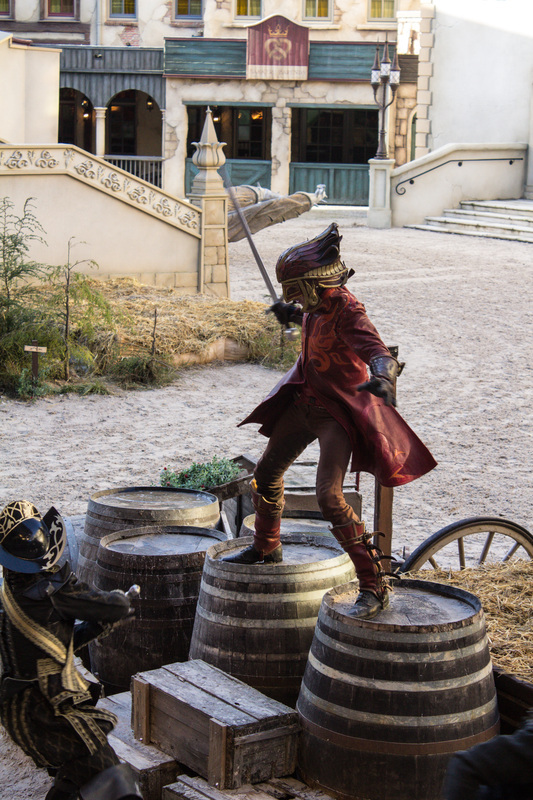 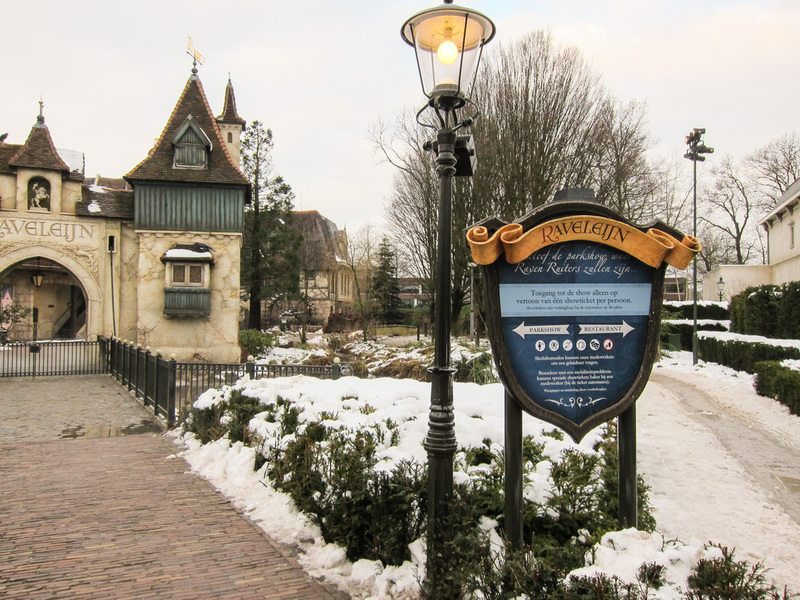 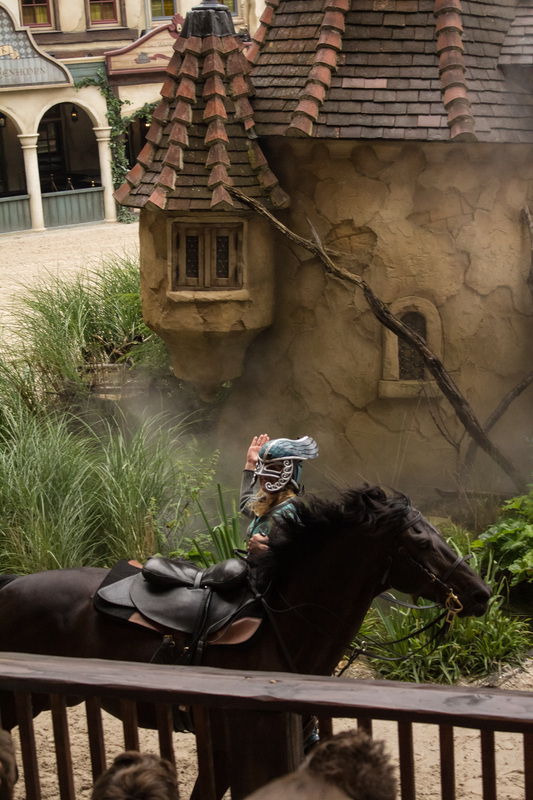 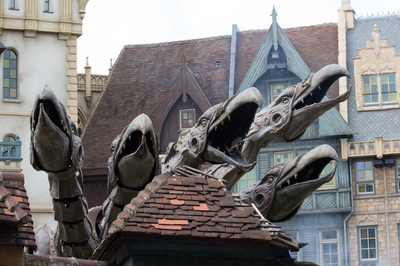 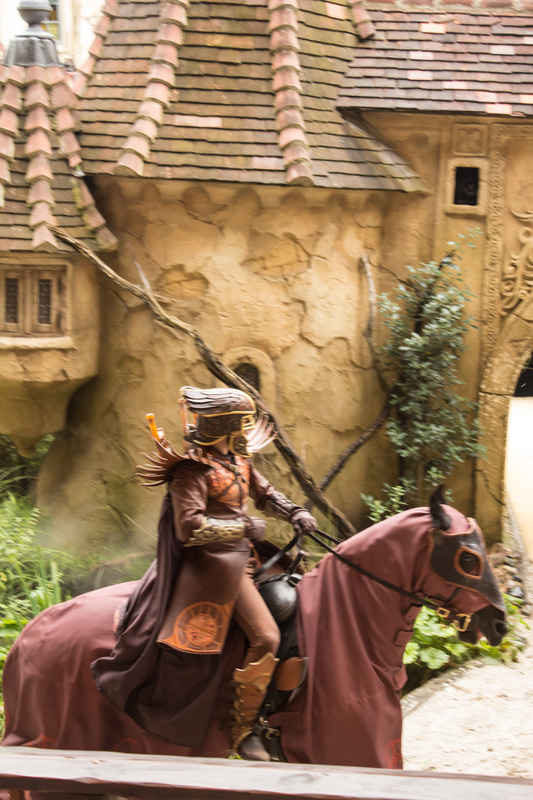 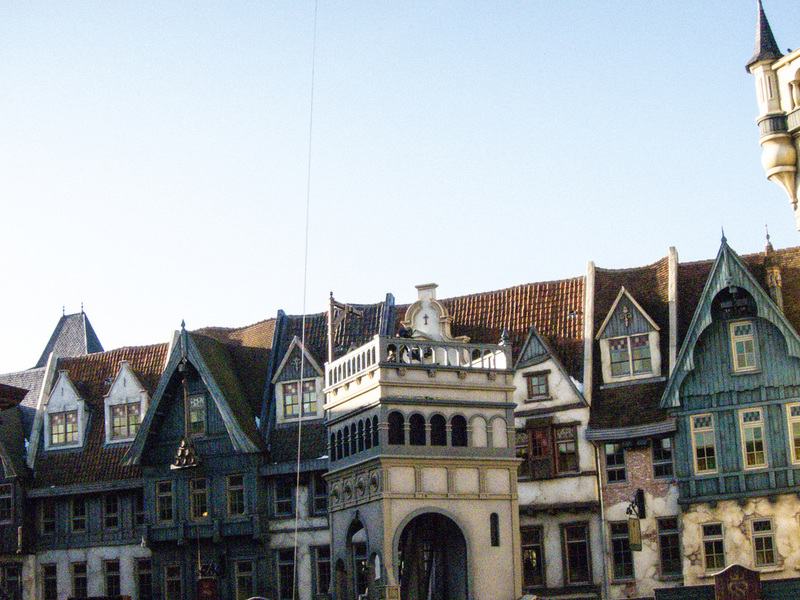 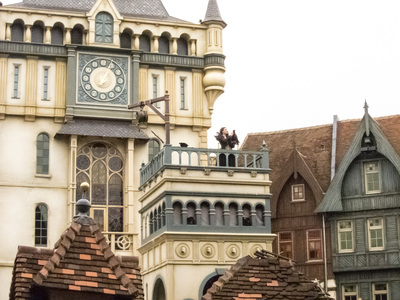 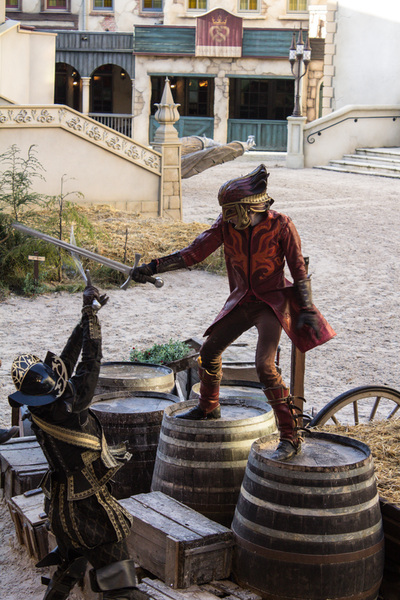 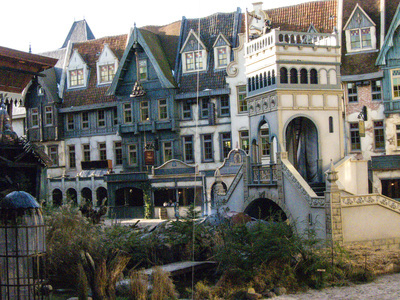 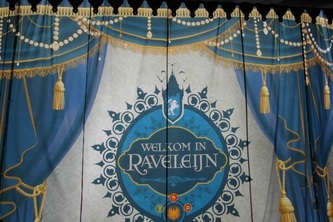 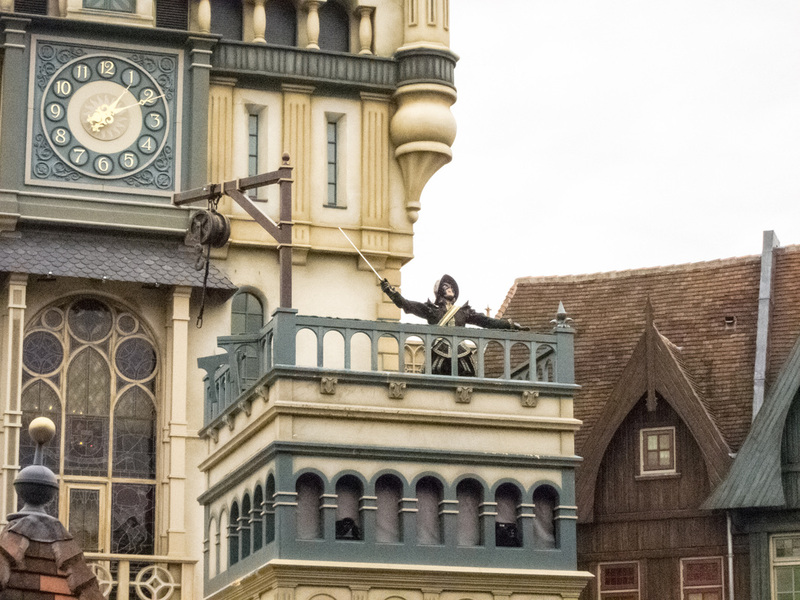 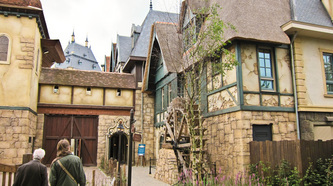 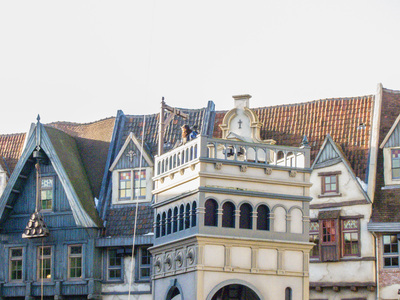 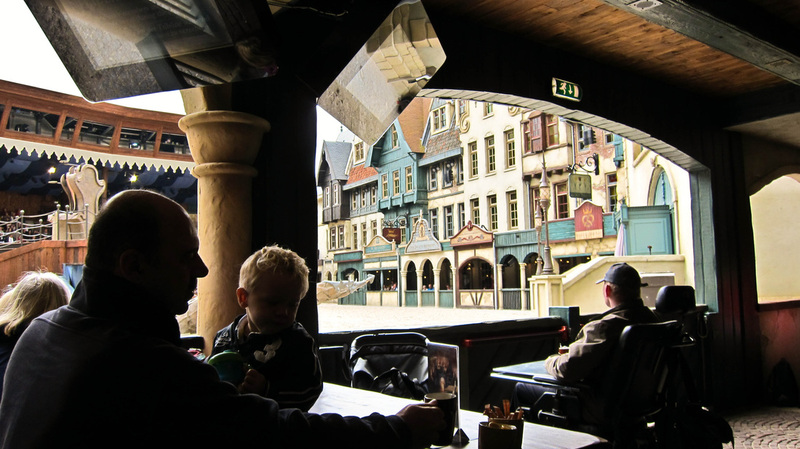 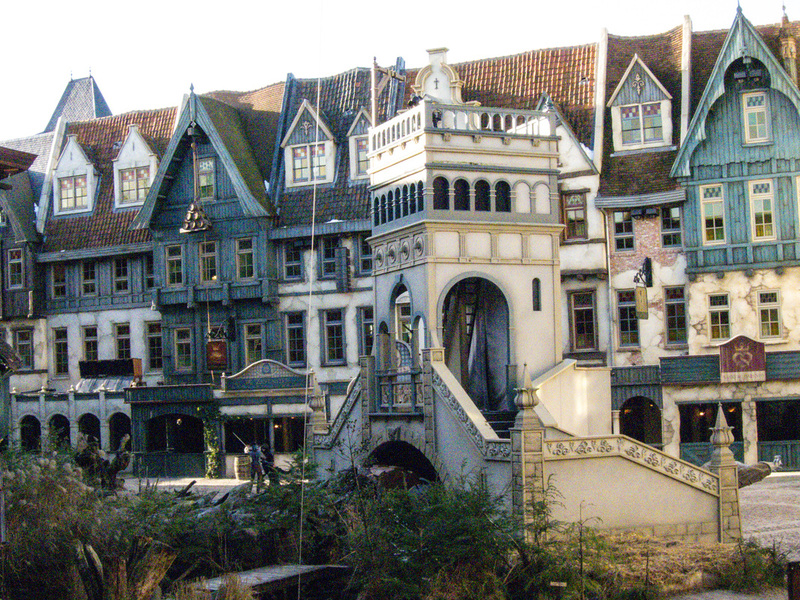 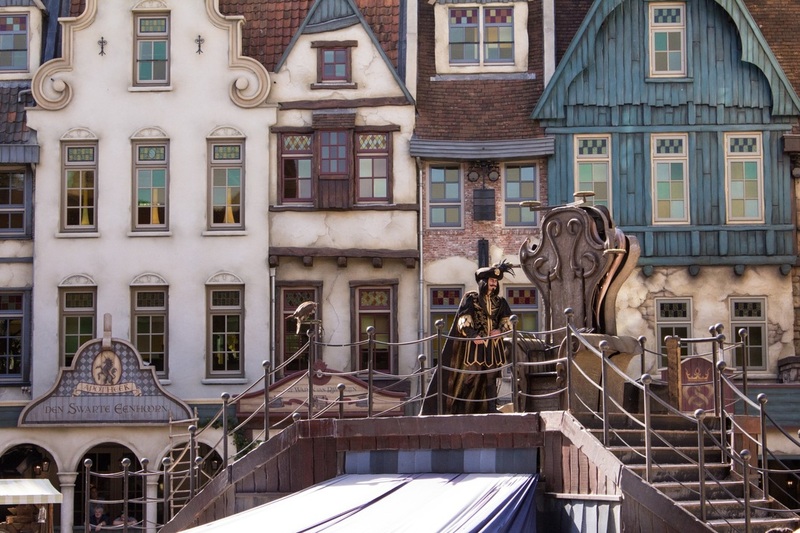 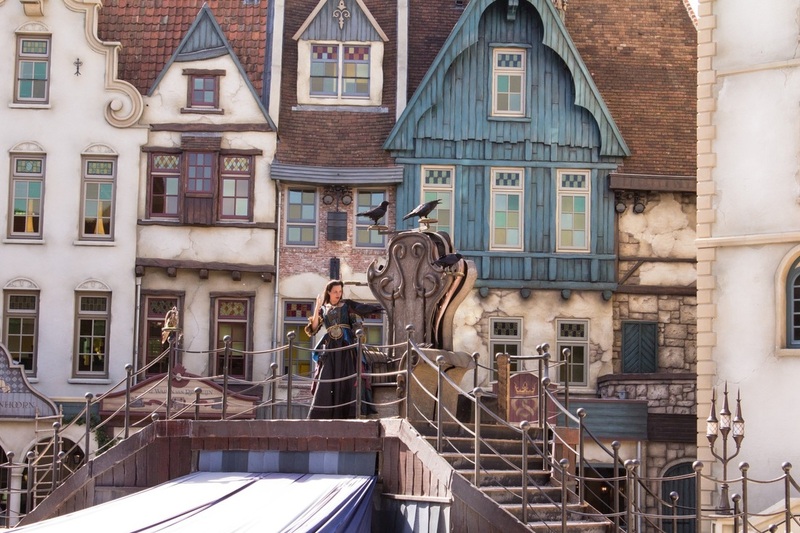 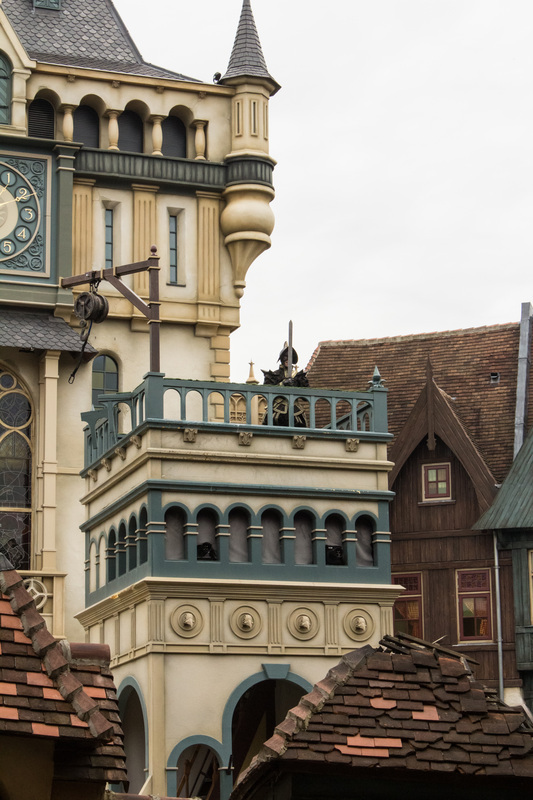 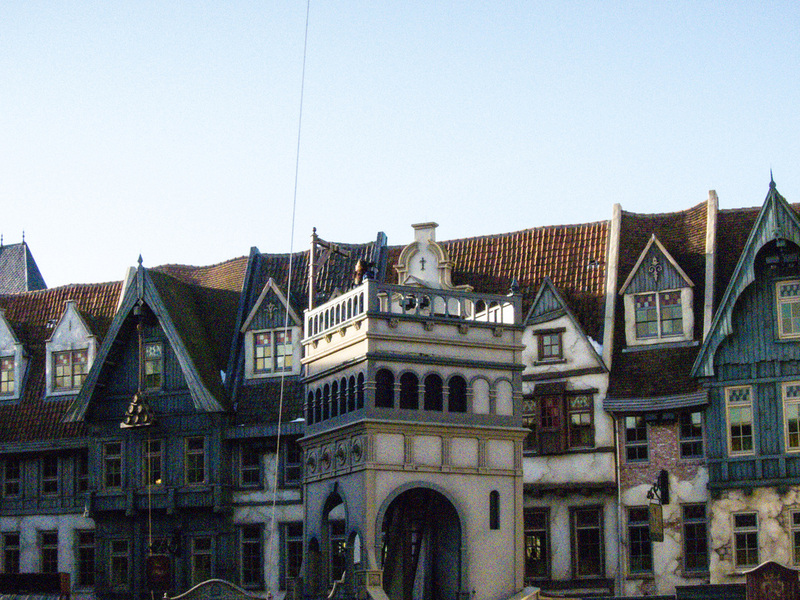 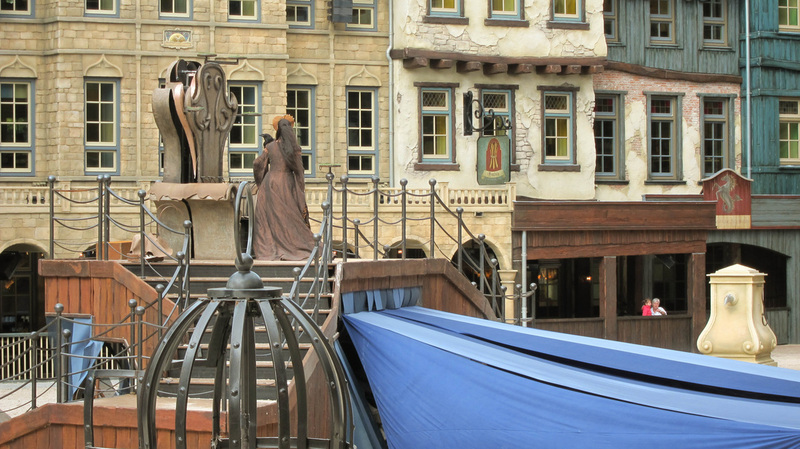 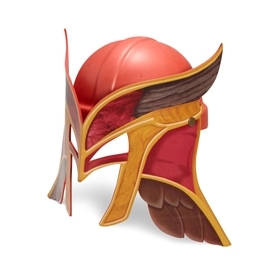 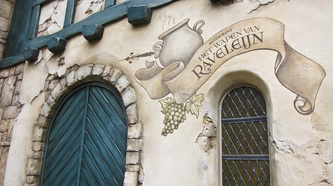 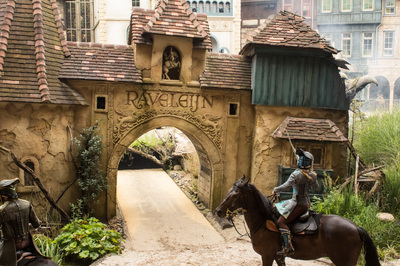 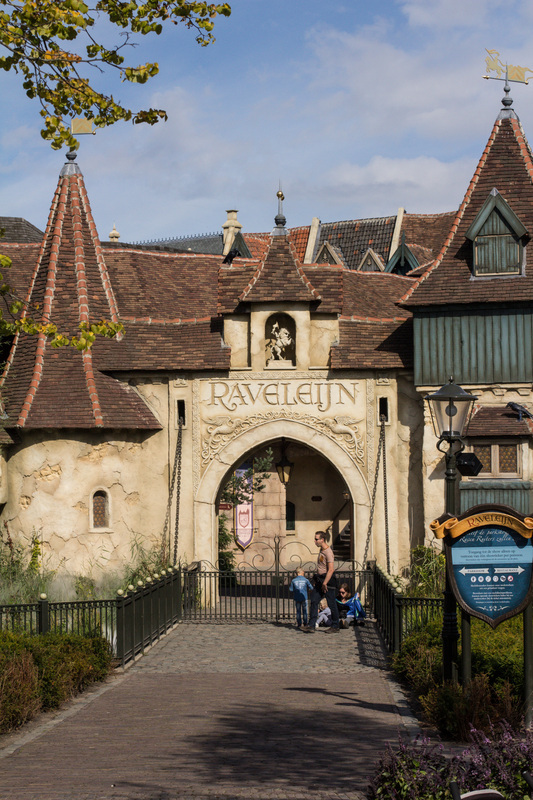 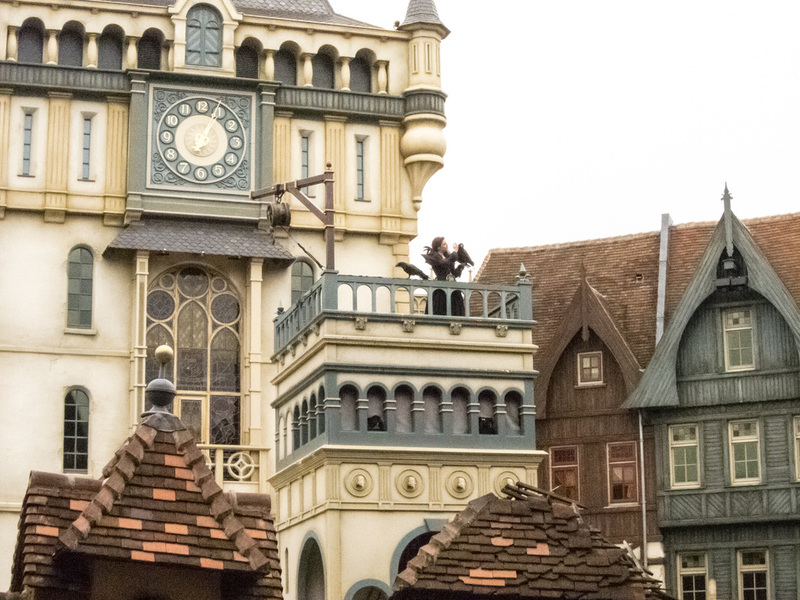 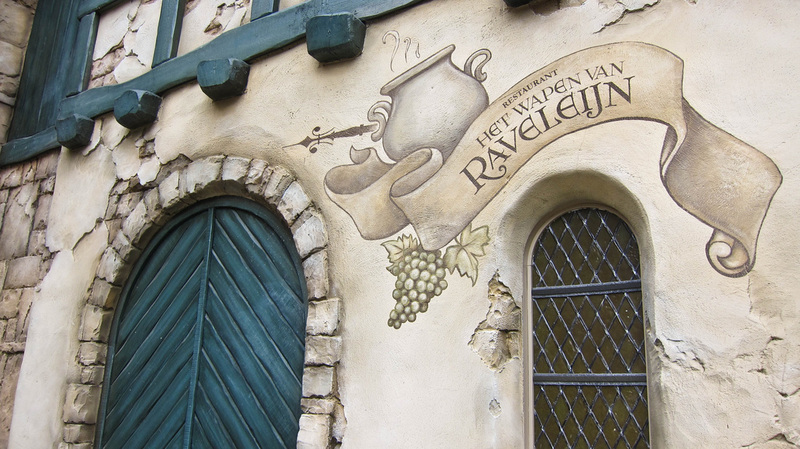 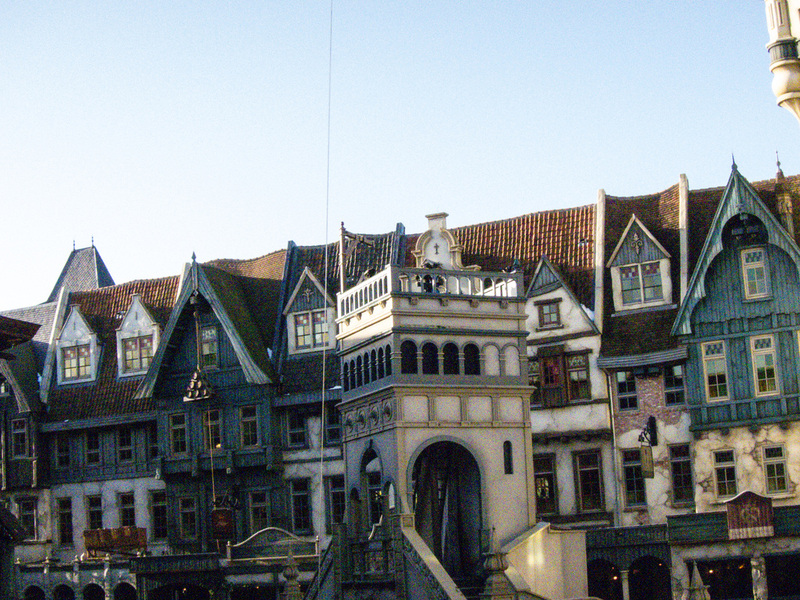 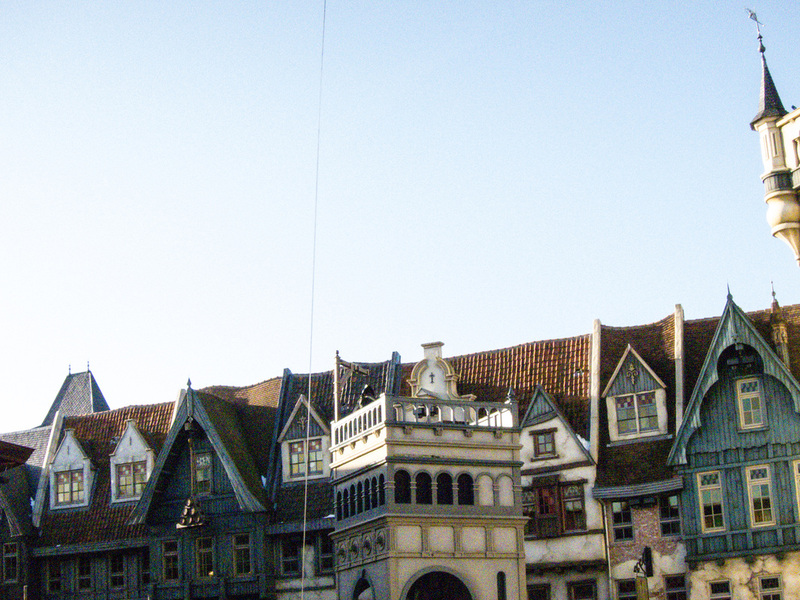 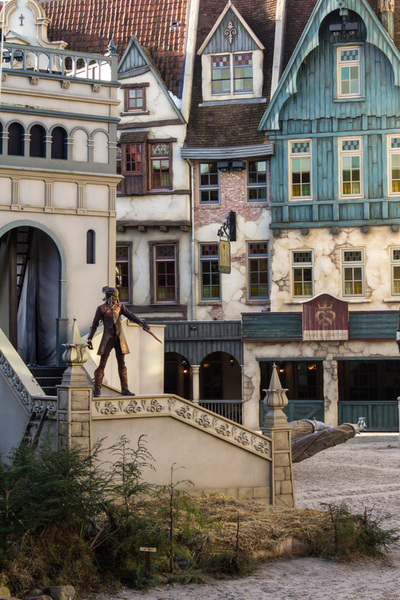 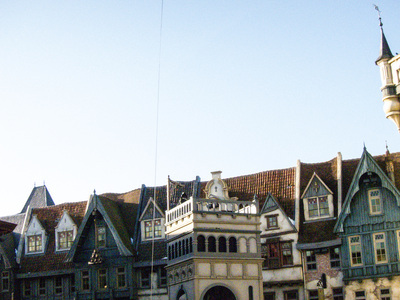 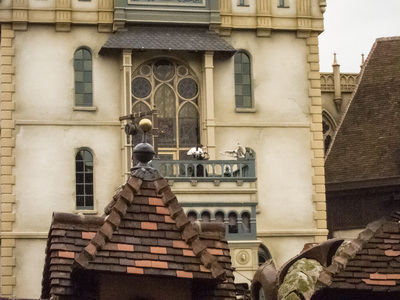 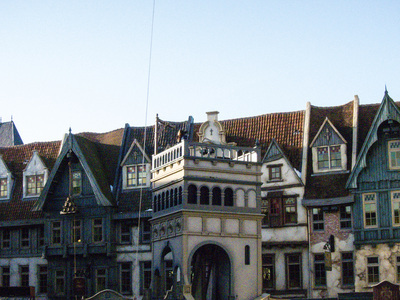 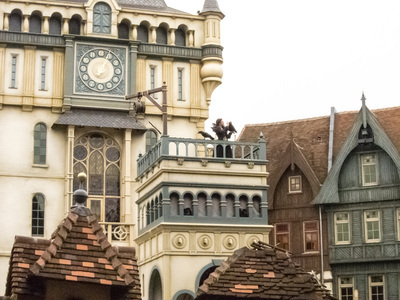 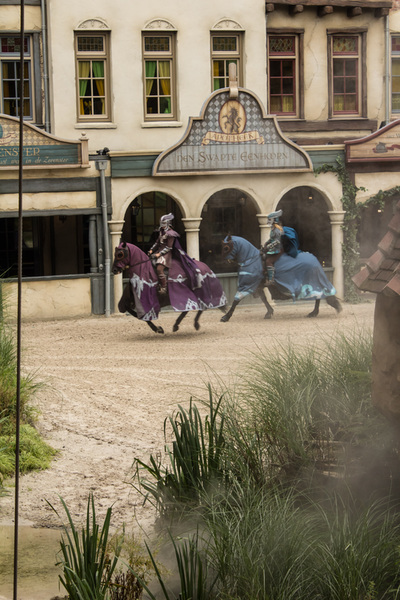 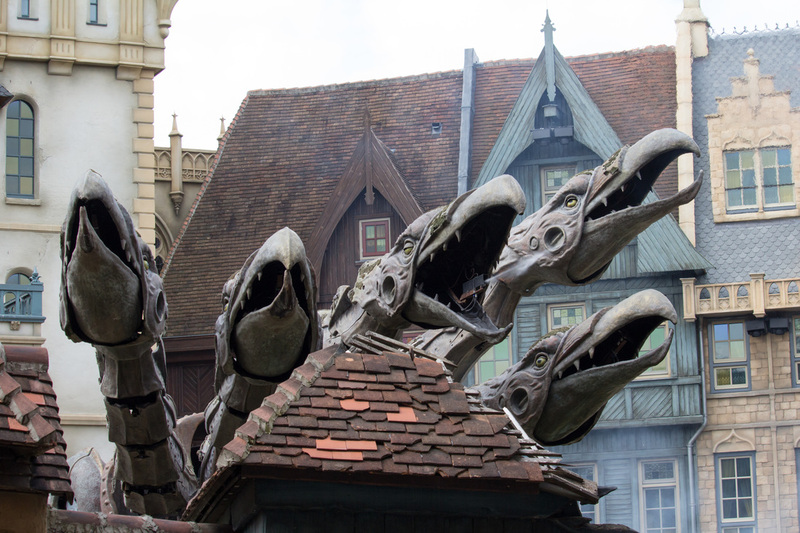 You can buy Raveleijn themed items at the Efteling souvenir shop! 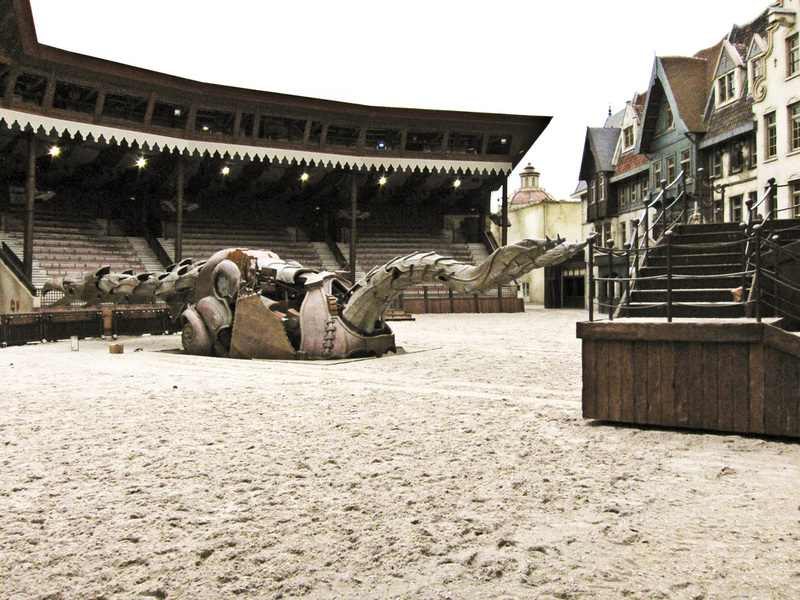 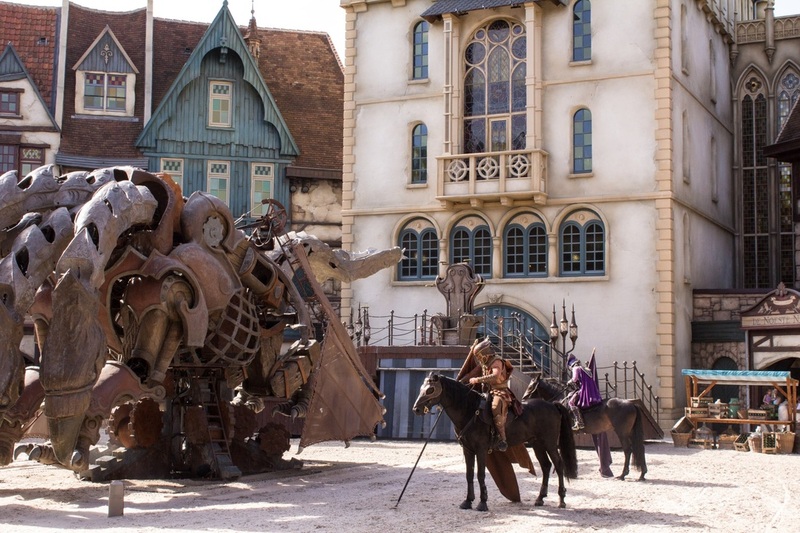 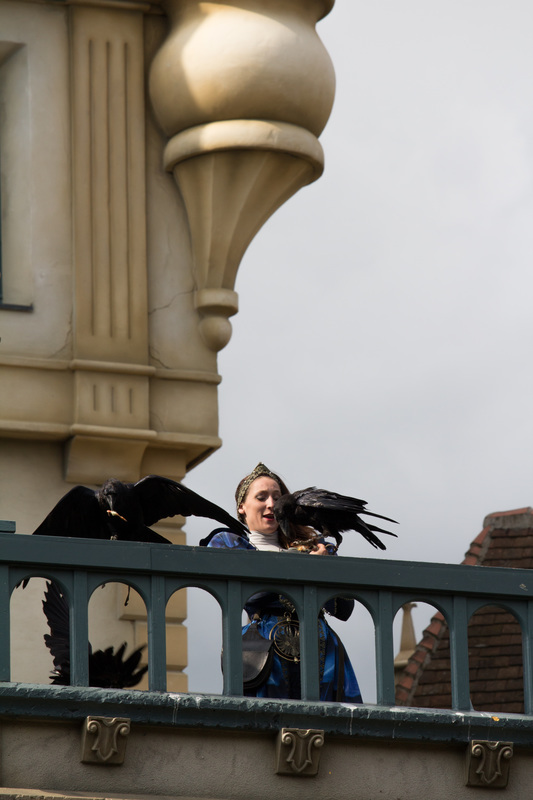 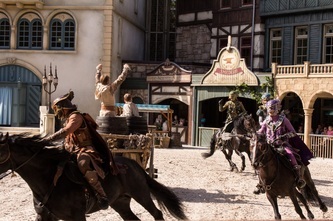 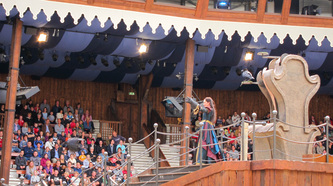 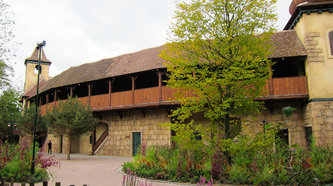 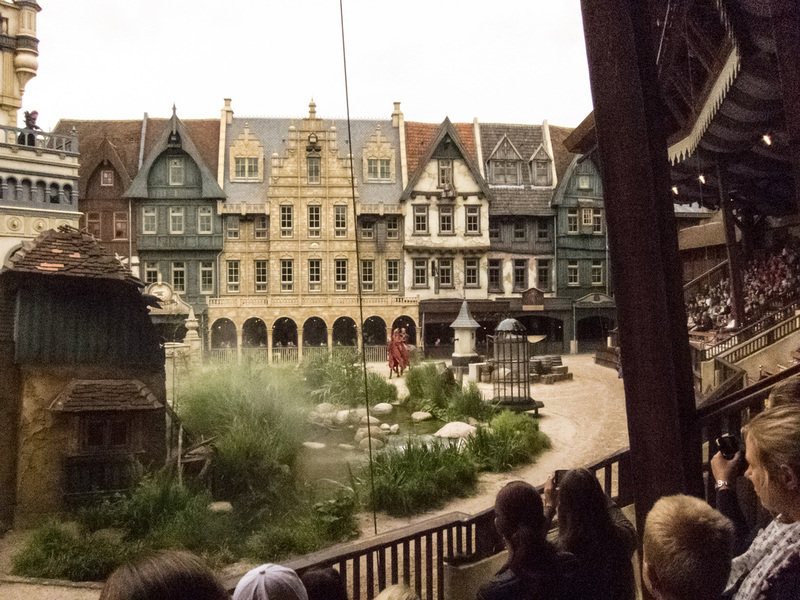 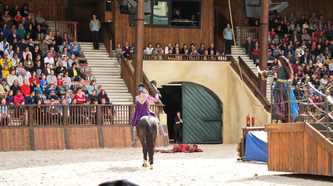 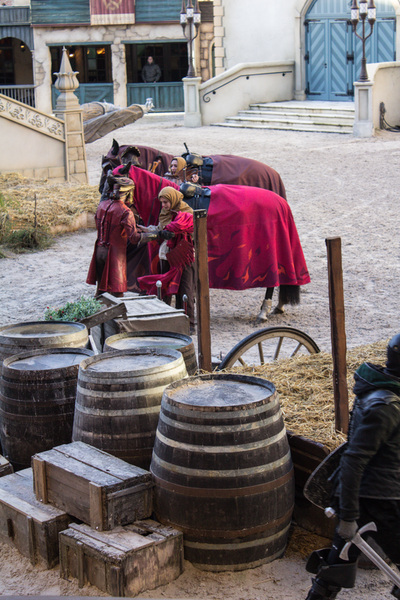 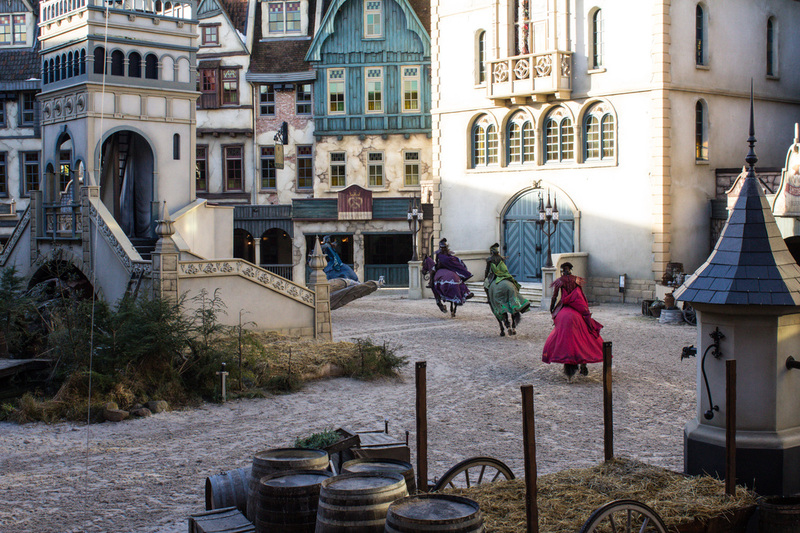 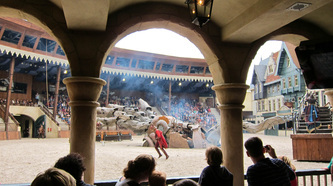 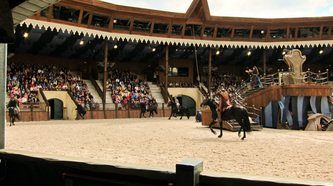 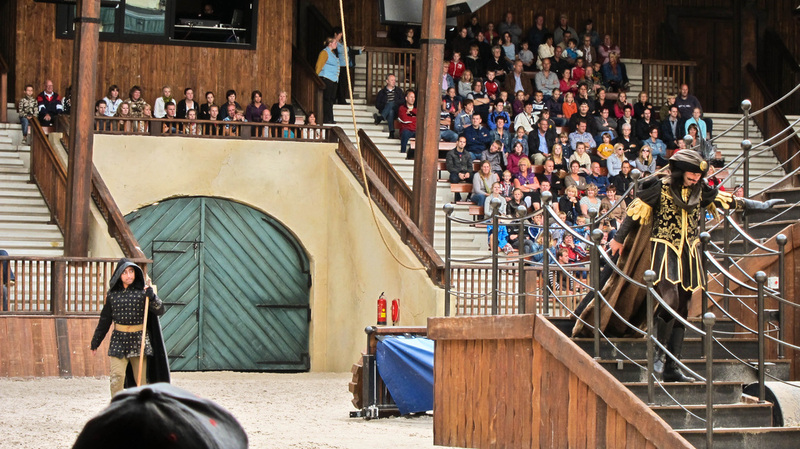 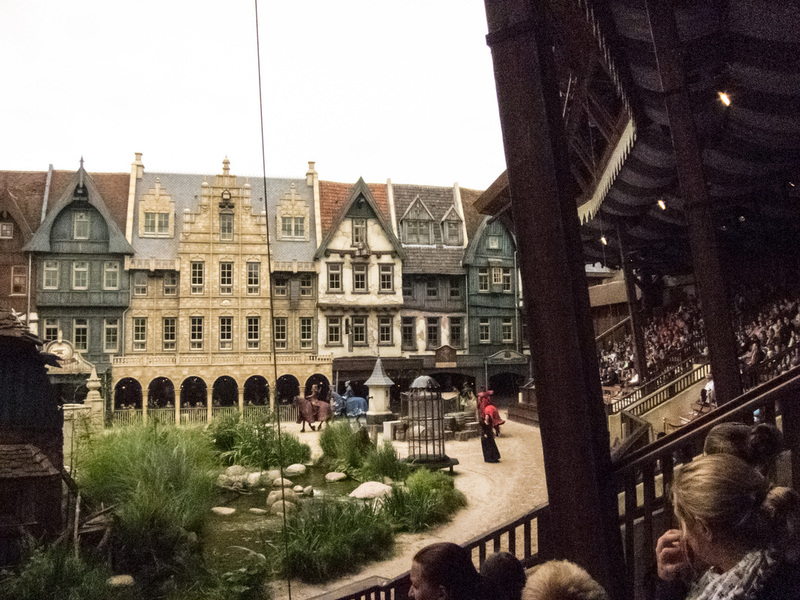 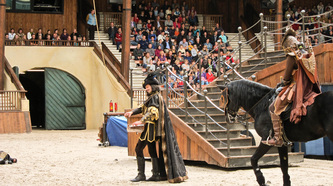 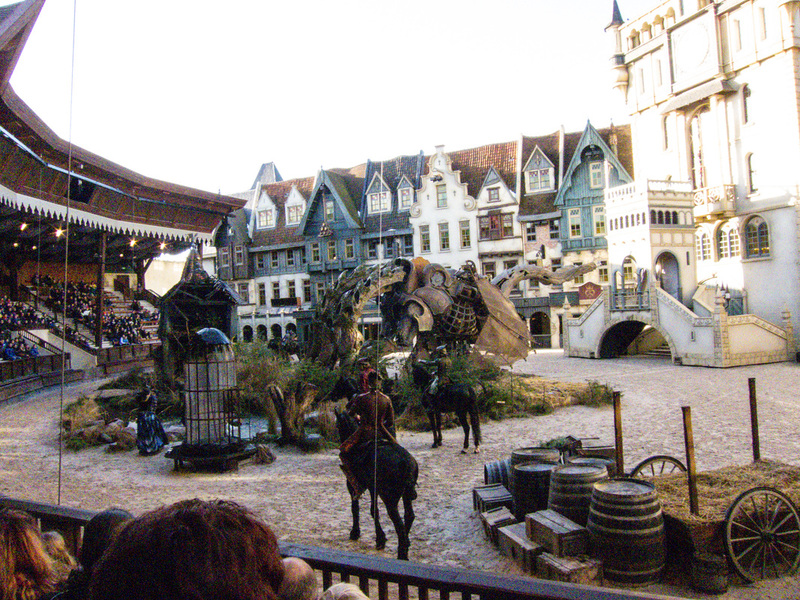 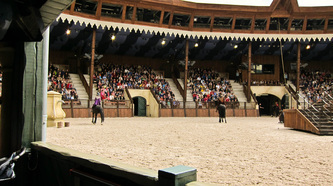 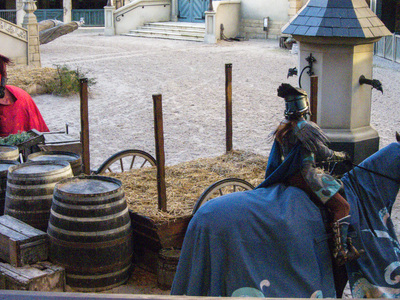 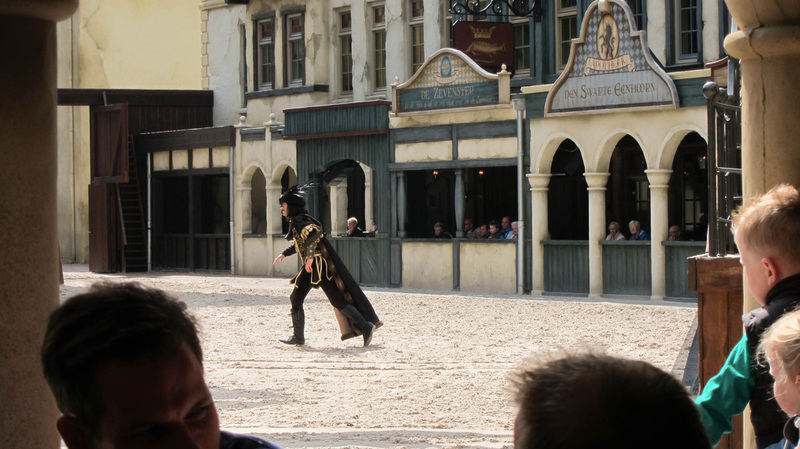 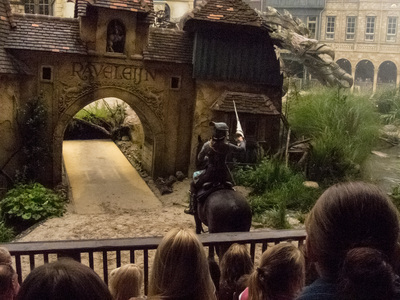 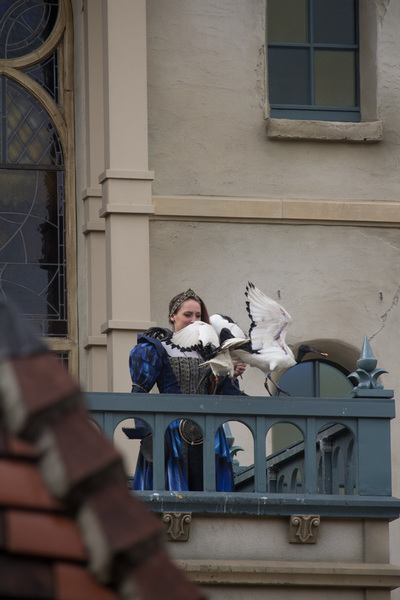 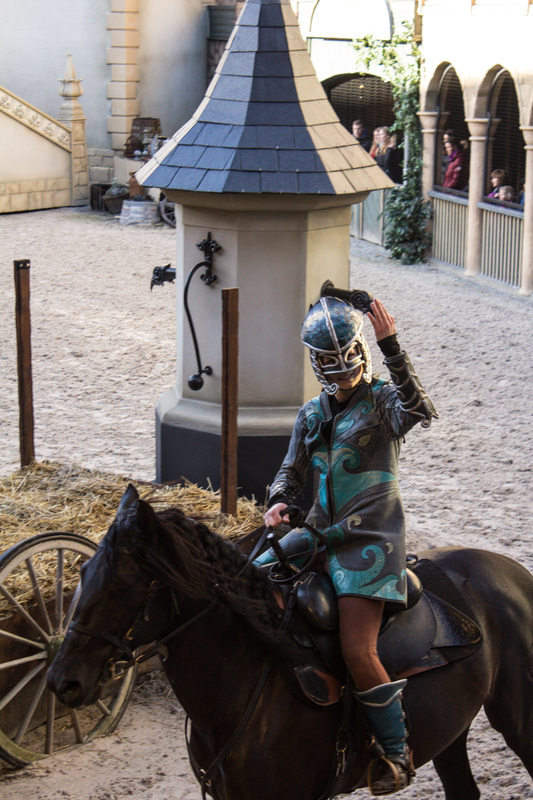 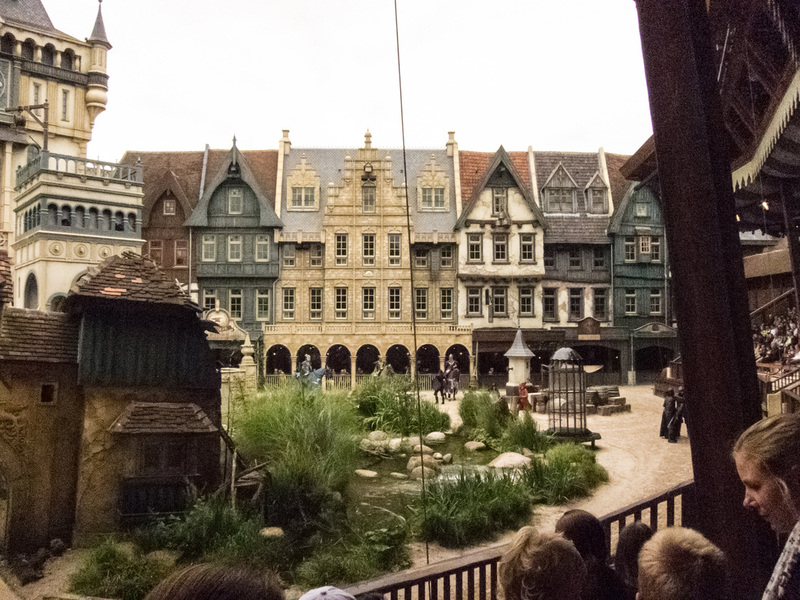 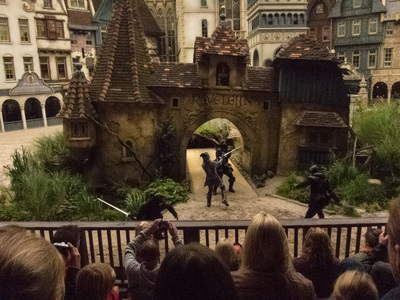 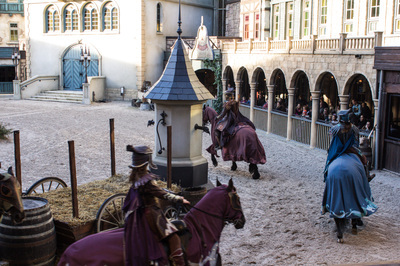 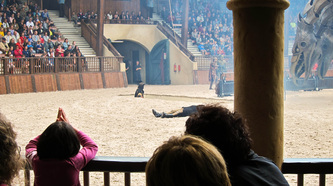 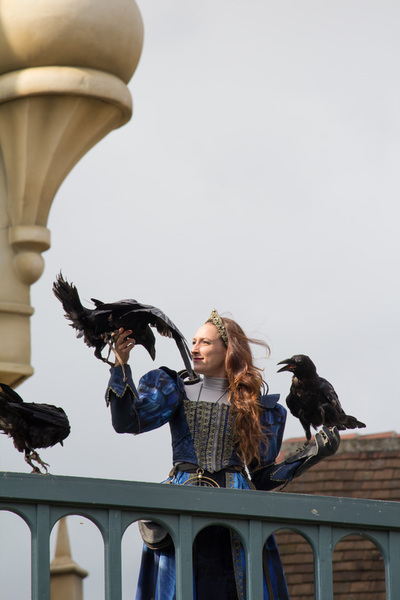 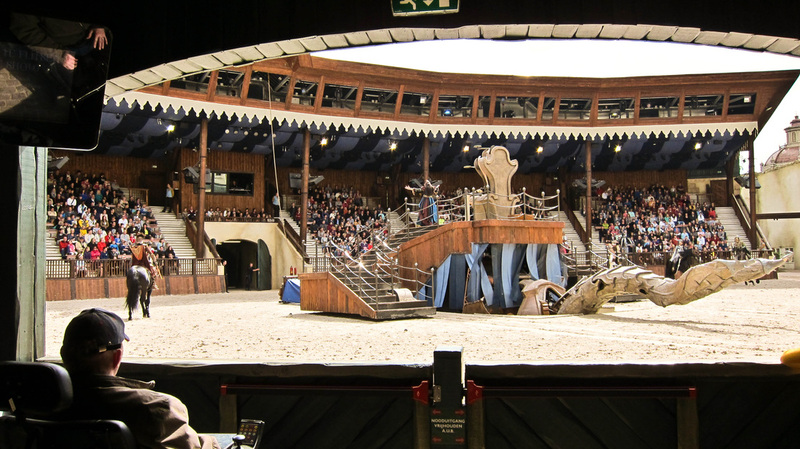 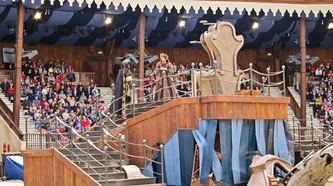 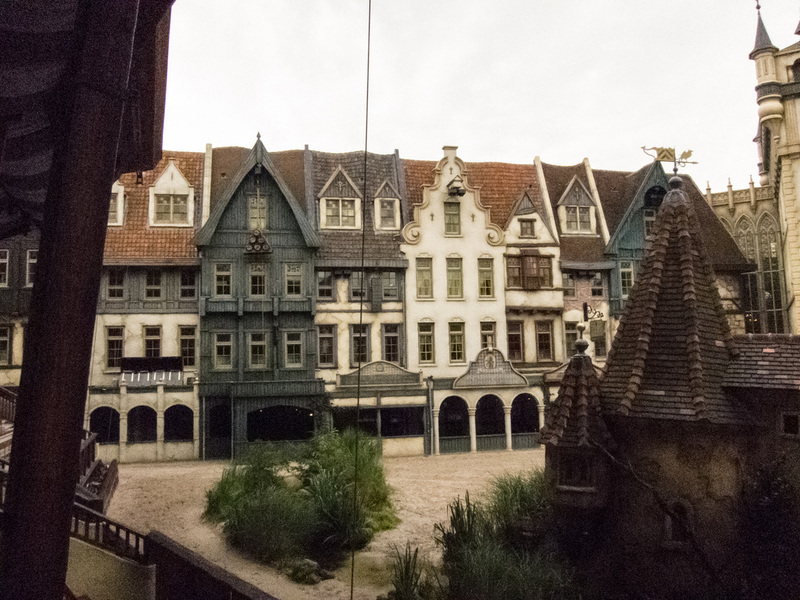 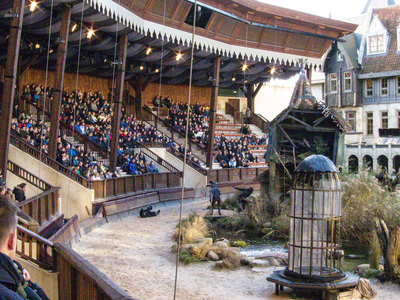 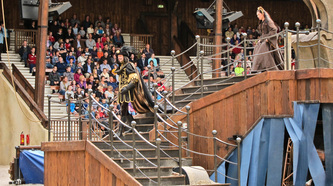 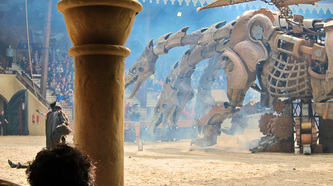 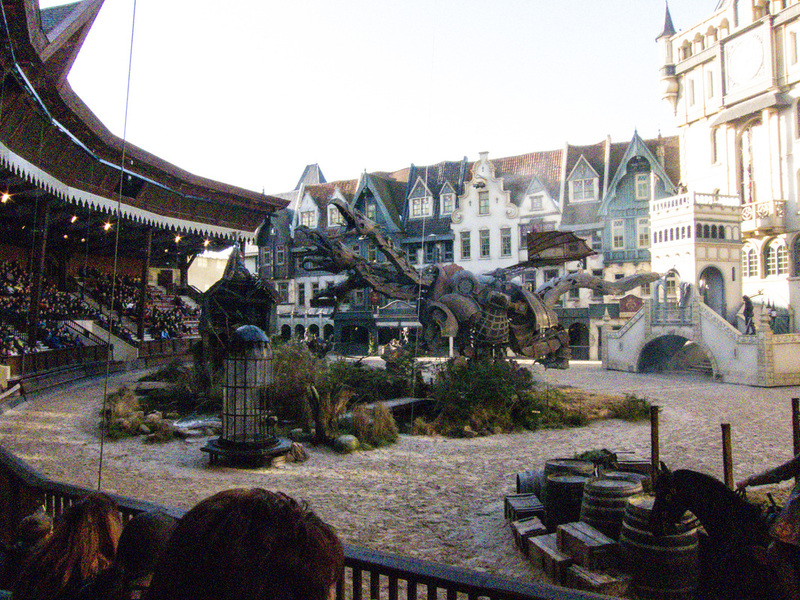 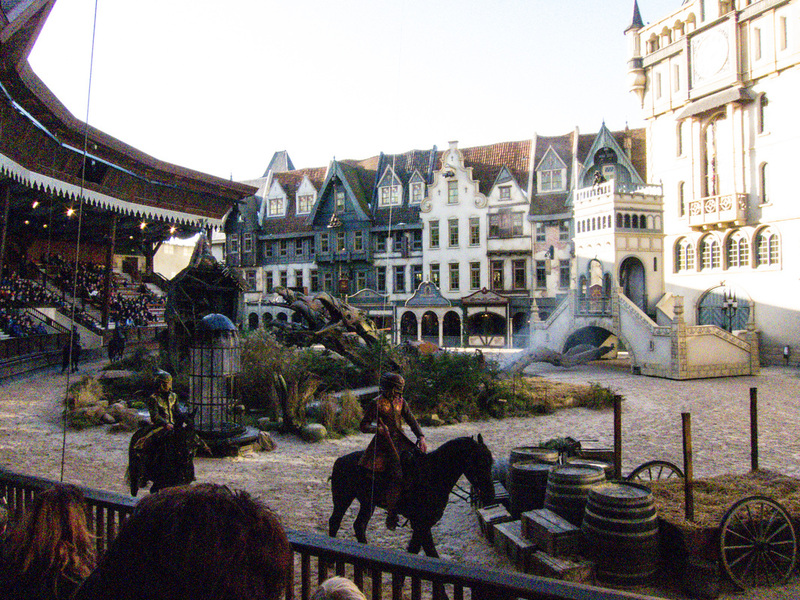 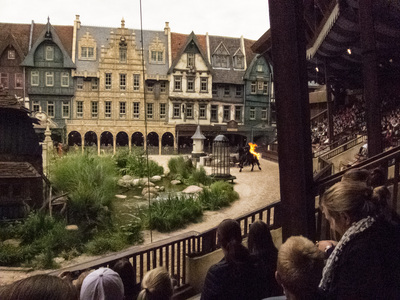 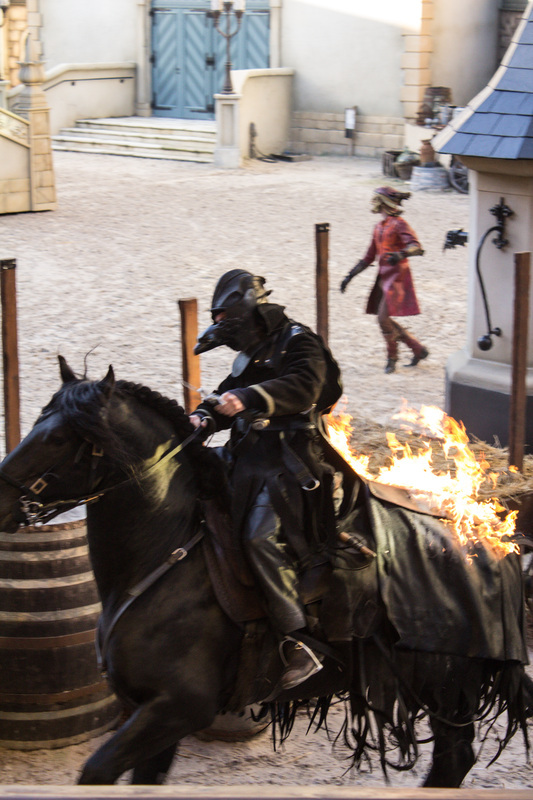 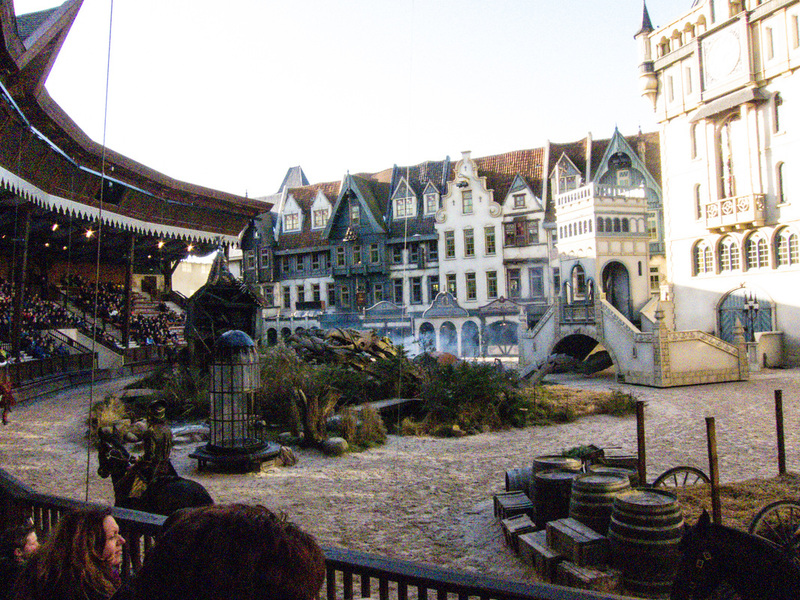 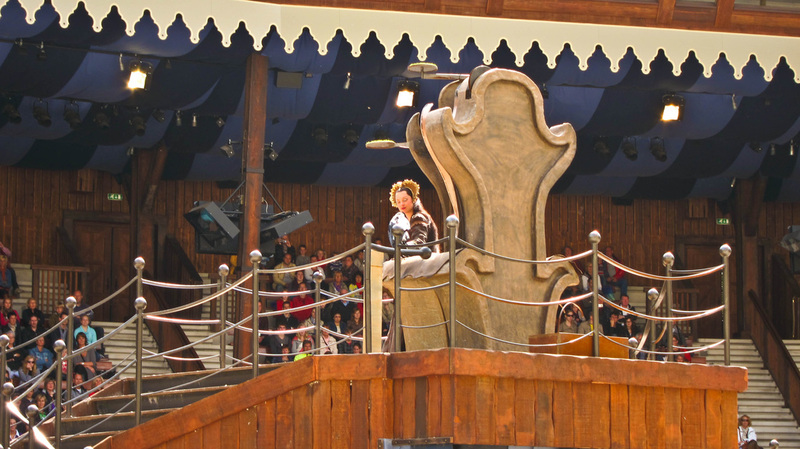 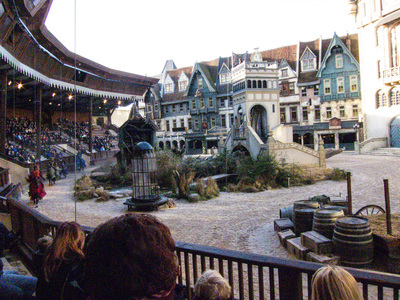 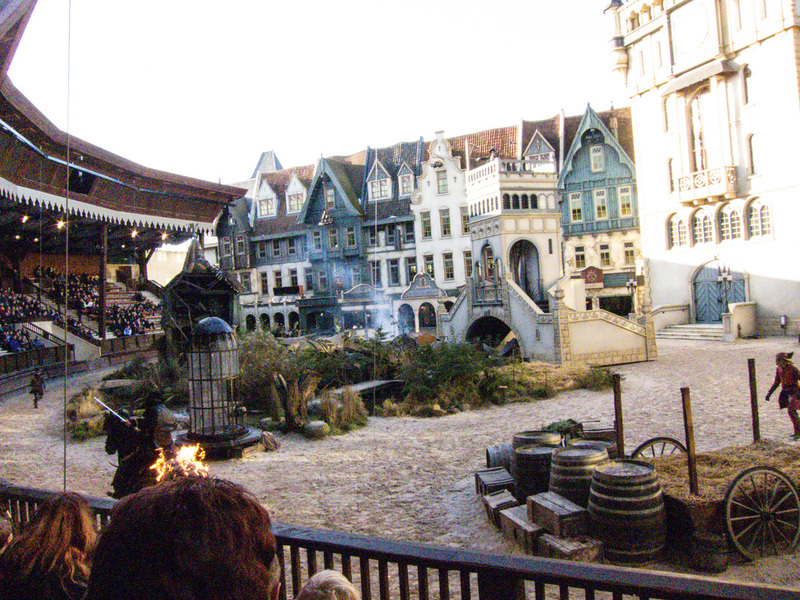 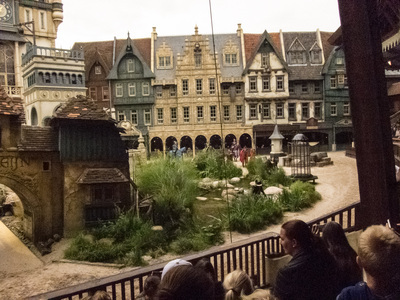 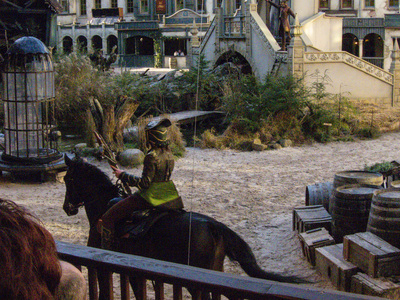 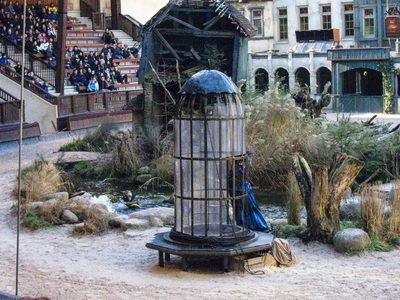 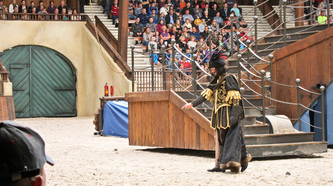 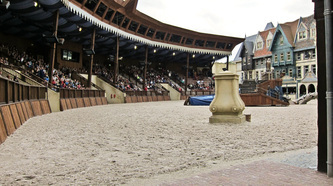 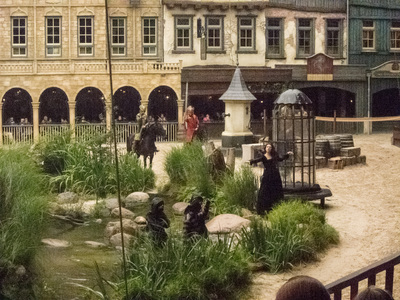 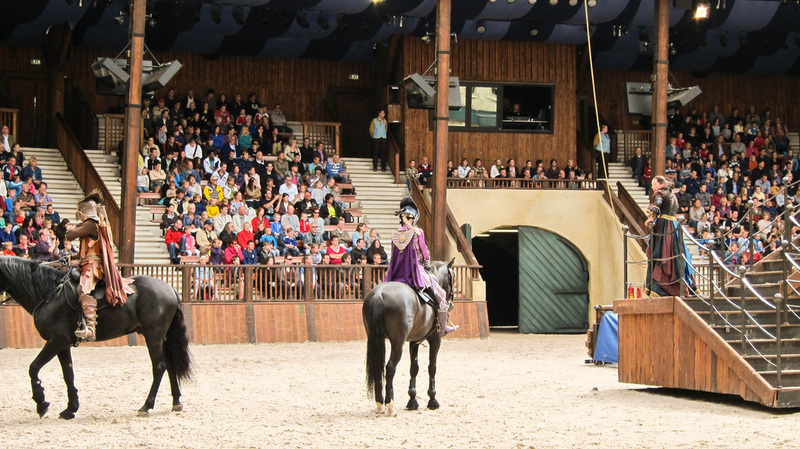 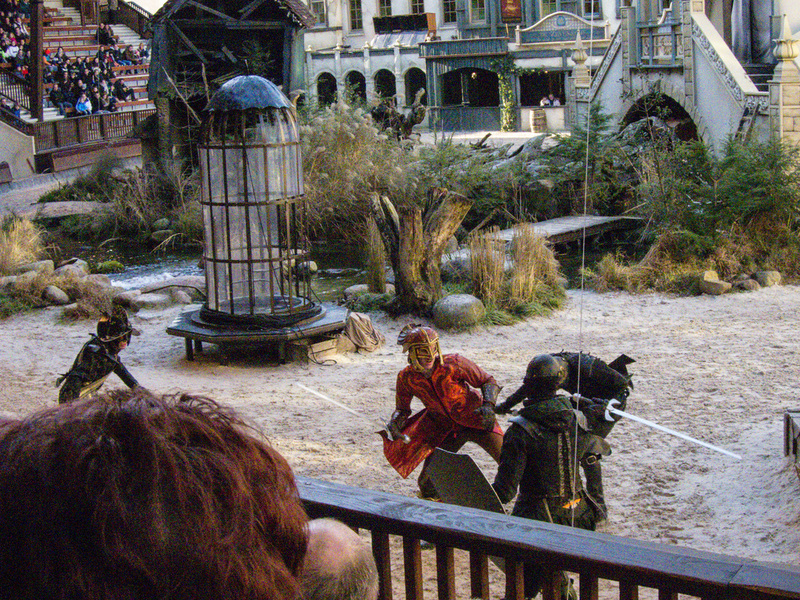 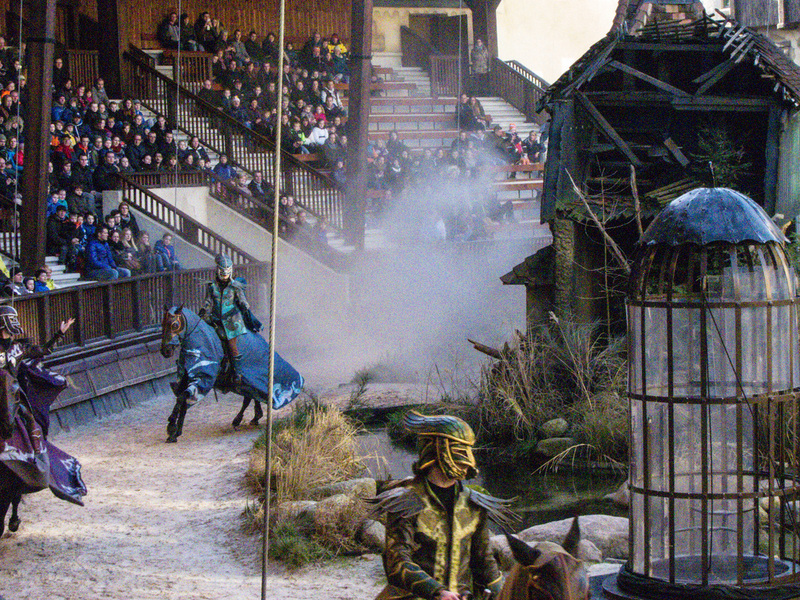 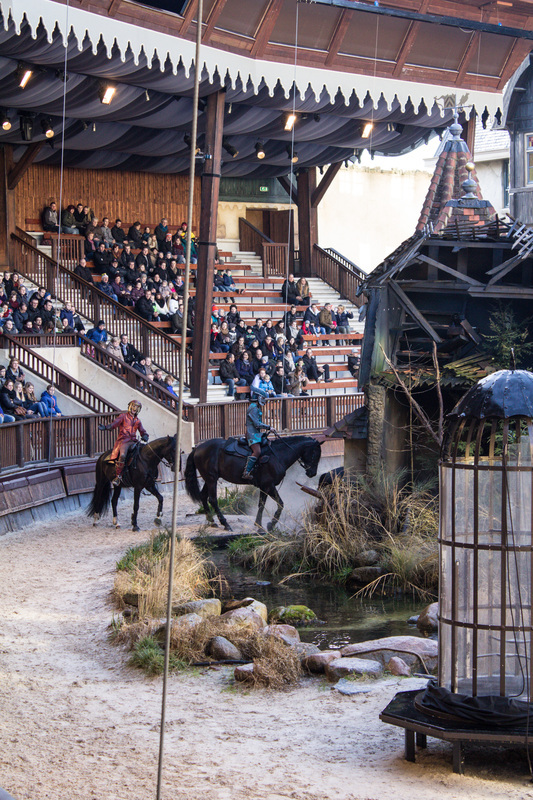 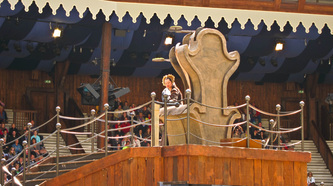 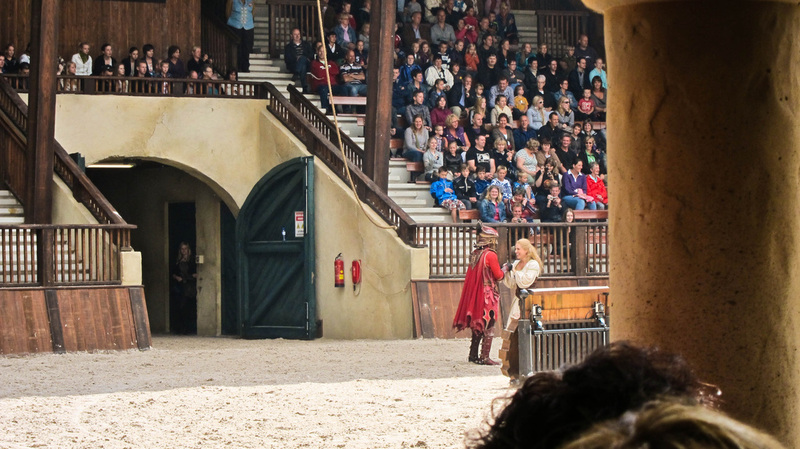 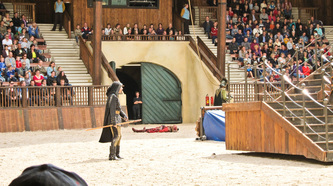 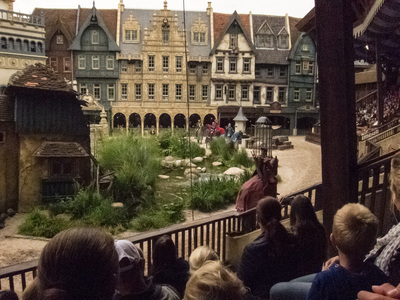 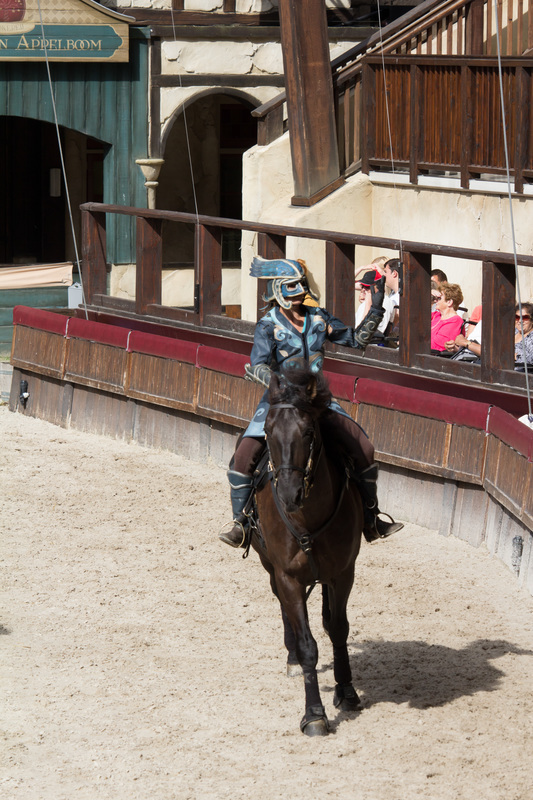 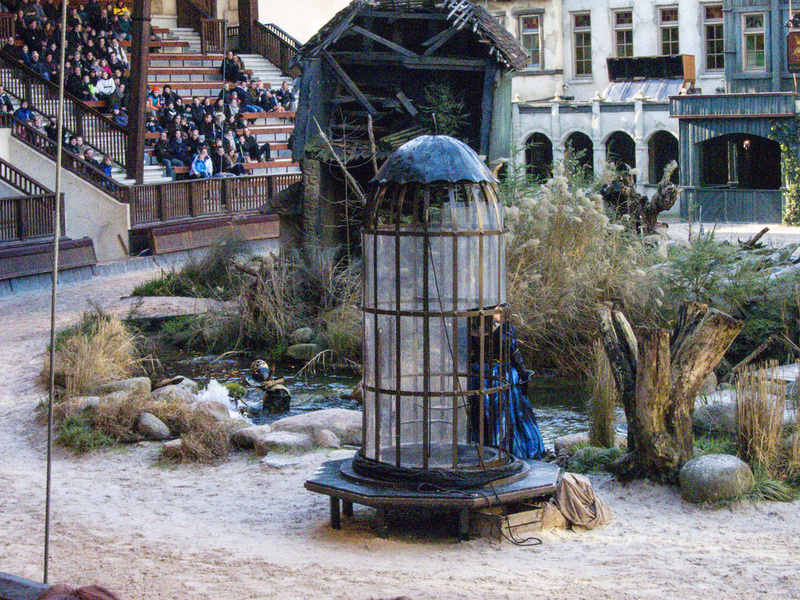 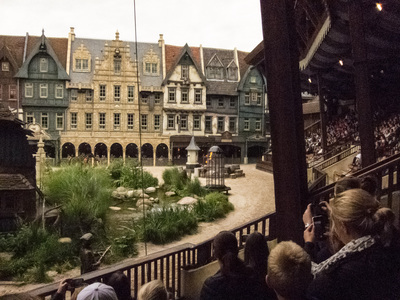 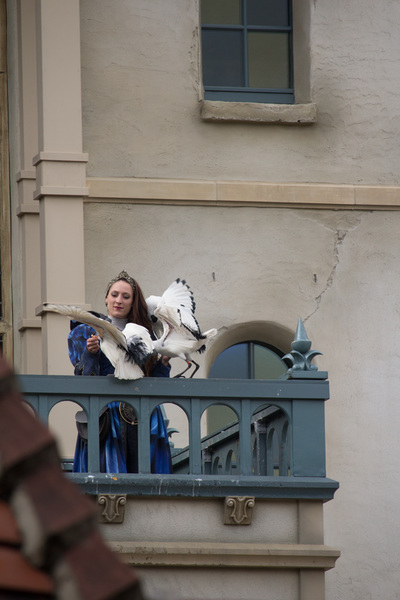 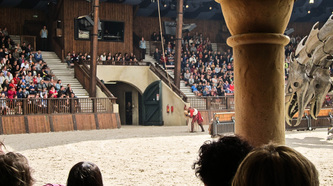 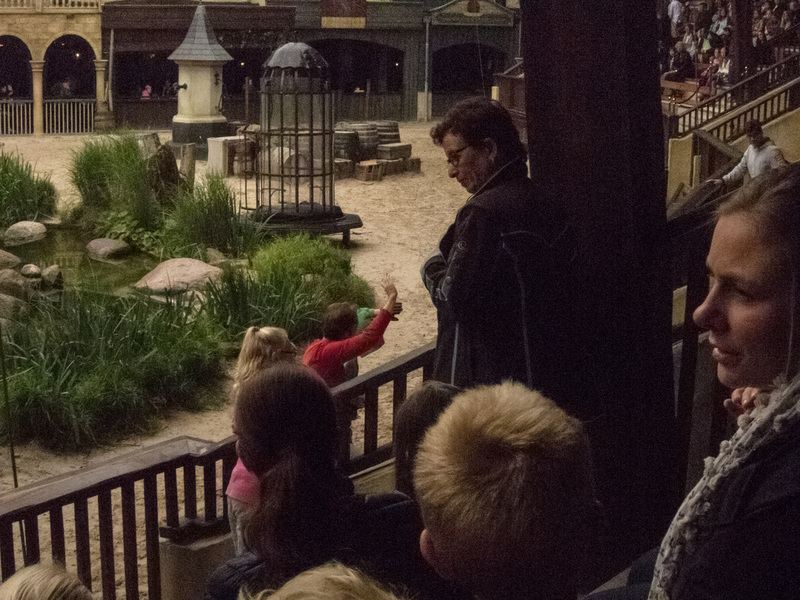 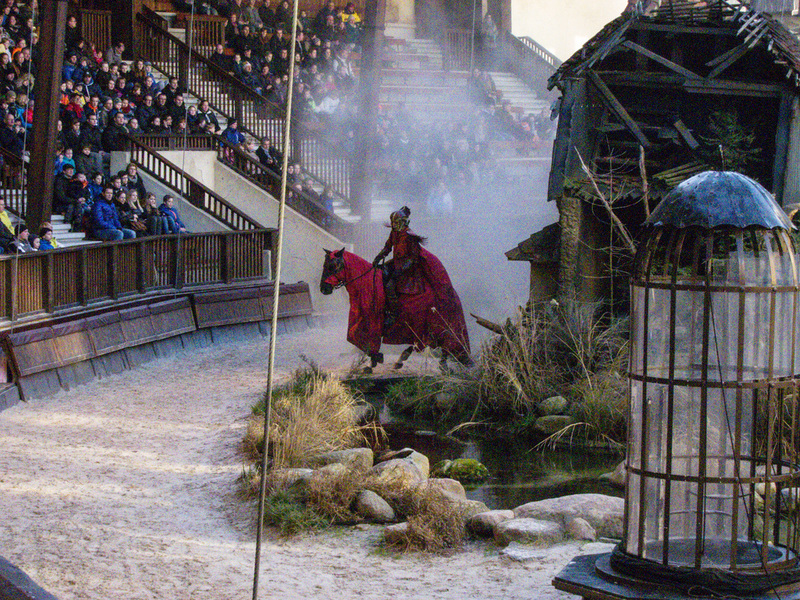 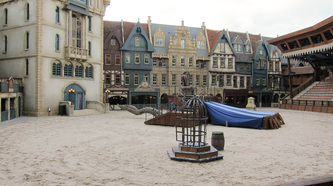 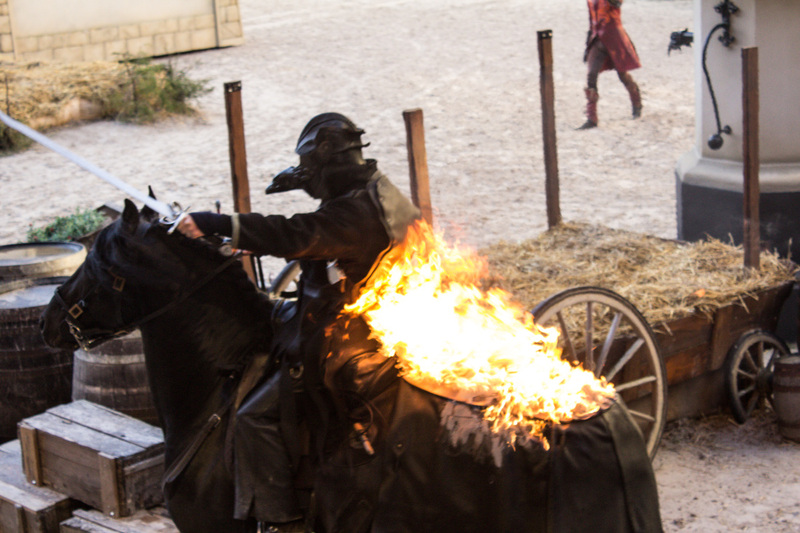 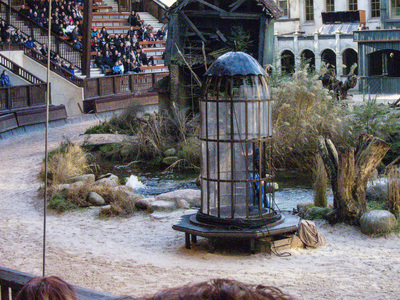 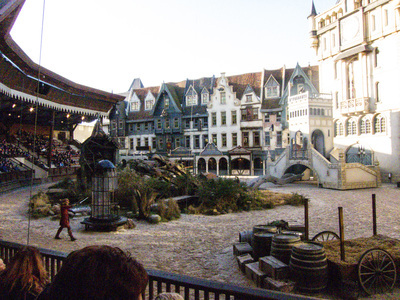 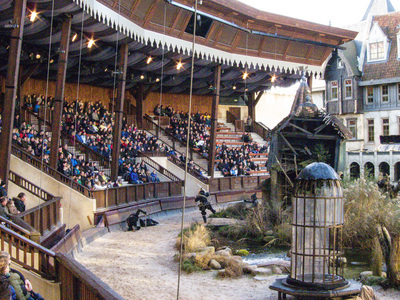 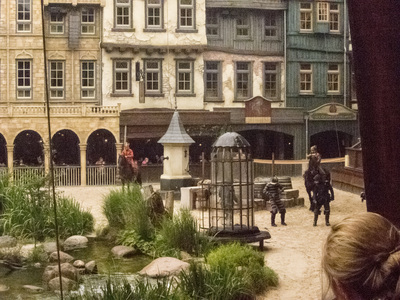 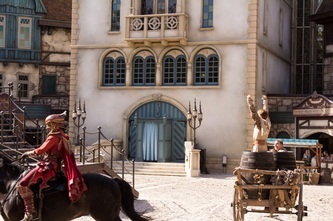 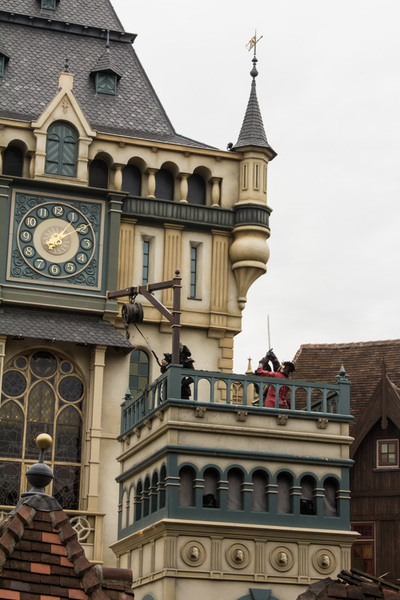 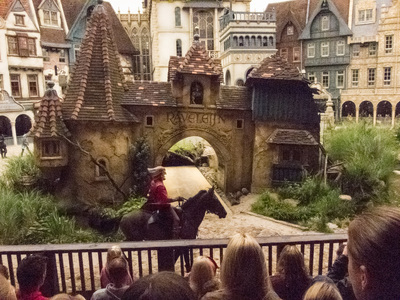 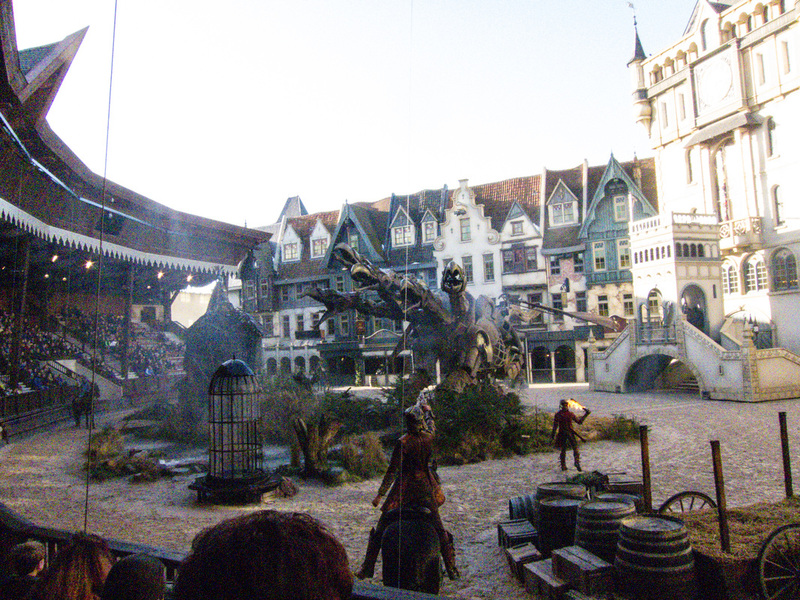 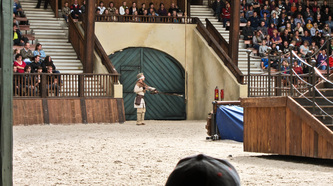 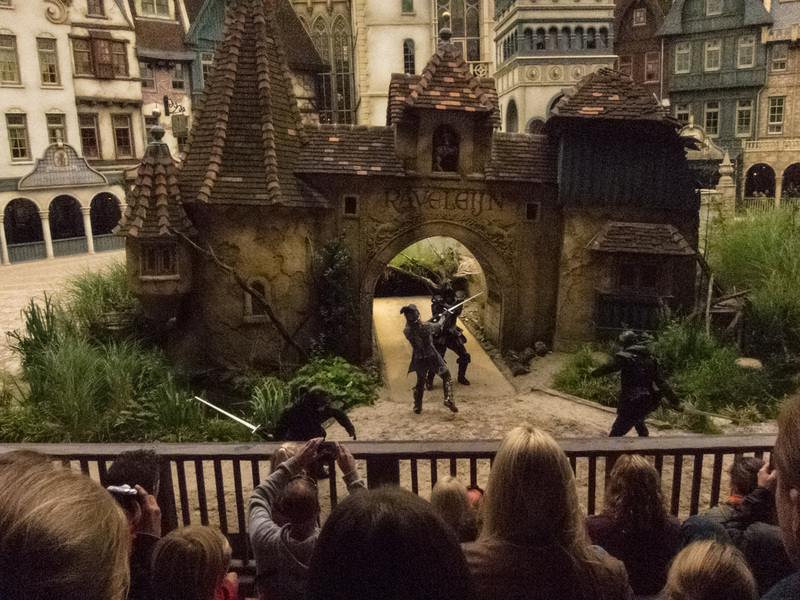 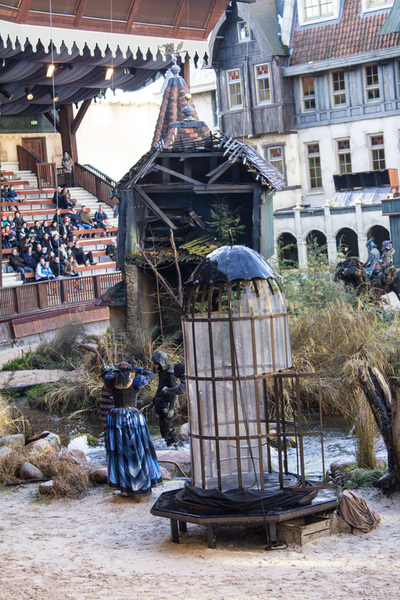 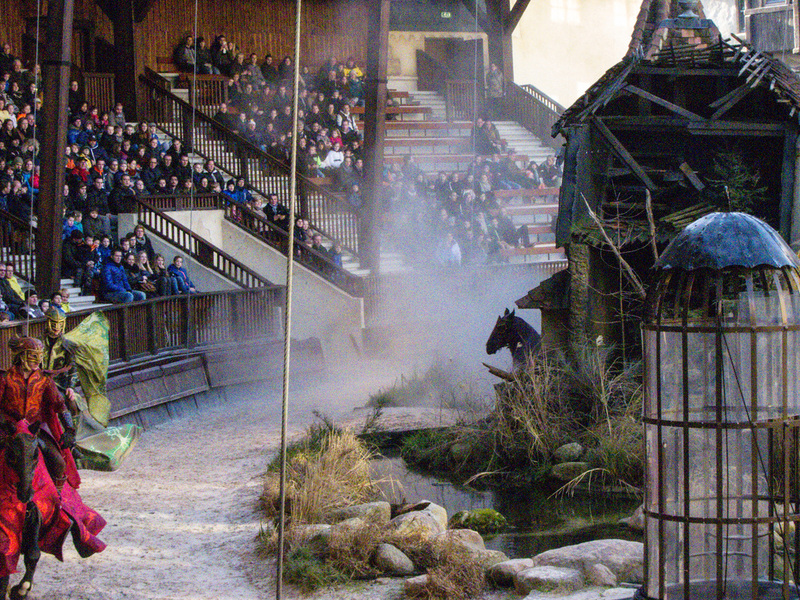 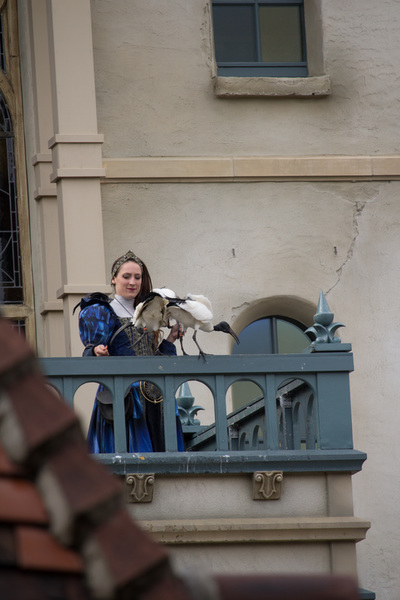 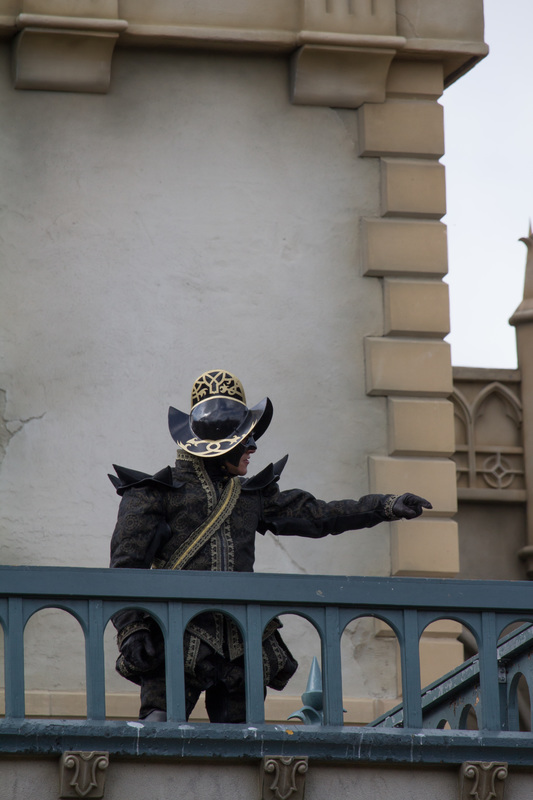 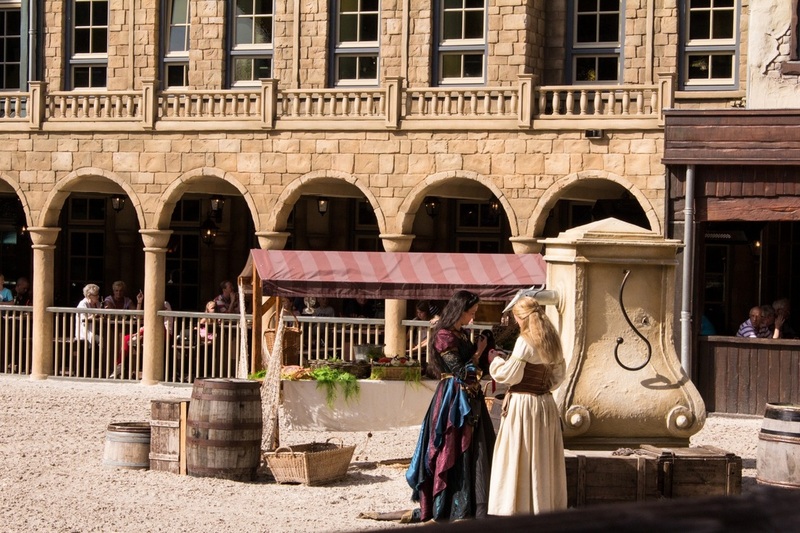 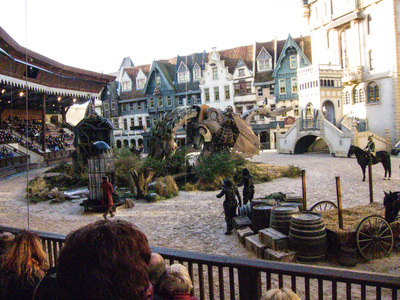 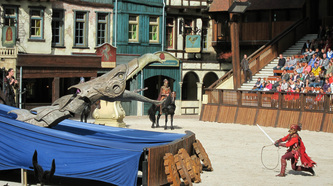 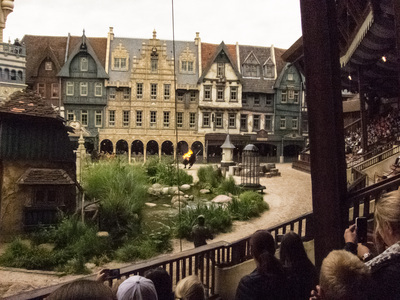 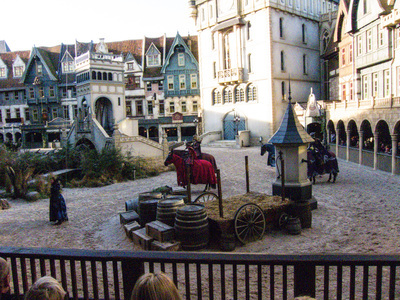 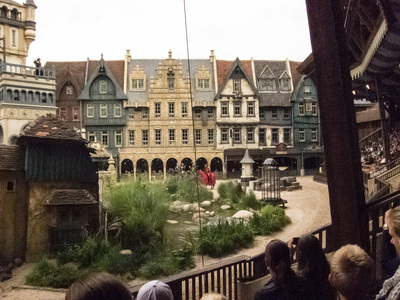 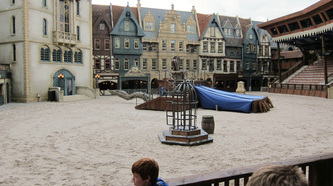 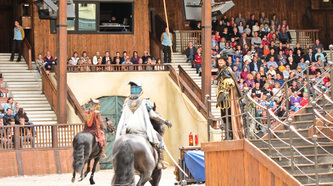 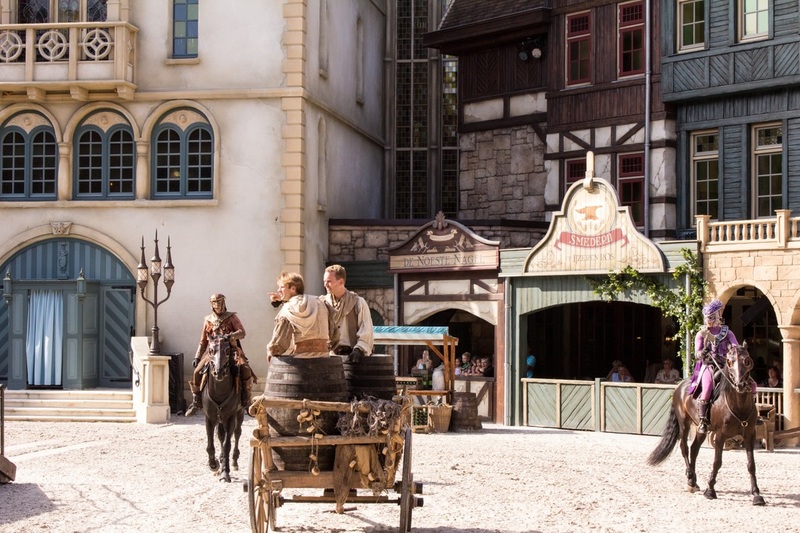 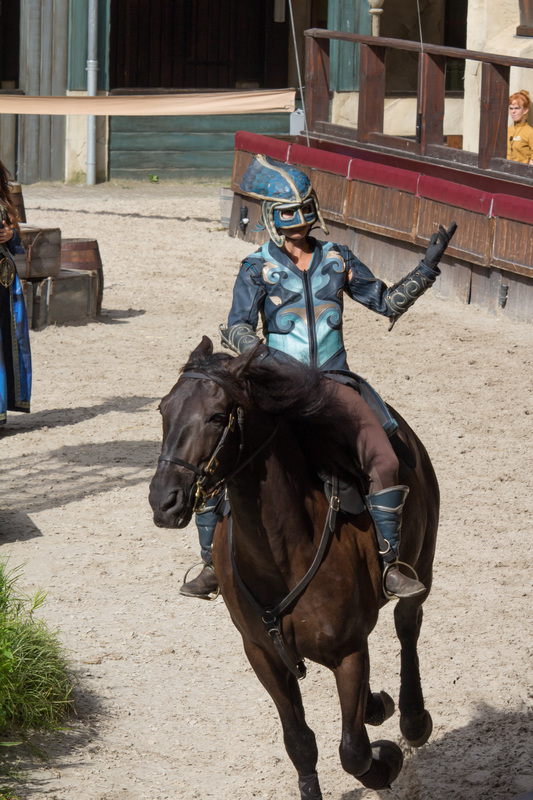 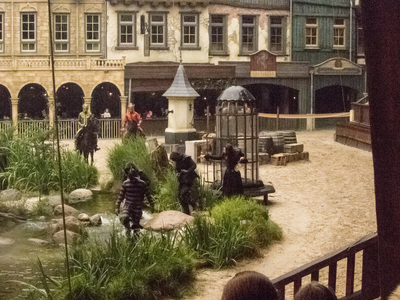 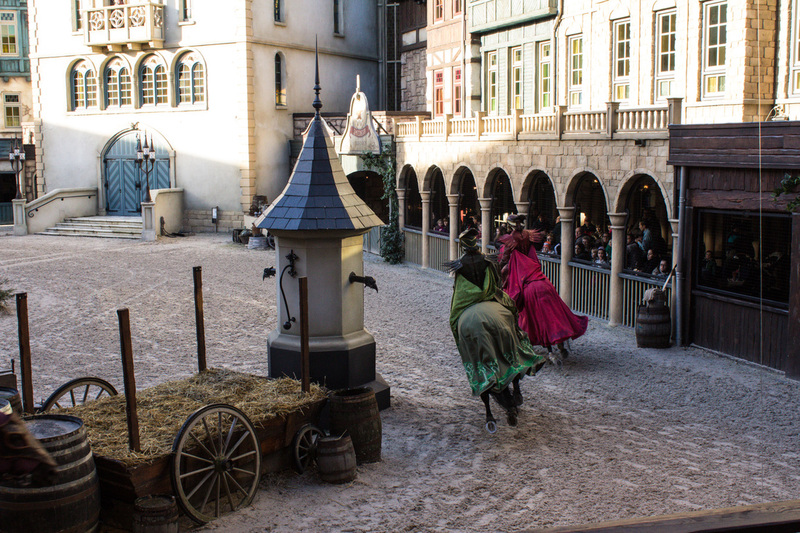 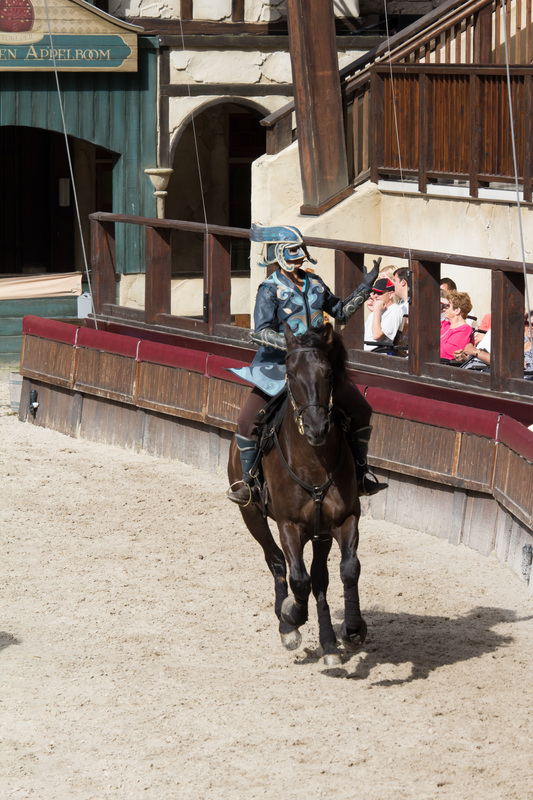 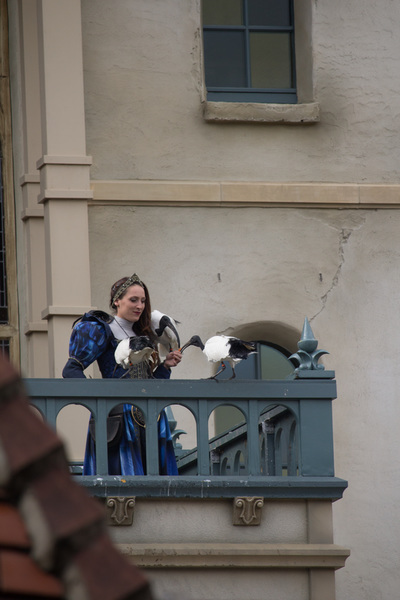 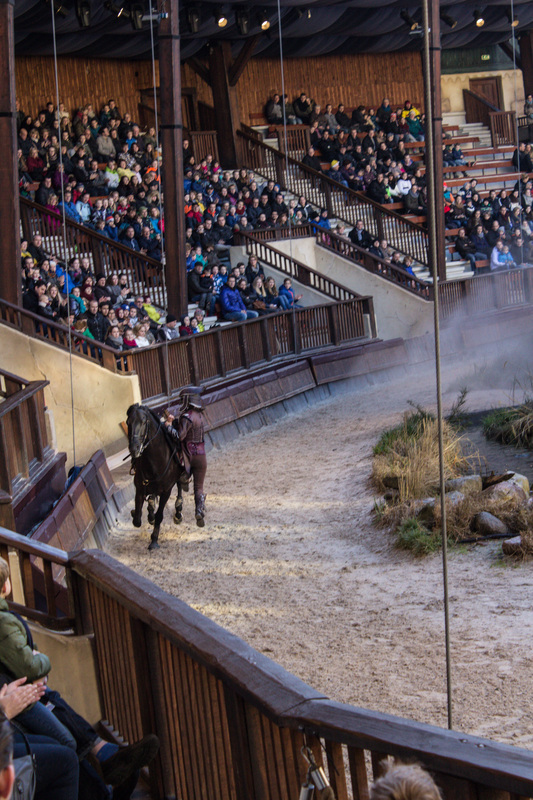 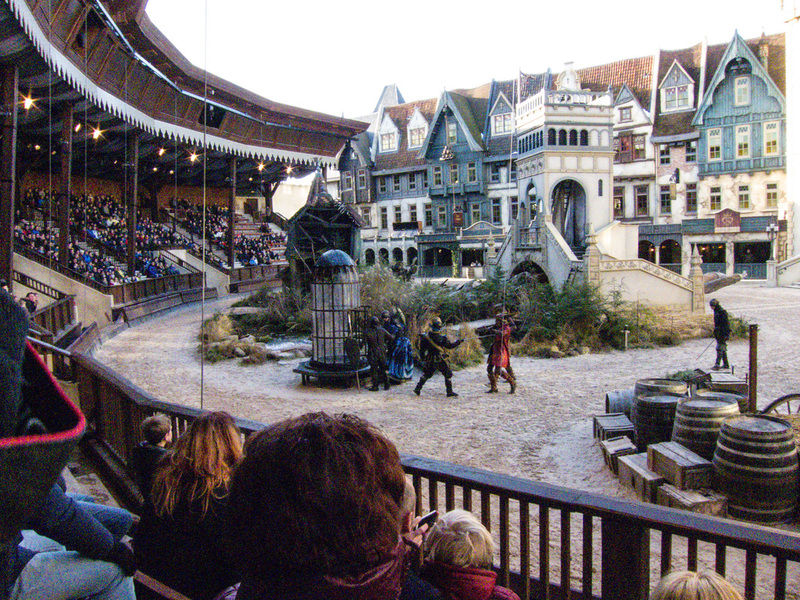 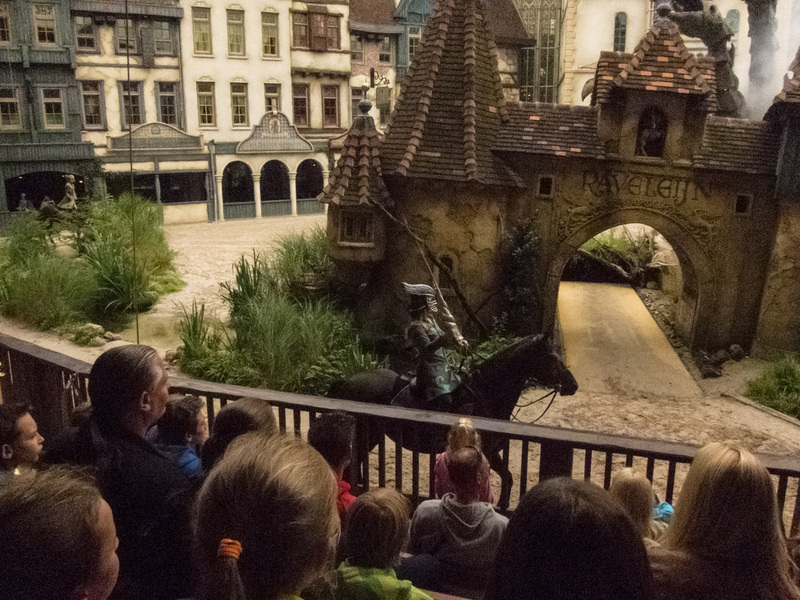 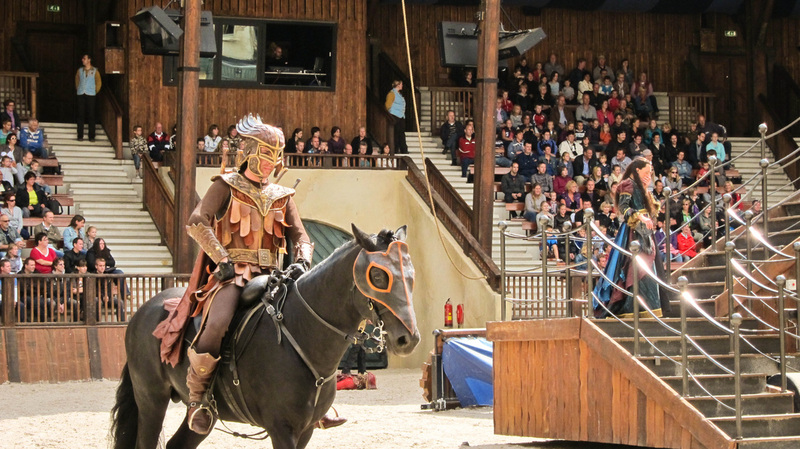 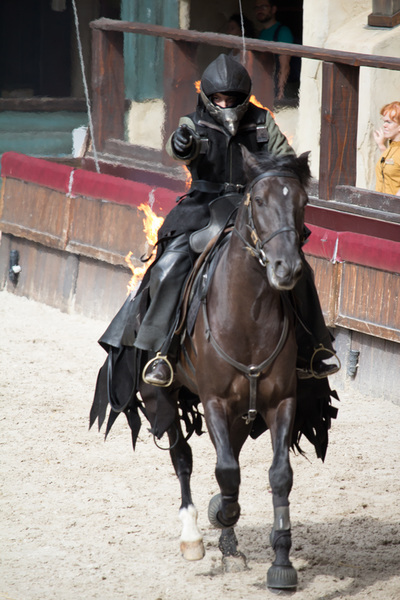 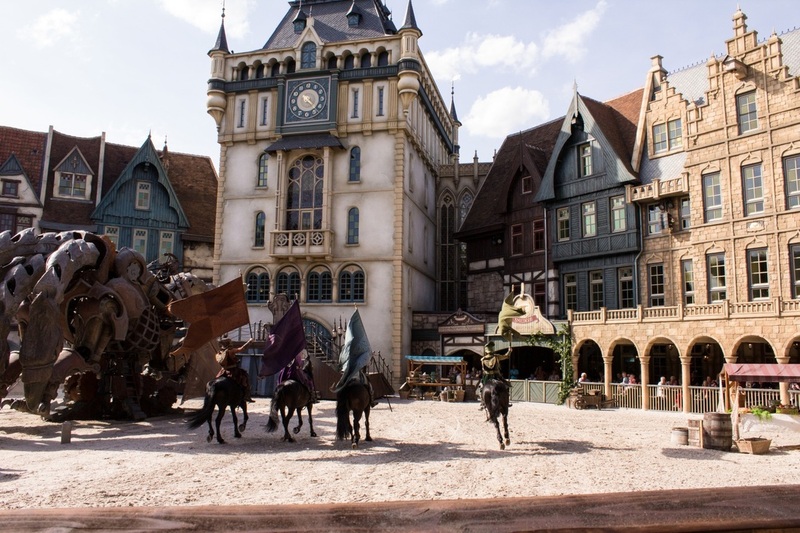 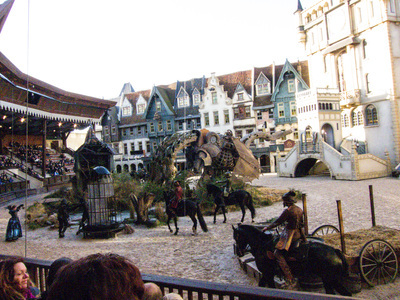 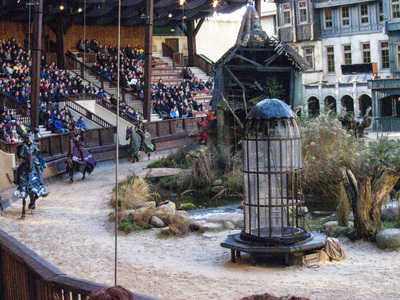 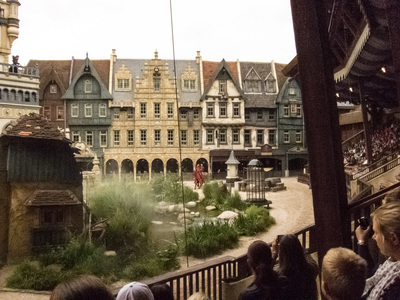 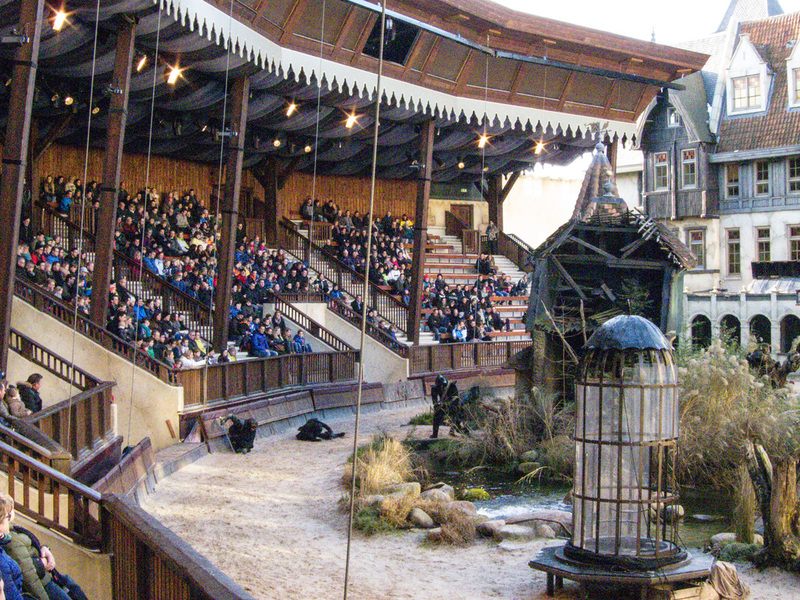 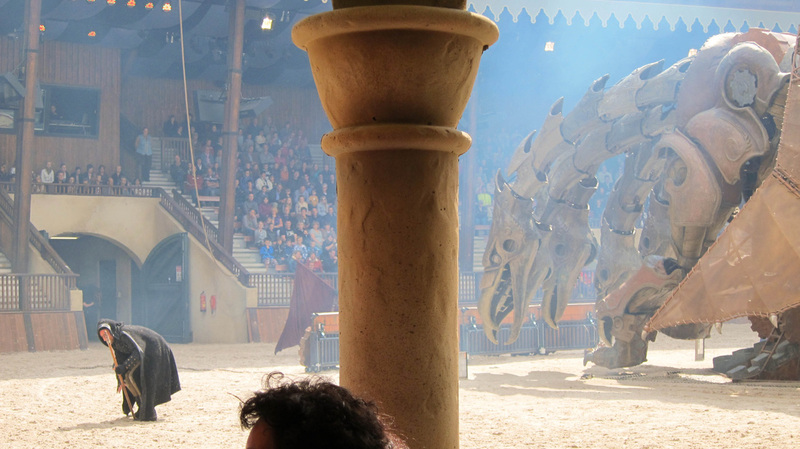 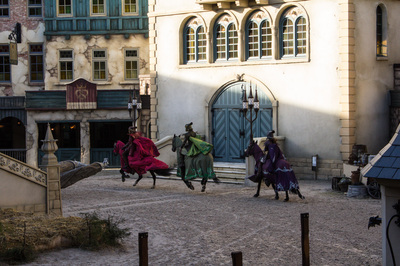 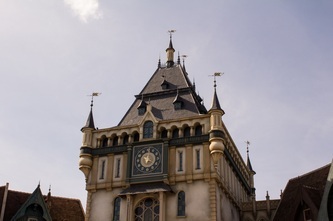 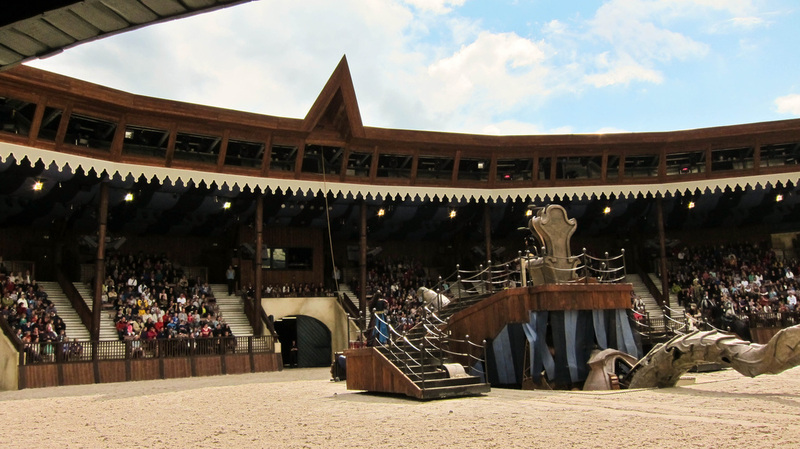 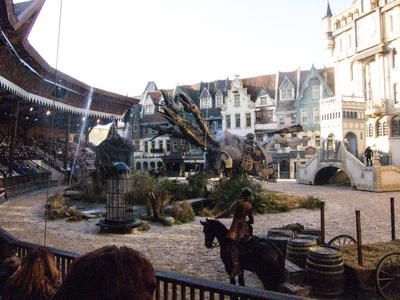 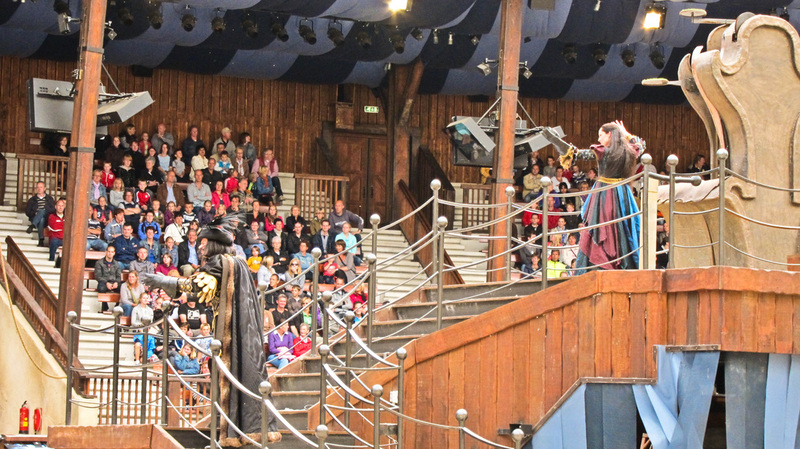 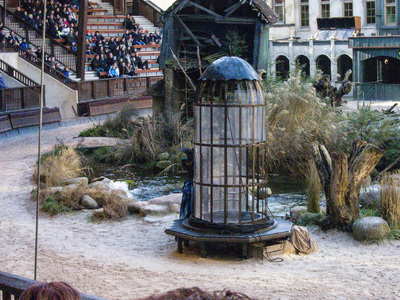 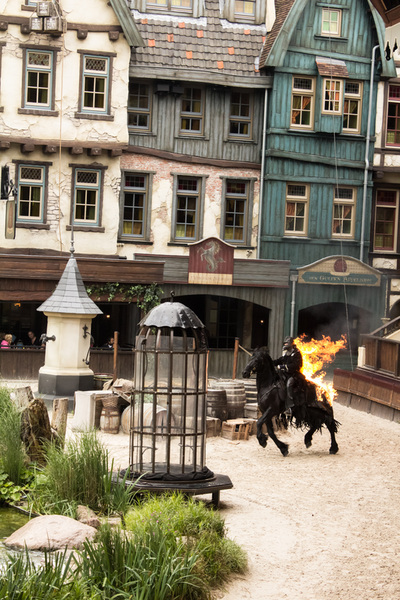 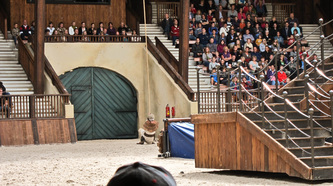 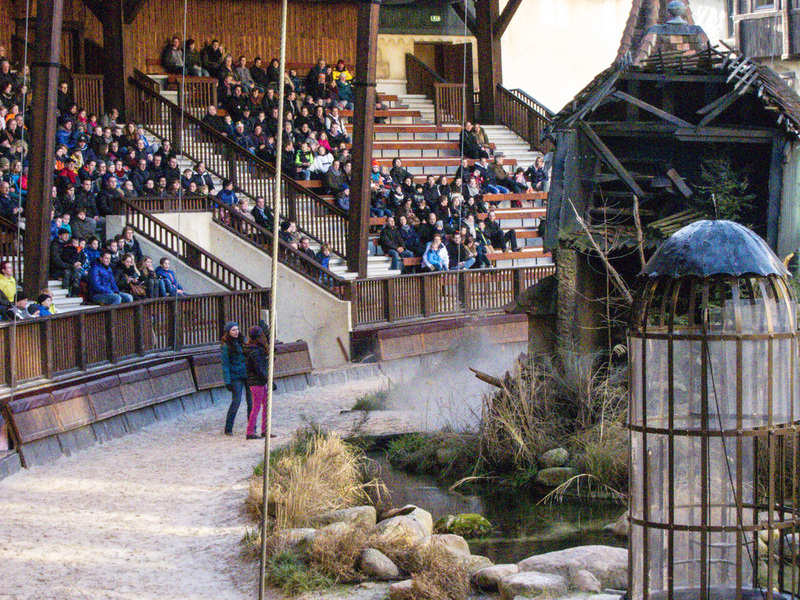 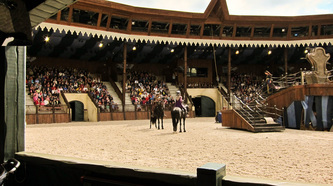 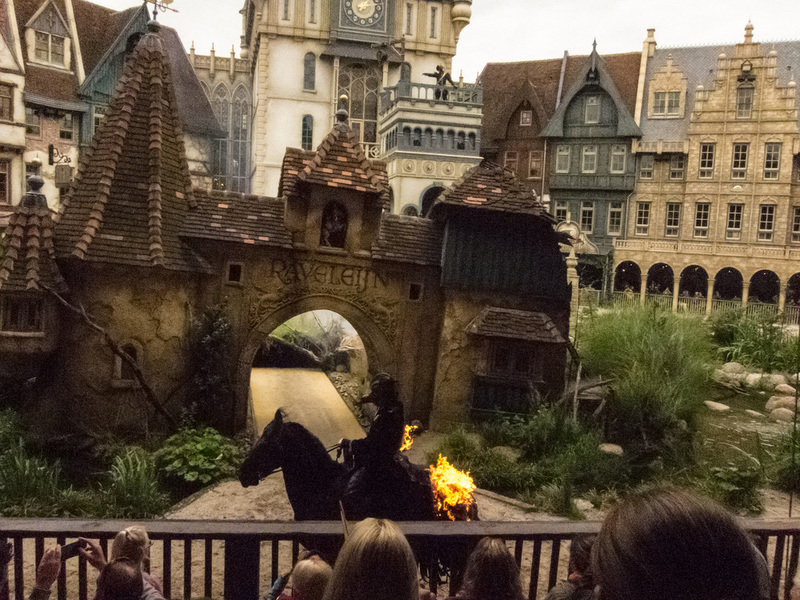 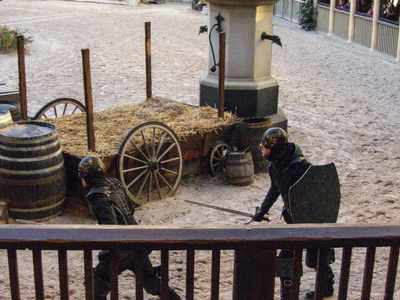 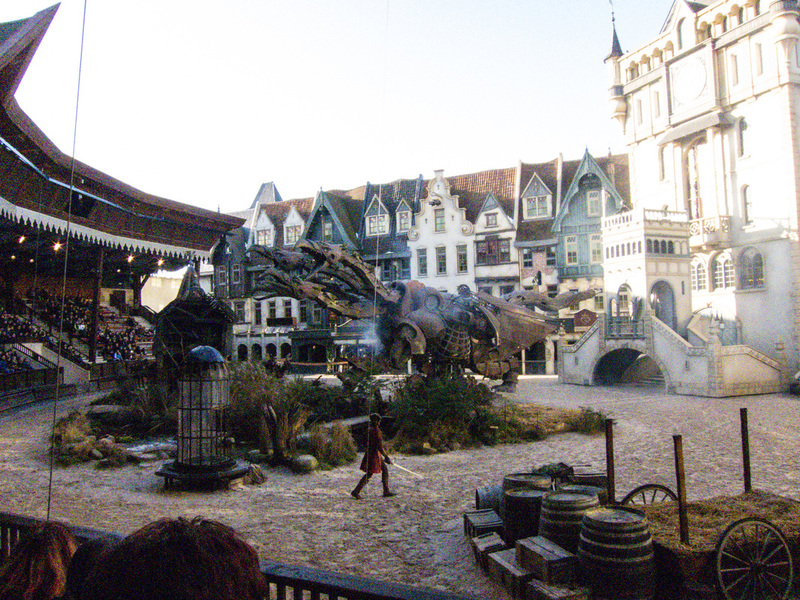 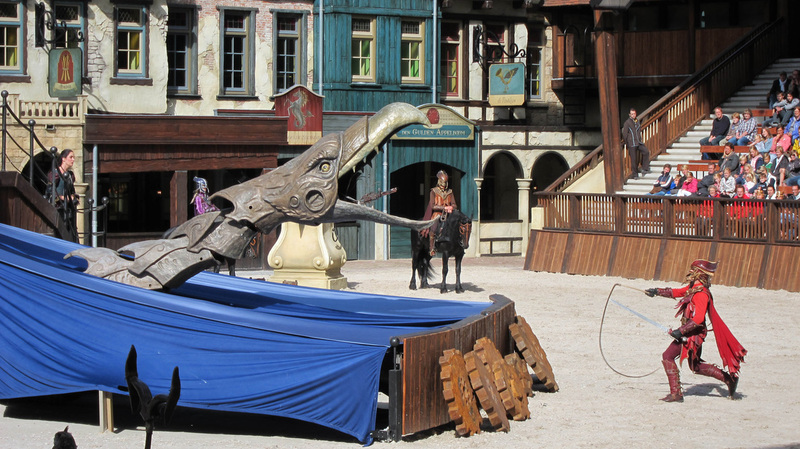 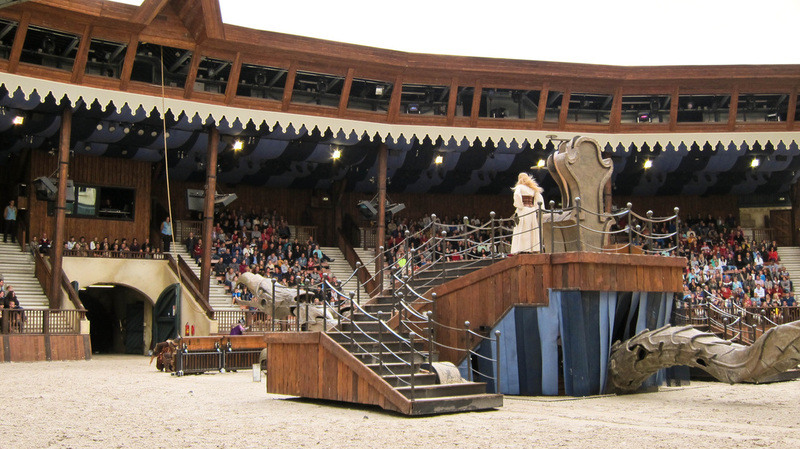 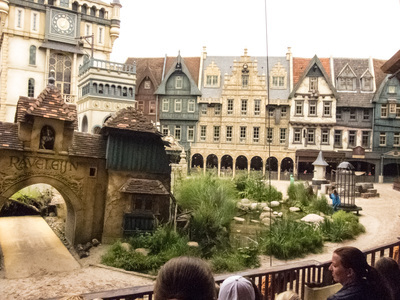 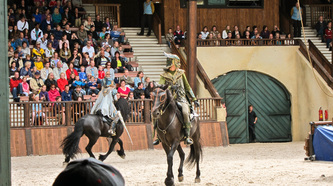 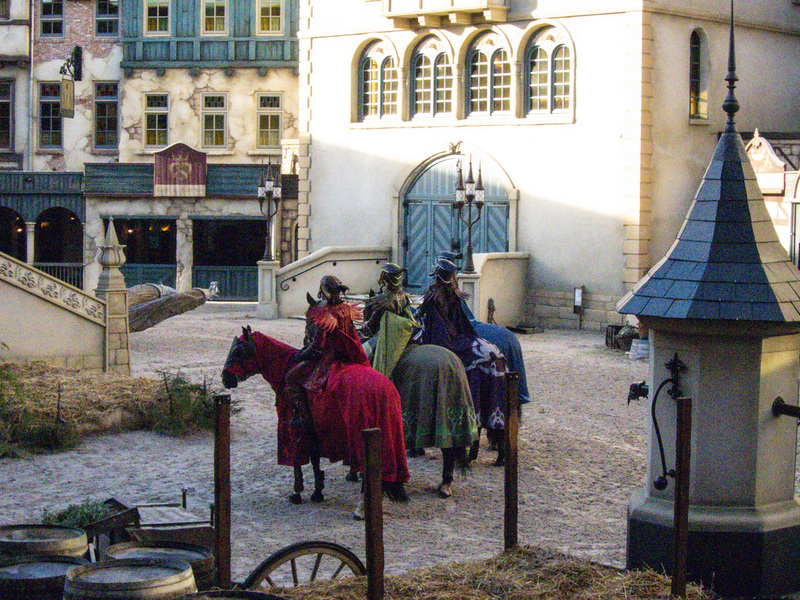 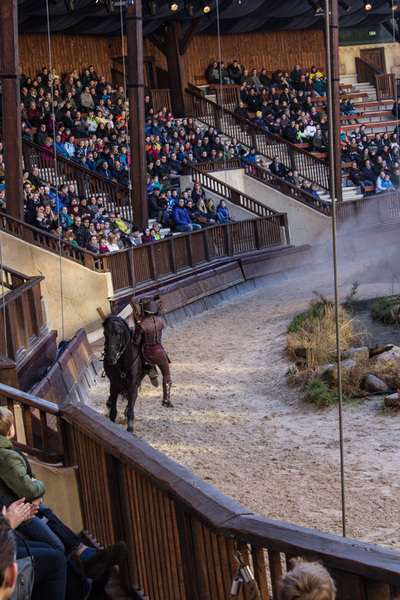 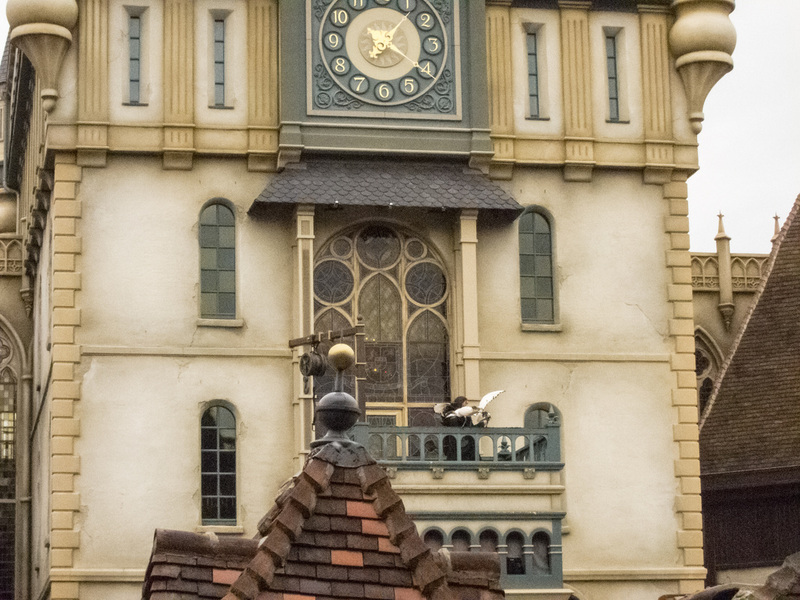 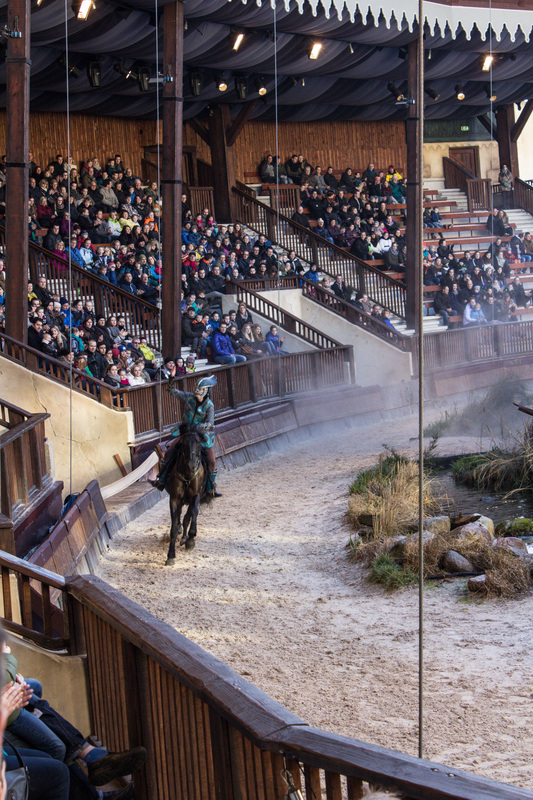 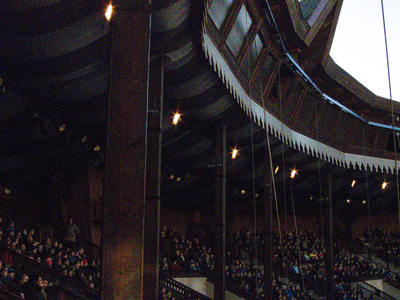 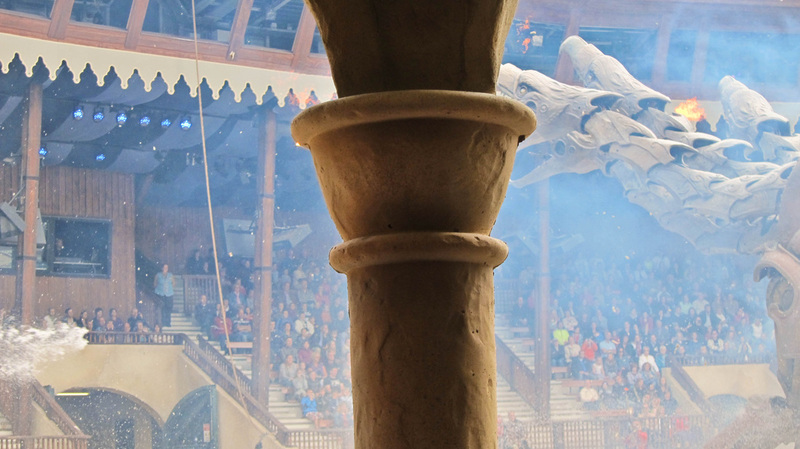 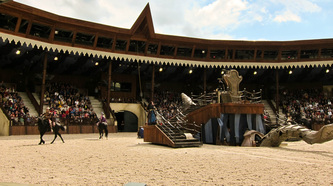 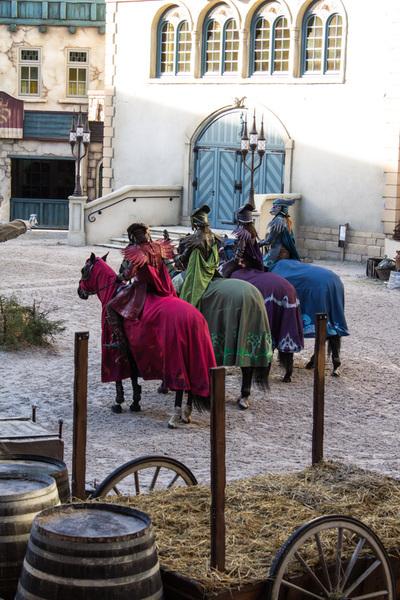 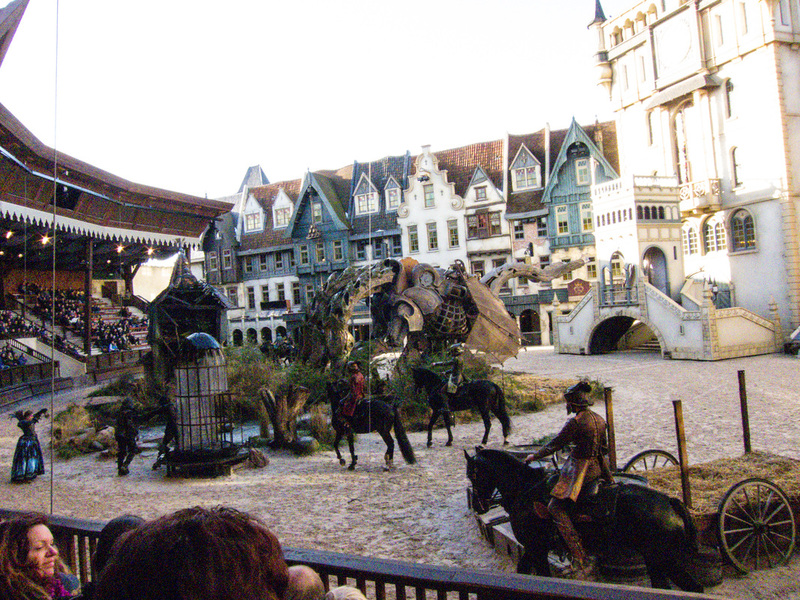 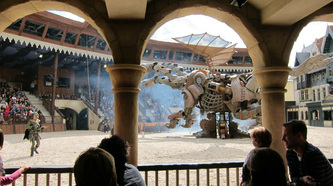 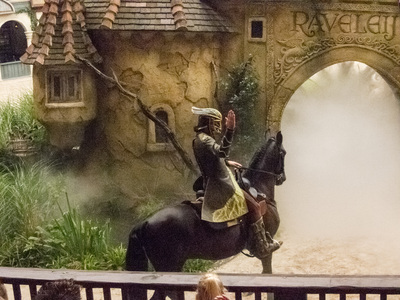 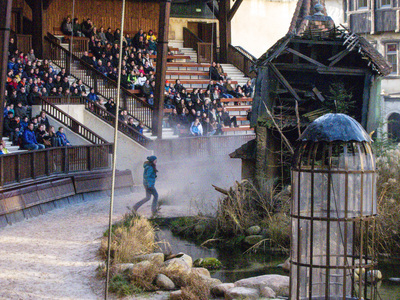 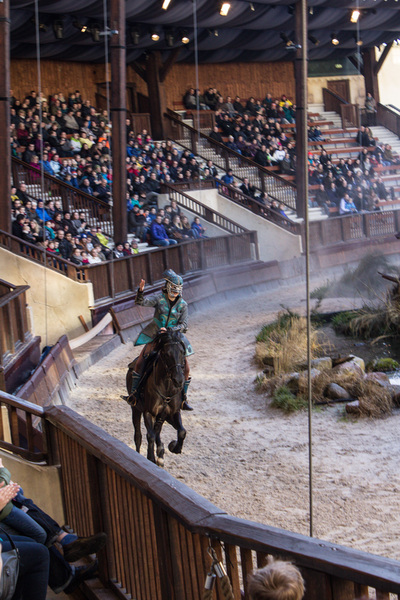 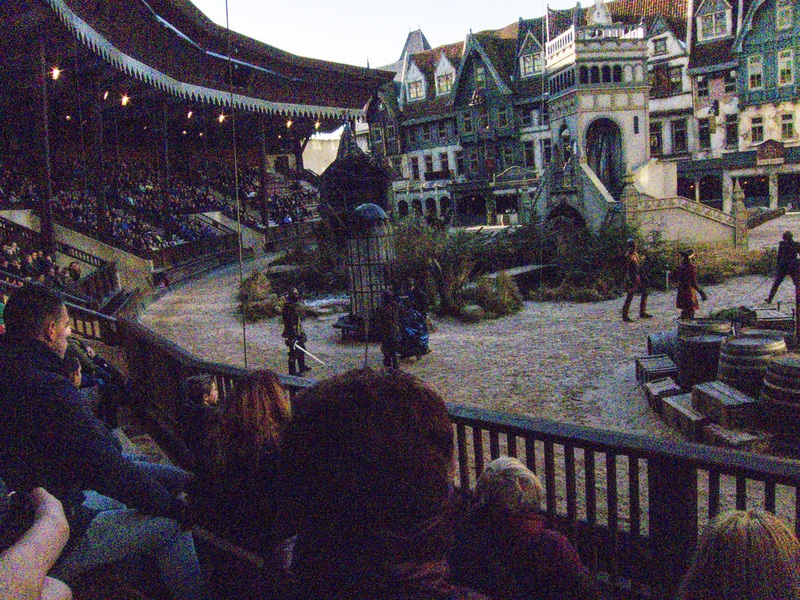 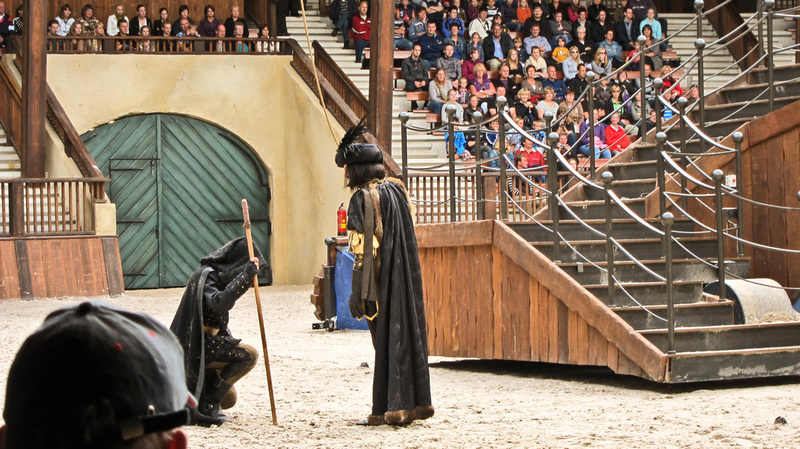 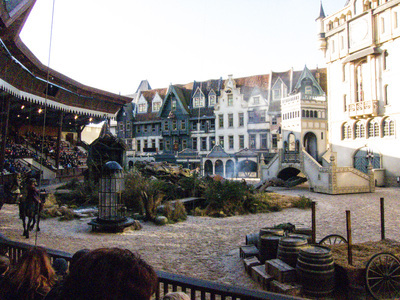 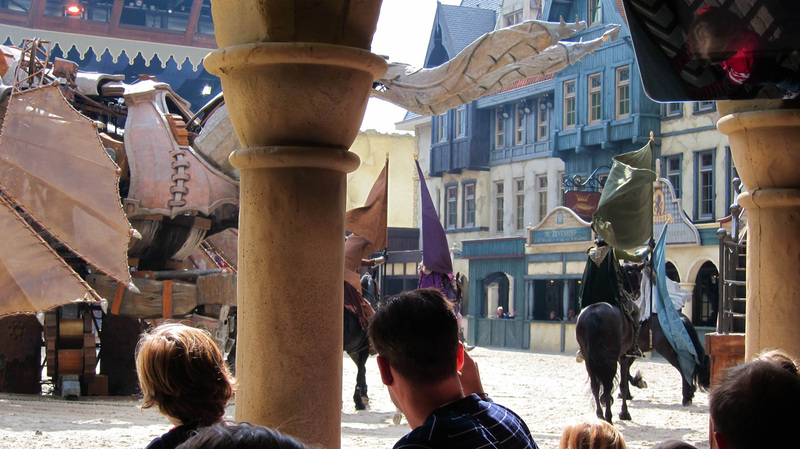 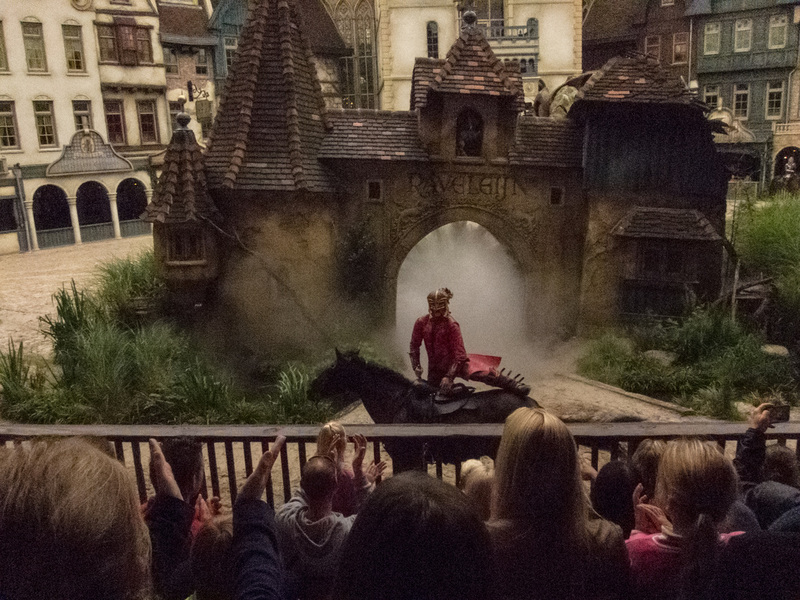 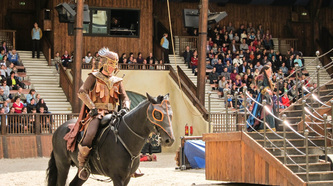 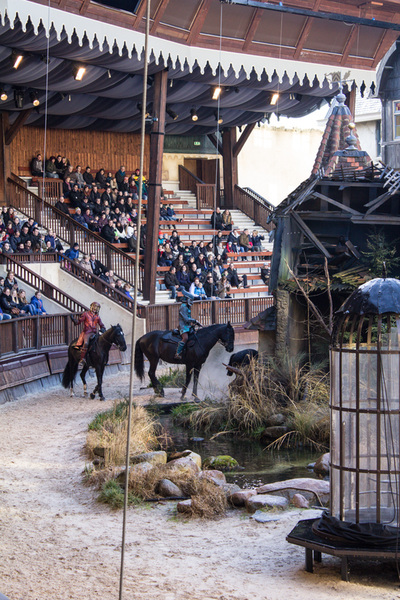 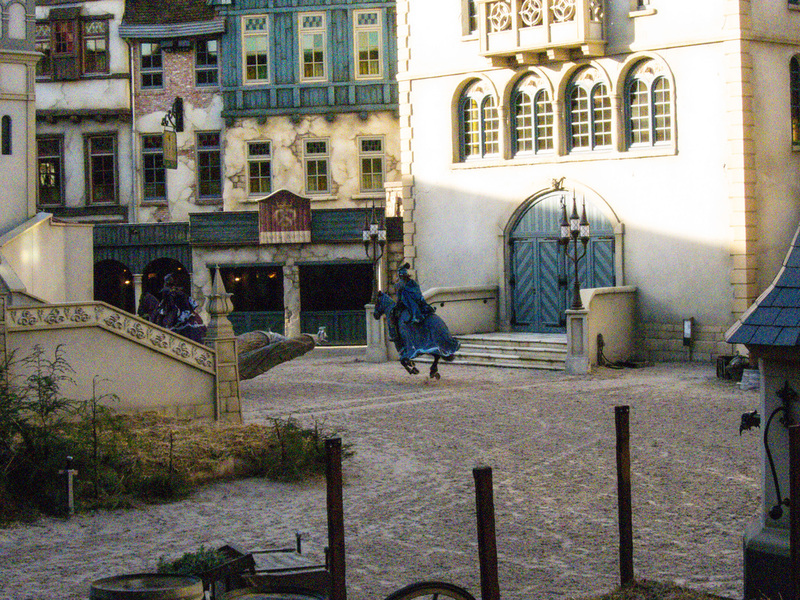 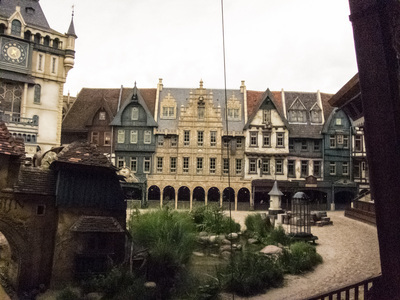 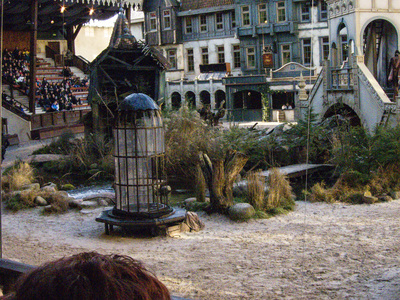 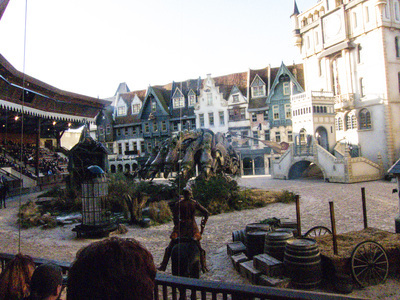 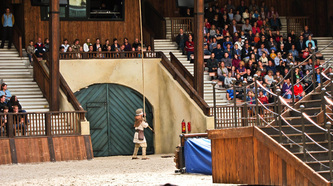 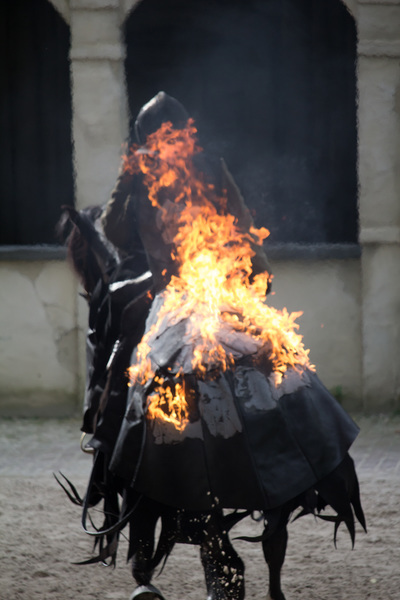 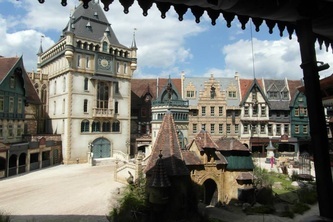 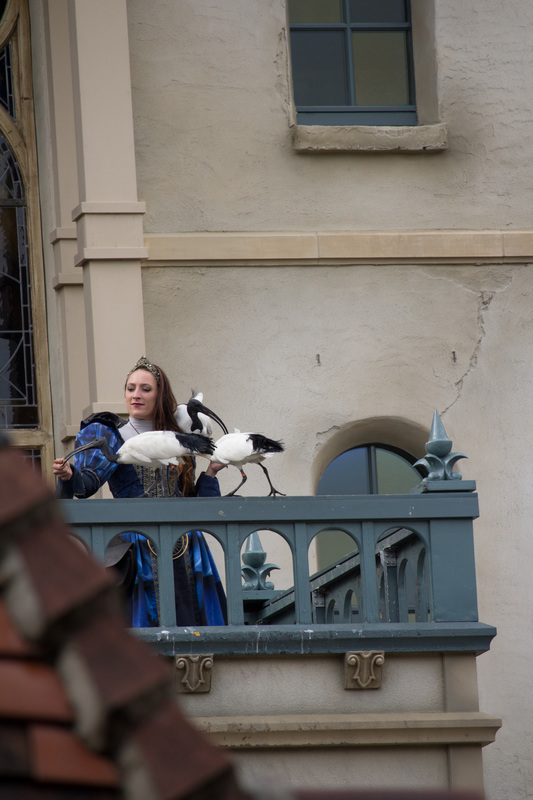 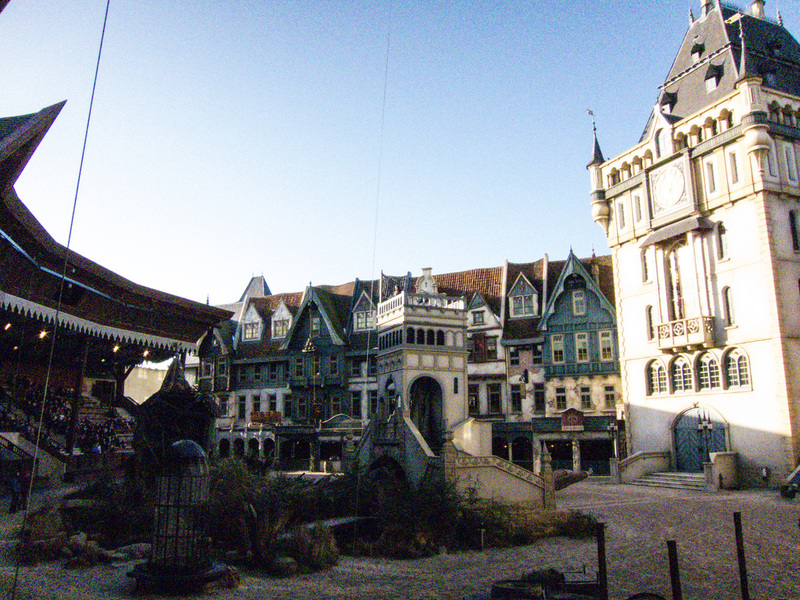 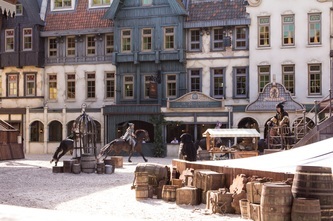 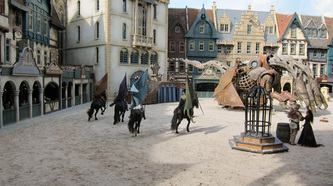 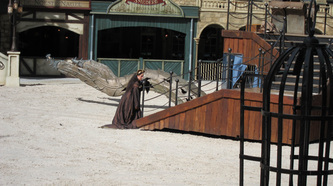 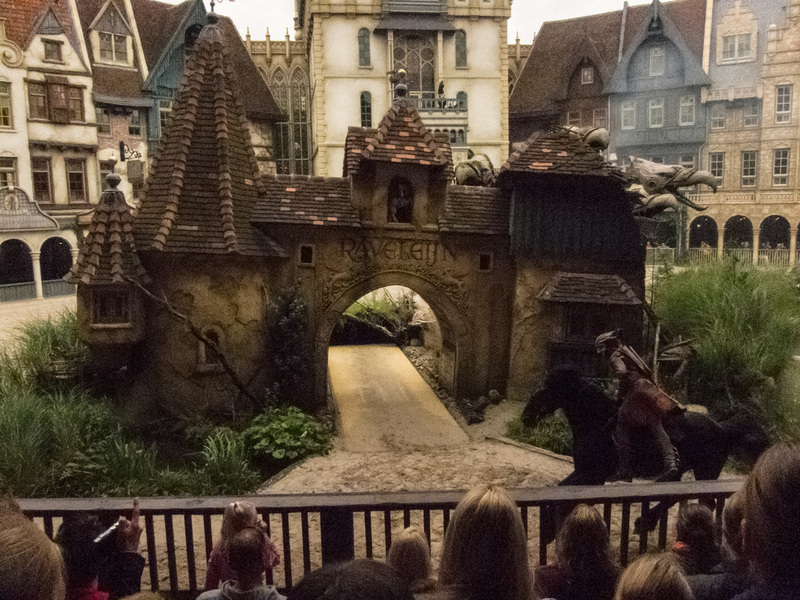 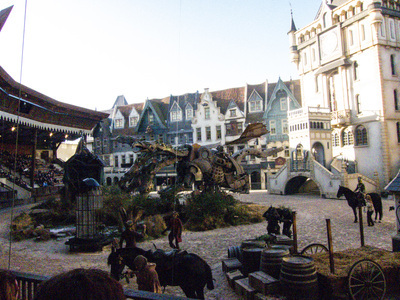 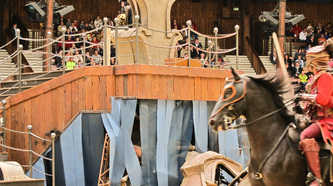 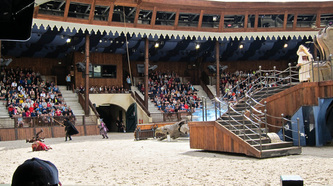 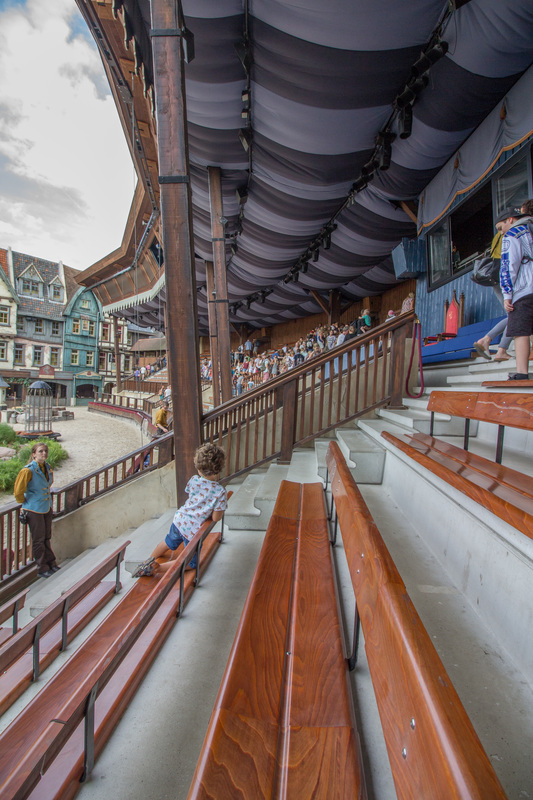 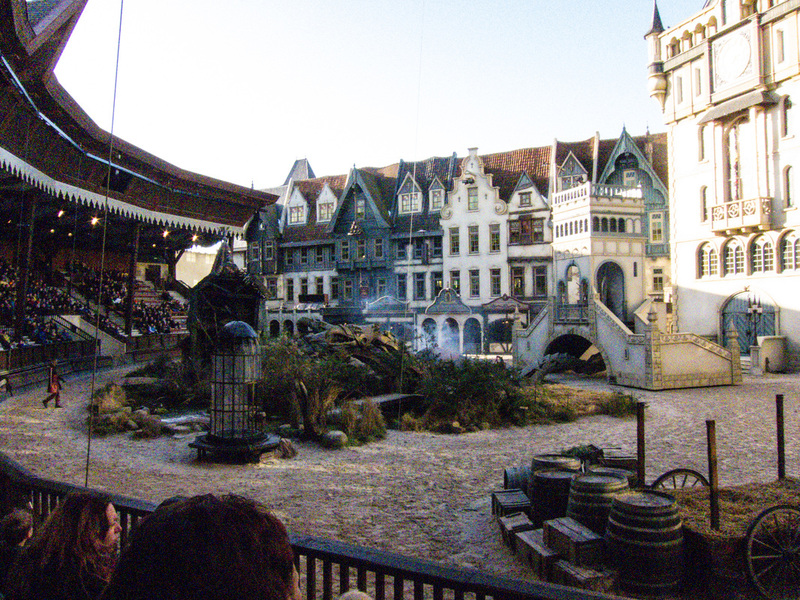 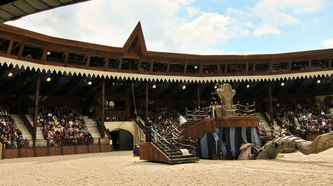 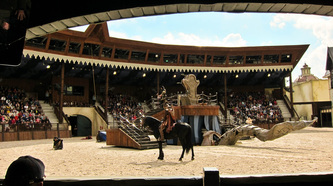 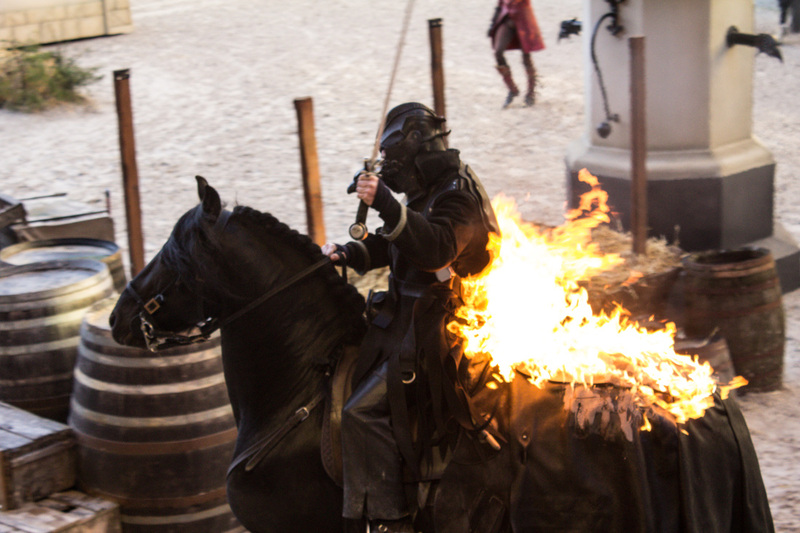 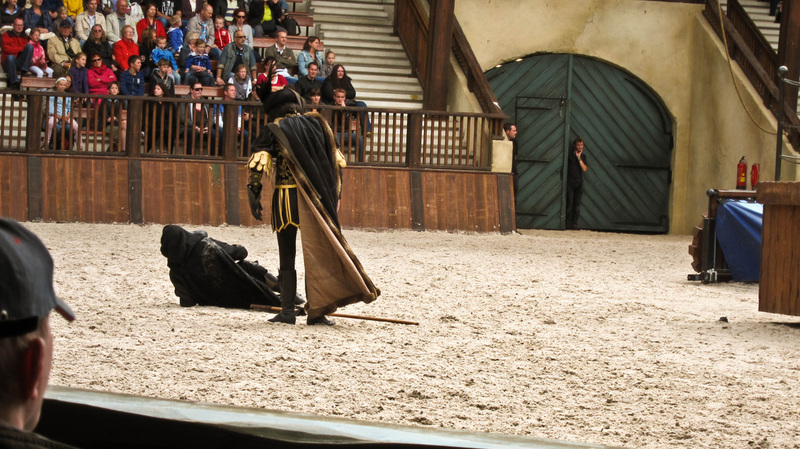 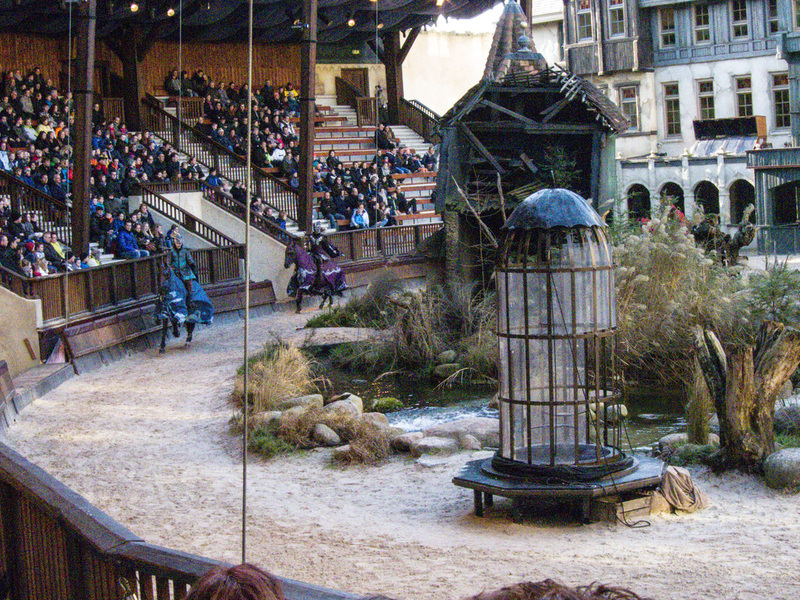 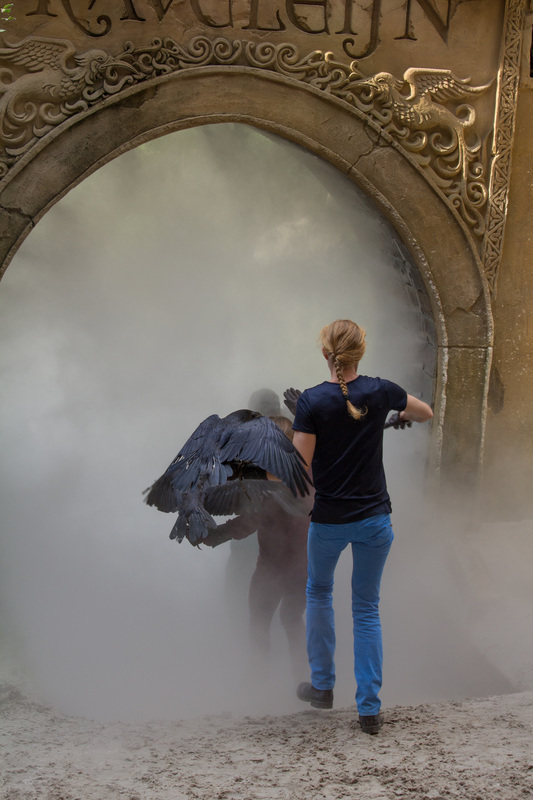 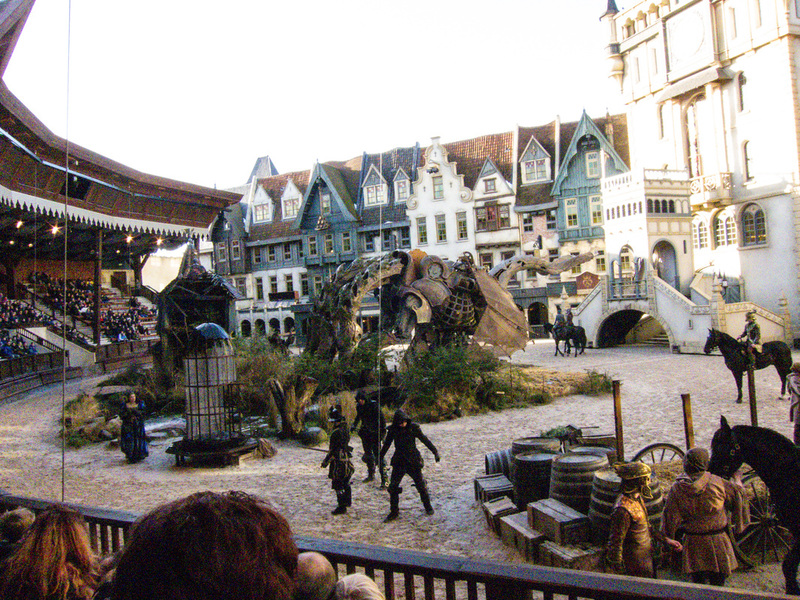 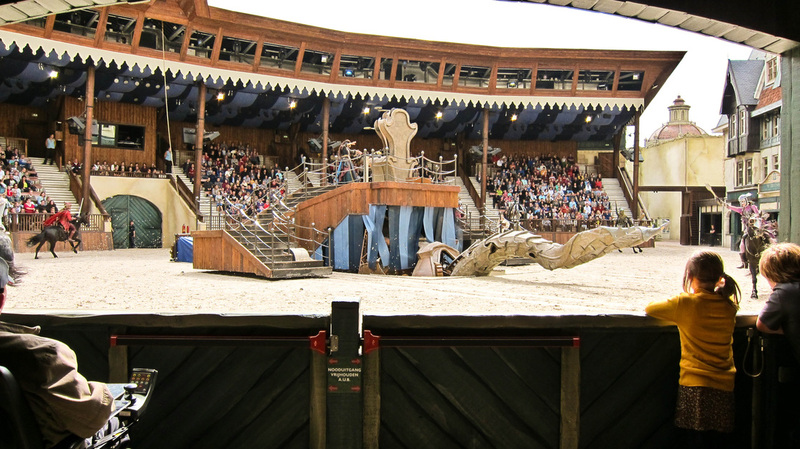 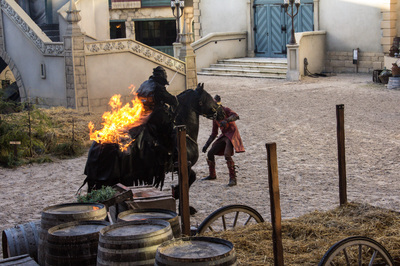 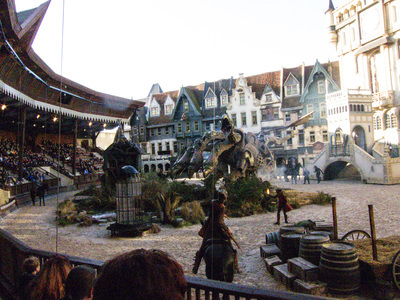 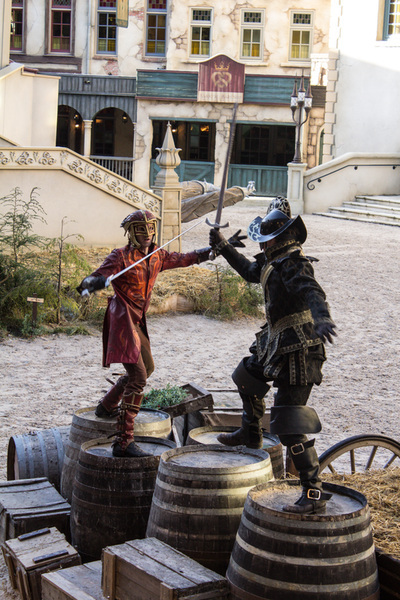 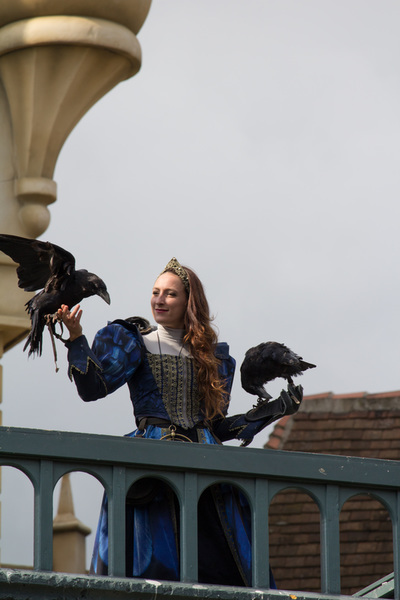 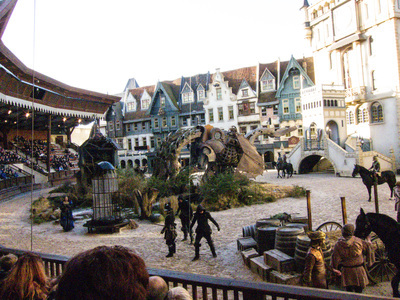 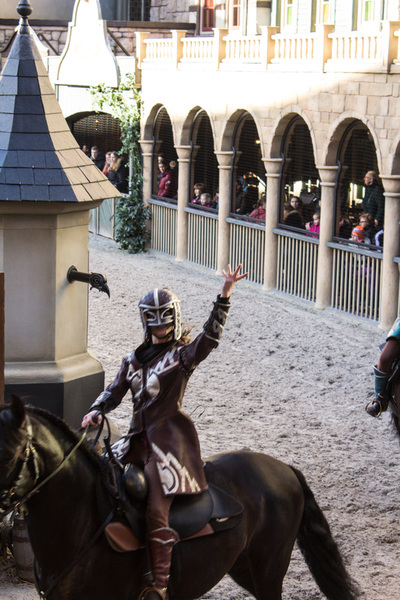 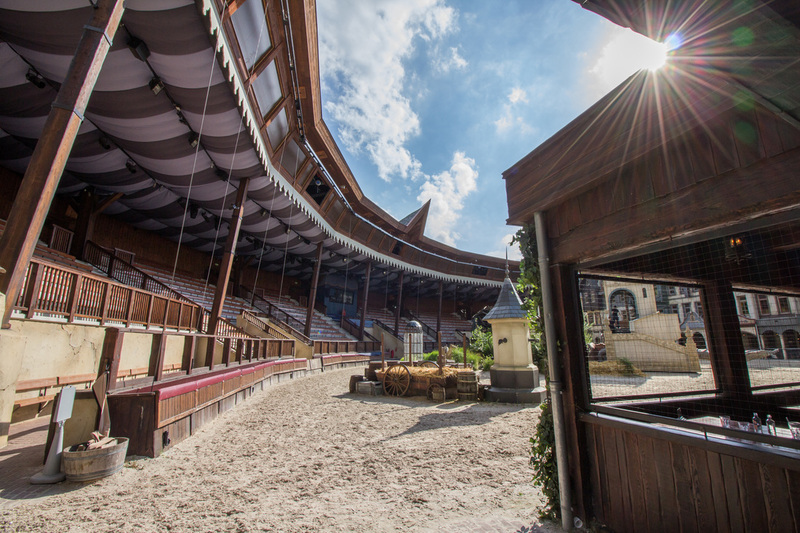 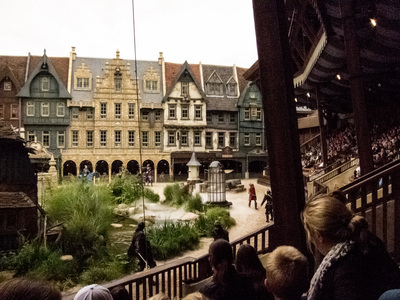 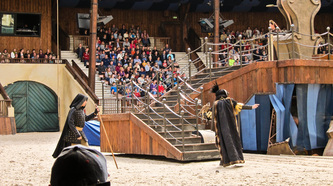 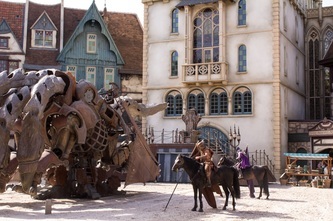 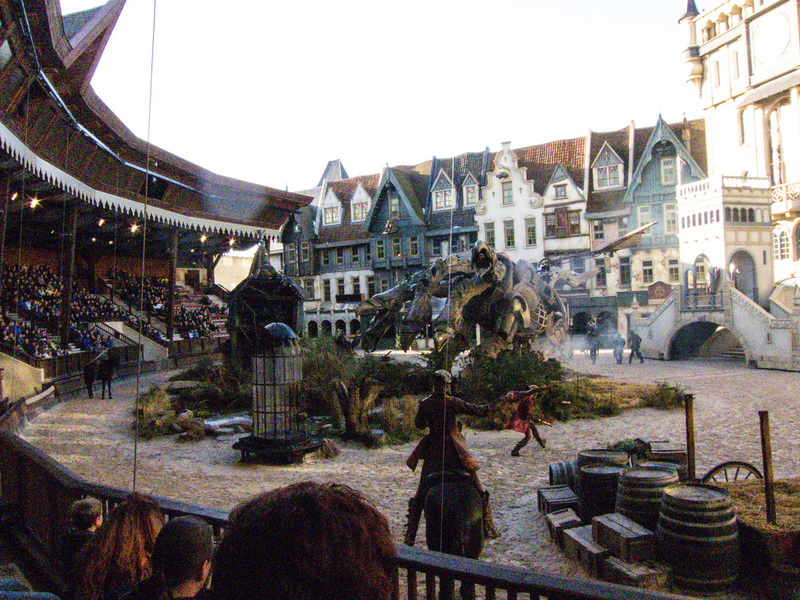 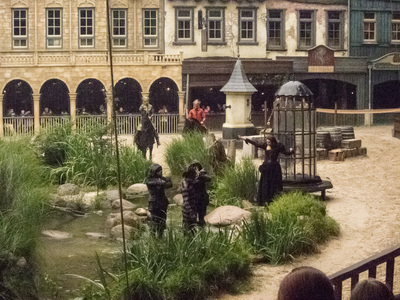 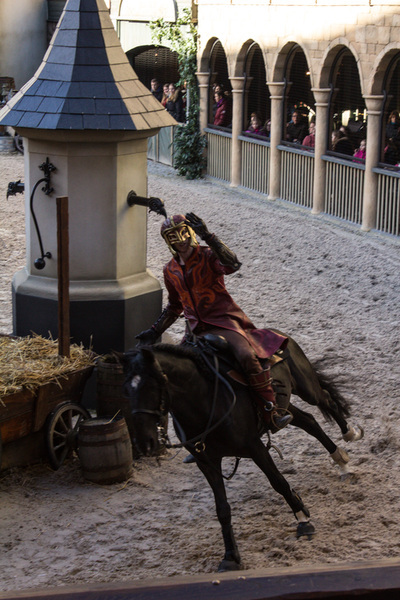 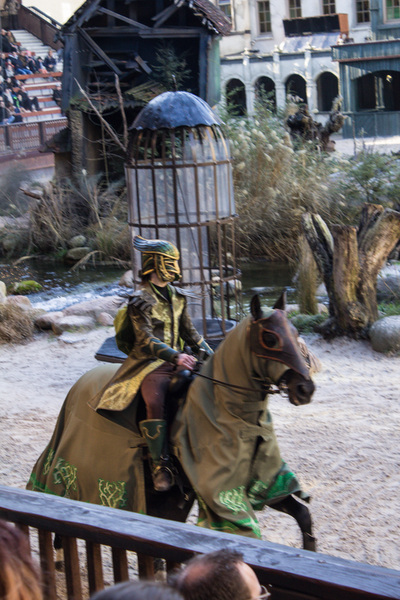 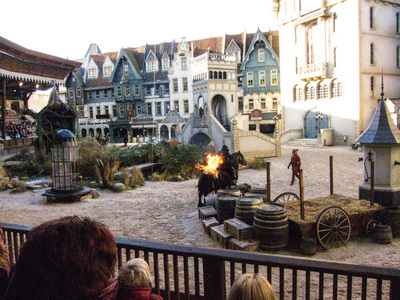 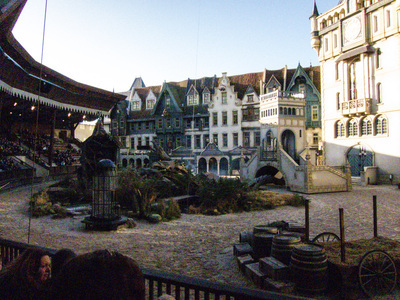 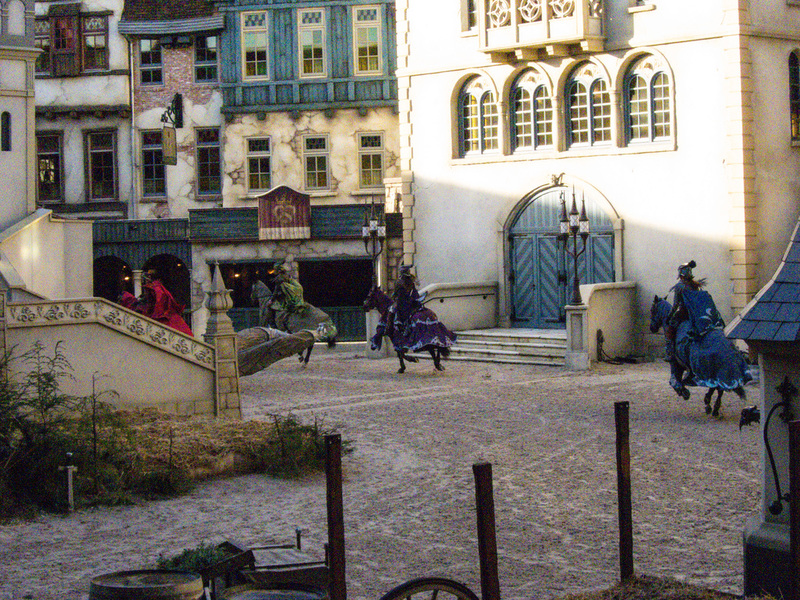 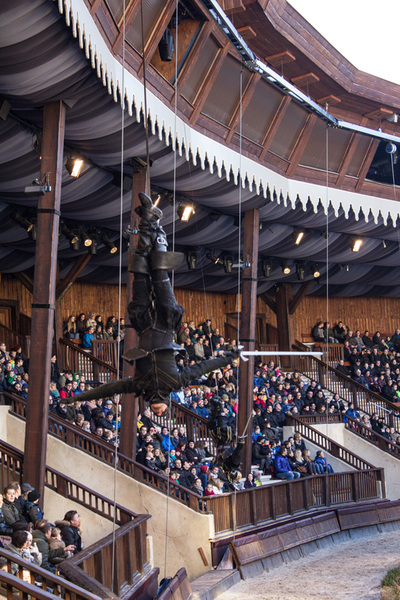 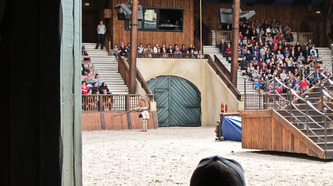 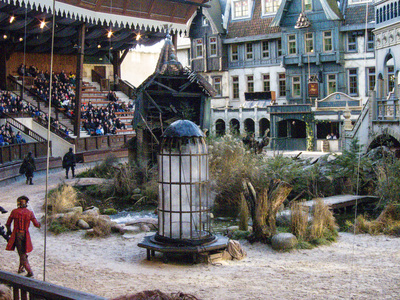 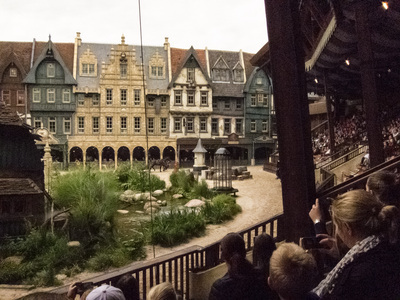 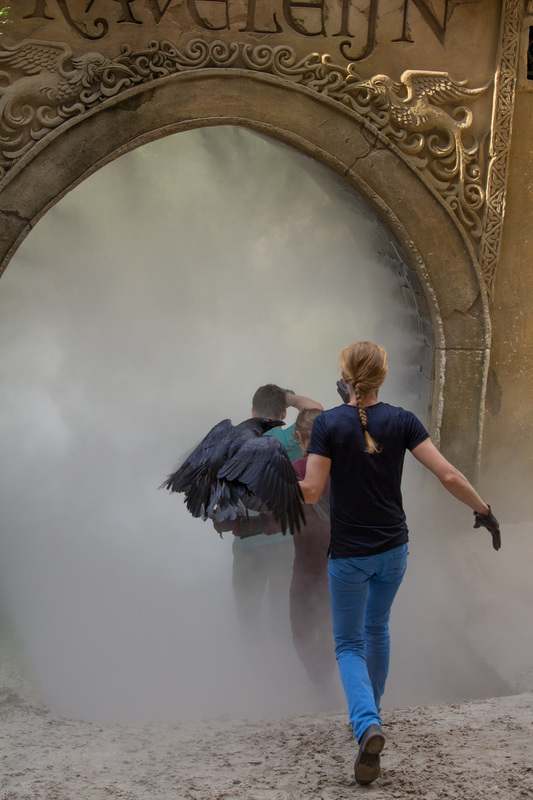 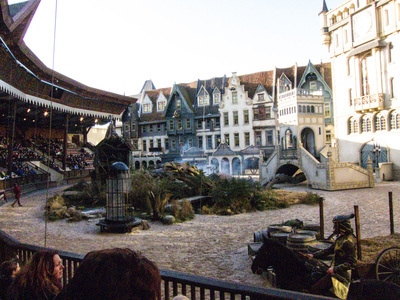 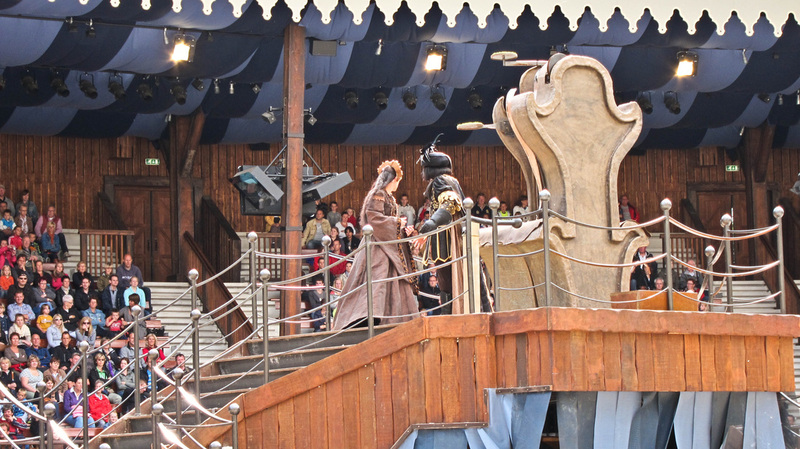 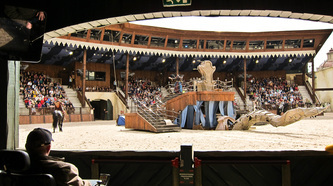 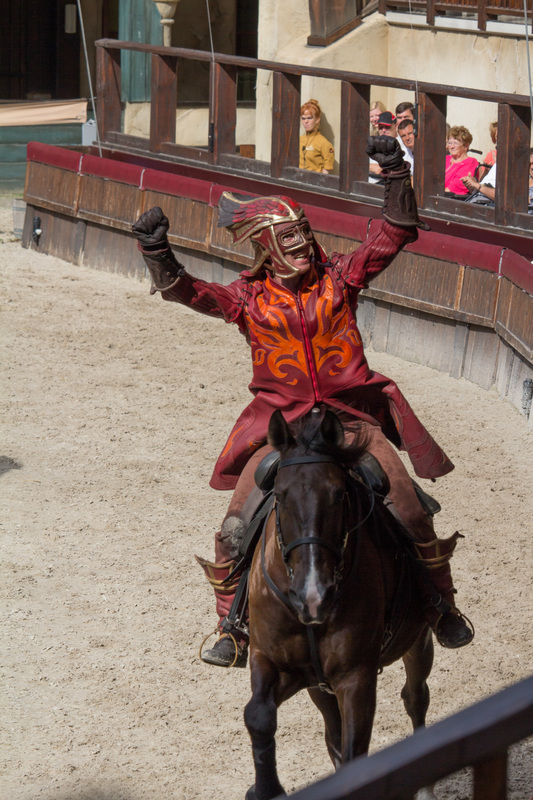 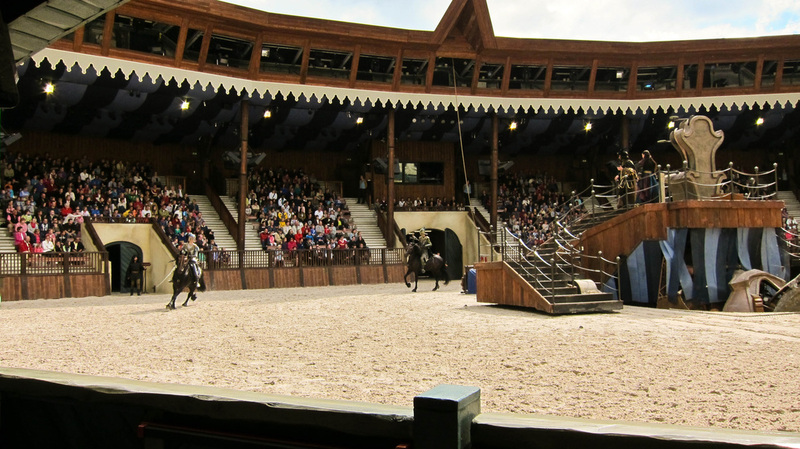 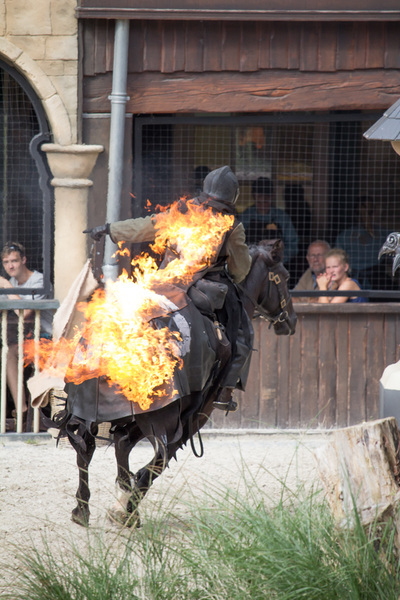 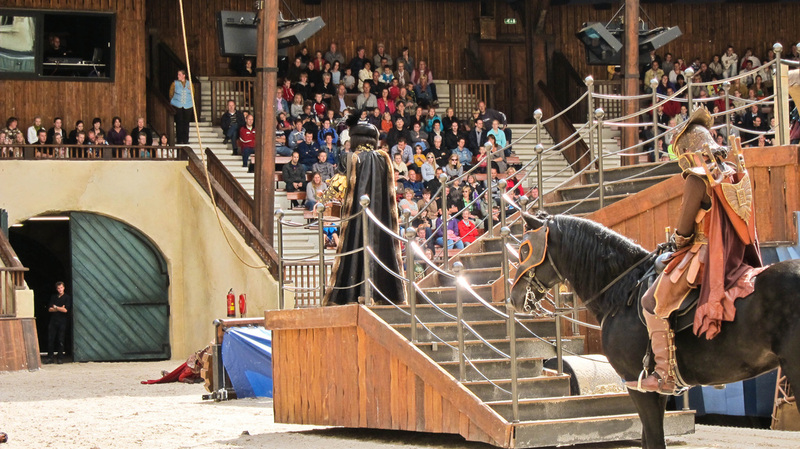 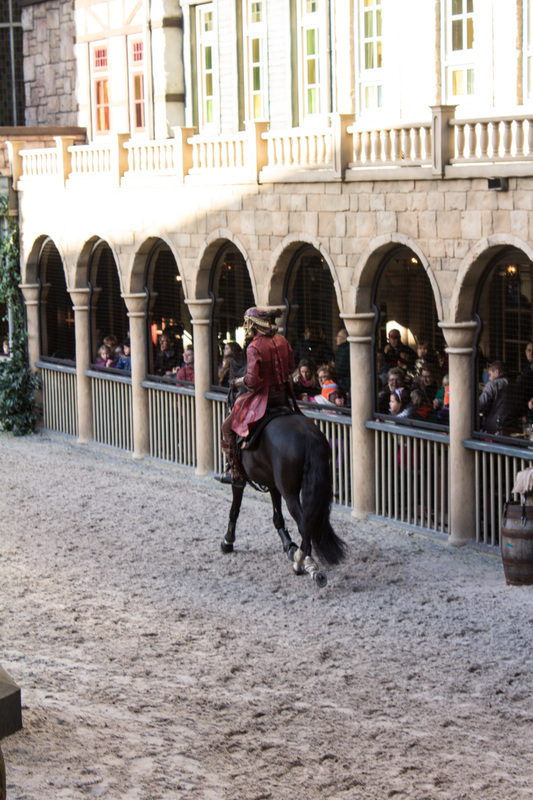 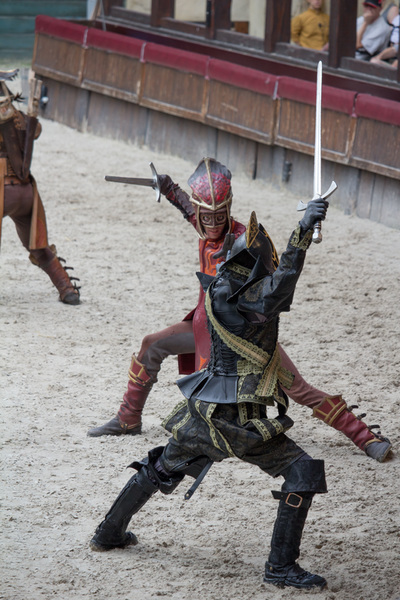 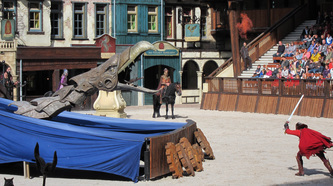 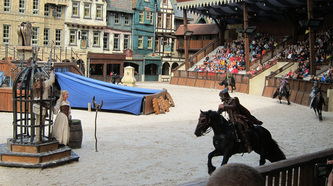 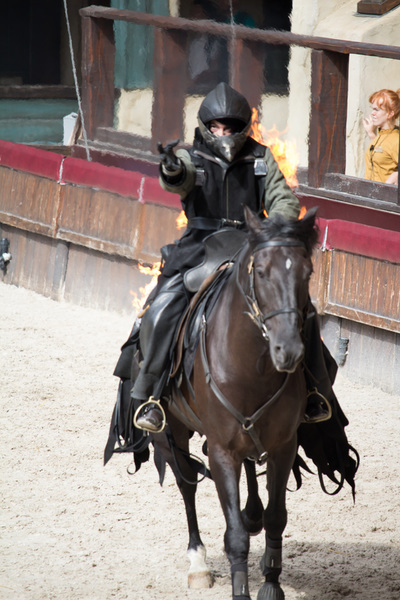 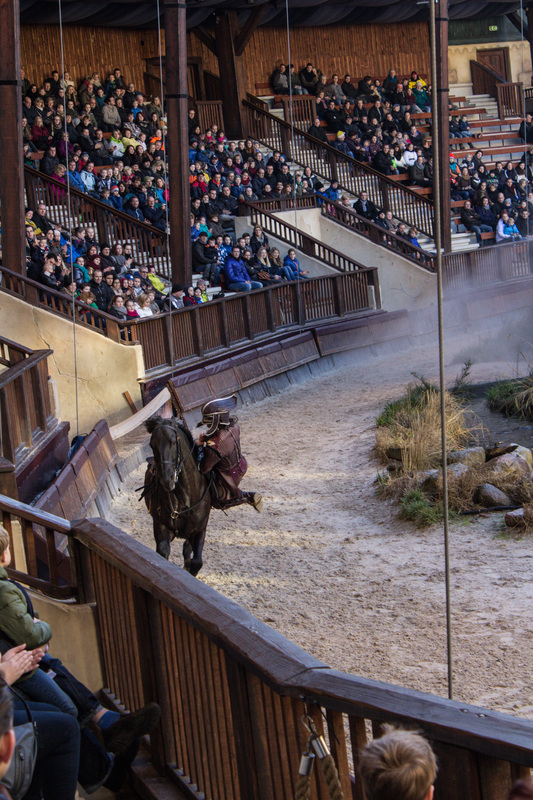 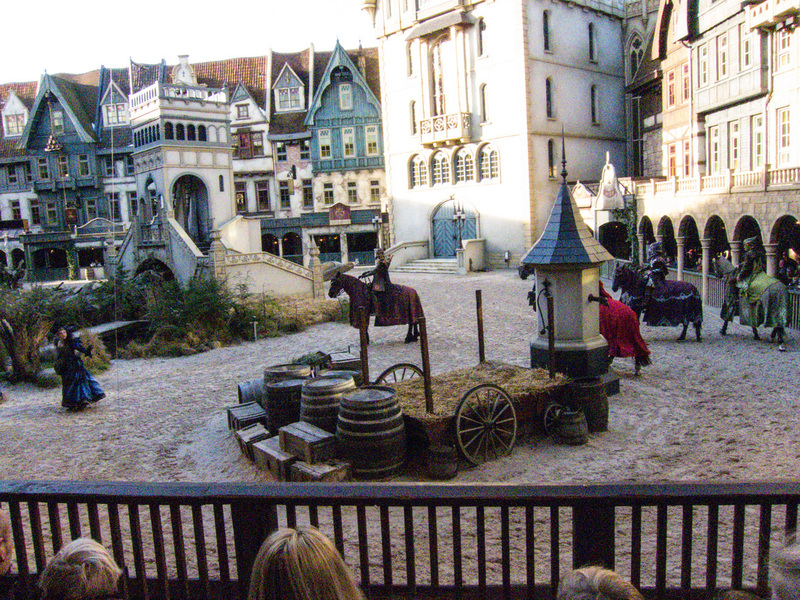 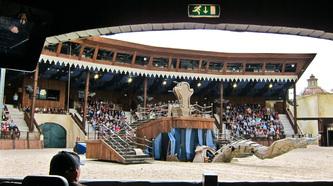 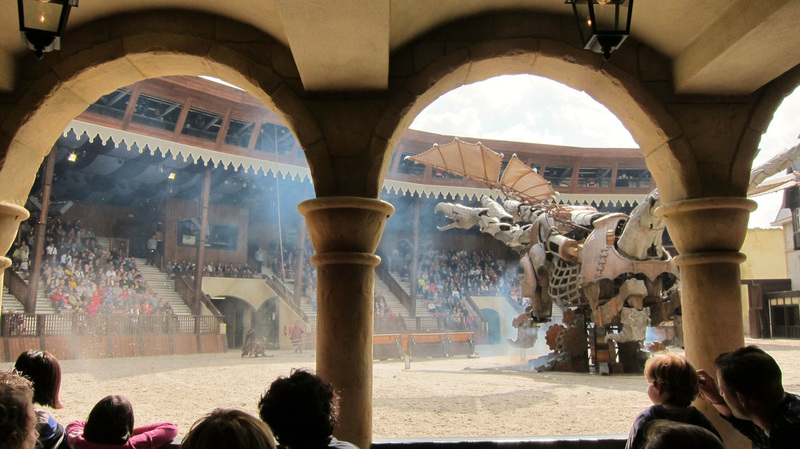 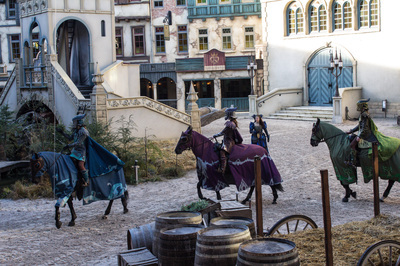 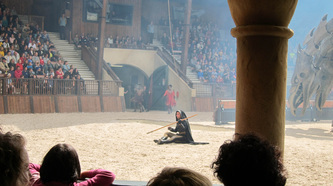 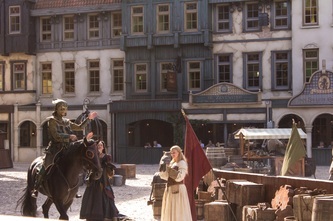 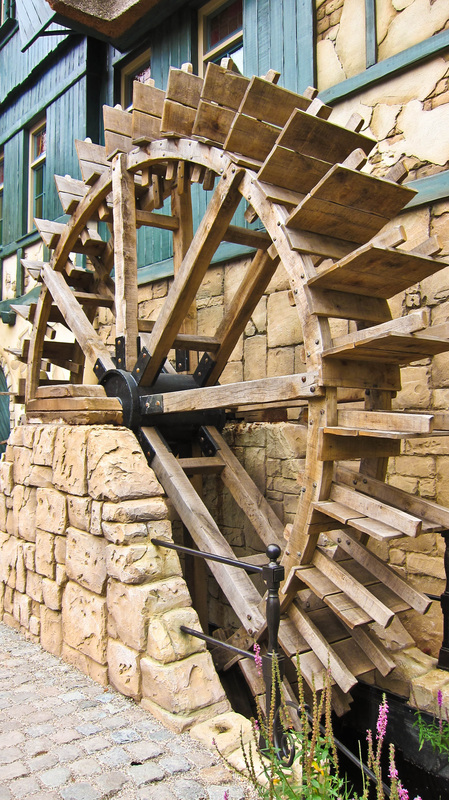 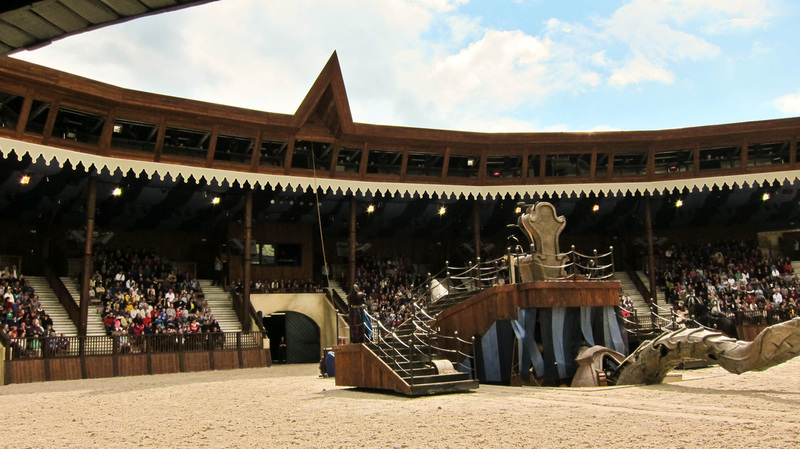 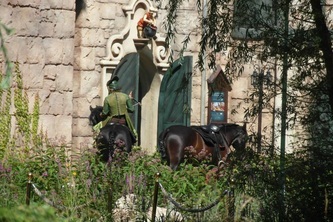 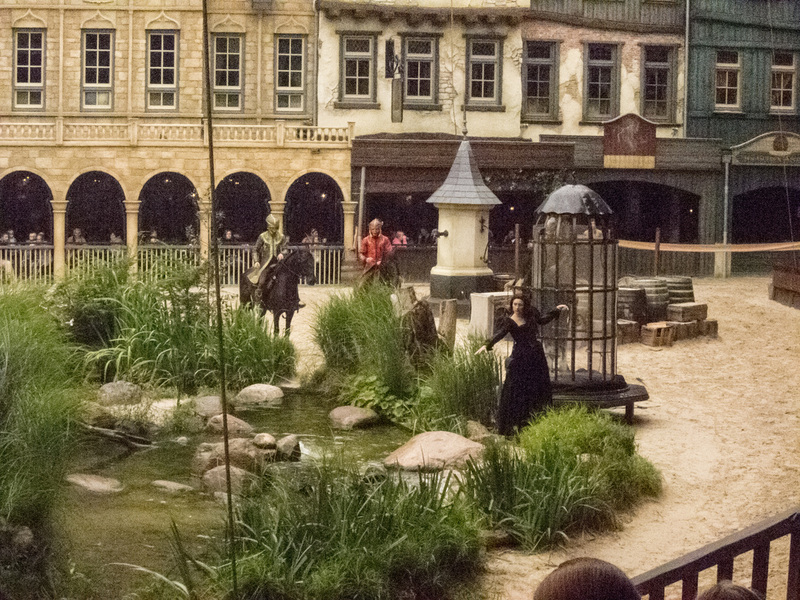 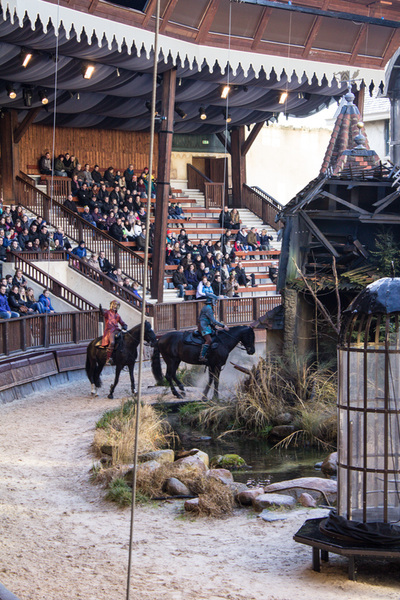 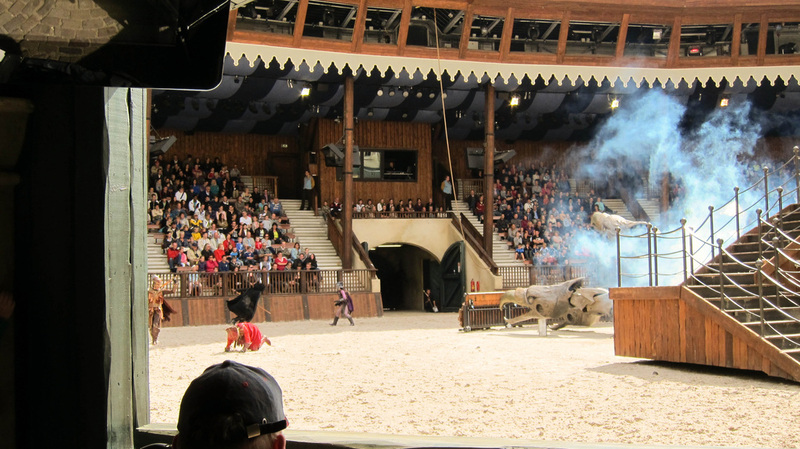 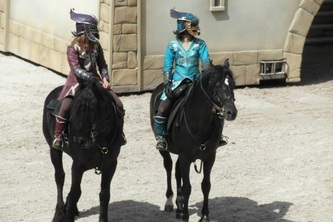 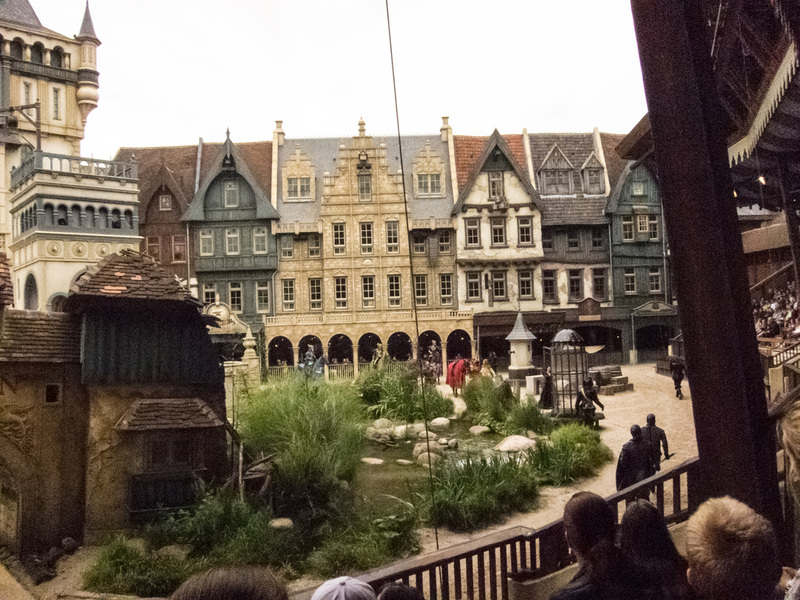 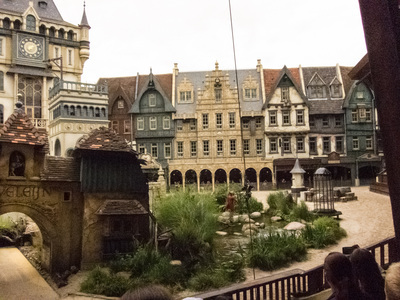 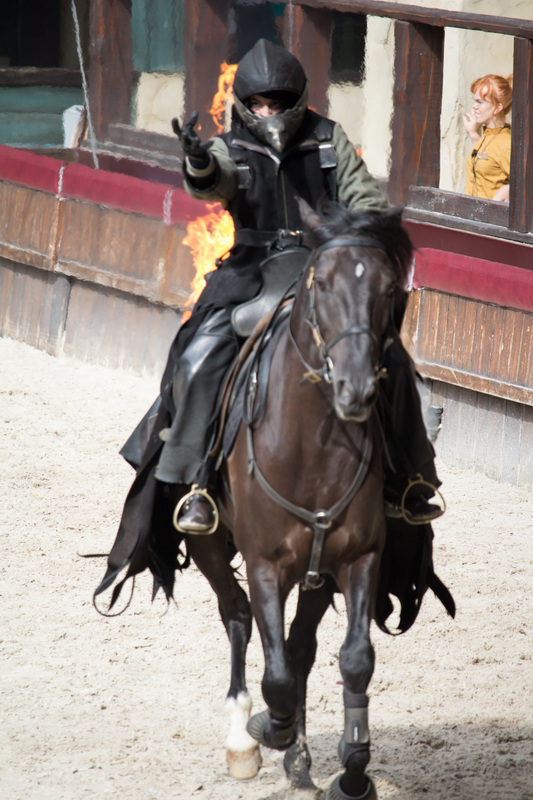 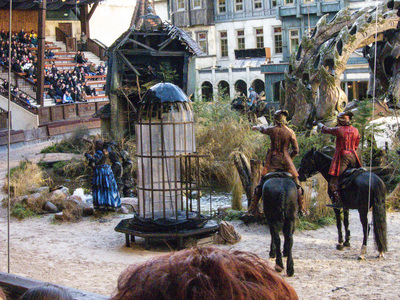 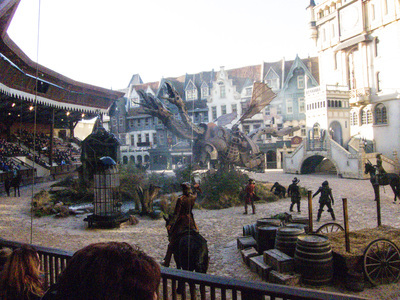 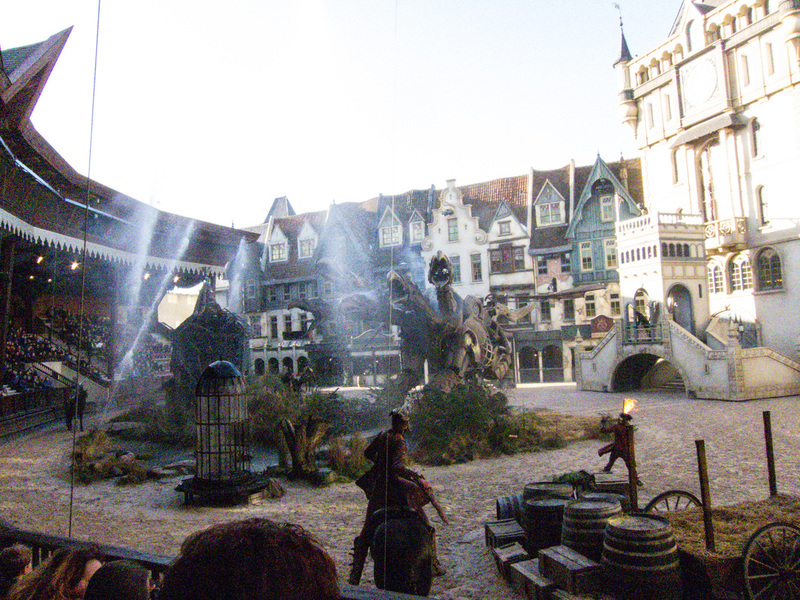 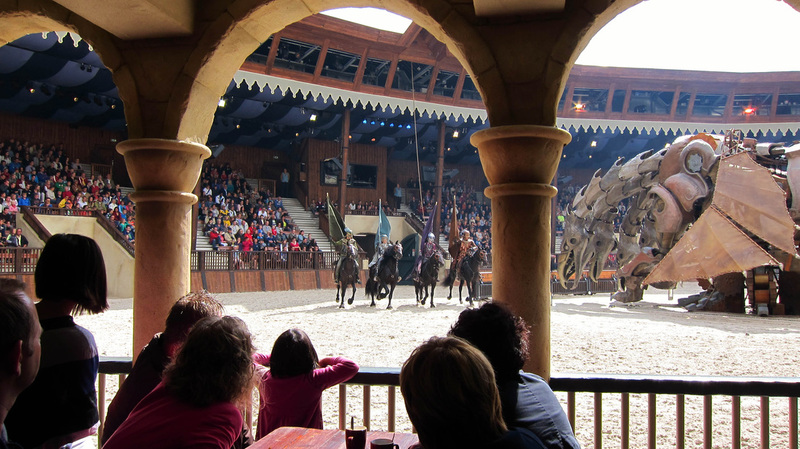 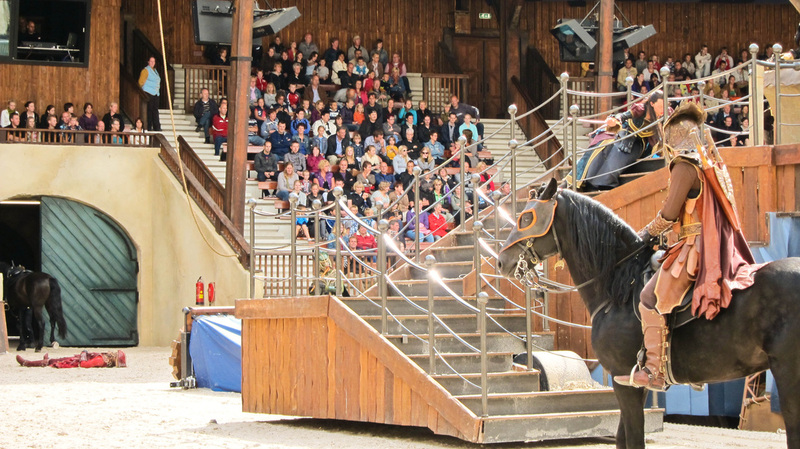 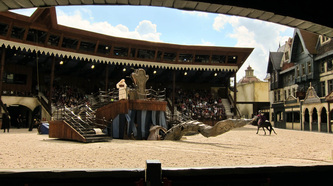 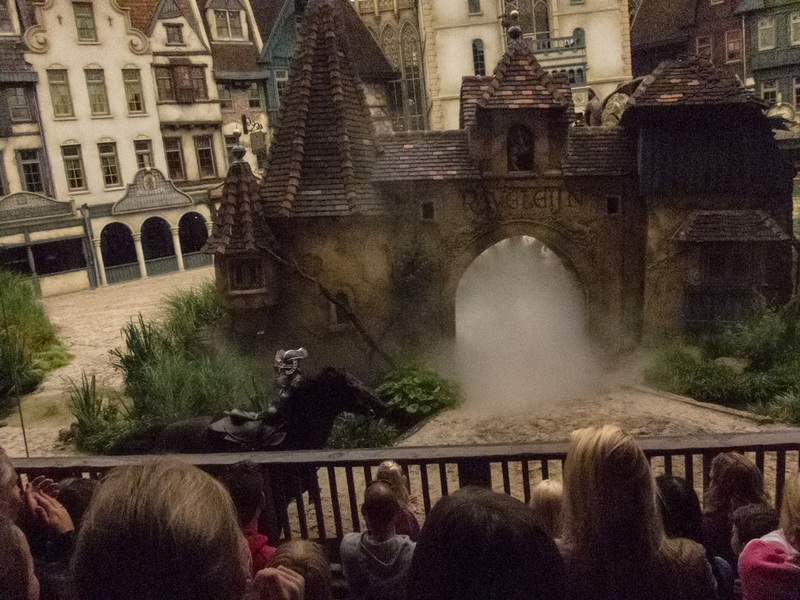 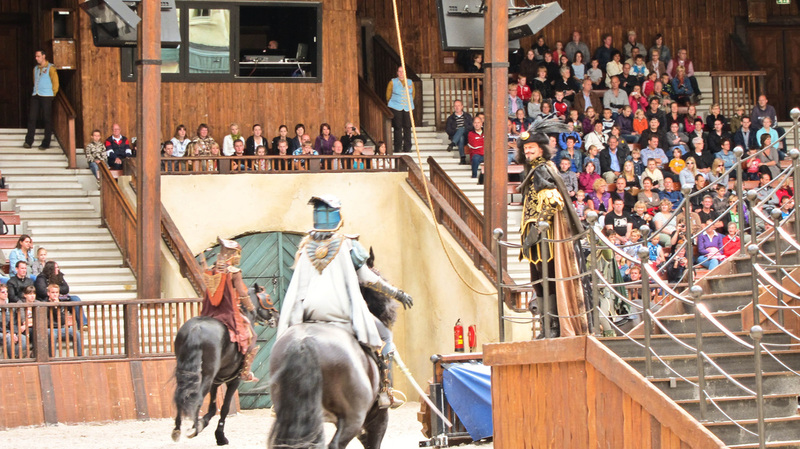 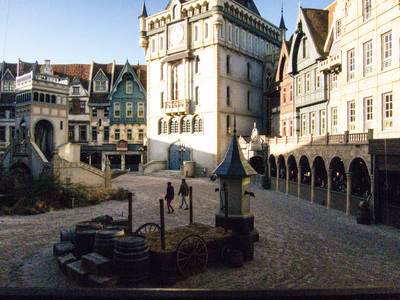 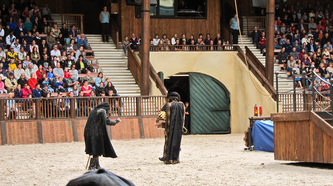 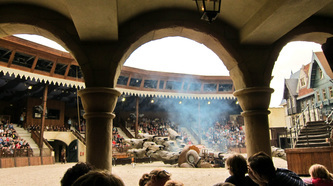 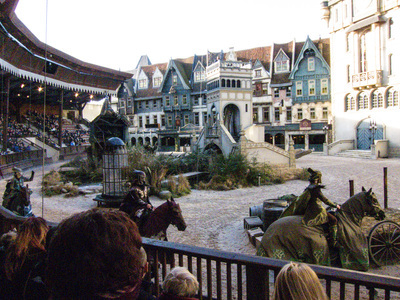 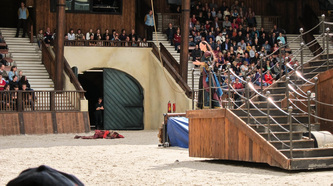 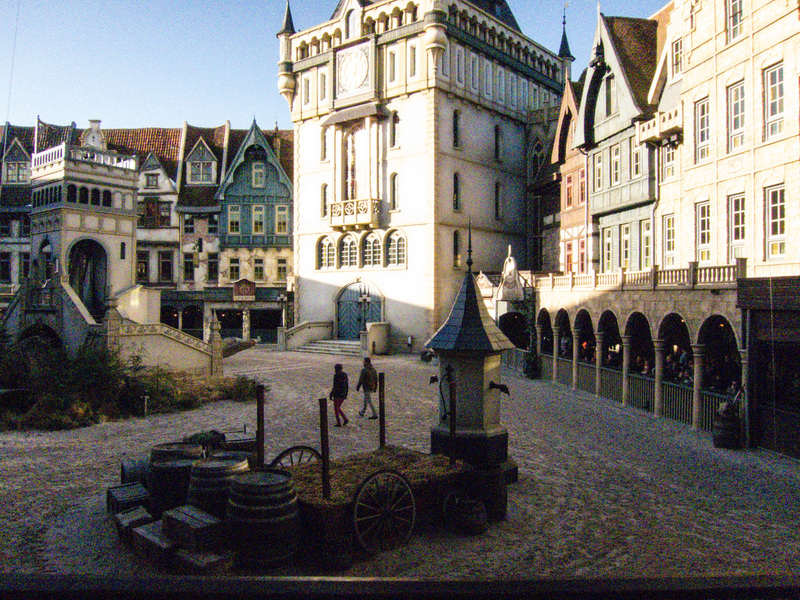 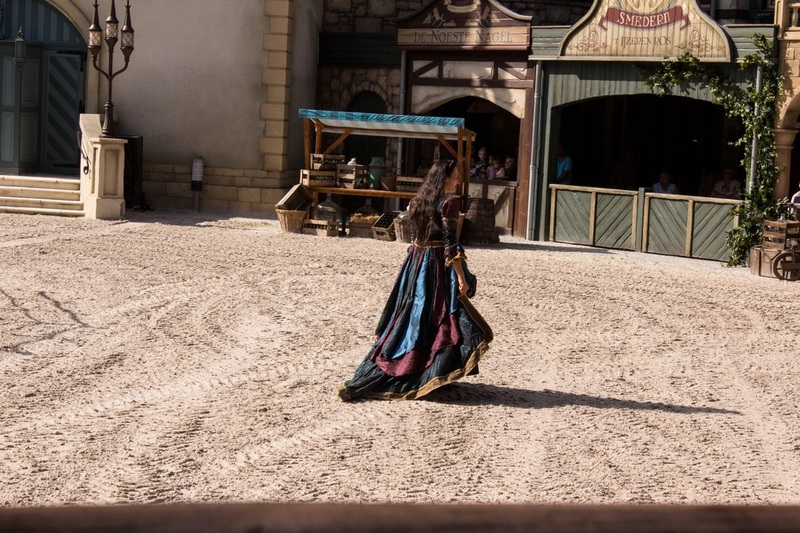 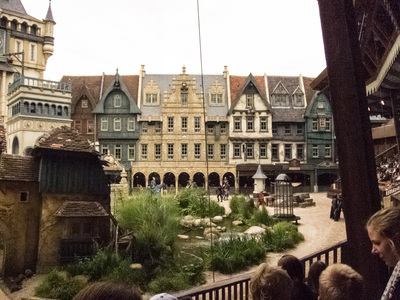 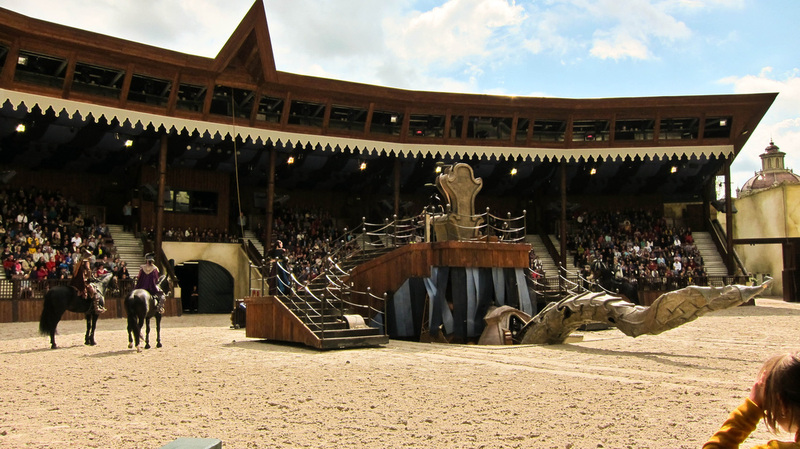 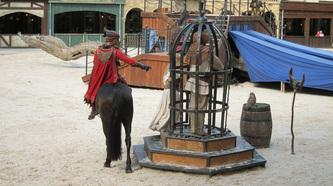 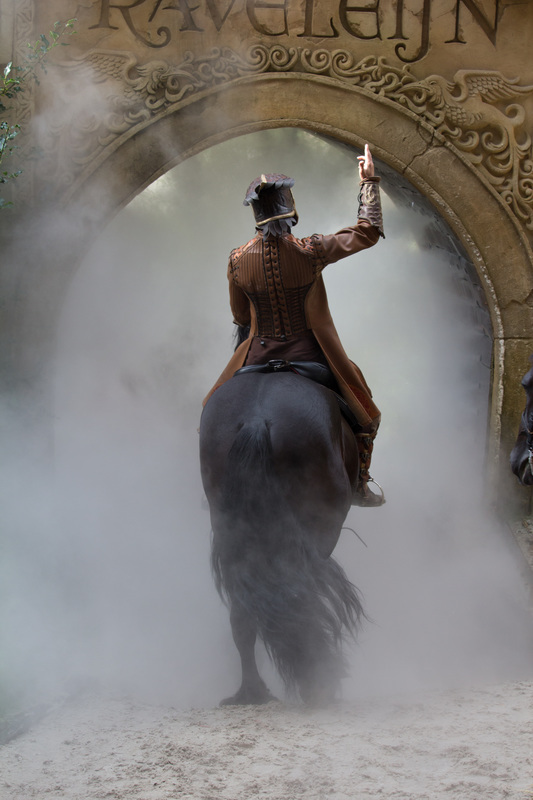 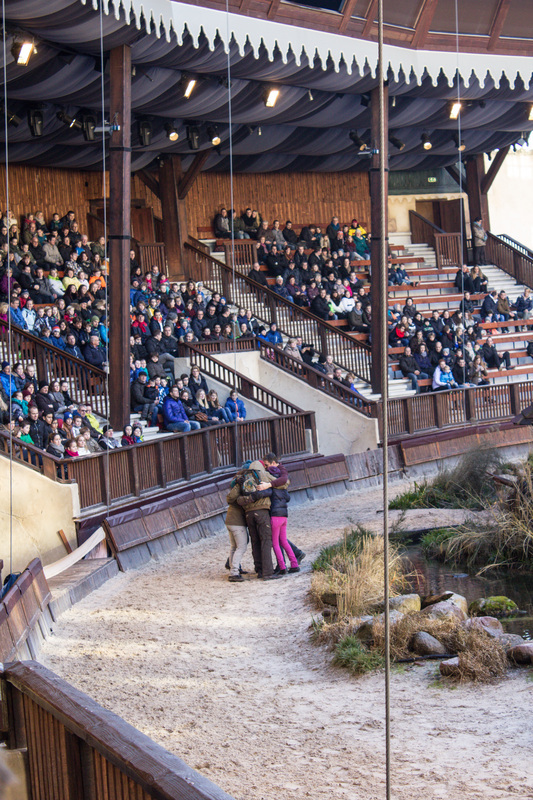 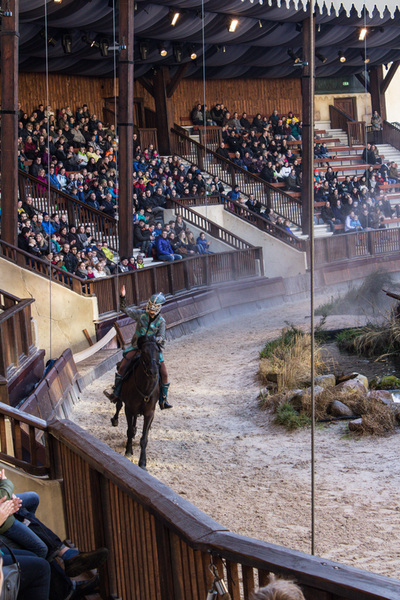 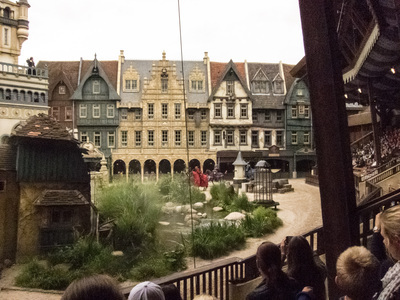 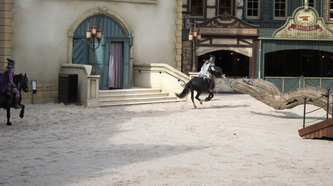 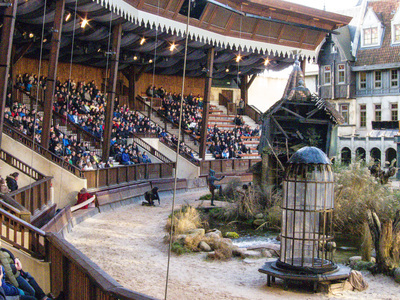 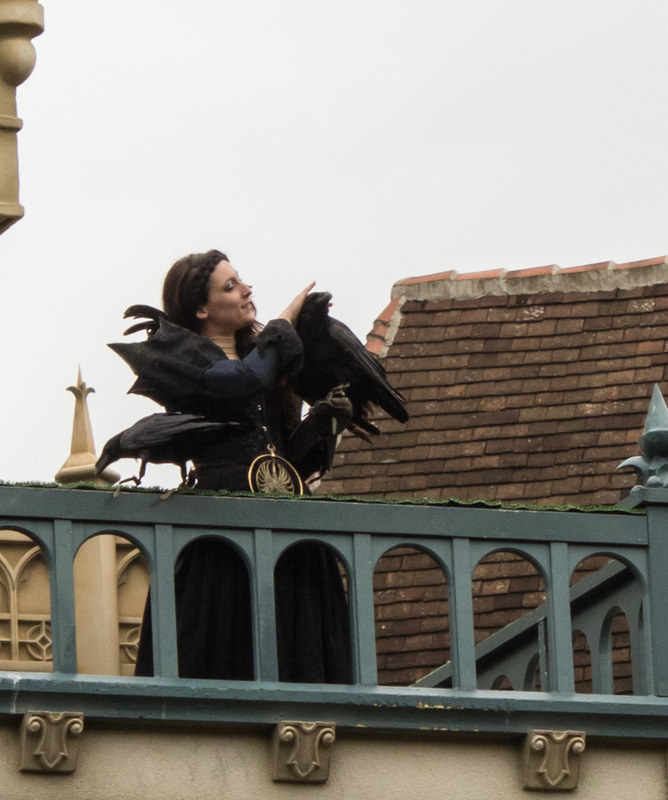 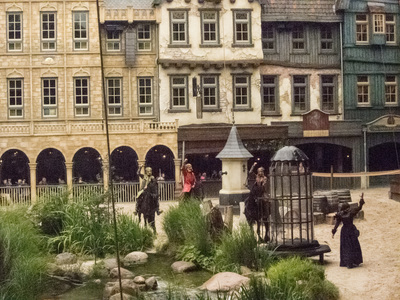 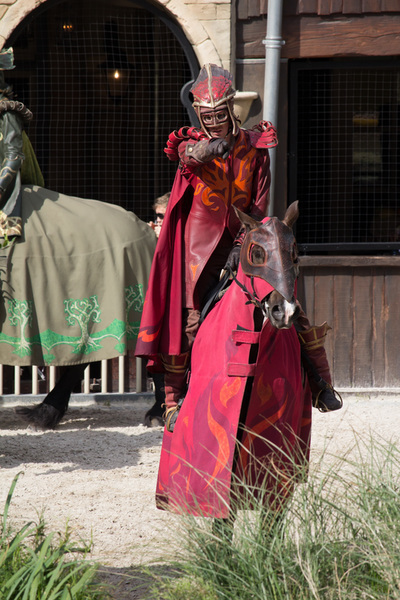 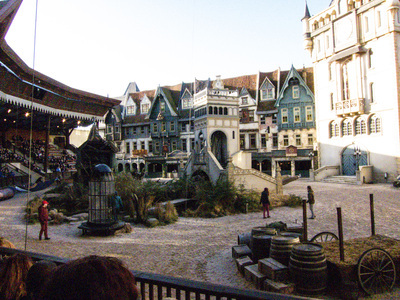 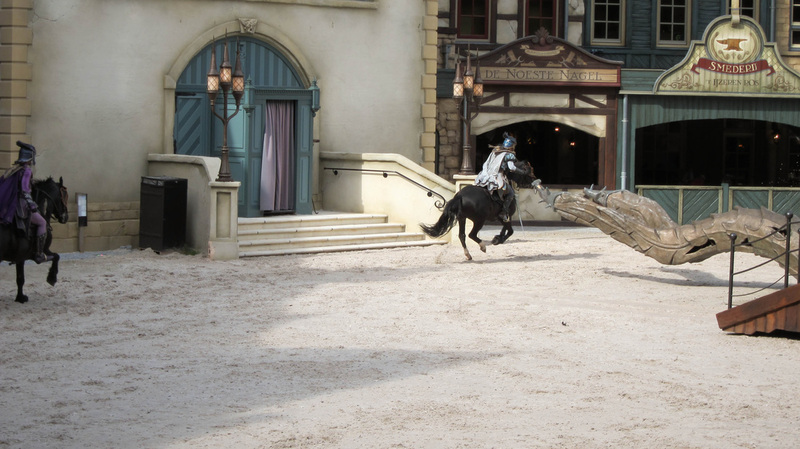 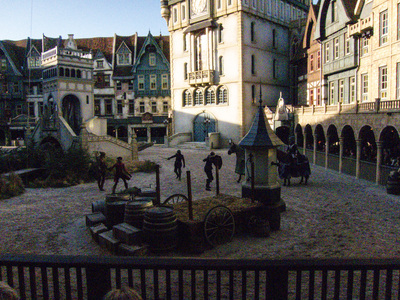 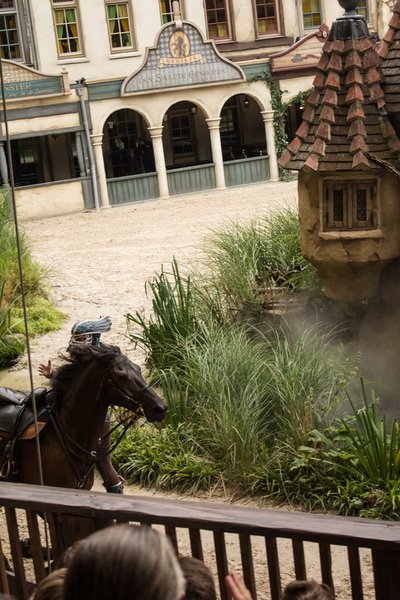 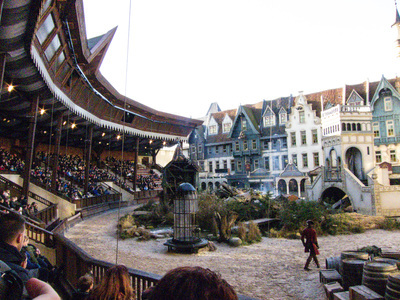 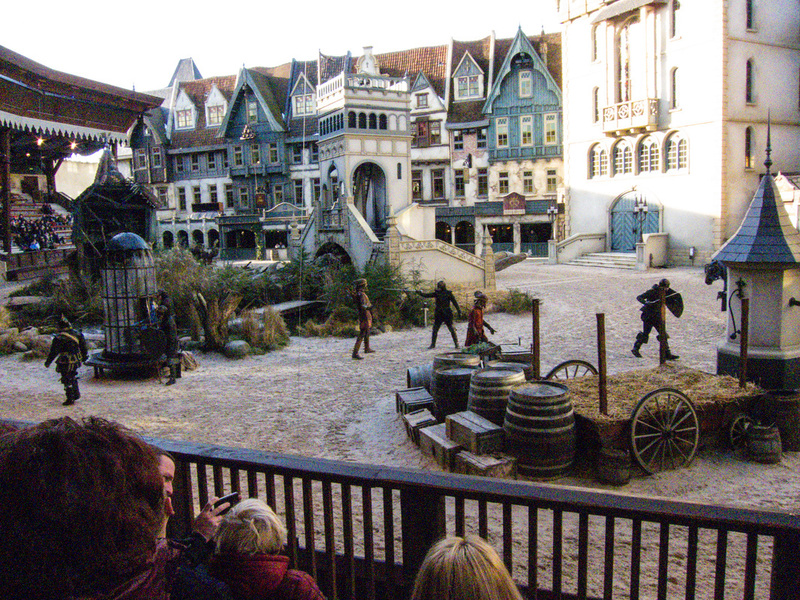 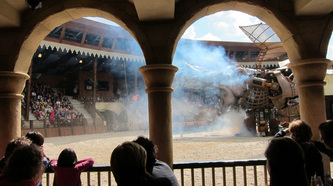 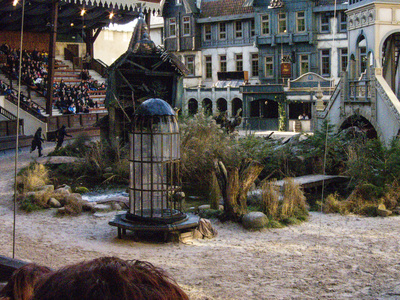 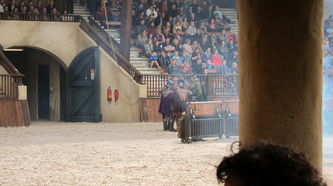 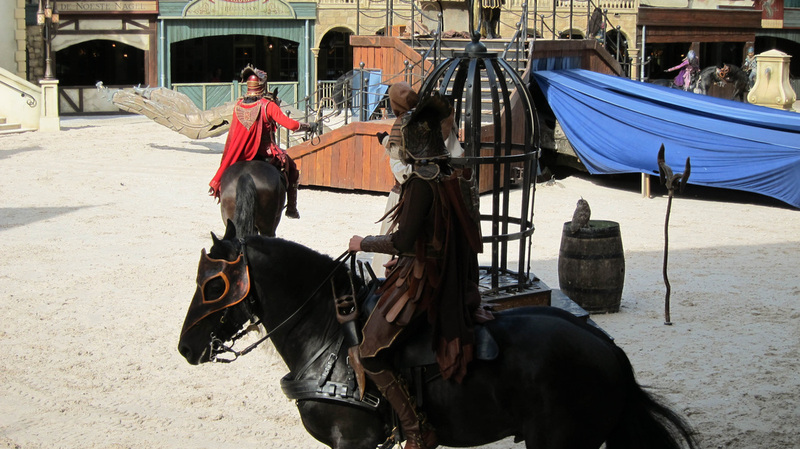 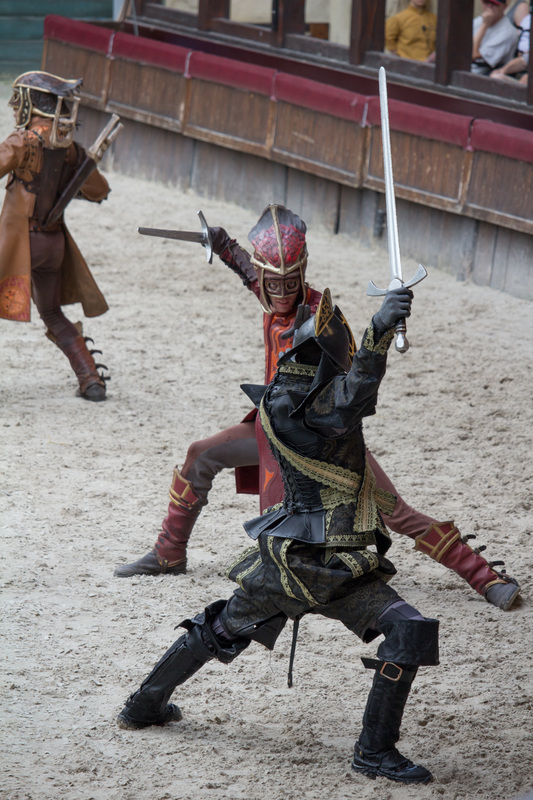 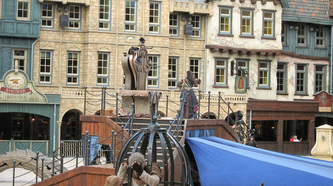 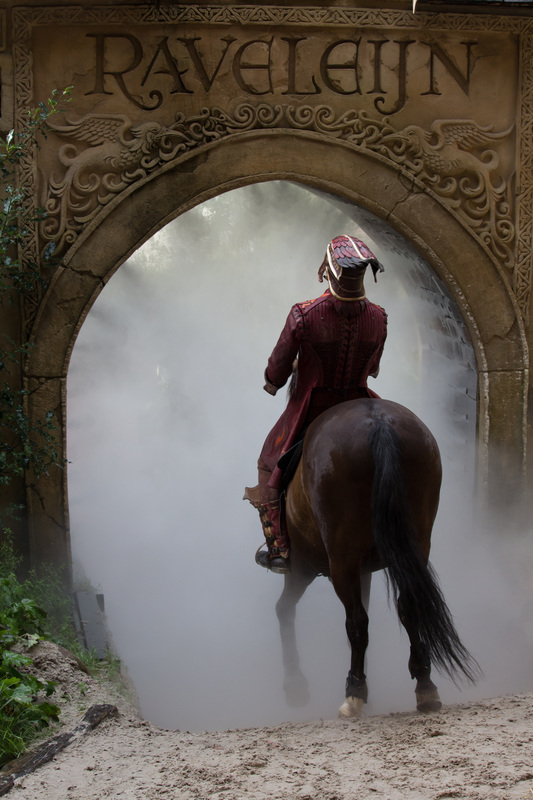 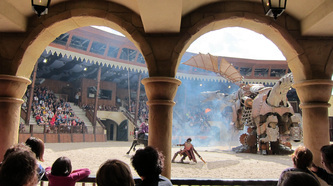 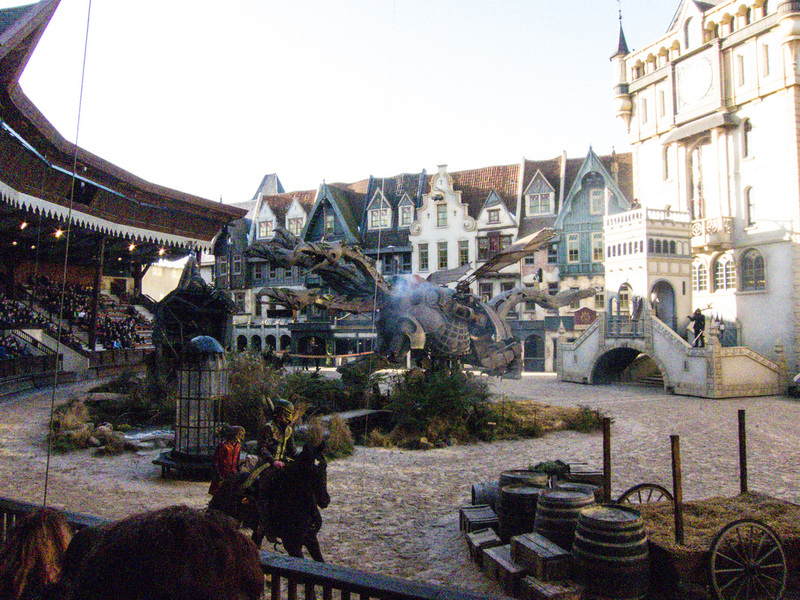 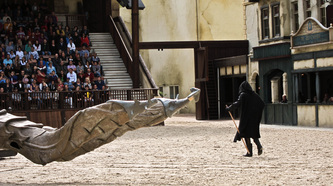 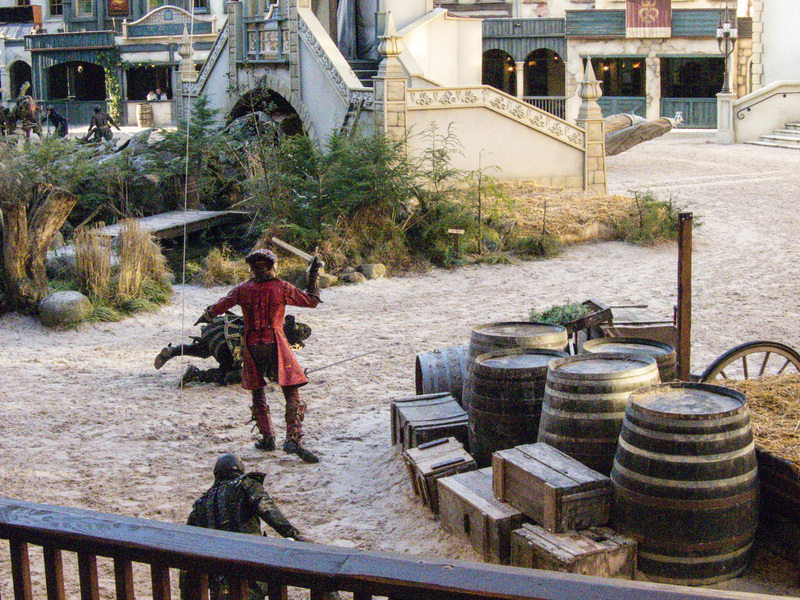 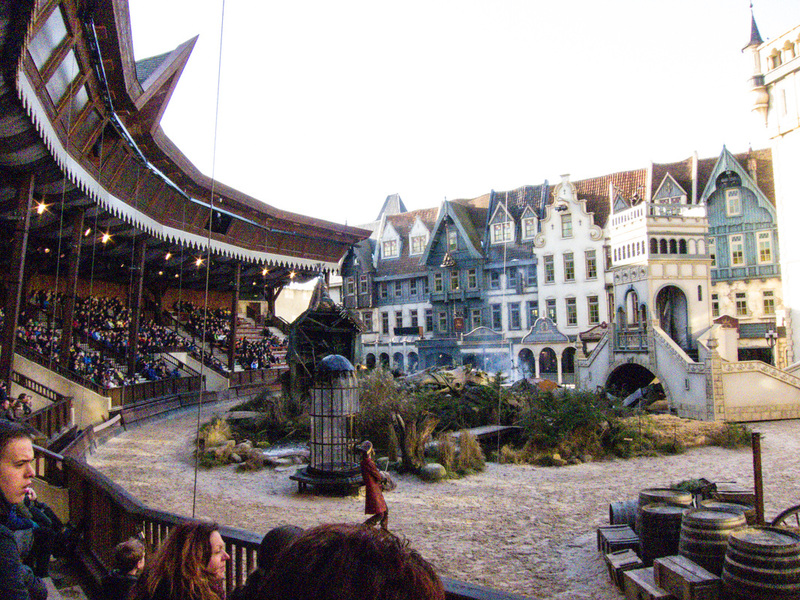 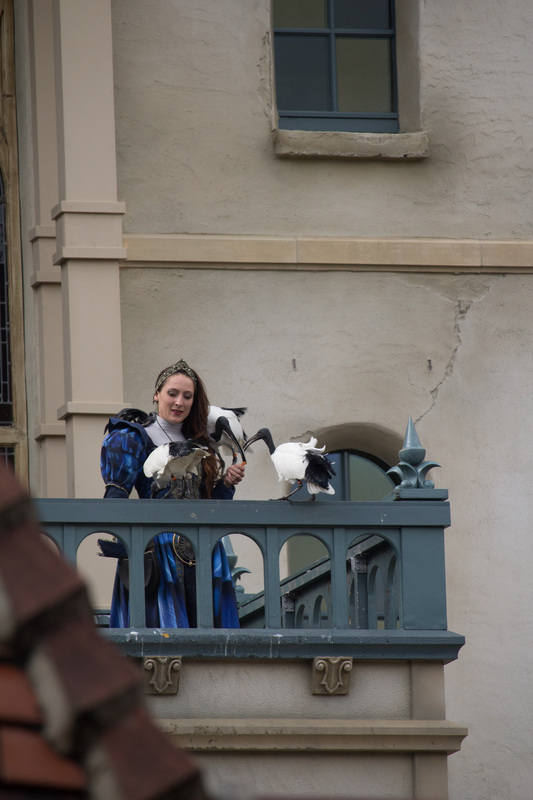 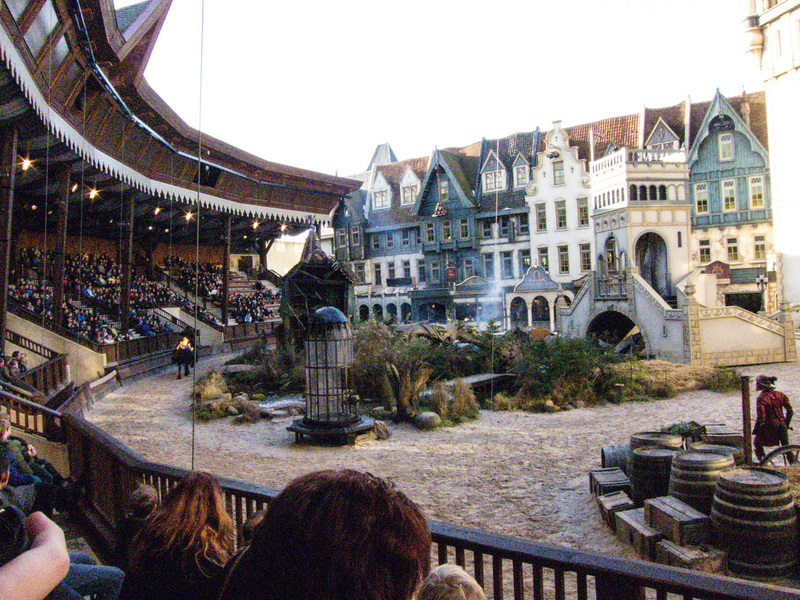 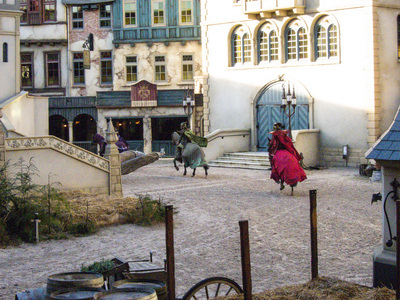 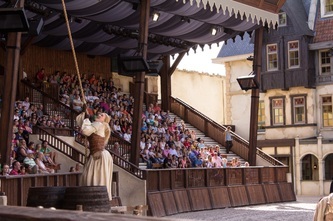 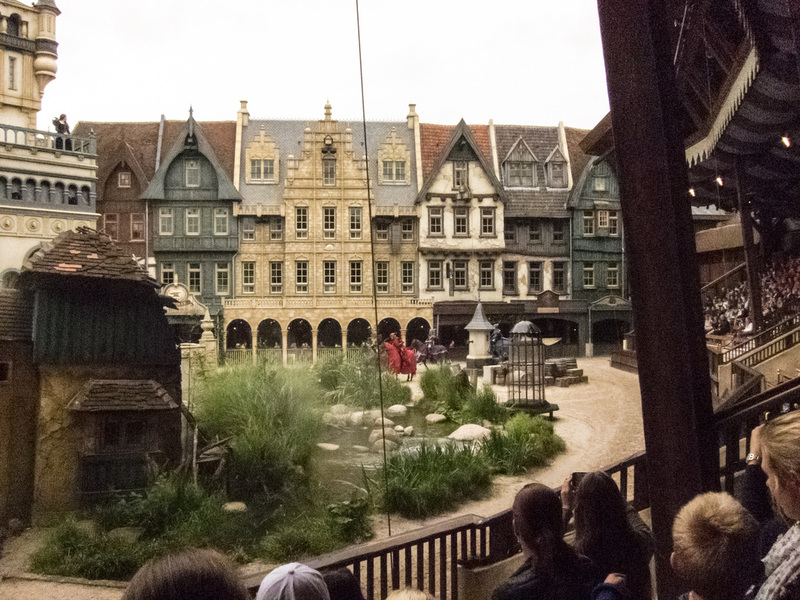 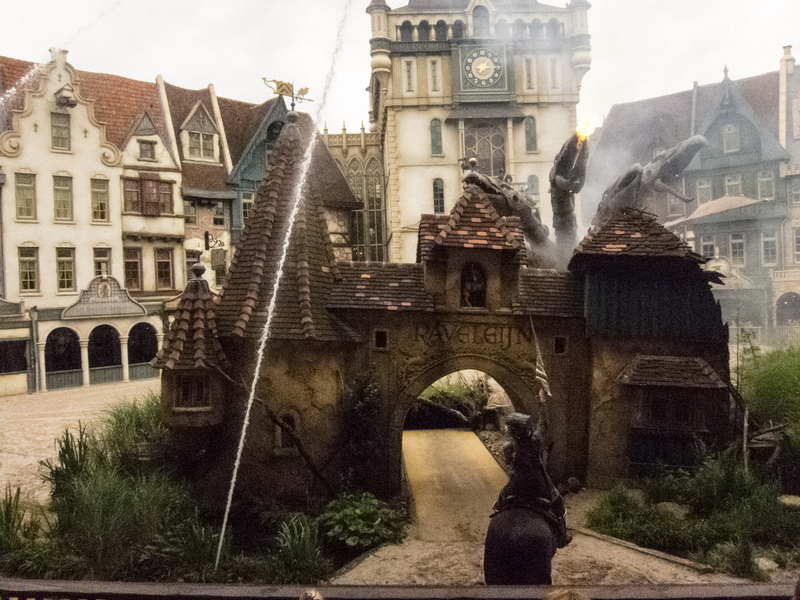 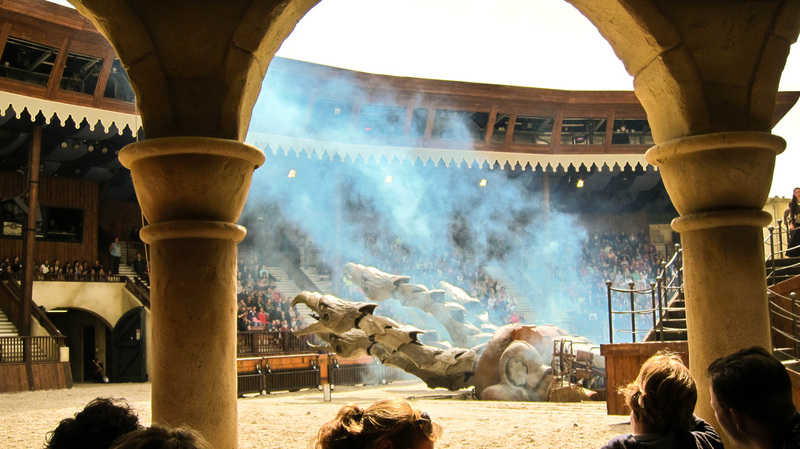 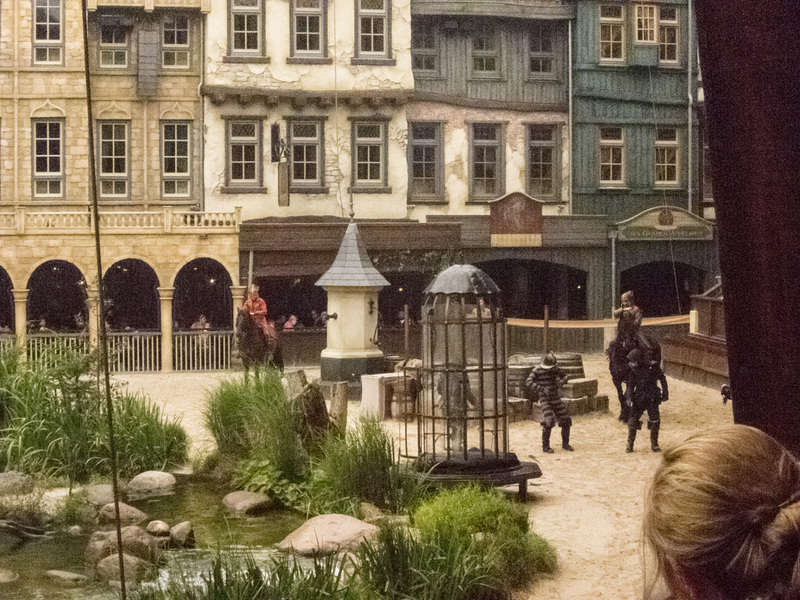 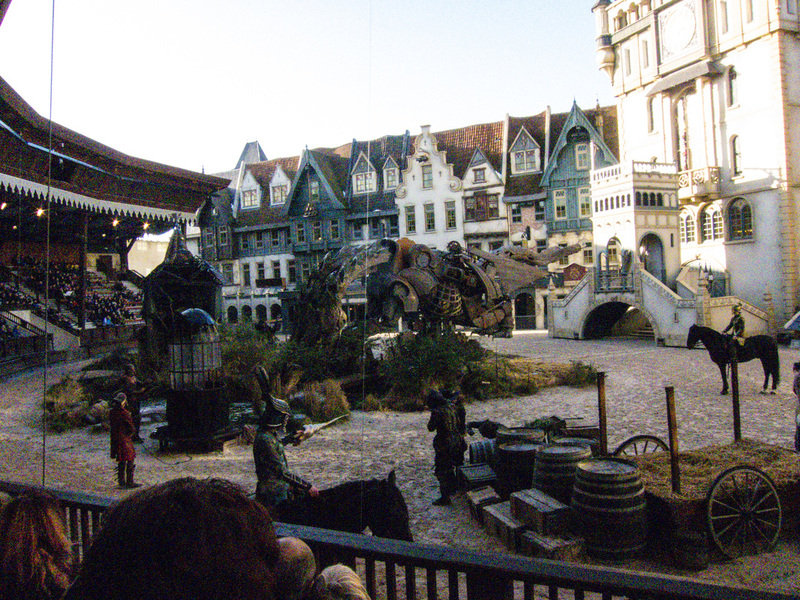 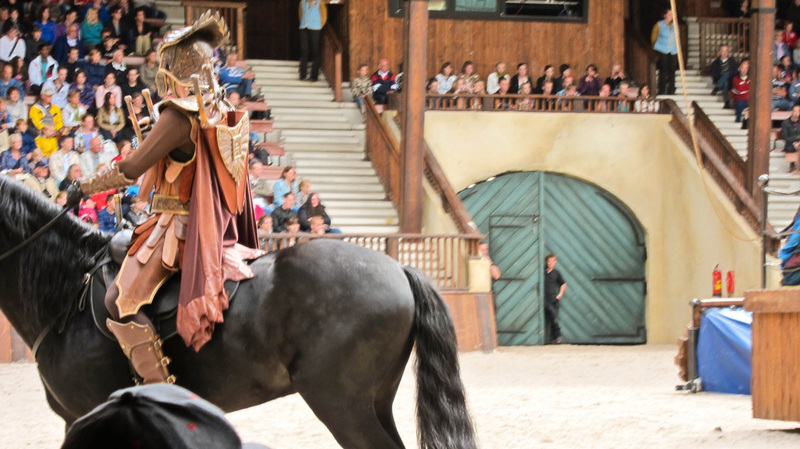 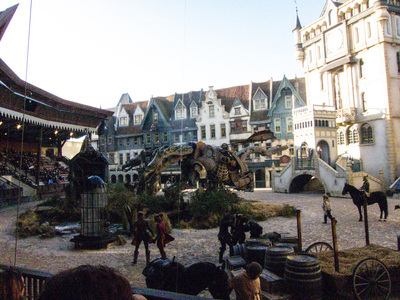 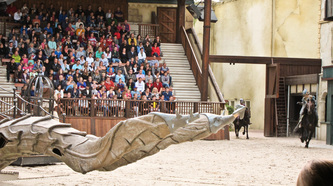 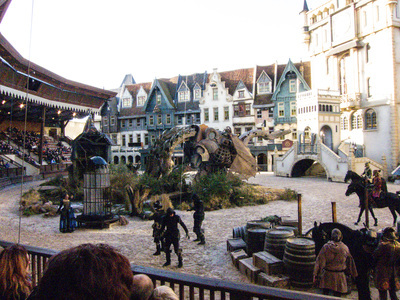 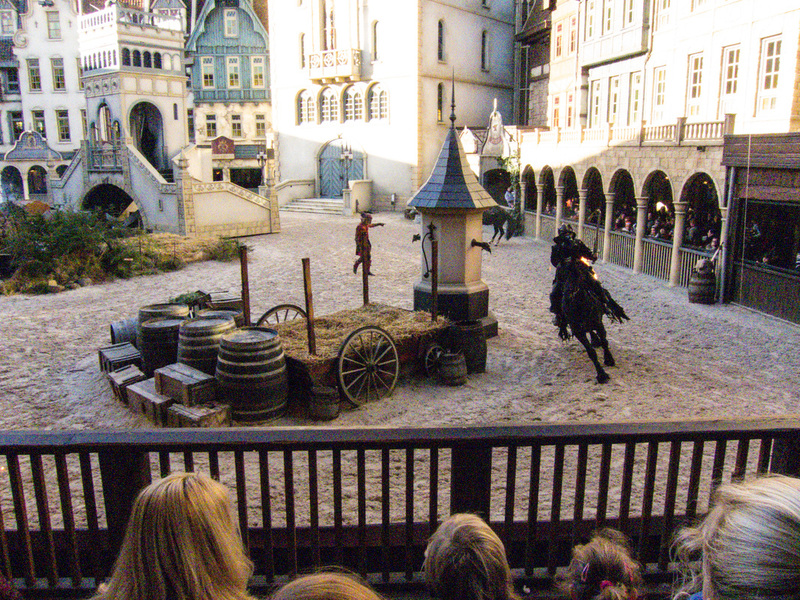 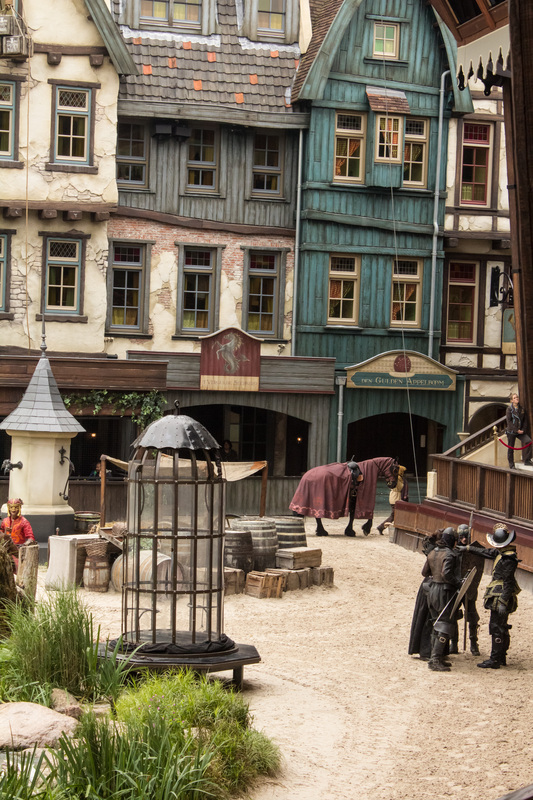 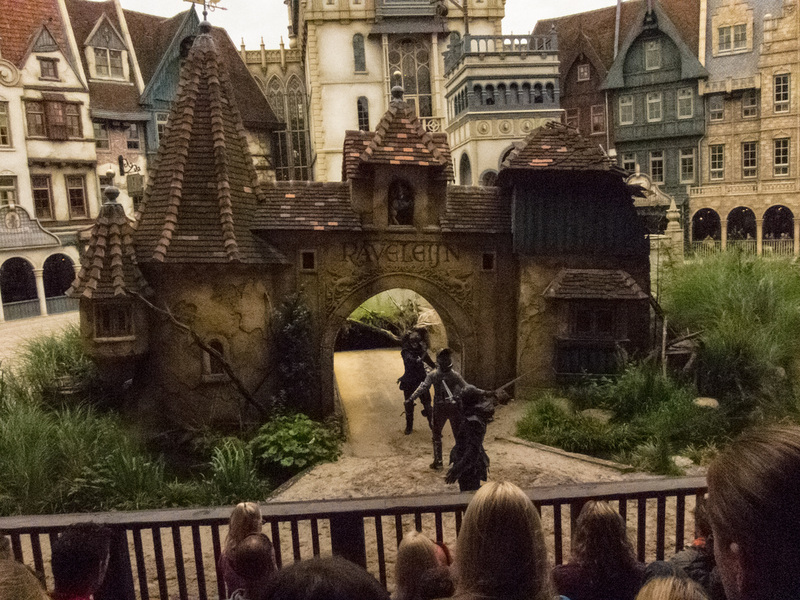 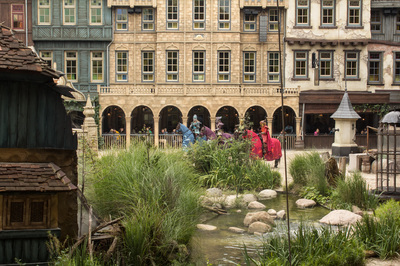 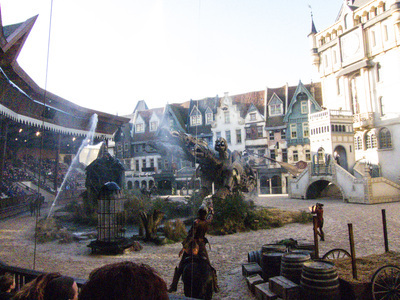 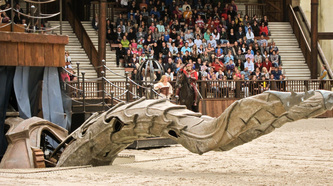 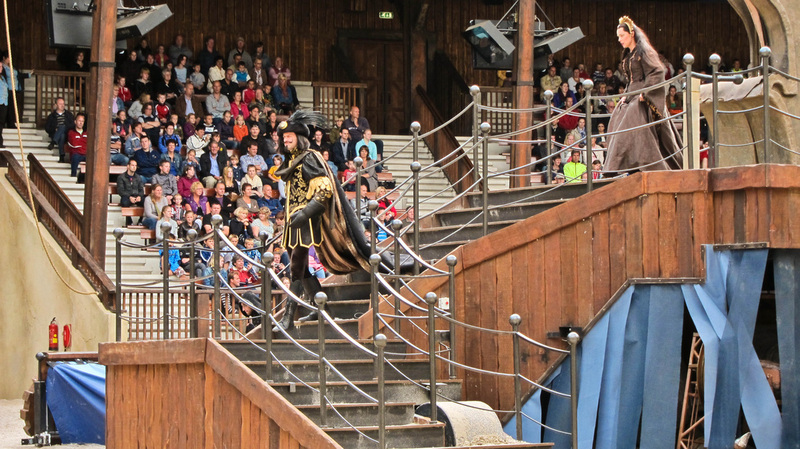 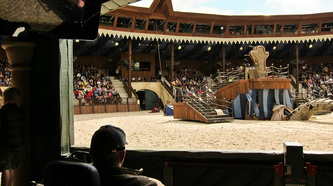 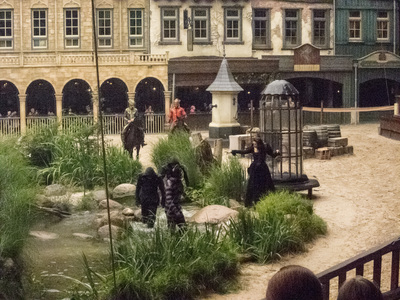 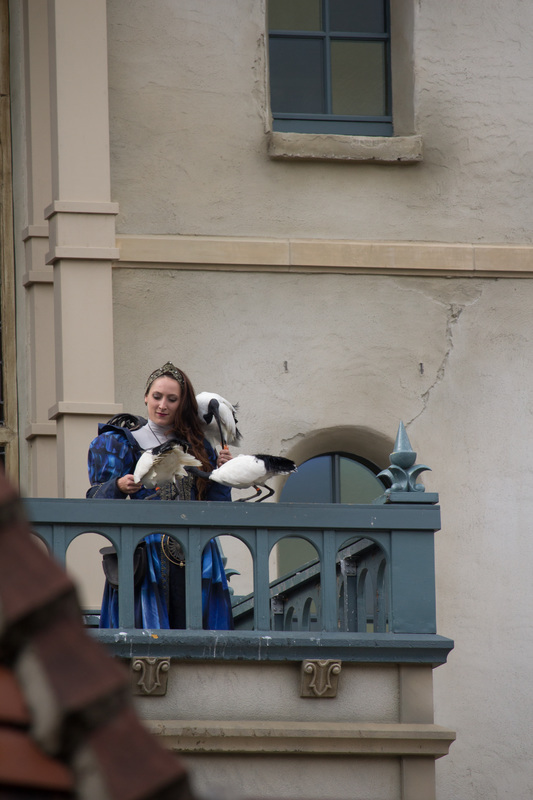 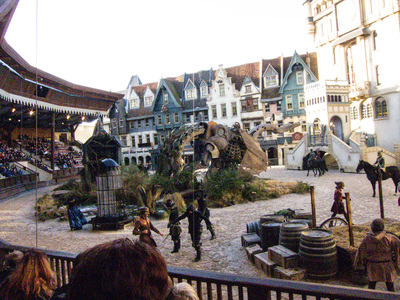 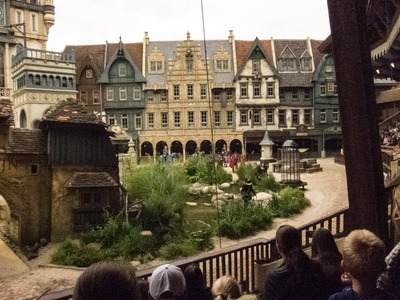 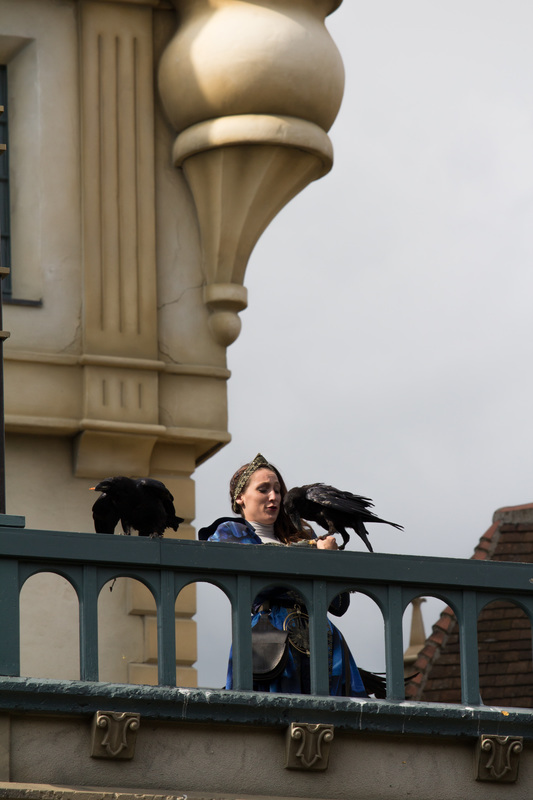 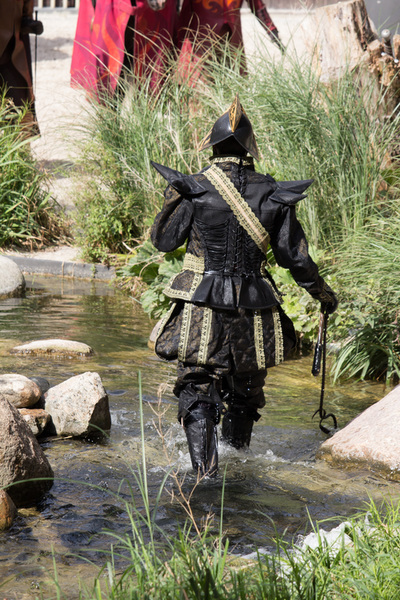 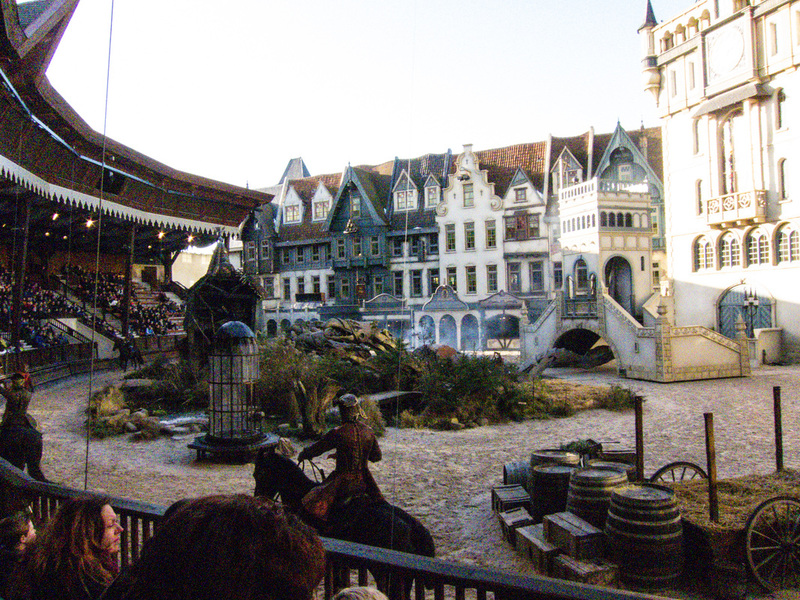 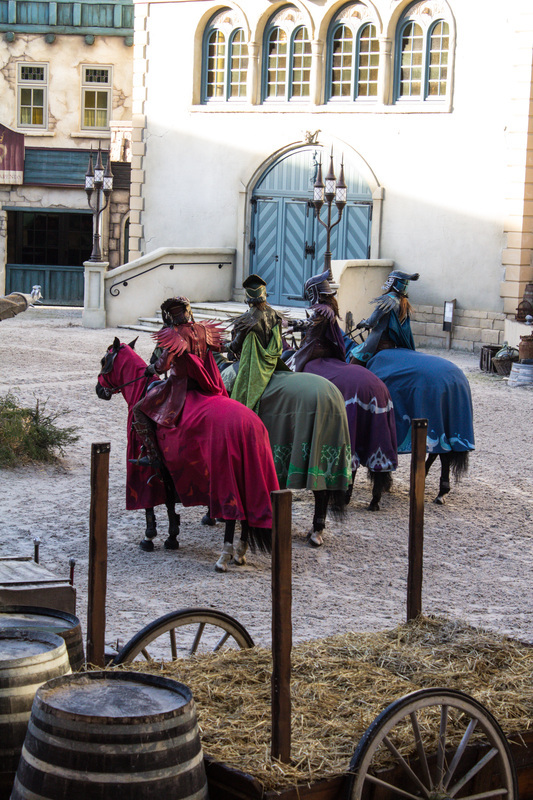 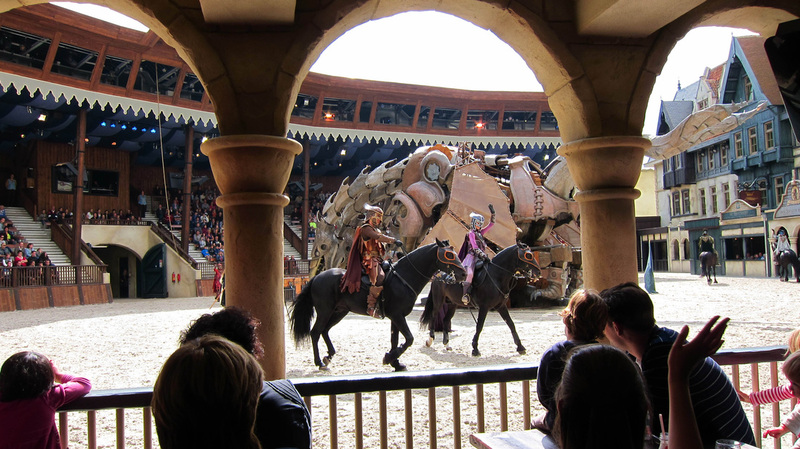 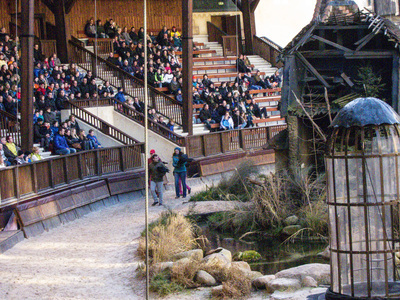 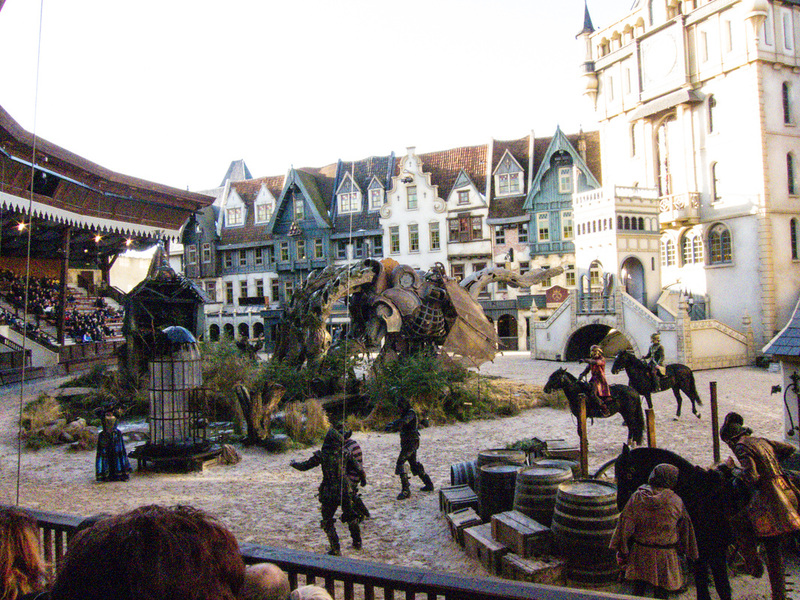 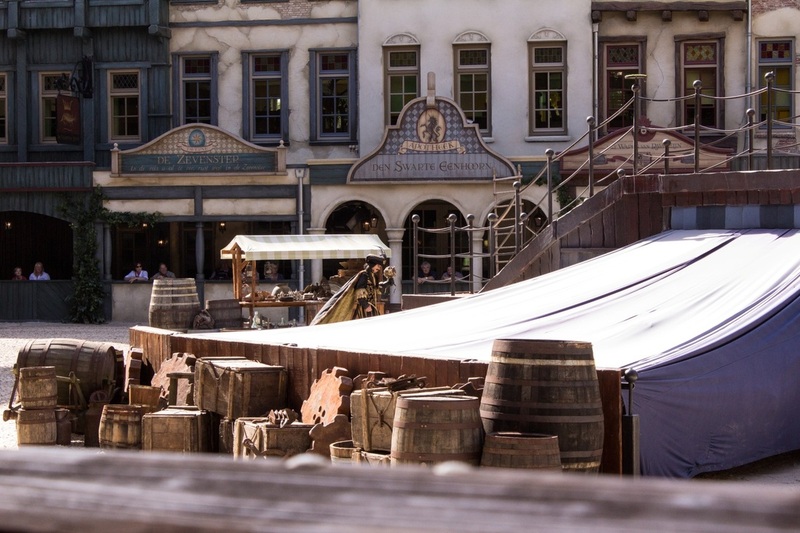 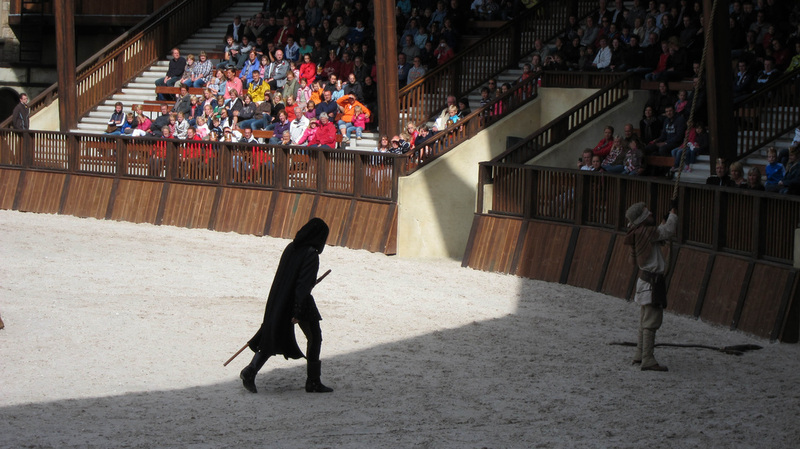 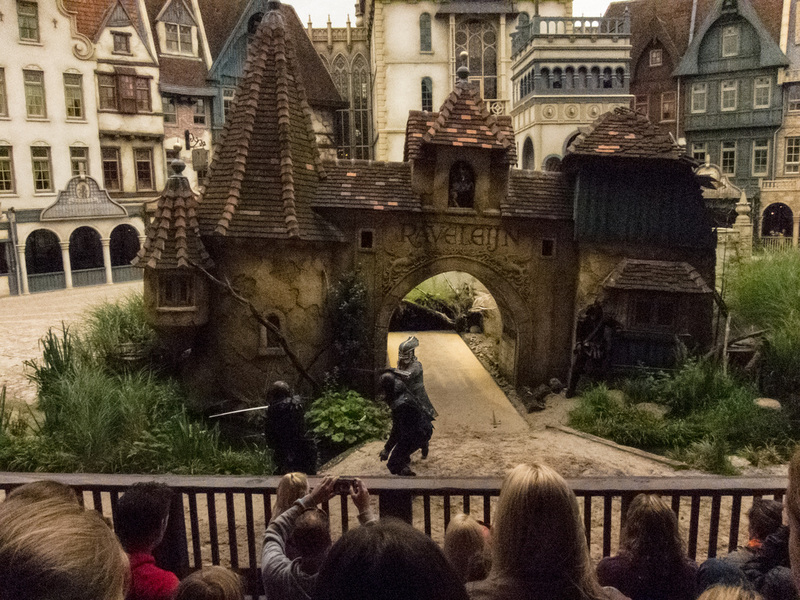 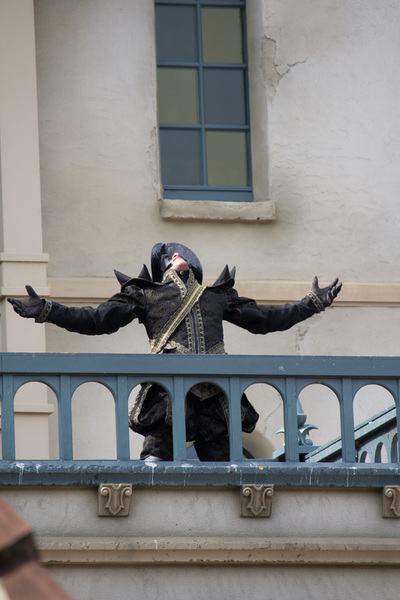 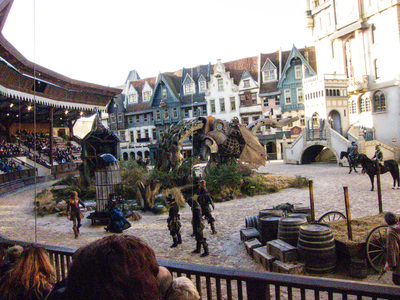 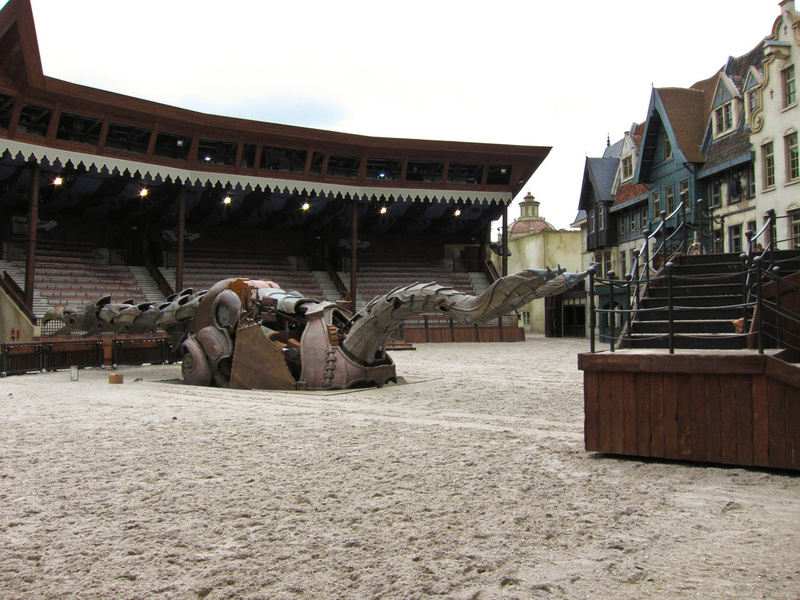 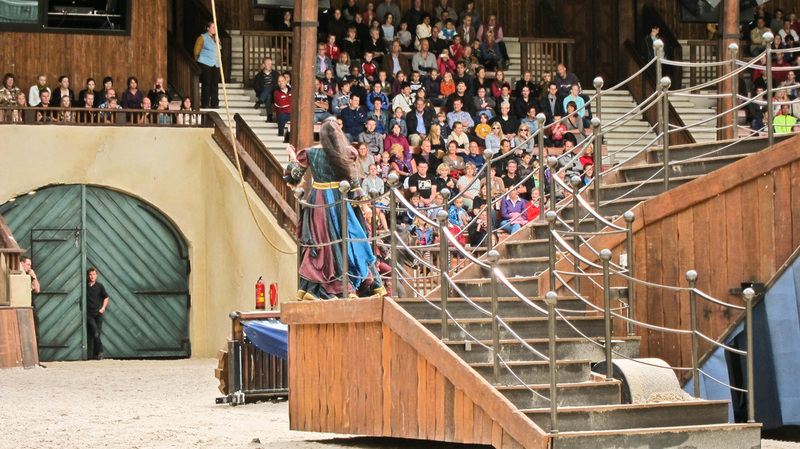 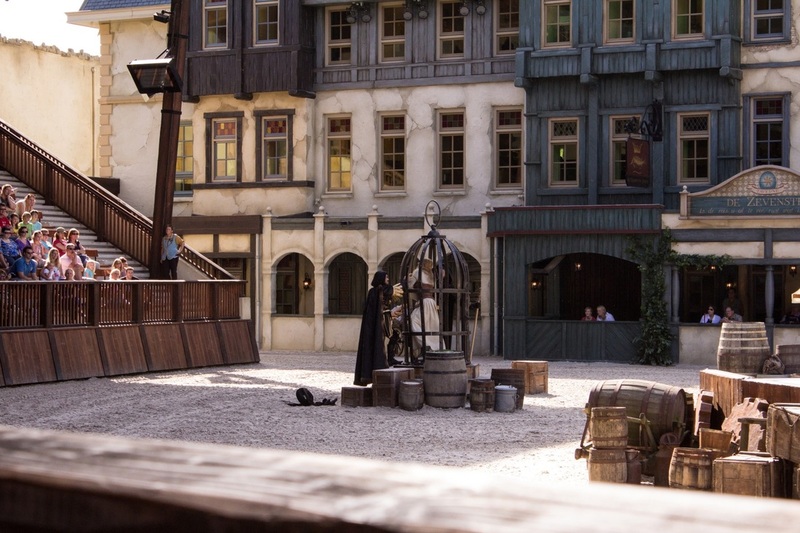 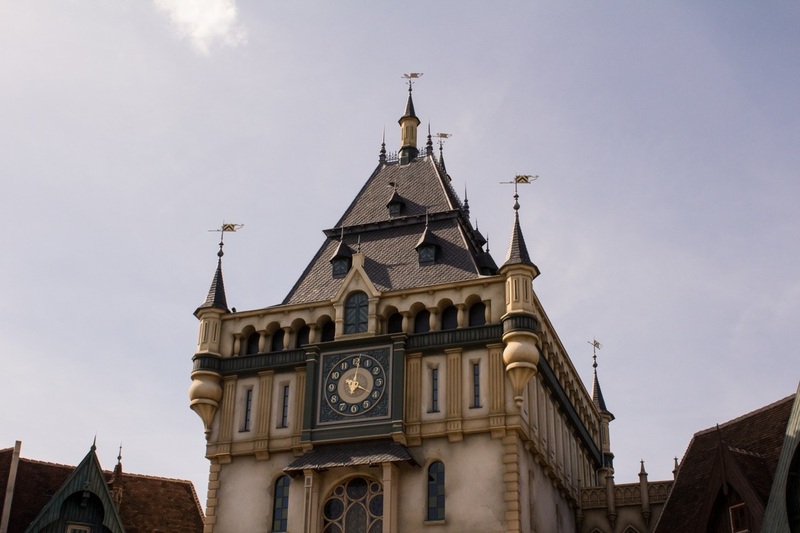 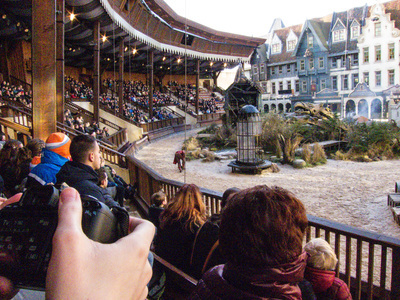 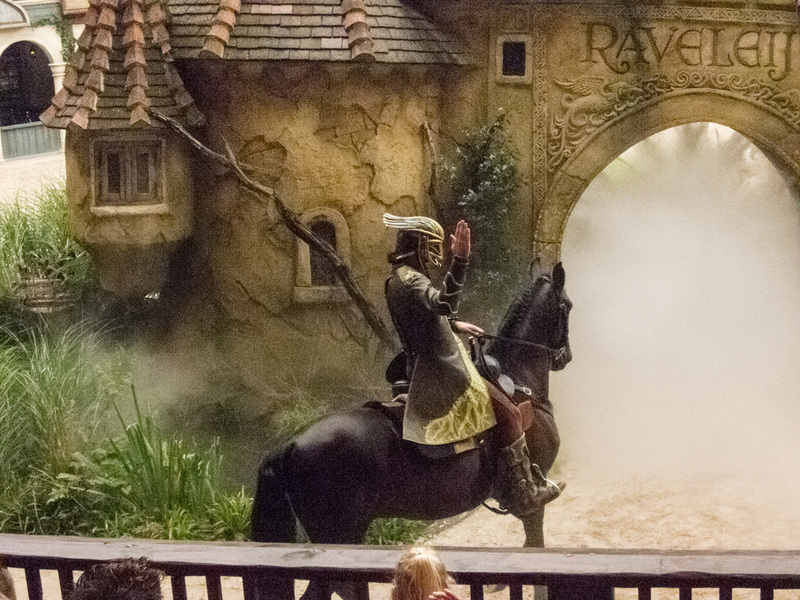 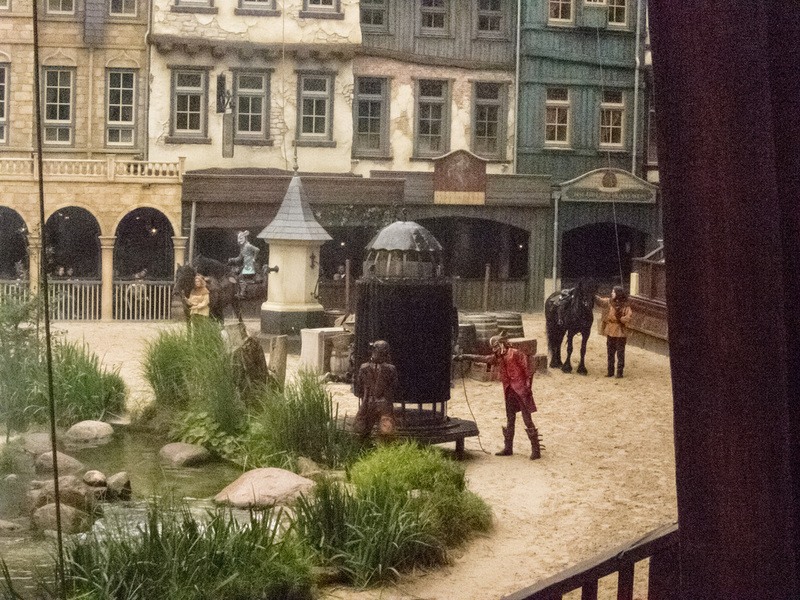 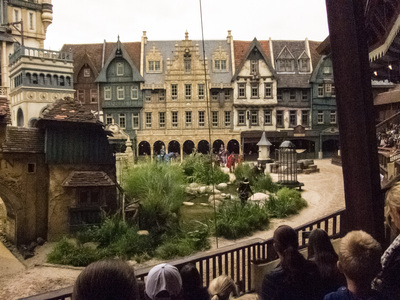 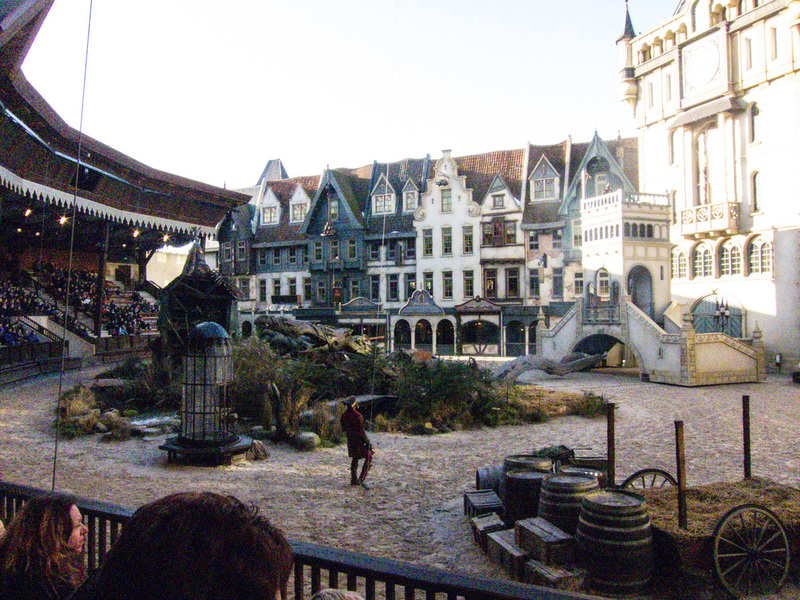 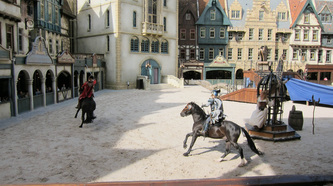 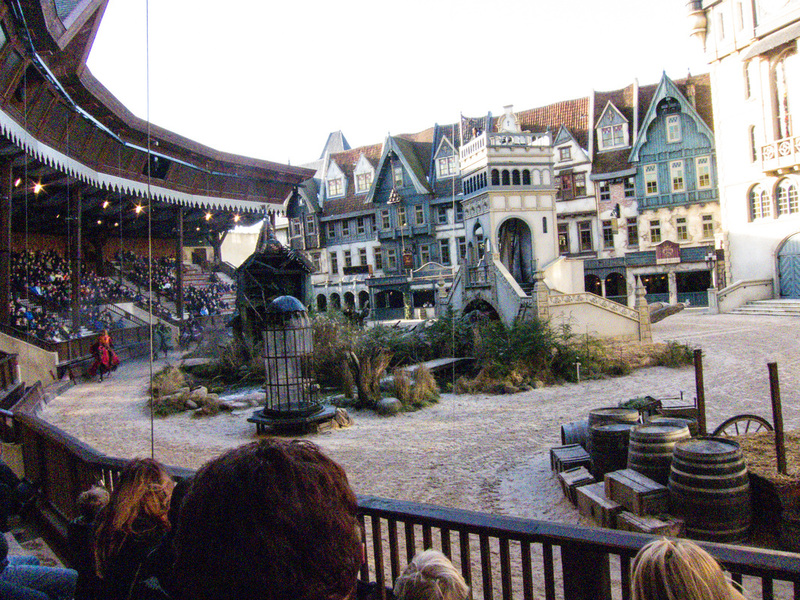 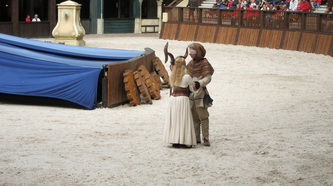 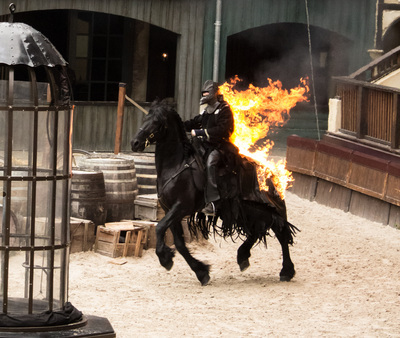 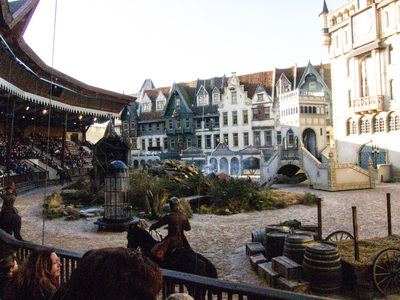 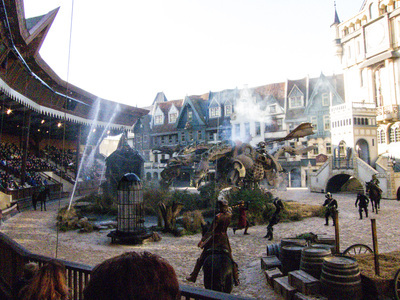 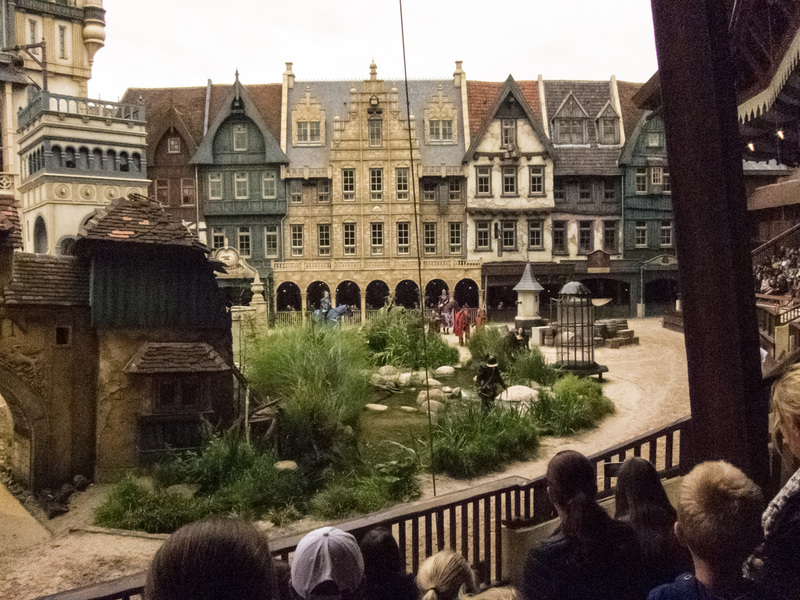 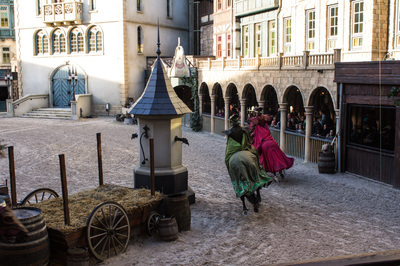 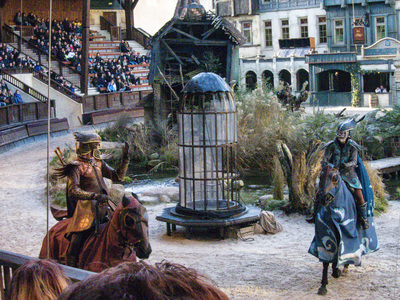 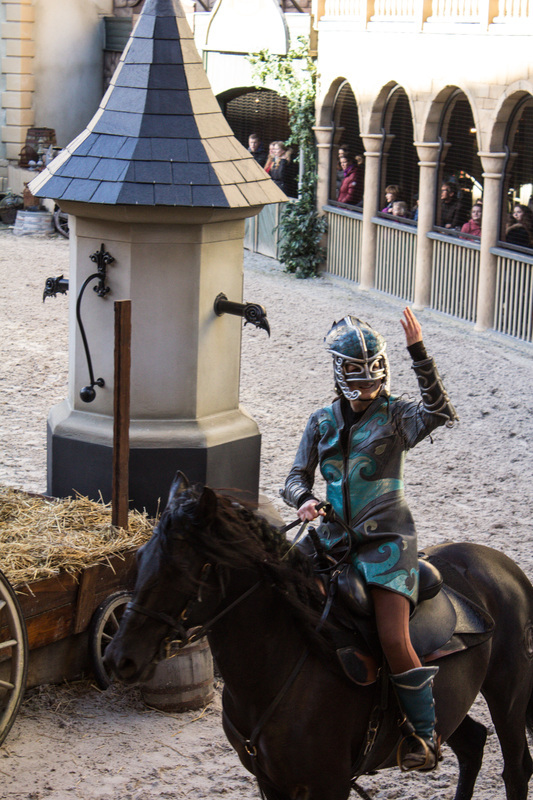 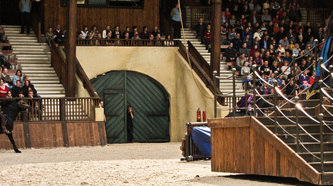 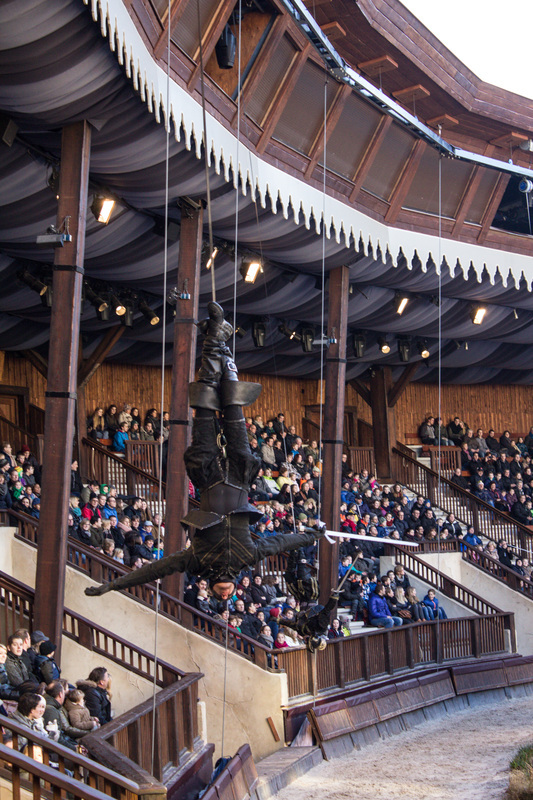 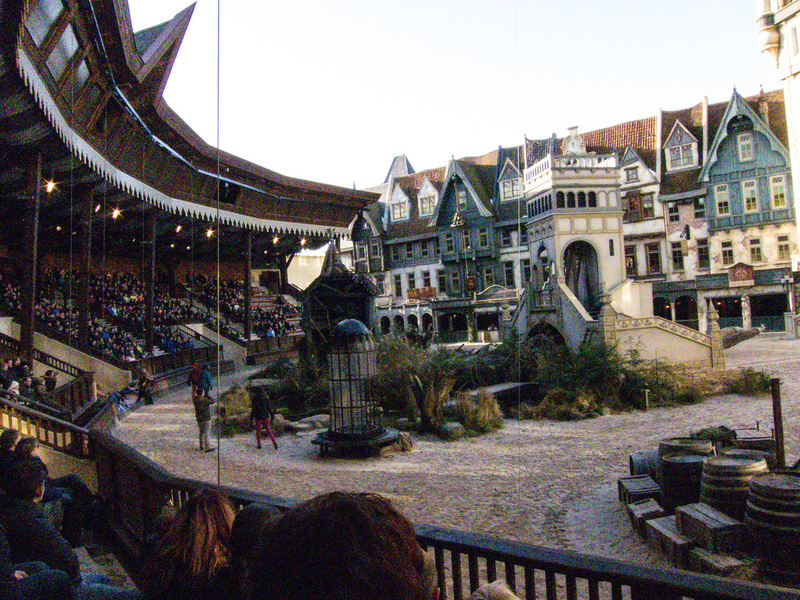 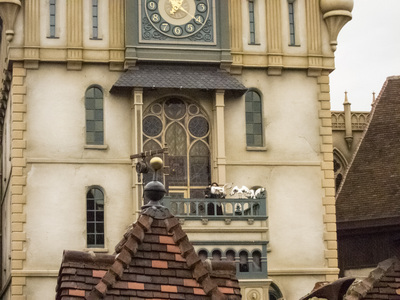 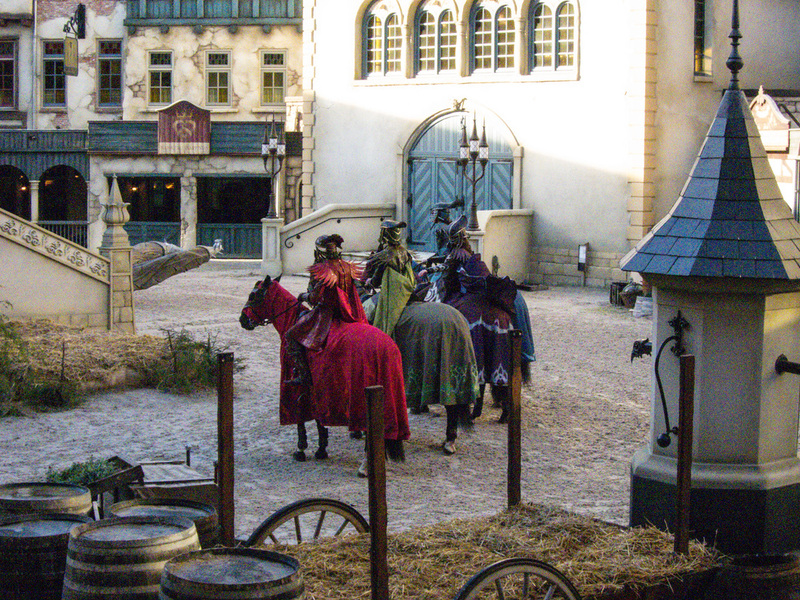 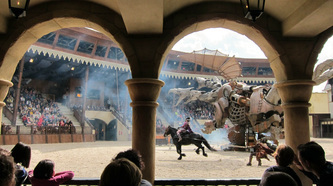 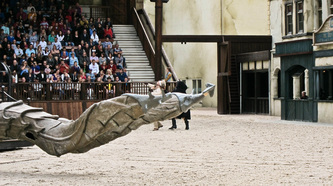 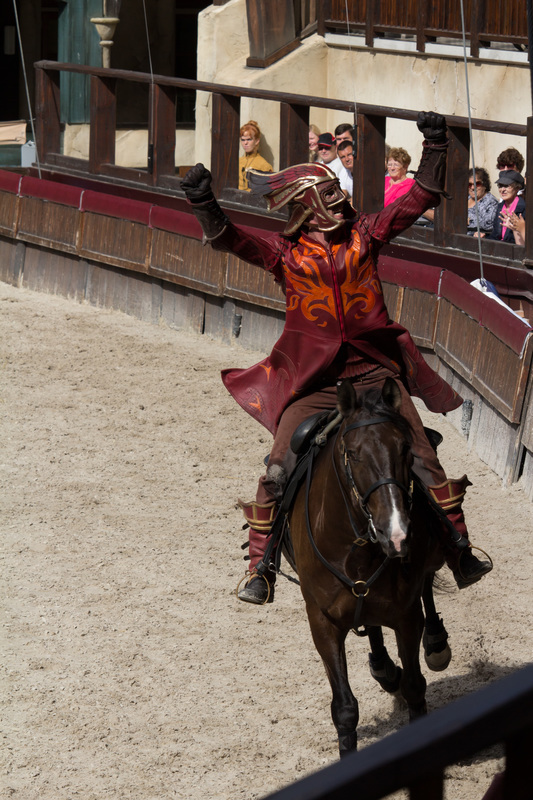 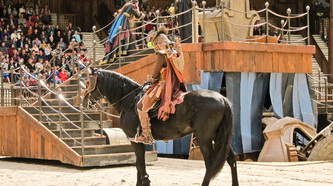 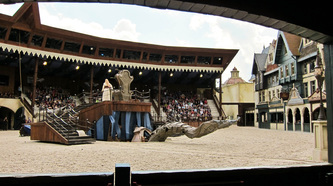 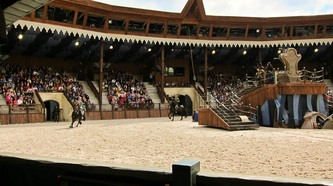 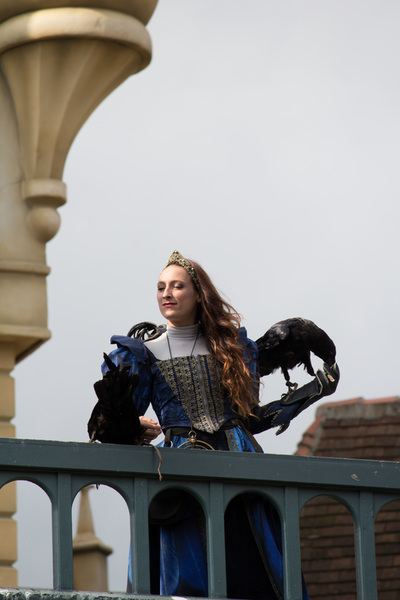 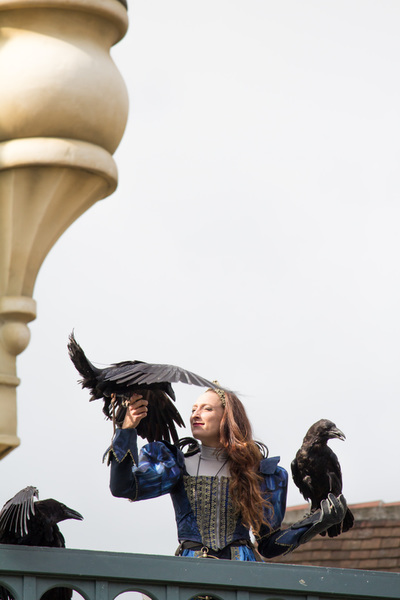 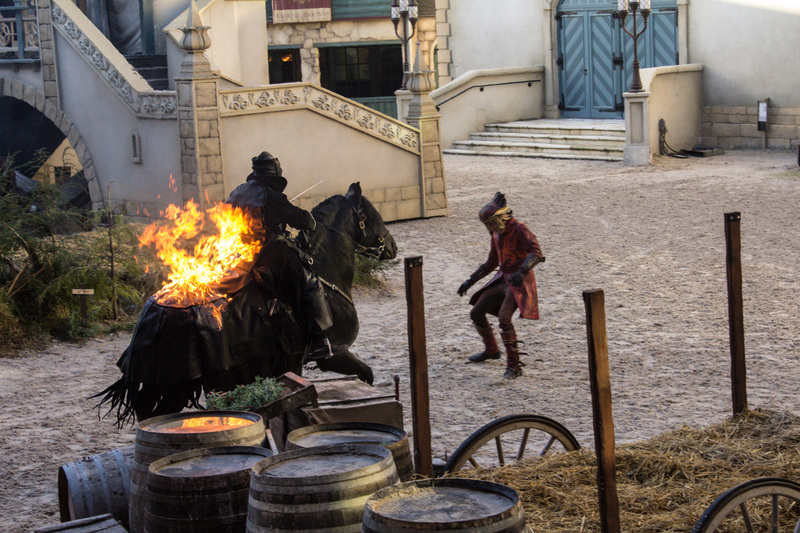 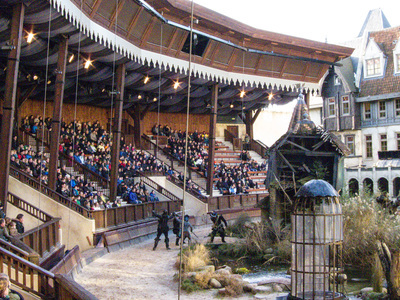 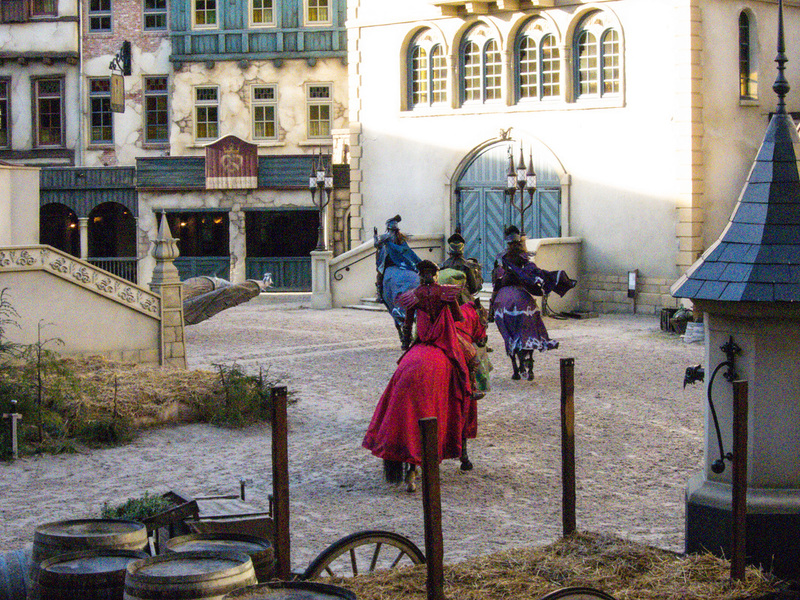 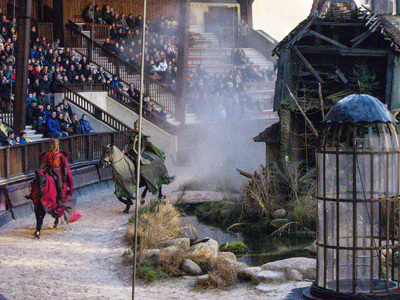 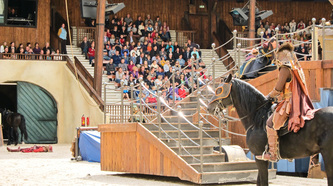 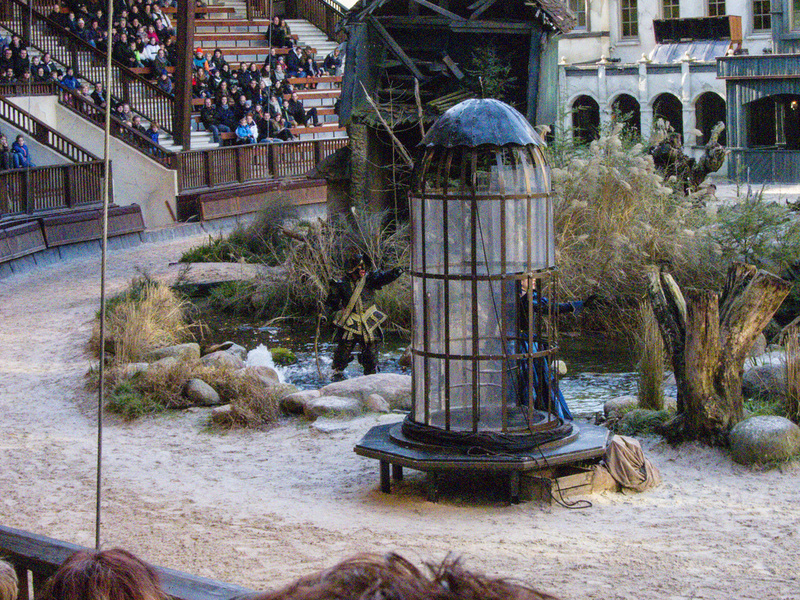 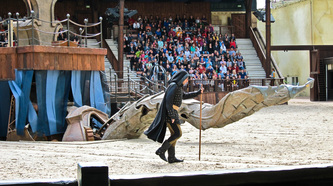 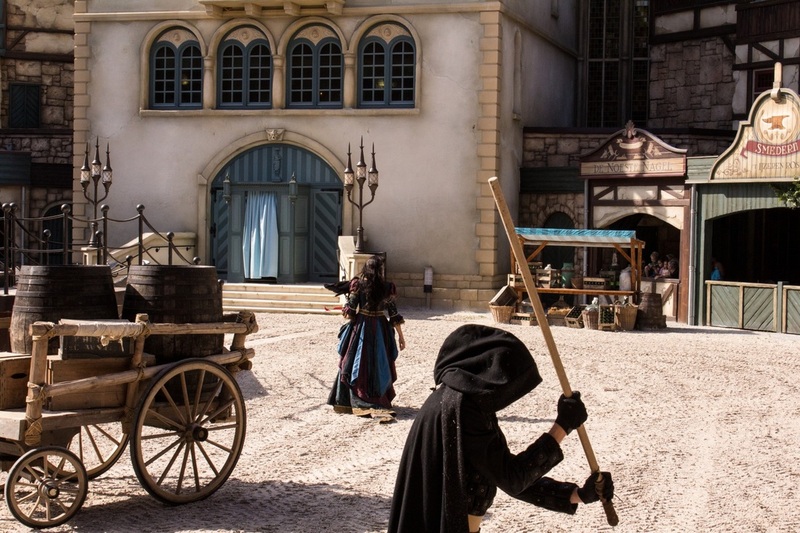 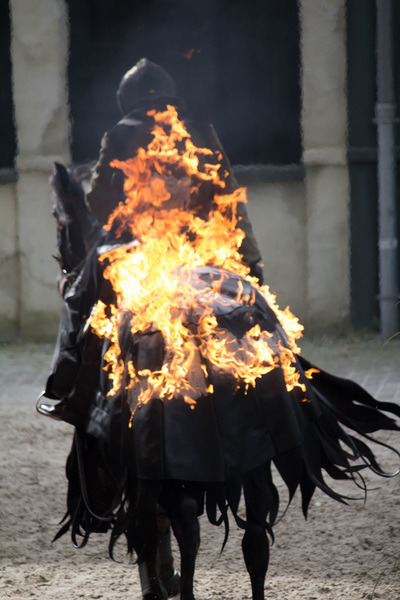 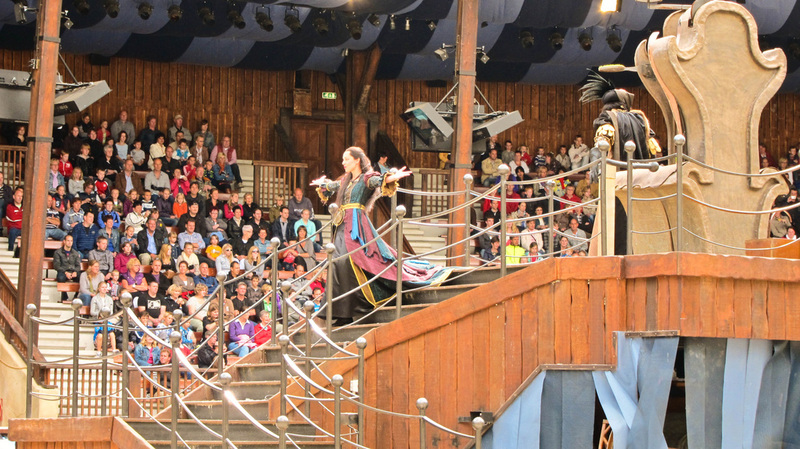 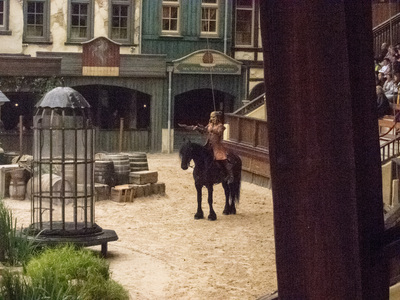 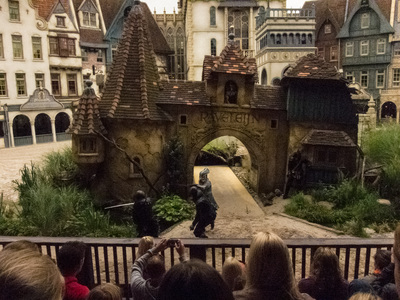 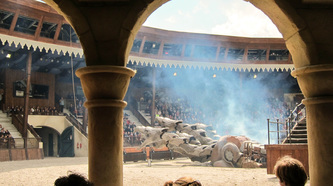 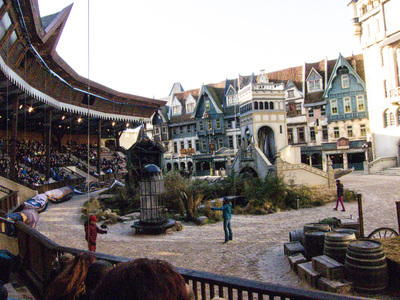 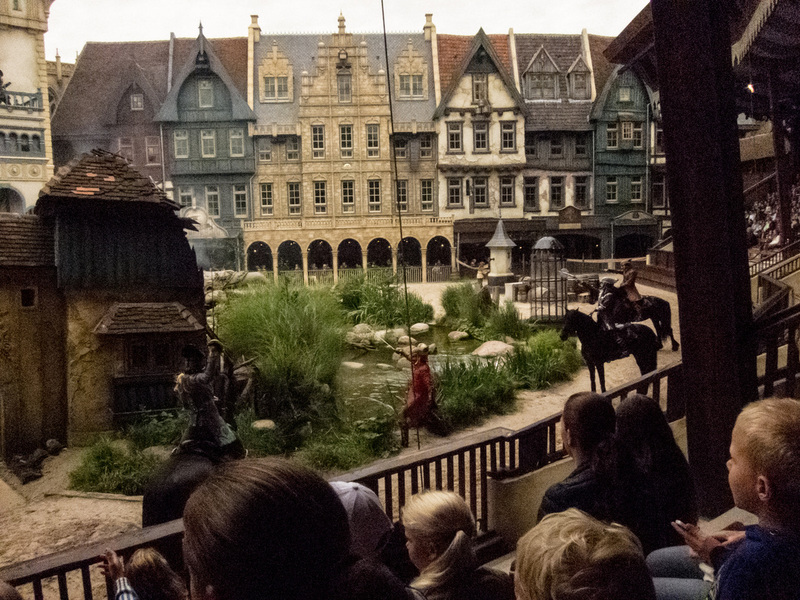 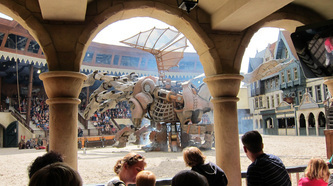 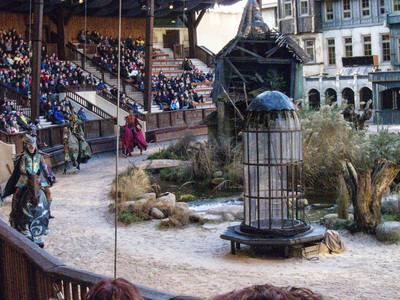 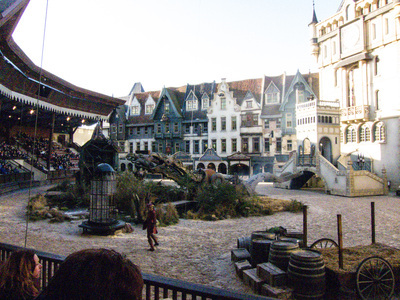 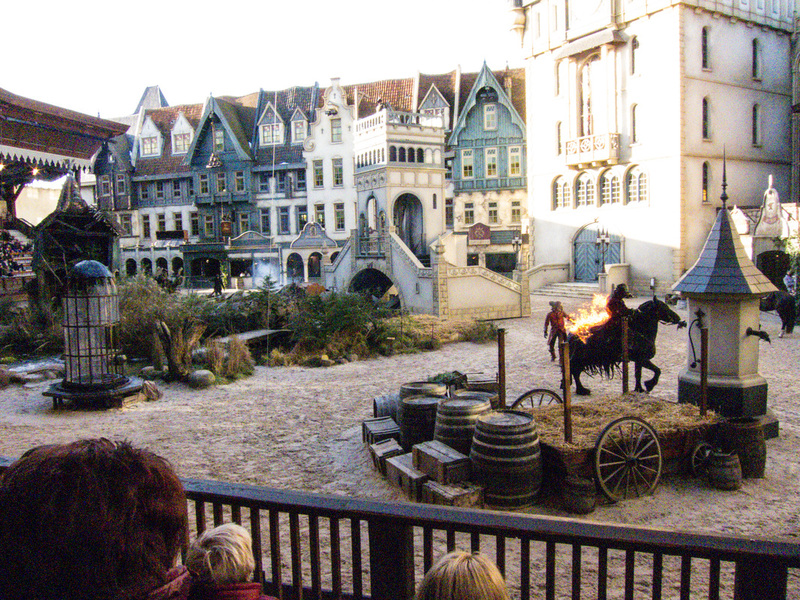 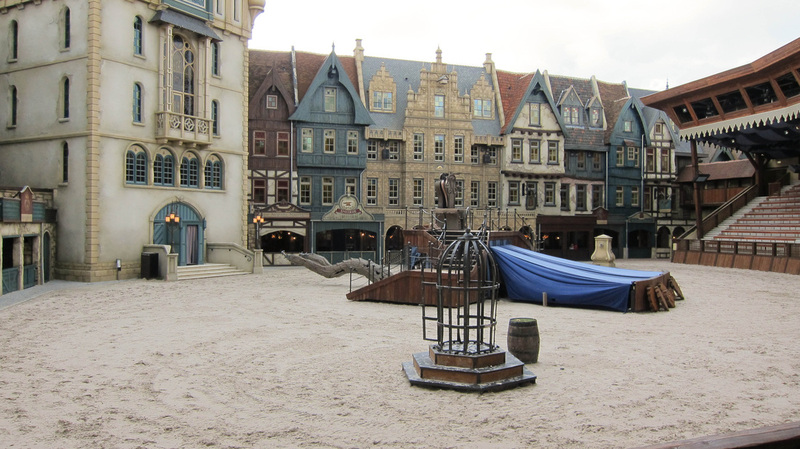 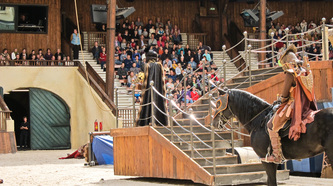 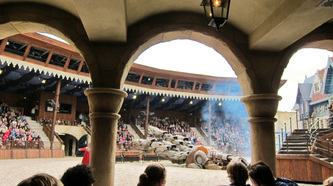 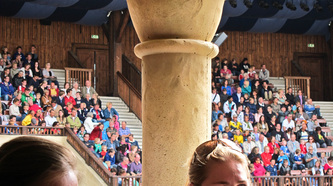 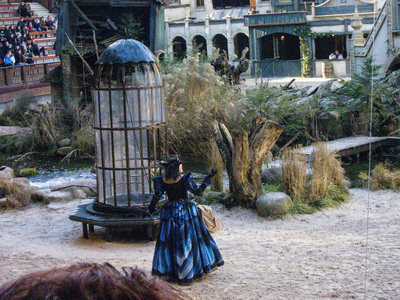 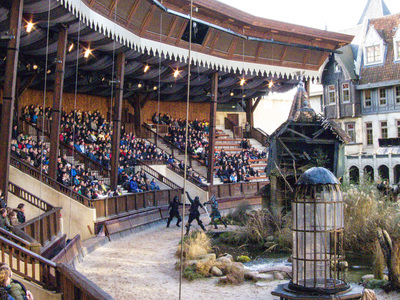 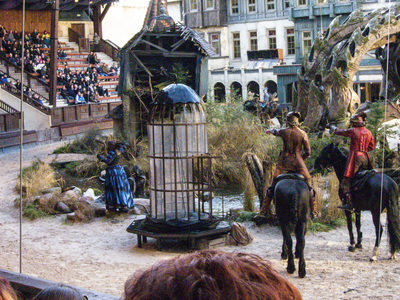 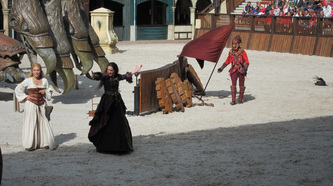 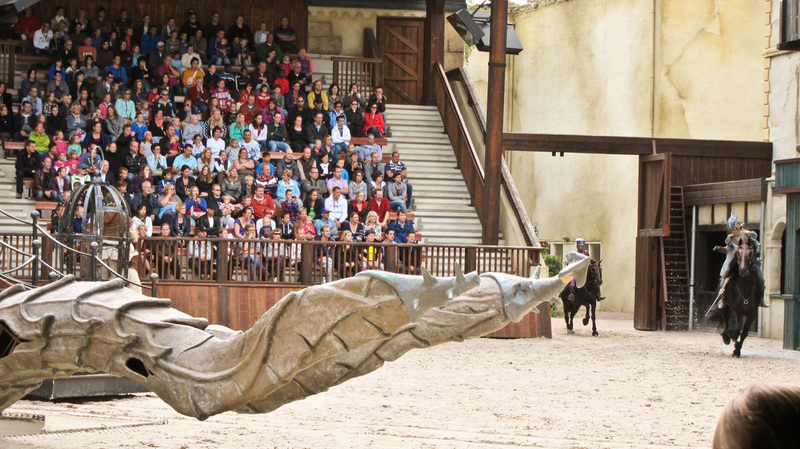 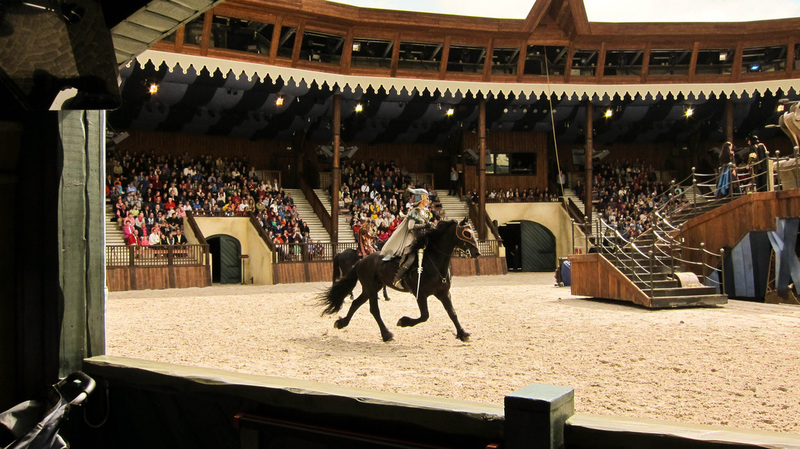 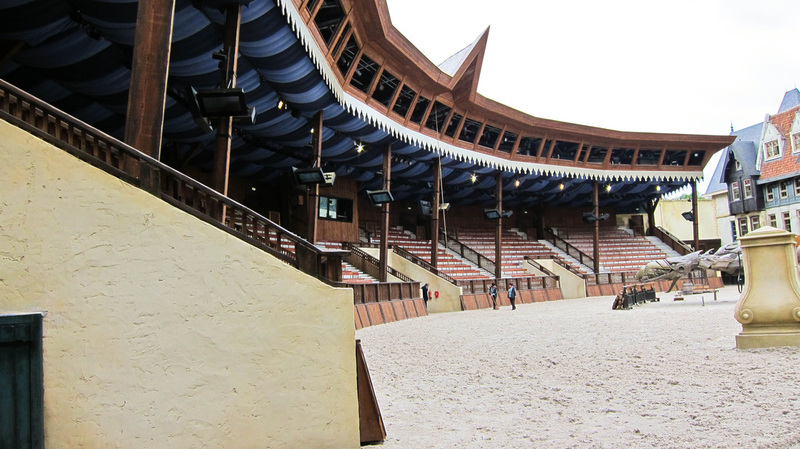 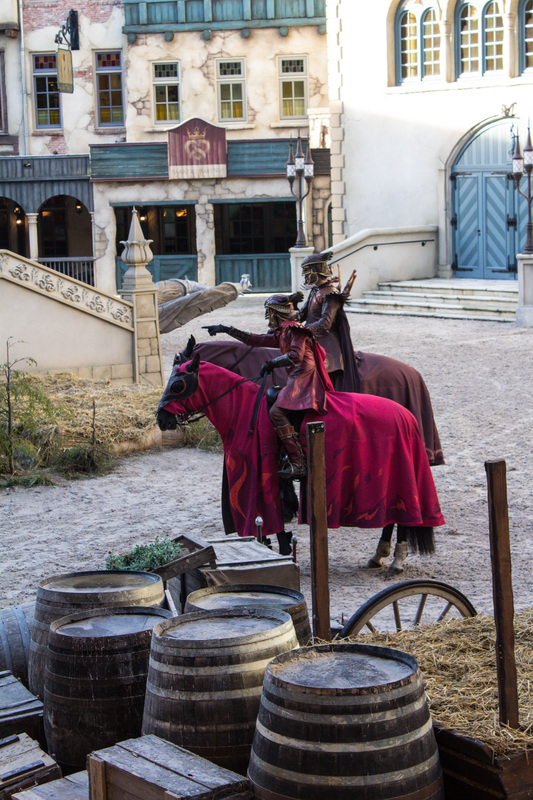 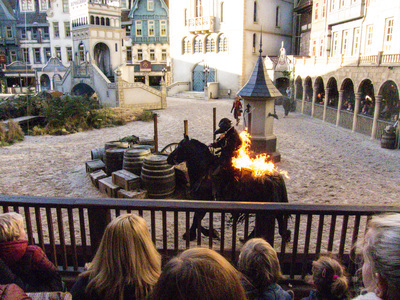 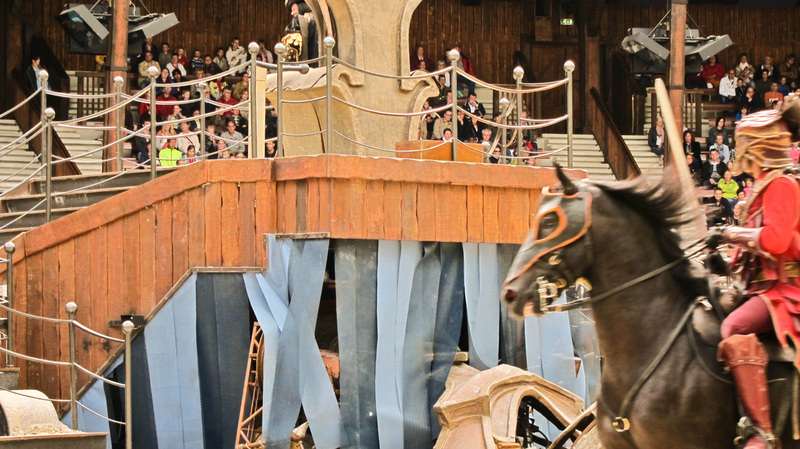 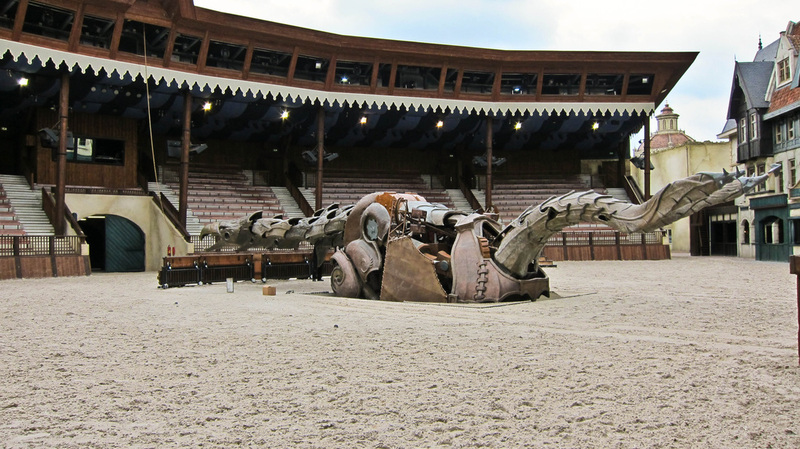 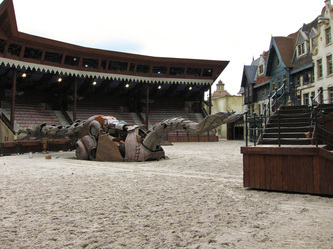 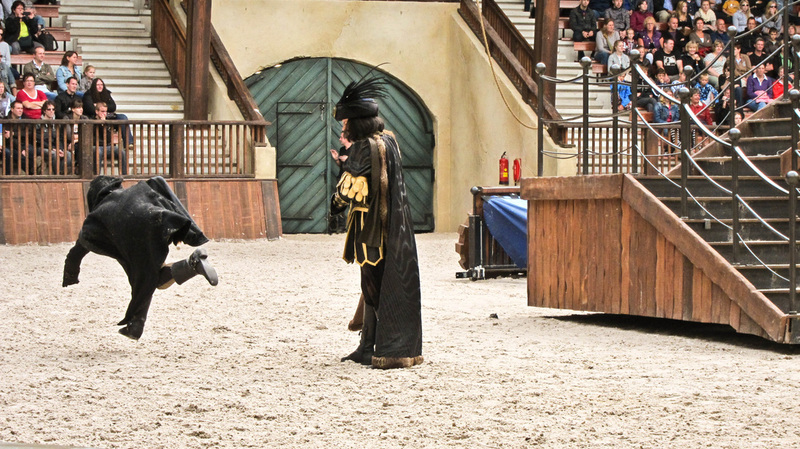 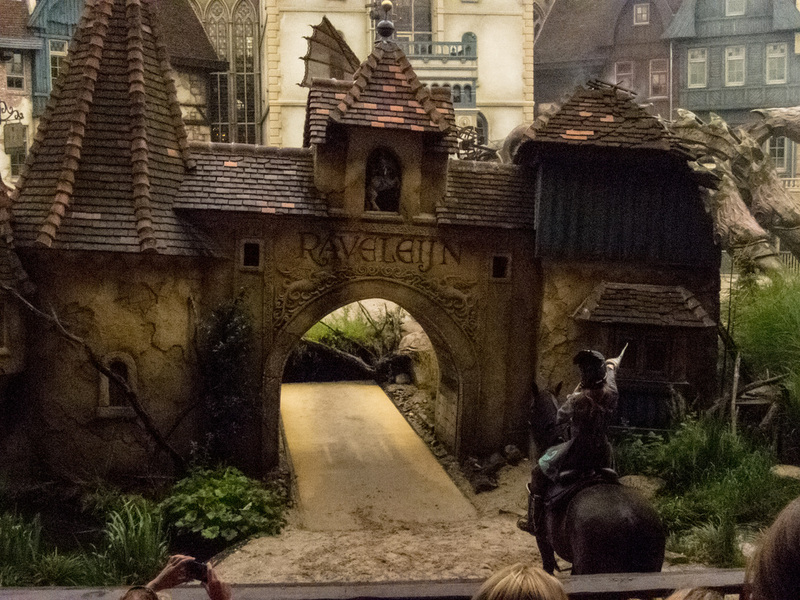 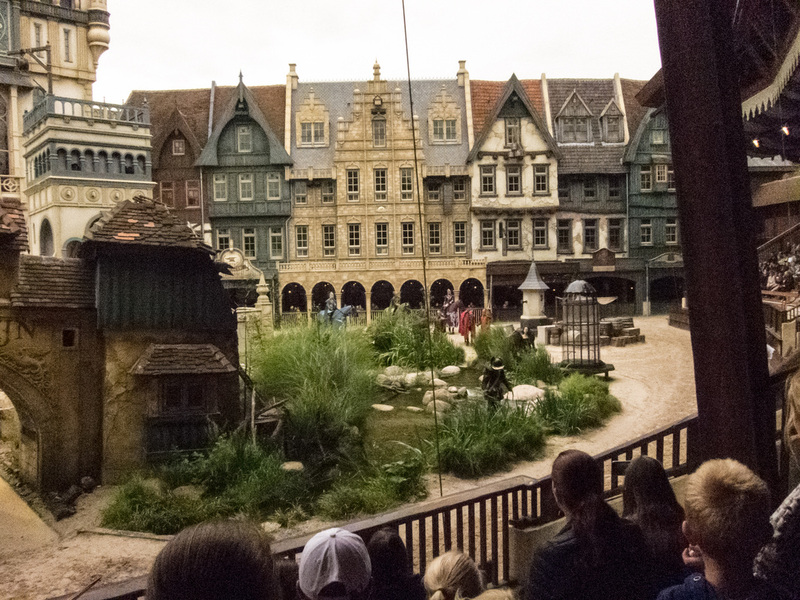 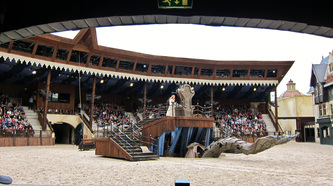 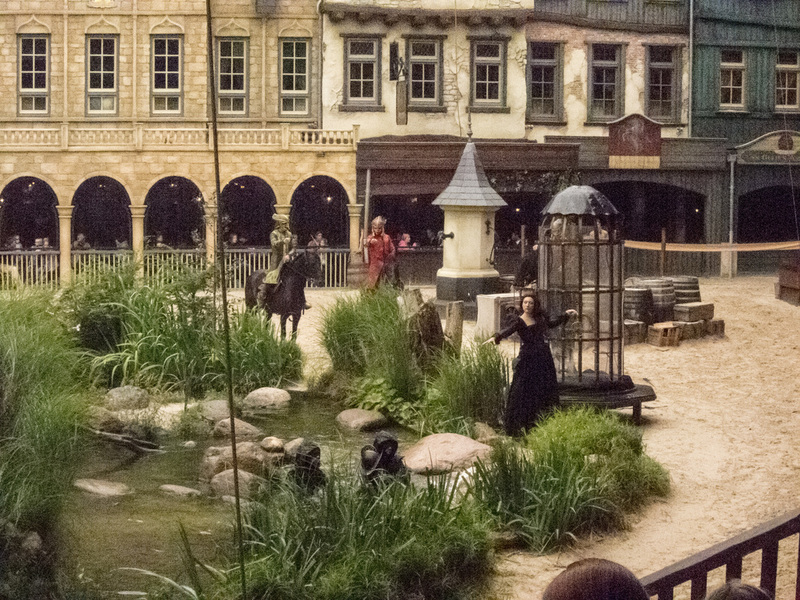 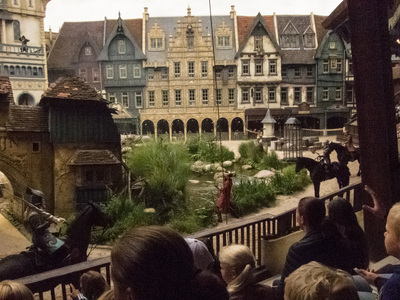 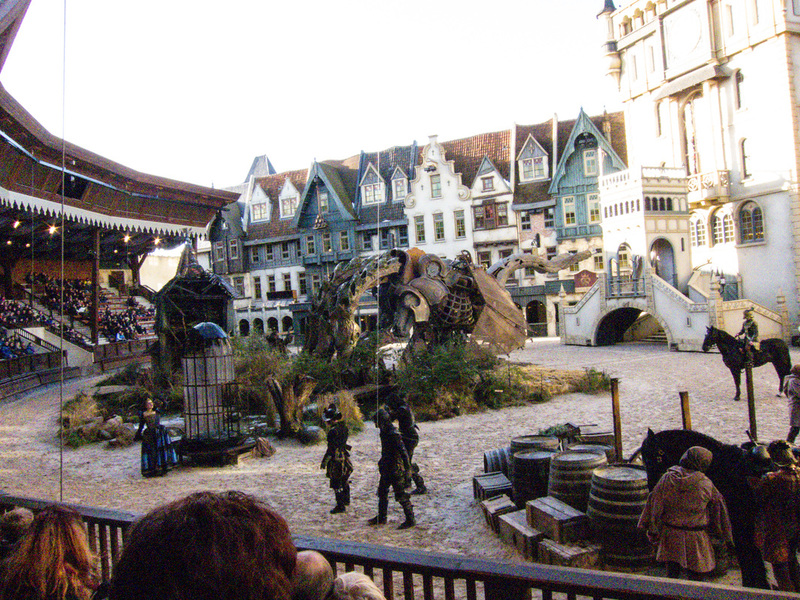 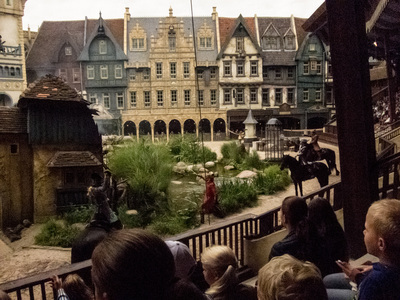 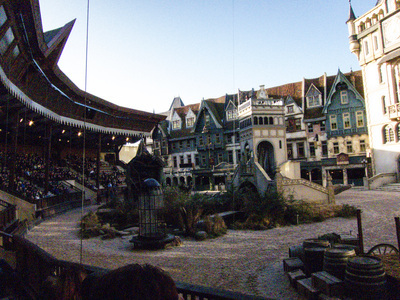 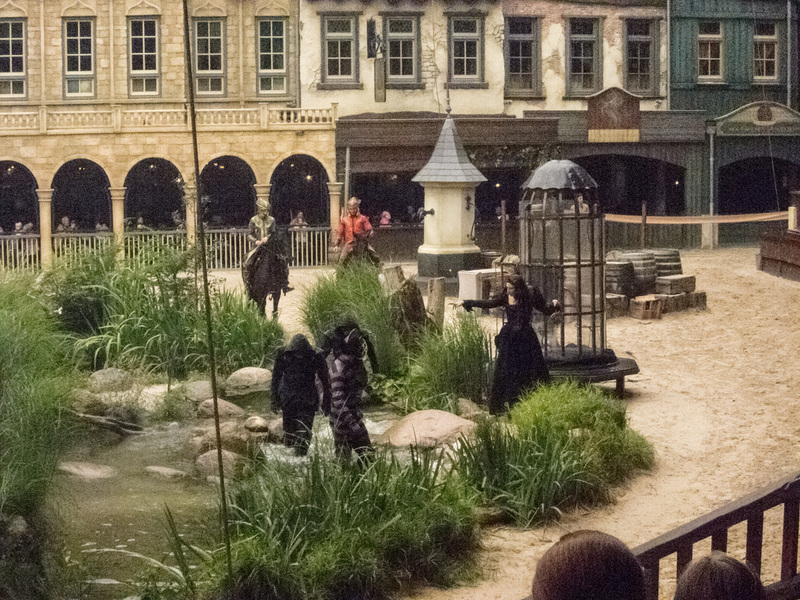 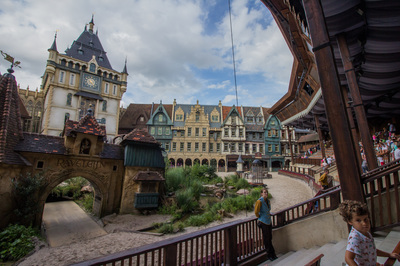 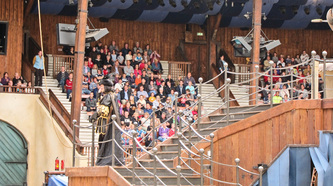 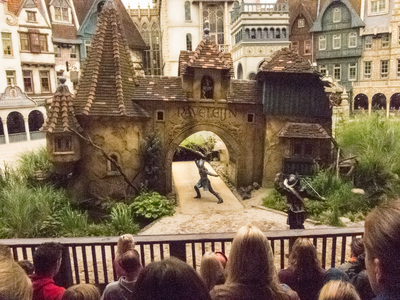 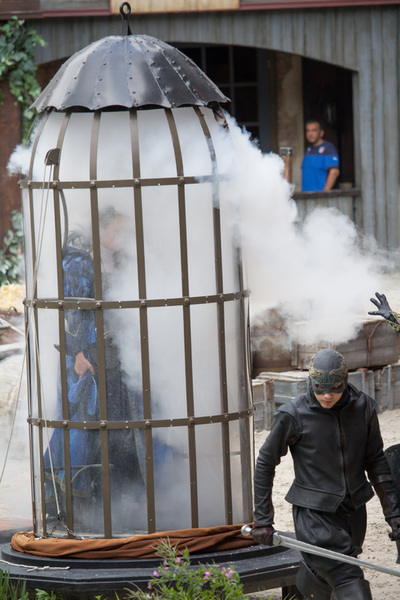 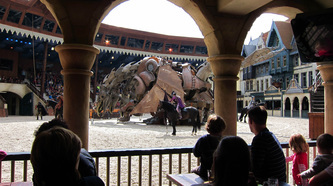 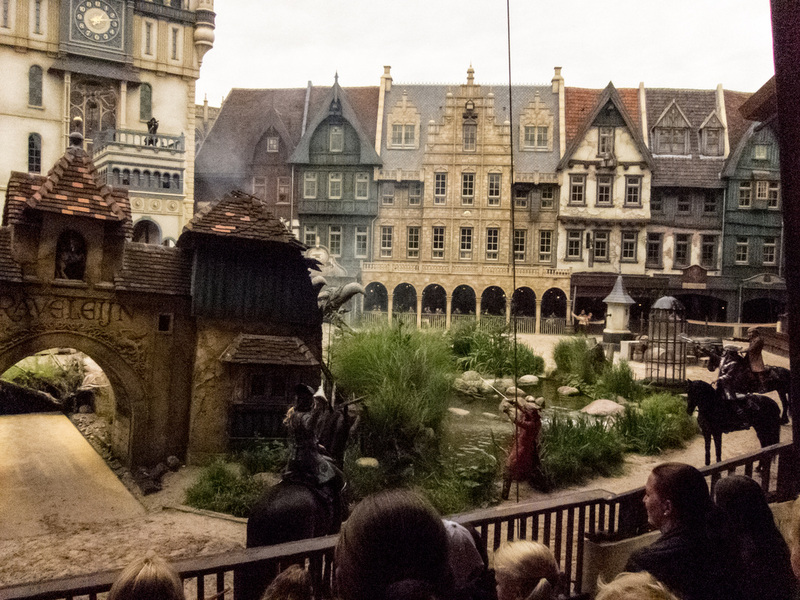 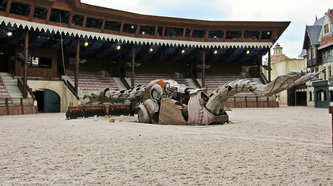 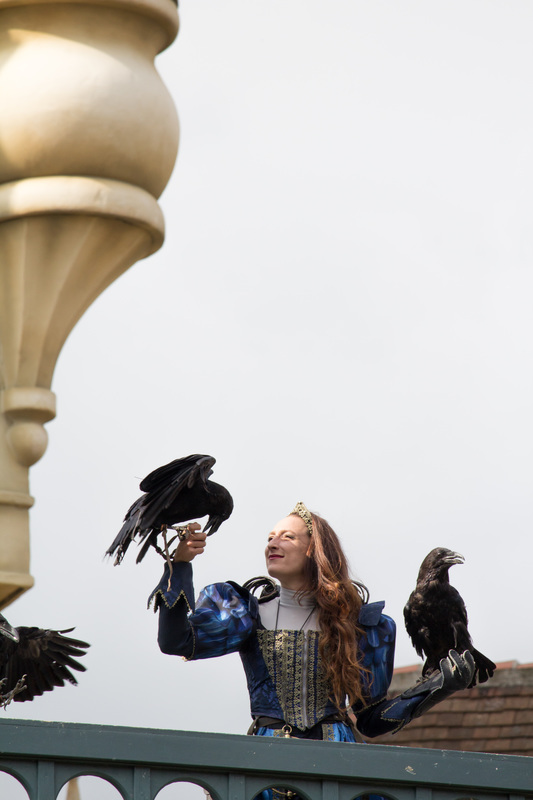 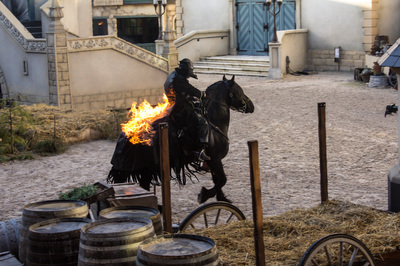 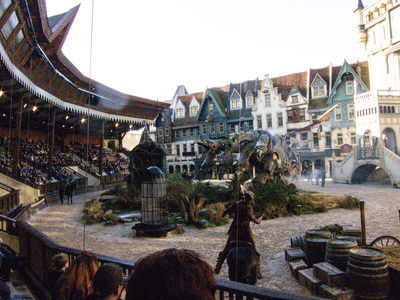 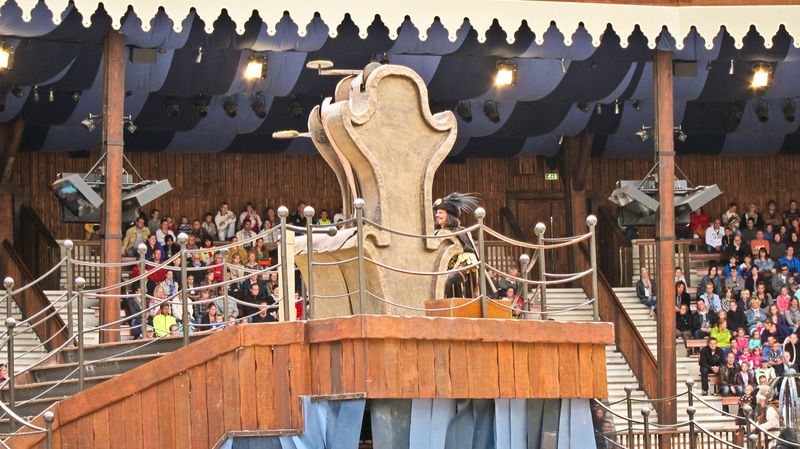 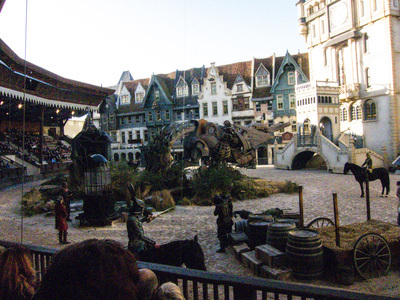 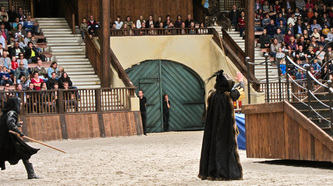 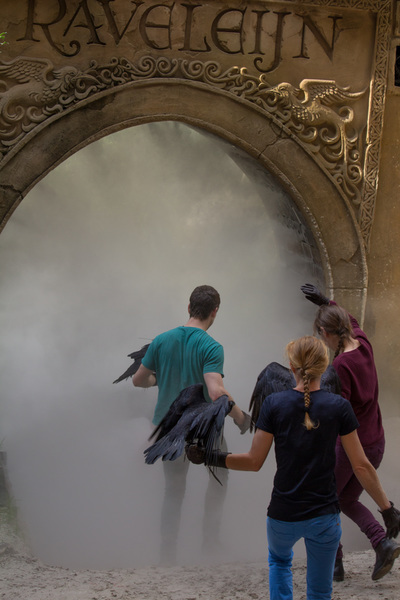 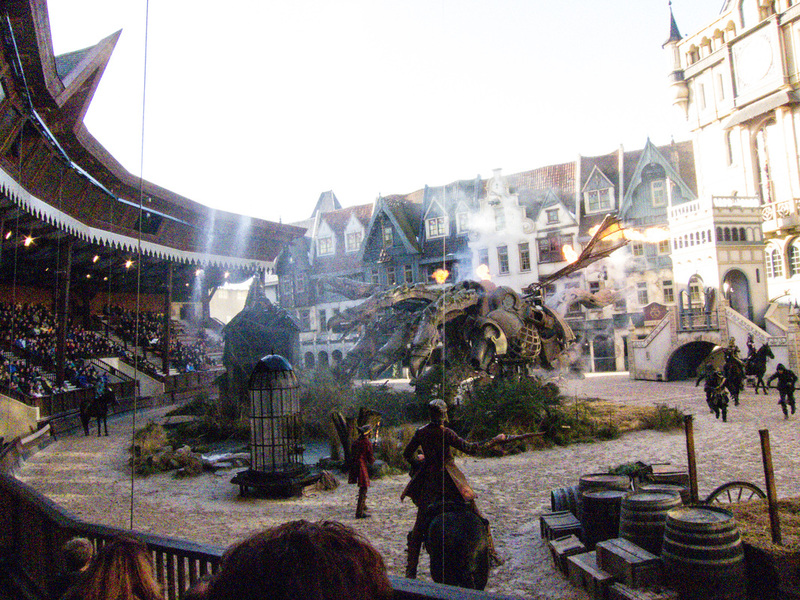 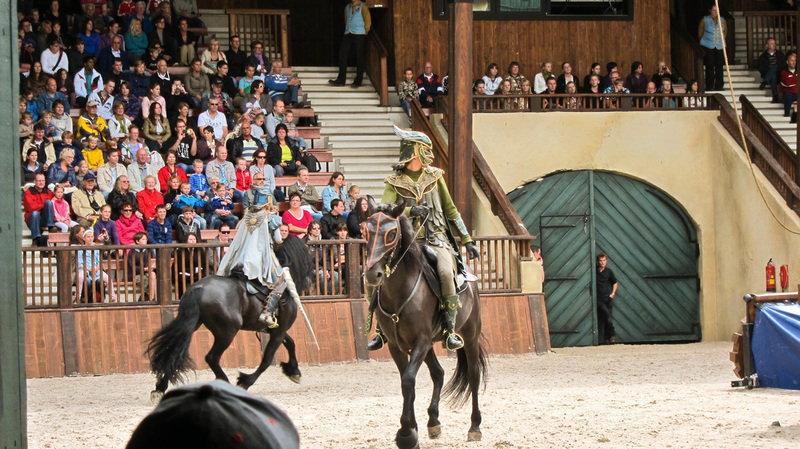 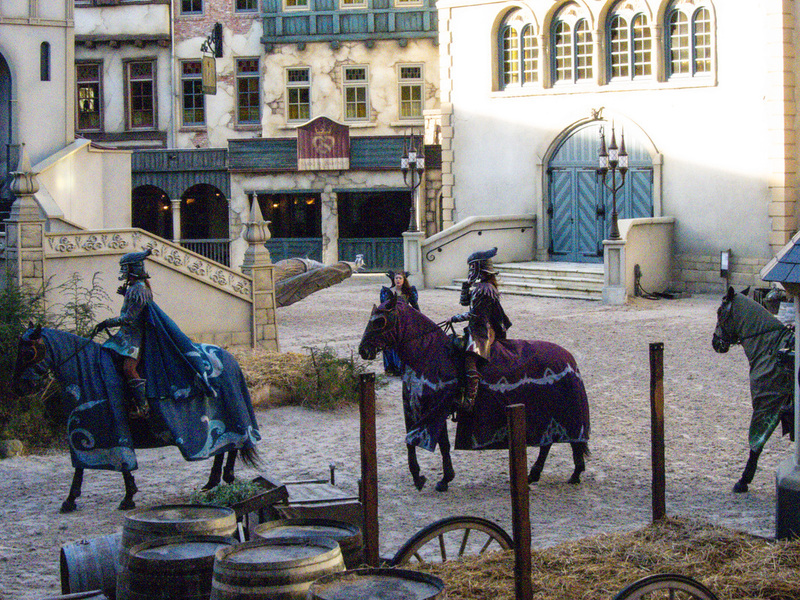 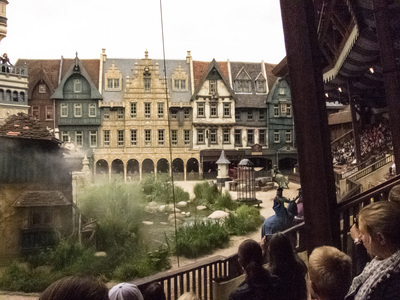 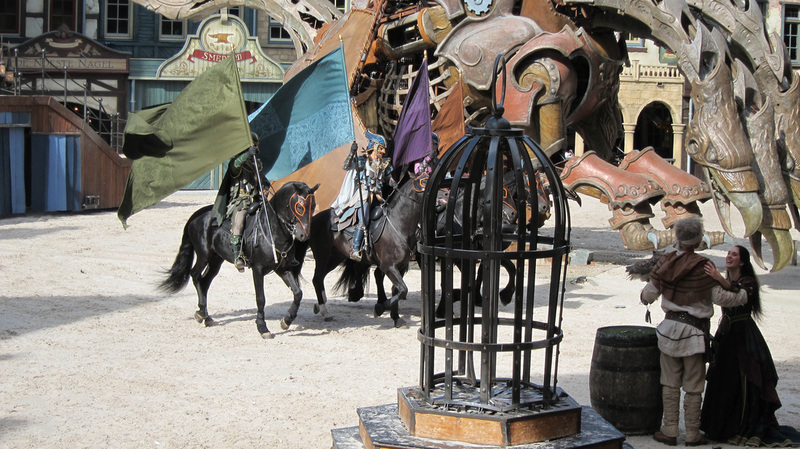 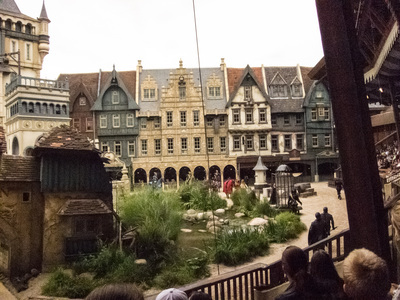 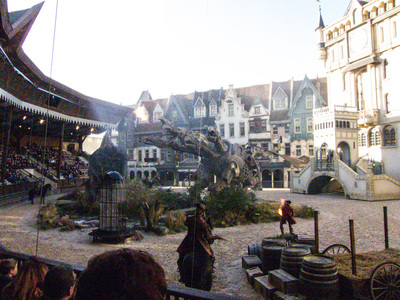 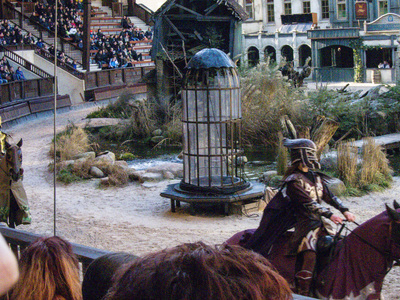 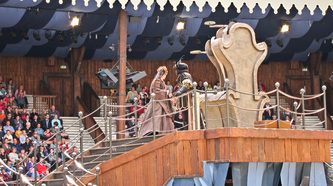 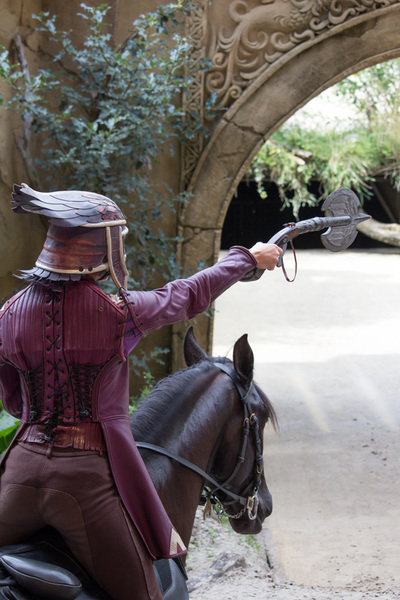 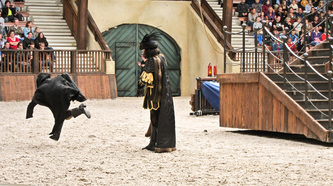 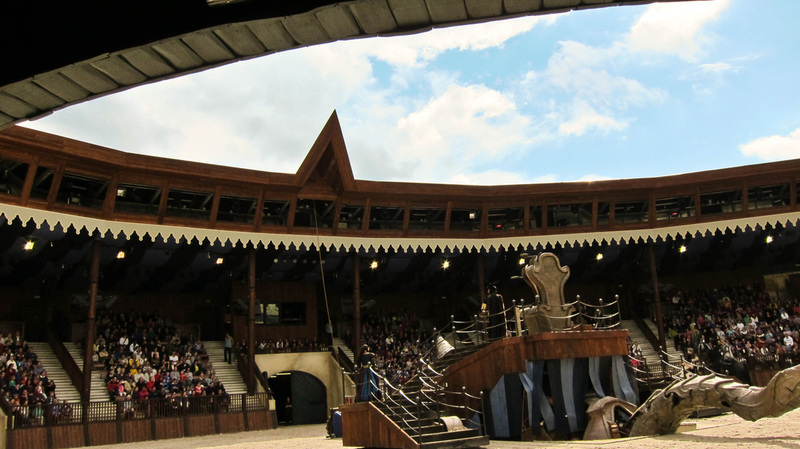 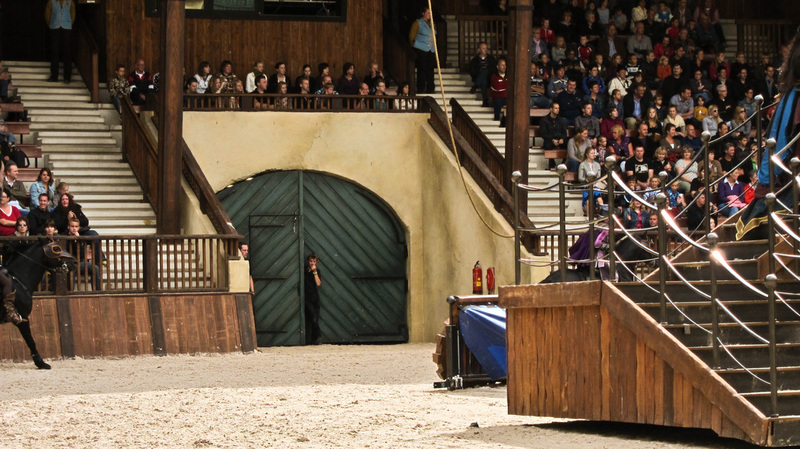 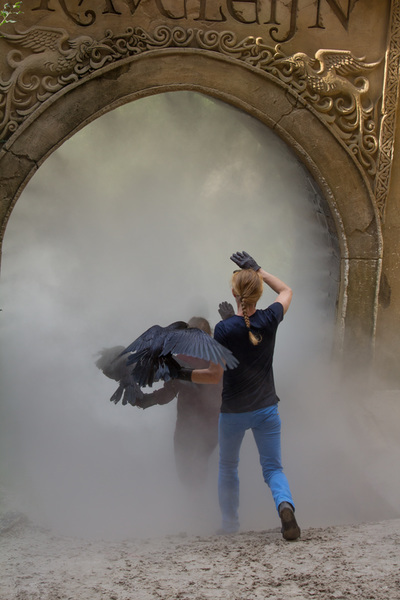 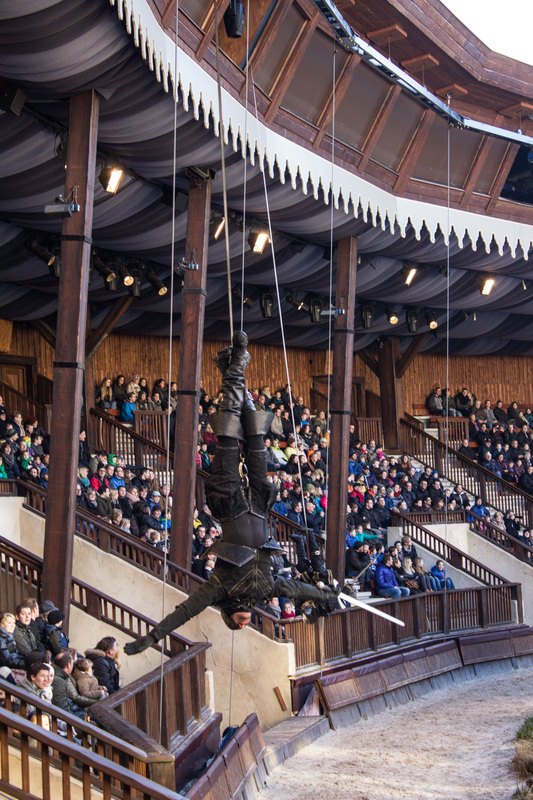 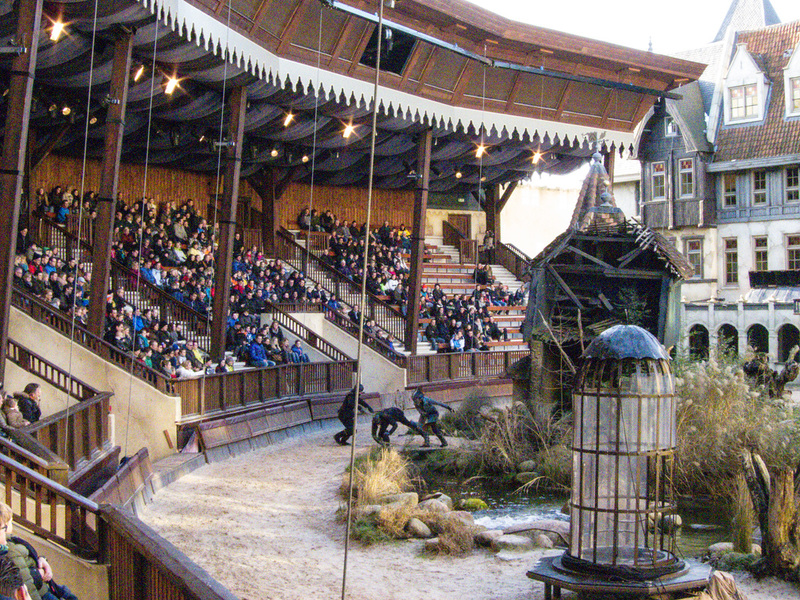 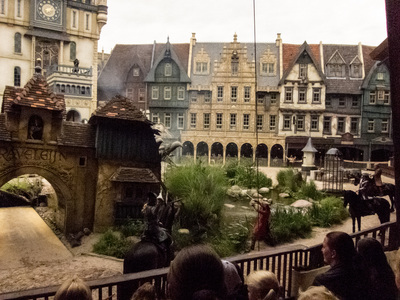 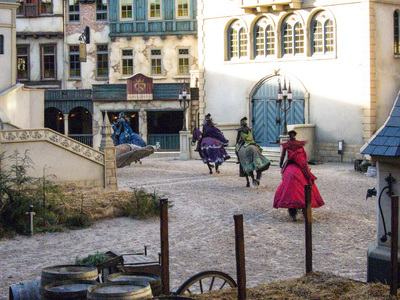 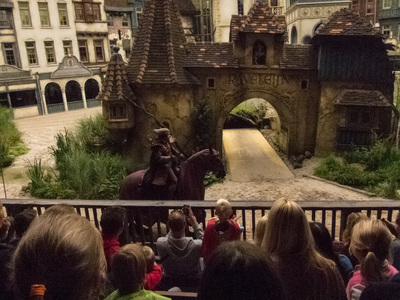 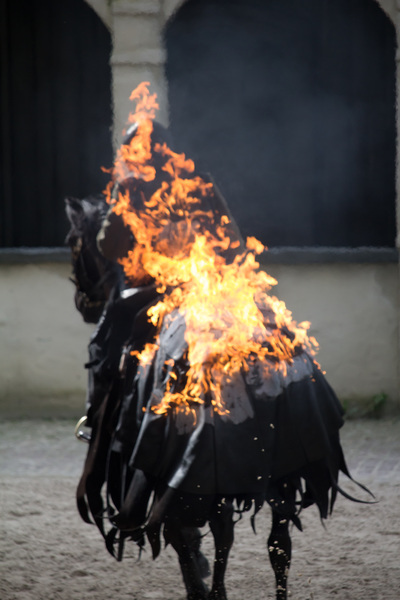 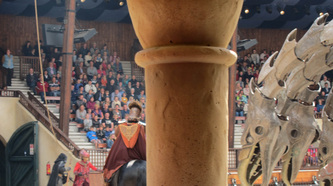 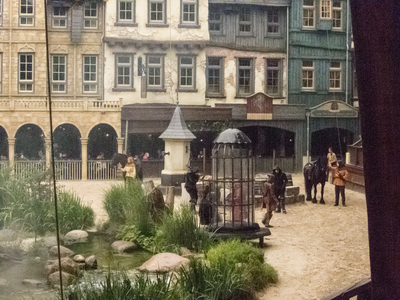 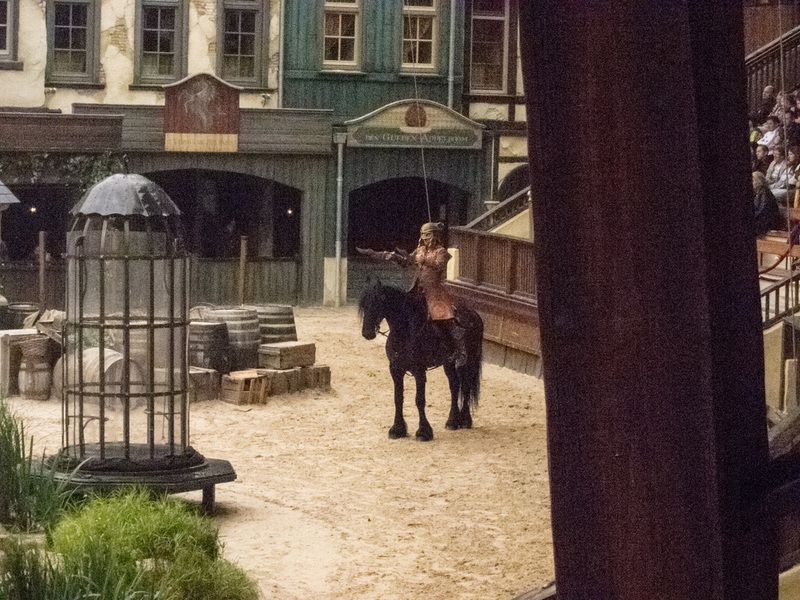 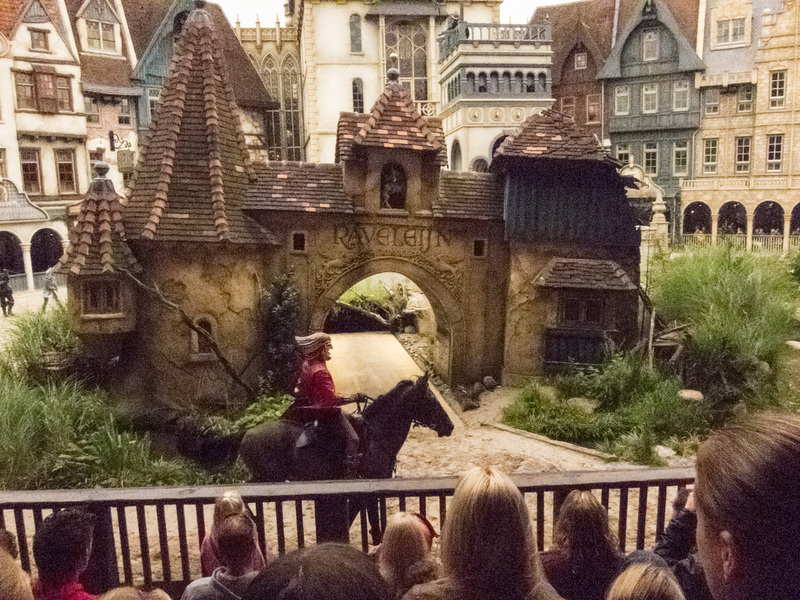 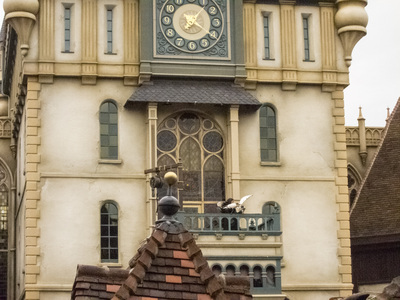 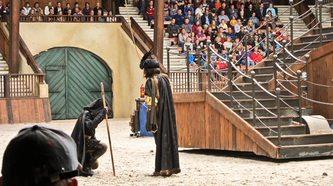 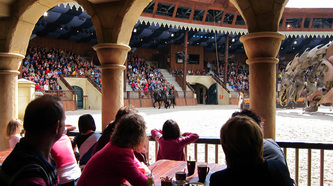 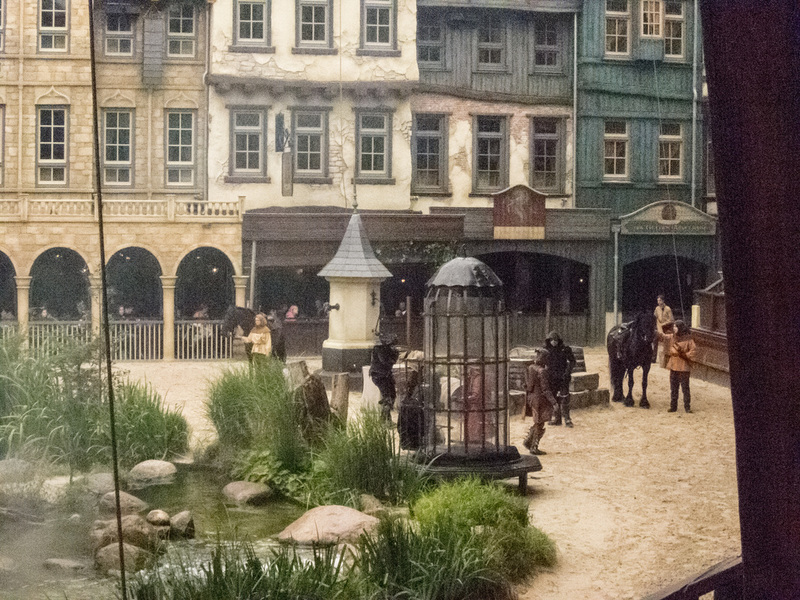 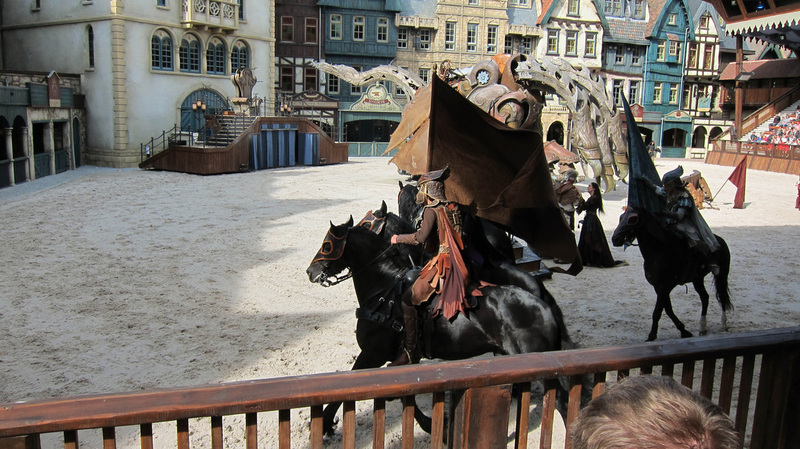 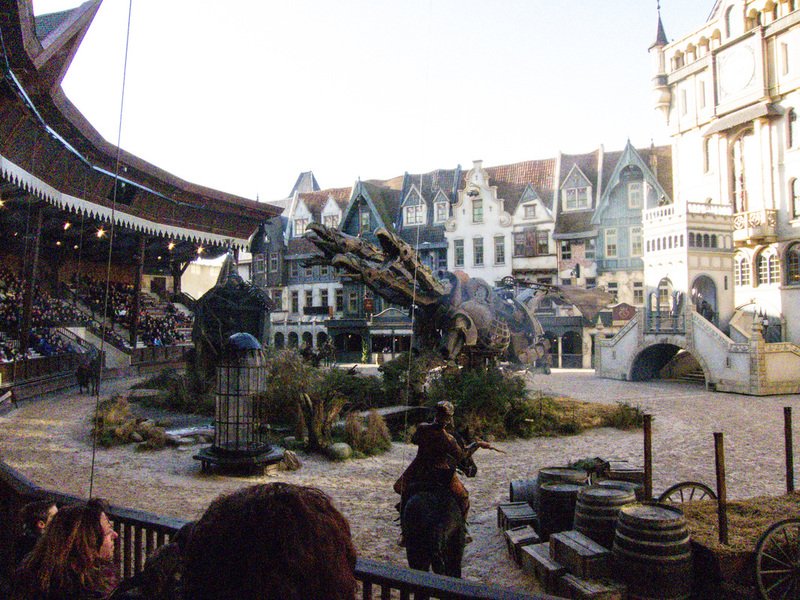 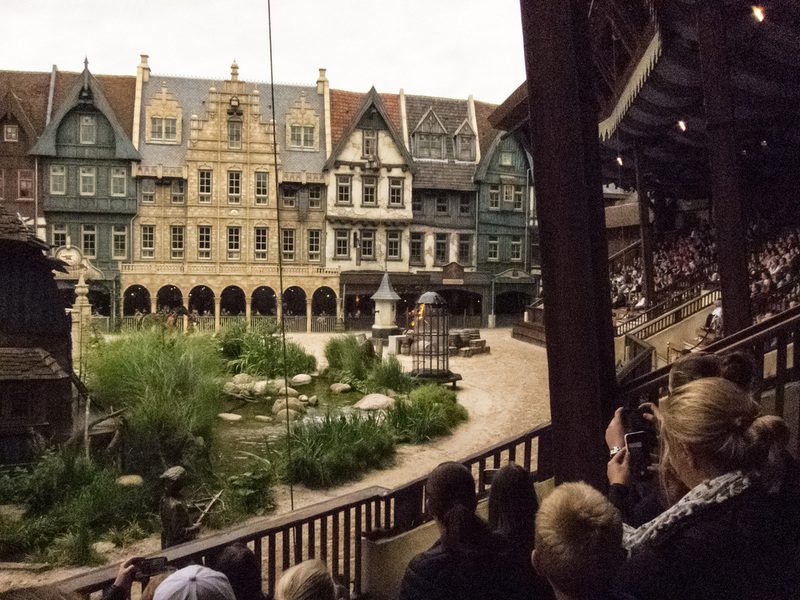 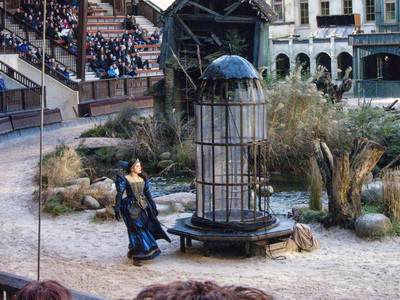 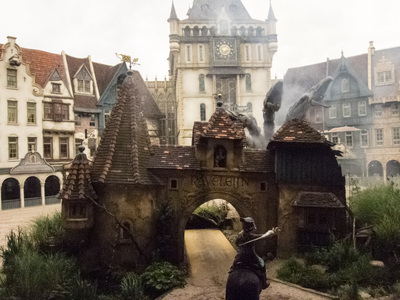 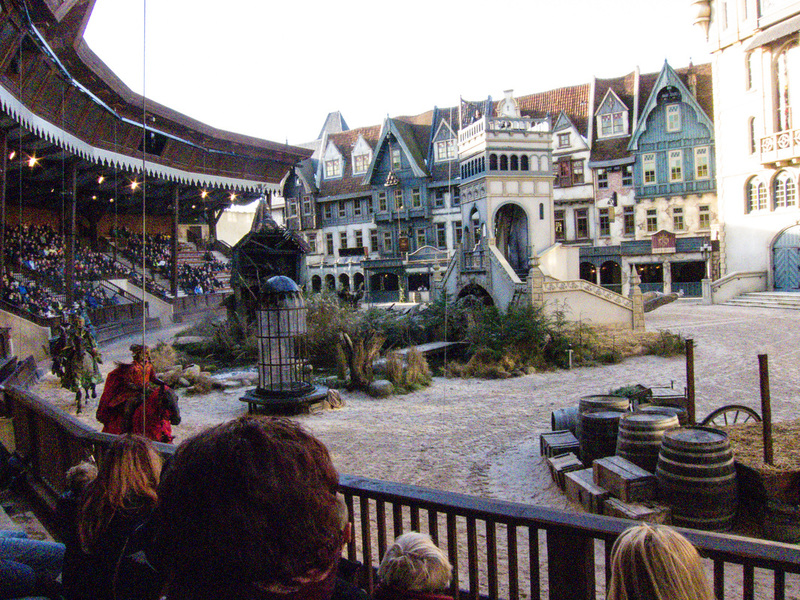 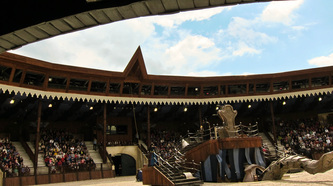 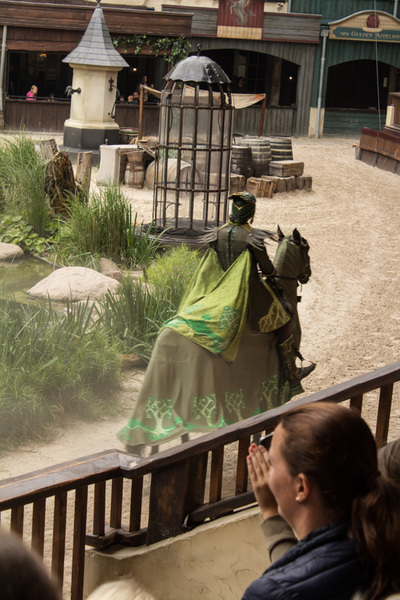 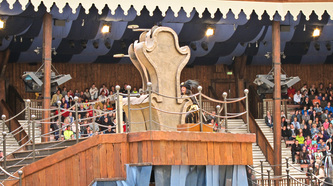 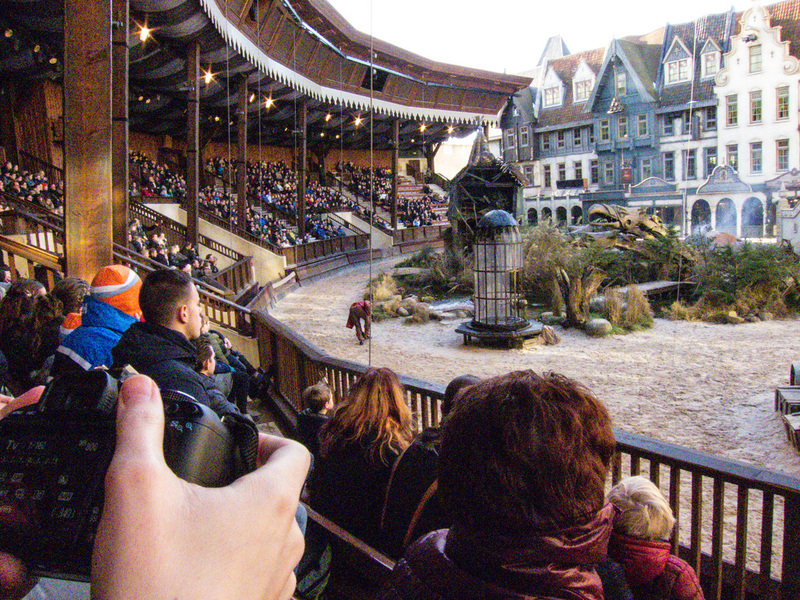 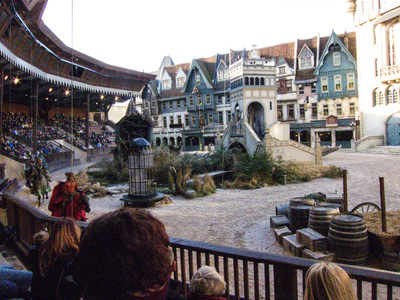 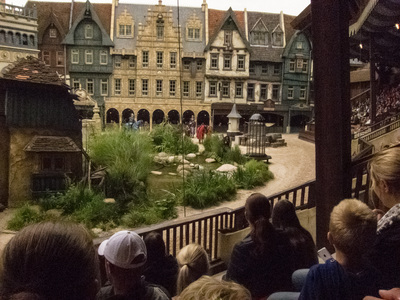 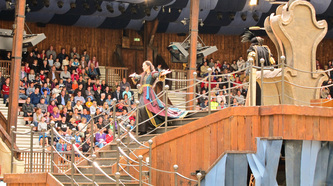 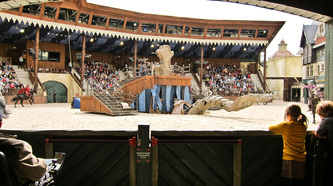 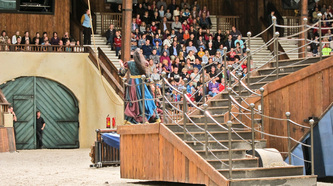 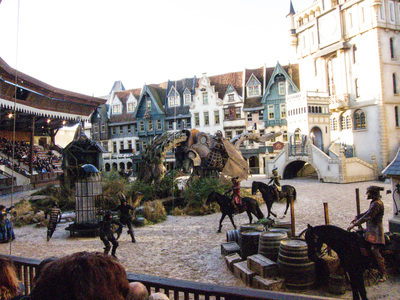 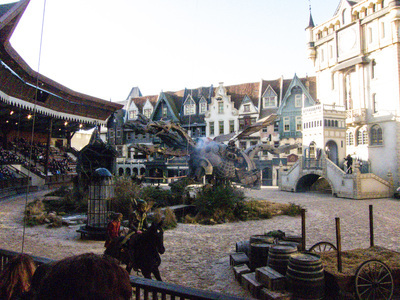 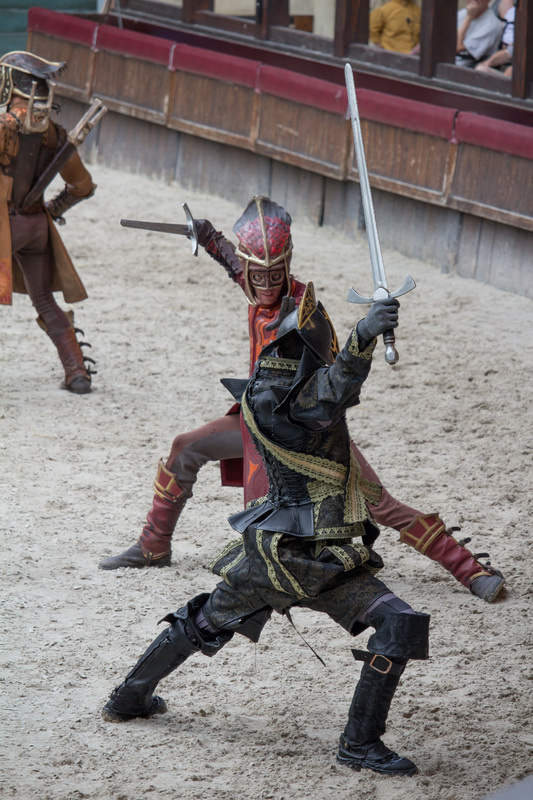 There are five or six shows per day with horses and real ravens. 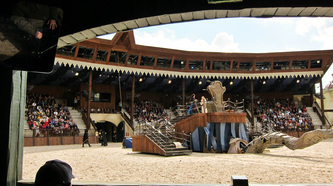 Start: 11.00, 12.30, 14.00, 15.30, 17.00 and 19.00* hour. 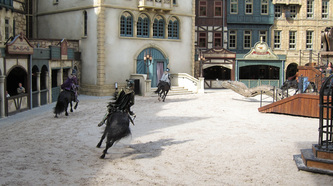 * Extra parkshow during the Seven League Summer. Thomas, Joost, their brother Maurits and their twin sisters Emma and Lisa appear to be very ordinary children.. untill Joost discoveres a gateway and leads them to it. 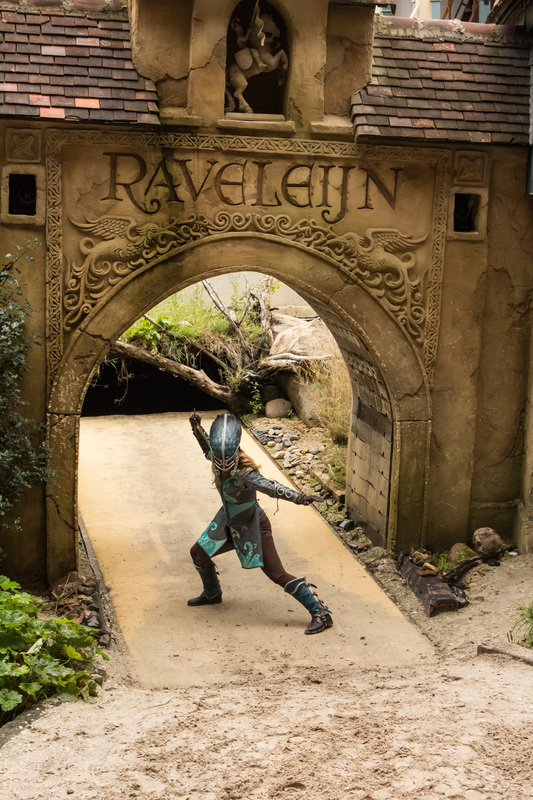 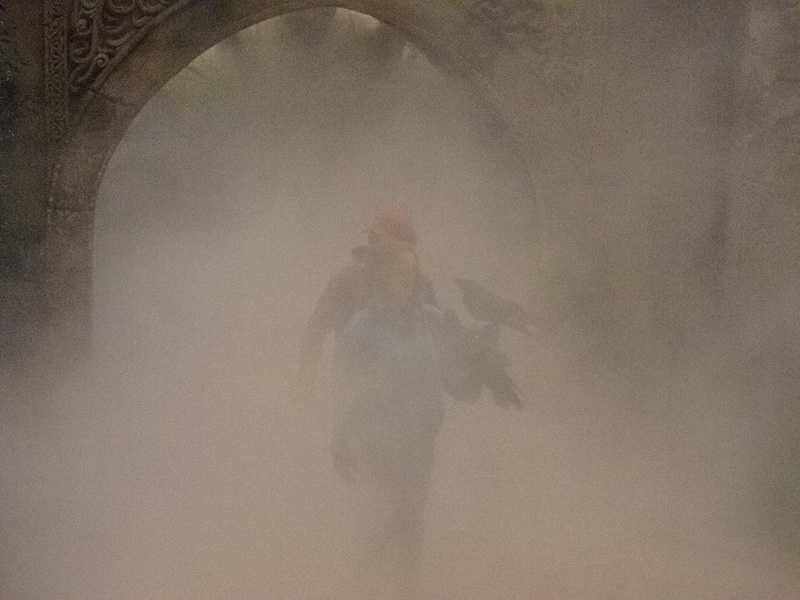 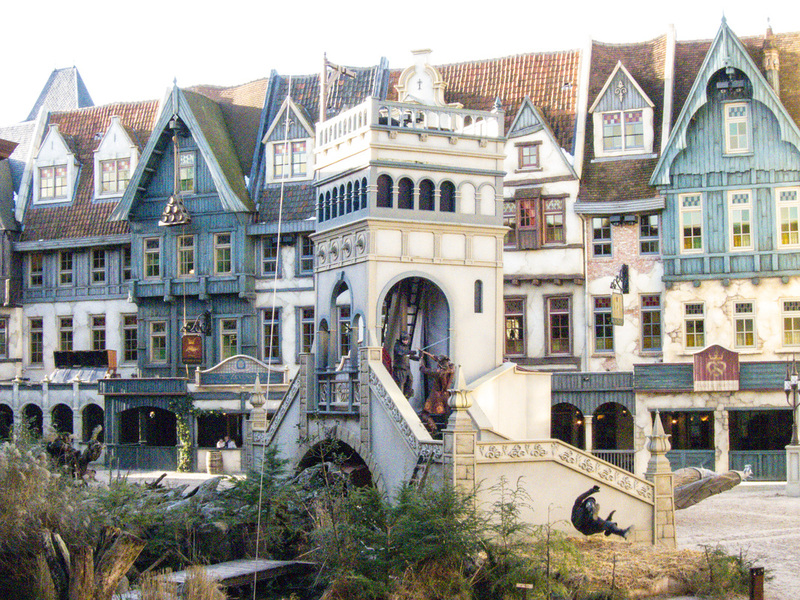 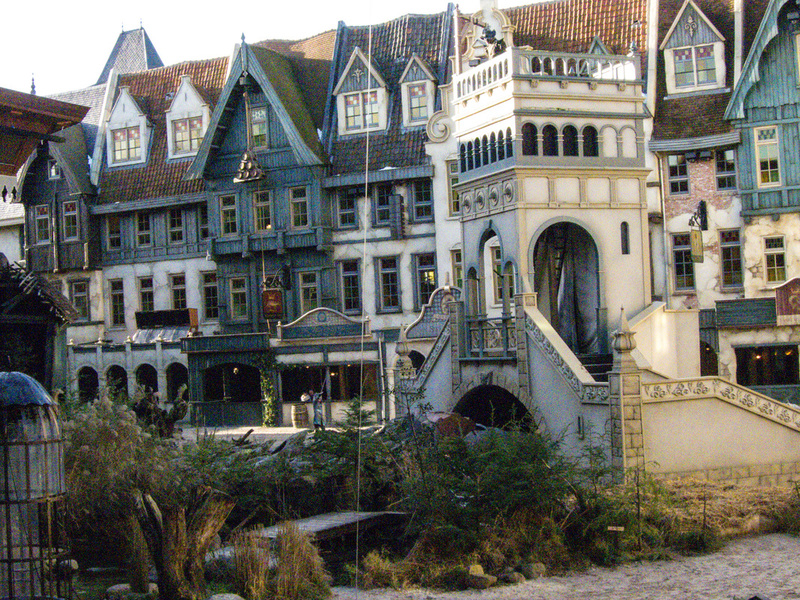 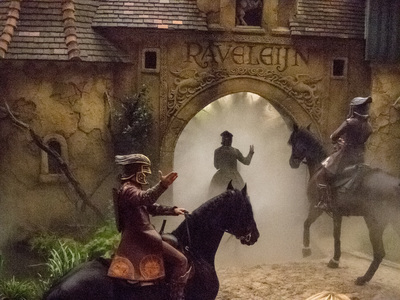 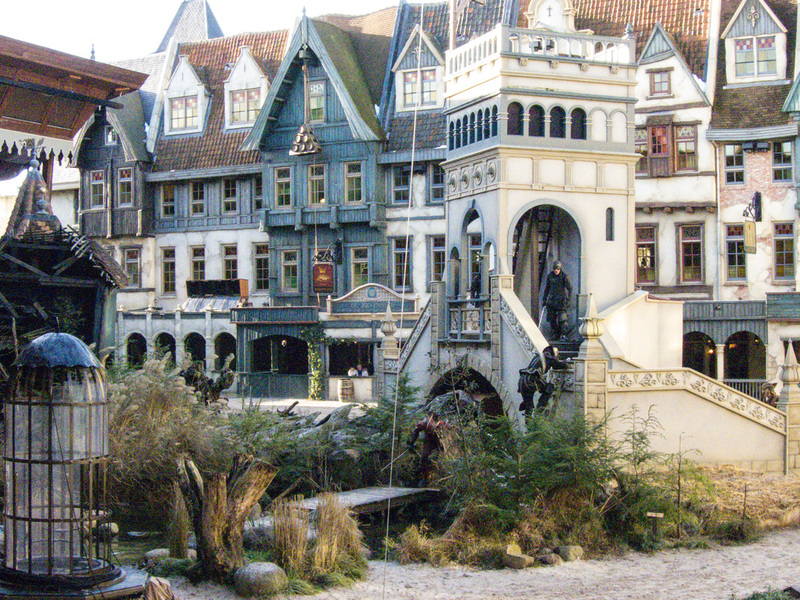 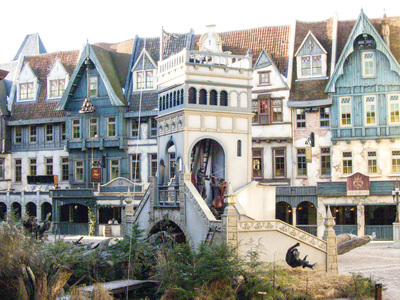 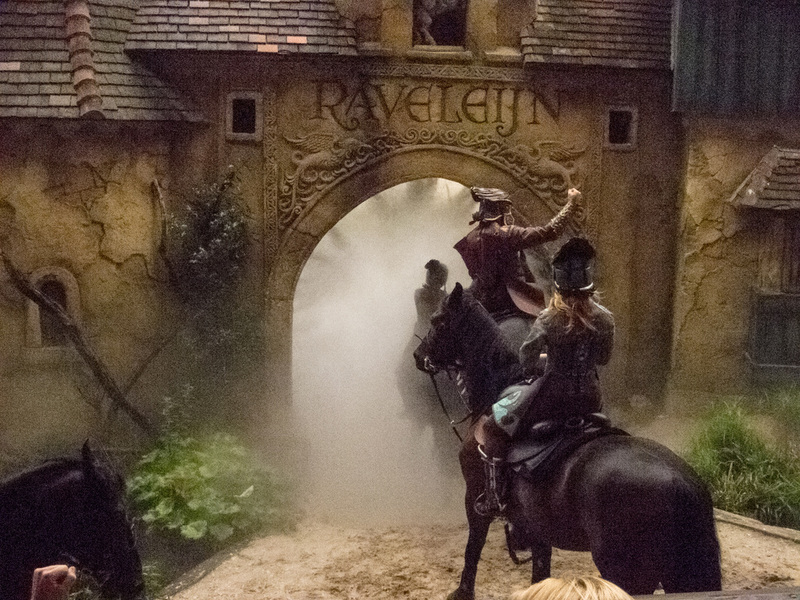 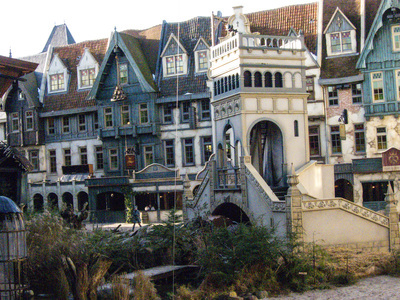 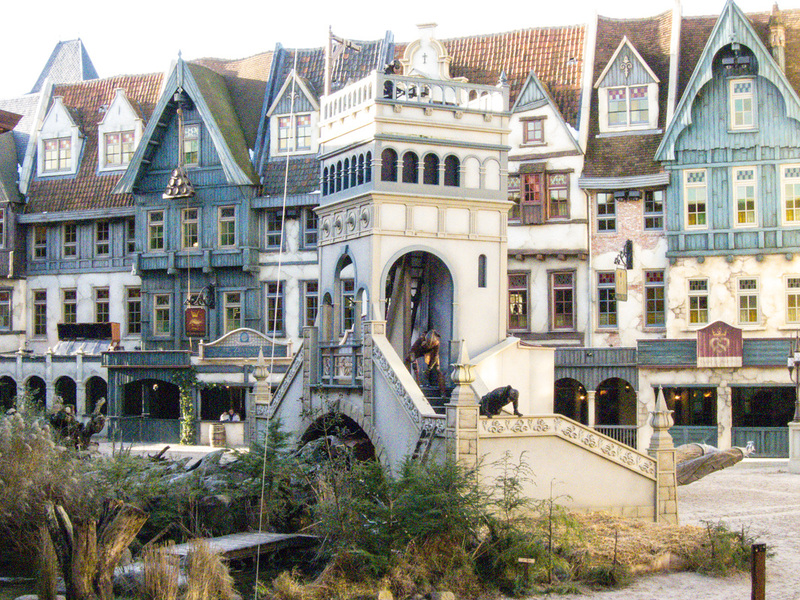 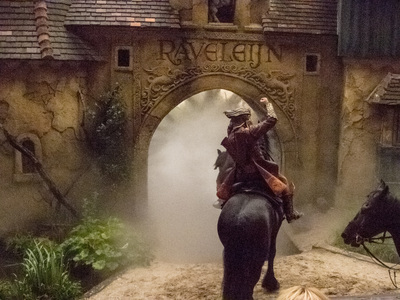 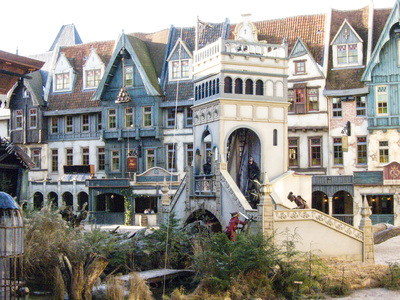 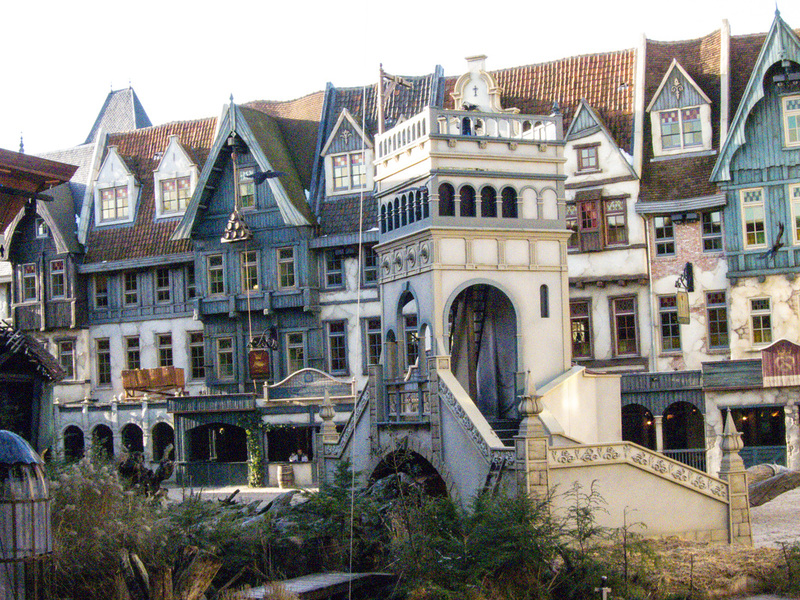 When they go through the gateway they find themselves in the magical city Raveleijn. To their suprise they grow into fully grown up horseriders. 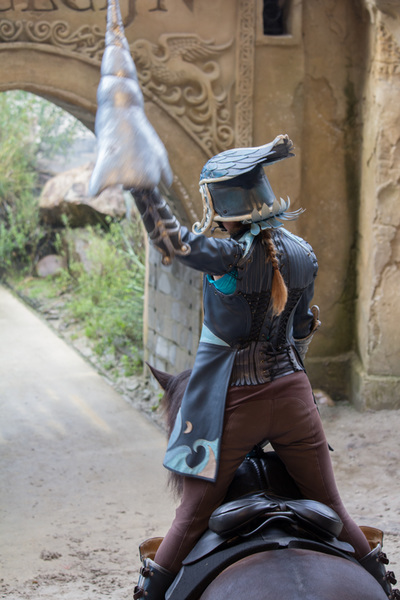 and that is for a reason. 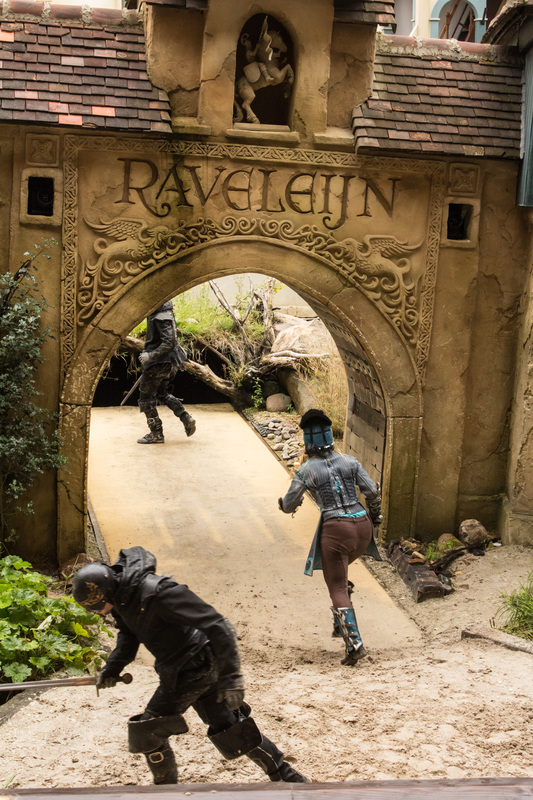 According to ancient prophecys they have an important mission . 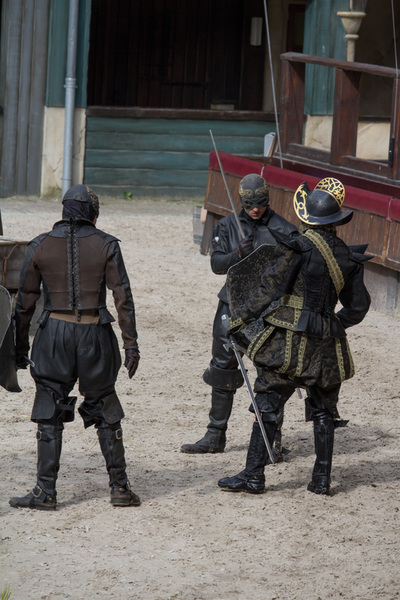 They must free Raveleijn and its inhabitants of their ruler Graaf Olaf Grafhart. 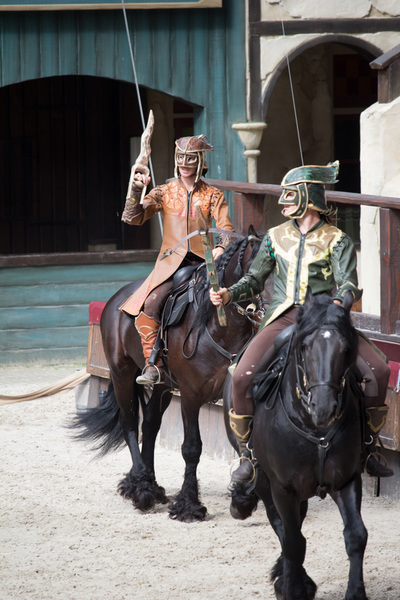 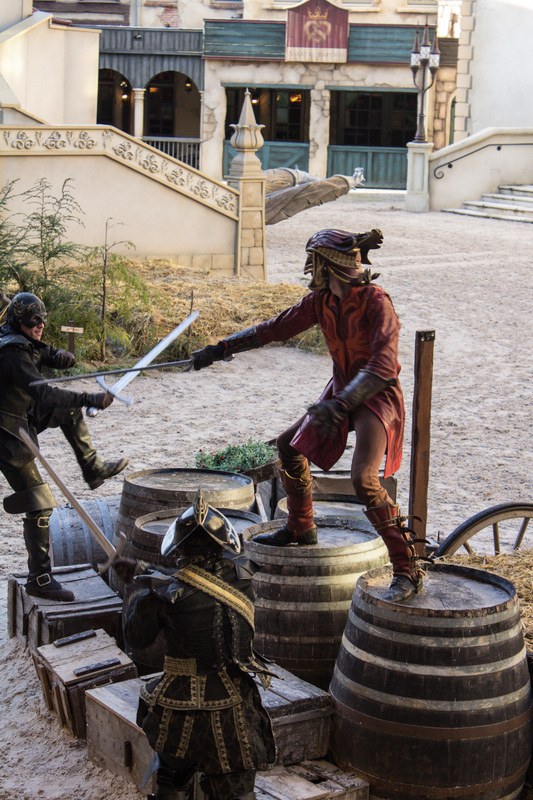 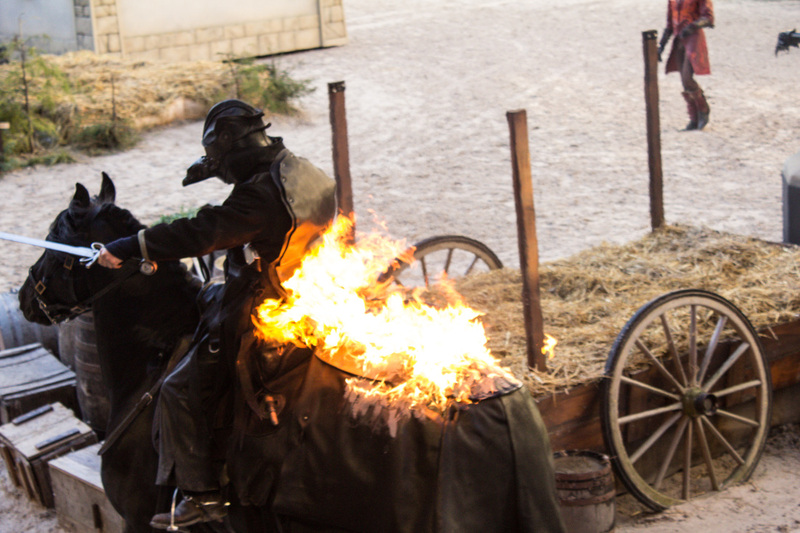 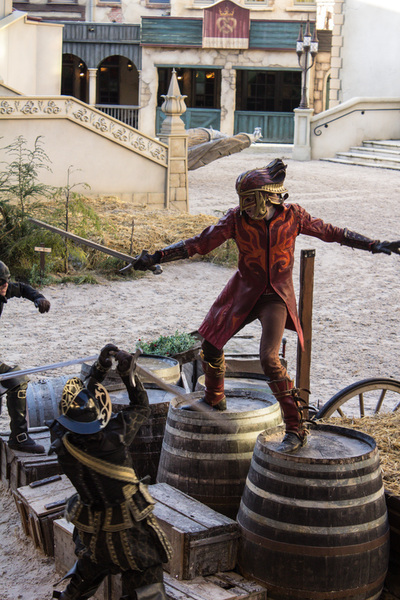 The vijf brothers and sisters have eachother, they have their horses and special weapons and enough courage to go to battle with the monsters they face on the way. 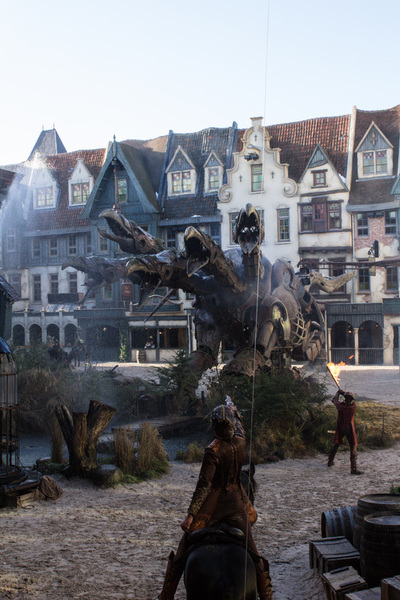 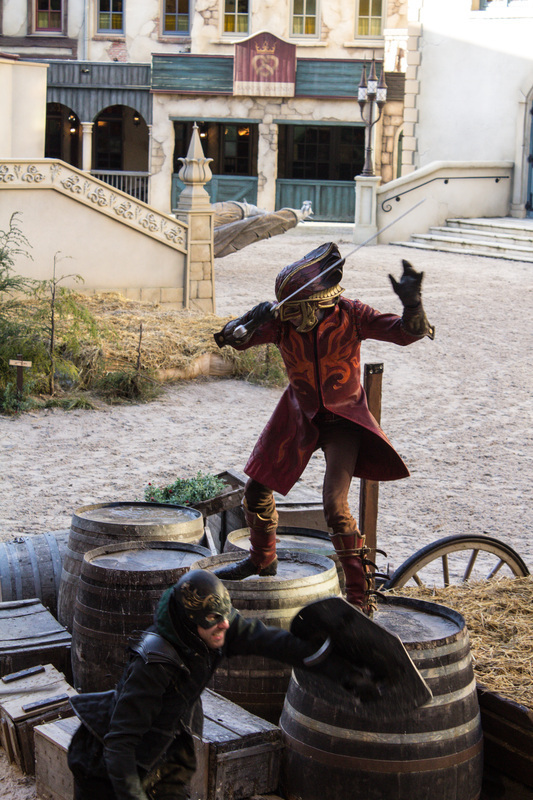 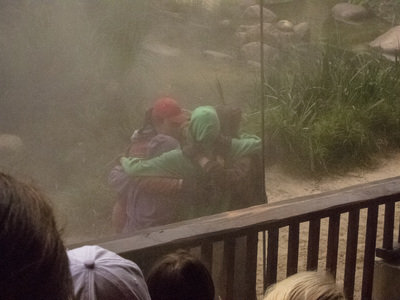 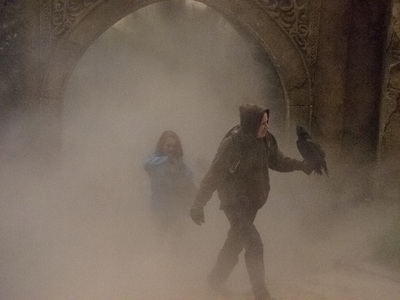 But how will they obtain the magic powers required to defeat Olaf Grafhart? 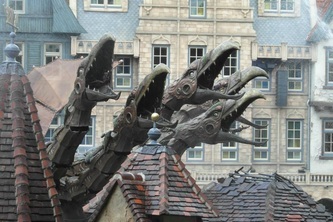 And the even greater terror that awaits them? 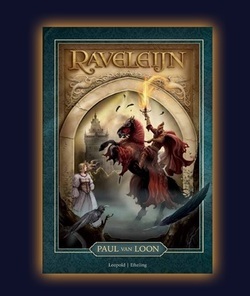 Book Raveleijn by Paul Van Loon is entirely in dutch and is available in shops all over the Netherlands. ​Wheelchair users can enter through the exit.